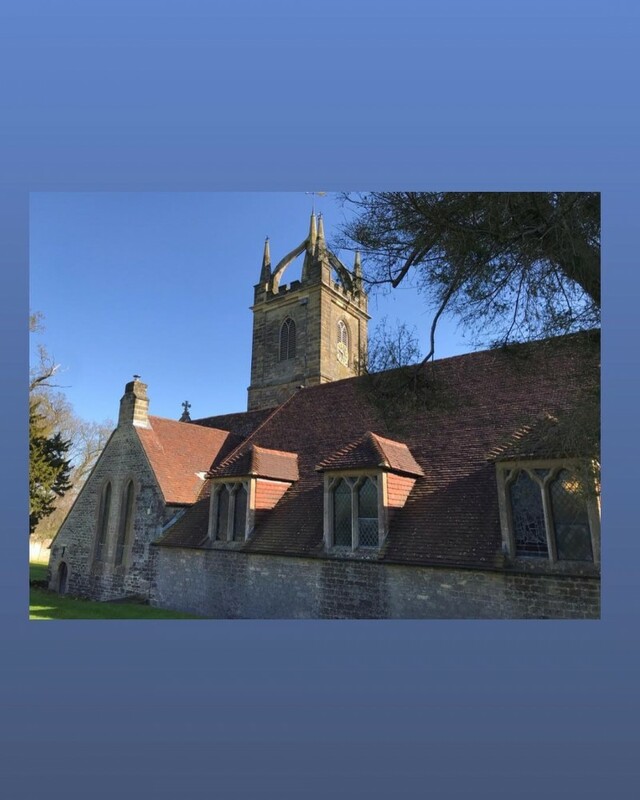 In 1917, Edward Elgar’s wife Alice found him a composing retreat in the beautiful hills surrounding Fittleworth, West Sussex: a cottage called Brinkwells. 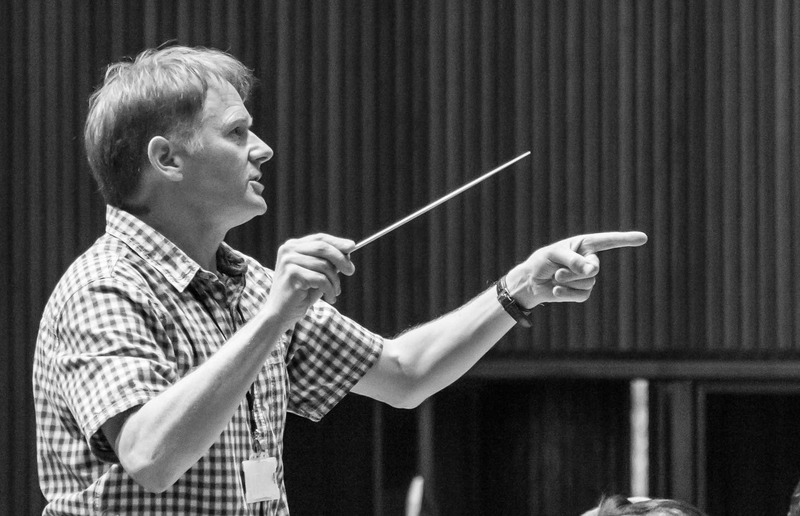 Here, nestled in tranquil woodland overlooking the Arun valley, Elgar found new inspiration. 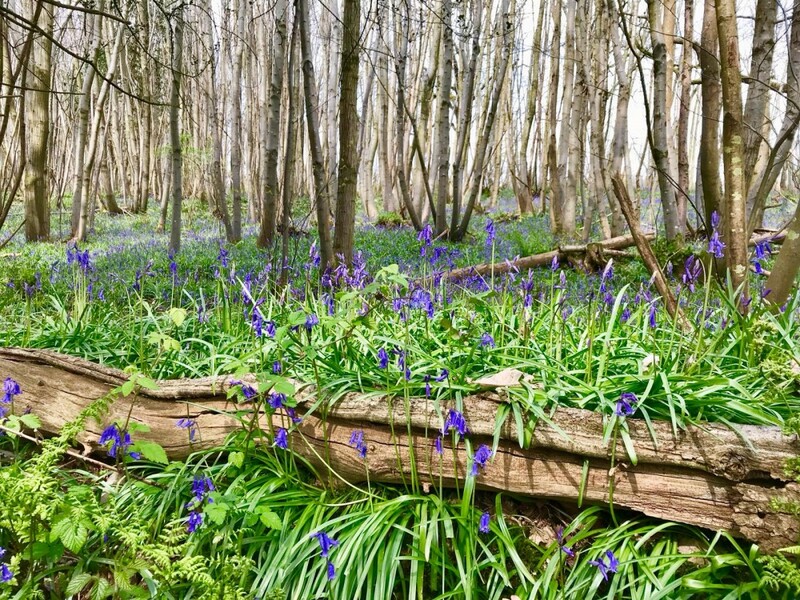 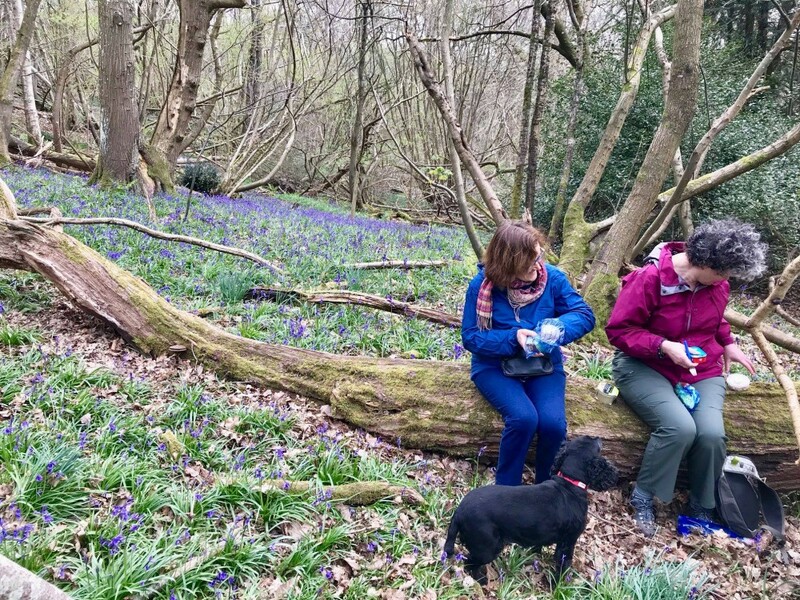 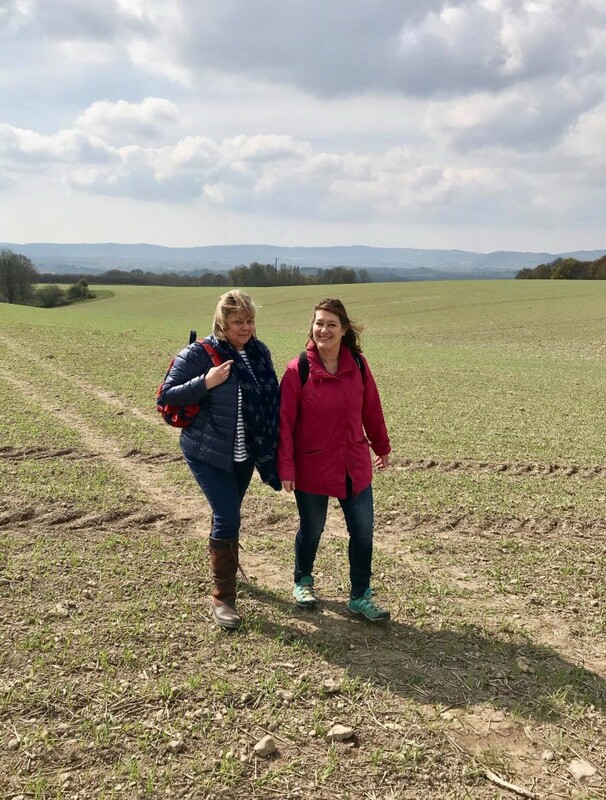 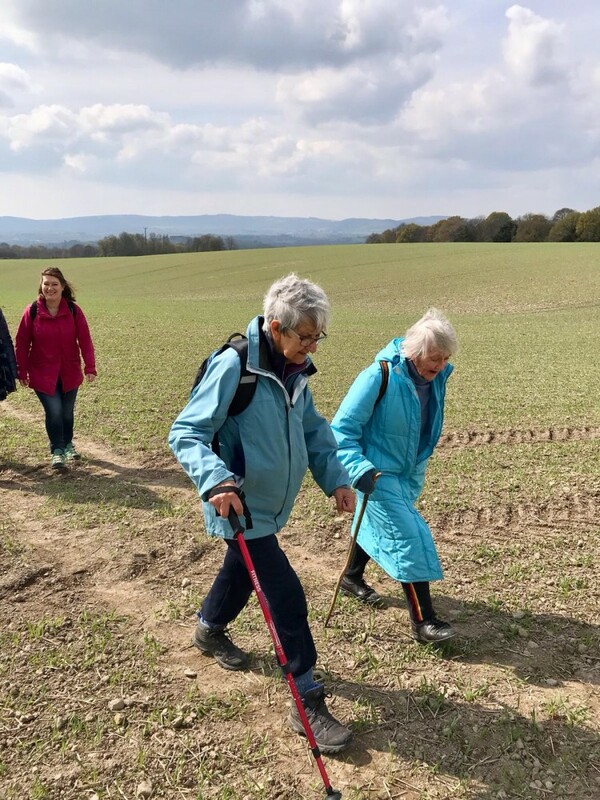 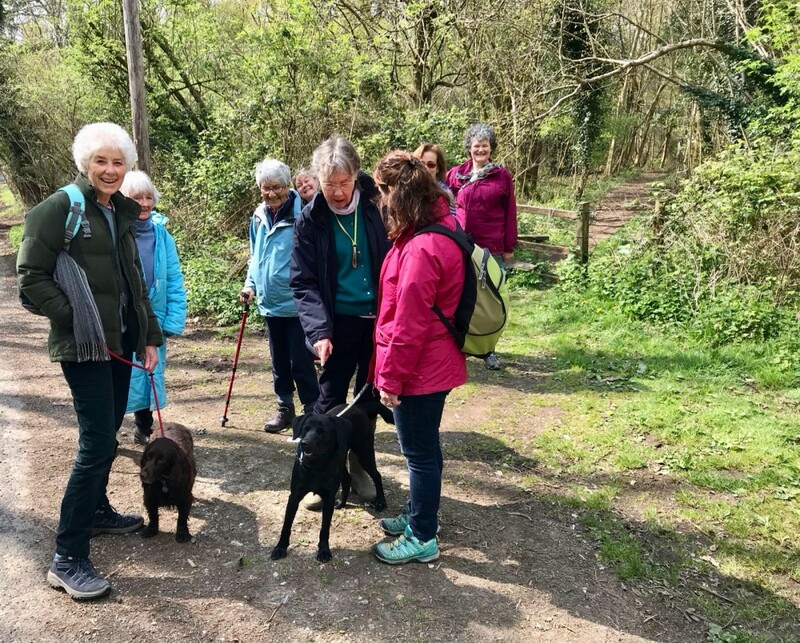 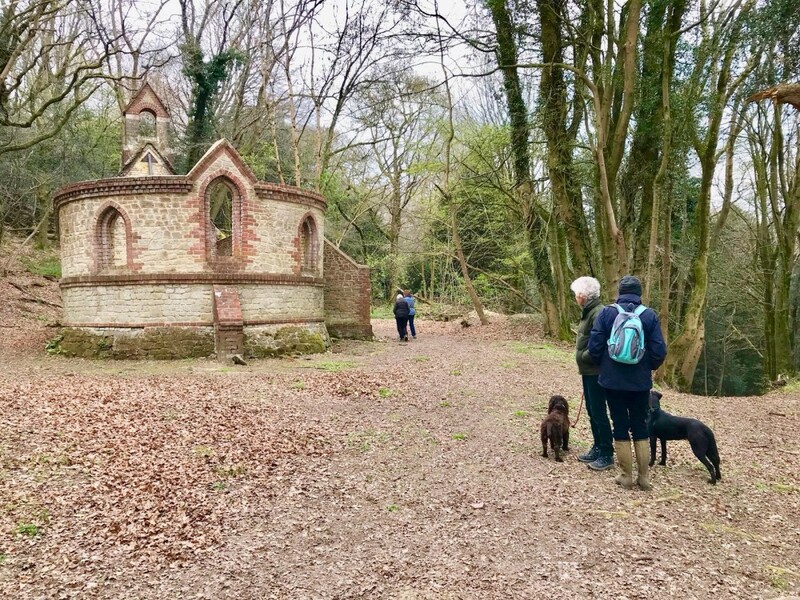 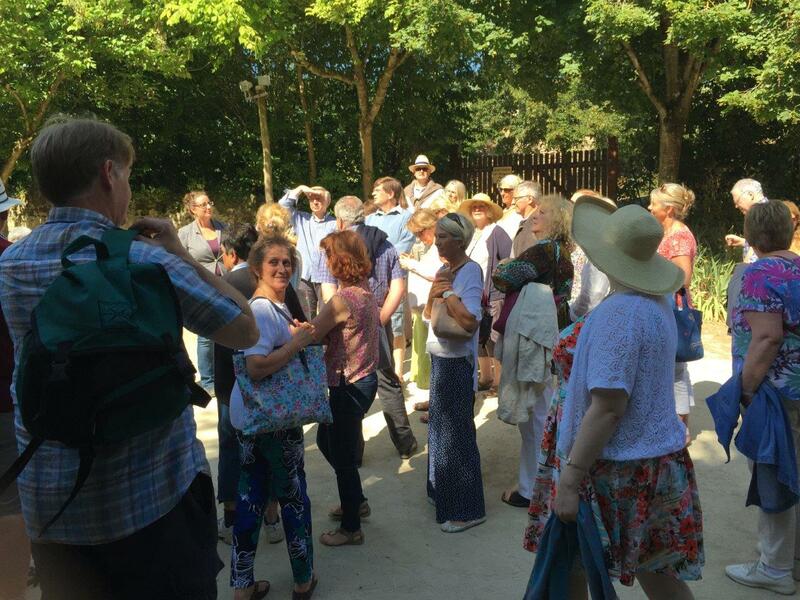 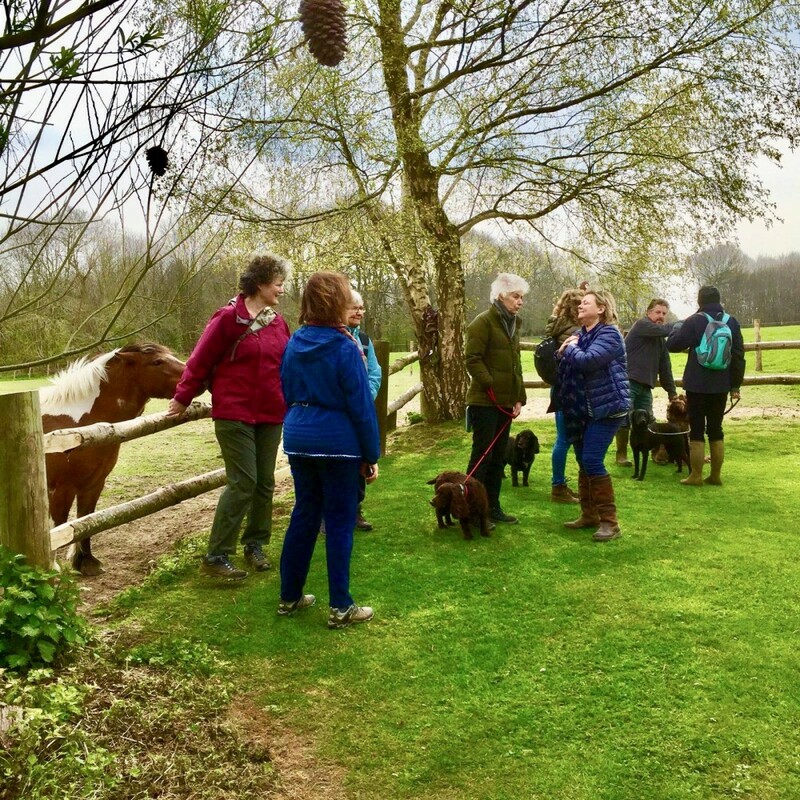 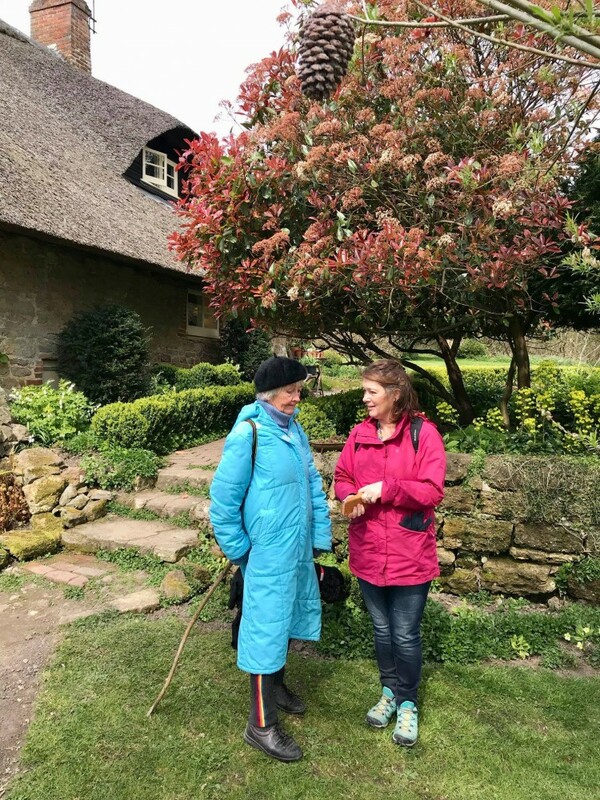 Surrounded by the scent of bluebells and blossom, and with the sun shining through the clouds, members of the choir and friends set off yesterday for our much anticipated Elgar Walk. 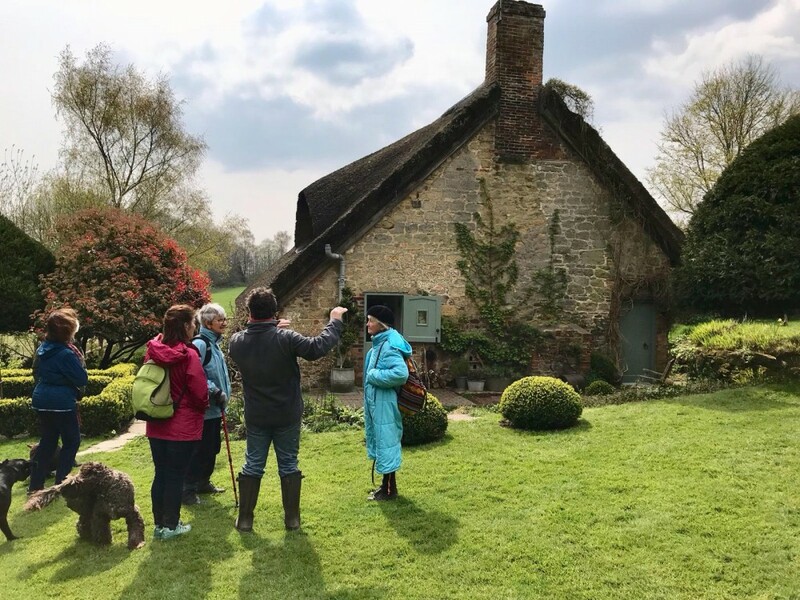 With kind permission, we had access to the garden at Brinkwells and to the studio where Elgar composed the last of his great works. . We walked, talked, foraged wild garlic, picnicked amongst the bluebells and were generously entertained by local residents who shared fascinating stories of the Elgars and their time there. . 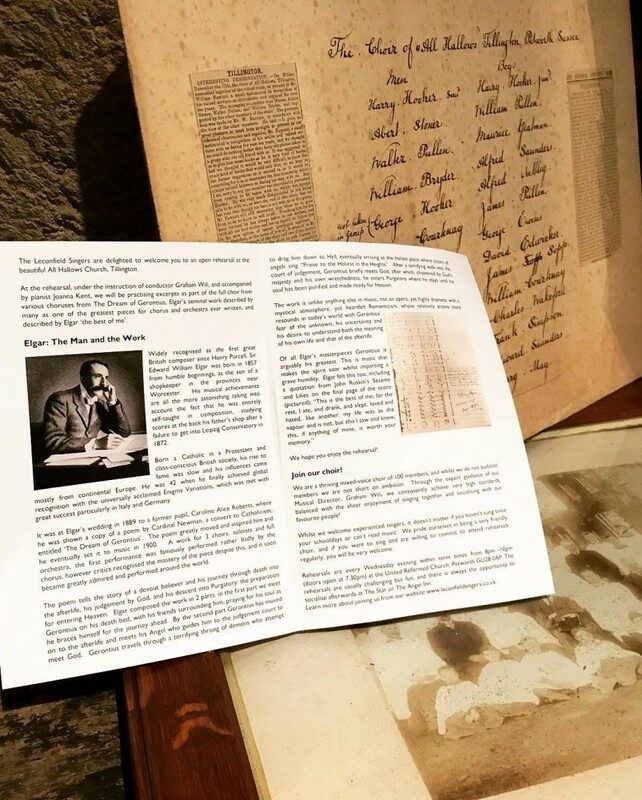 In a letter to Alice during his time at Brinkwells, Elgar’s last sentence just about sums up our day: . 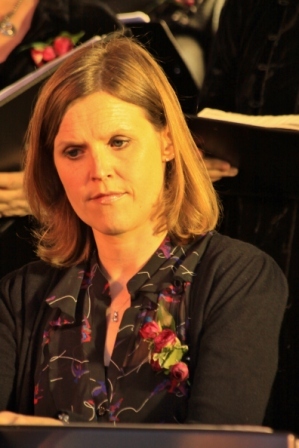 ‘I rise about seven – work till 8.15 – then dress. 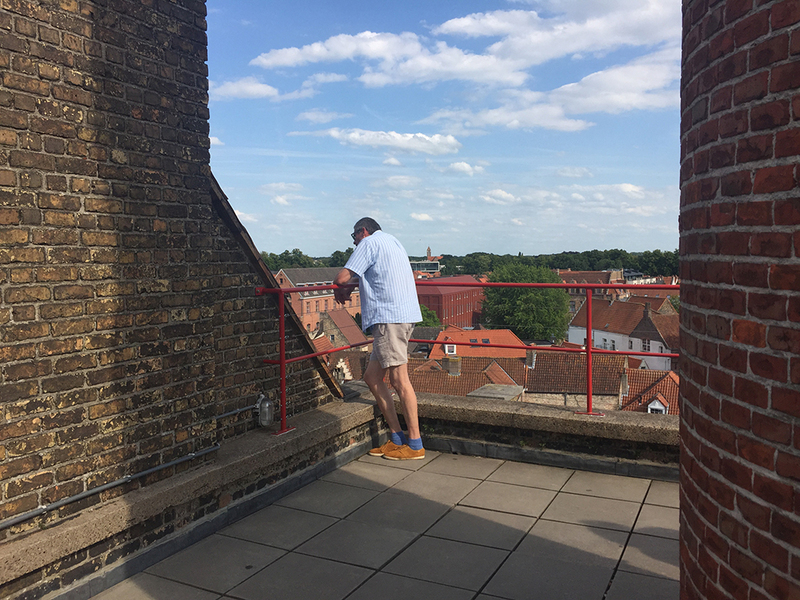 Breakfast – pipe (I smoke again all day!) 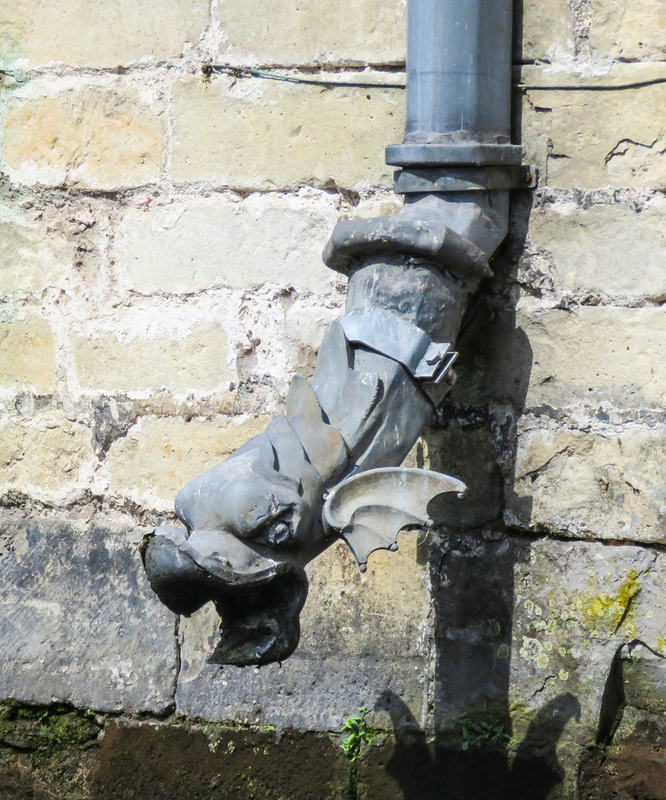 work till 12.30 lunch (pipe) – rest an hour – work till tea (pipe) – then work till 7.30 – change – dinner at 8. 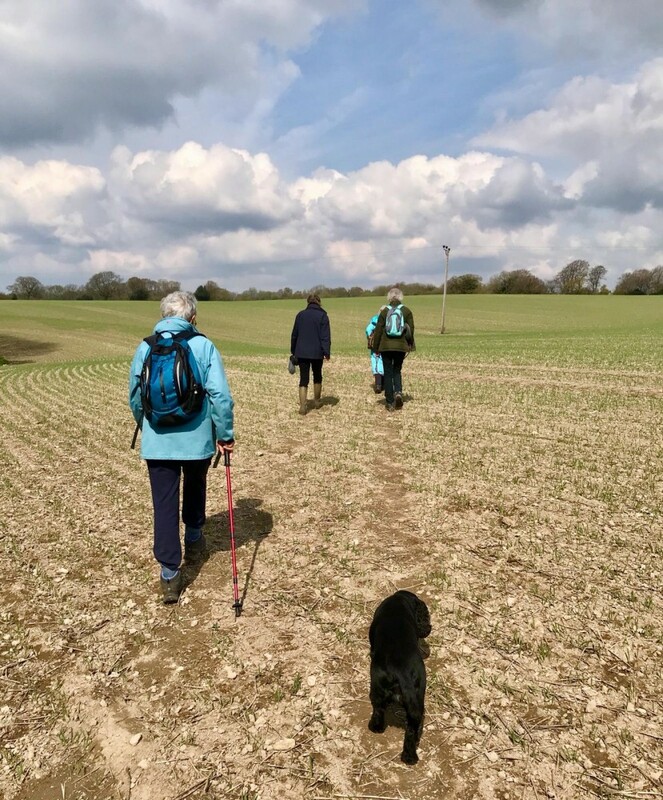 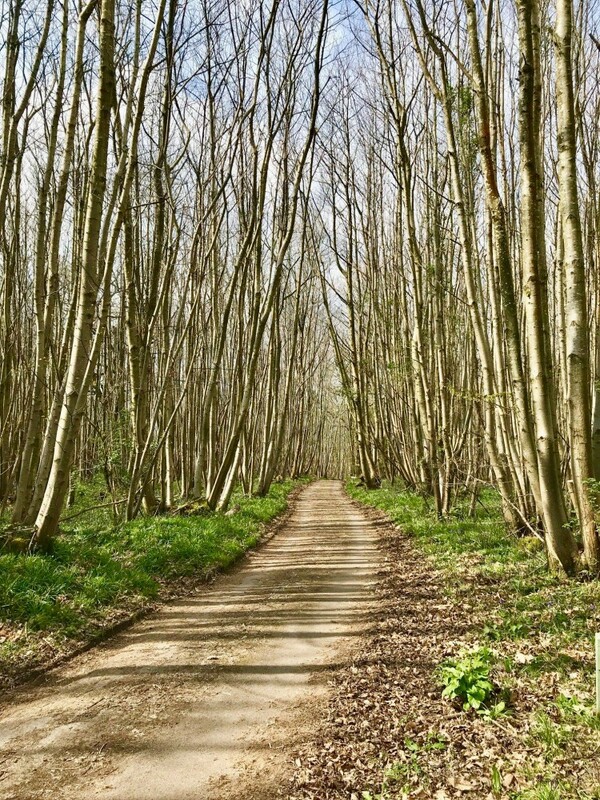 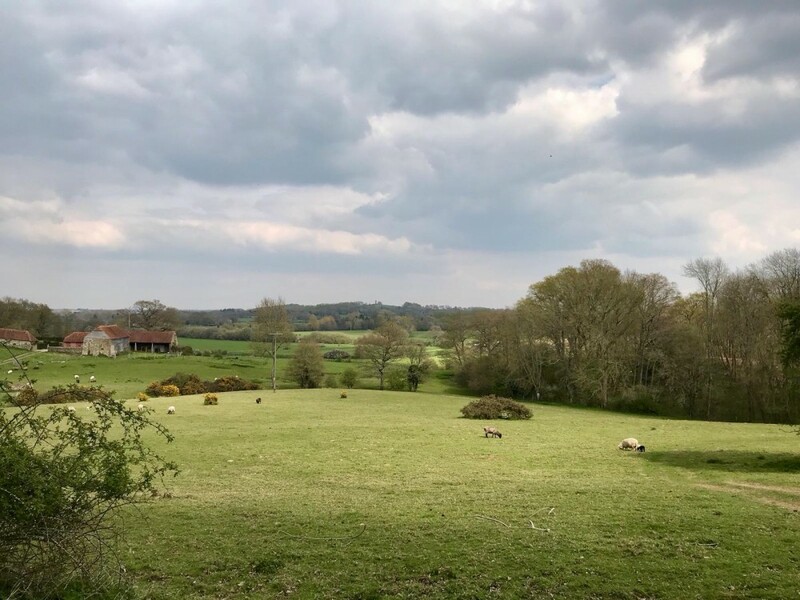 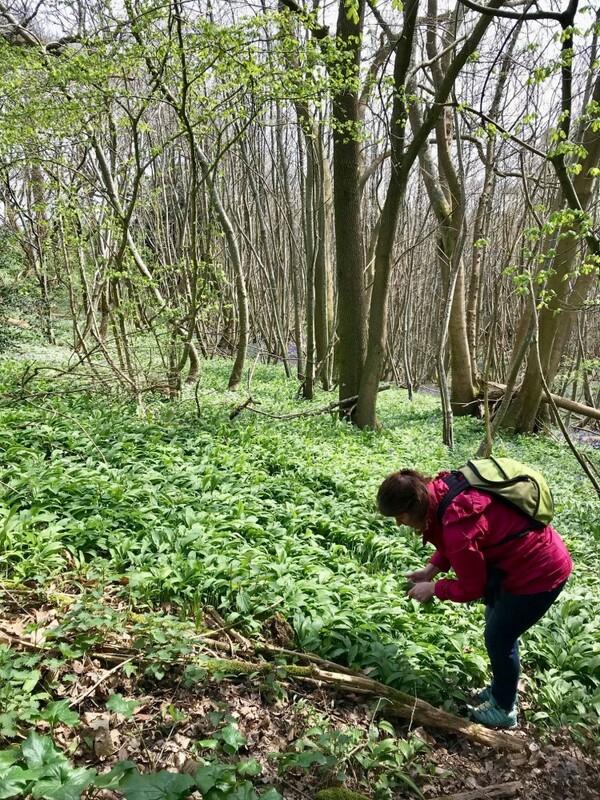 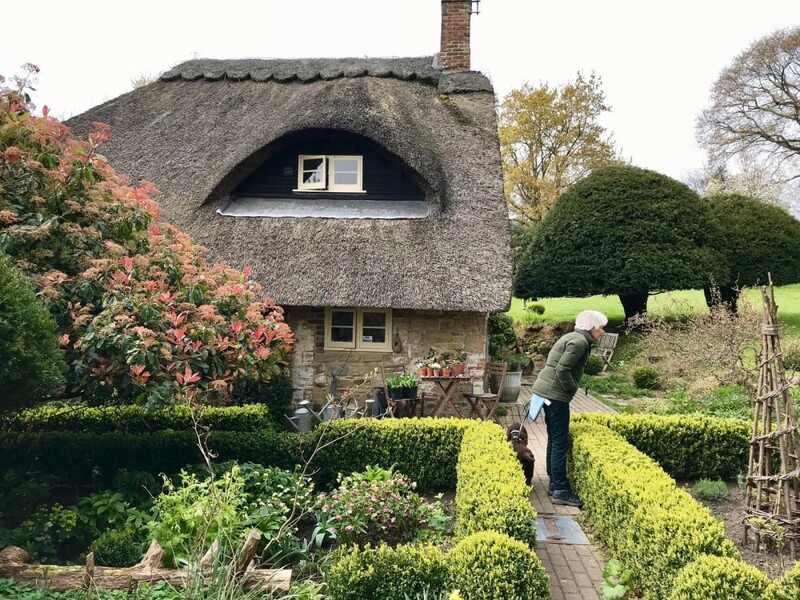 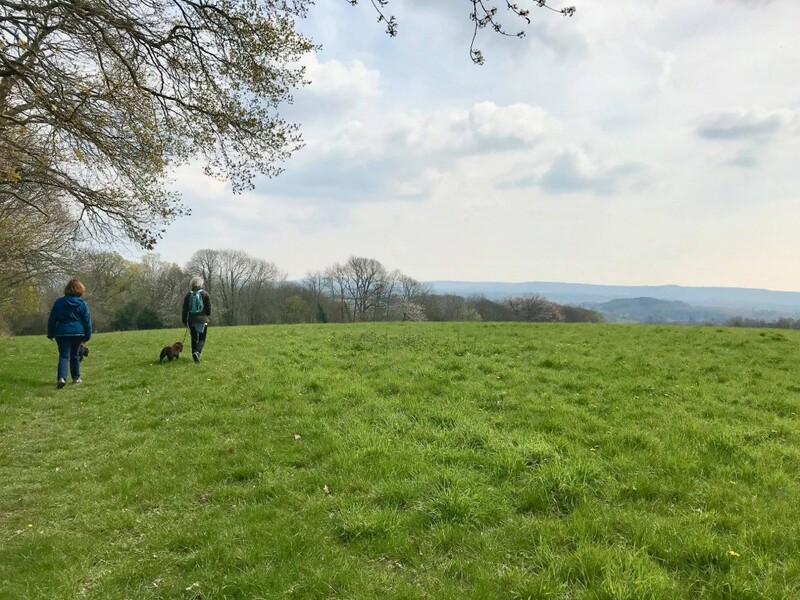 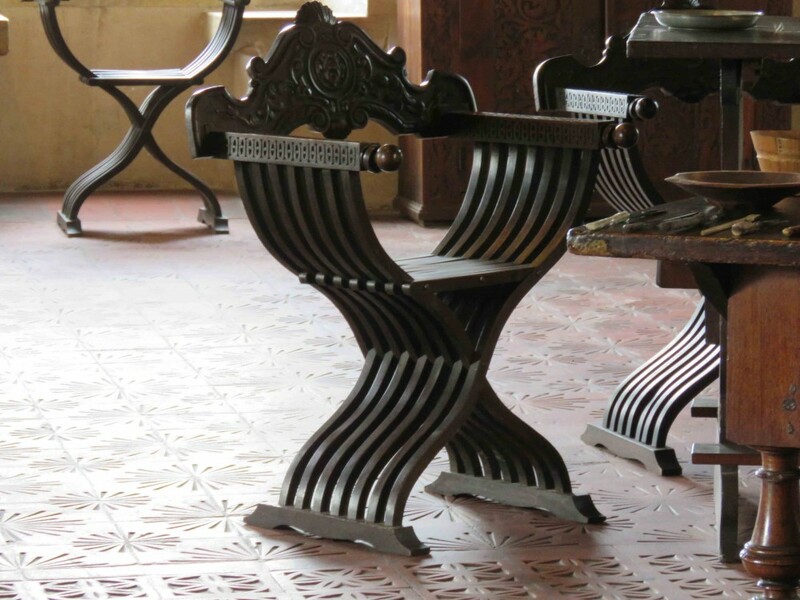 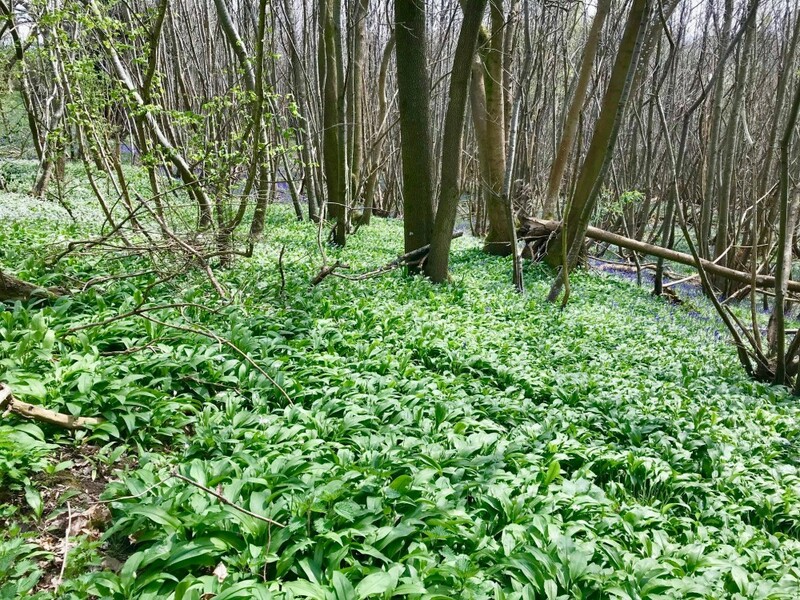 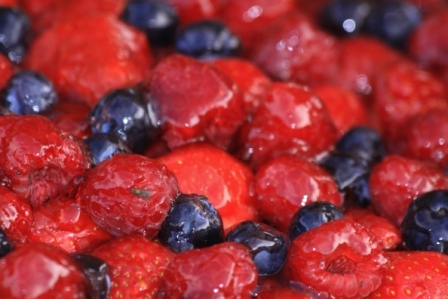 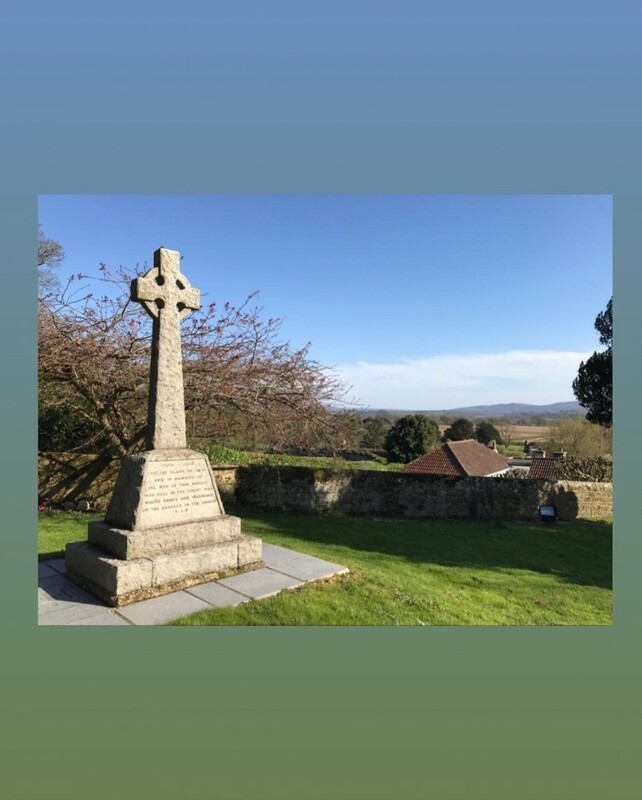 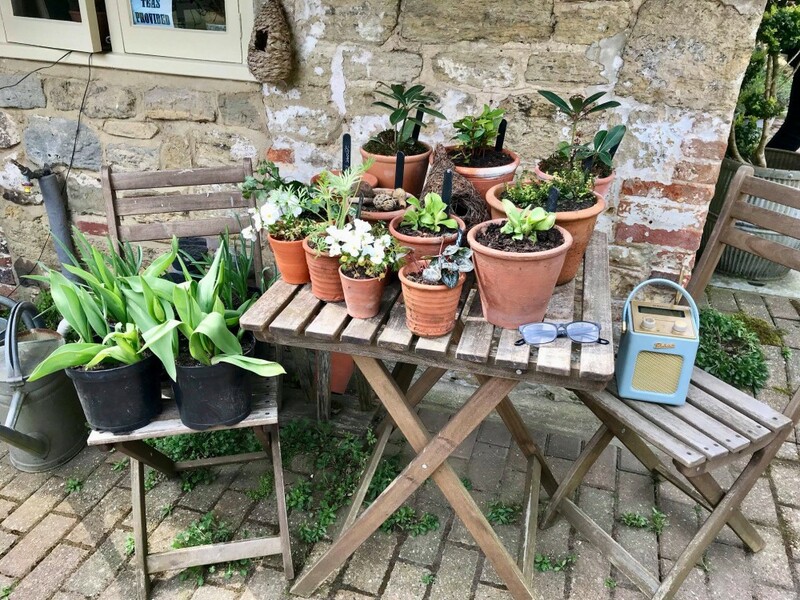 Bed at 10.0 – every day practically goes thus – of course instead of work, which means carpentering of the roughest kind, sawing wood, repairing furniture etc etc and weeding, we go on lovely walks – the loveliest walks really – … . 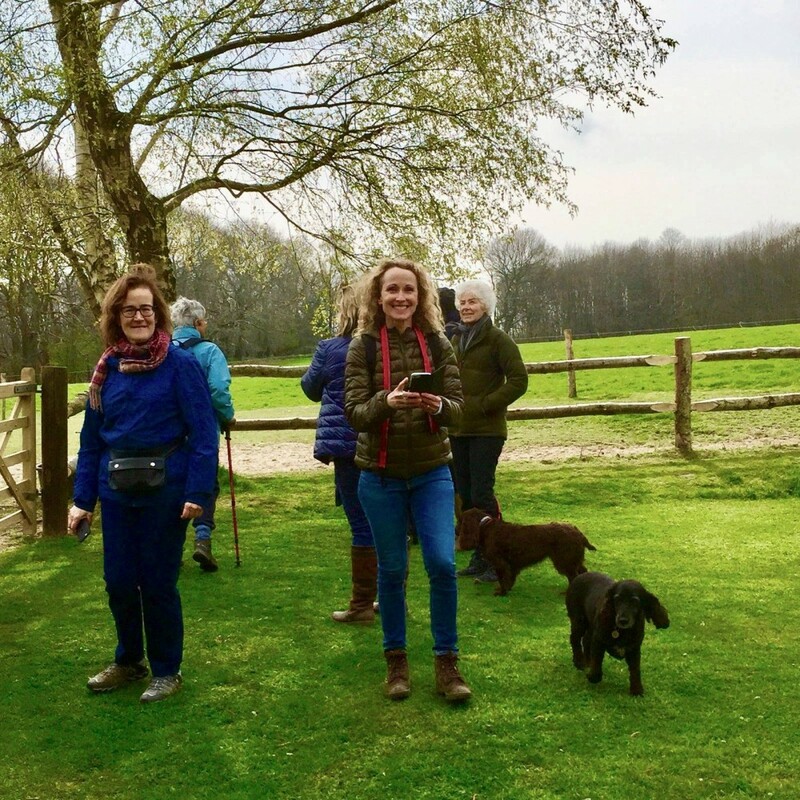 Thank you to everyone who supported the walk, but especially to the local residents who so generously gave us their time today. 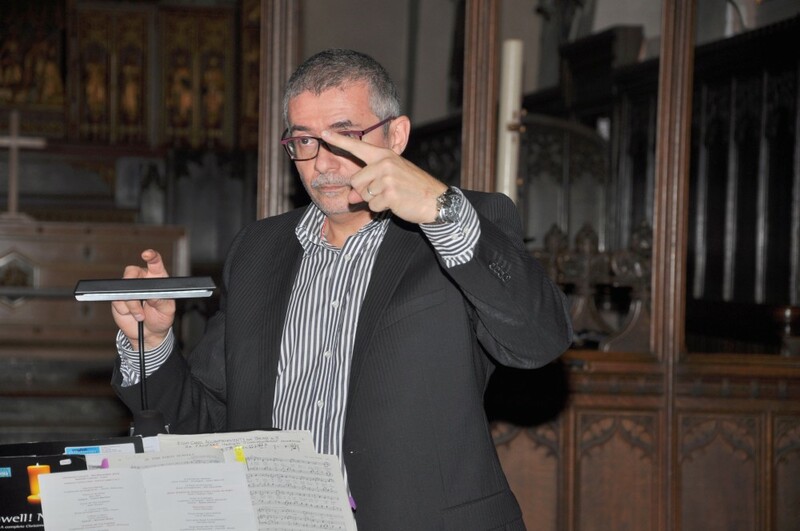 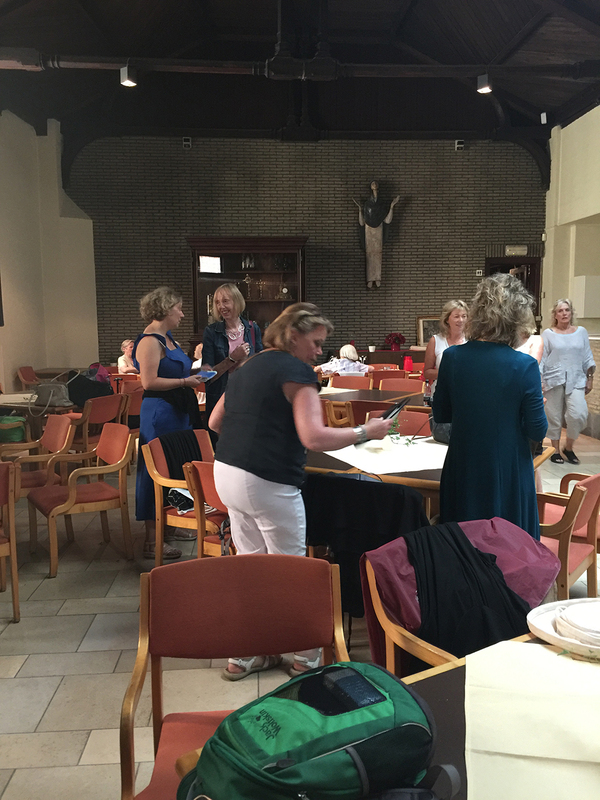 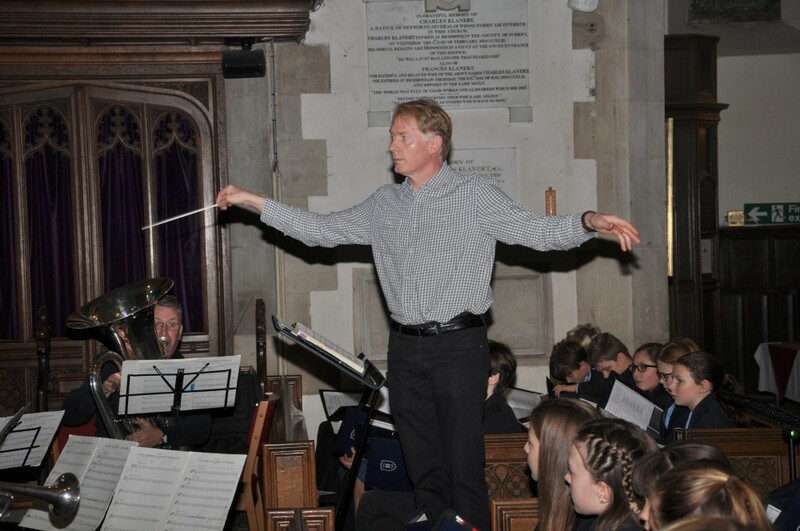 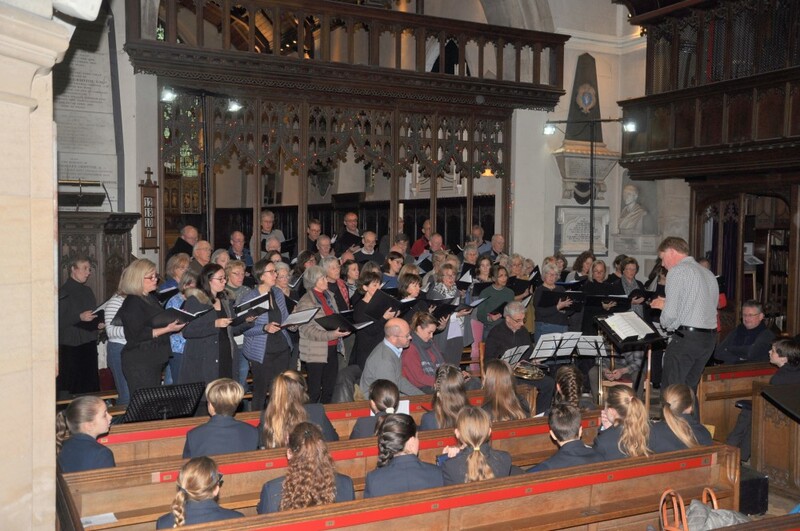 Our first Open Rehearsal at All Hallows in Tillington was a great success! . 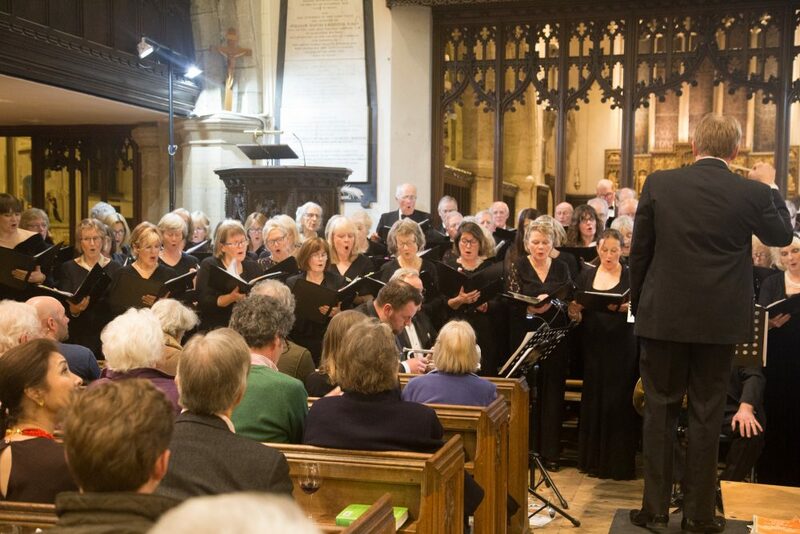 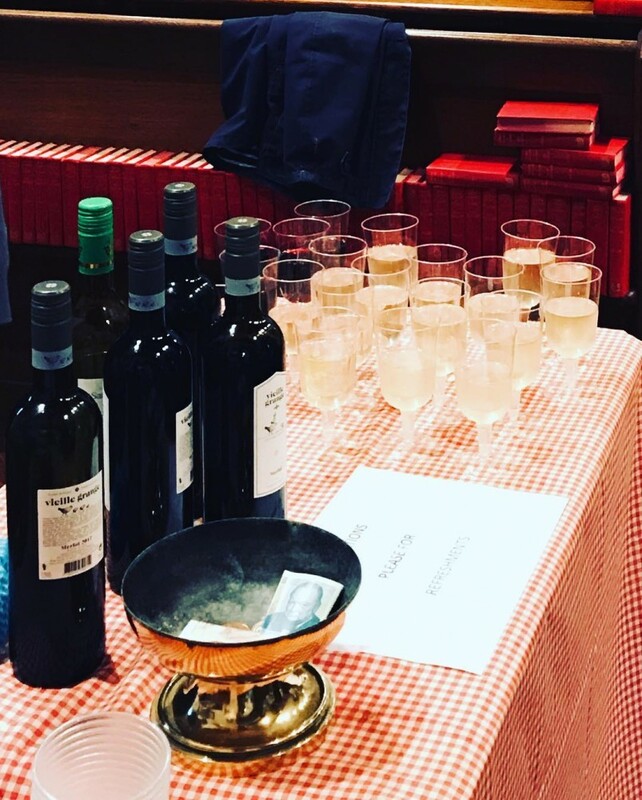 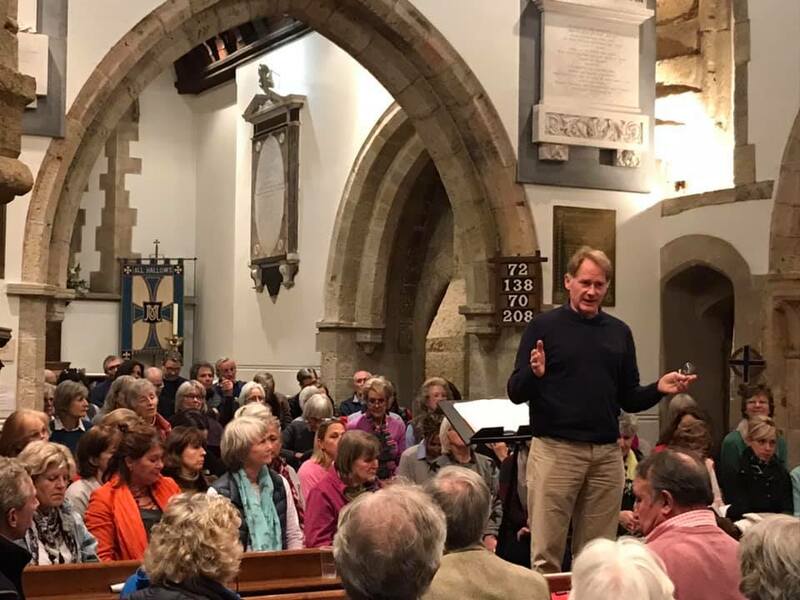 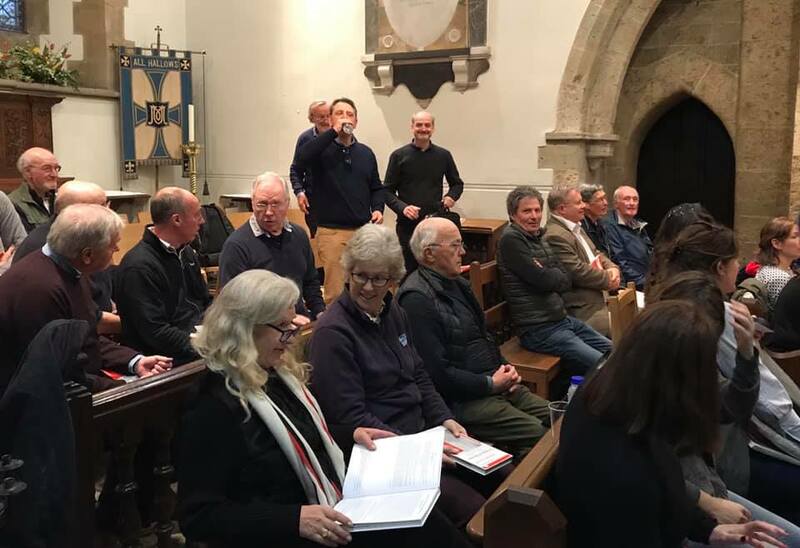 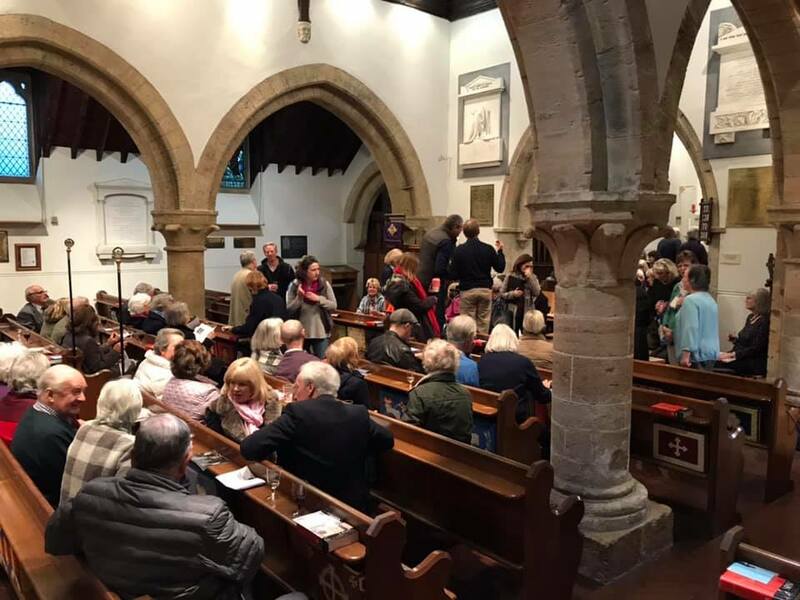 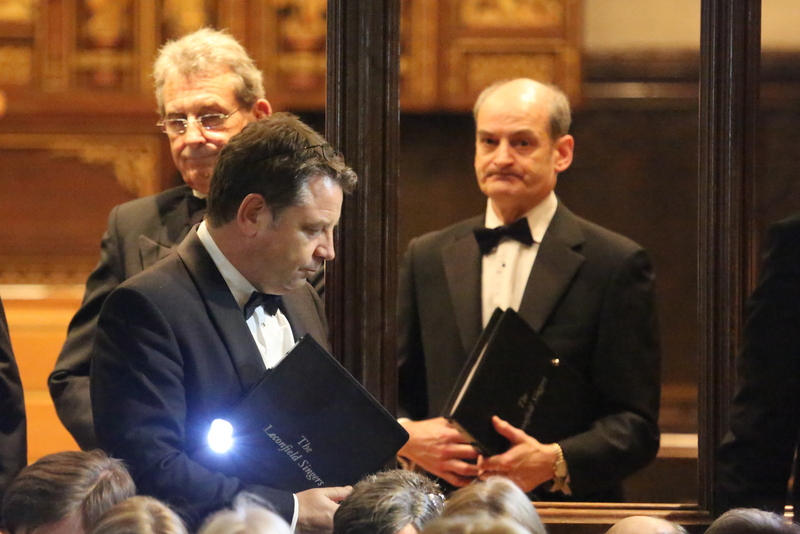 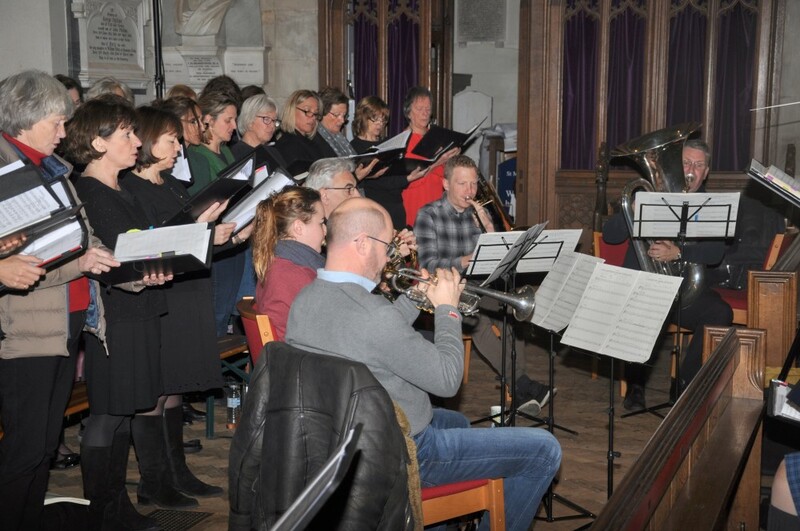 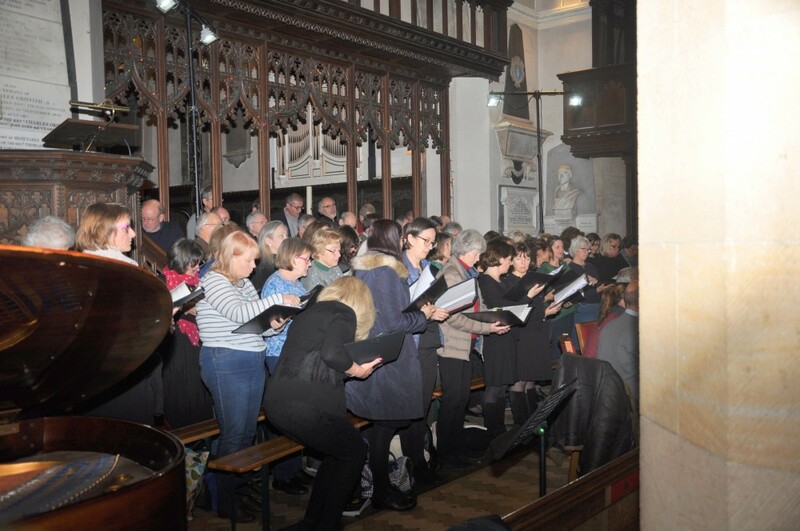 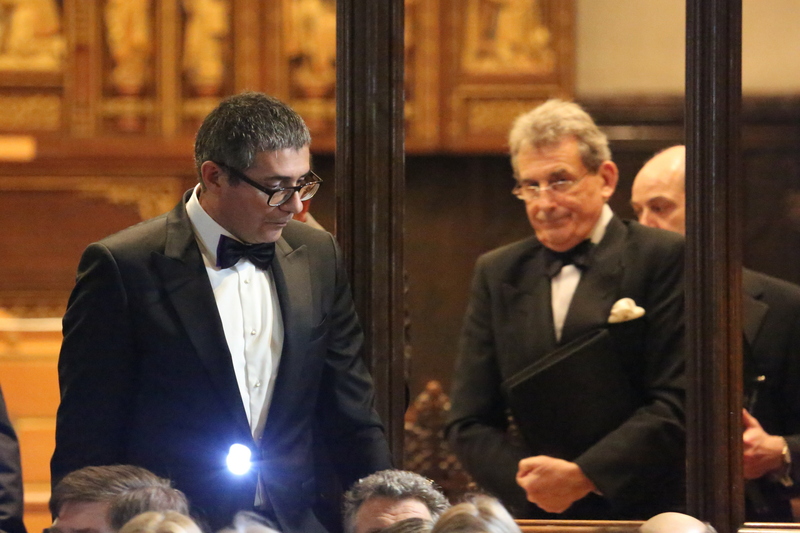 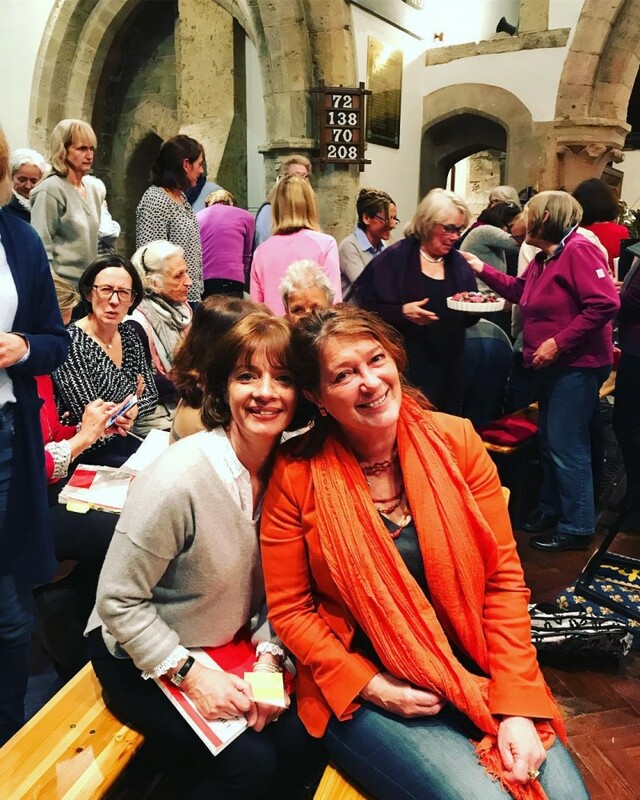 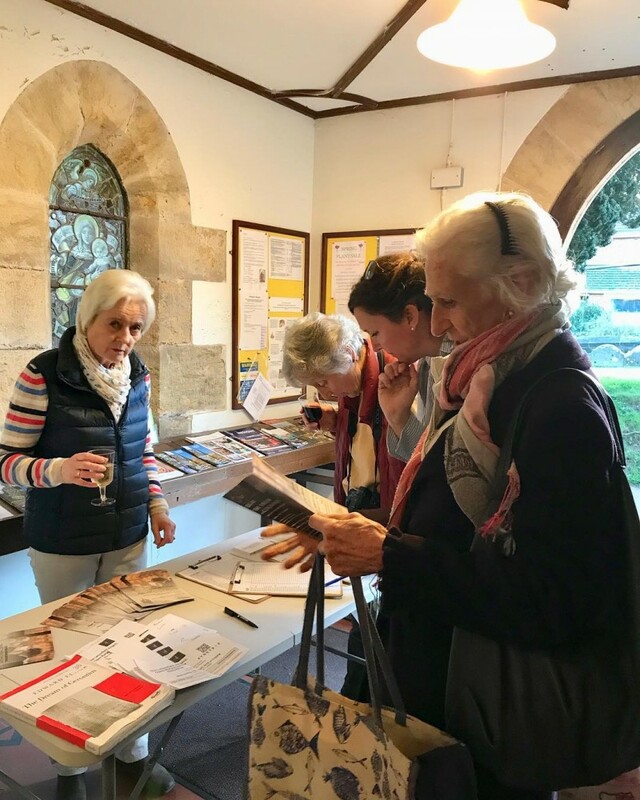 We had an audience of almost a hundred, and it was an interesting and entertaining evening for us all, as well as getting the choir a step nearer to perfection for our concert on 8th May! . 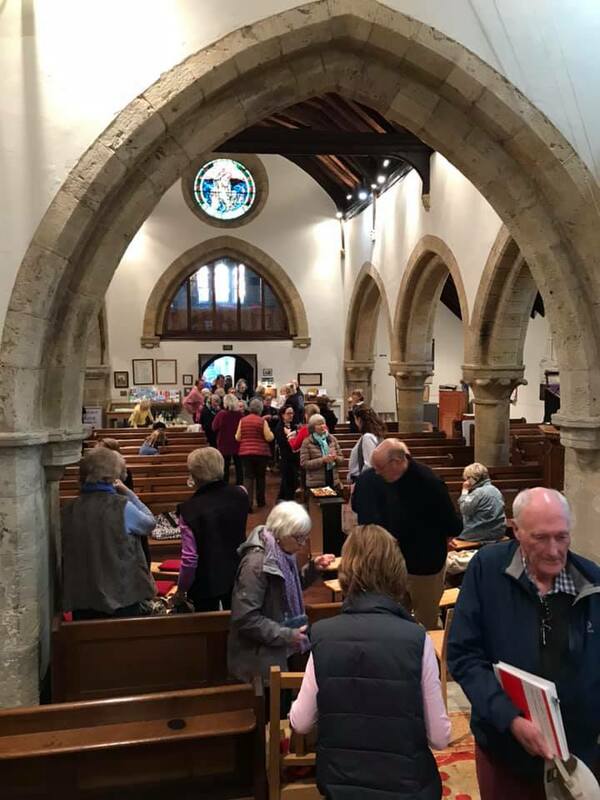 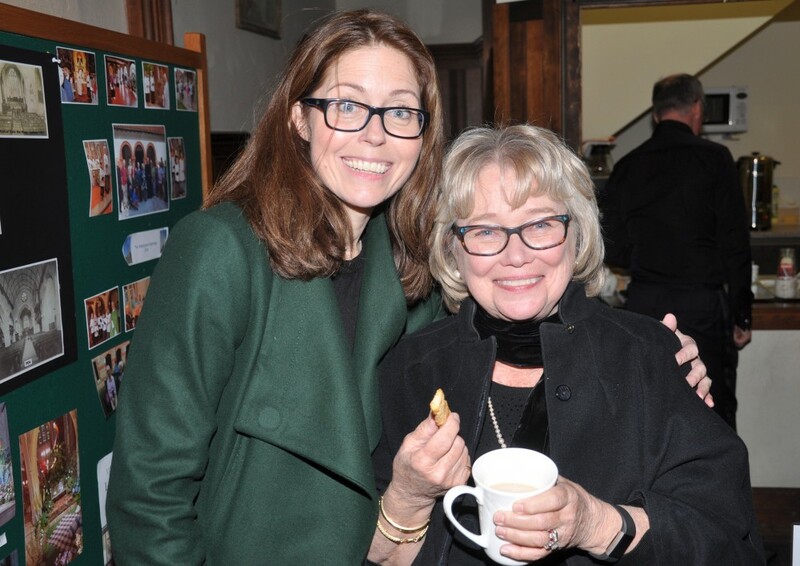 Thank you to everyone involved, especially the parish of Tillington for making us feel so welcome. 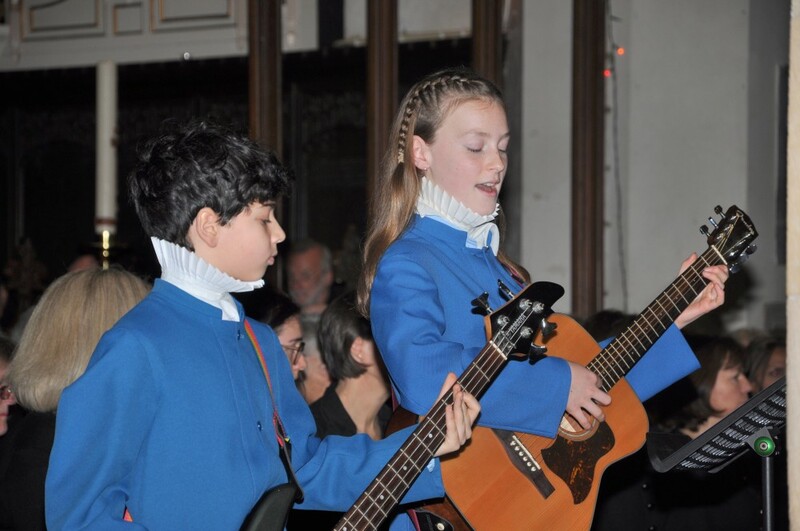 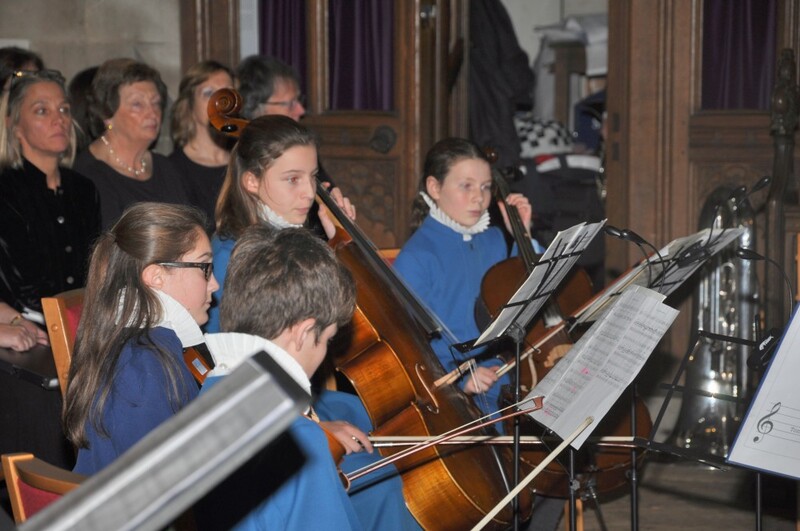 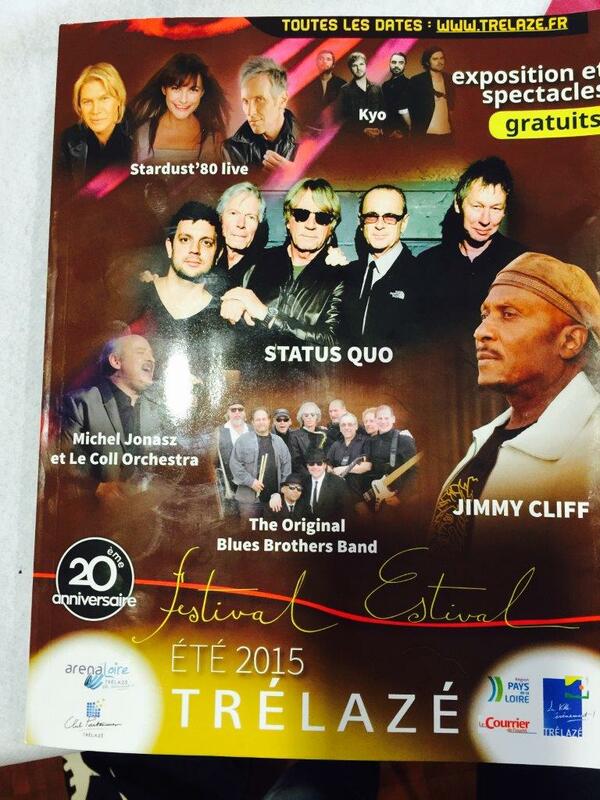 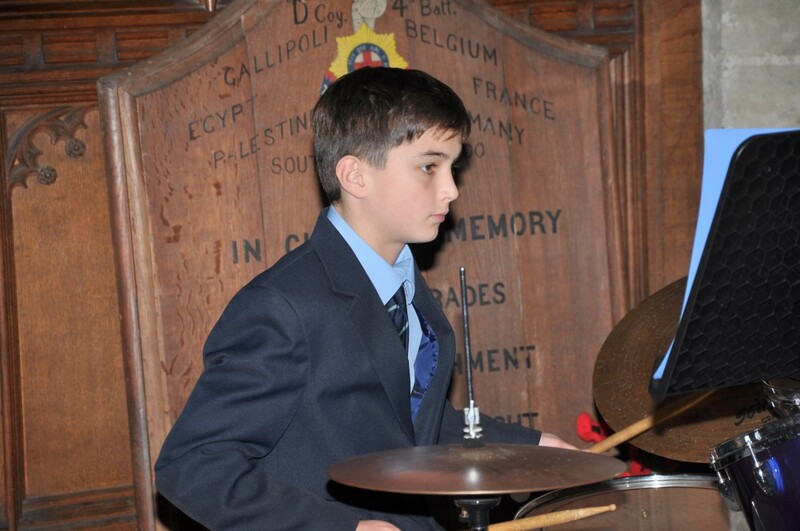 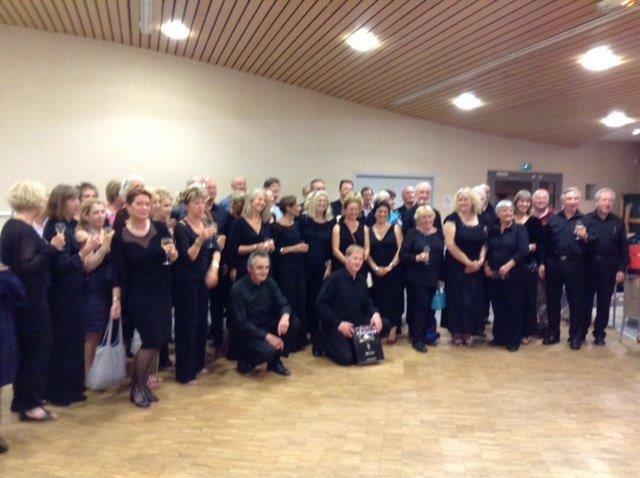 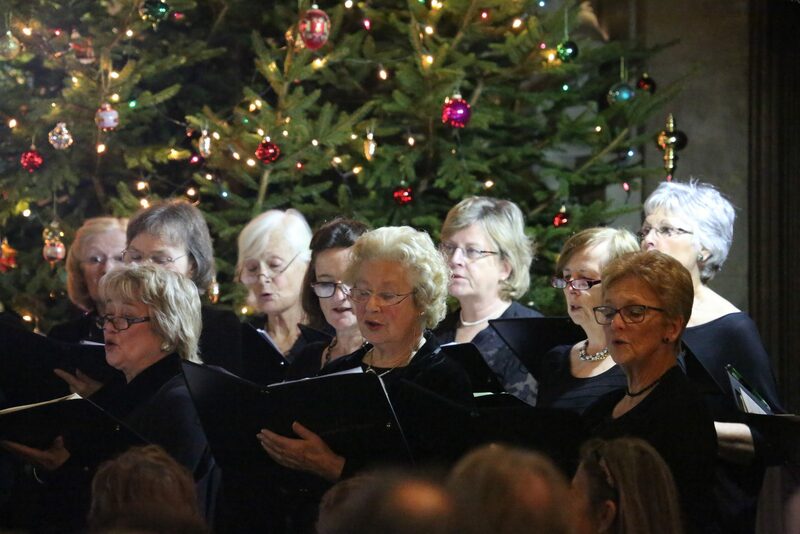 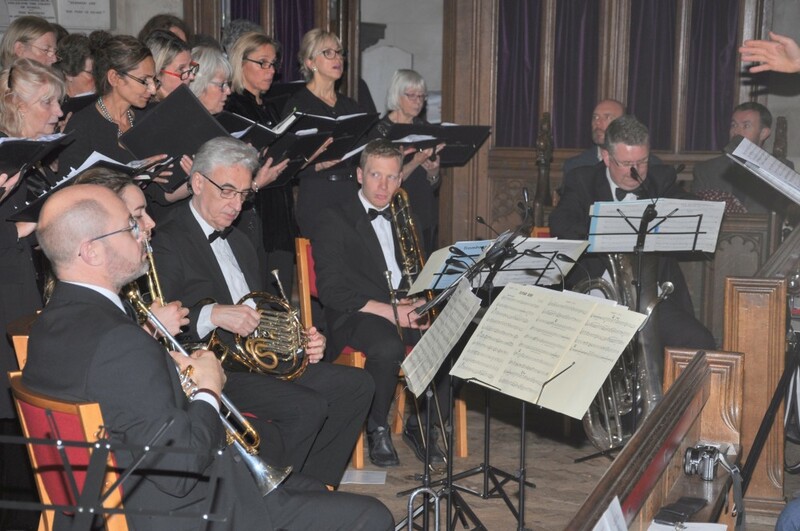 After the success of last year we once again held 2 Christmas concerts, a Matinée and an Evening concert. 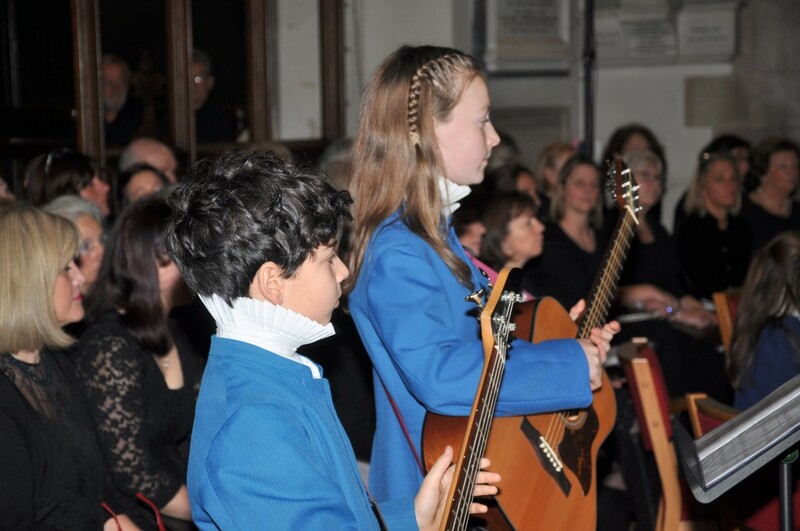 For the Matinée we were thrilled to be joined once more by the wonderful children of Dorset House School. 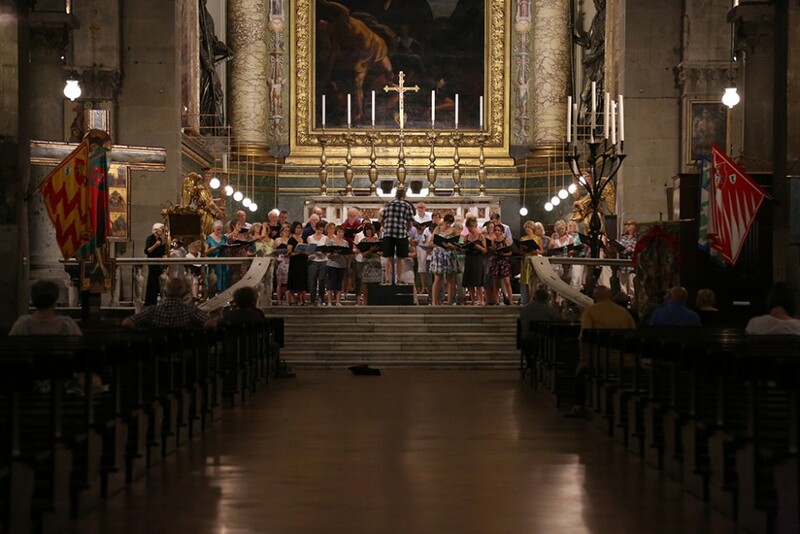 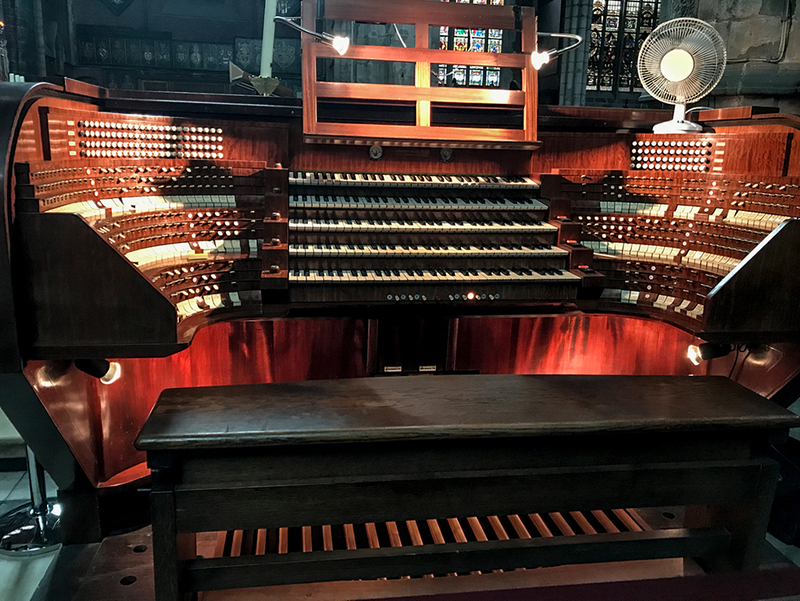 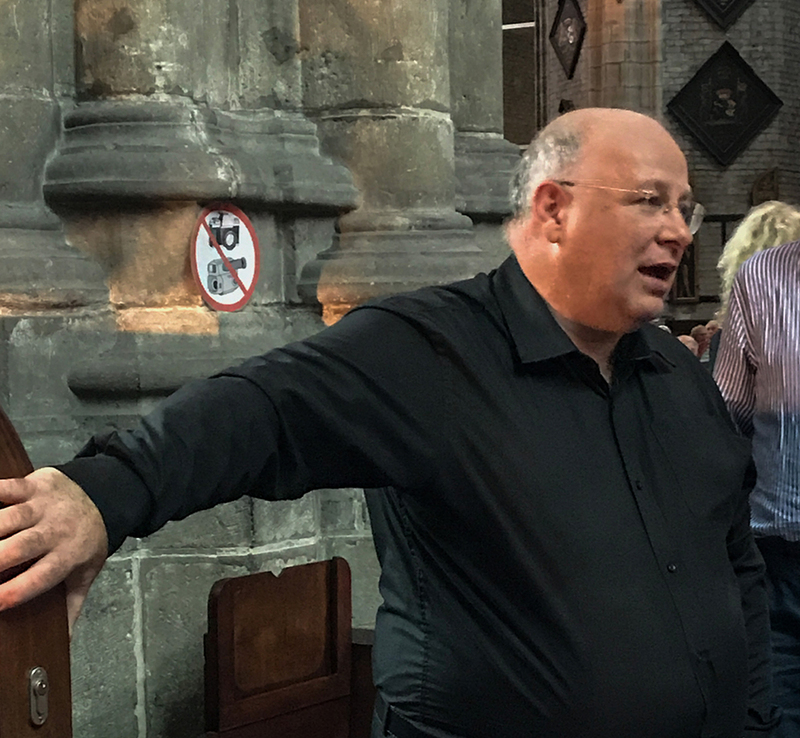 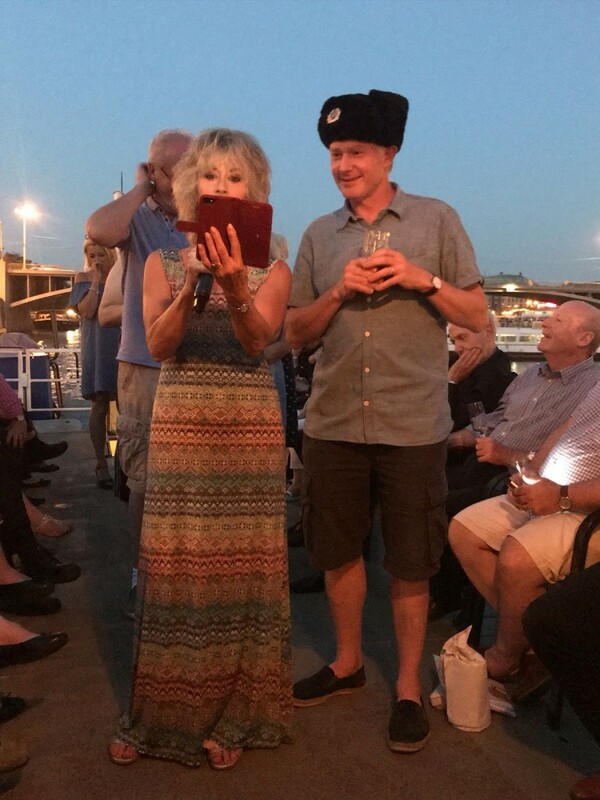 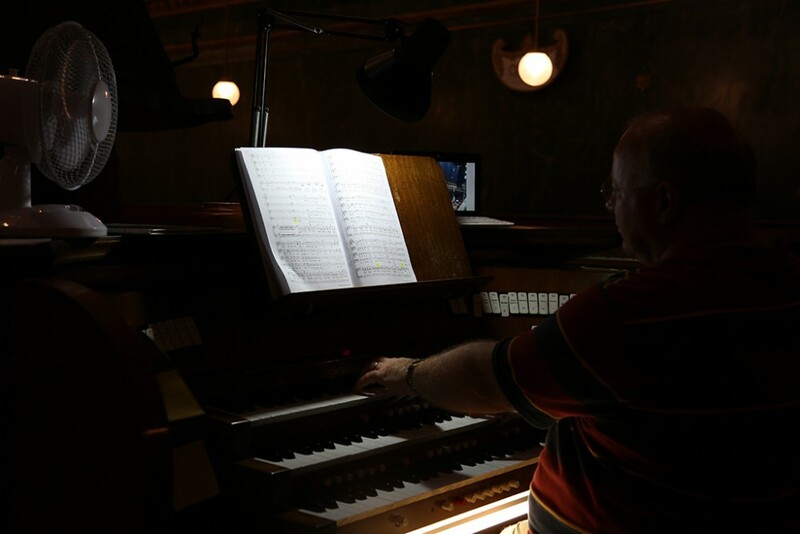 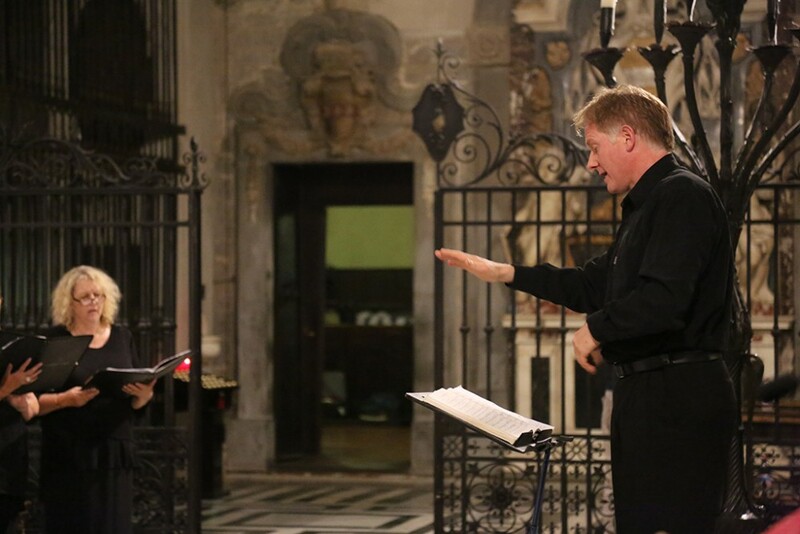 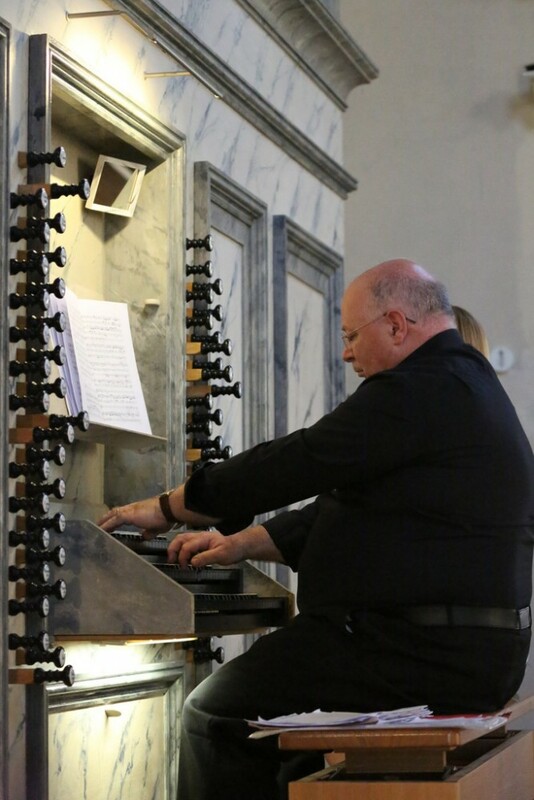 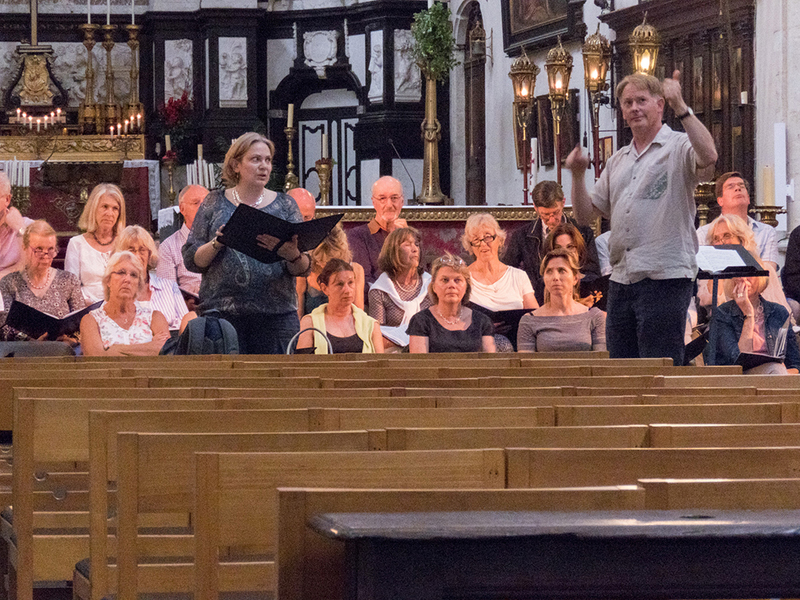 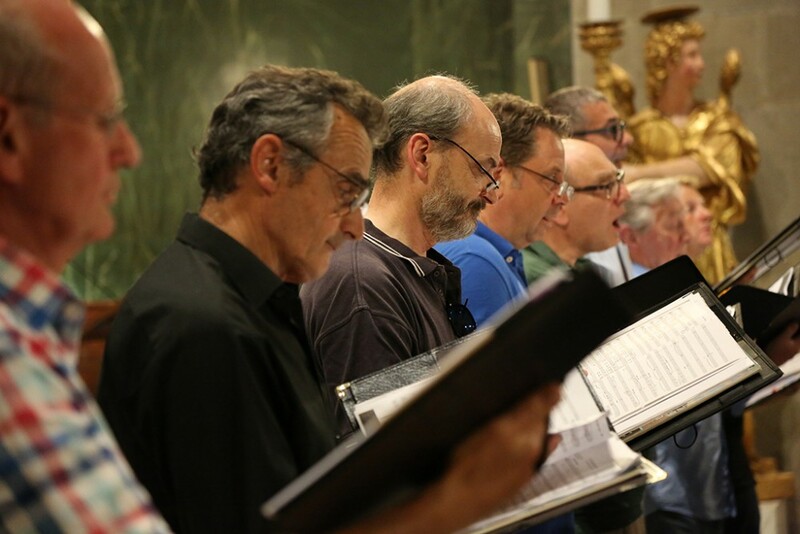 Thanks to Christopher Esdaile for all these lovely photos, which capture a flavour of not just the concerts themselves, but also the rehearsals! 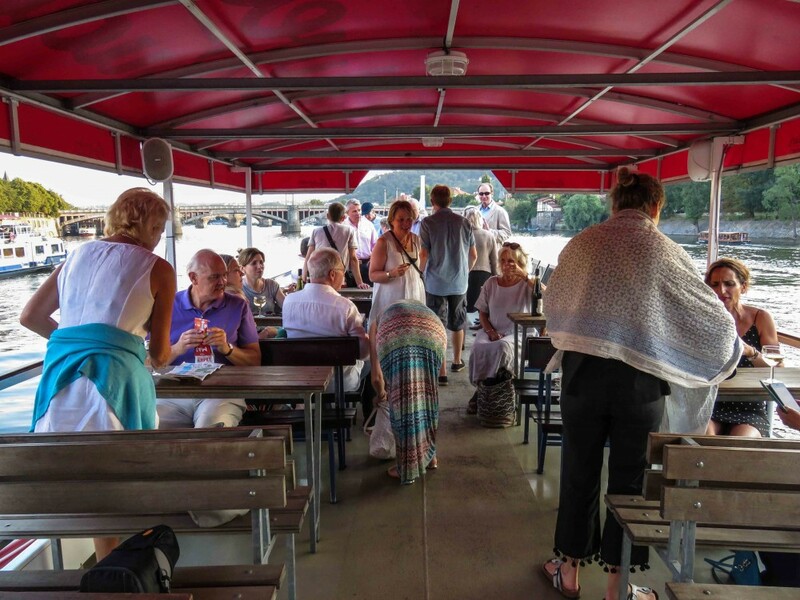 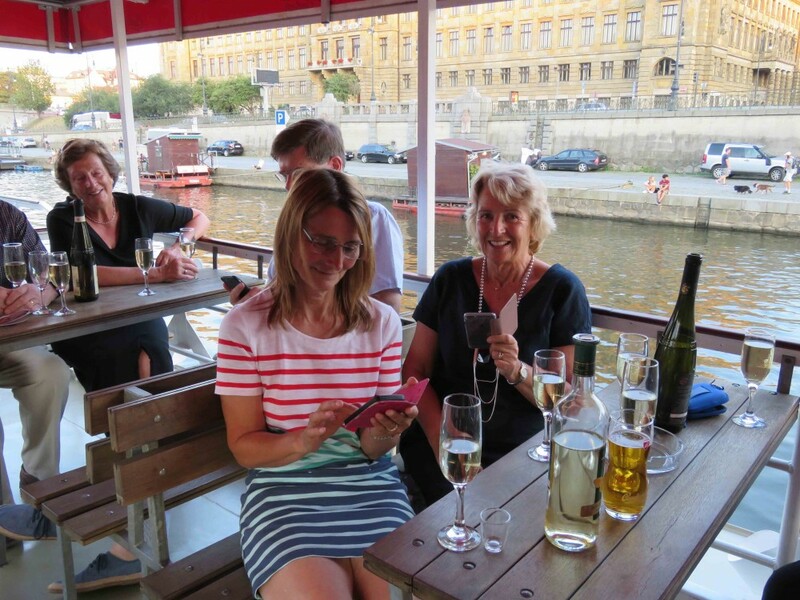 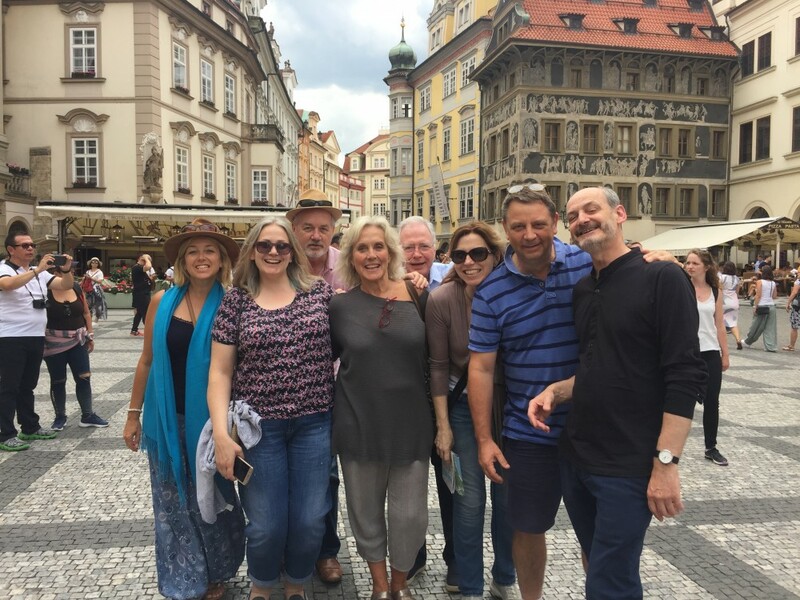 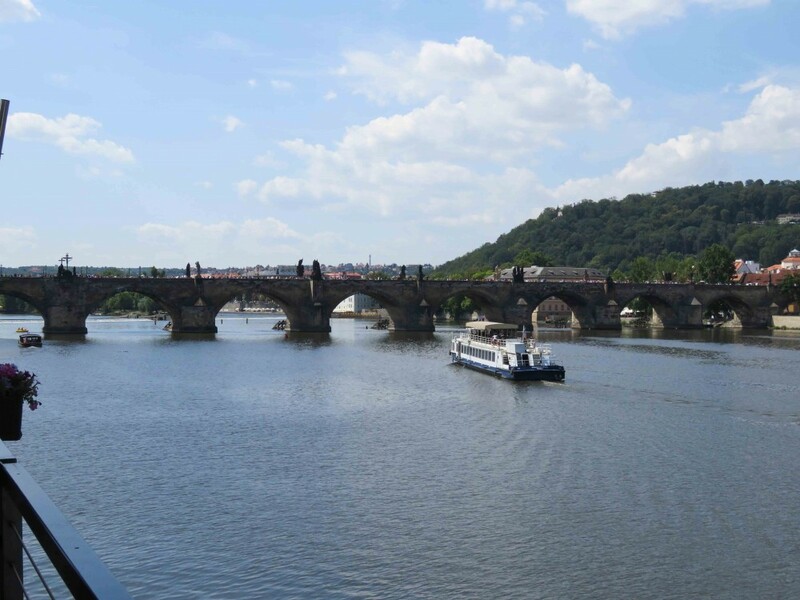 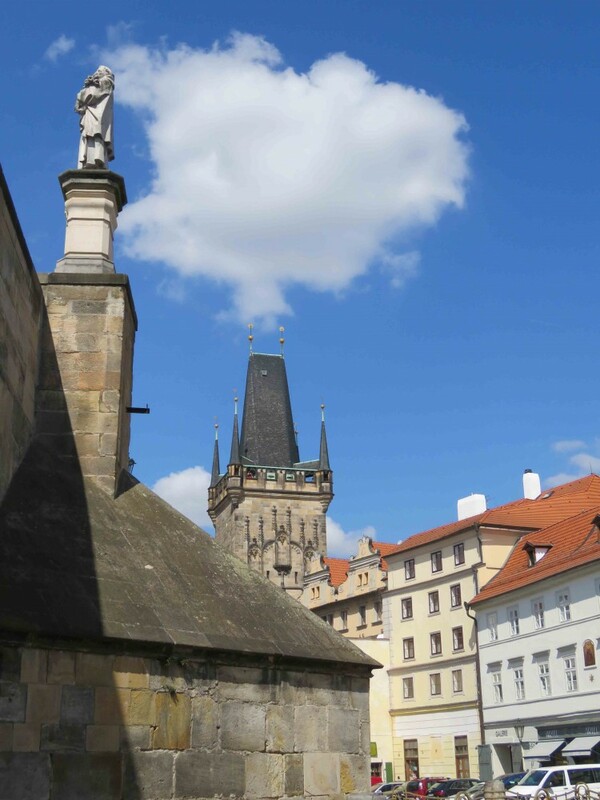 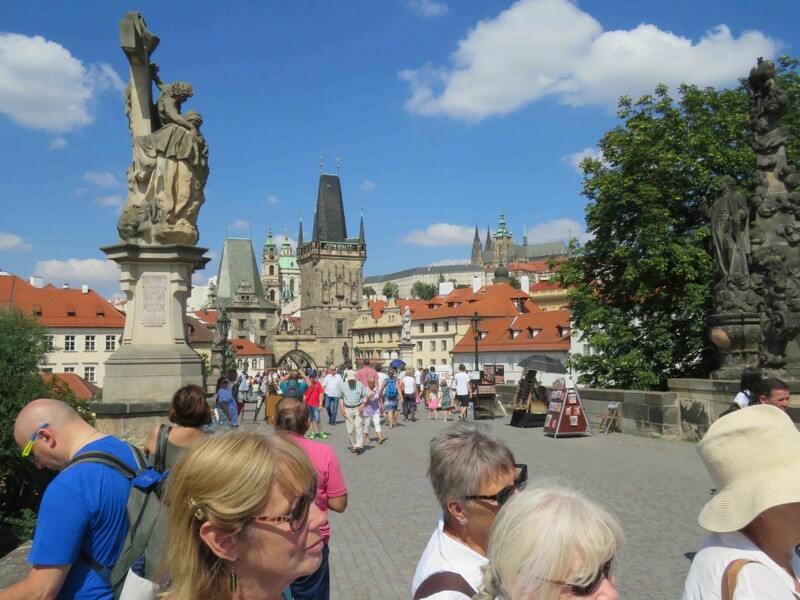 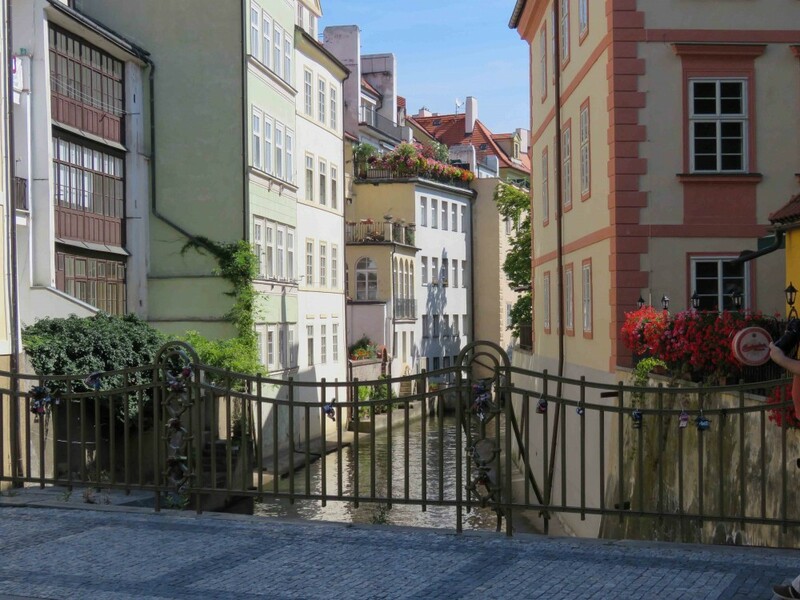 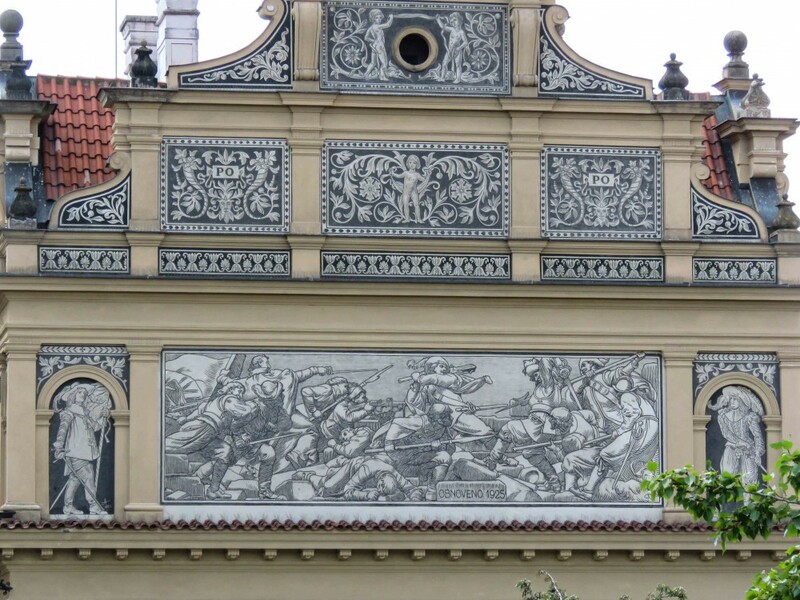 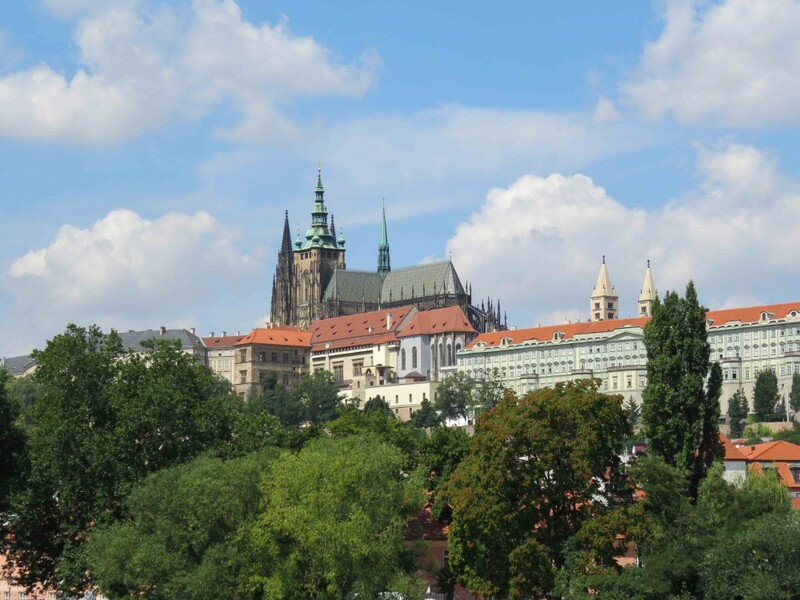 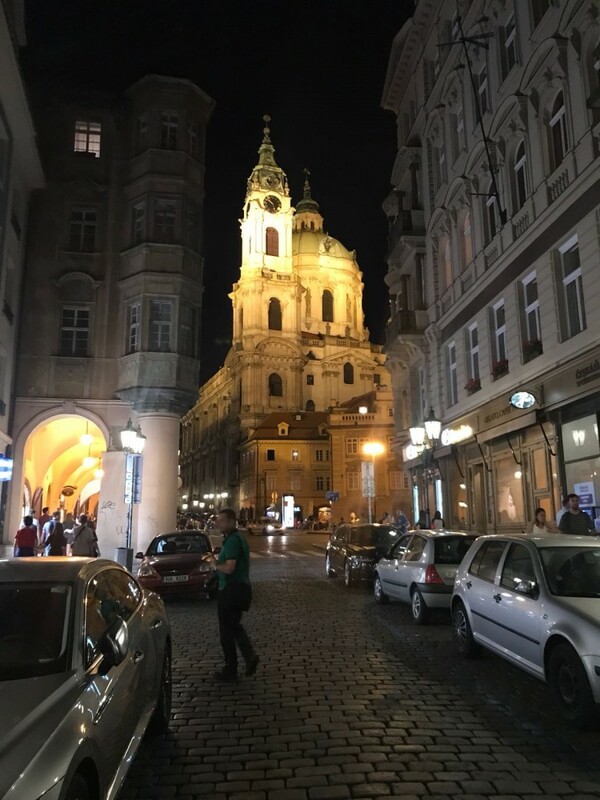 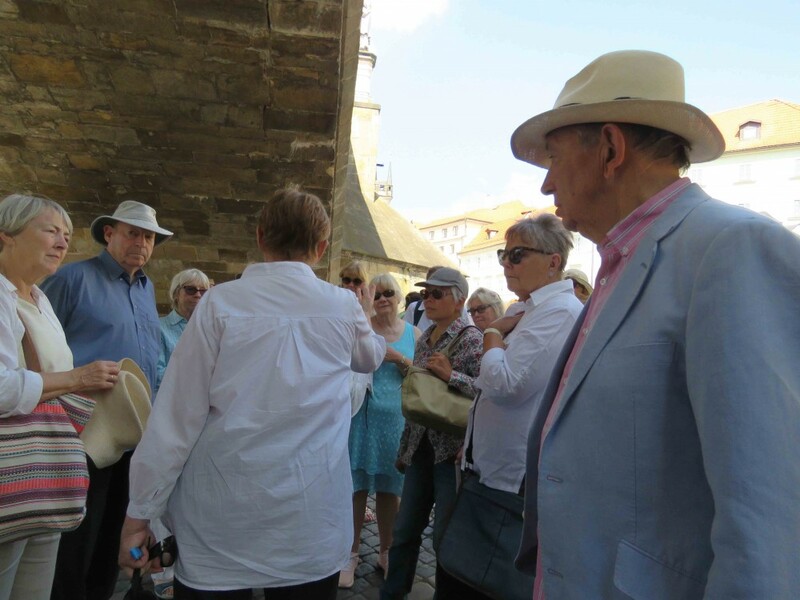 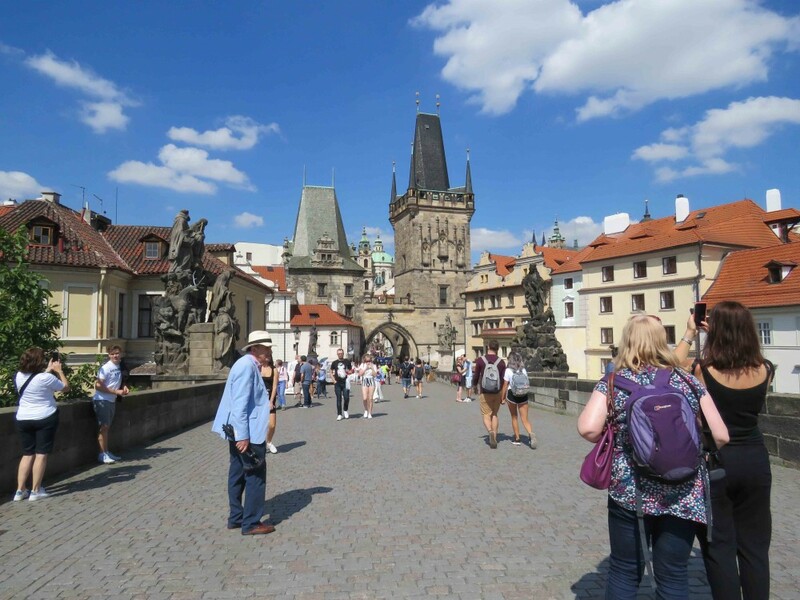 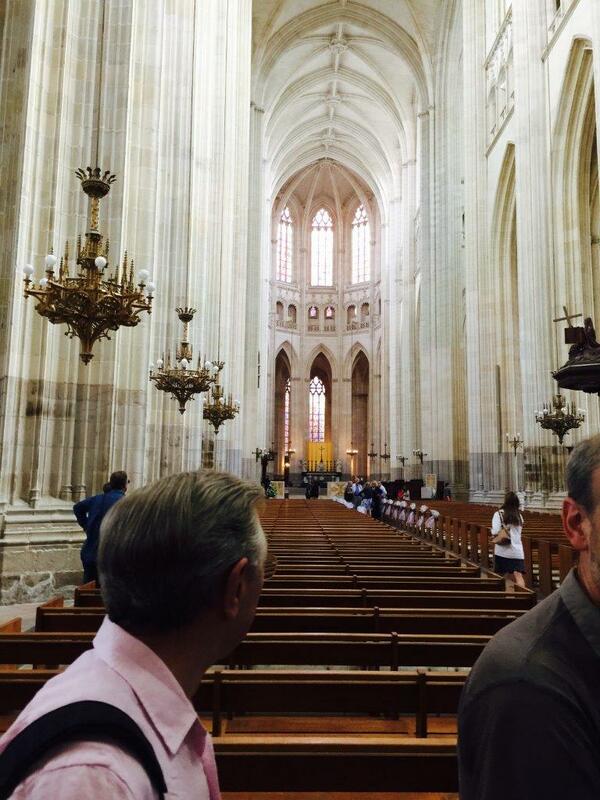 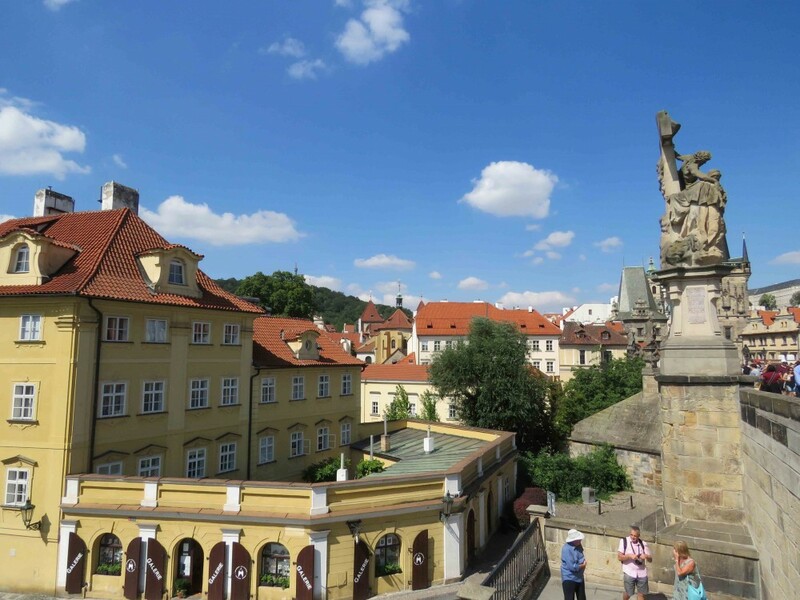 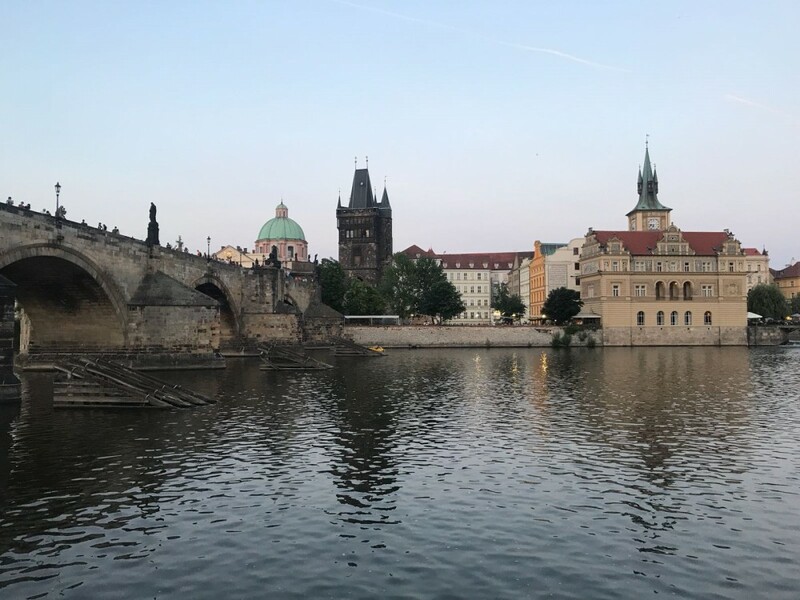 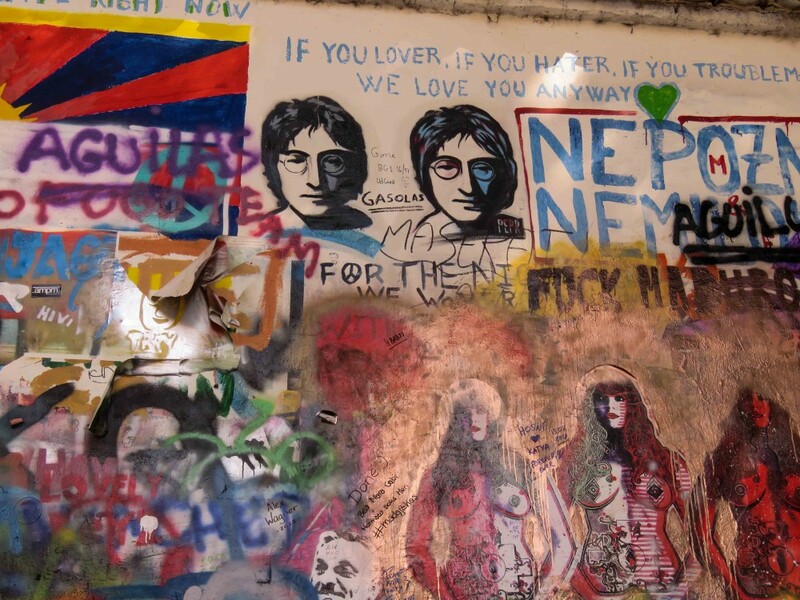 This year our tour was based in the beautiful city of Prague in the Czech Republic. 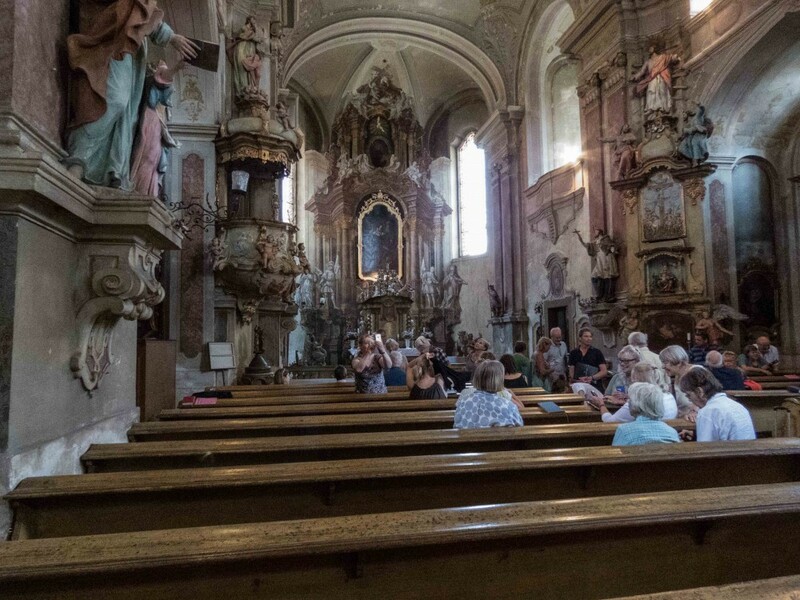 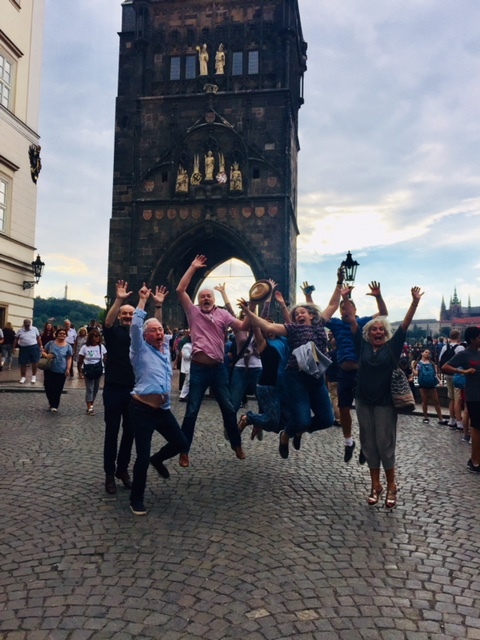 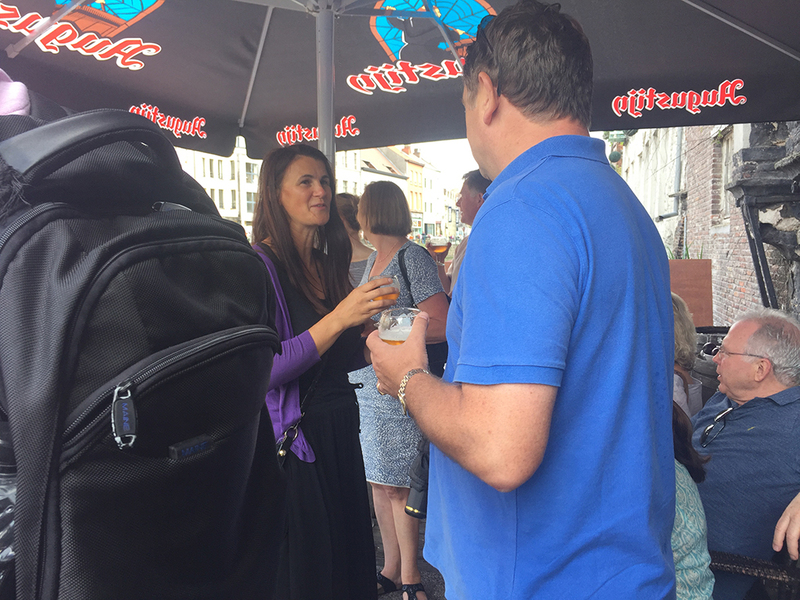 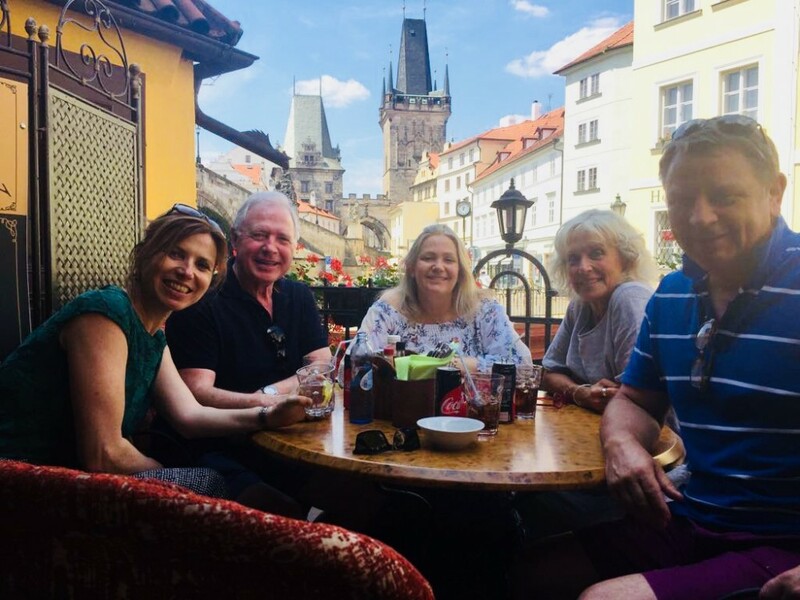 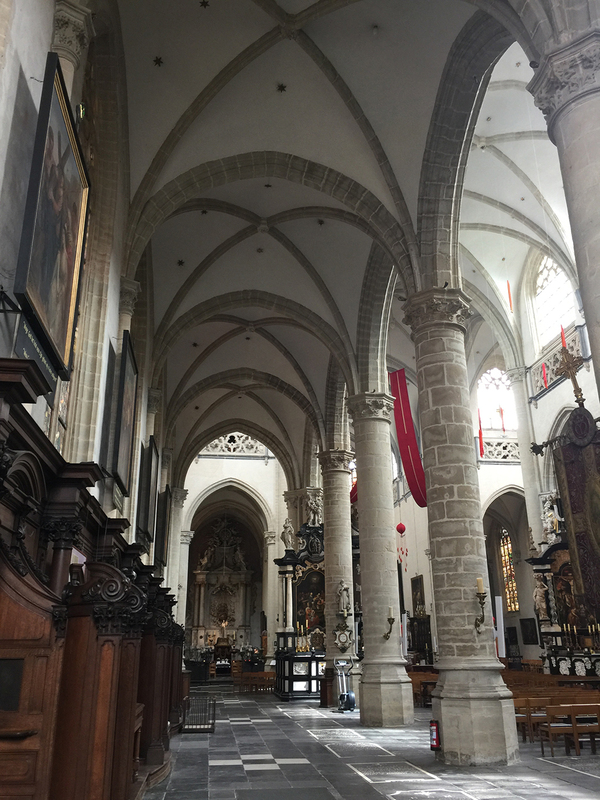 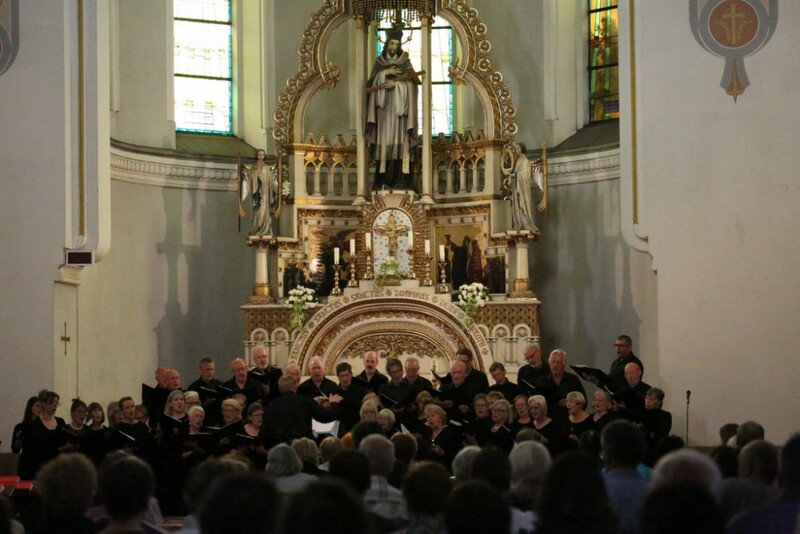 We had a wonderful, fun time and our hosts at the venues of the churches in Pilsen, Ustek and central Prague were absolutely delightful. 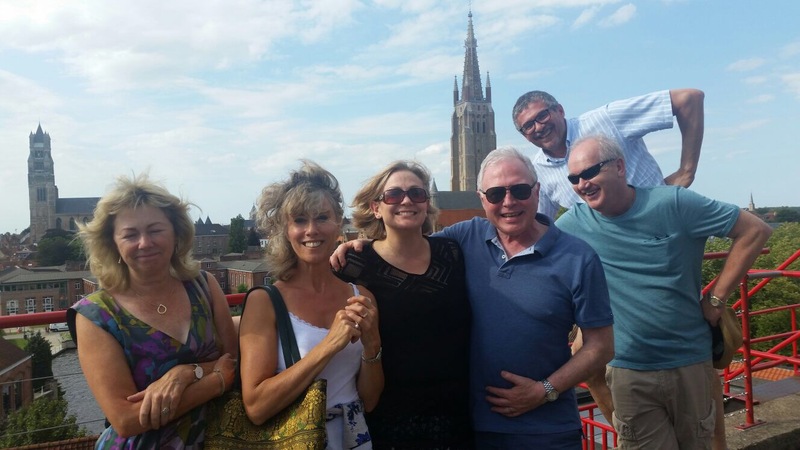 As ever this is a collection of photos from various people on tour, with more to follow shortly…. 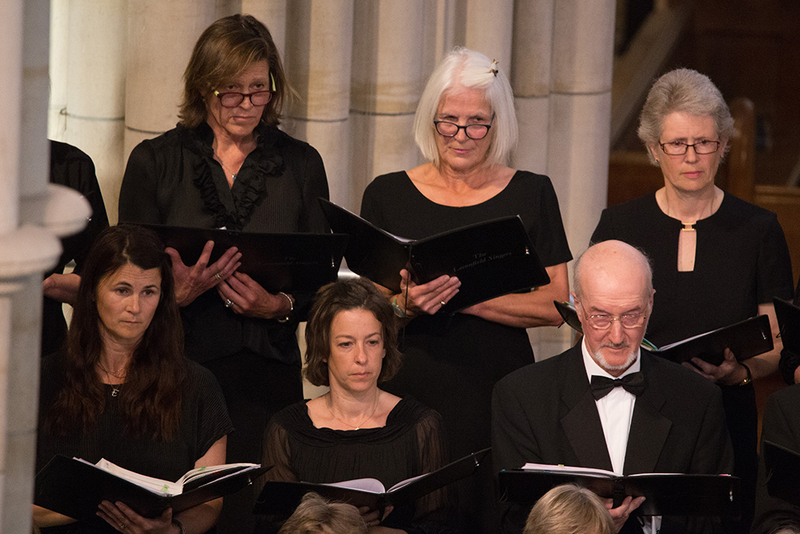 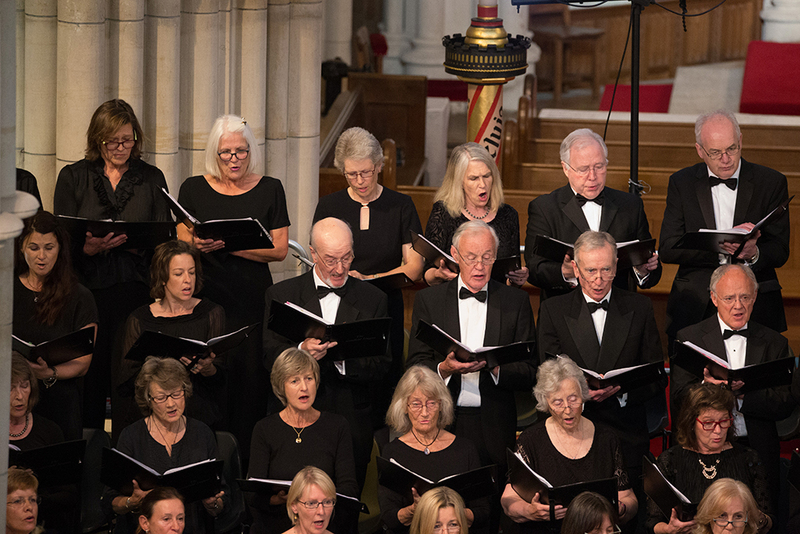 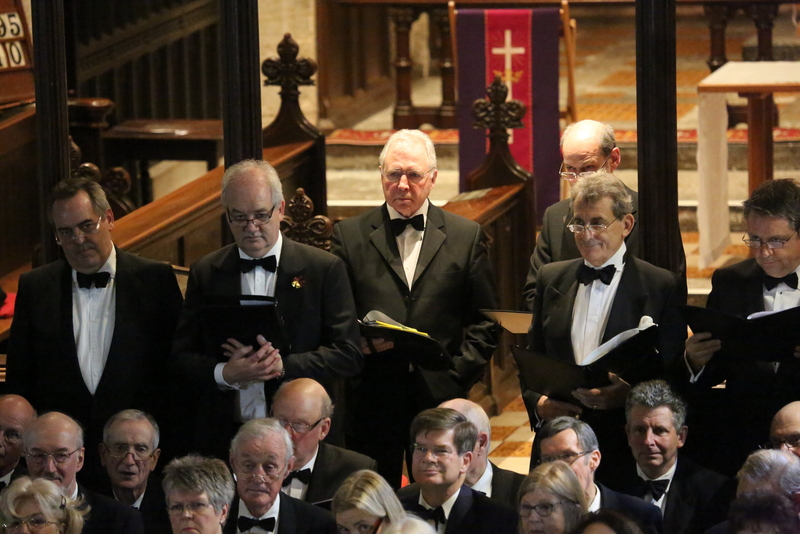 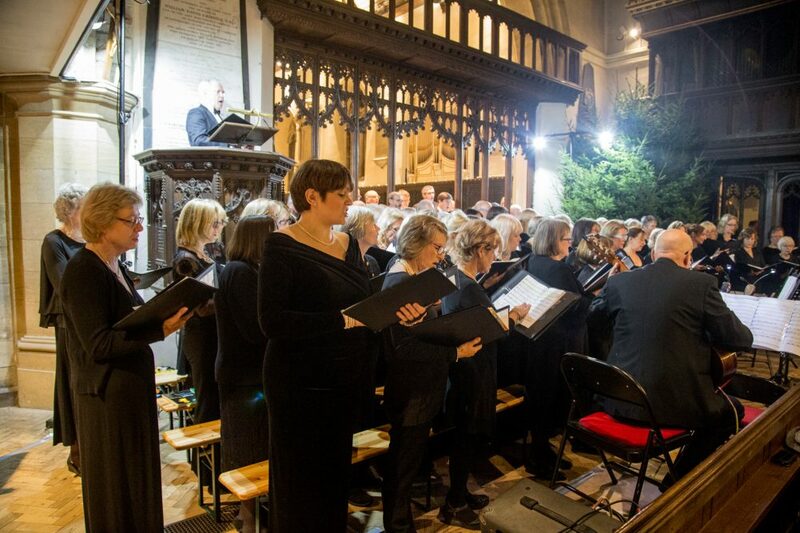 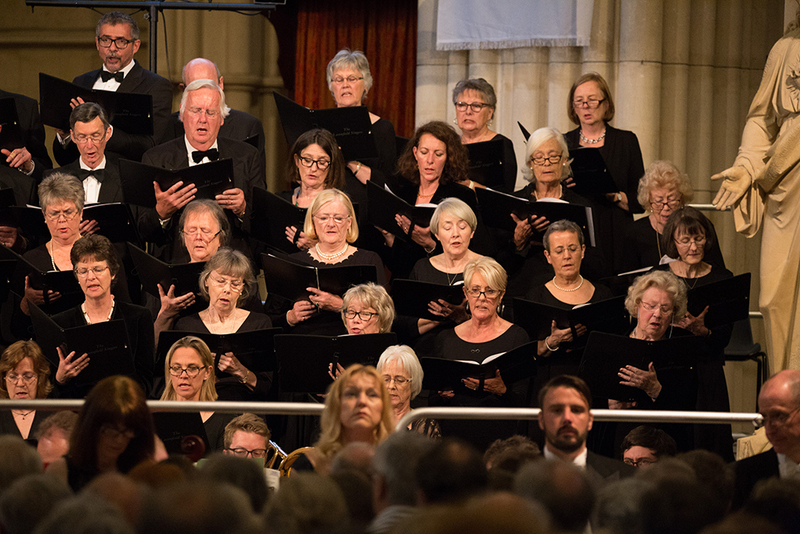 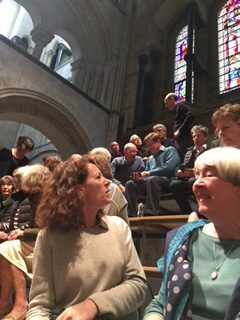 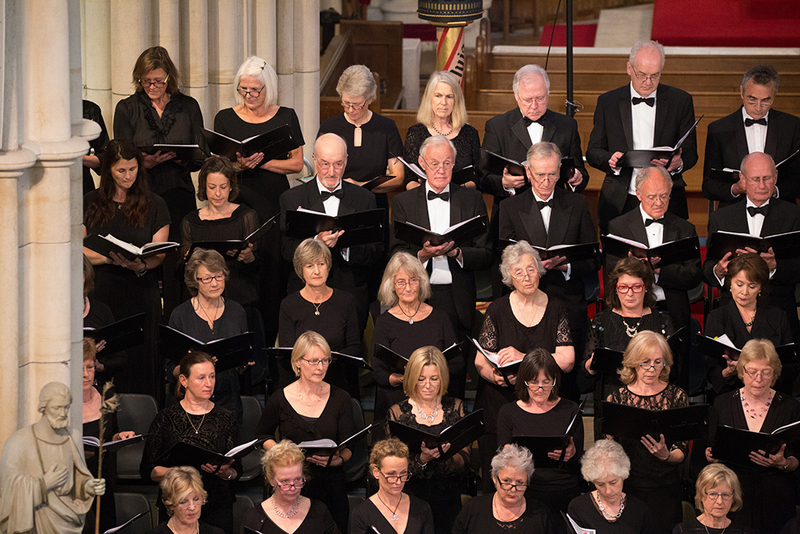 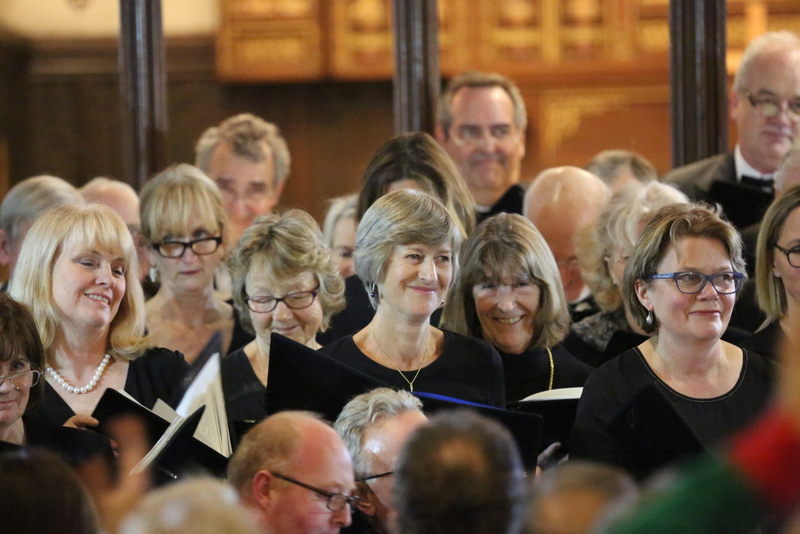 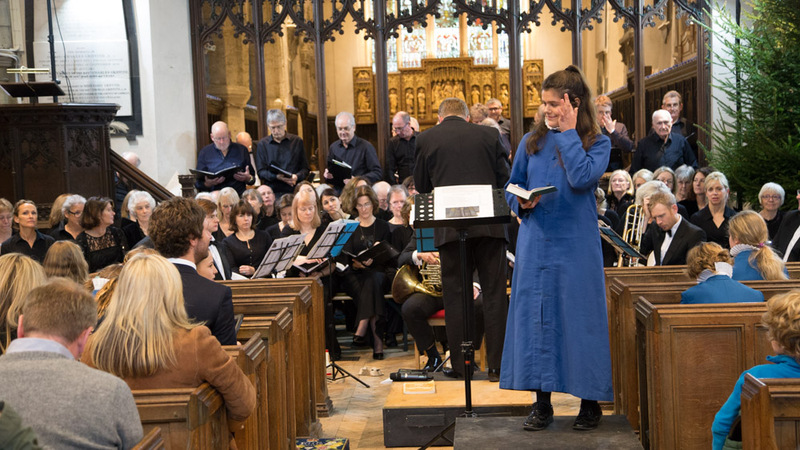 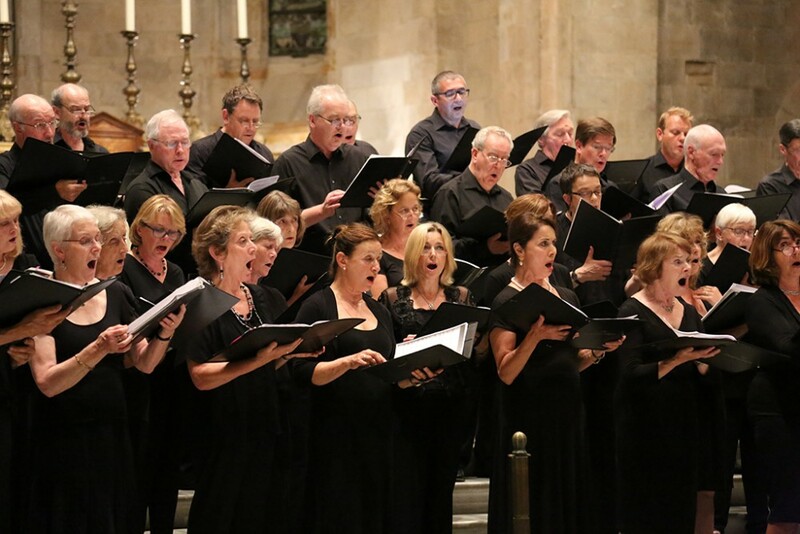 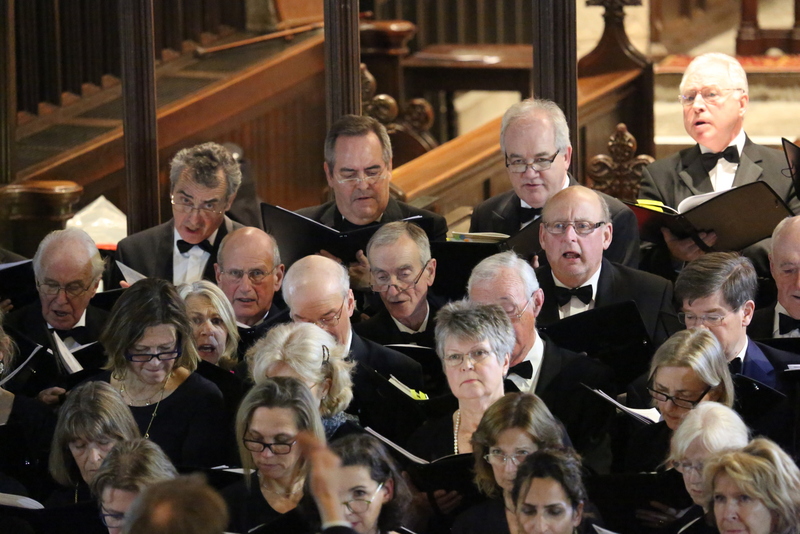 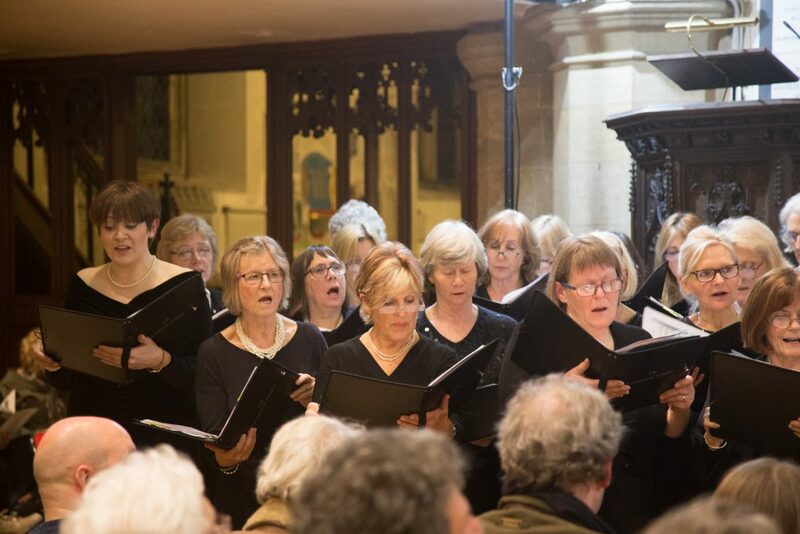 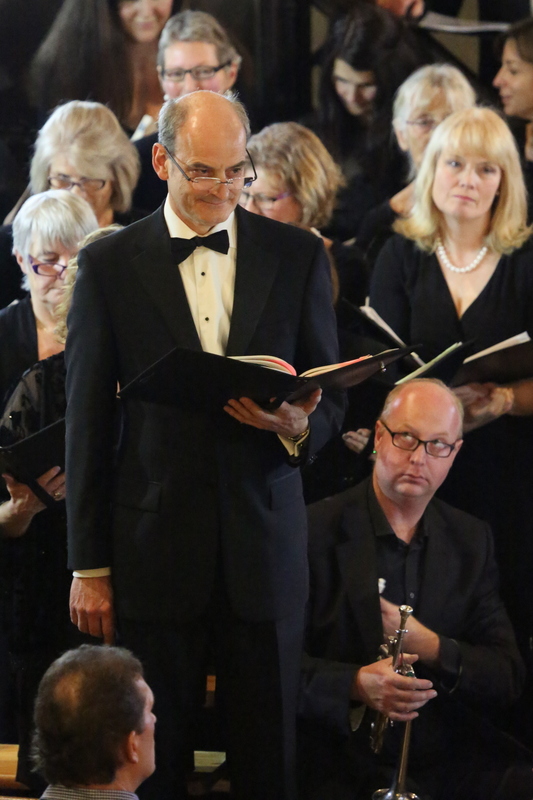 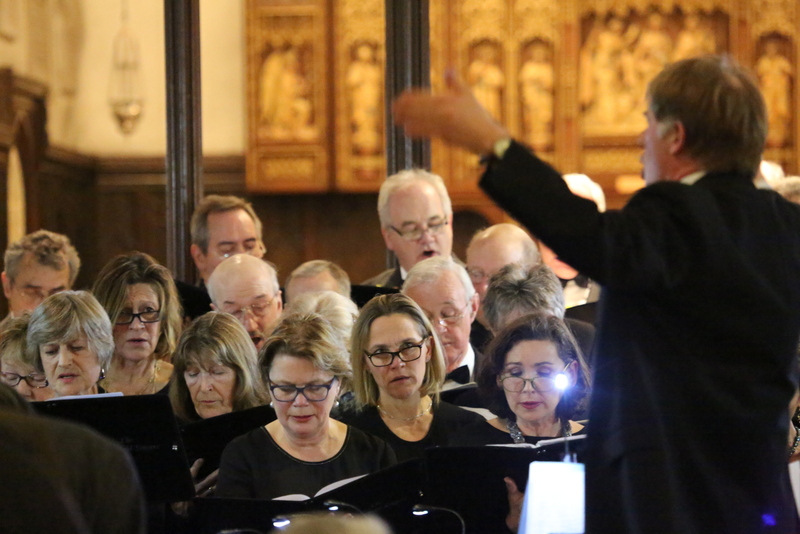 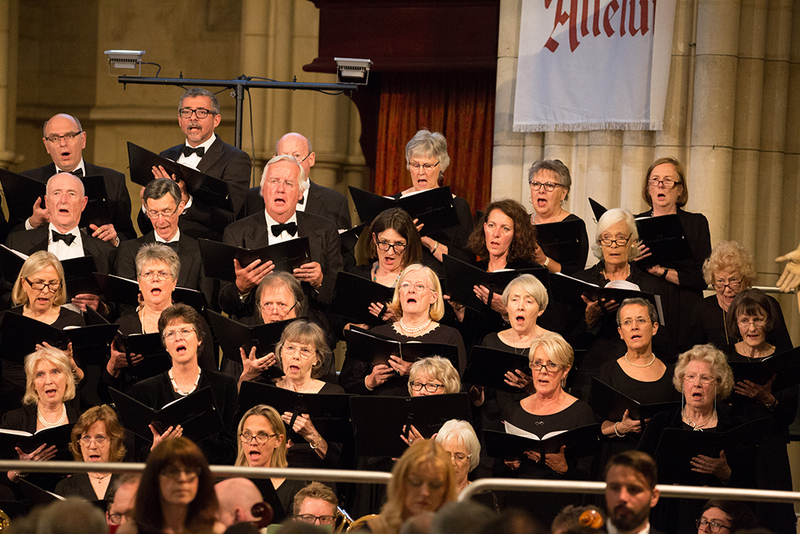 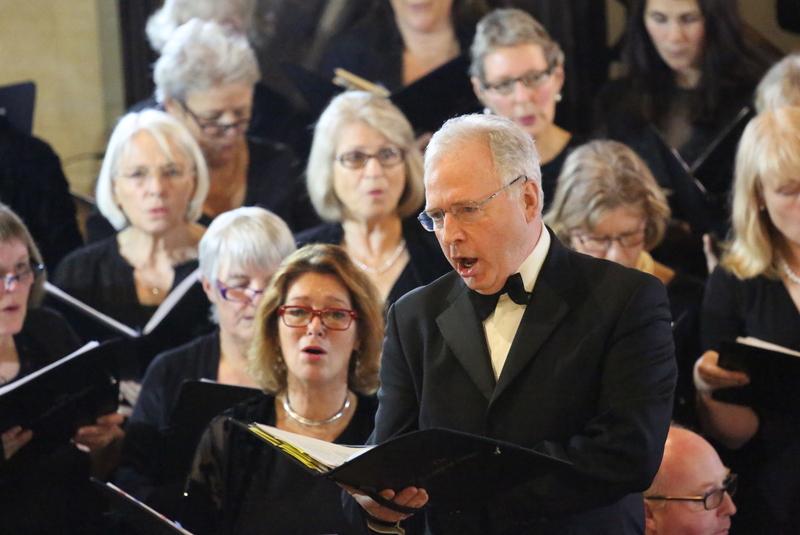 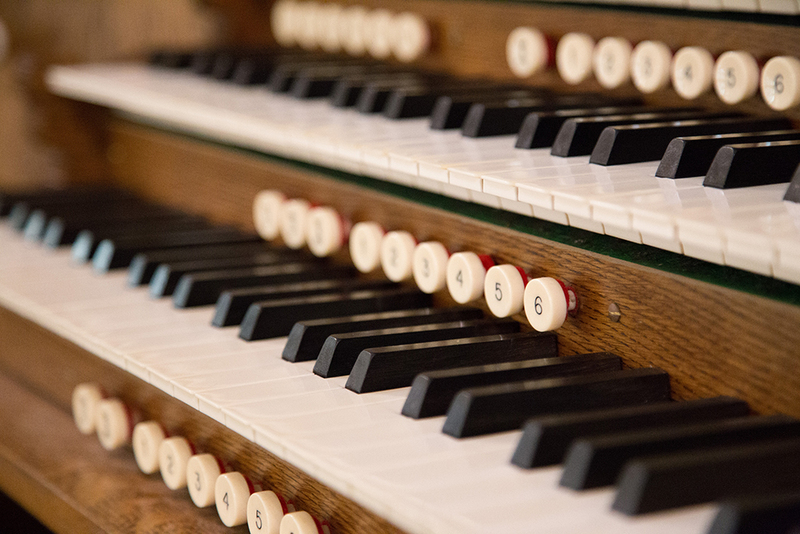 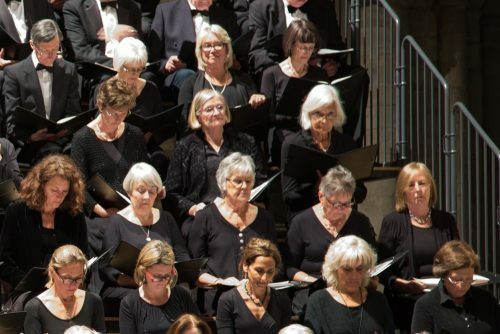 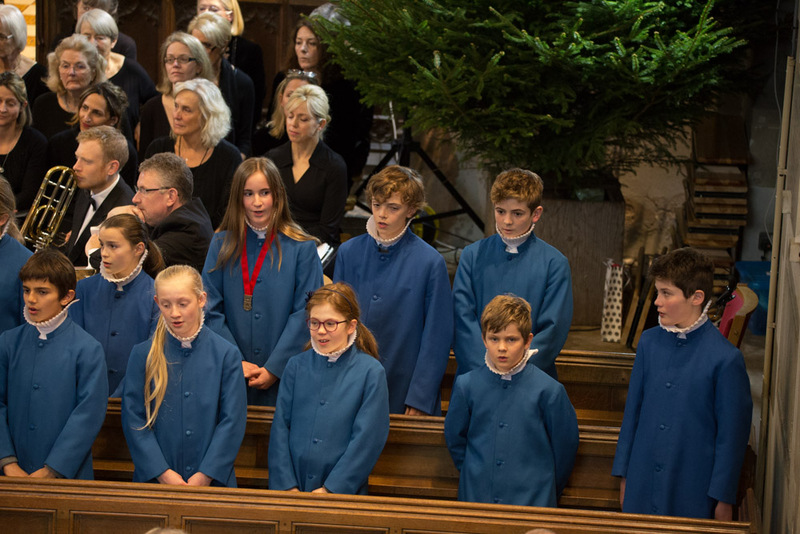 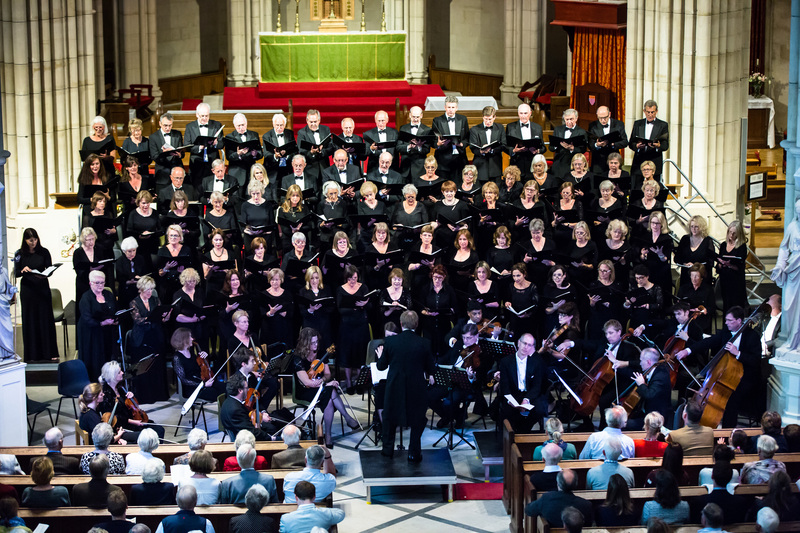 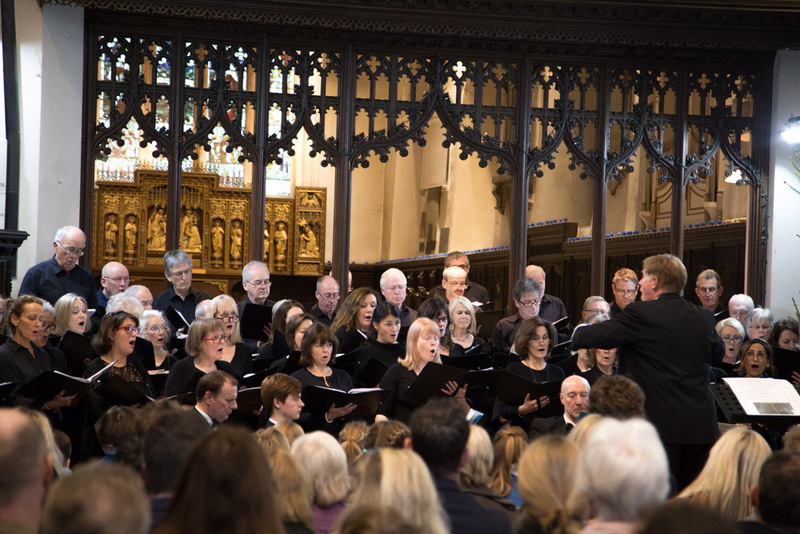 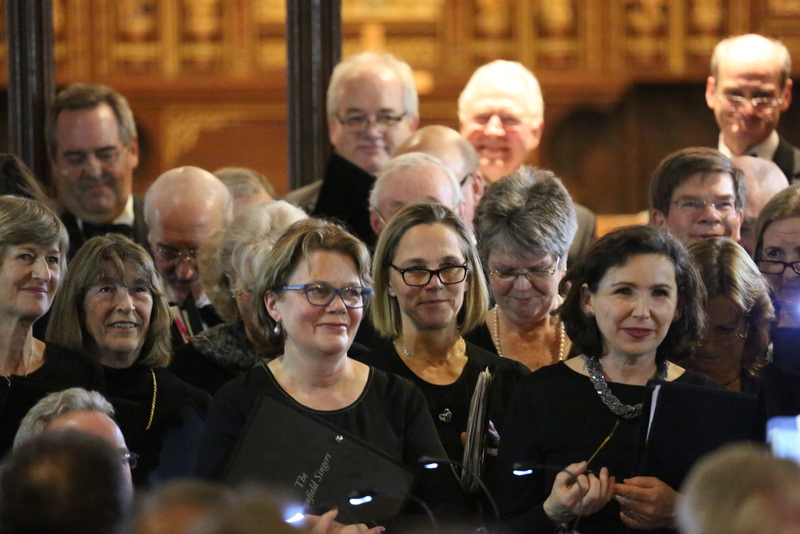 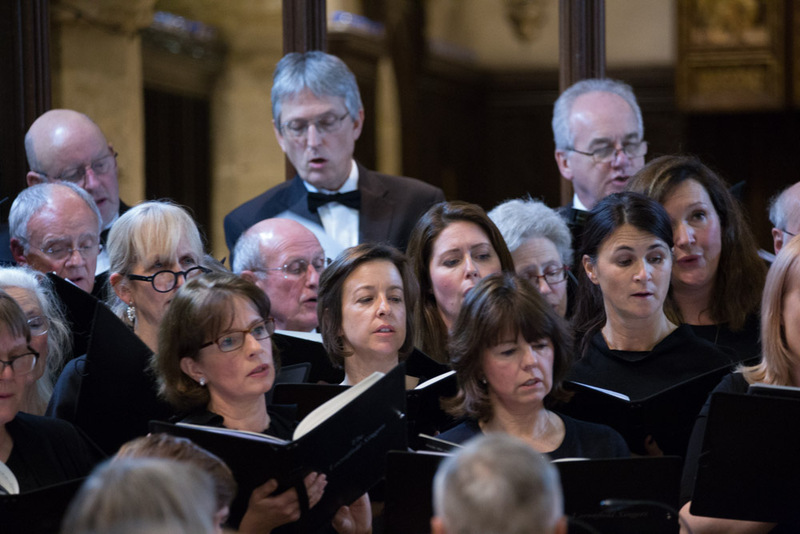 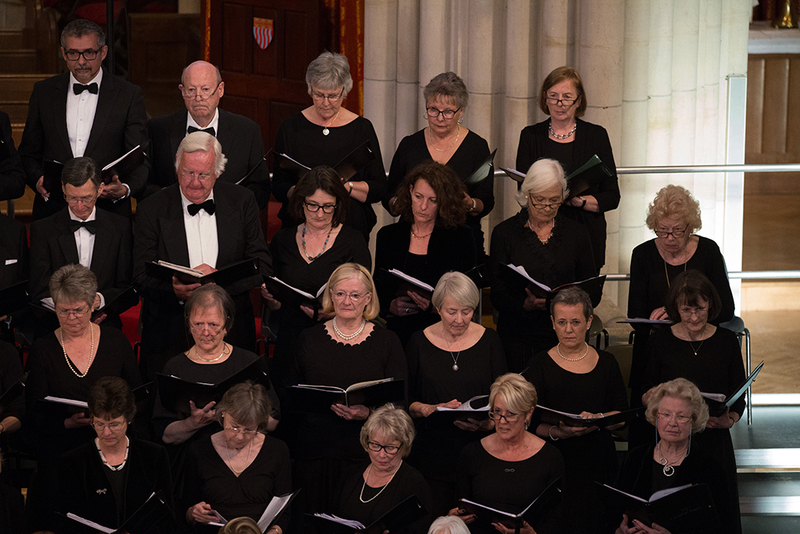 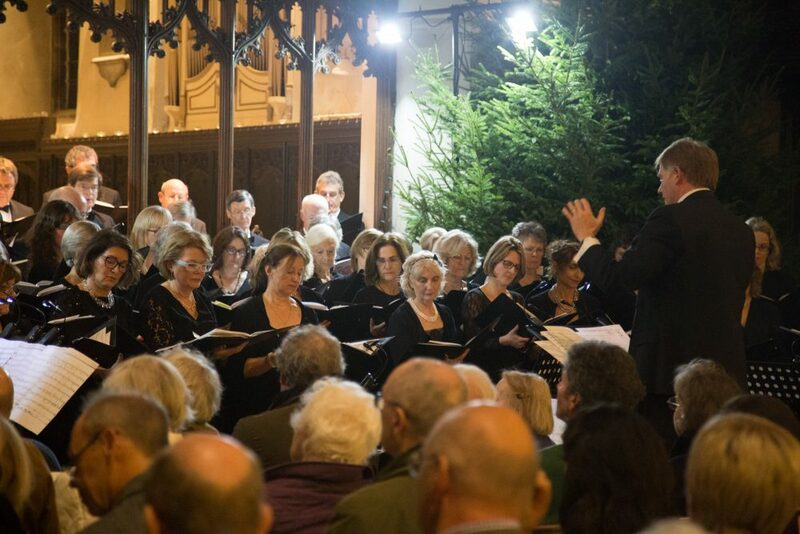 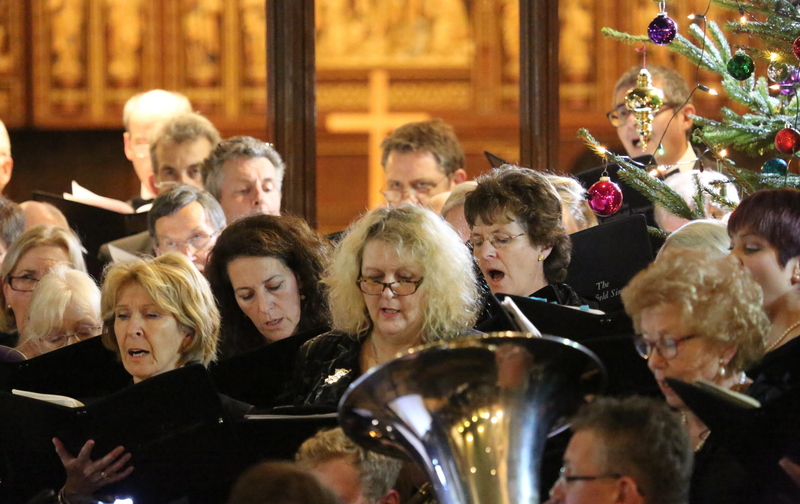 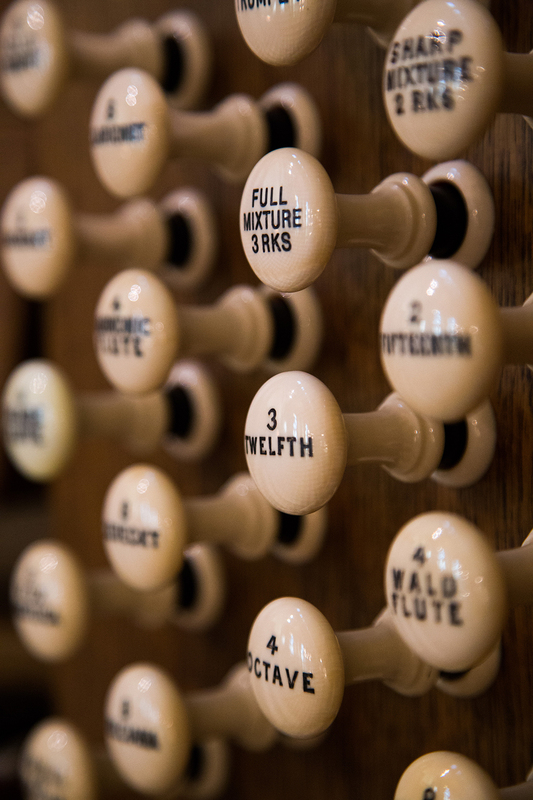 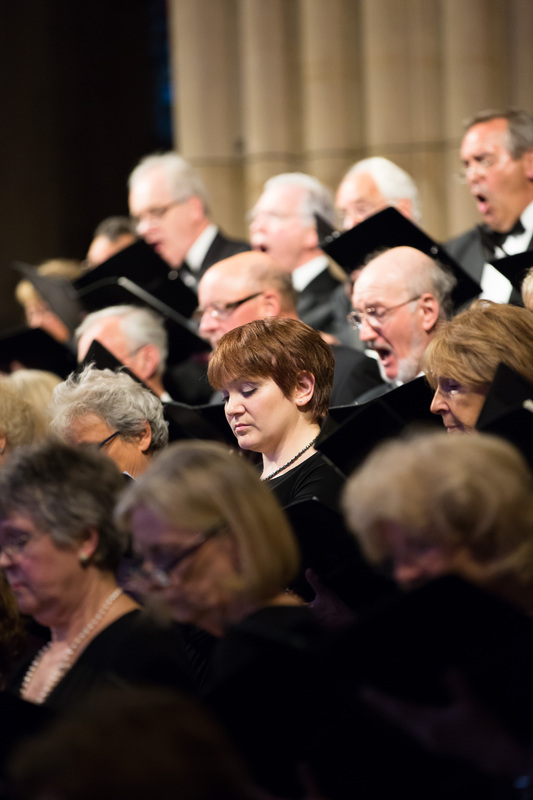 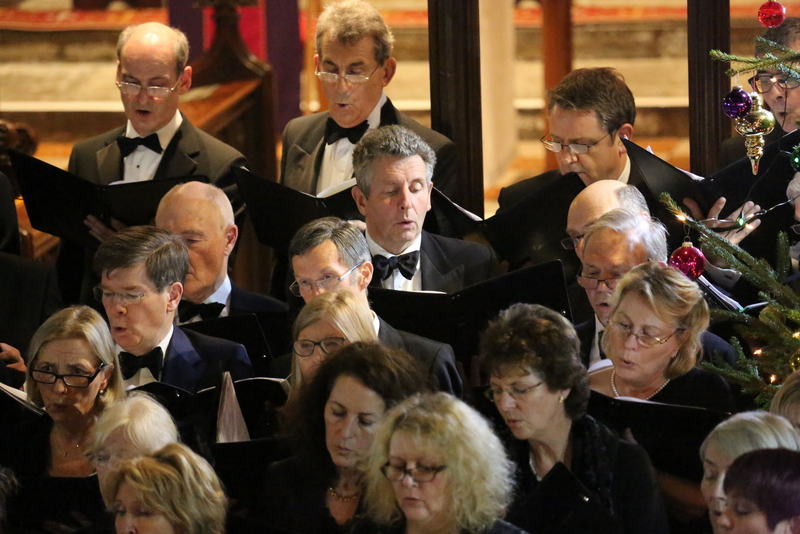 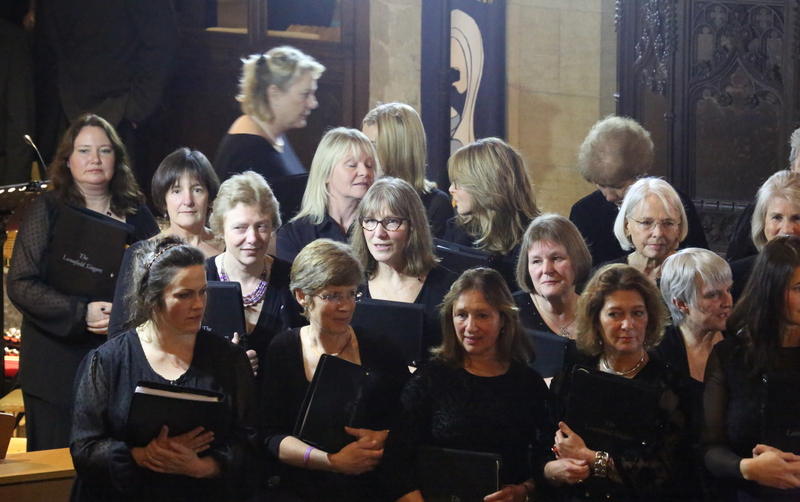 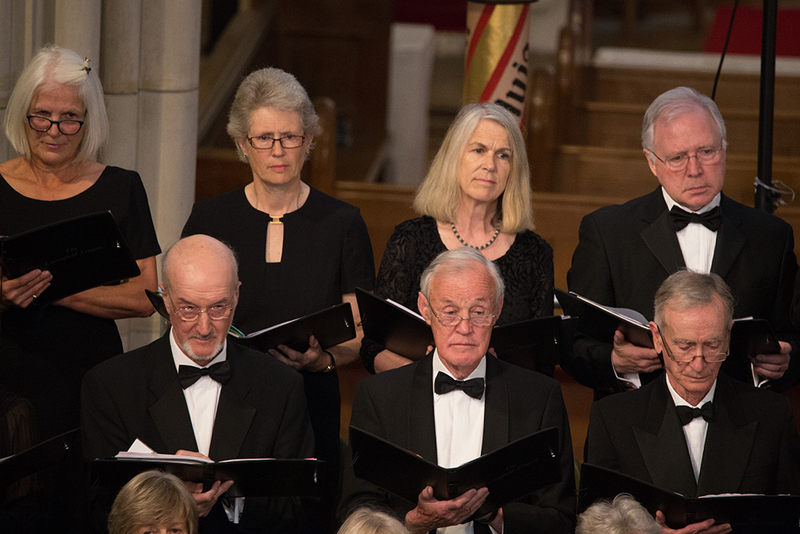 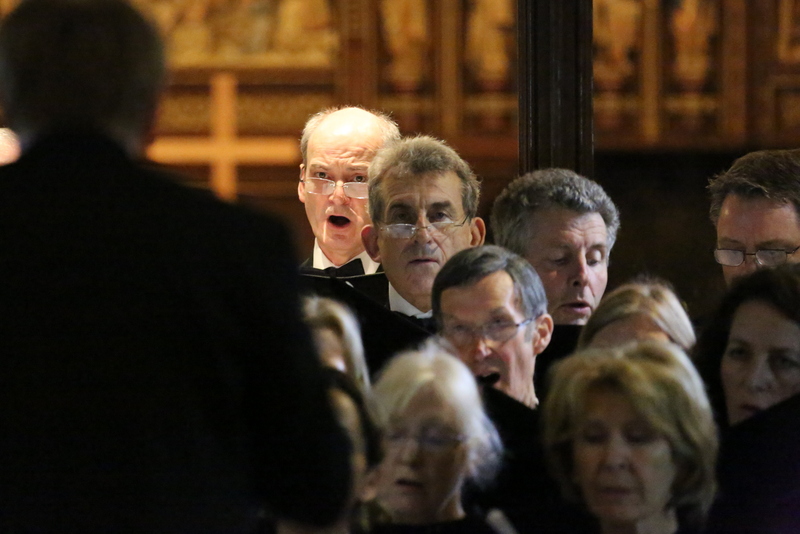 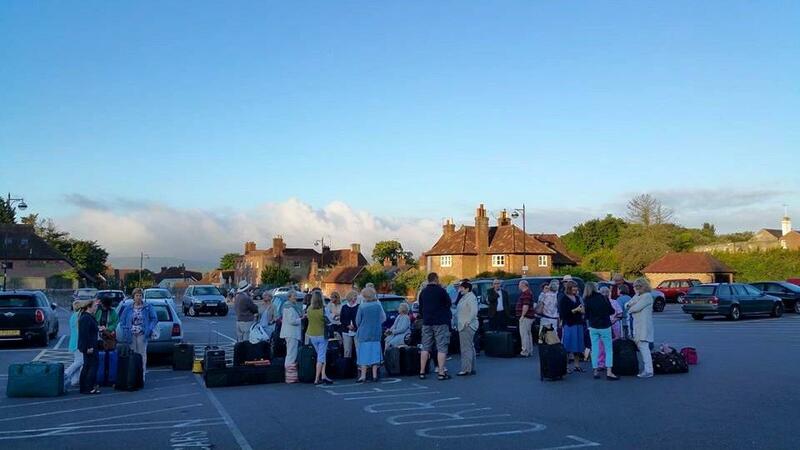 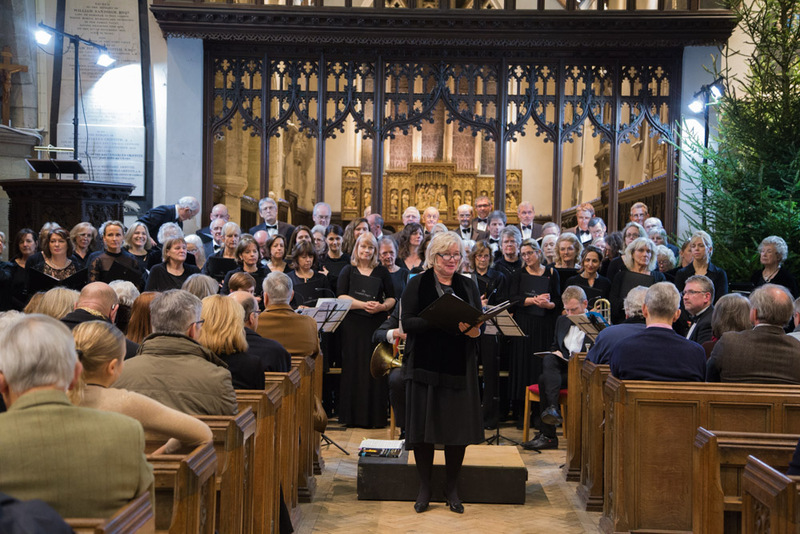 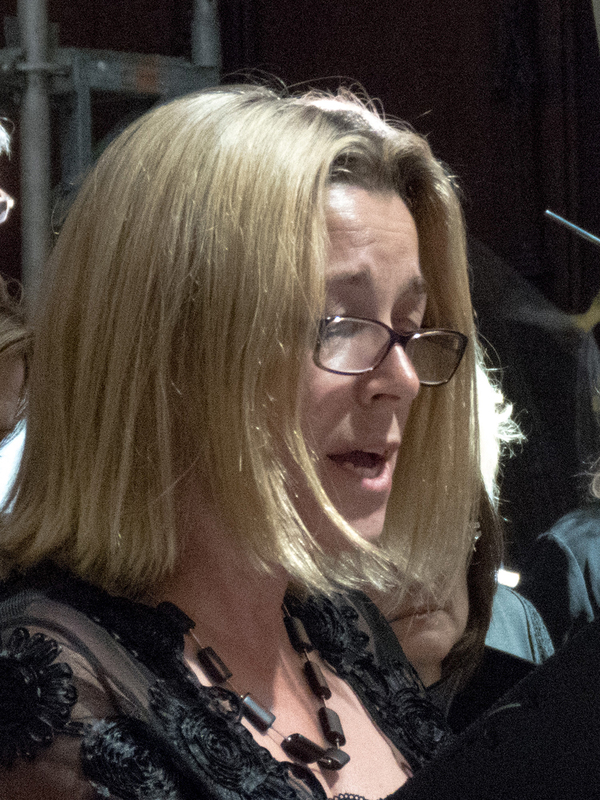 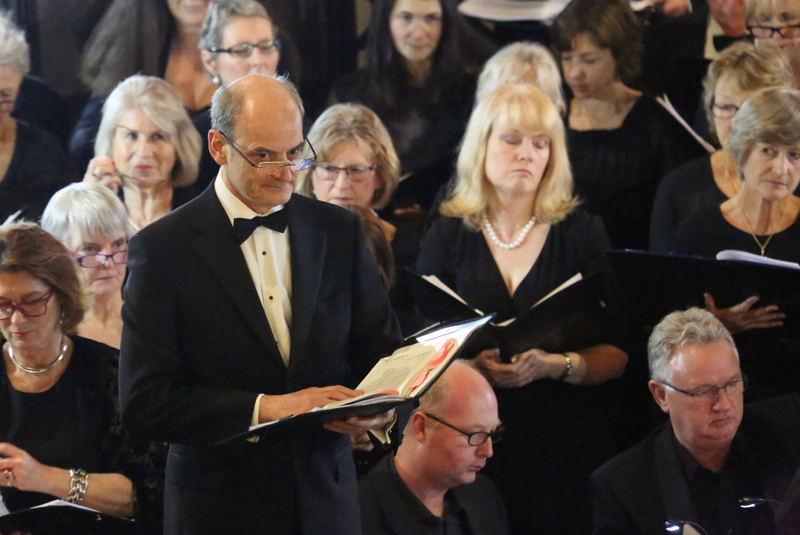 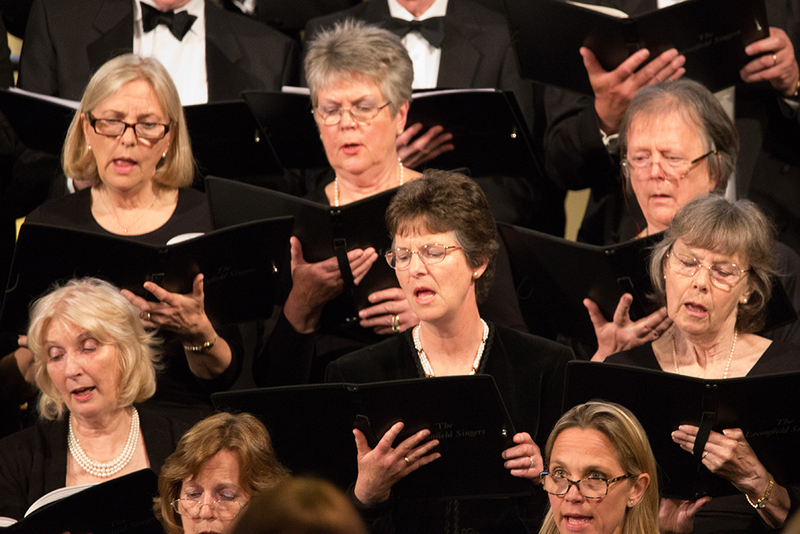 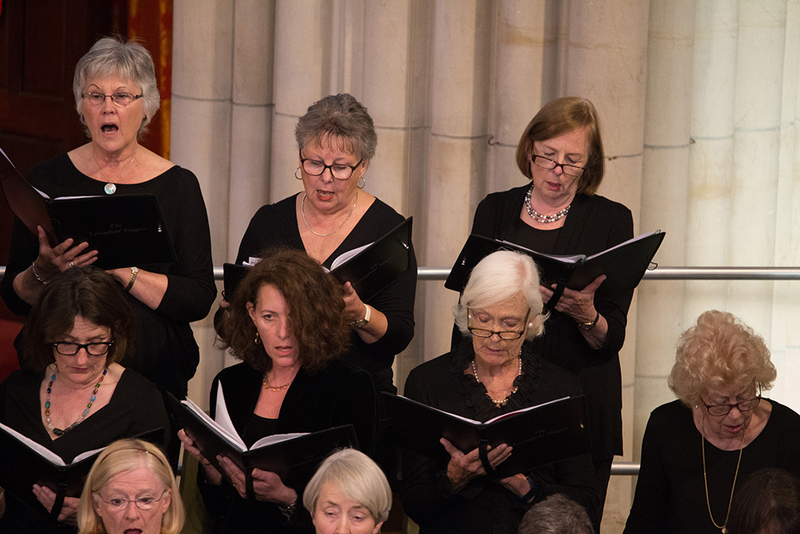 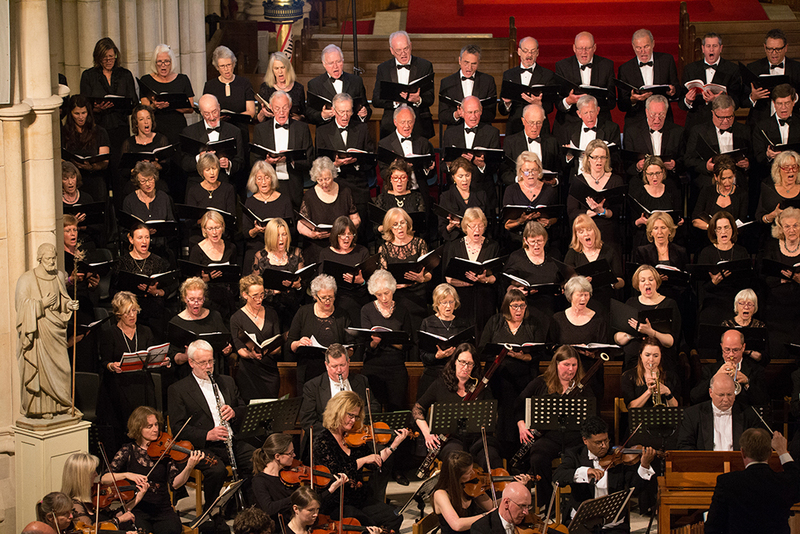 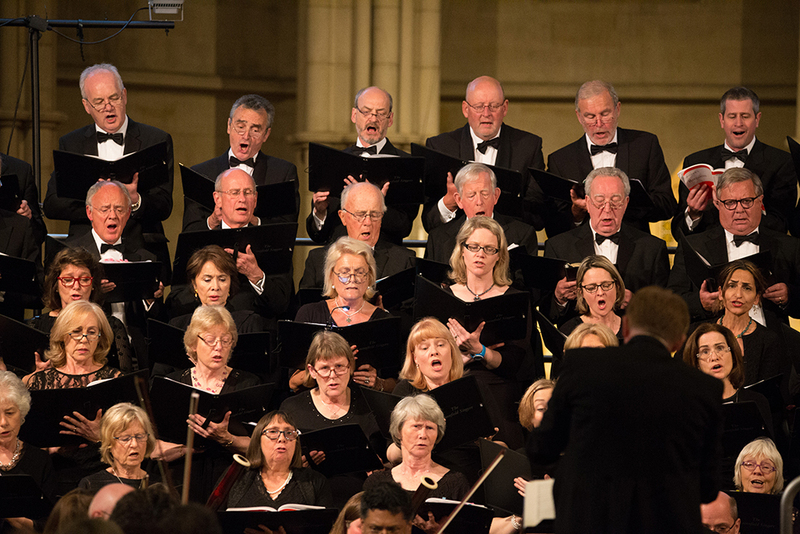 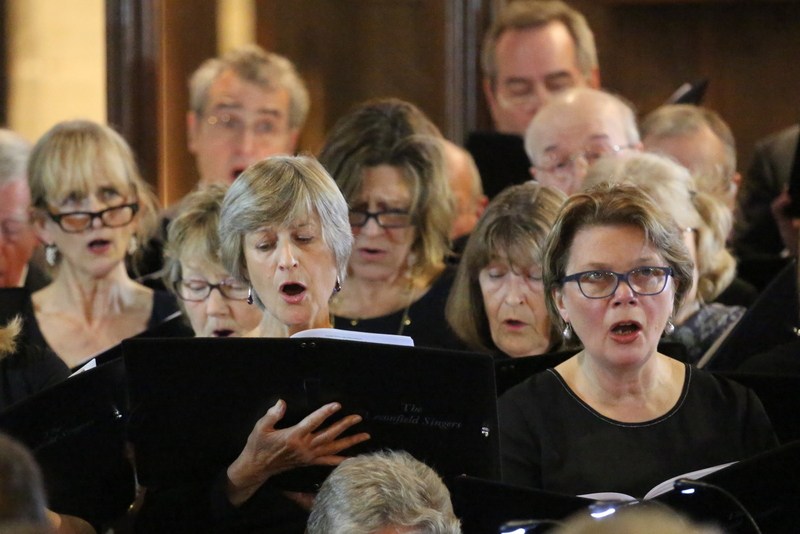 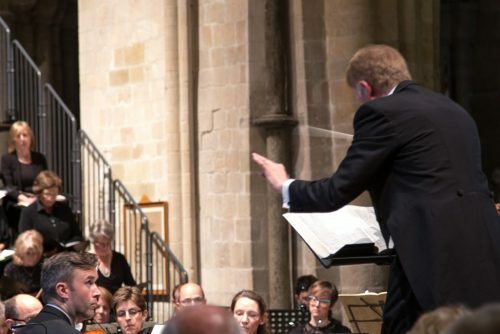 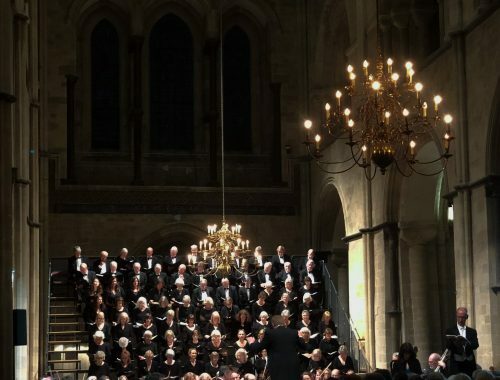 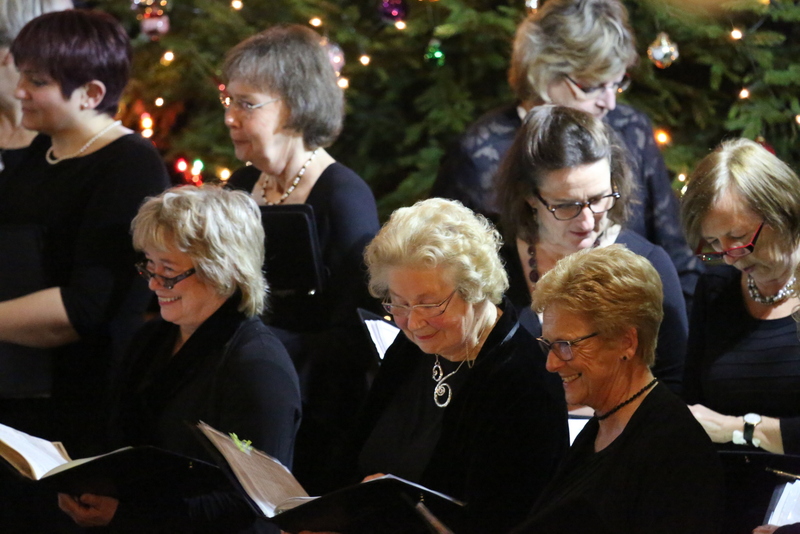 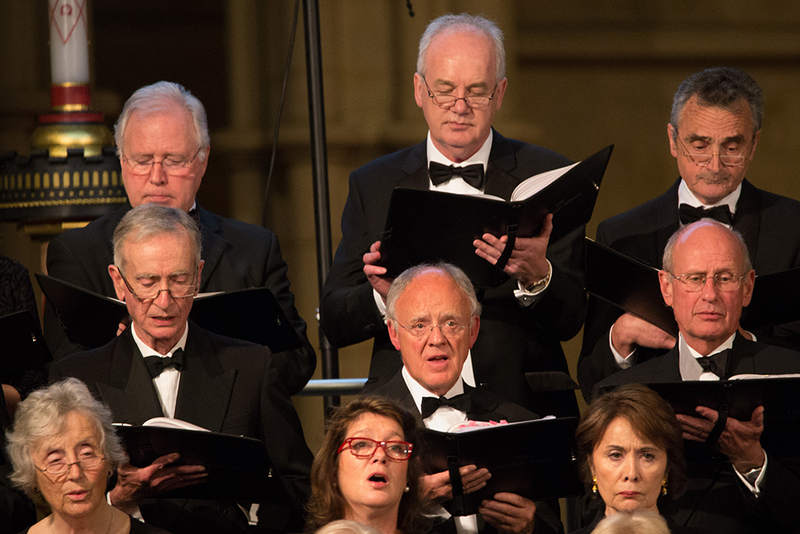 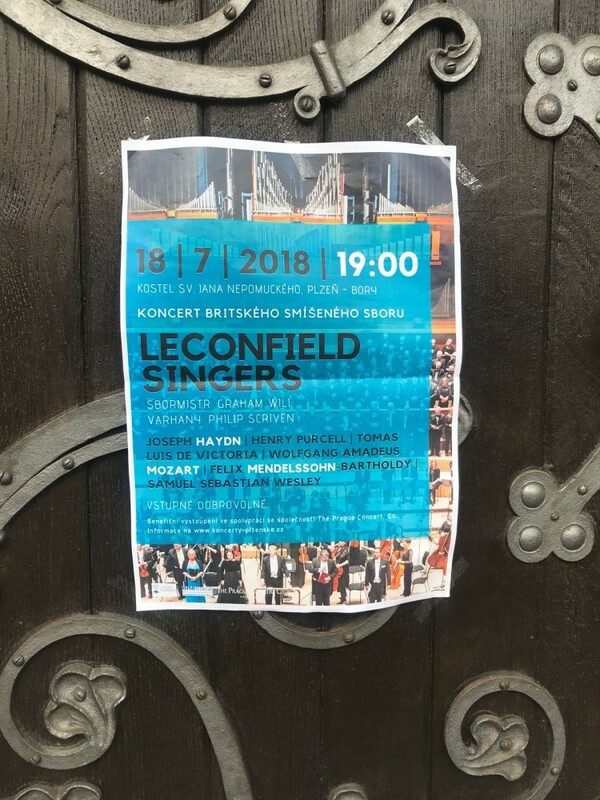 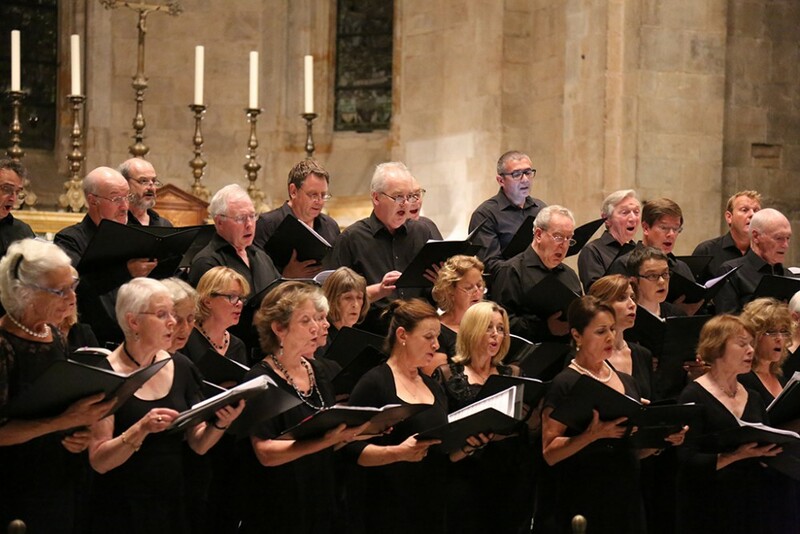 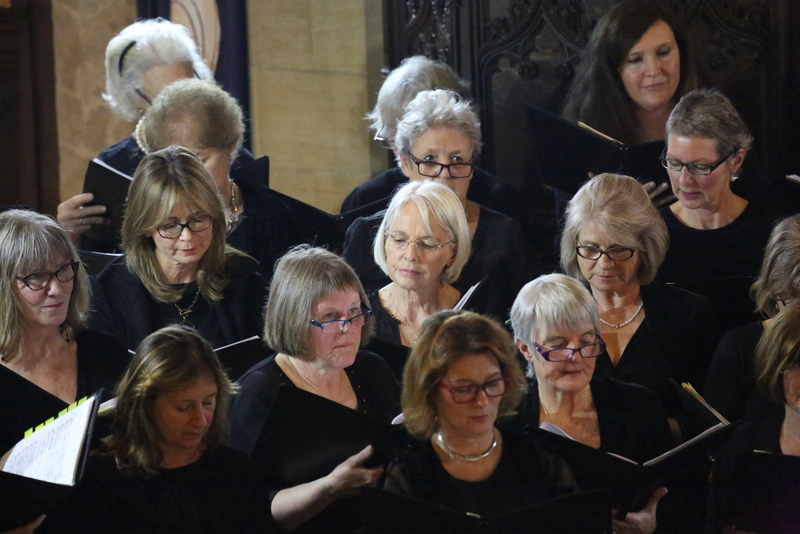 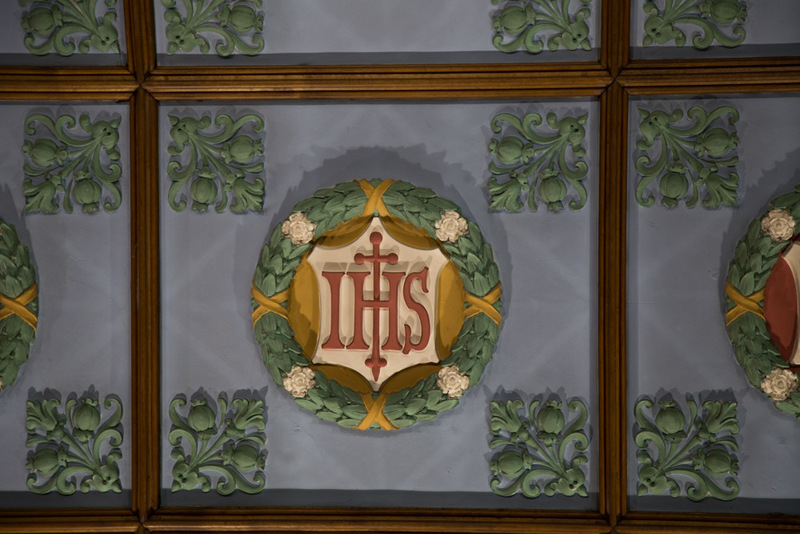 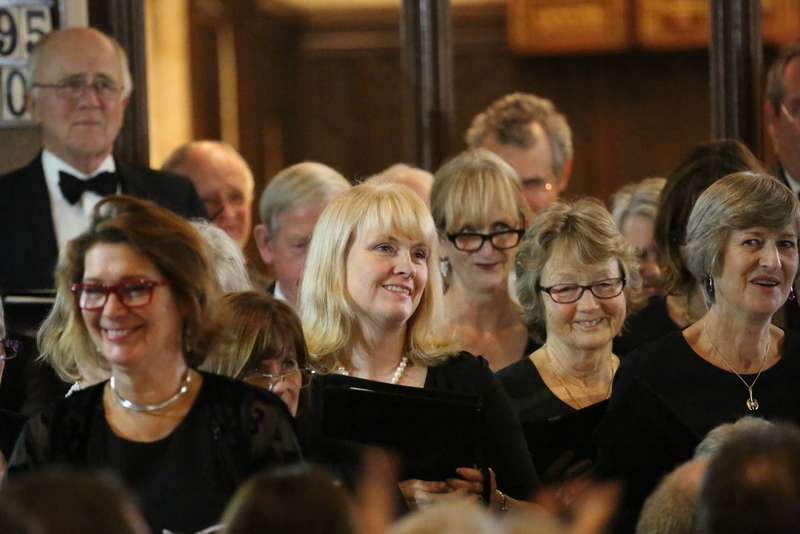 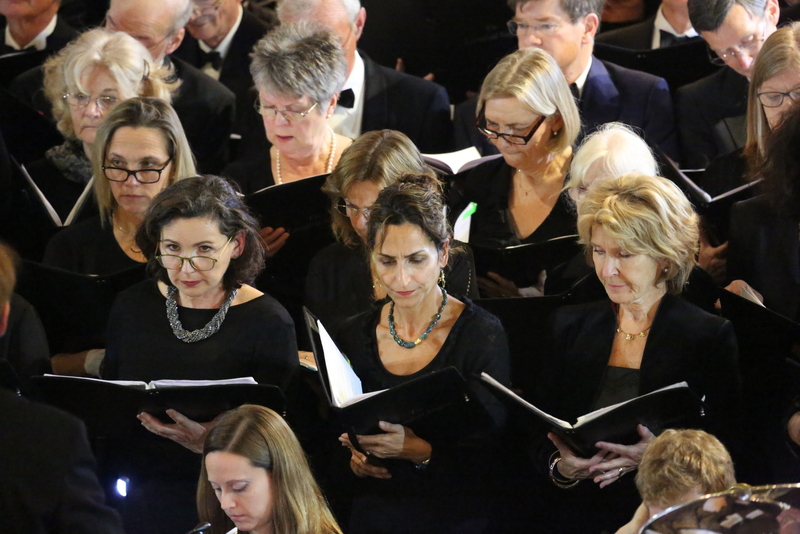 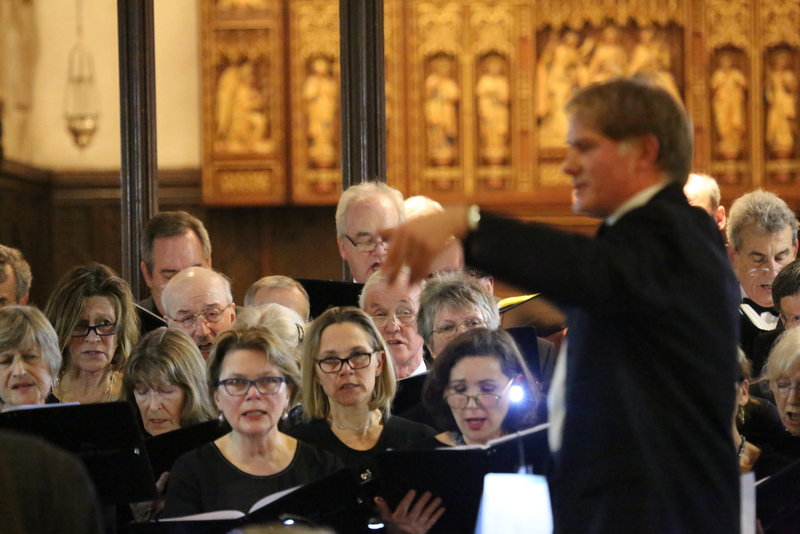 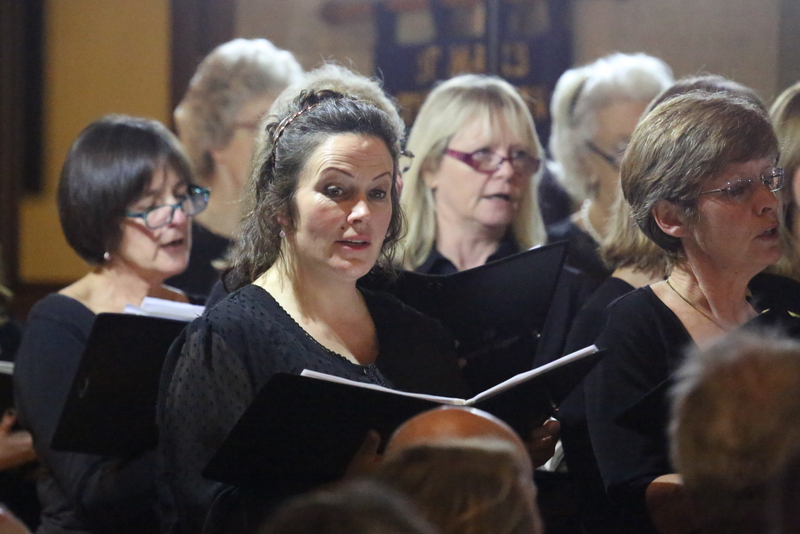 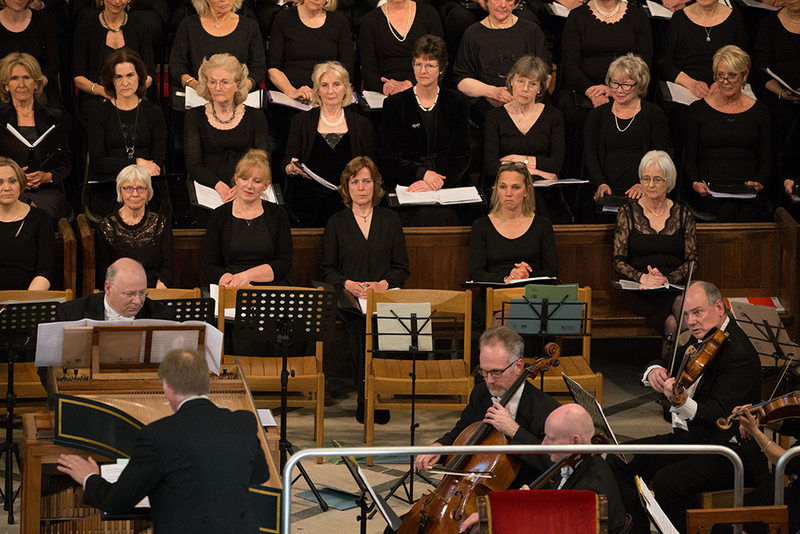 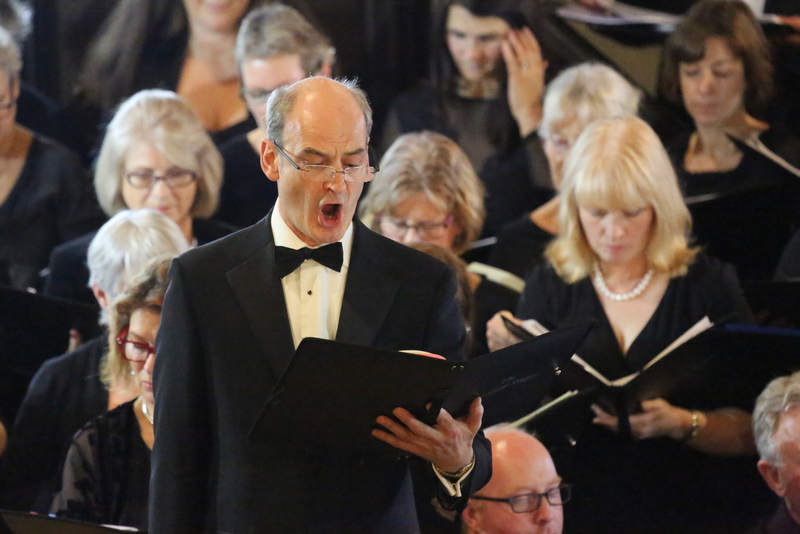 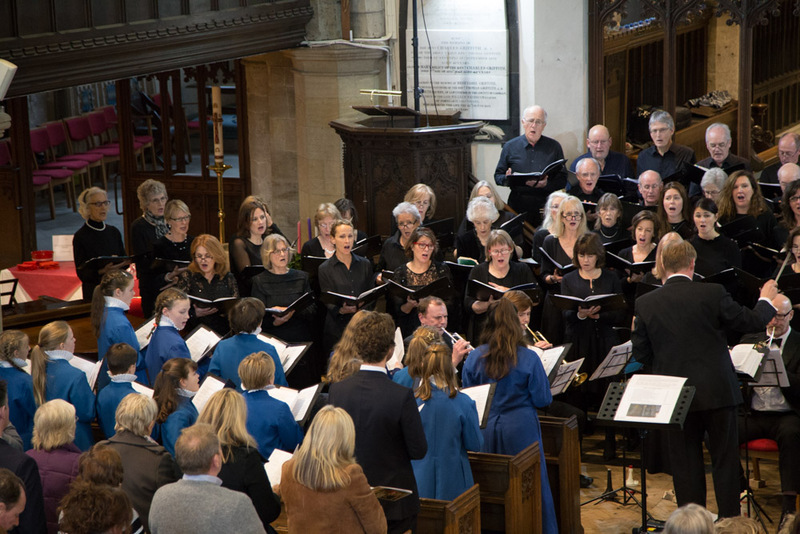 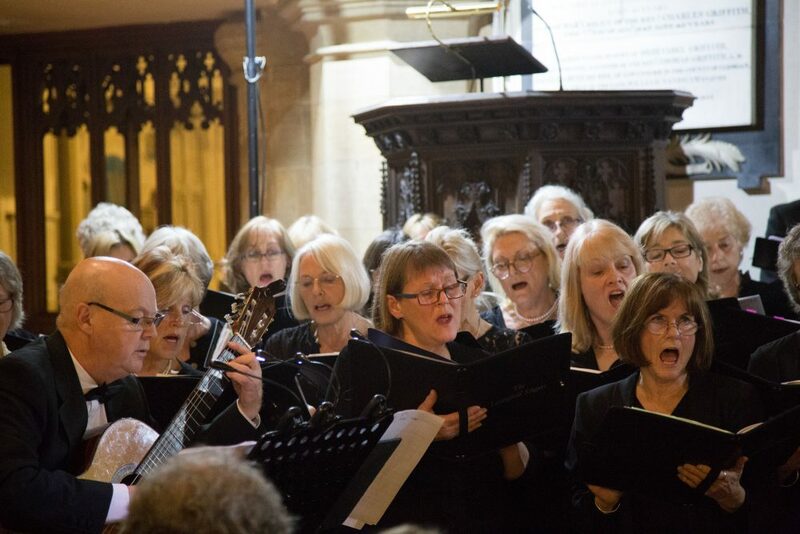 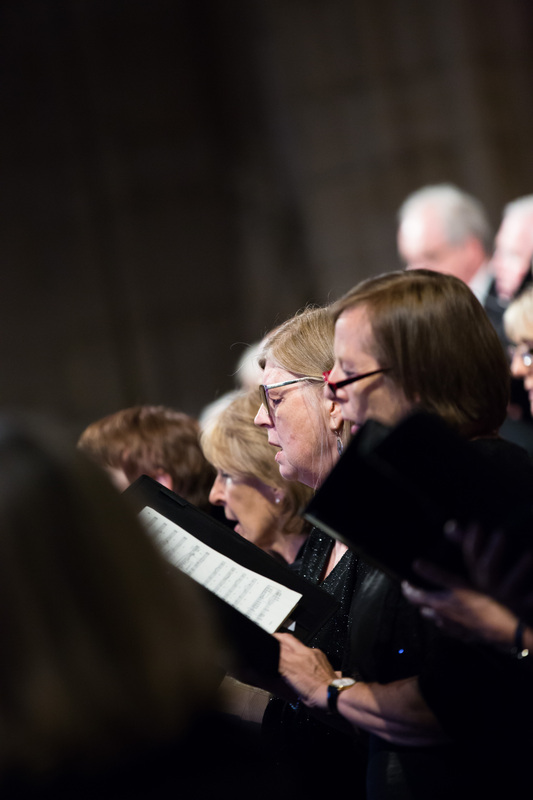 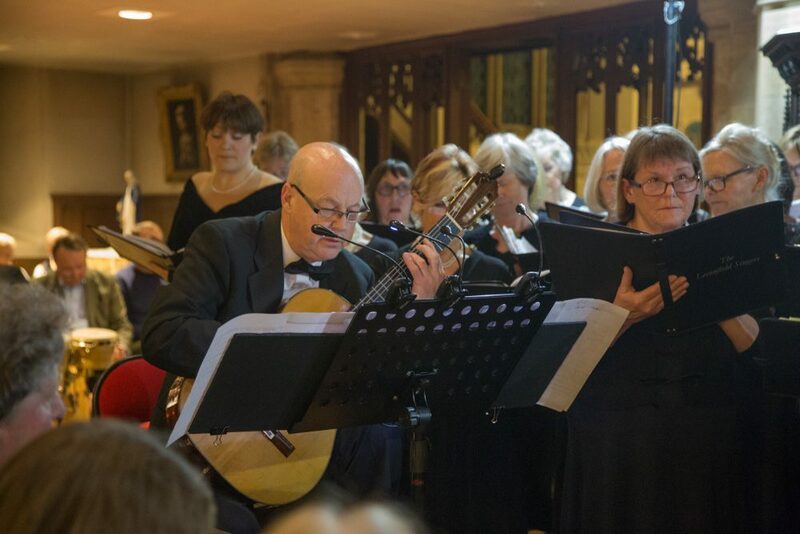 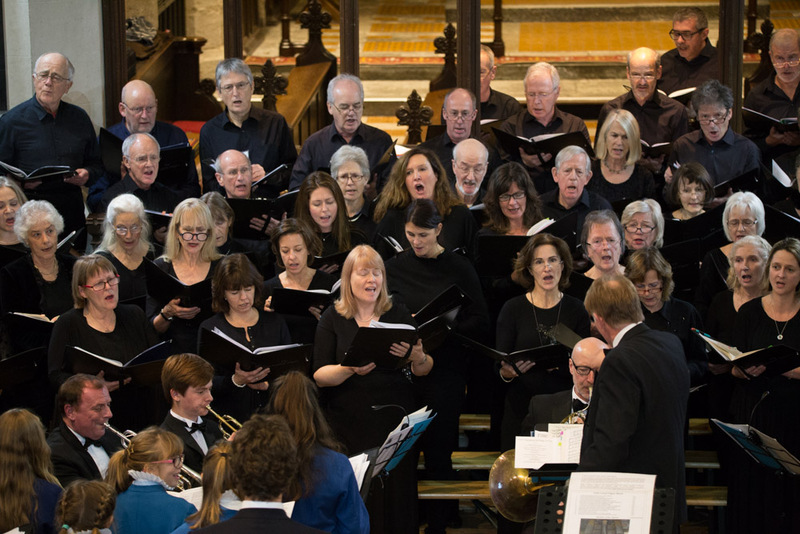 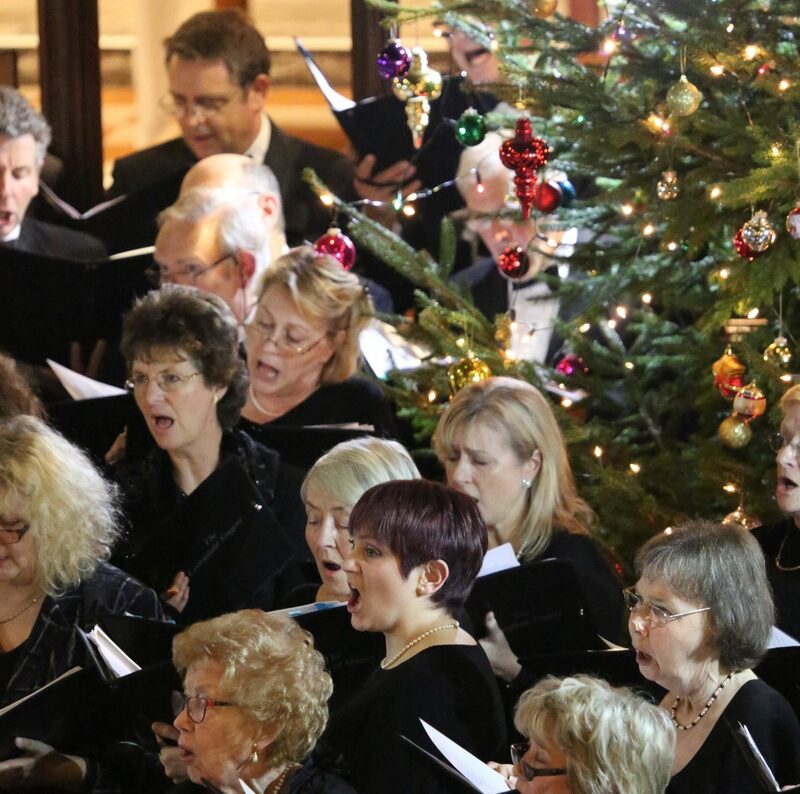 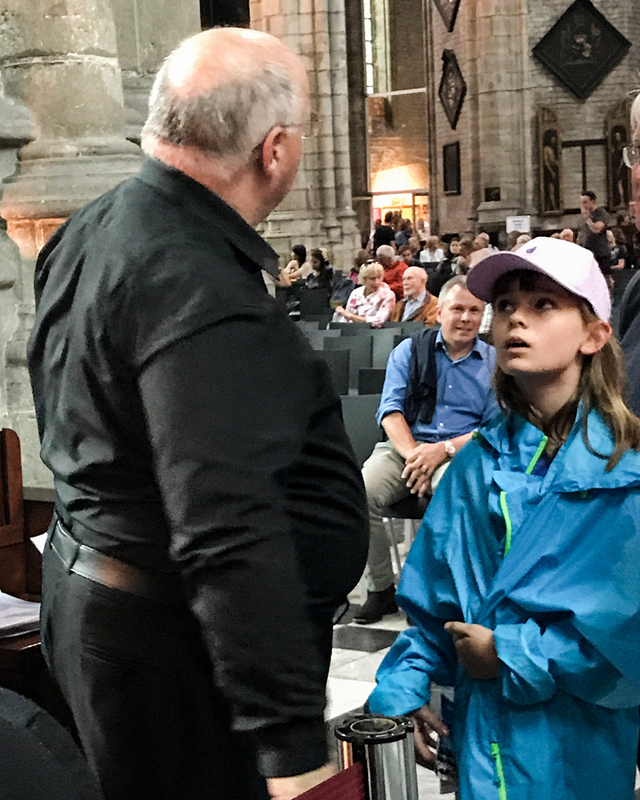 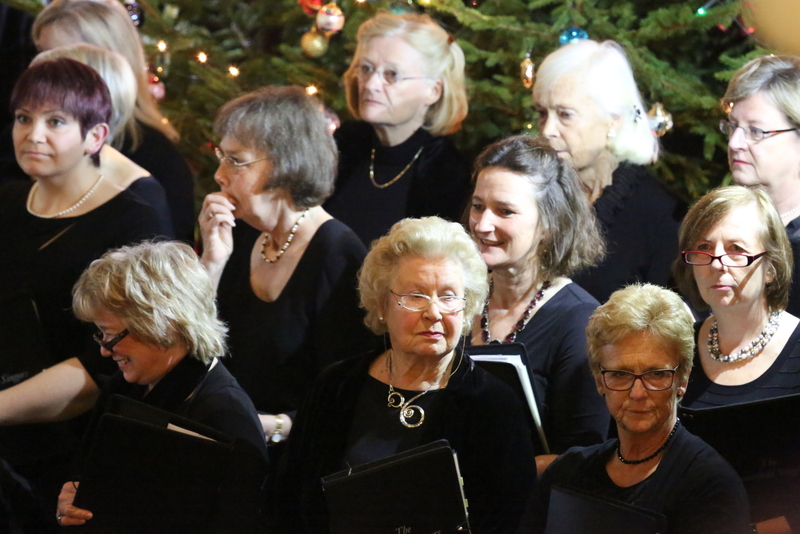 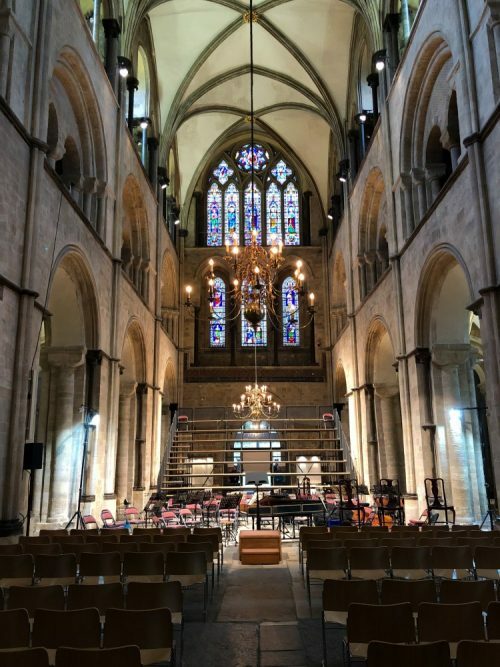 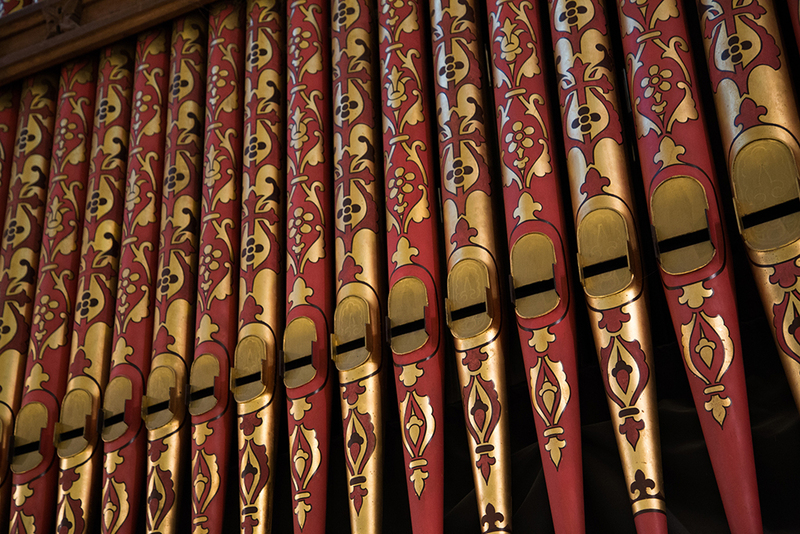 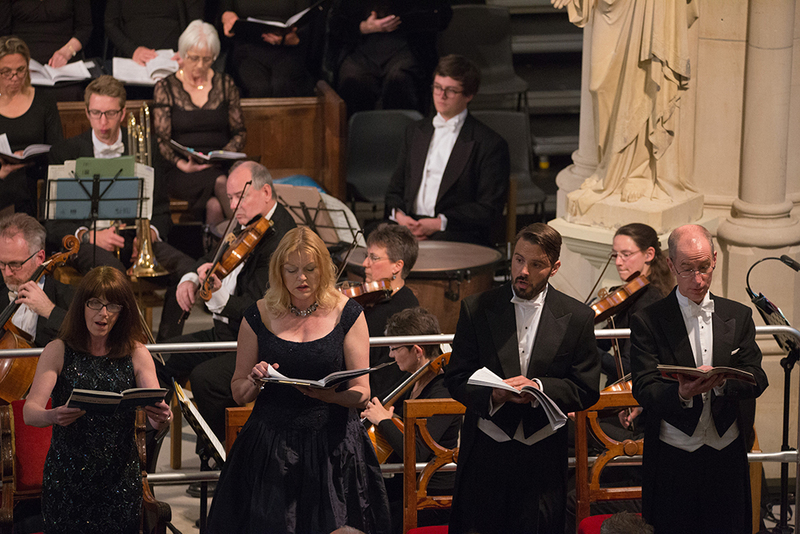 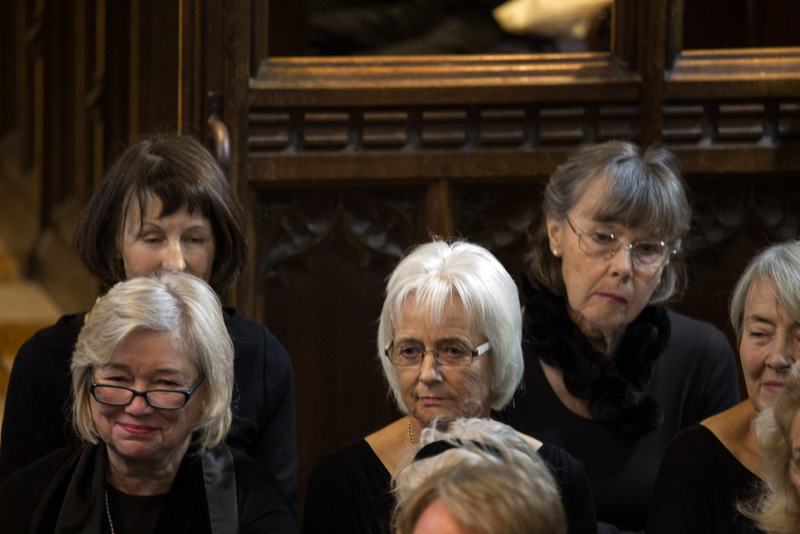 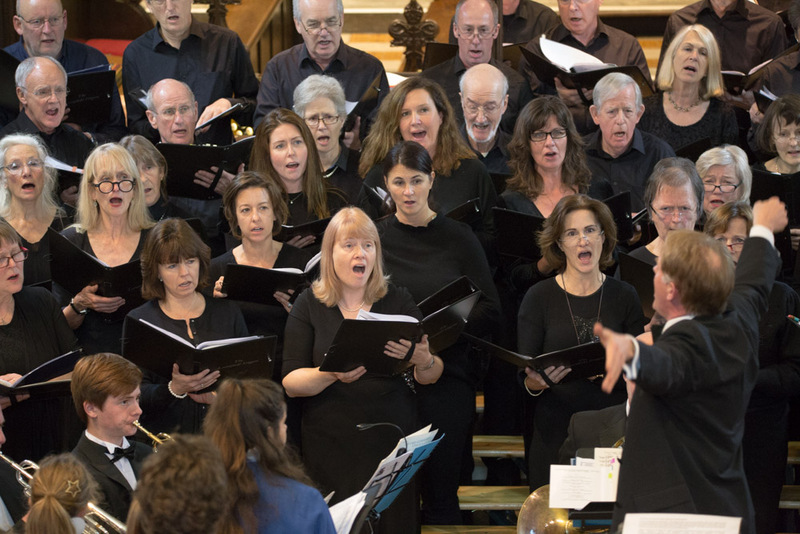 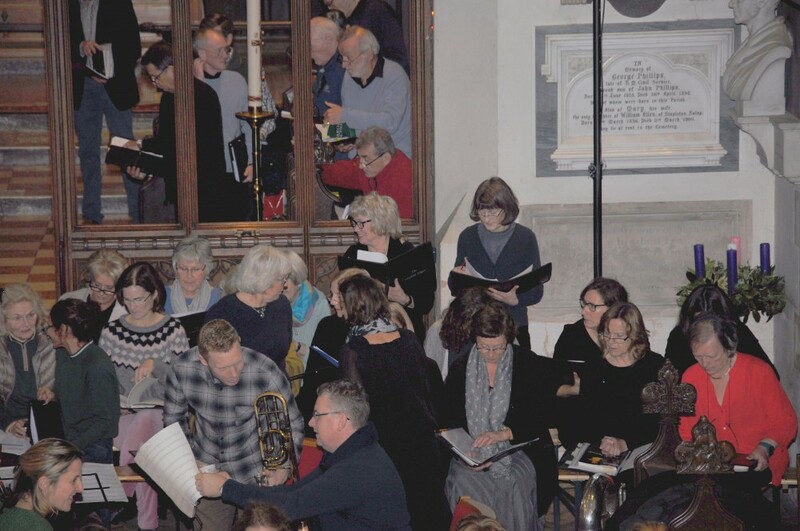 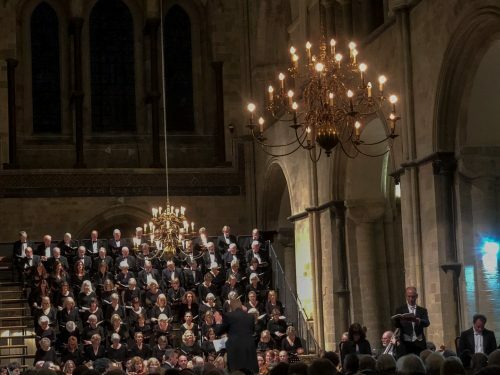 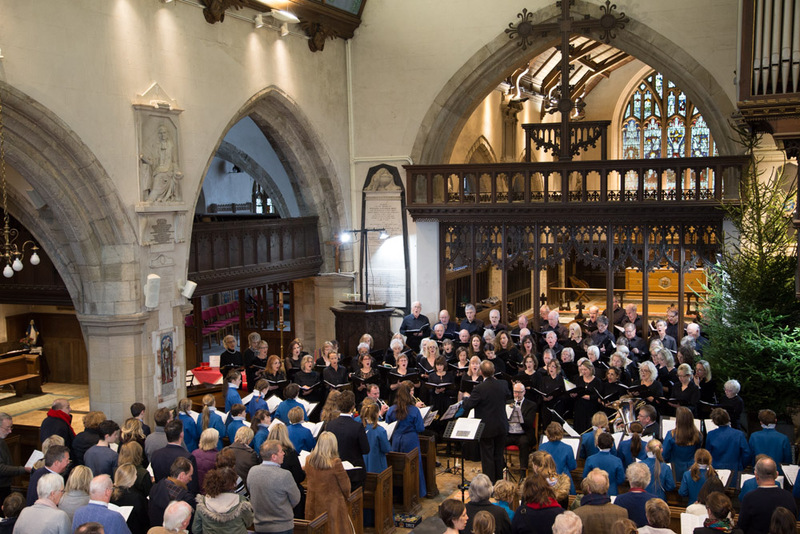 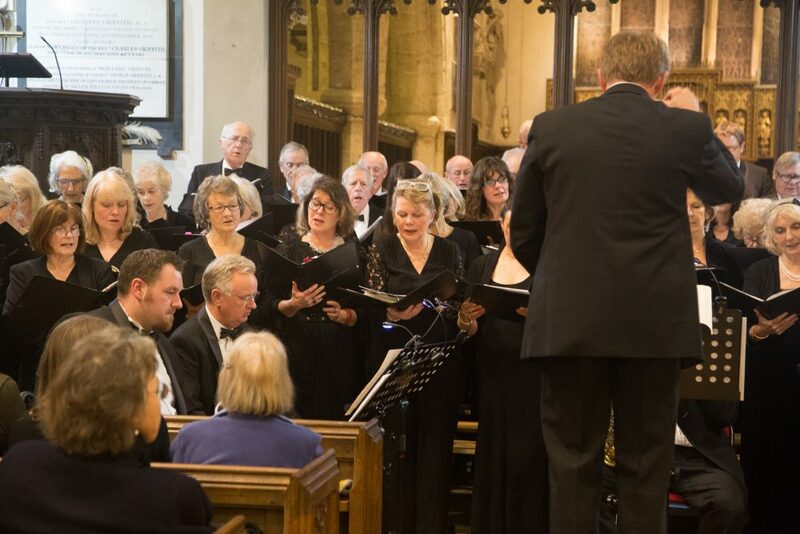 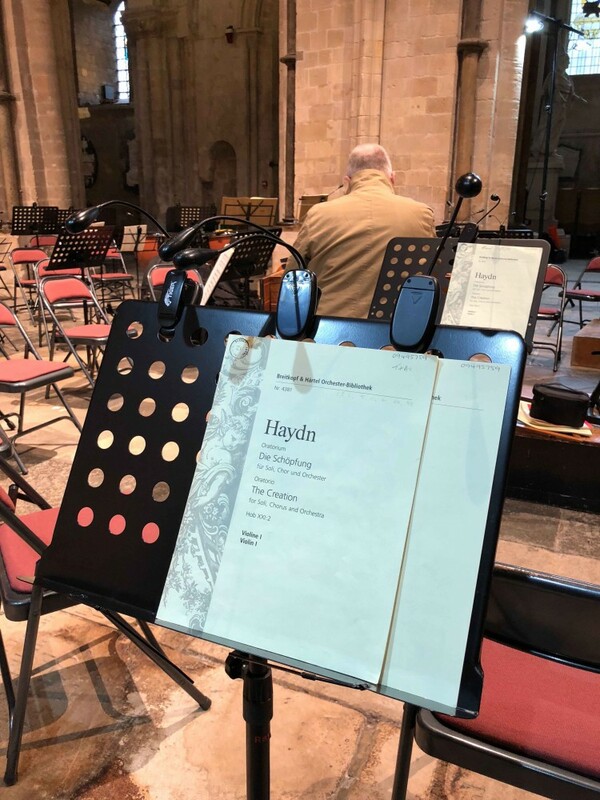 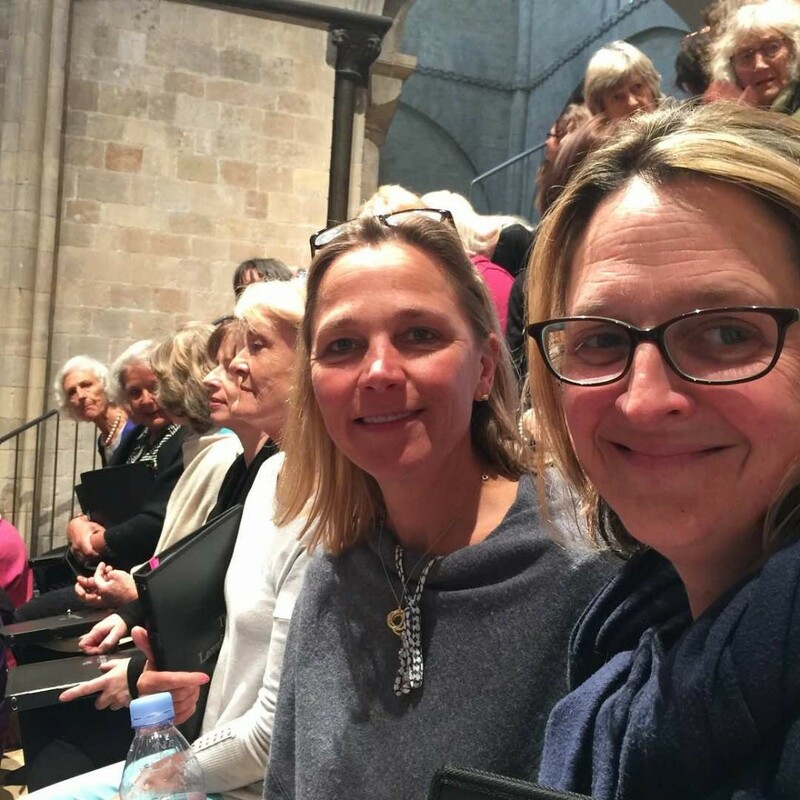 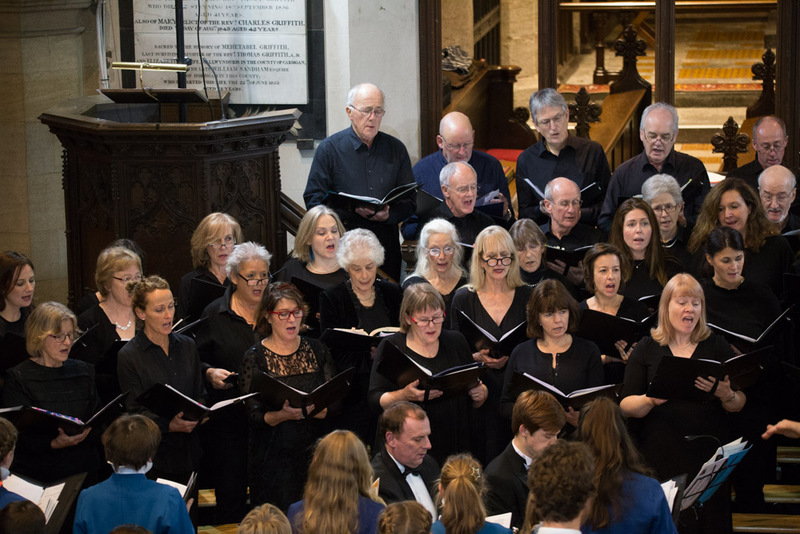 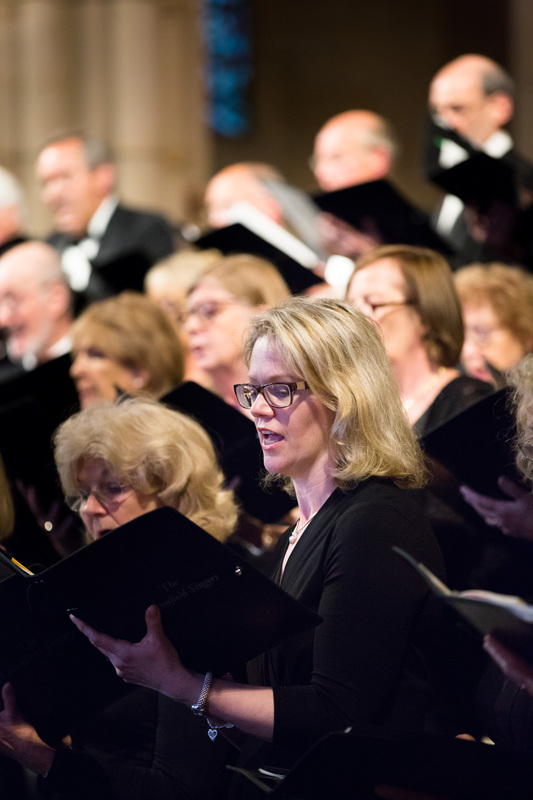 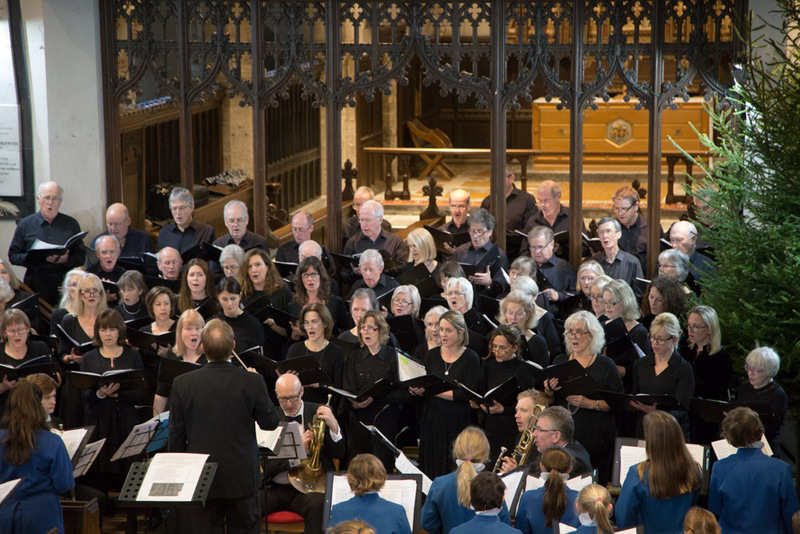 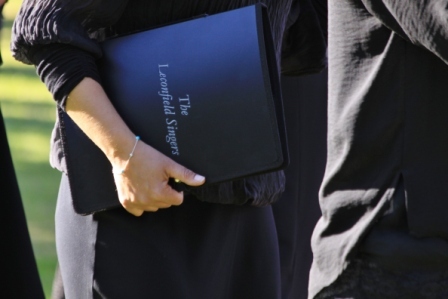 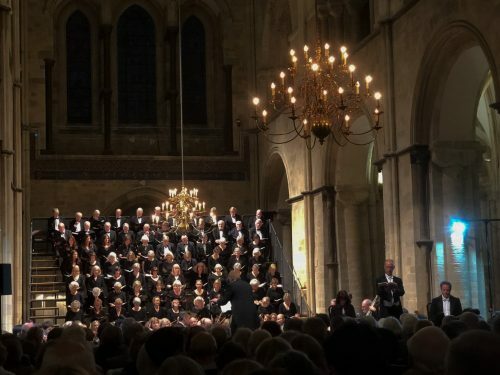 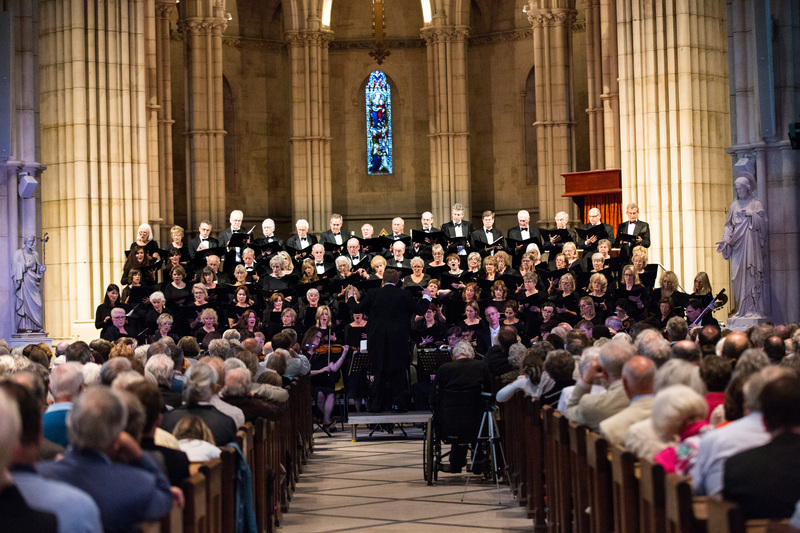 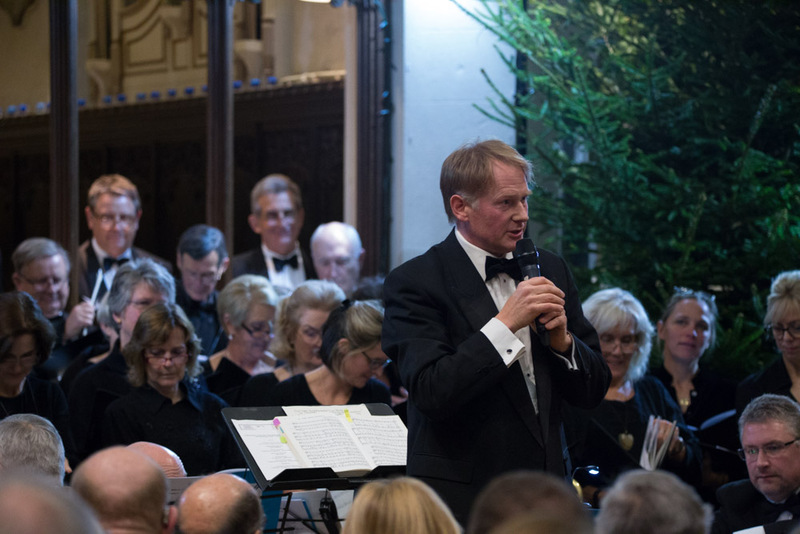 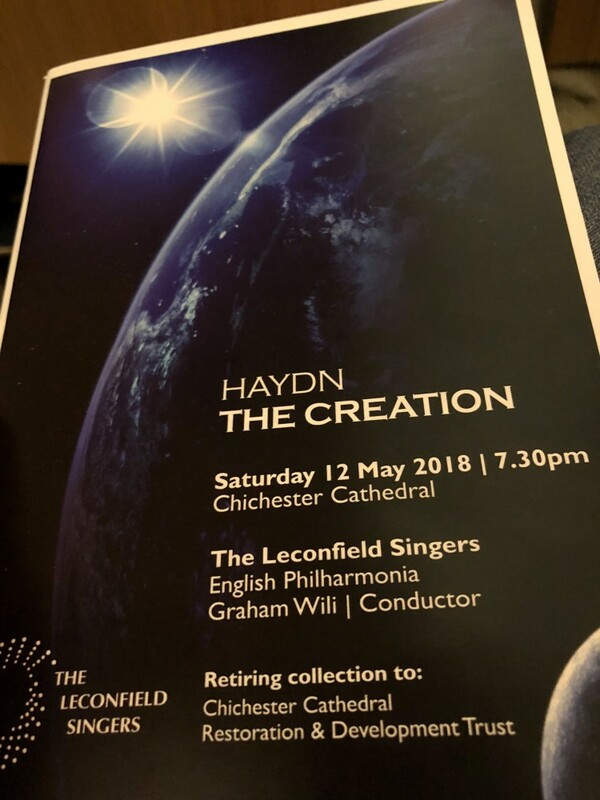 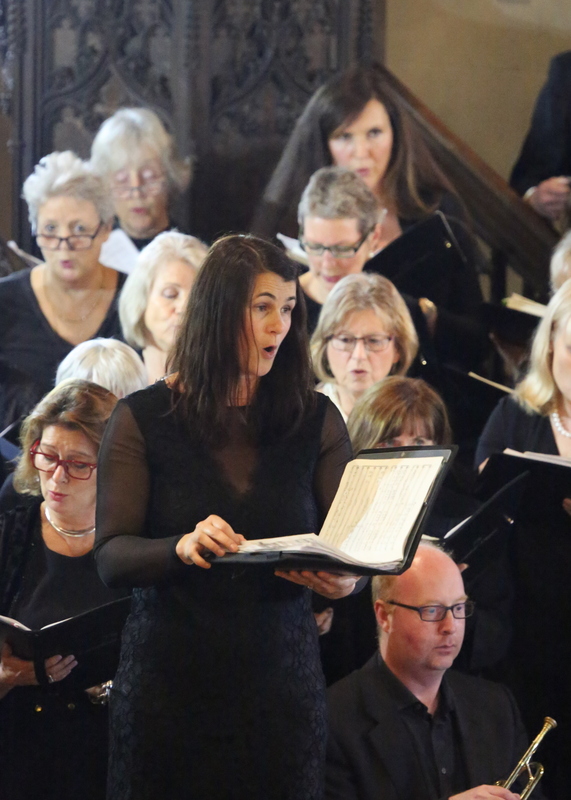 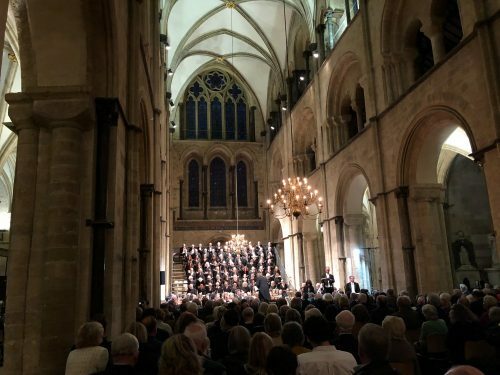 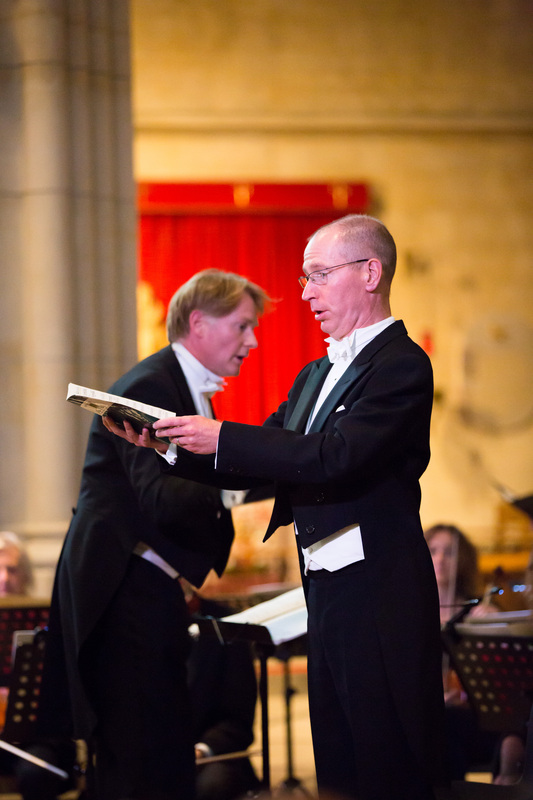 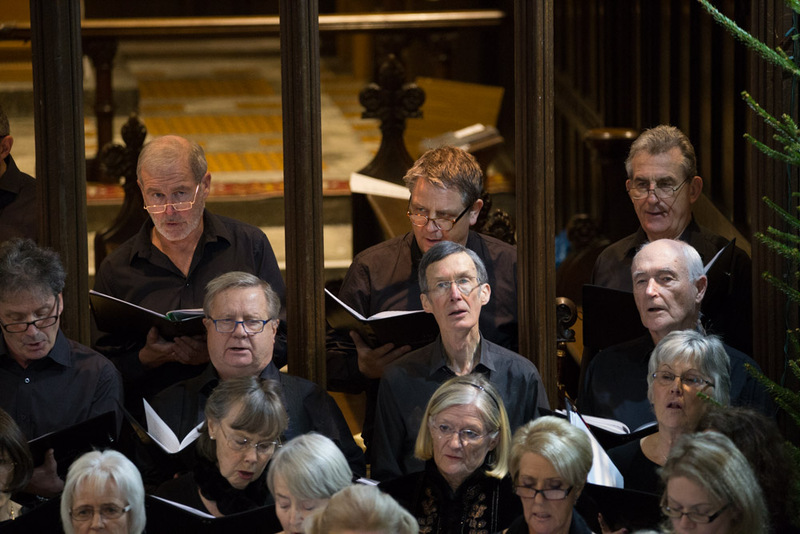 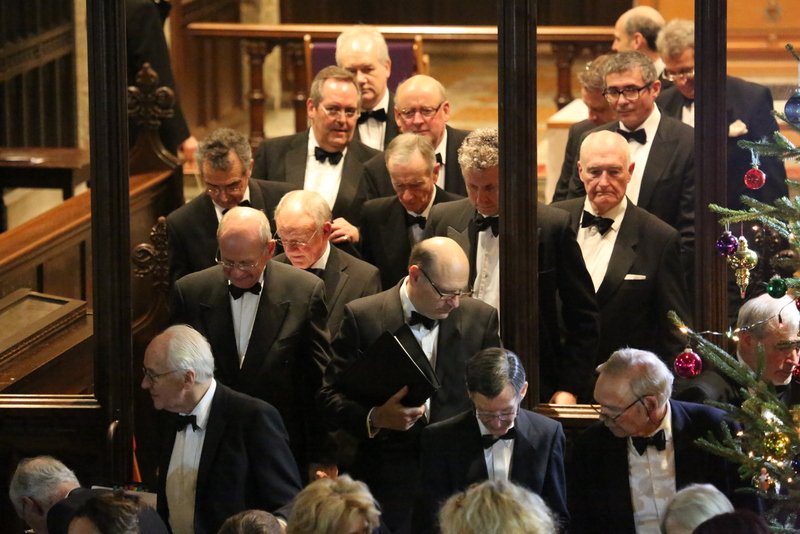 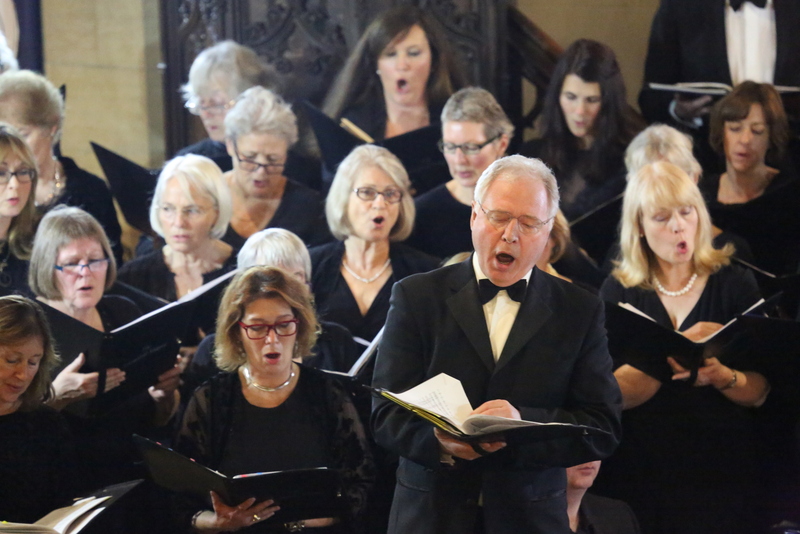 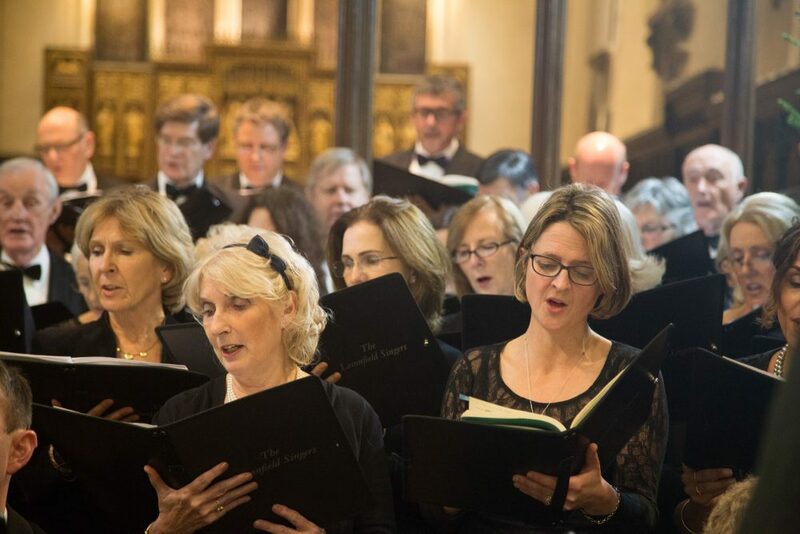 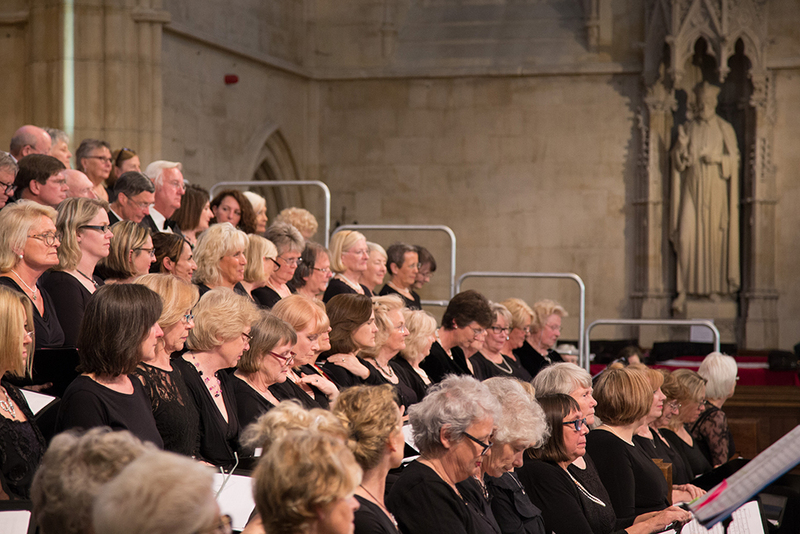 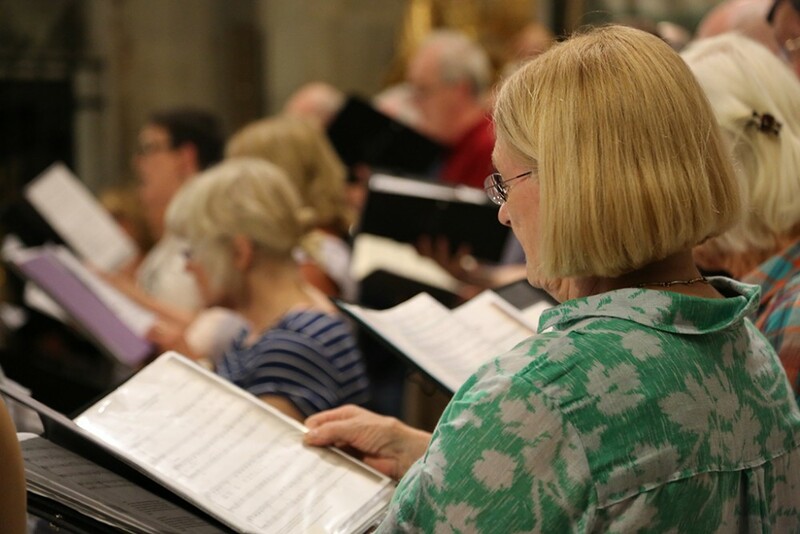 The Leconfield Singers and English Philharmonia were reunited to perform The Creation, an oratorio written between 1797 and 1798 by Joseph Haydn in a packed out Chichester Cathedral. 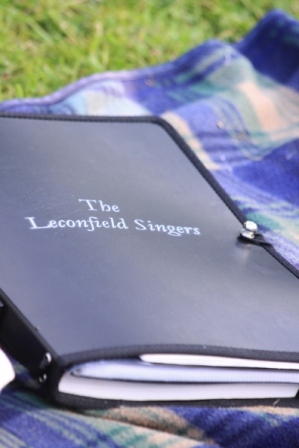 Many thanks to the Stedall family who were amongst our contributors for these photos. 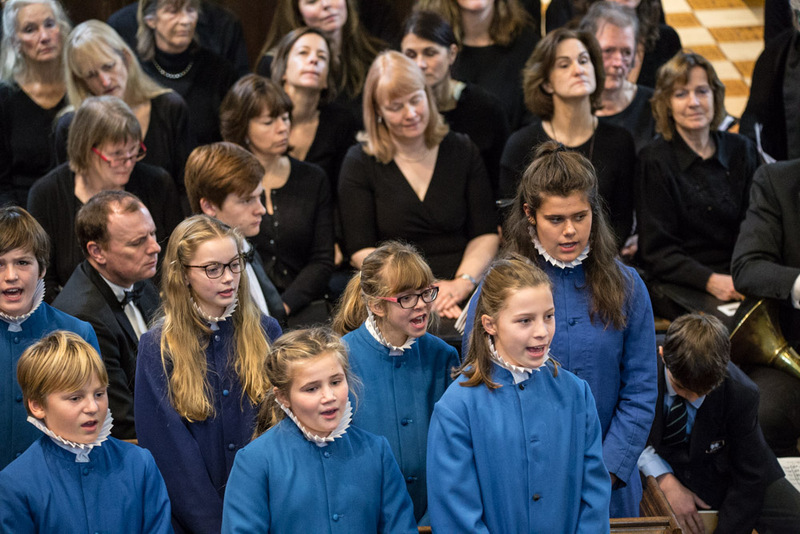 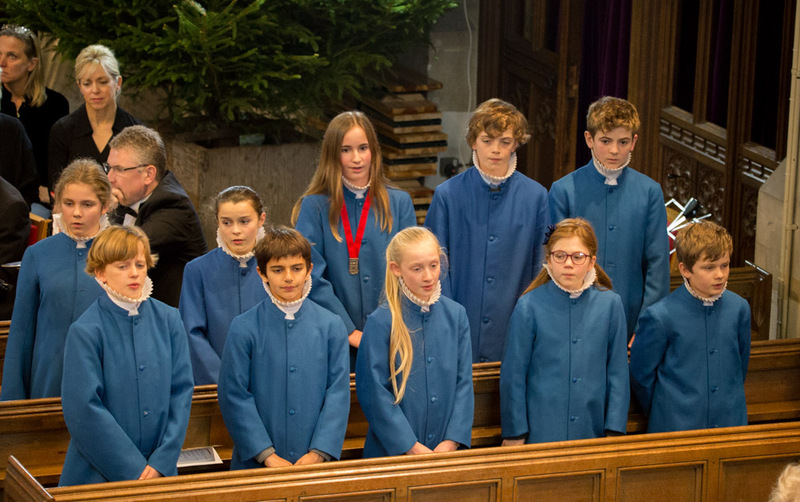 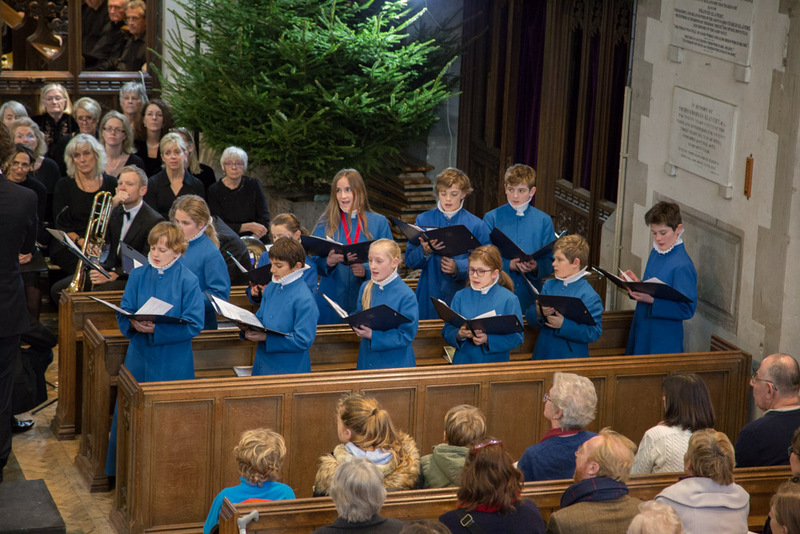 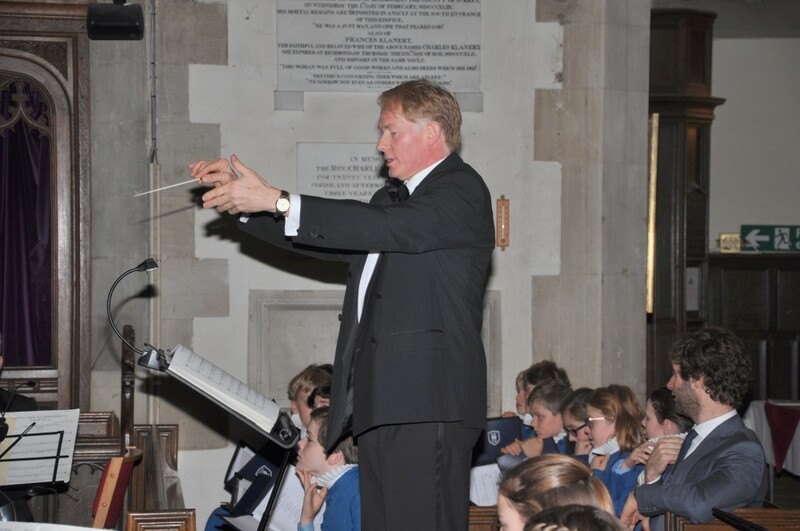 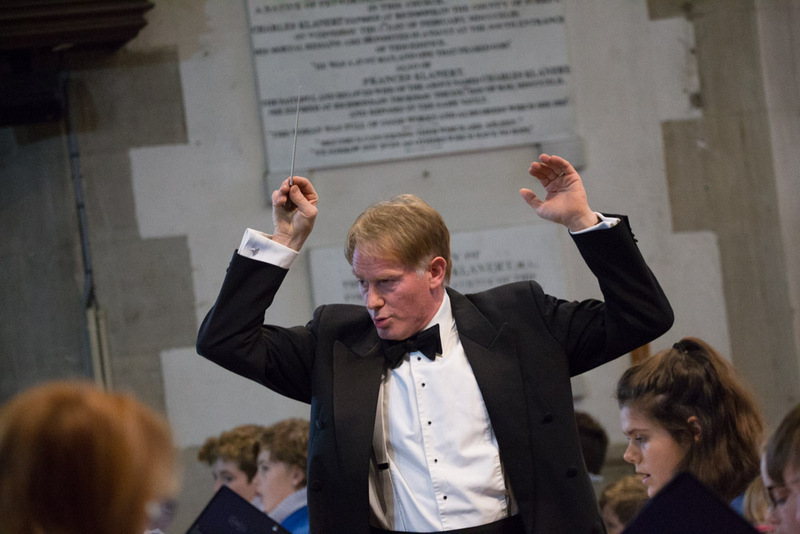 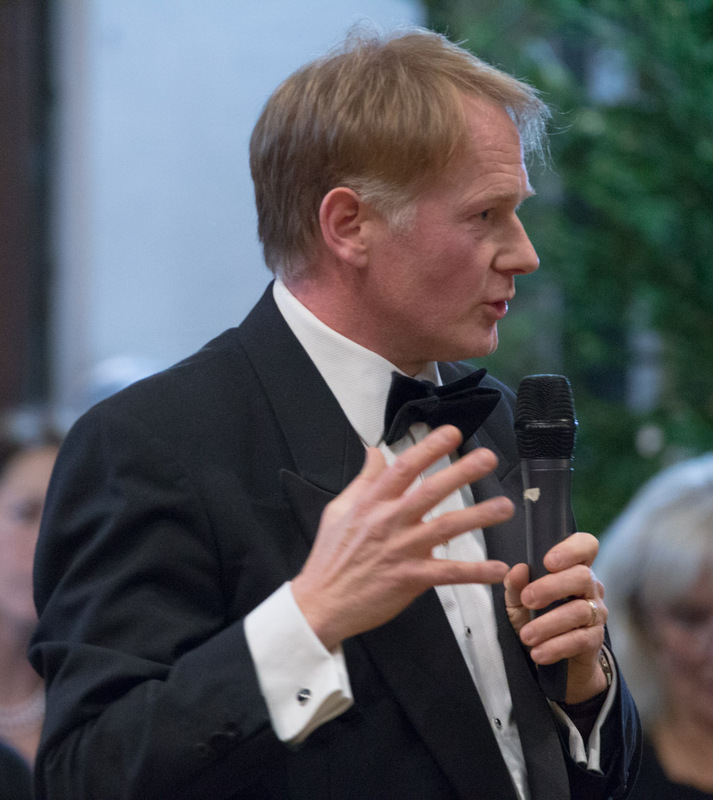 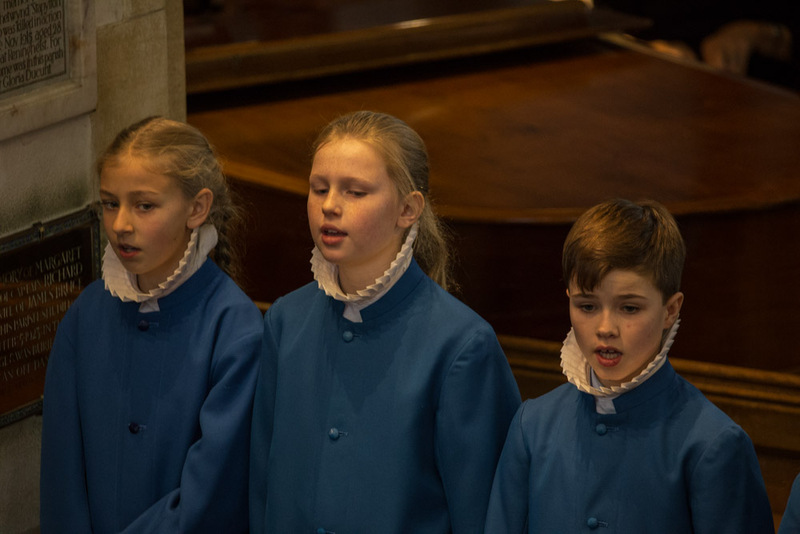 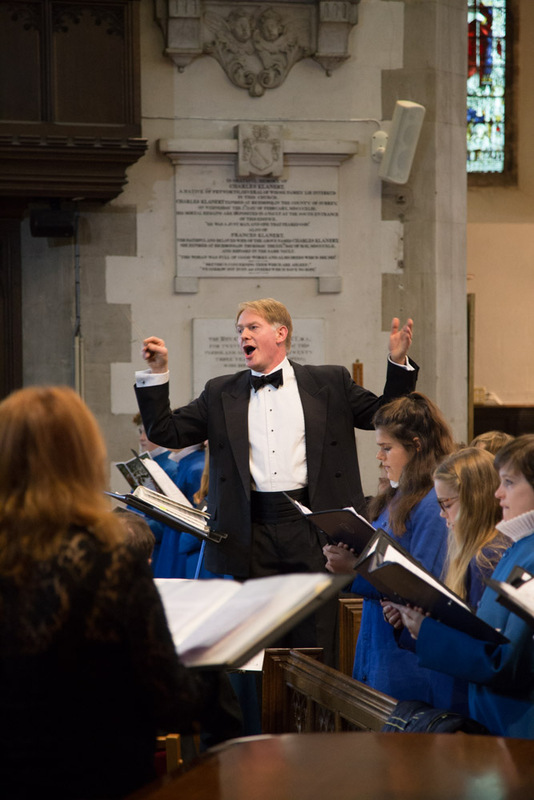 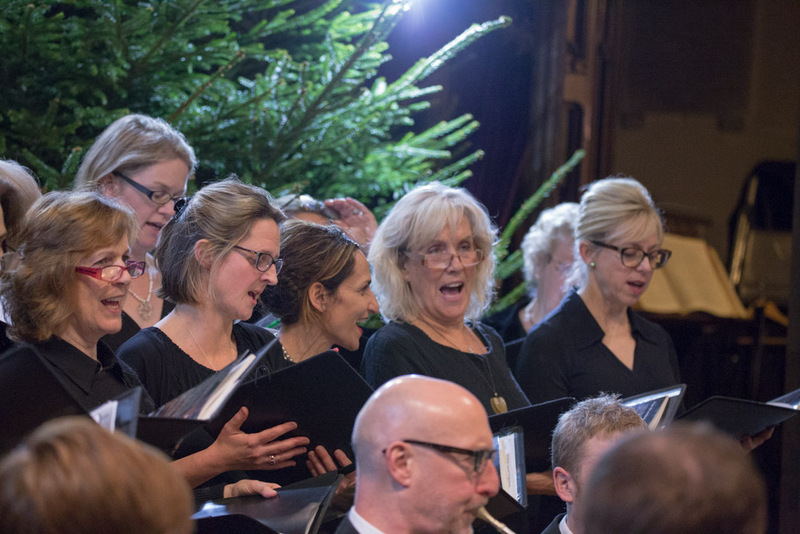 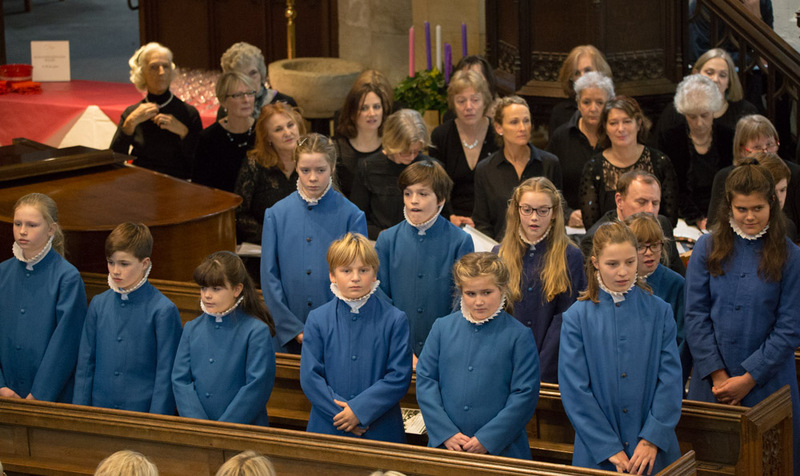 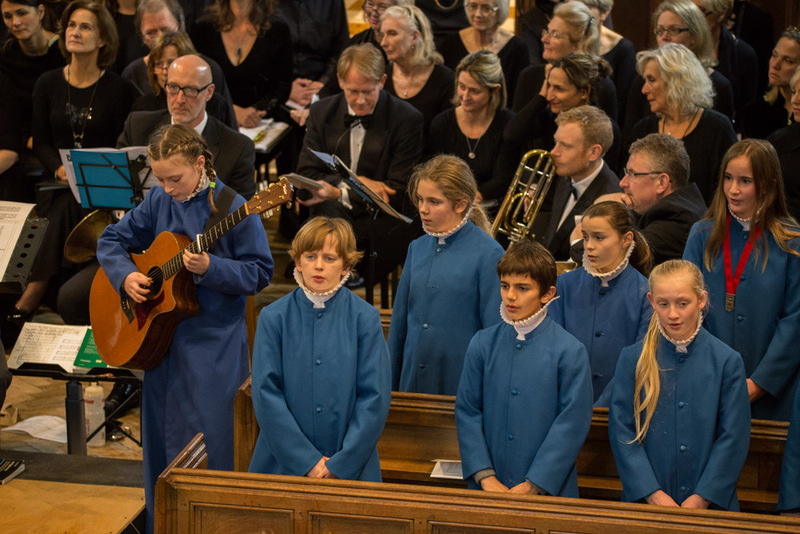 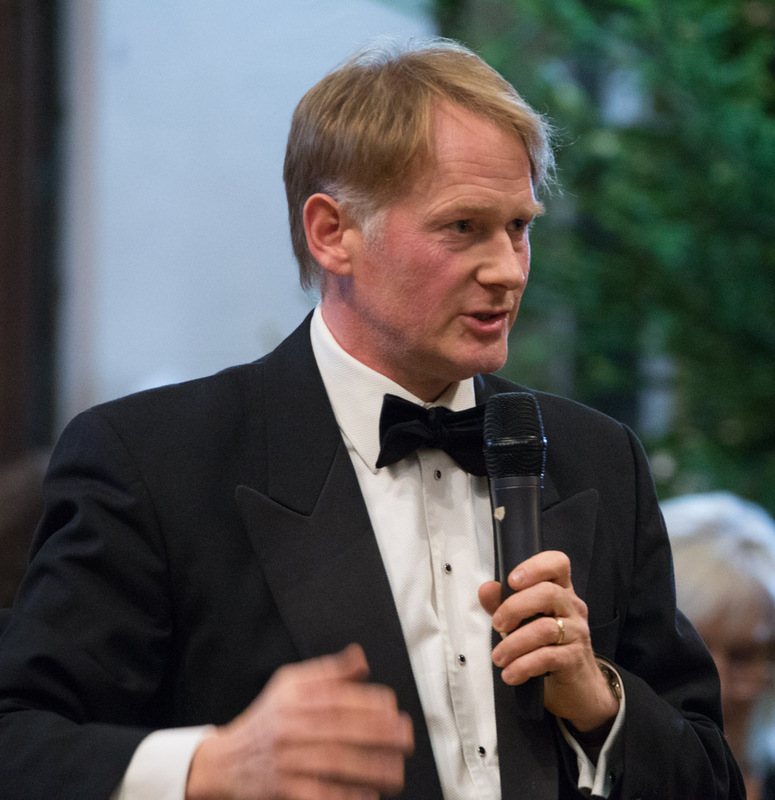 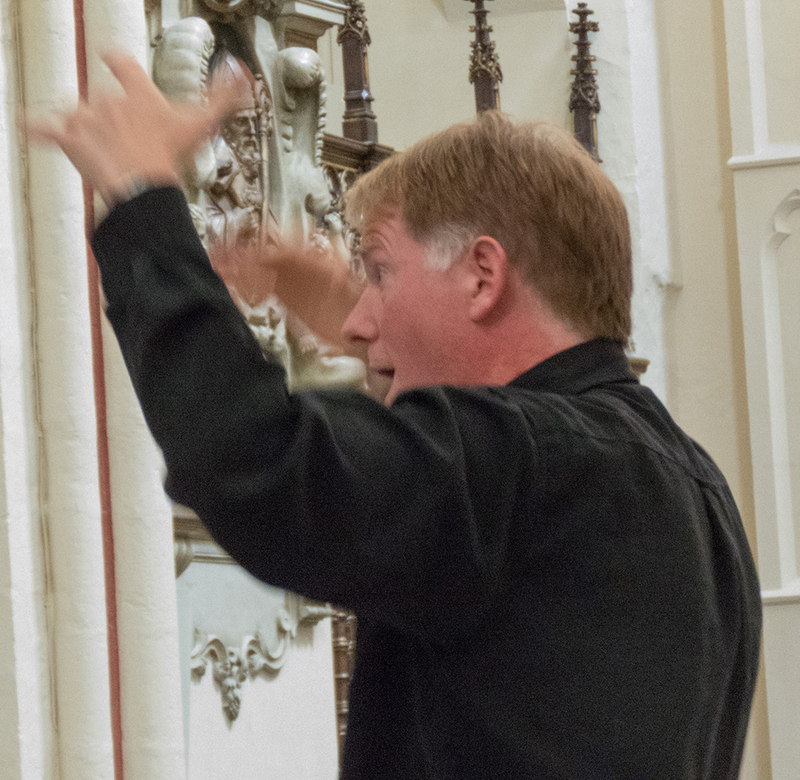 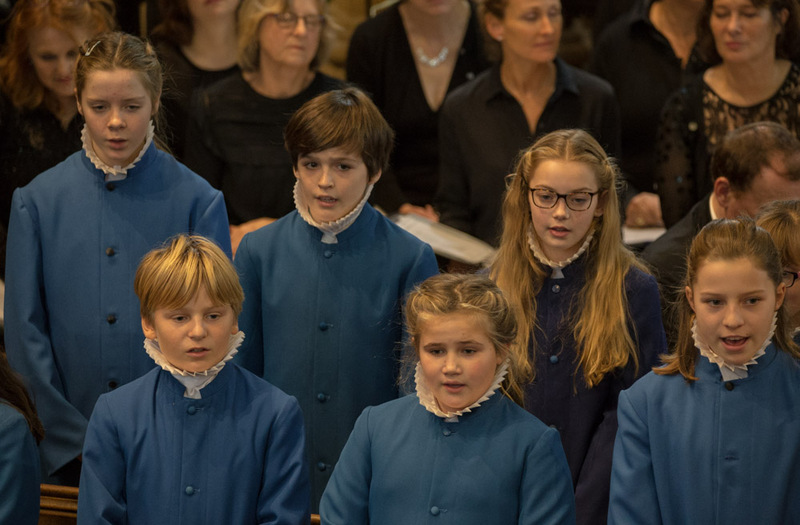 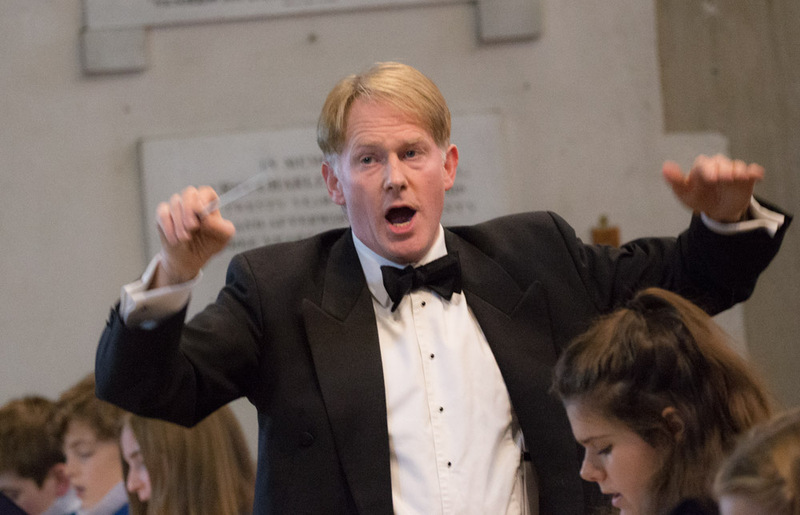 This year due to popular demand, we held 2 Christmas concerts, a matinee with the delightful and talented children of Dorset House School and an evening concert featuring Chris Williams’ fabulous Stabat Mater Speciosa. 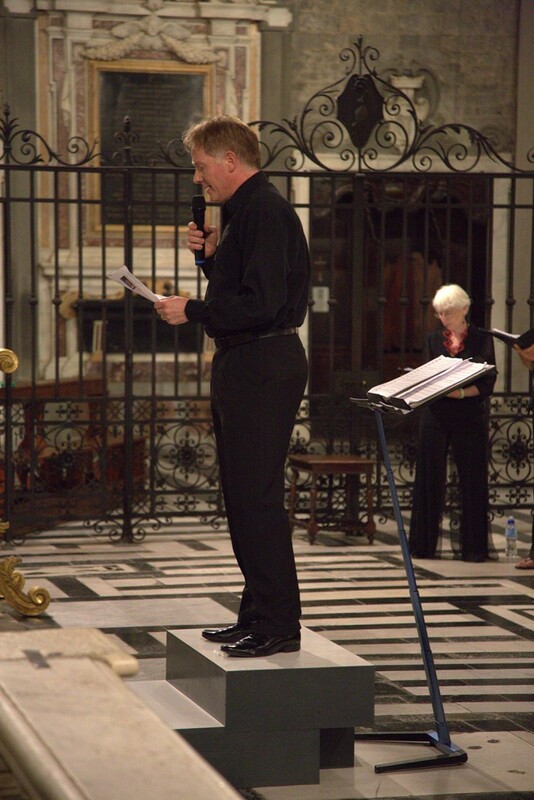 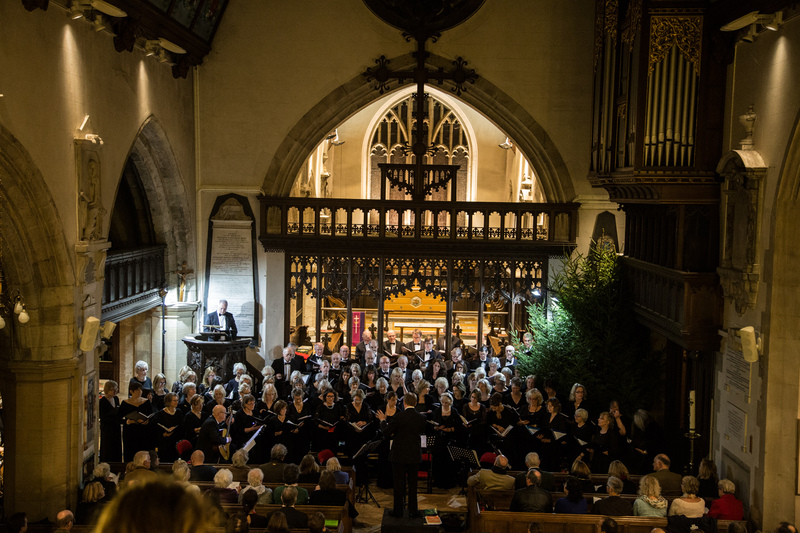 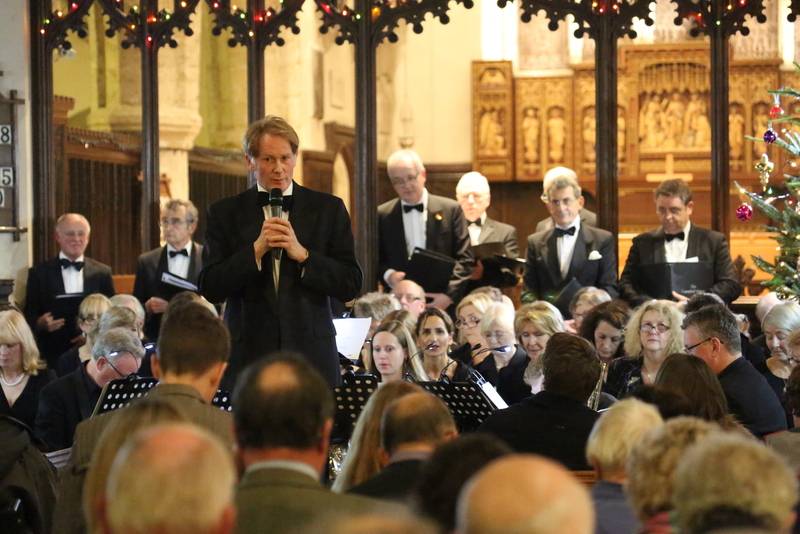 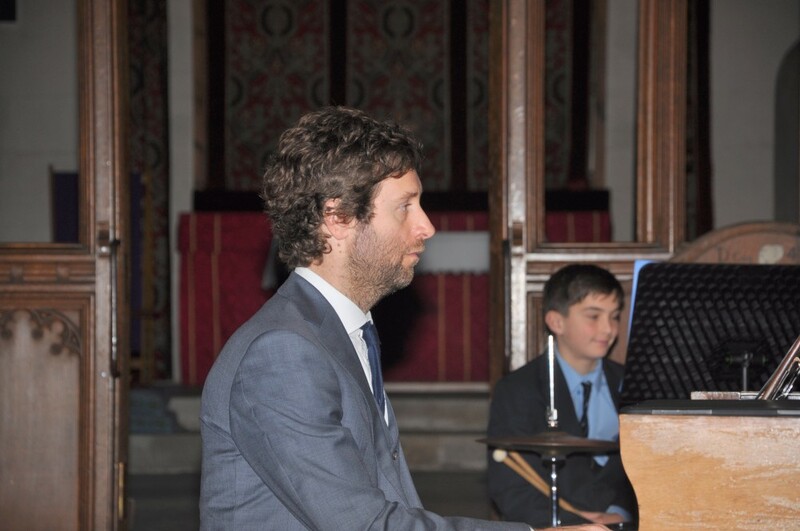 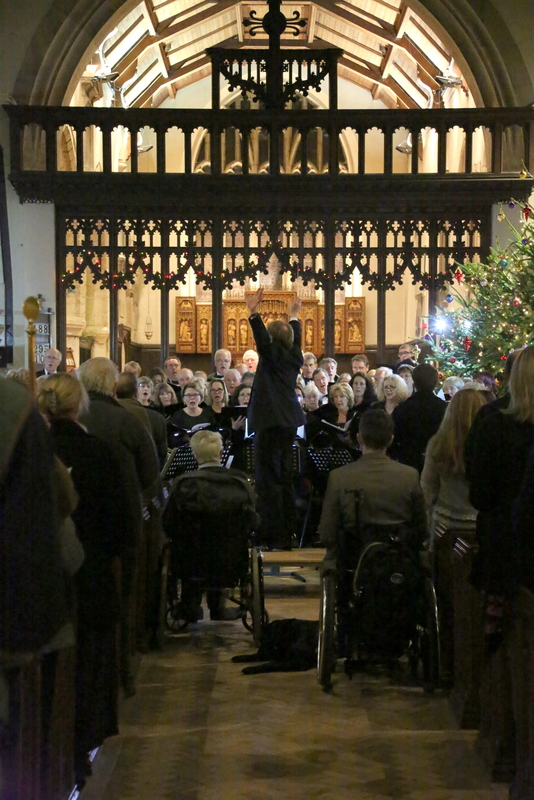 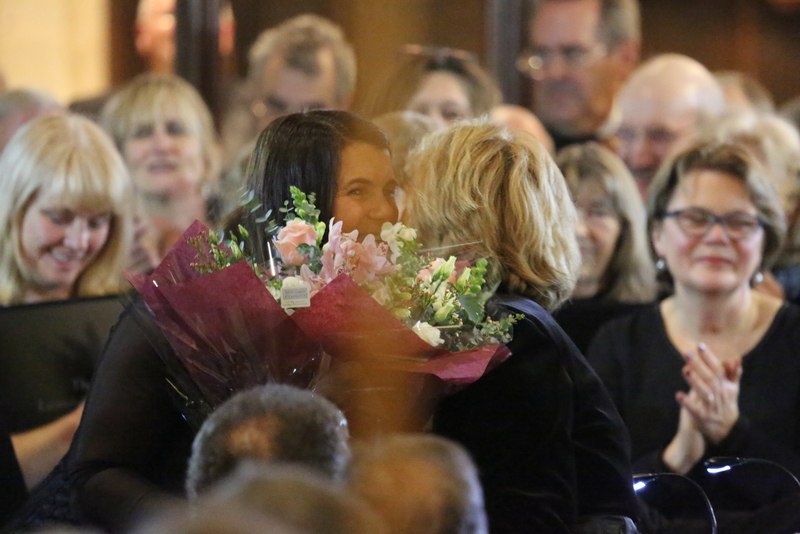 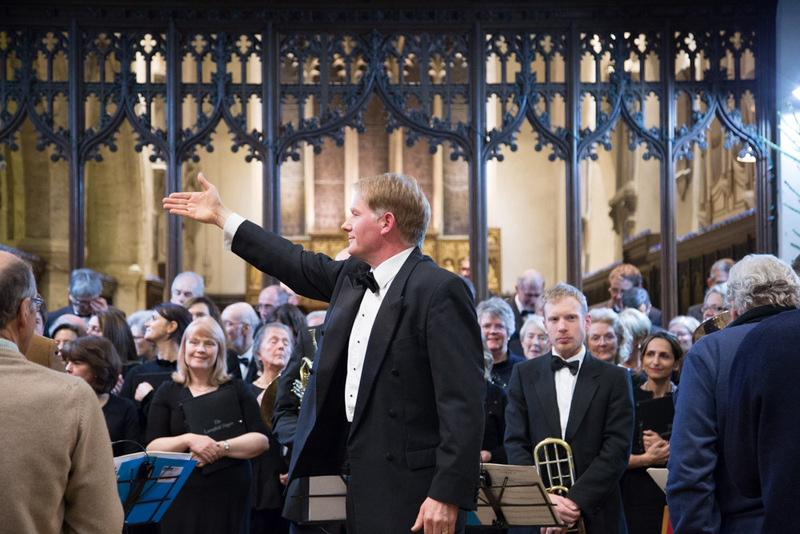 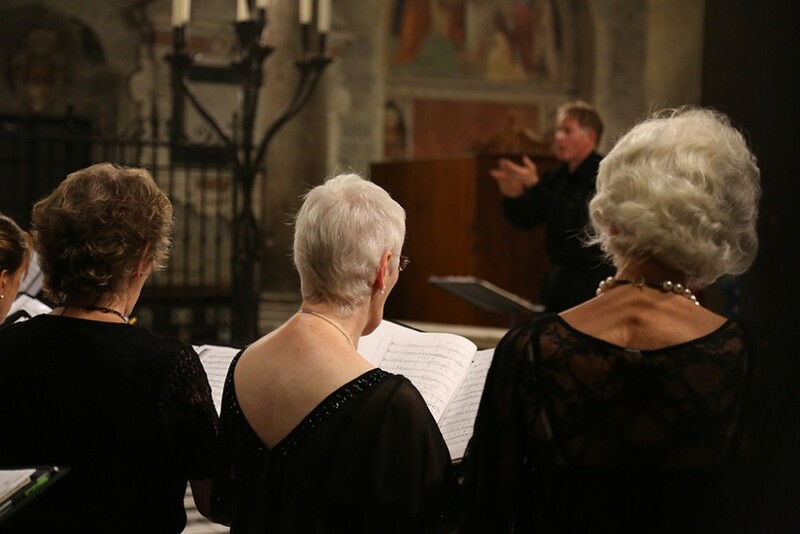 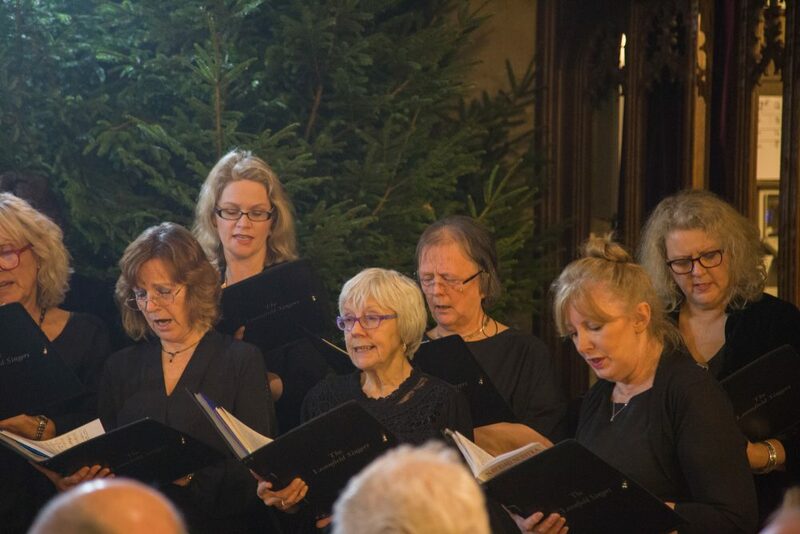 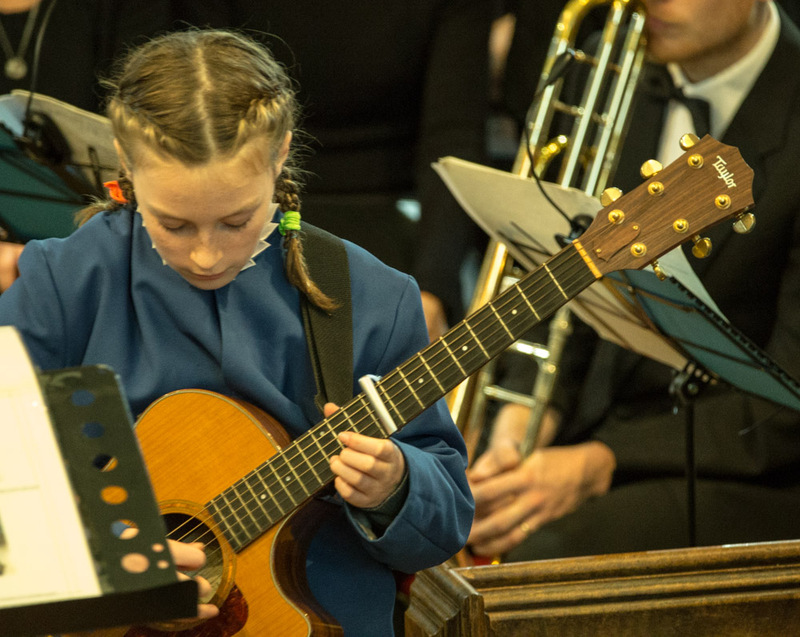 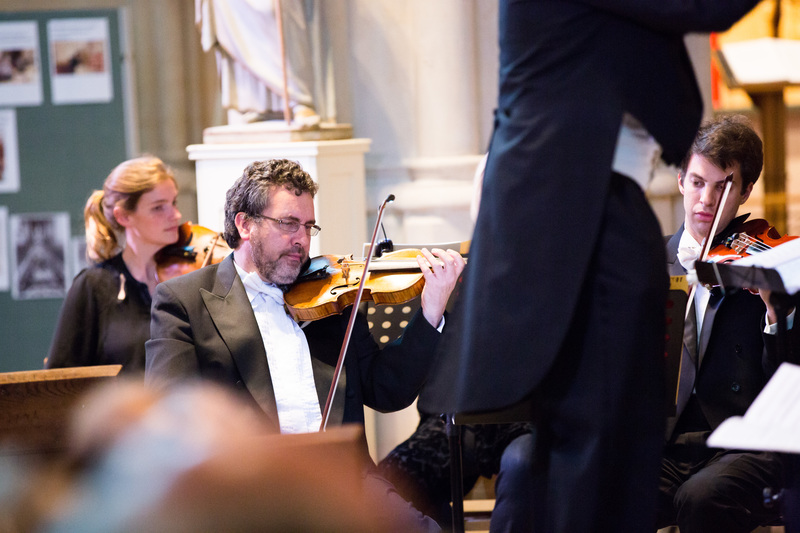 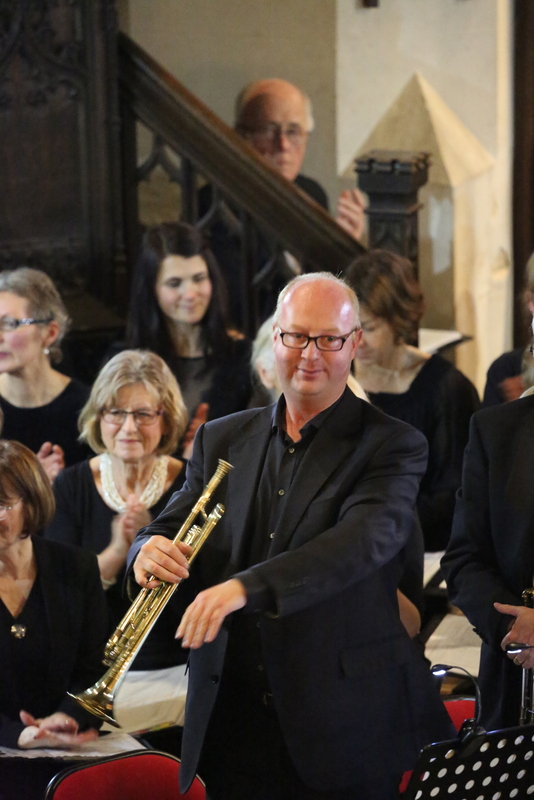 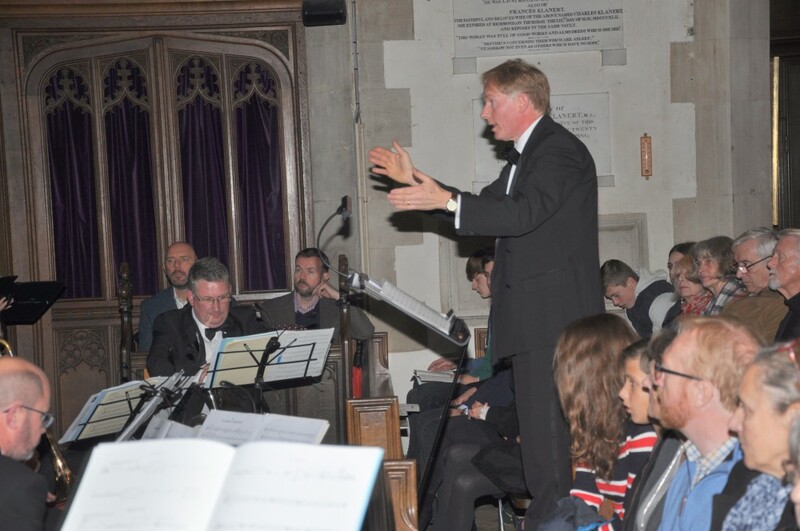 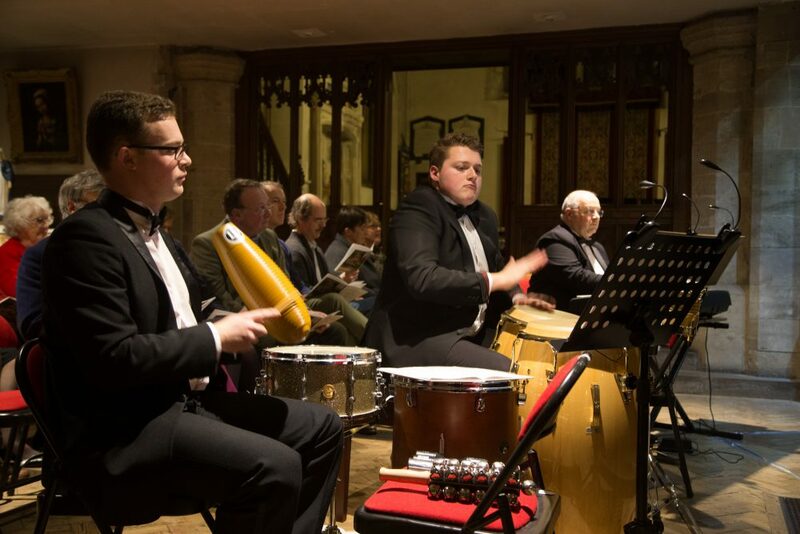 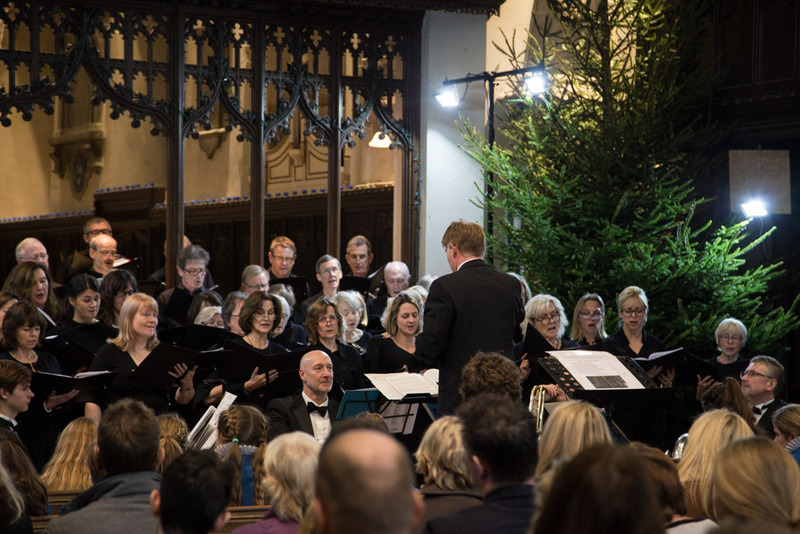 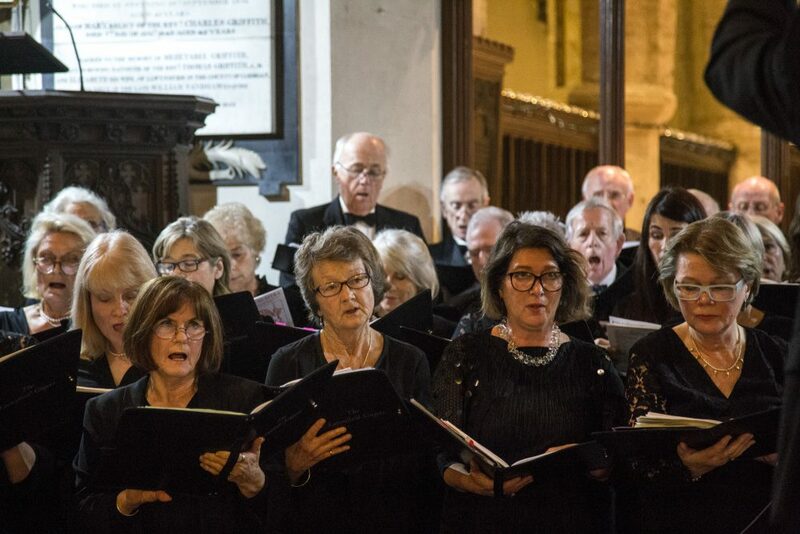 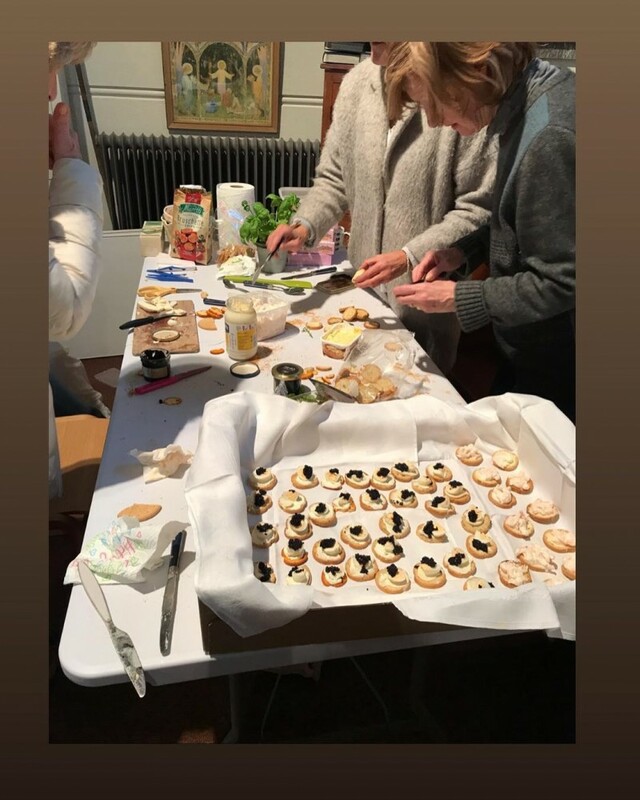 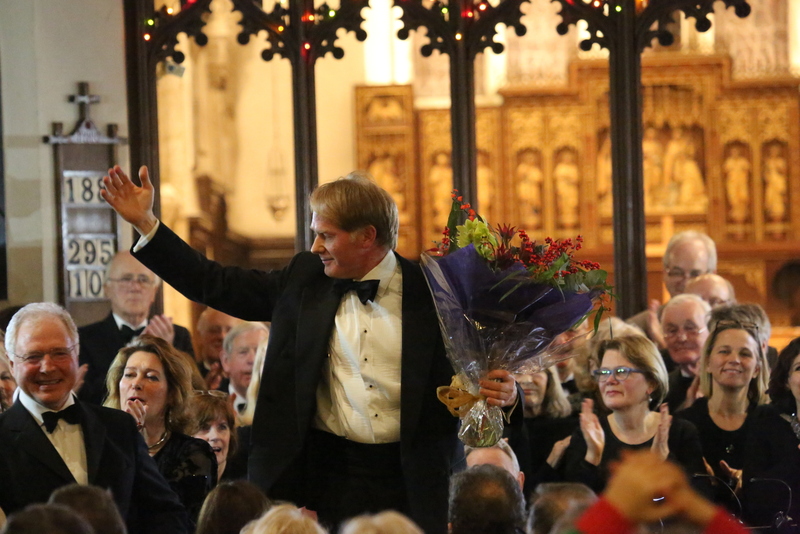 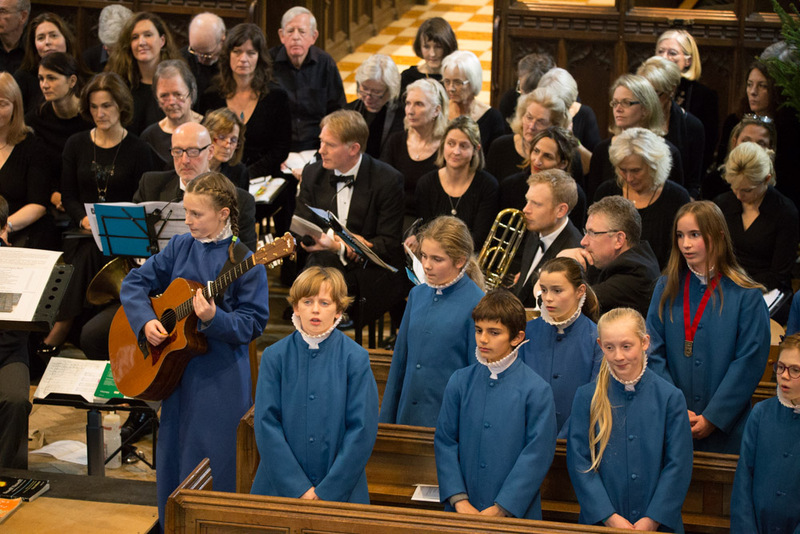 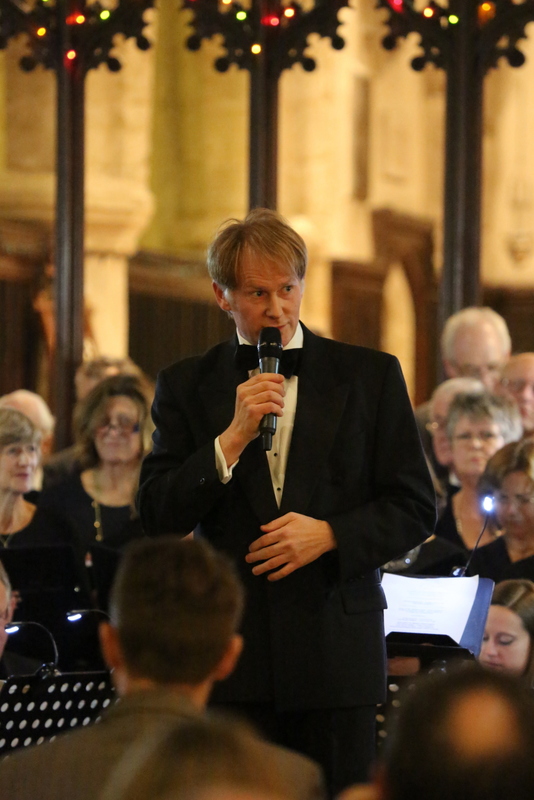 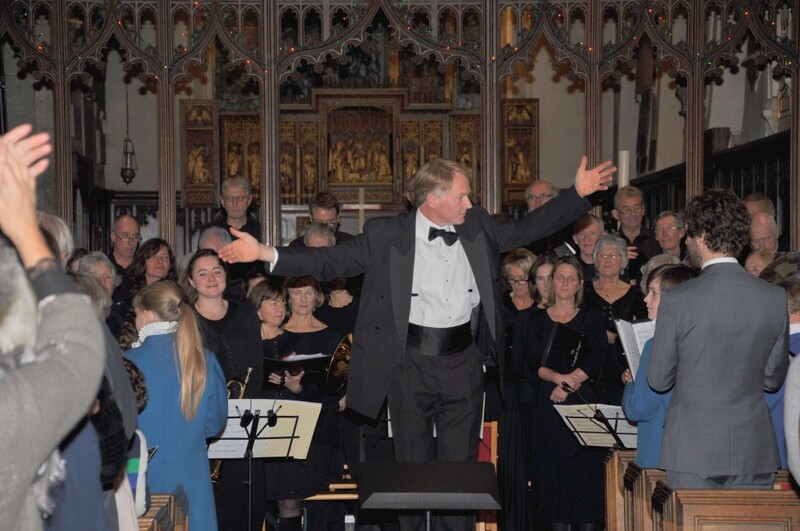 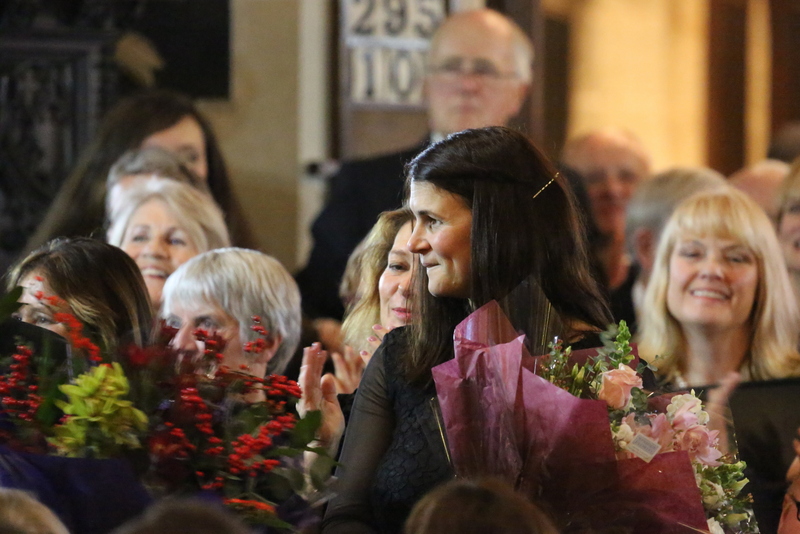 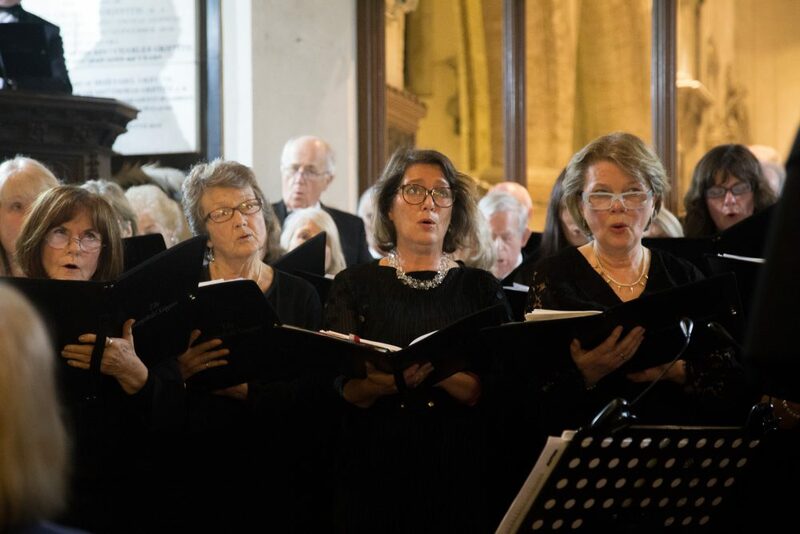 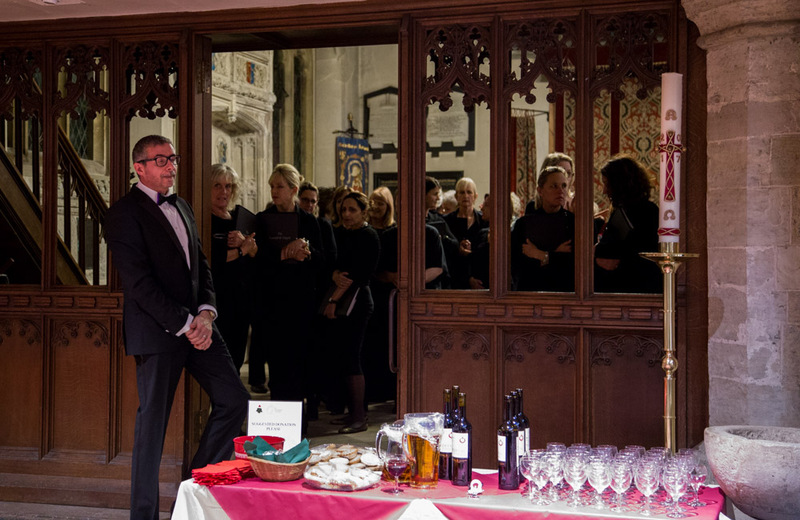 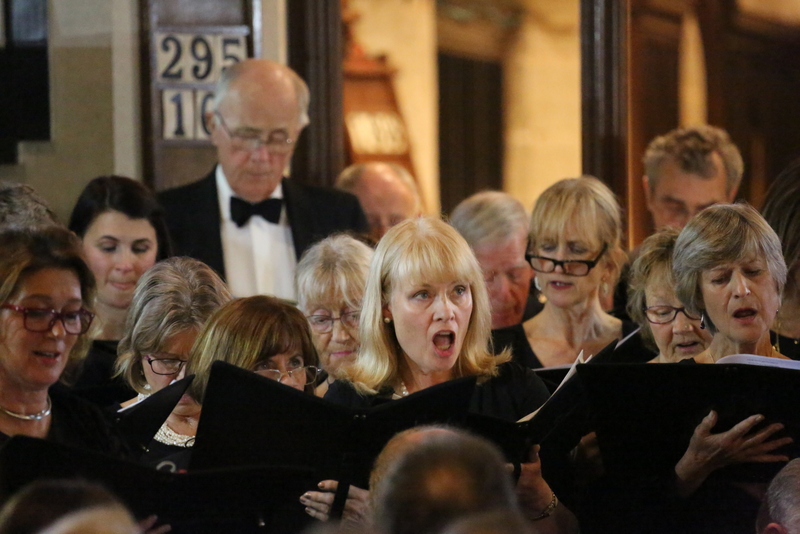 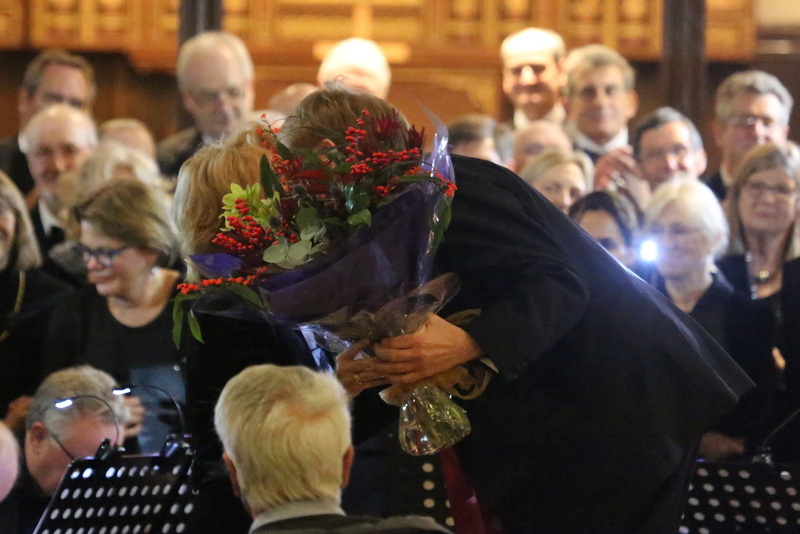 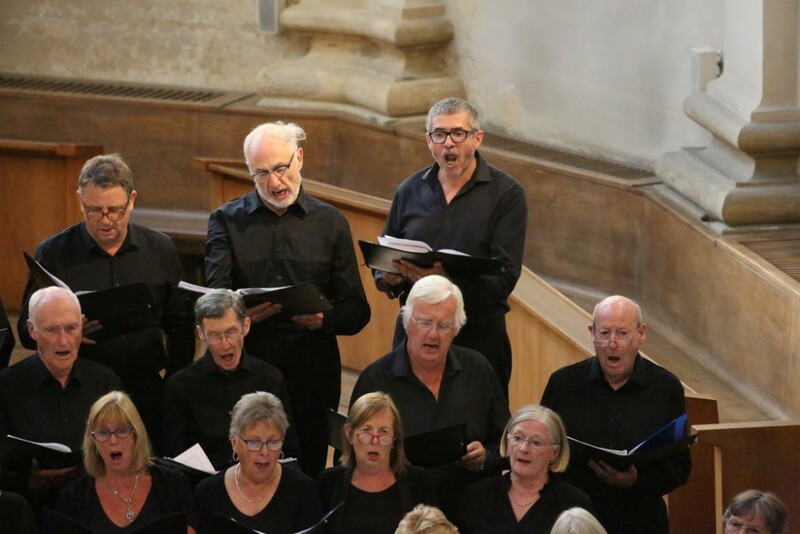 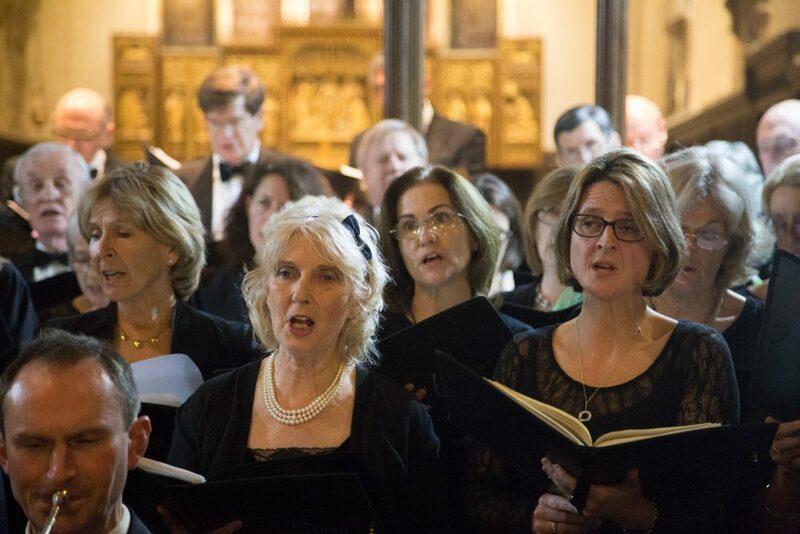 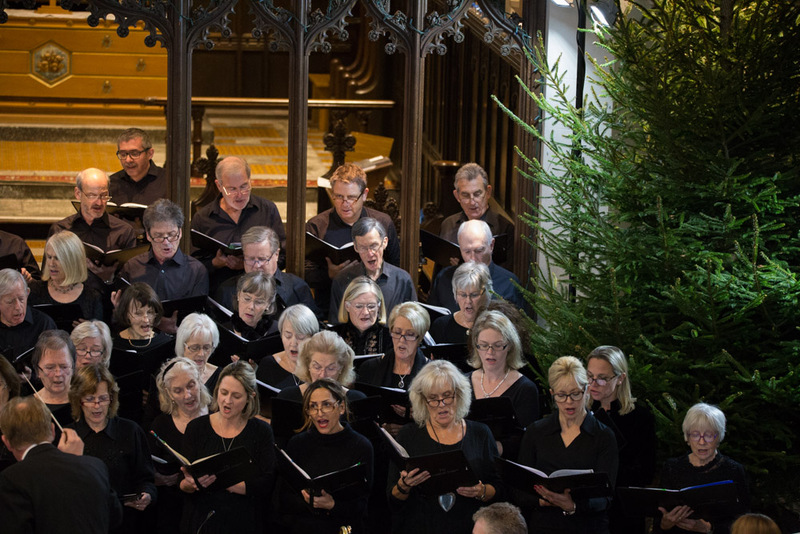 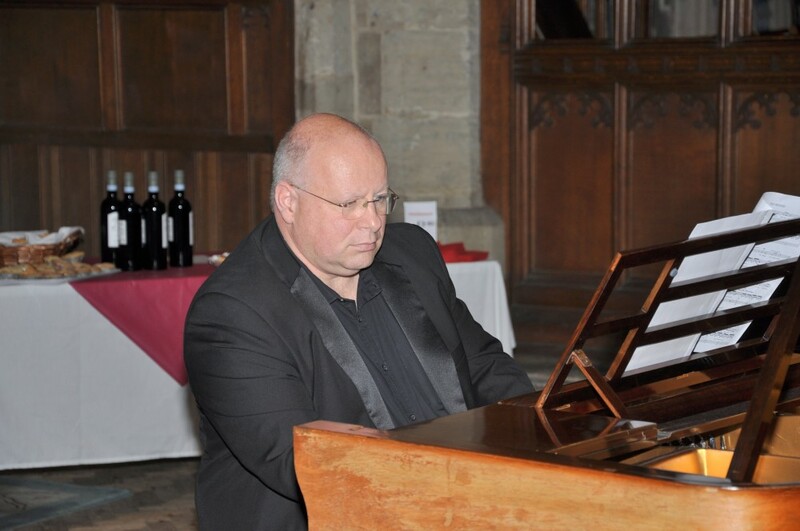 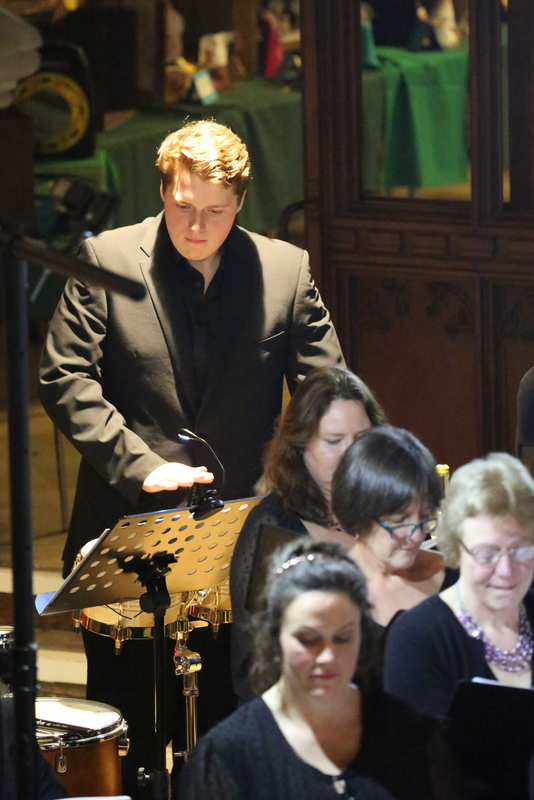 Thanks to Liz Stedall’s son Ollie for these wonderful photos from the evening concert and the beautiful St Mary’s Church, Petworth! 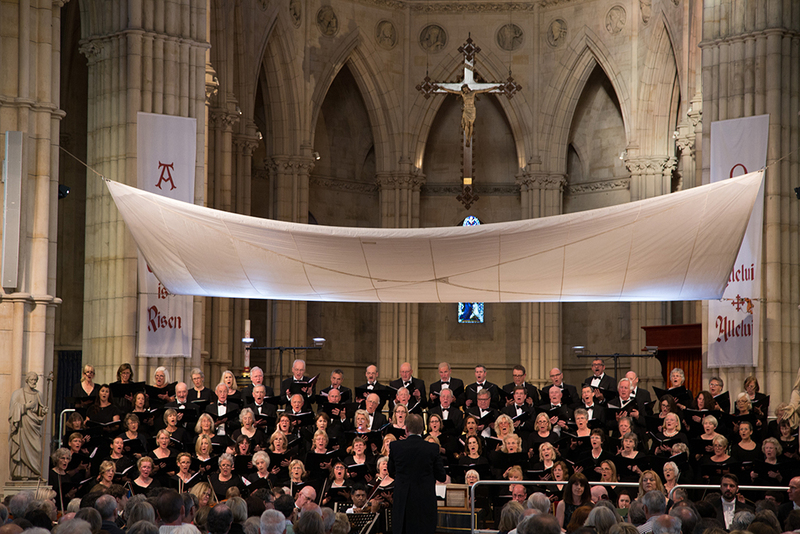 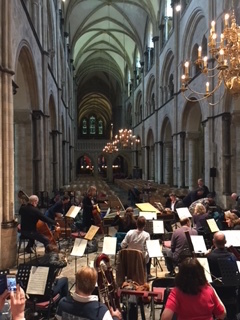 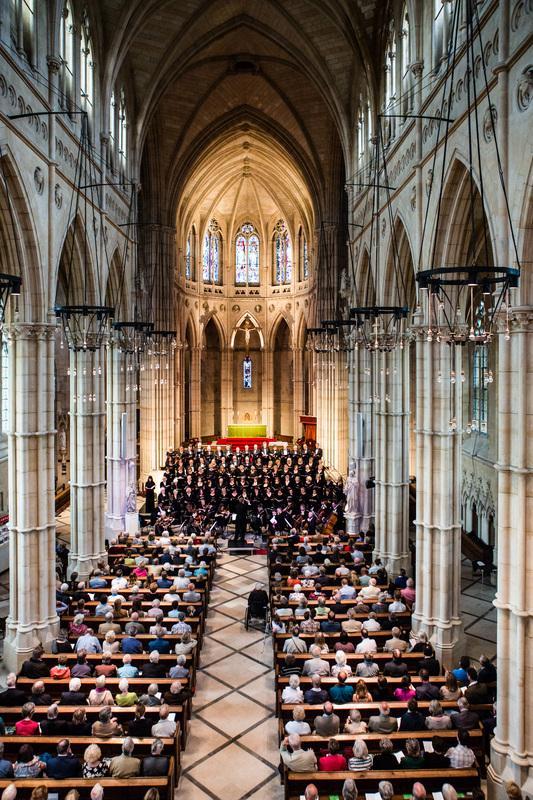 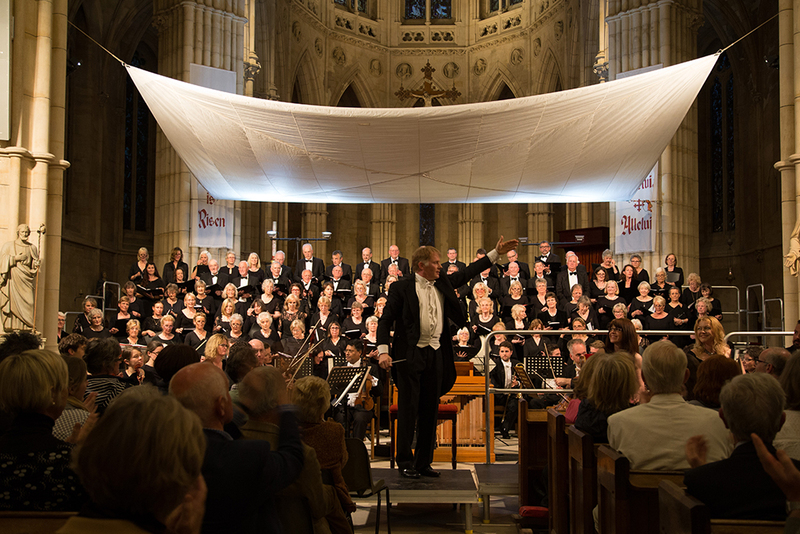 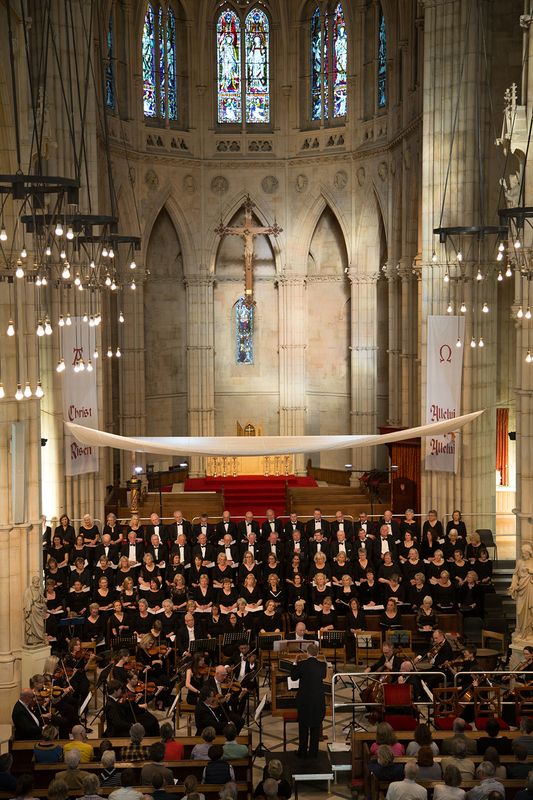 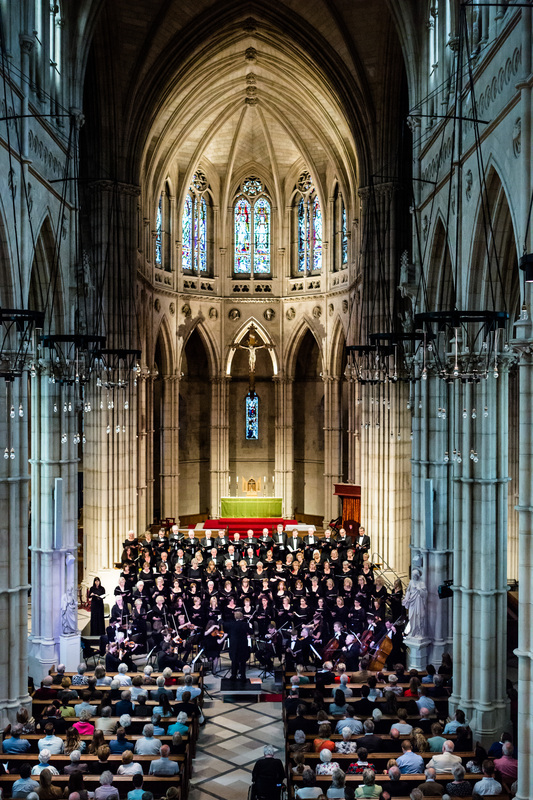 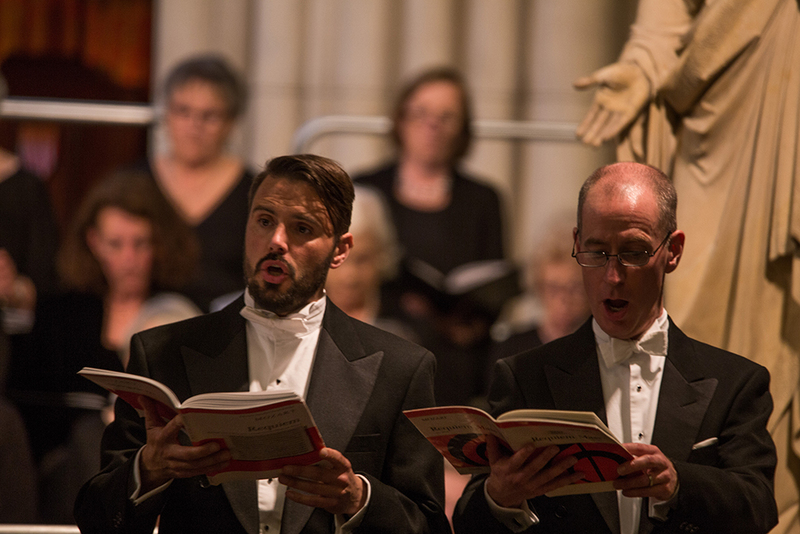 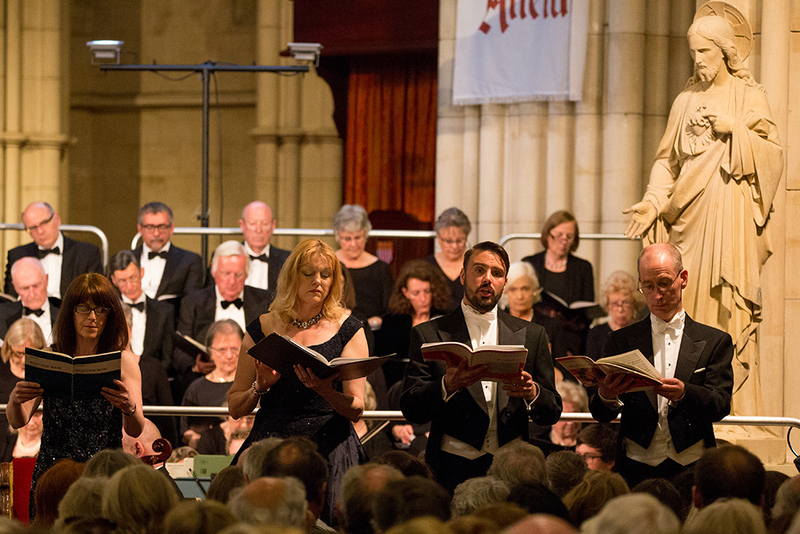 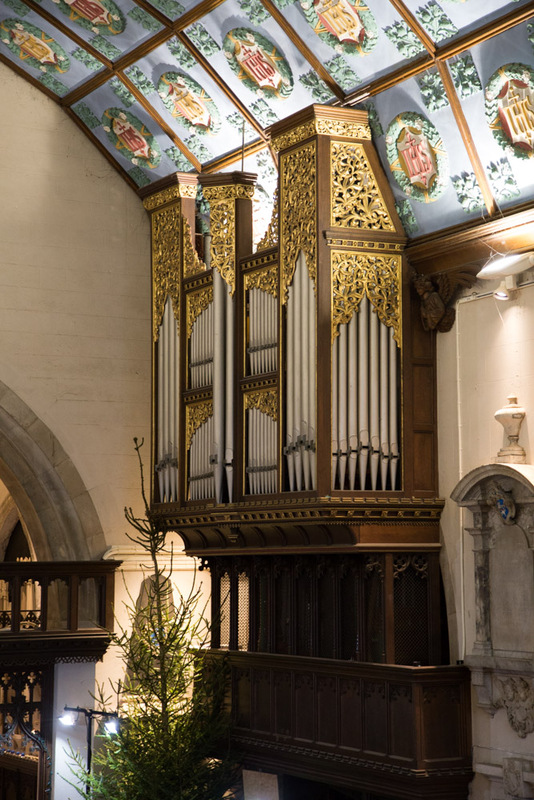 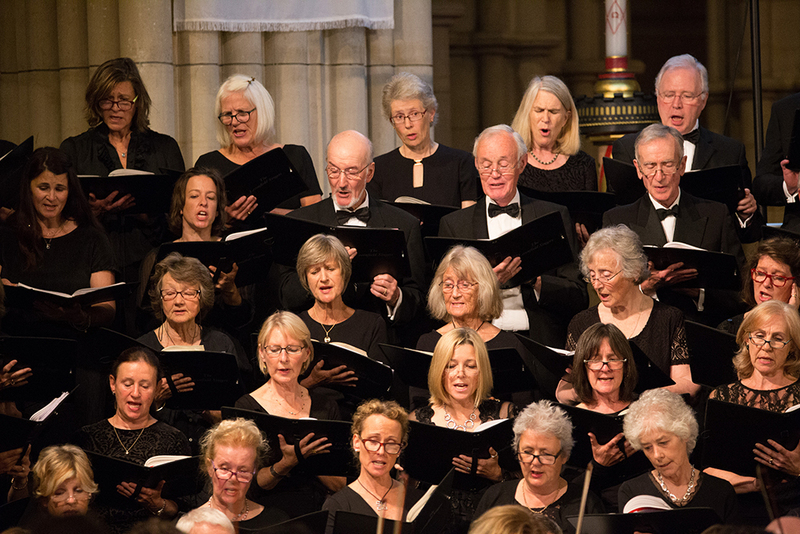 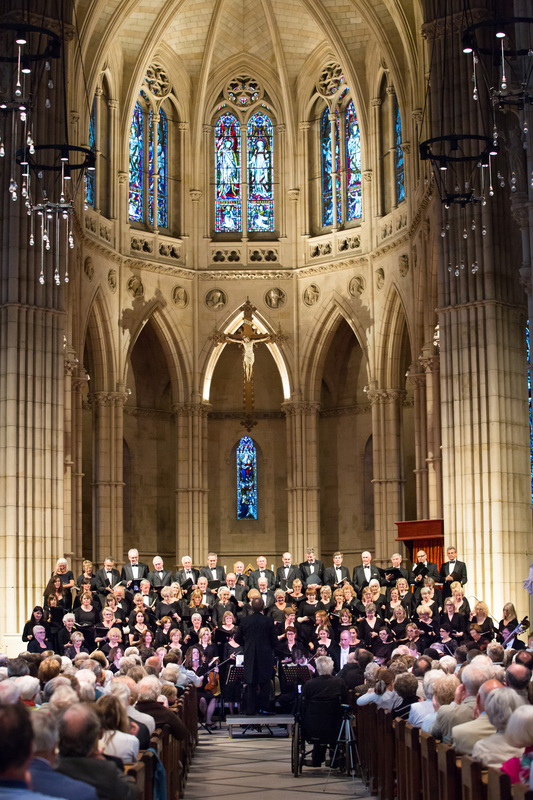 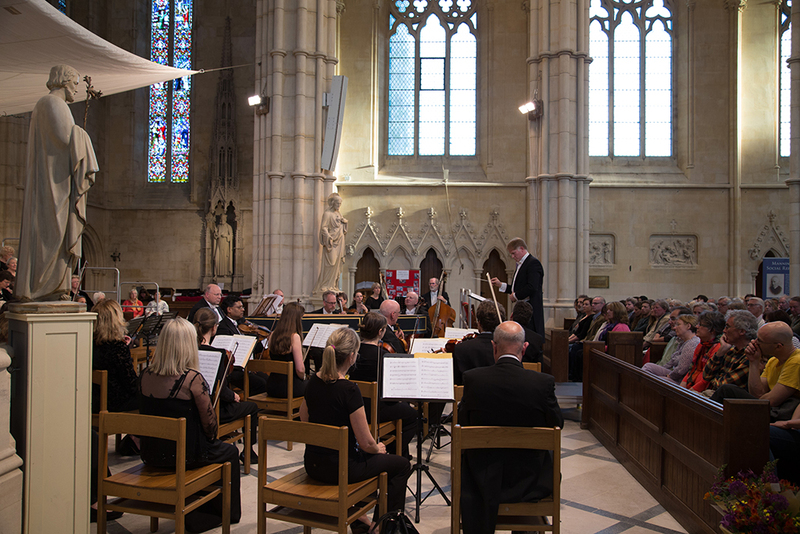 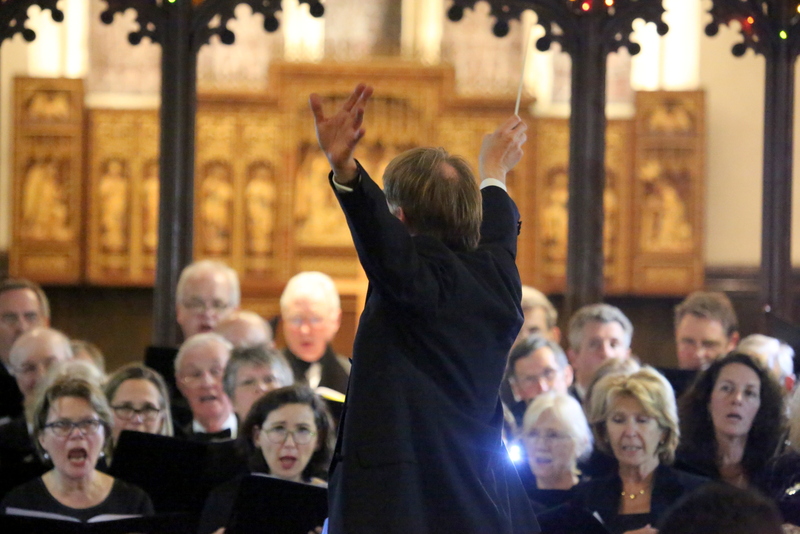 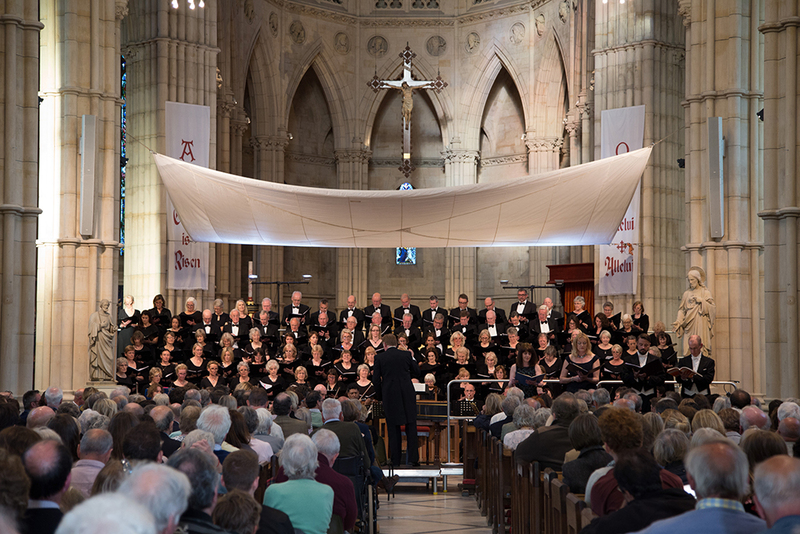 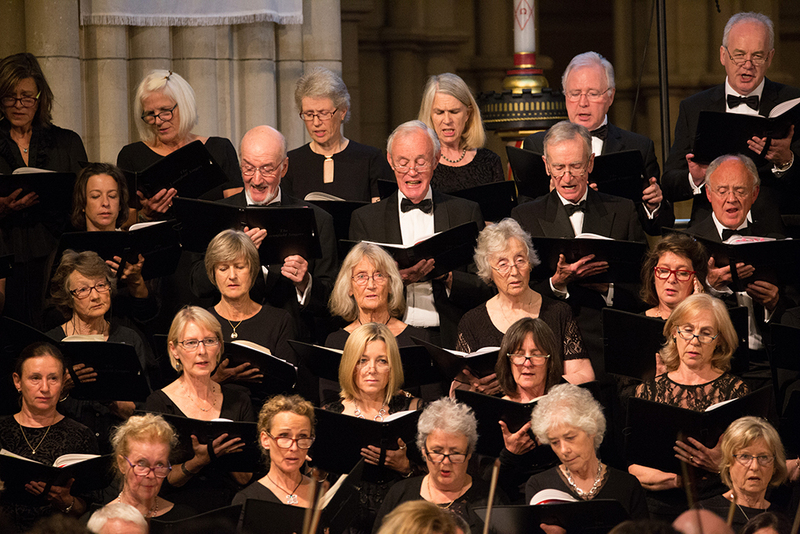 We were delighted to return to Arundel Cathedral to perform Mozart’s Requiem, Zadok the Priest and other works from Handel and Bach. 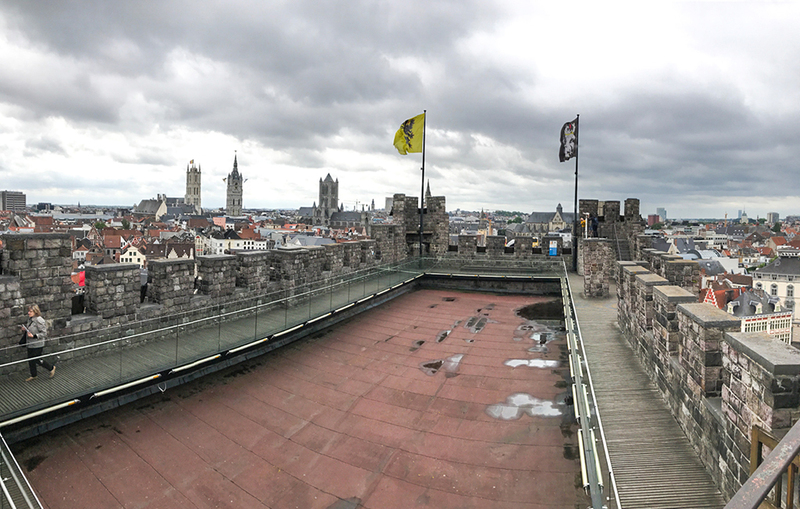 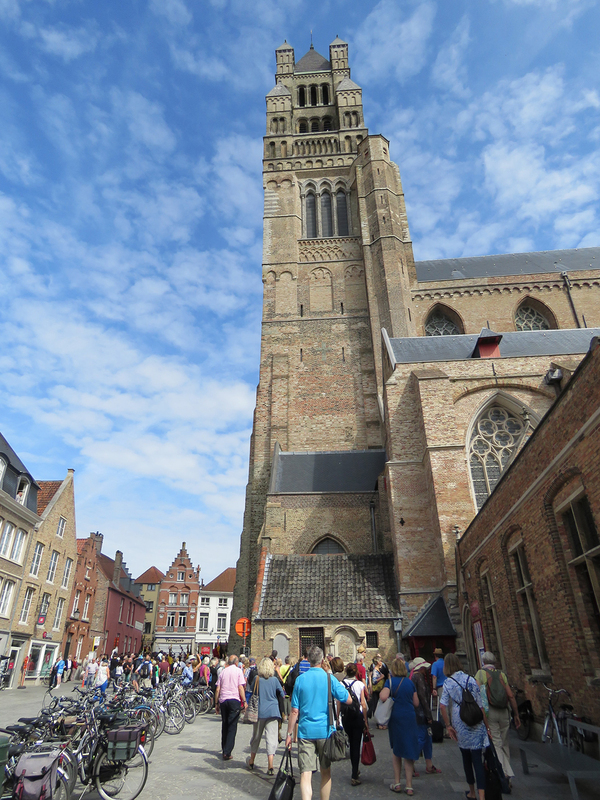 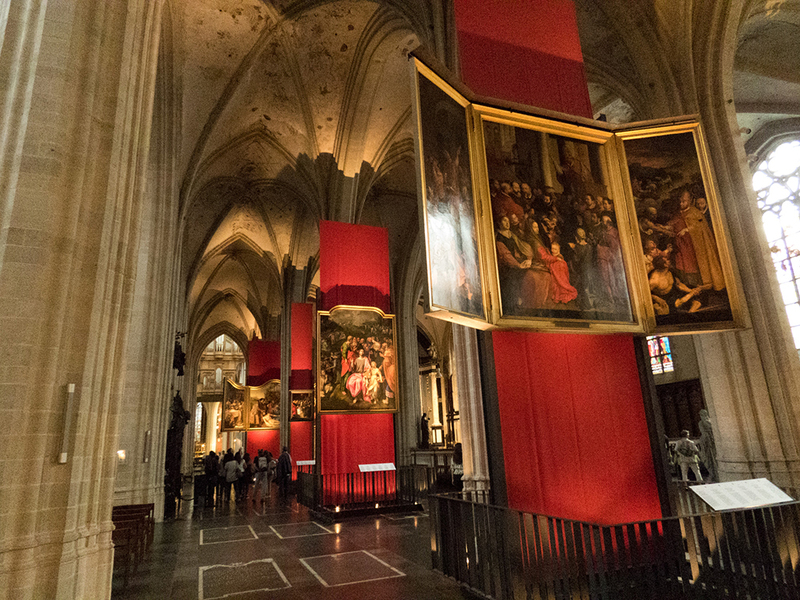 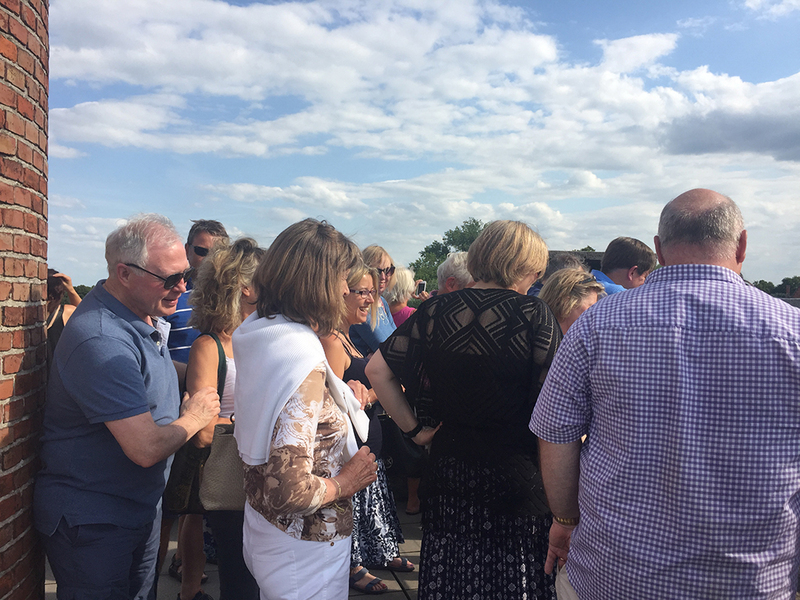 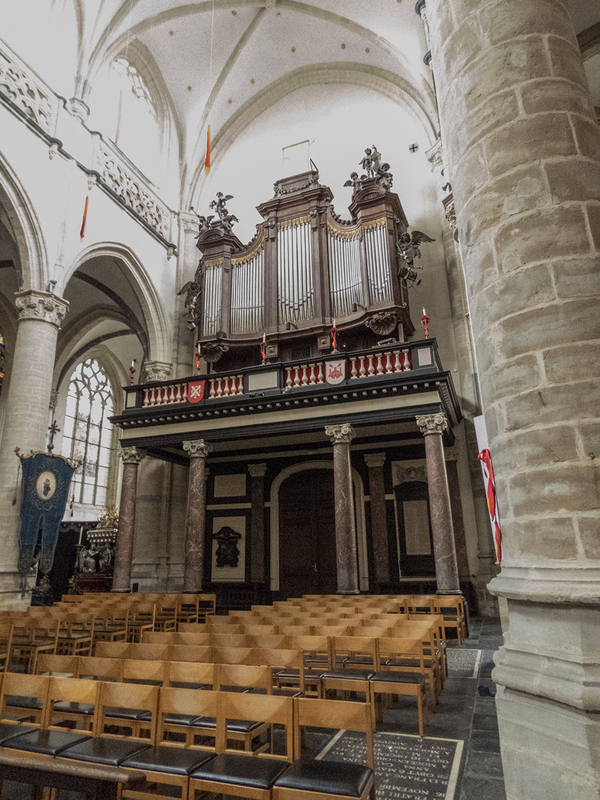 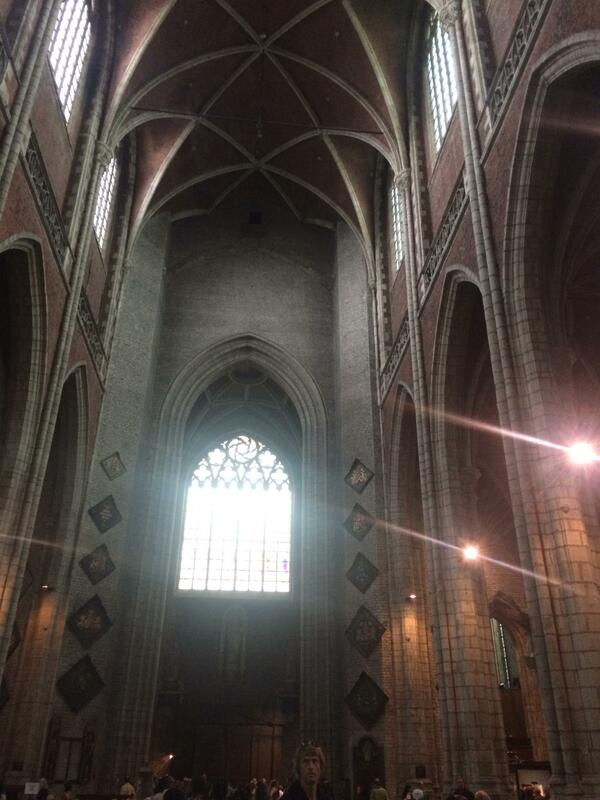 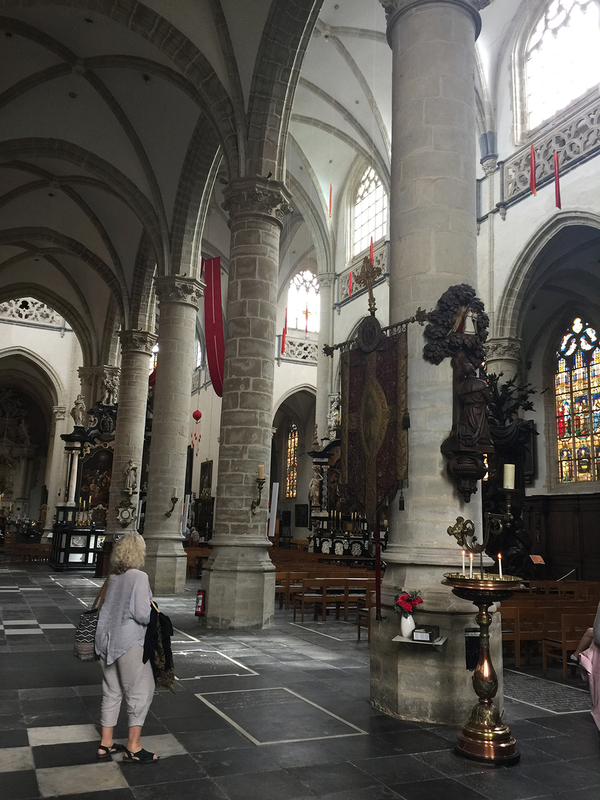 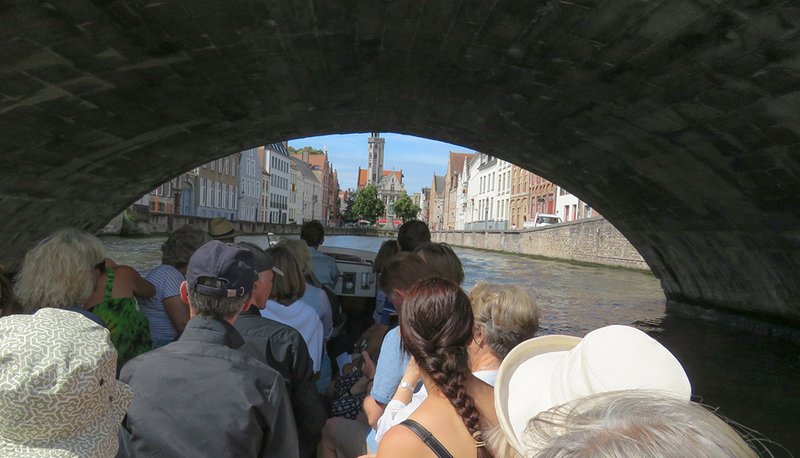 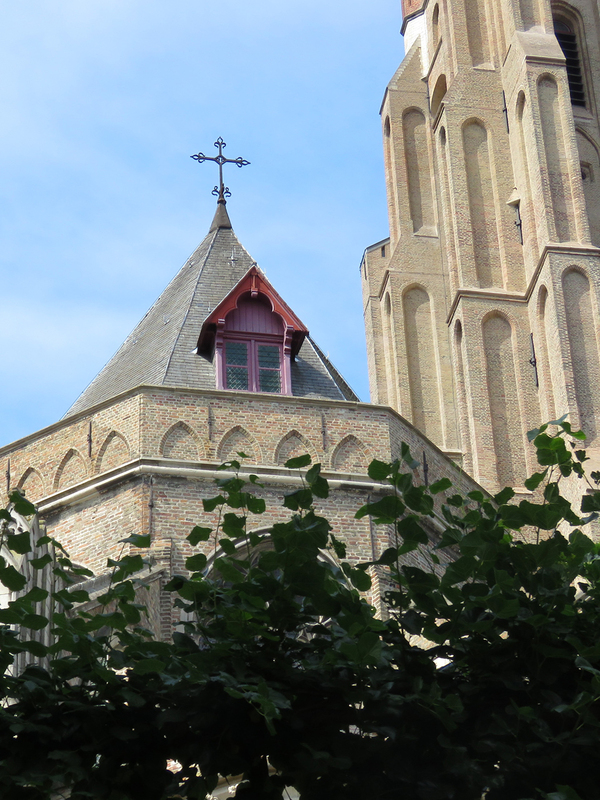 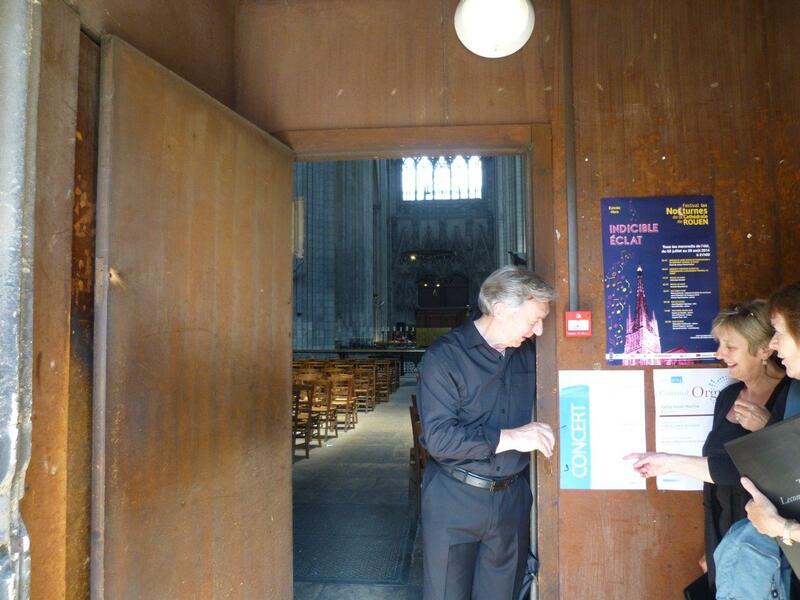 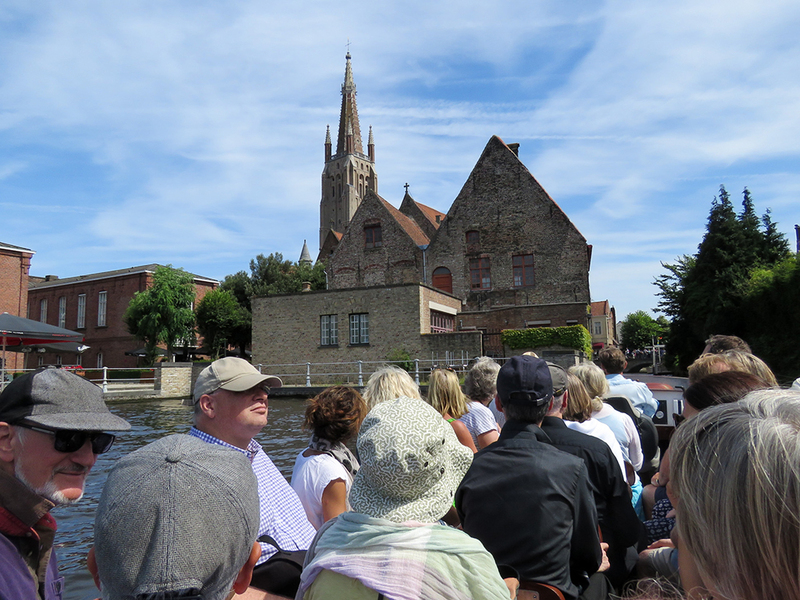 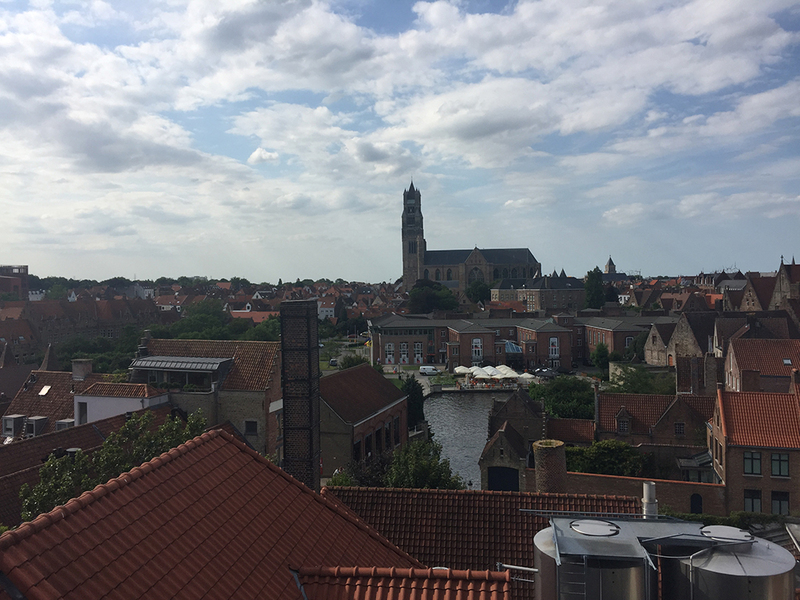 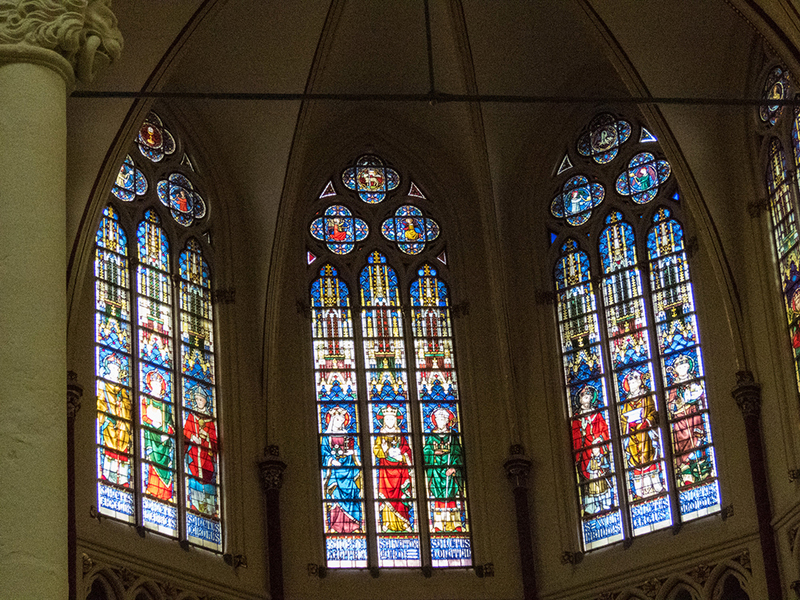 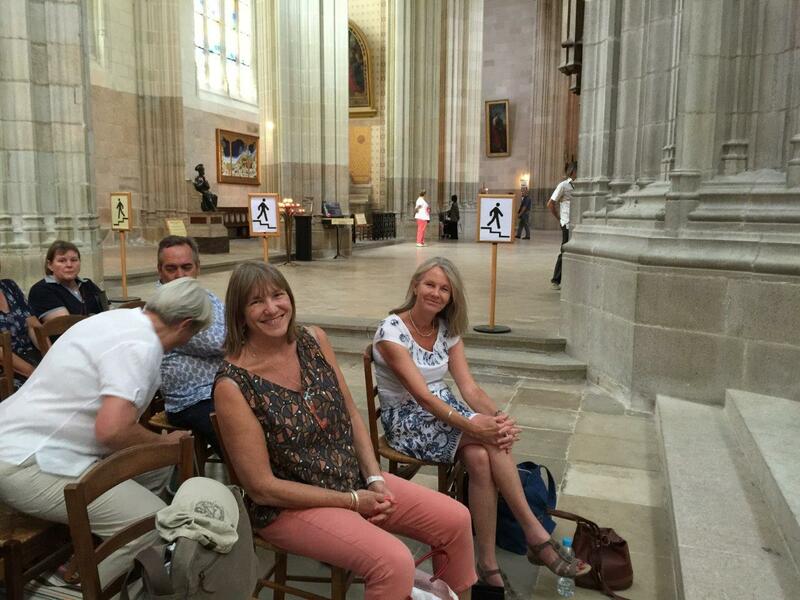 The Cathedral could not fit more people in (we tried….!) 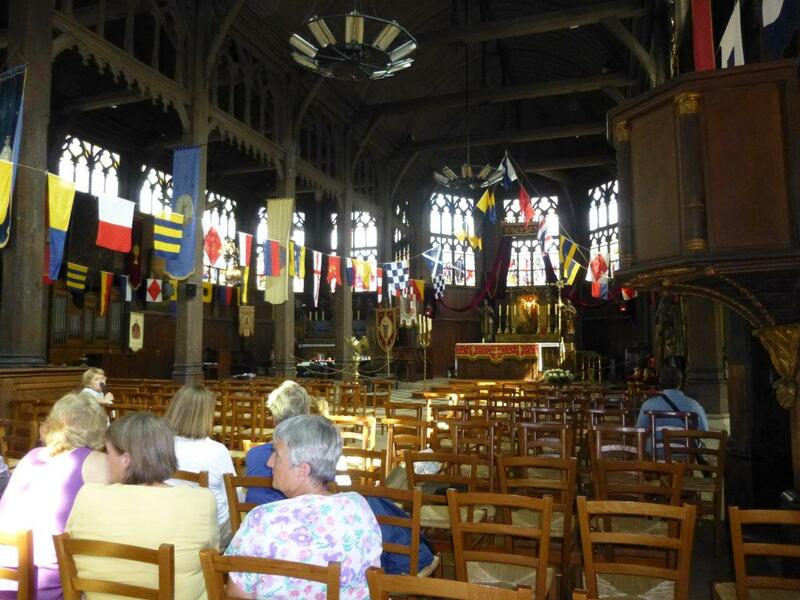 and the atmosphere was amazing. 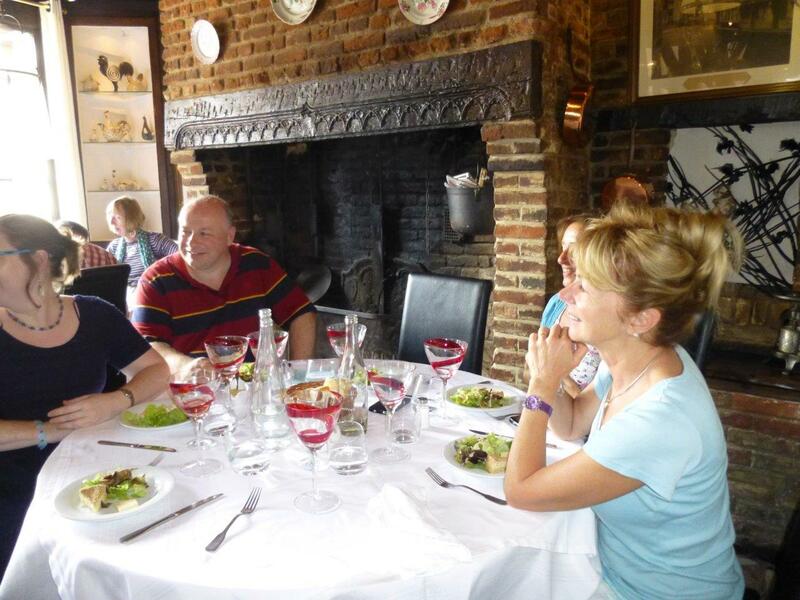 Everyone thoroughly enjoyed the experience and we will look forward to returning again in the near future! 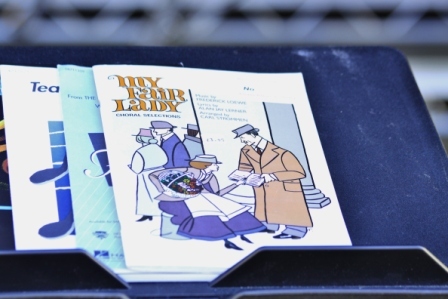 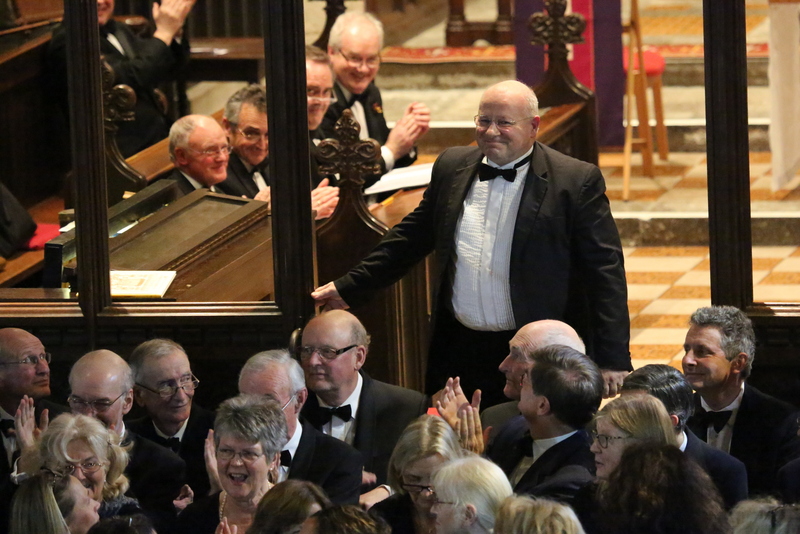 Many thanks to Liz Stedall’s son Ollie for this fine selection of photos. 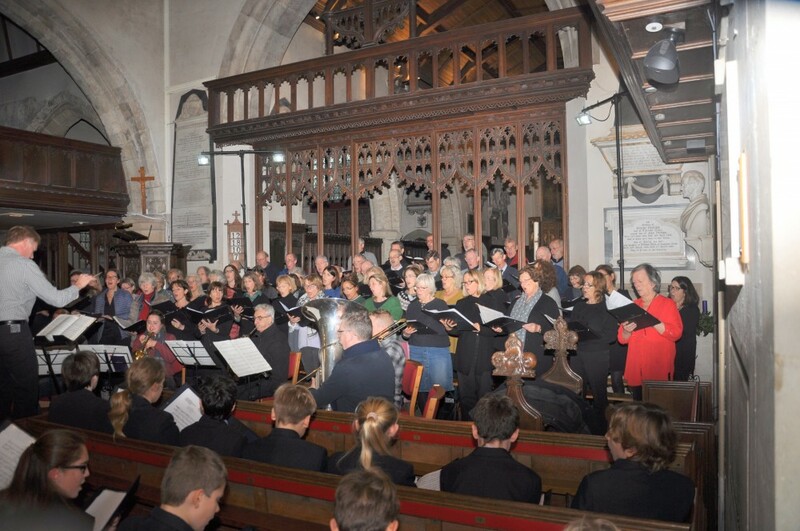 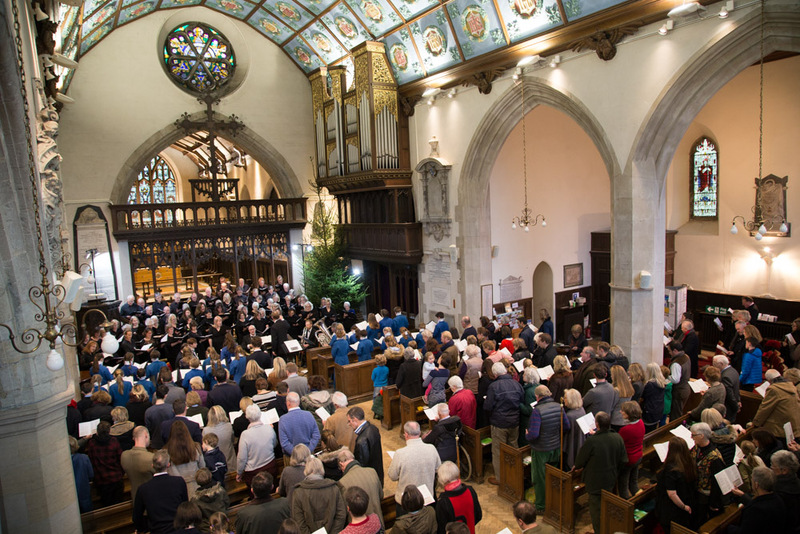 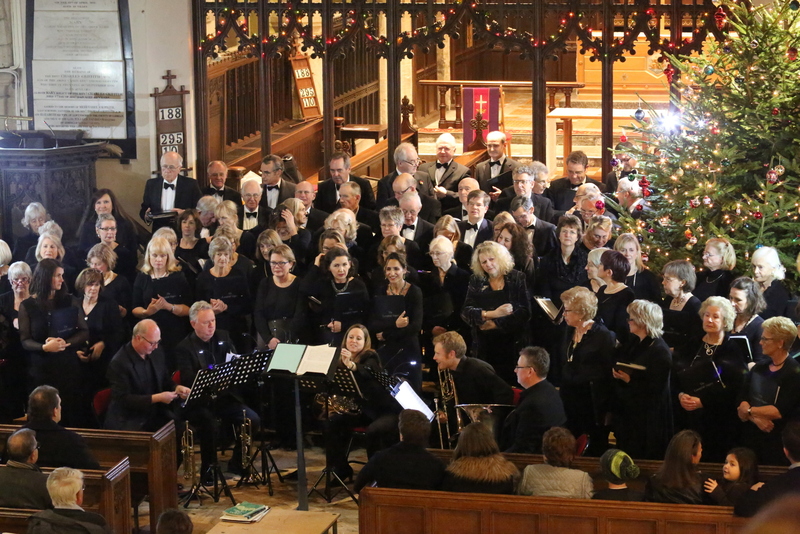 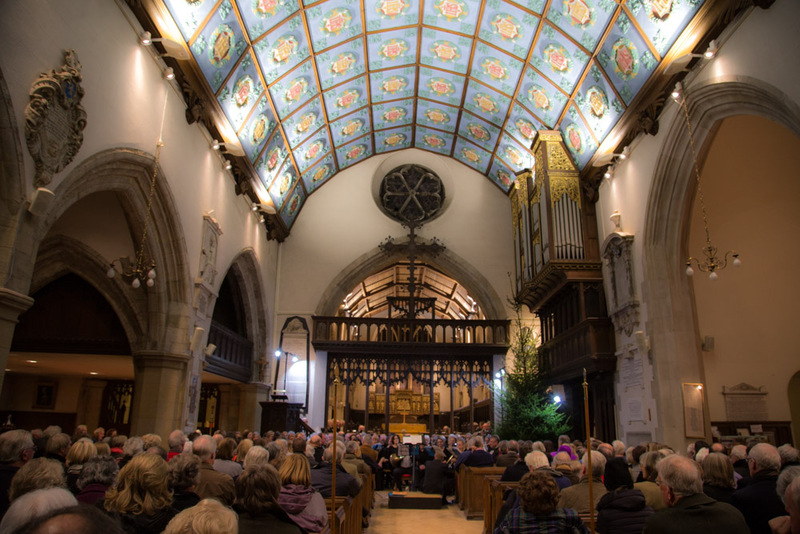 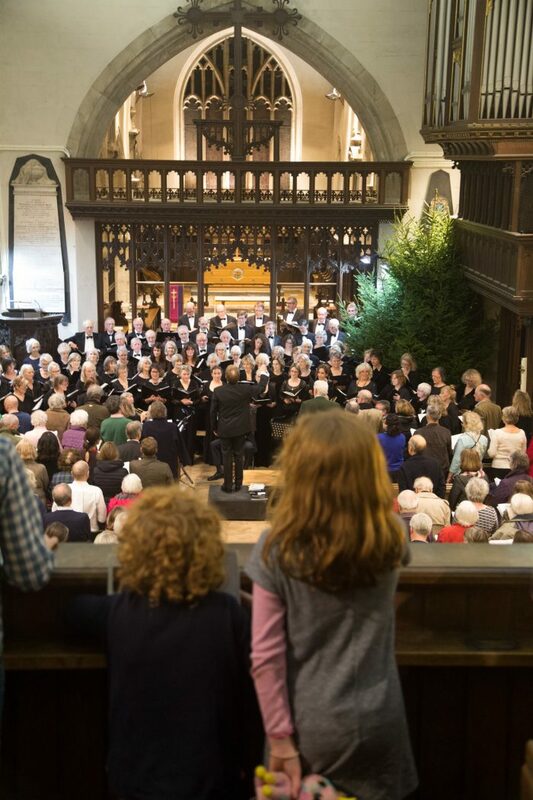 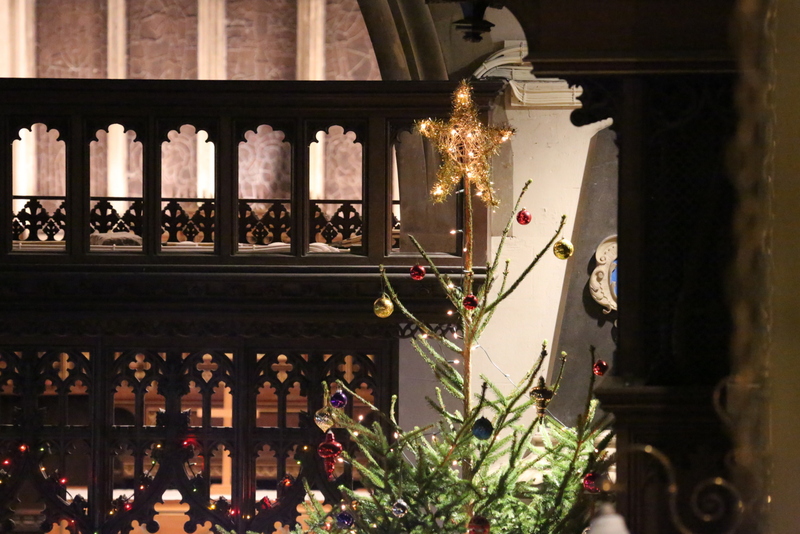 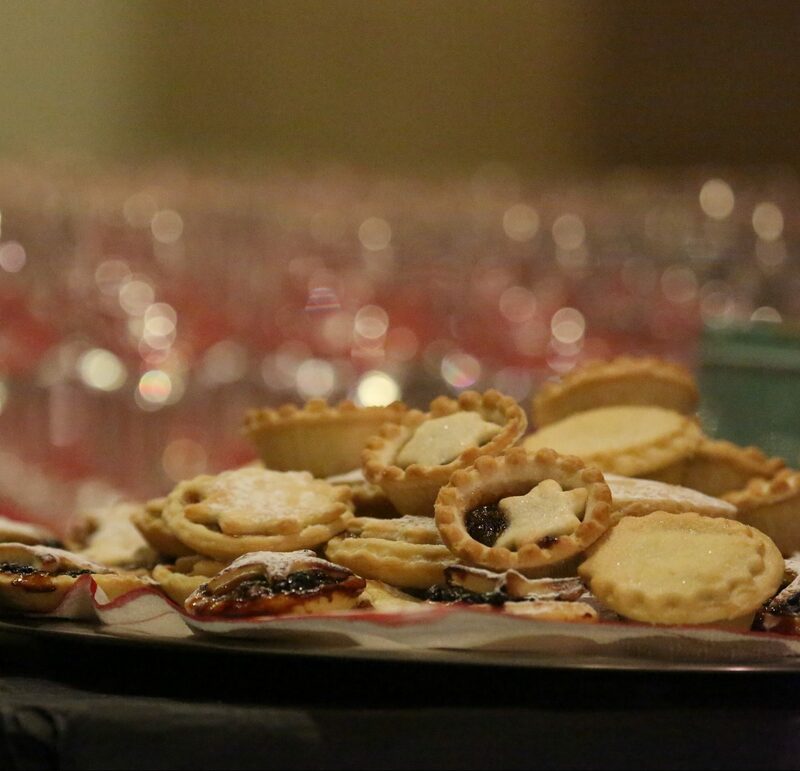 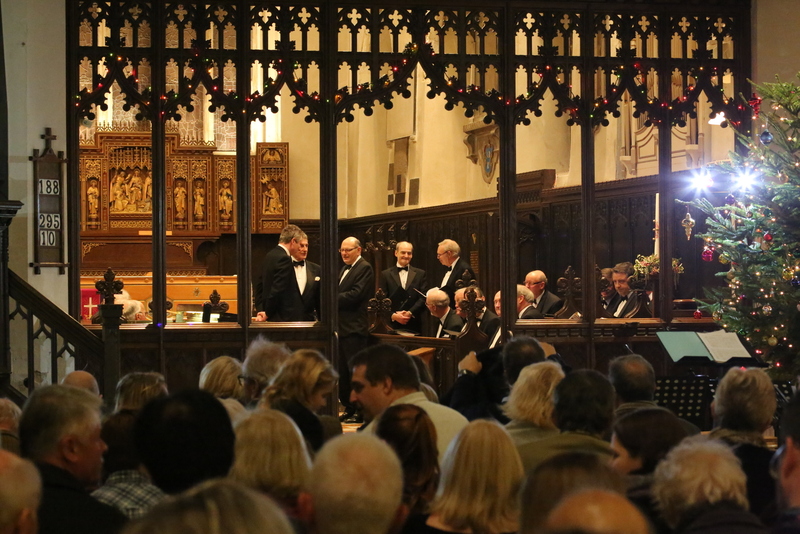 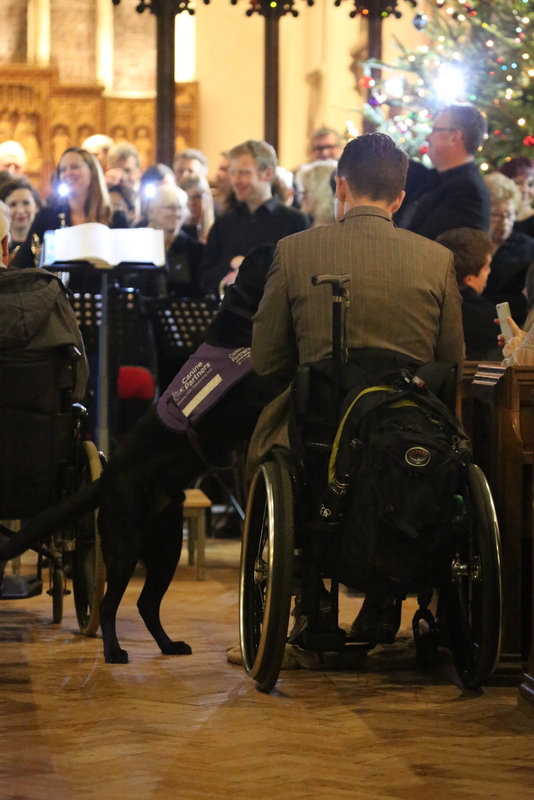 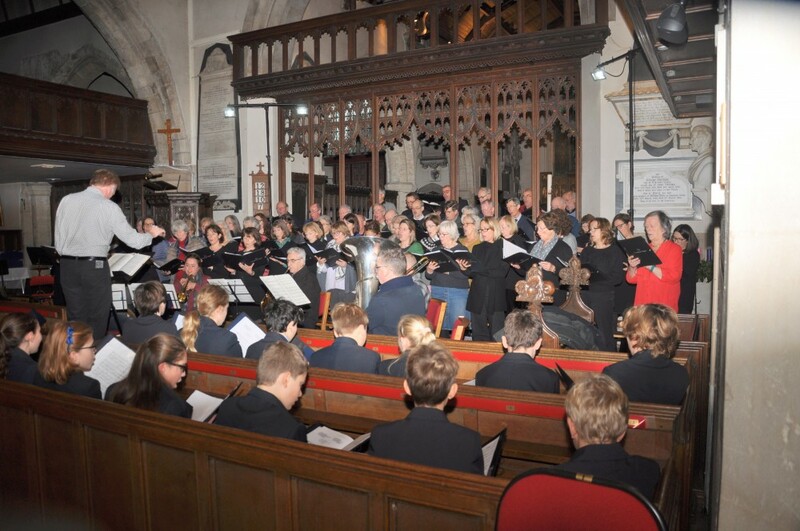 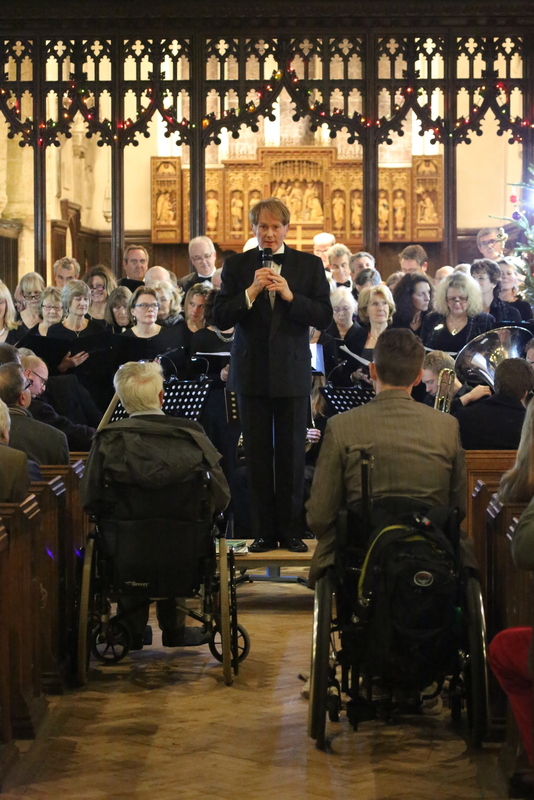 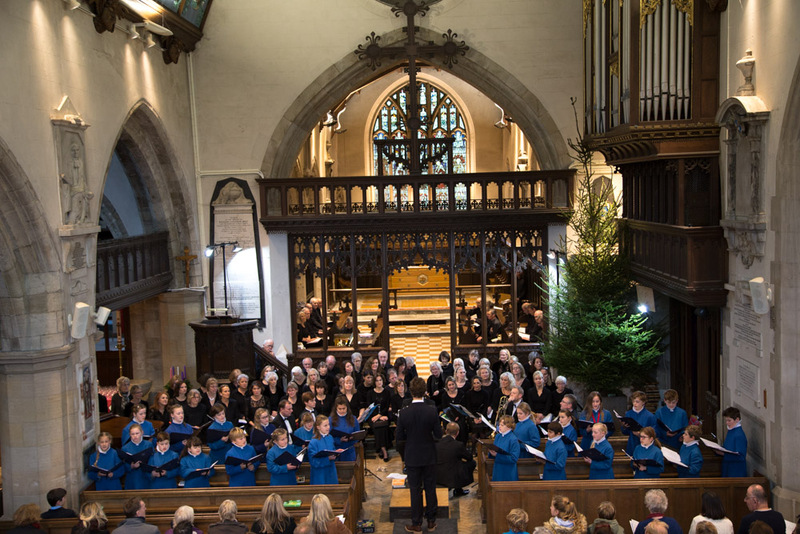 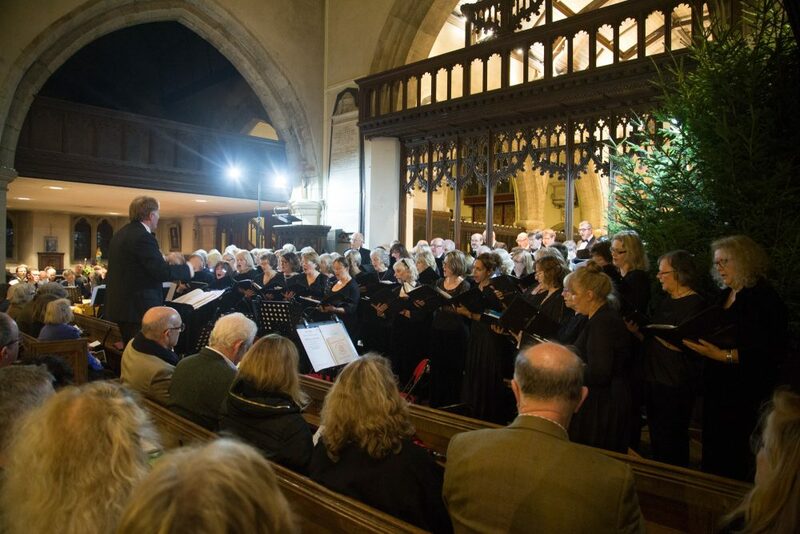 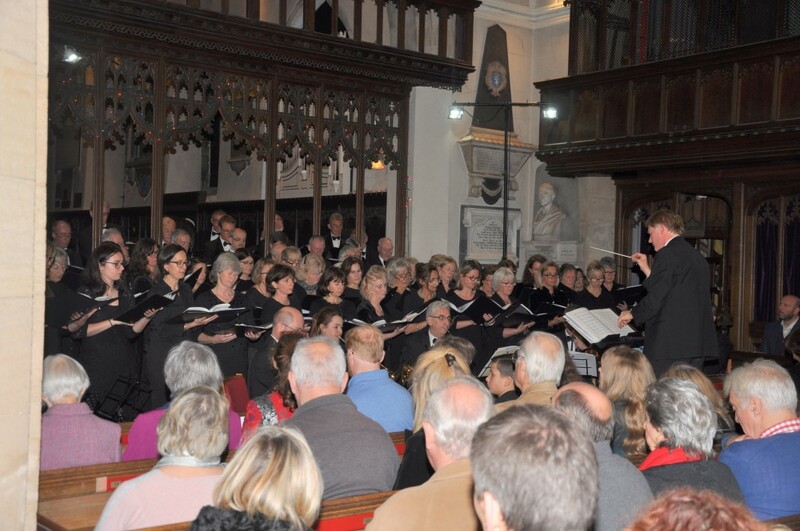 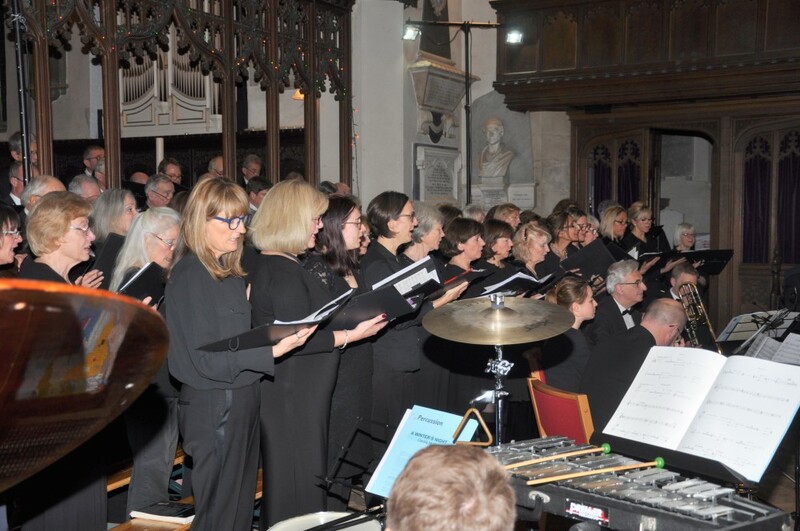 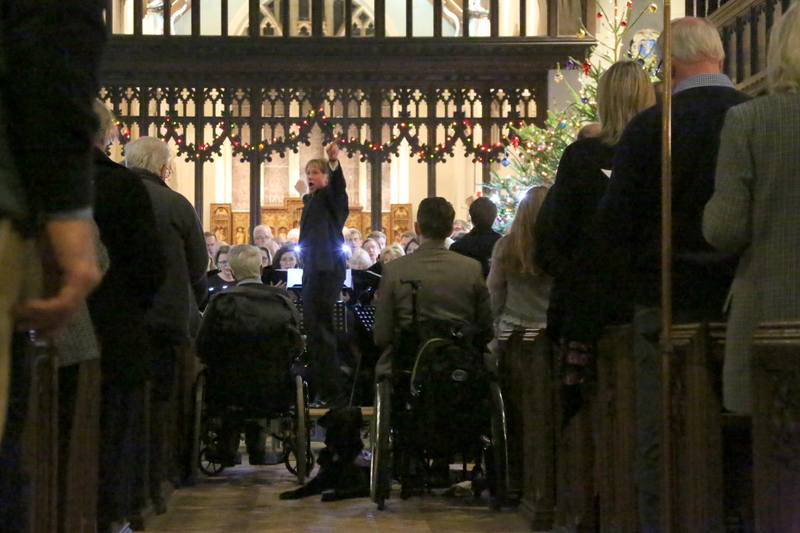 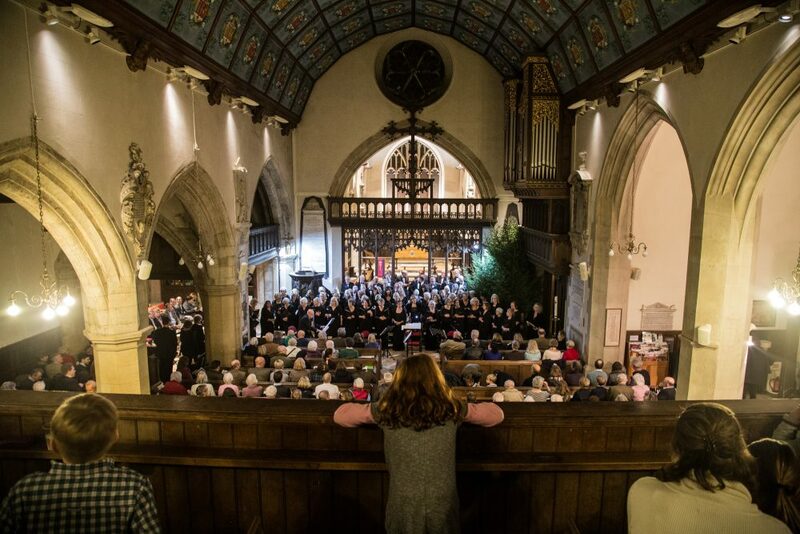 We had a record audience this year at everyone’s favourite Christmas Concert in Petworth! 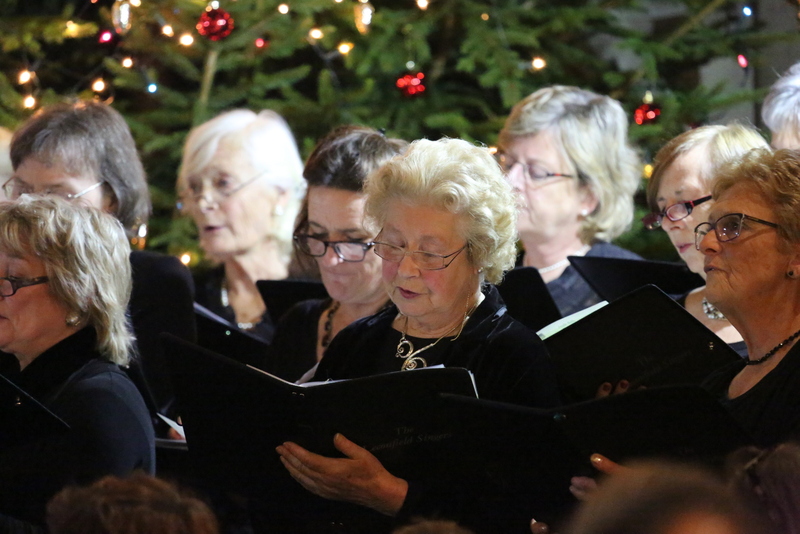 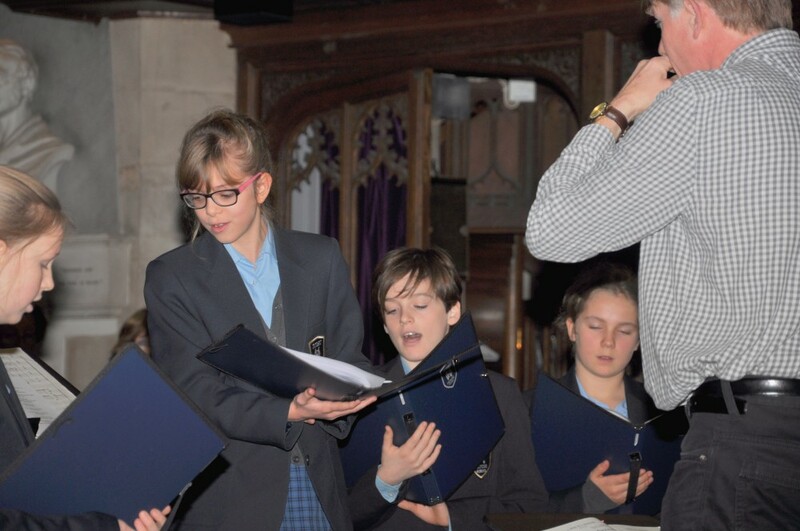 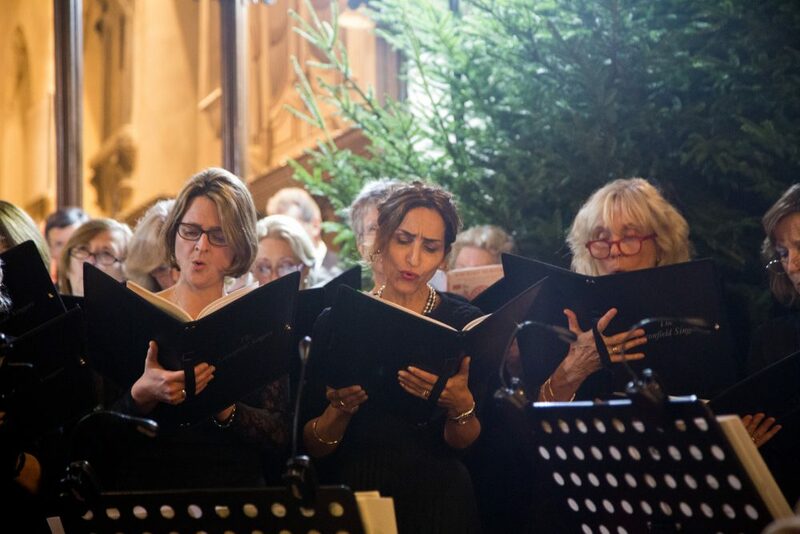 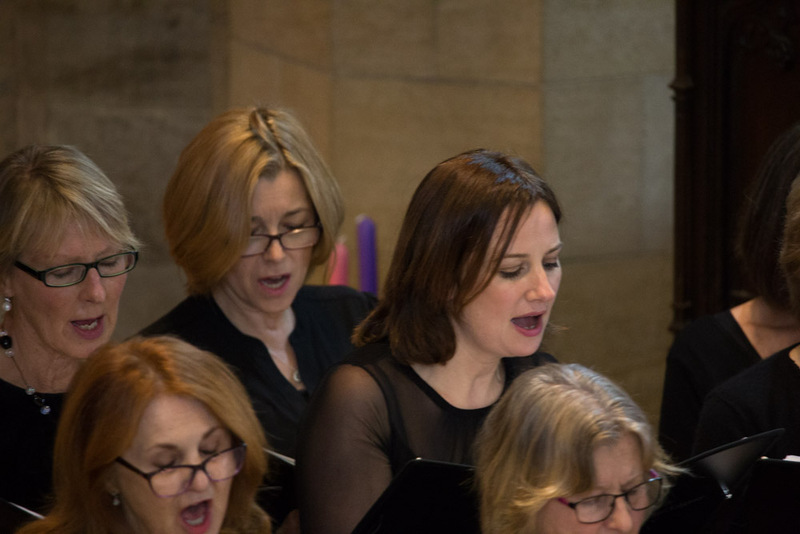 We sang Carols from around the World – from Spain, Wales, France, Germany and Canada (not to mention England!). 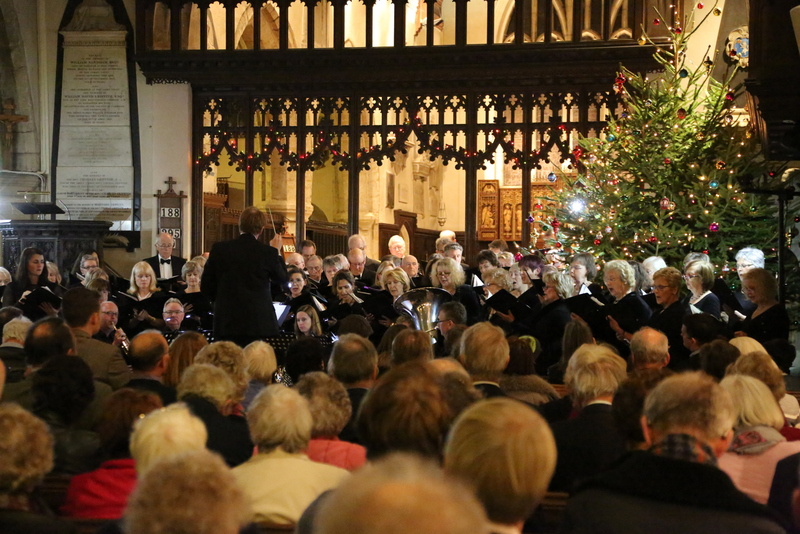 We also listened to some lovely seasonal pieces by English Philharmonia, and sang the usual favourite Christmas Carols with our enthusiastic audience! 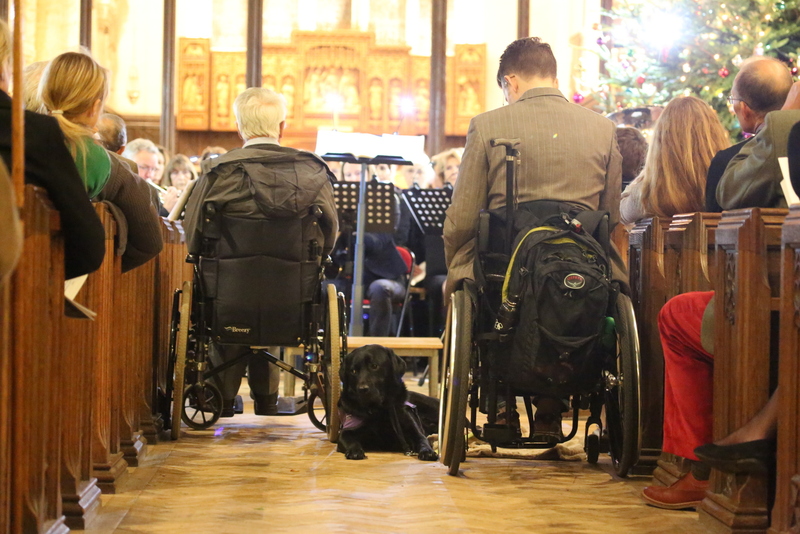 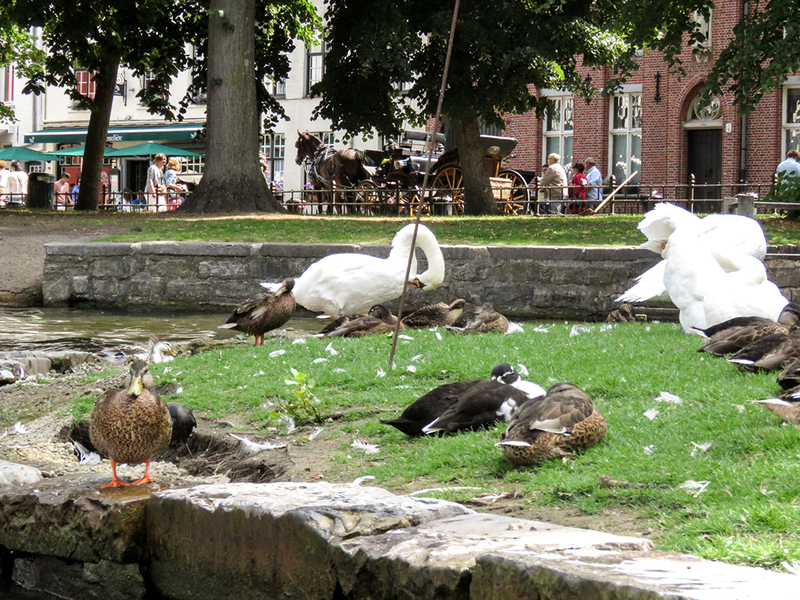 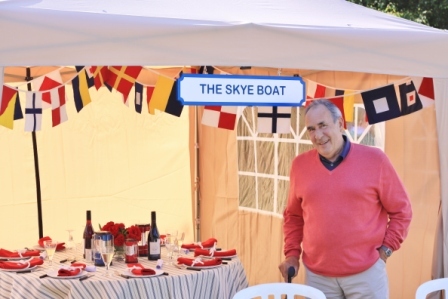 Many thanks to Liz Stedall’s son for this selection of photos. 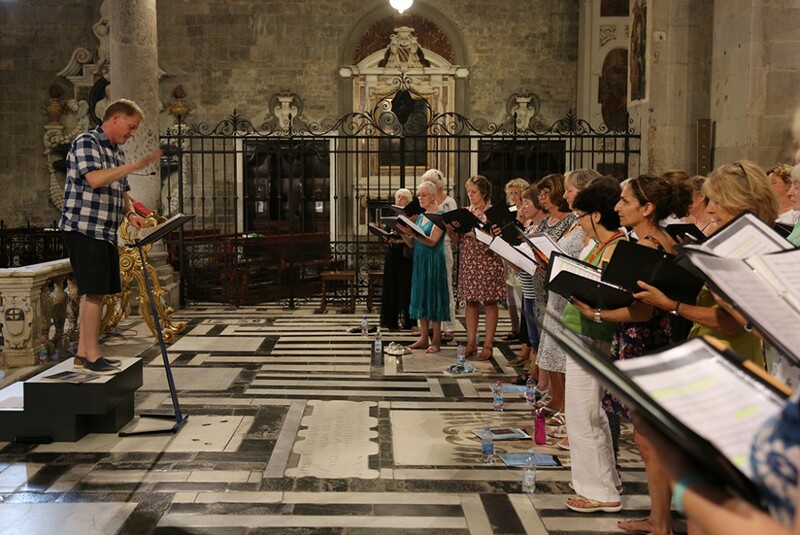 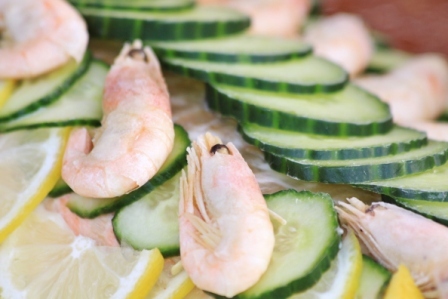 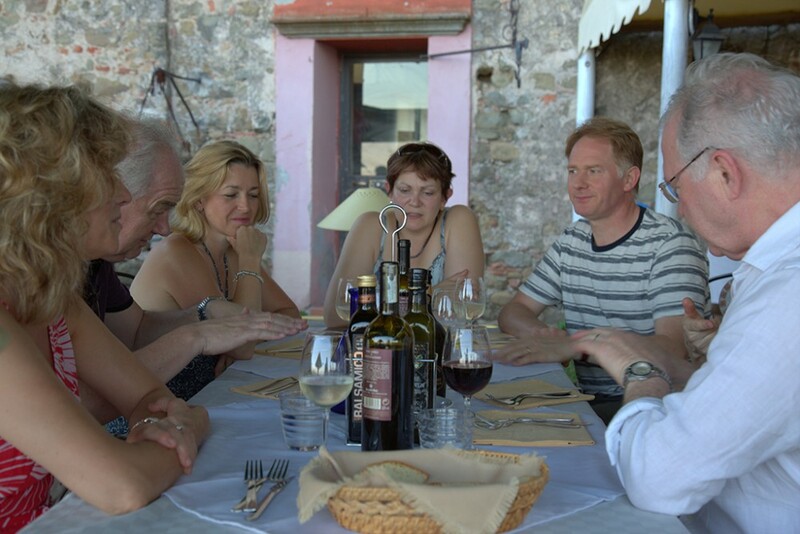 We came, we saw, we ate and most of all we sang in Tuscany this year!! 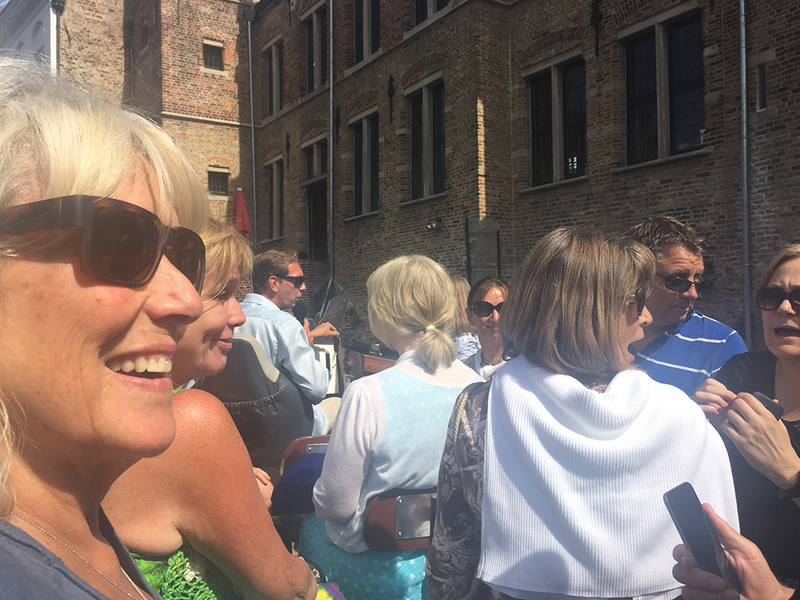 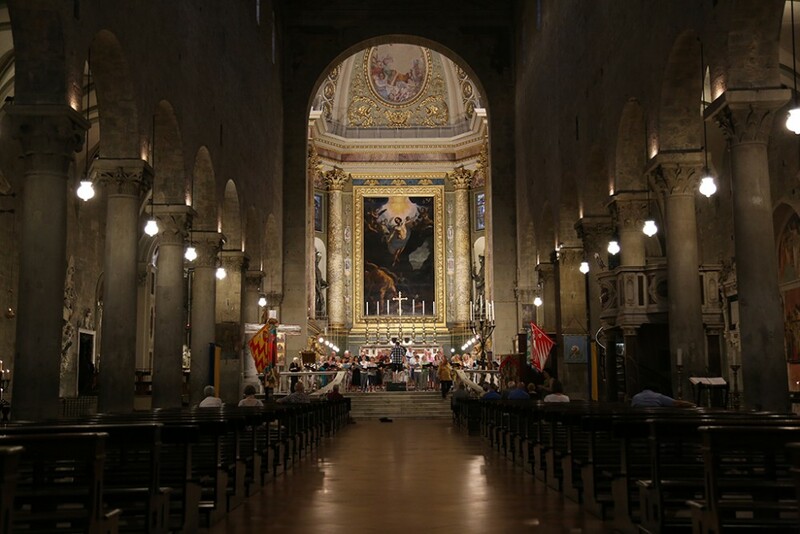 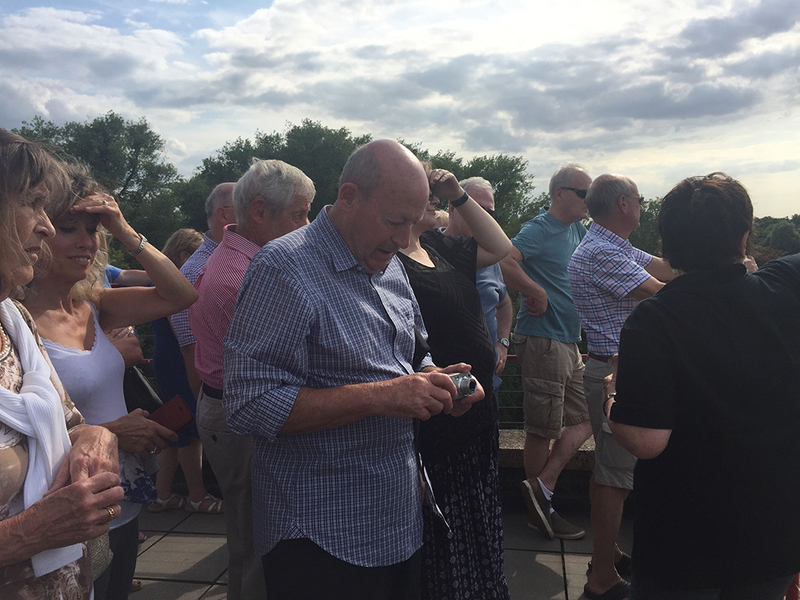 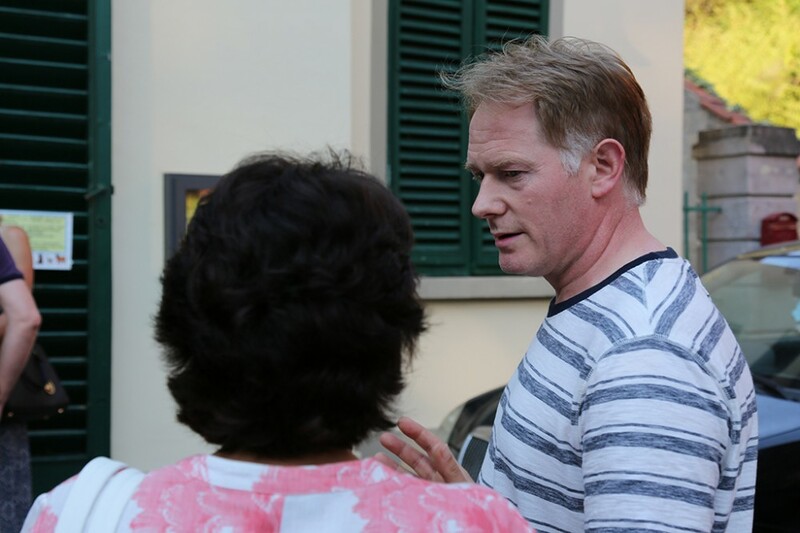 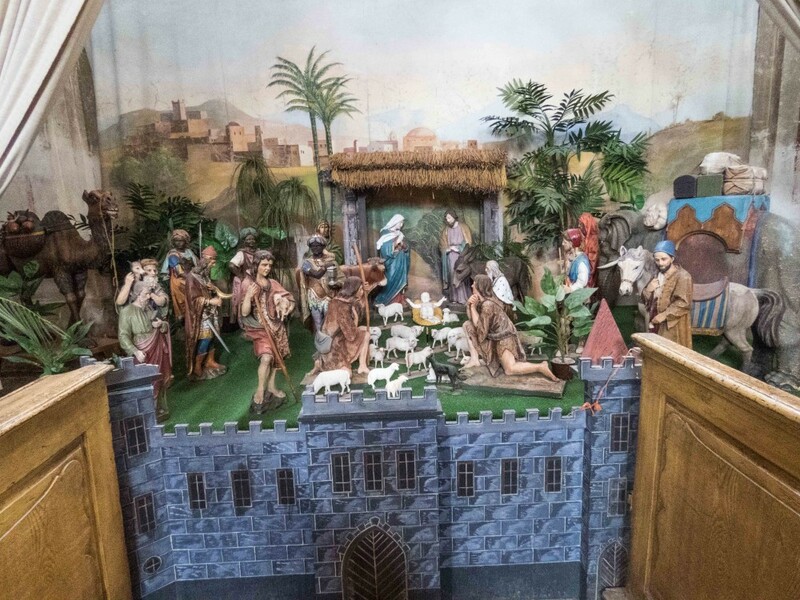 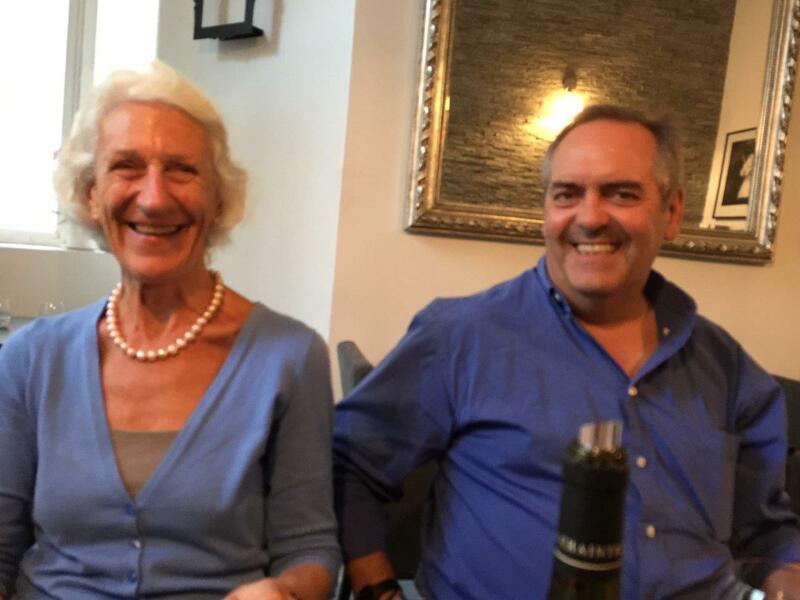 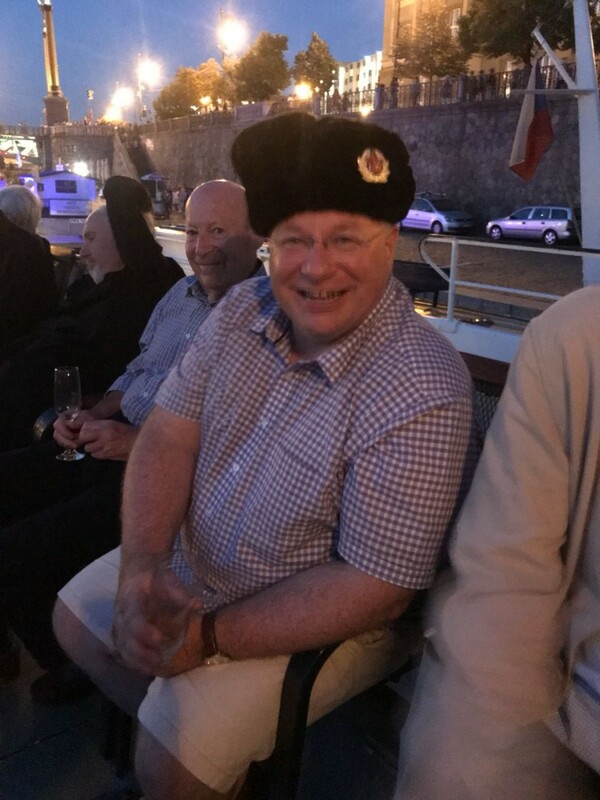 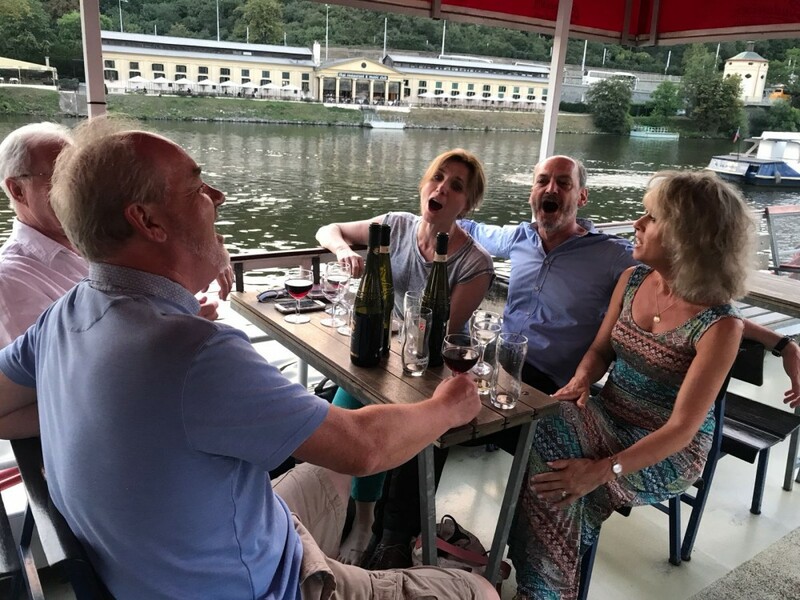 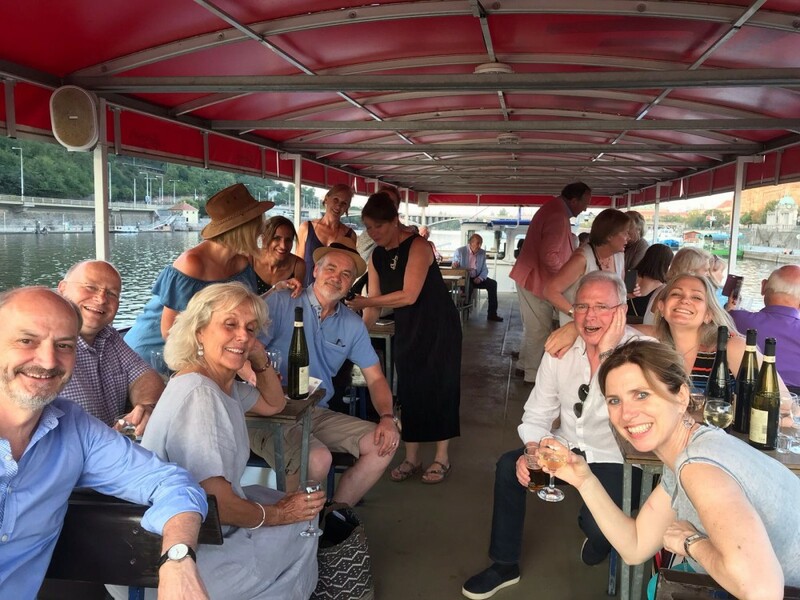 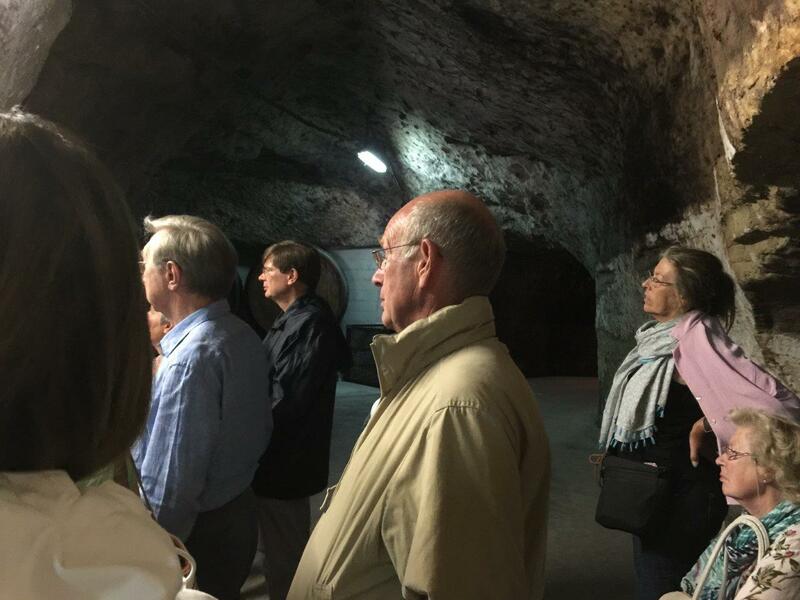 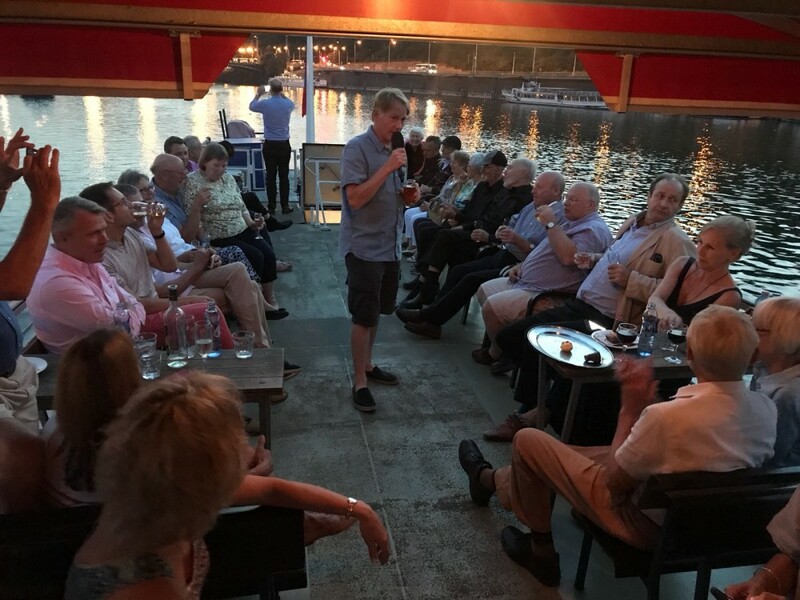 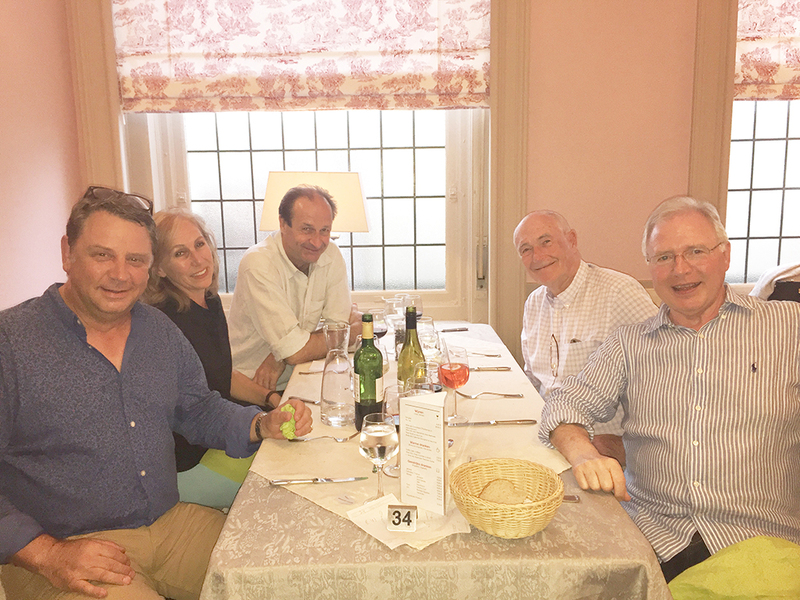 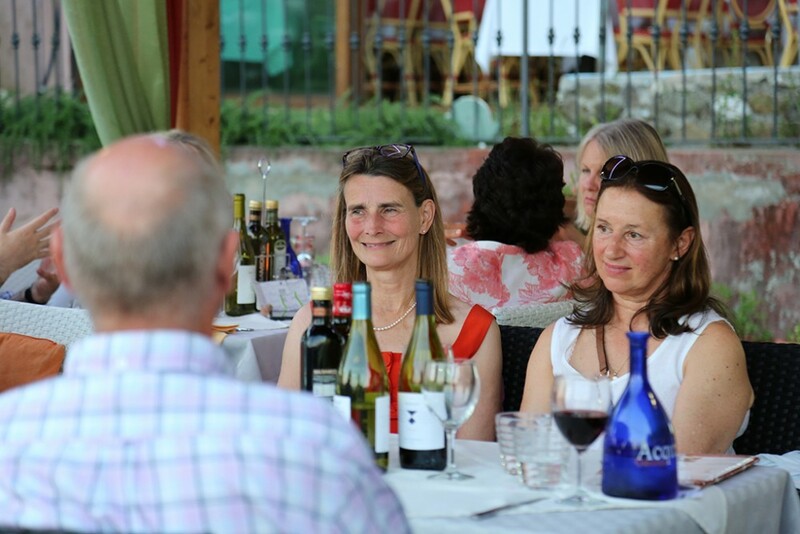 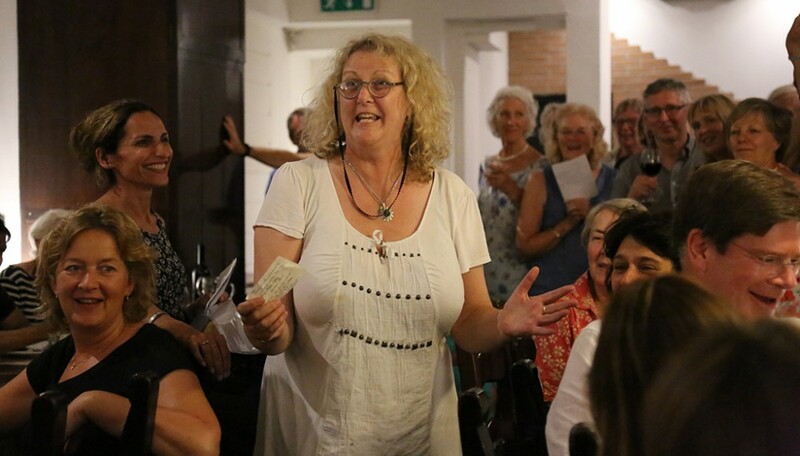 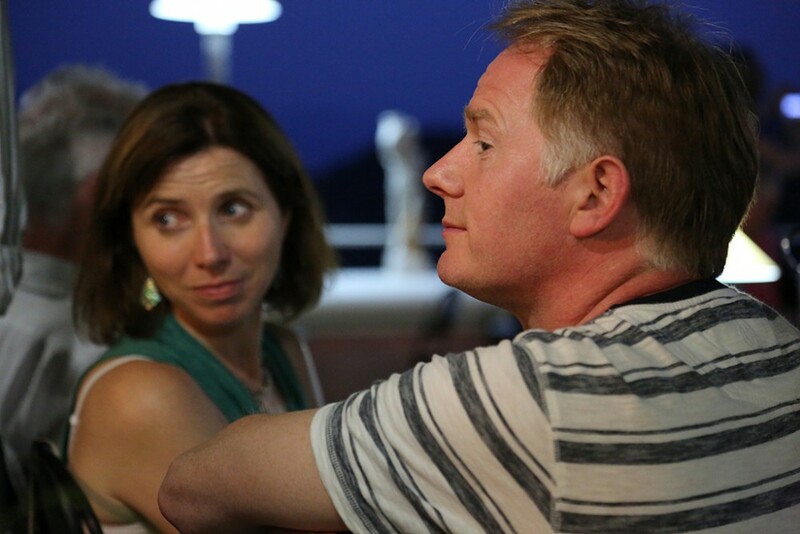 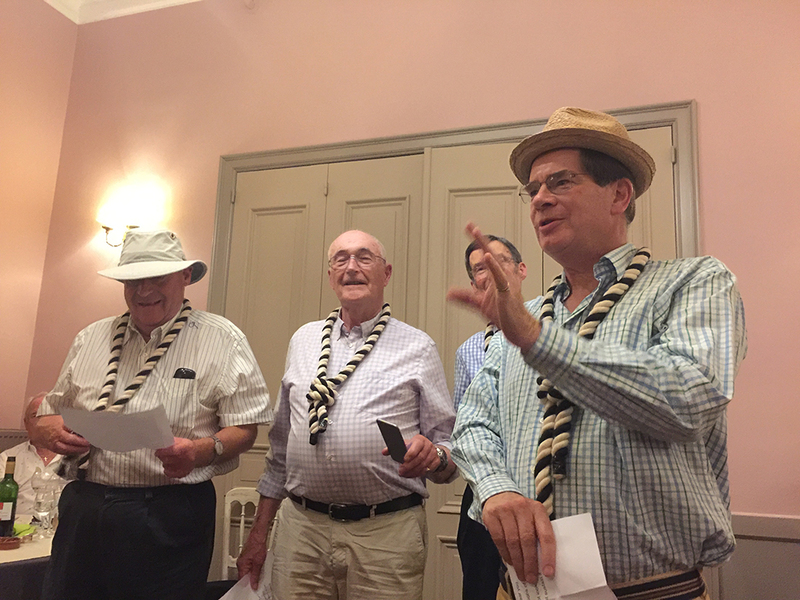 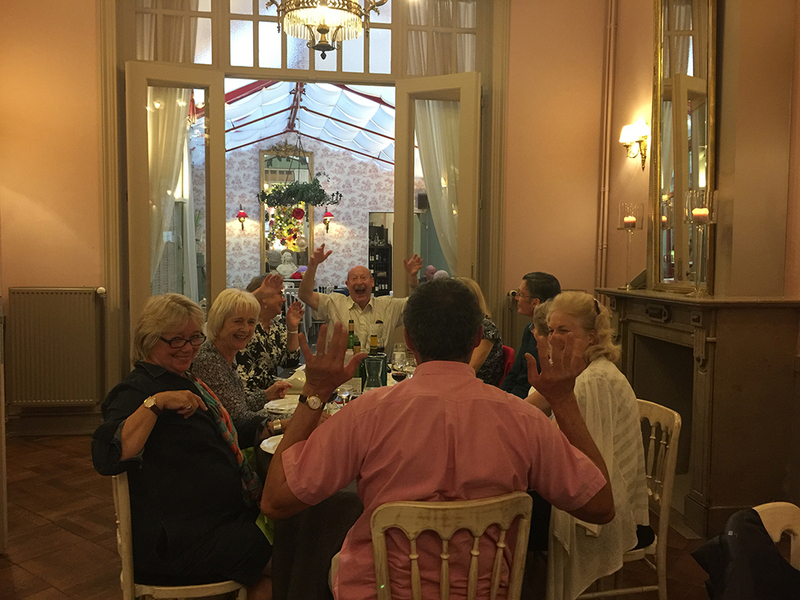 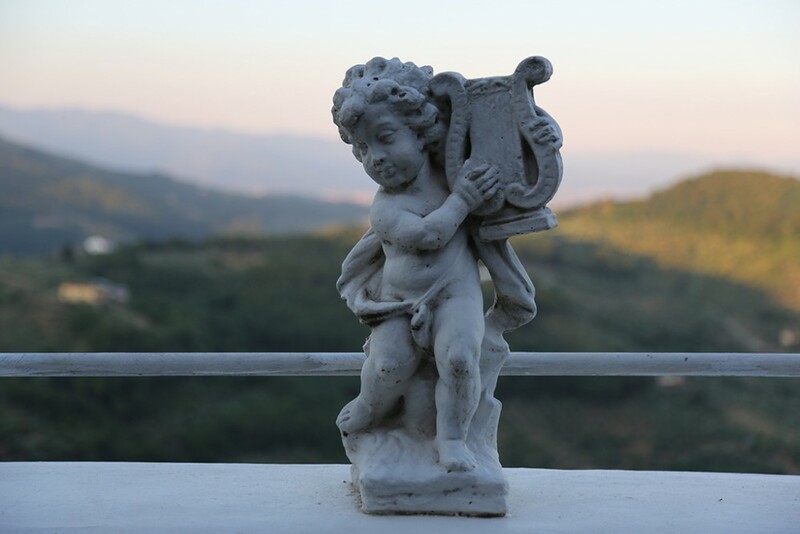 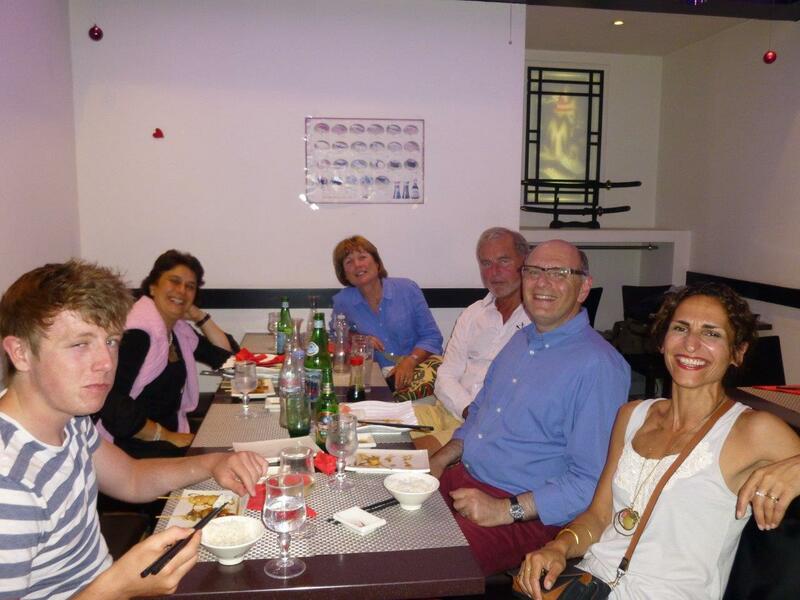 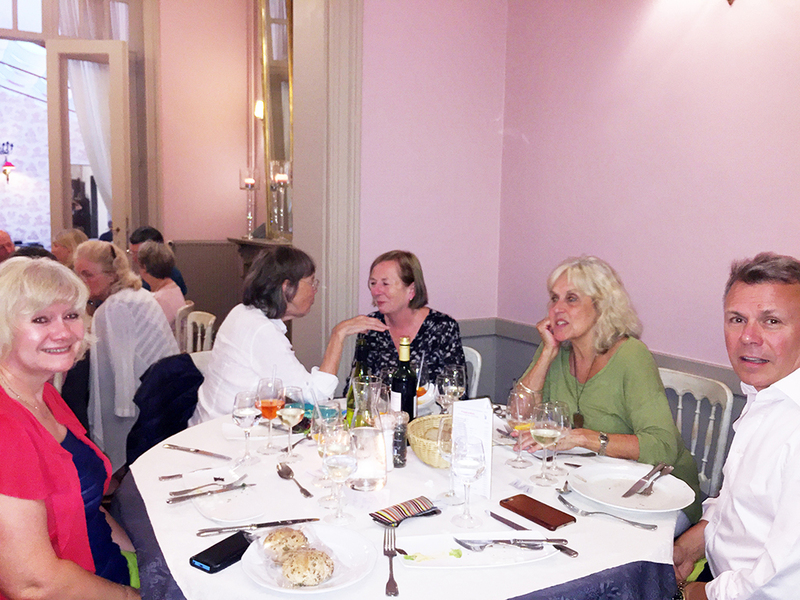 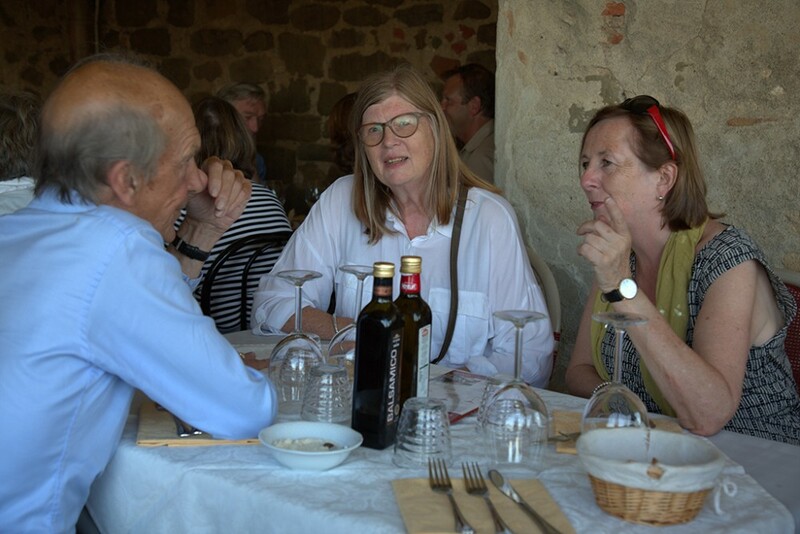 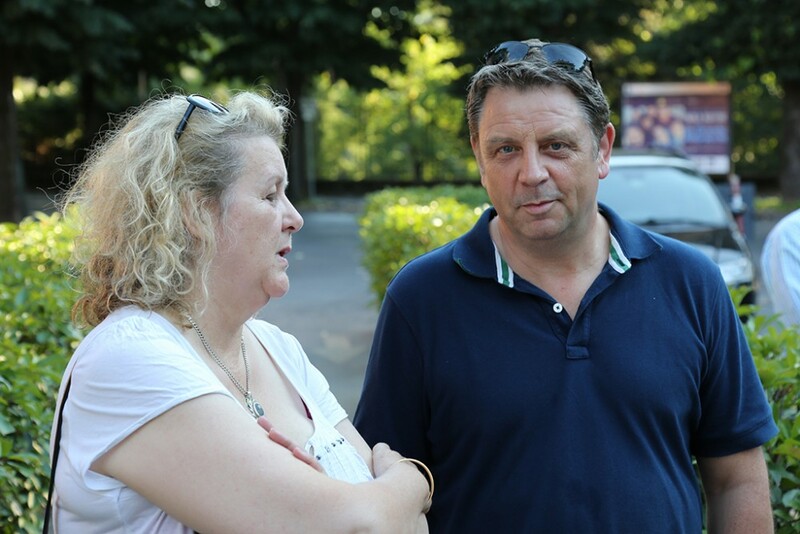 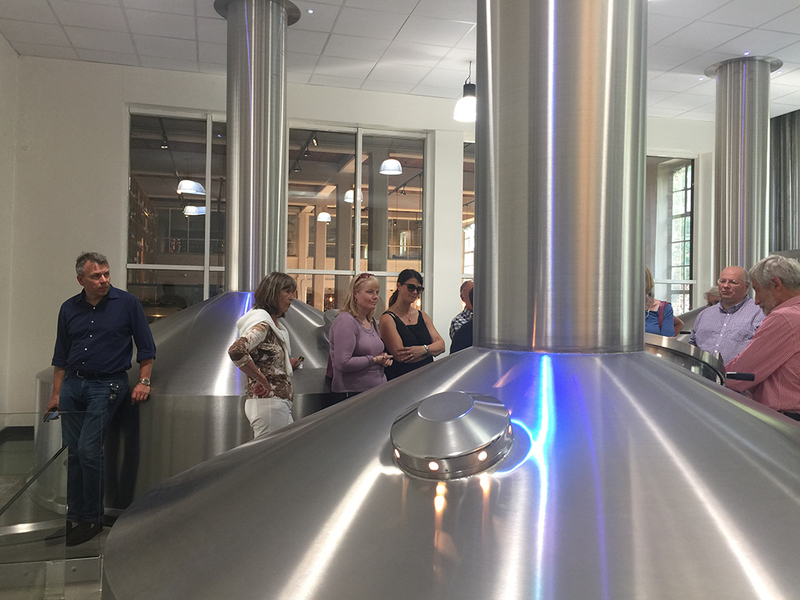 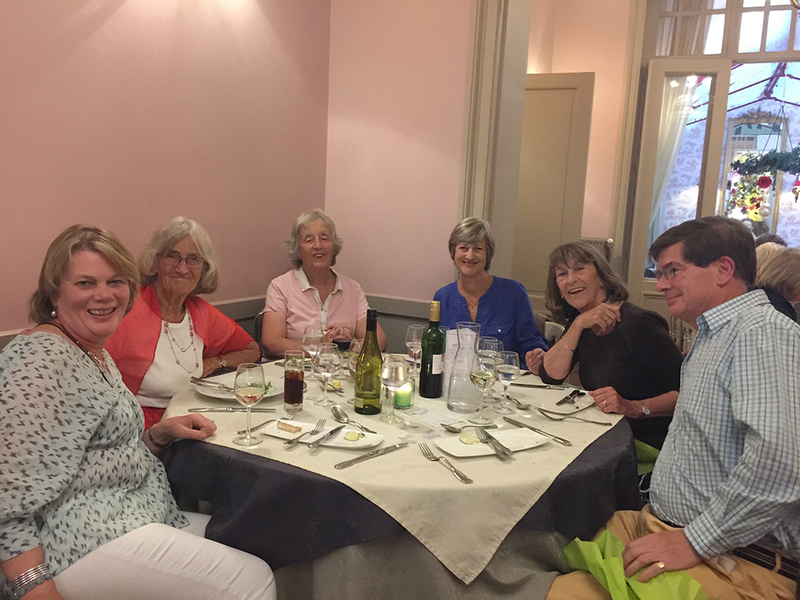 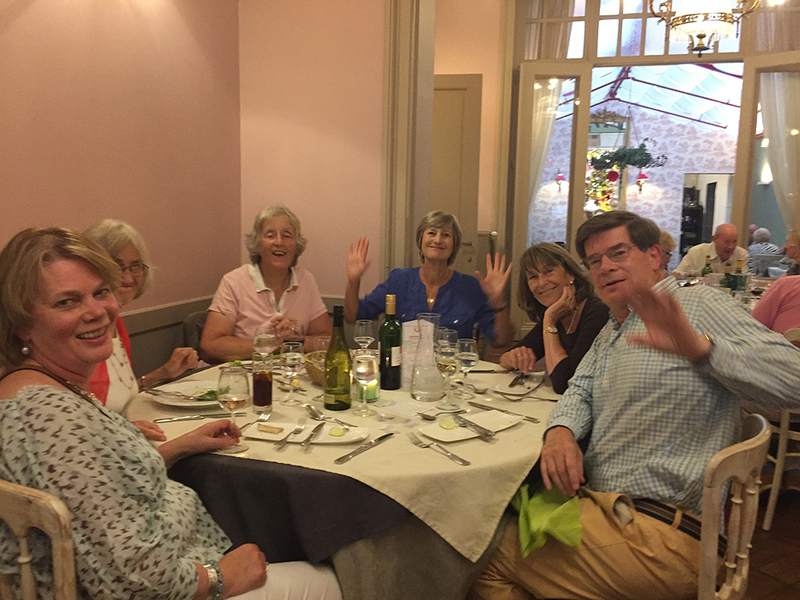 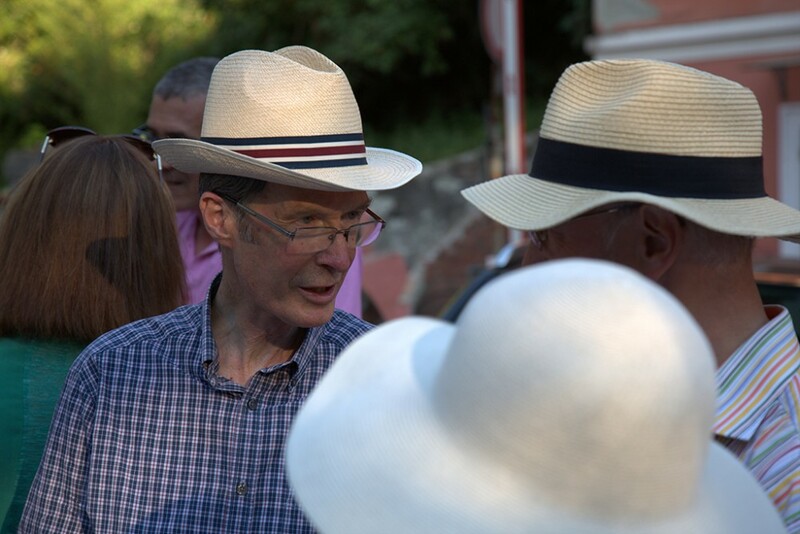 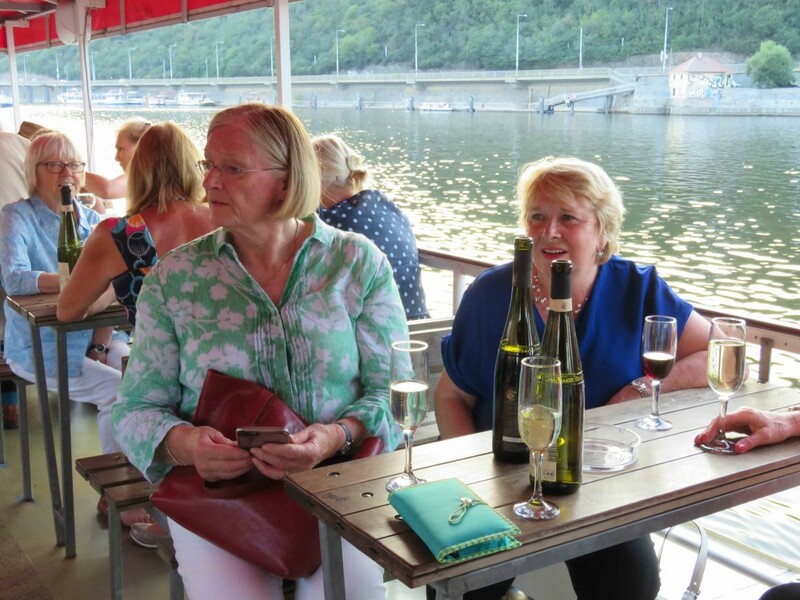 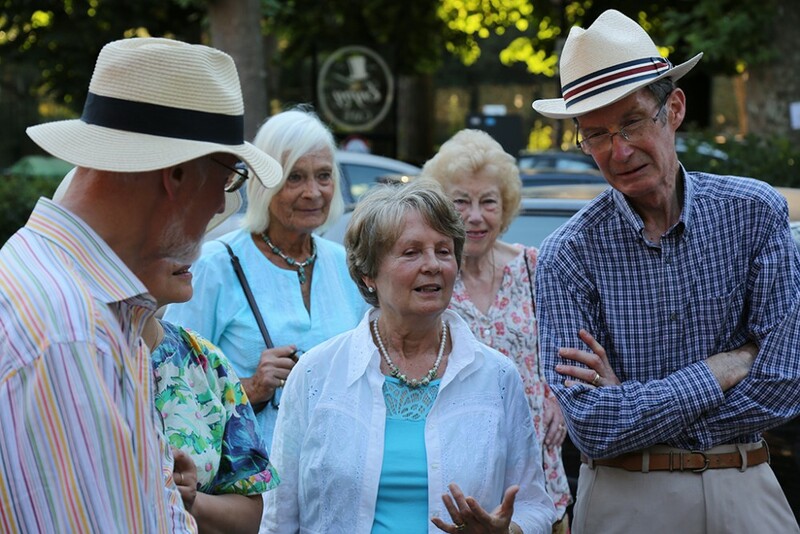 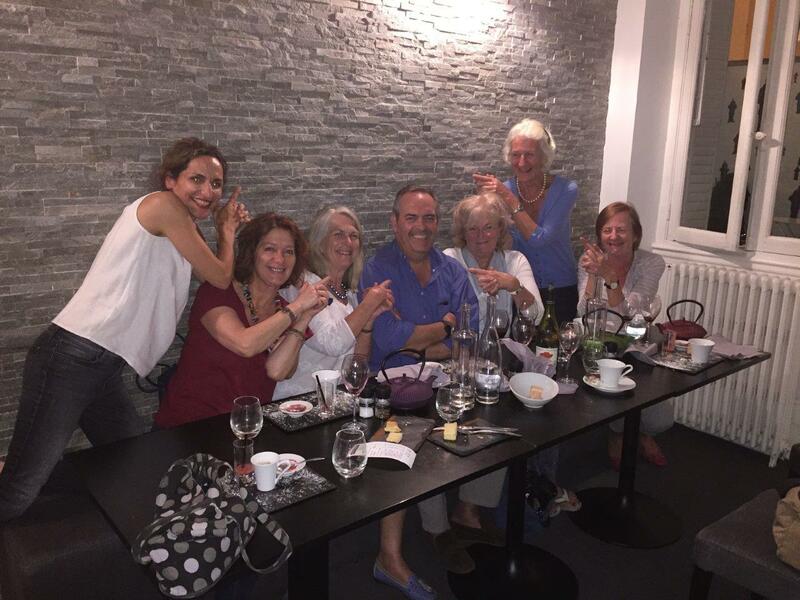 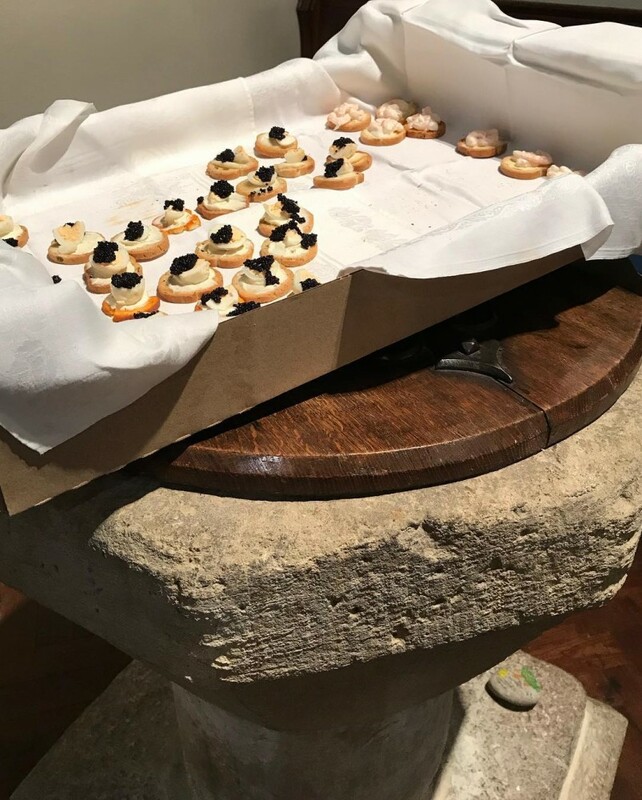 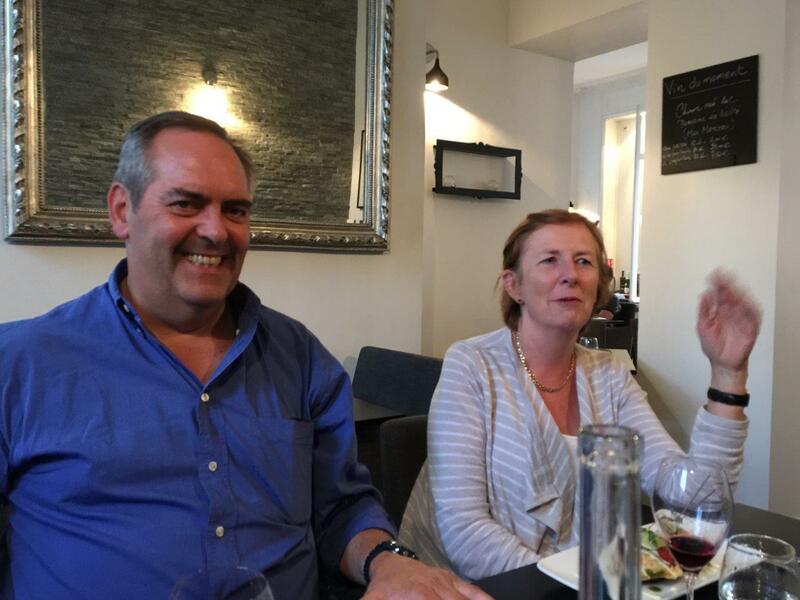 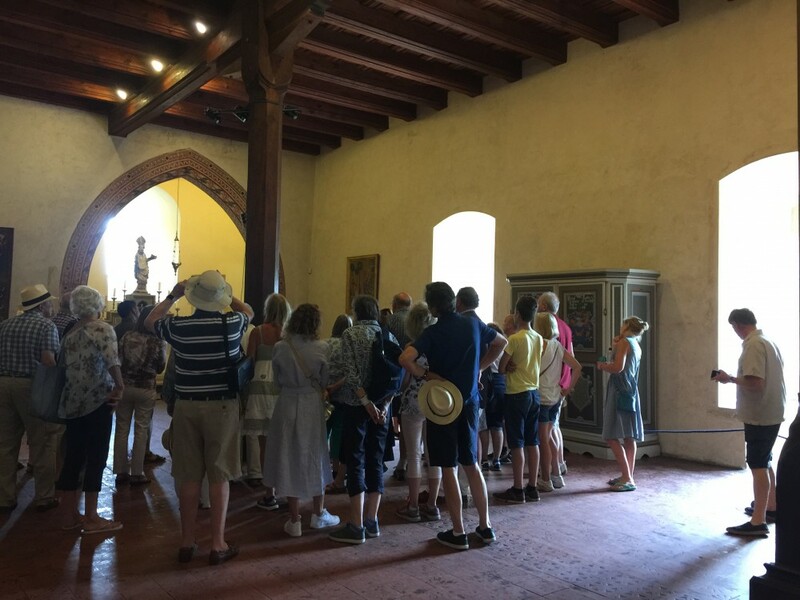 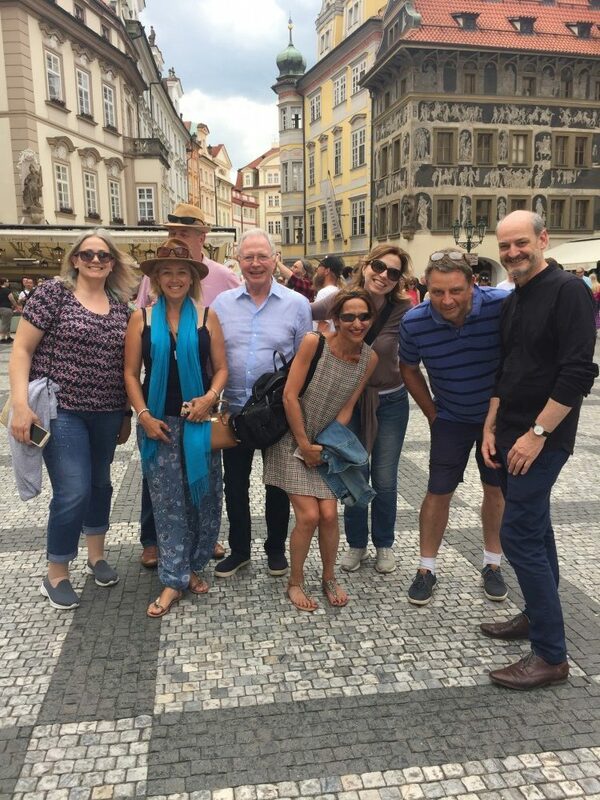 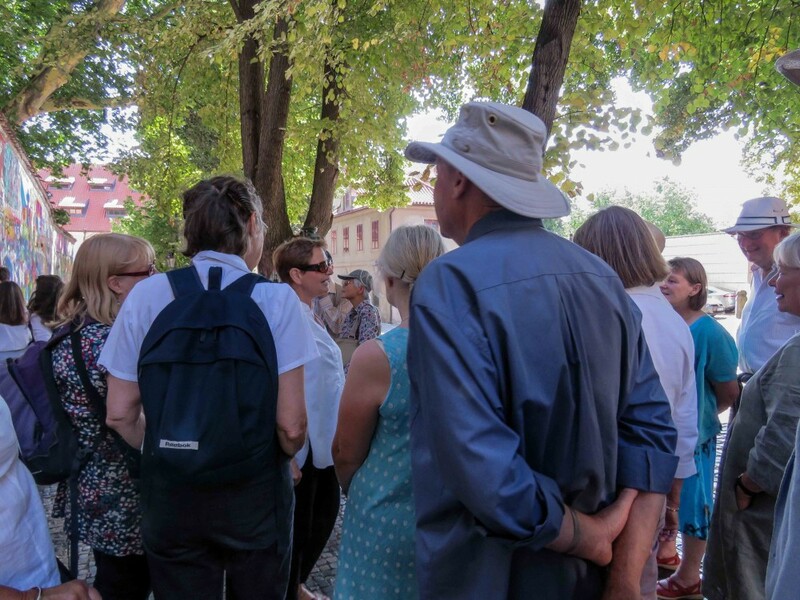 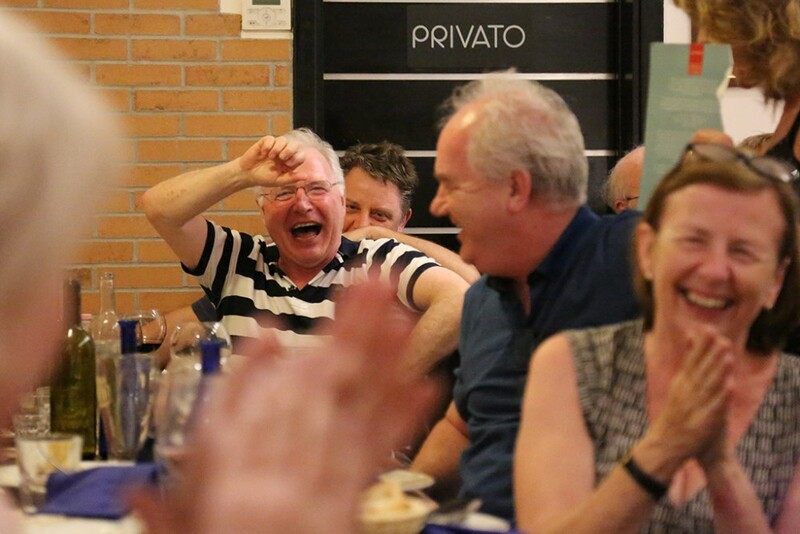 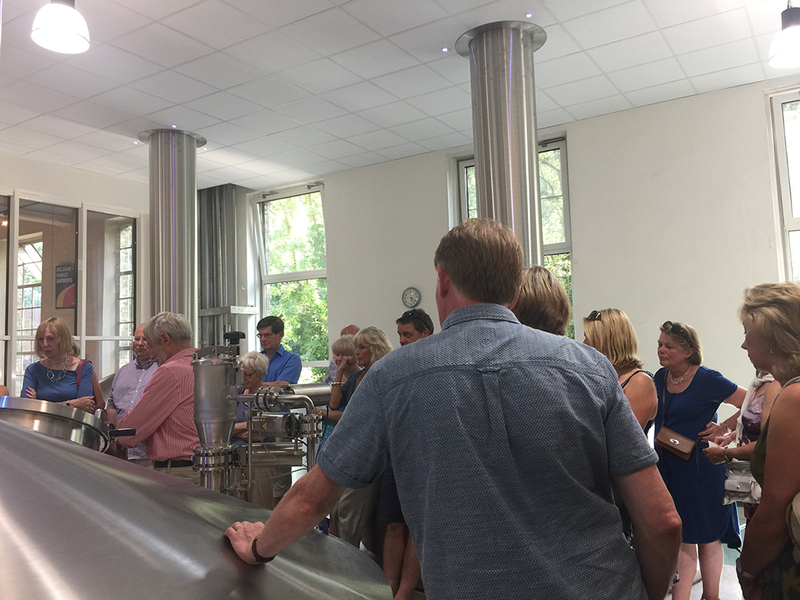 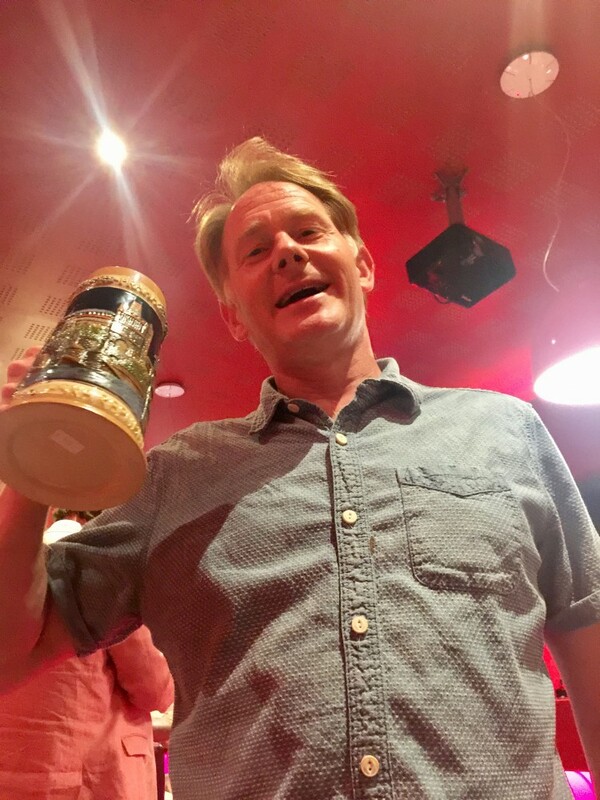 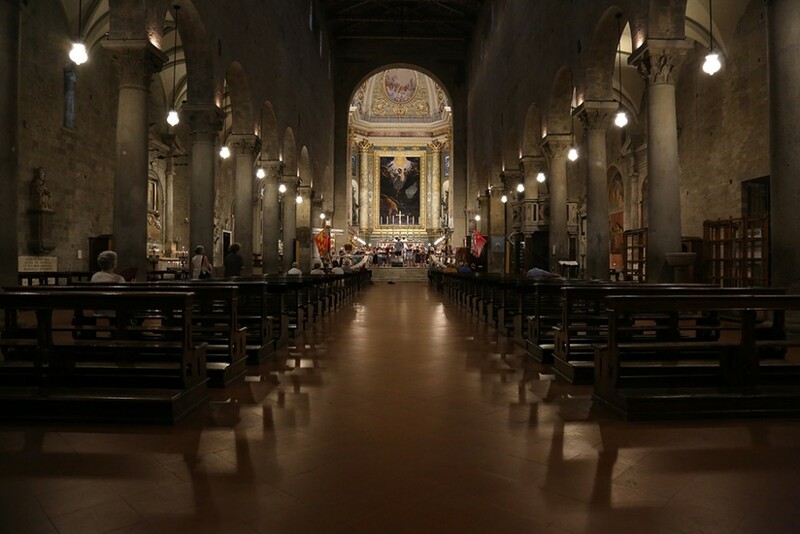 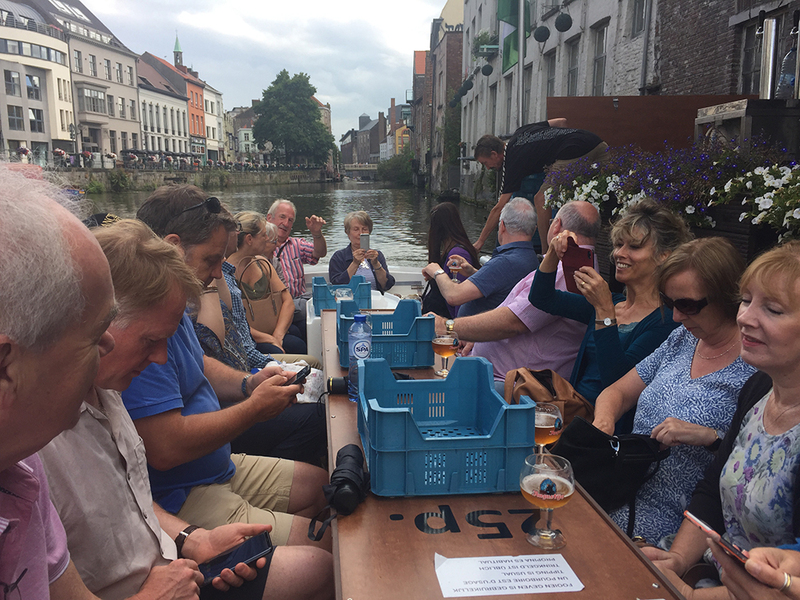 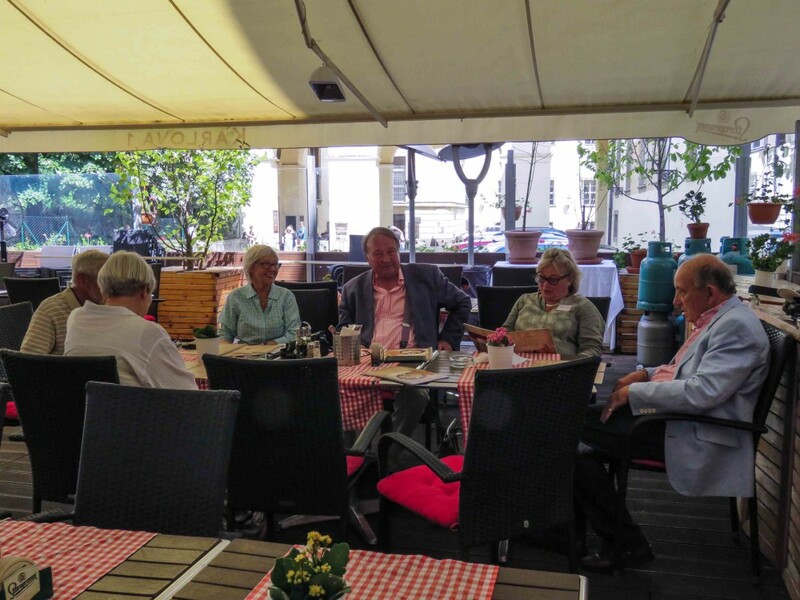 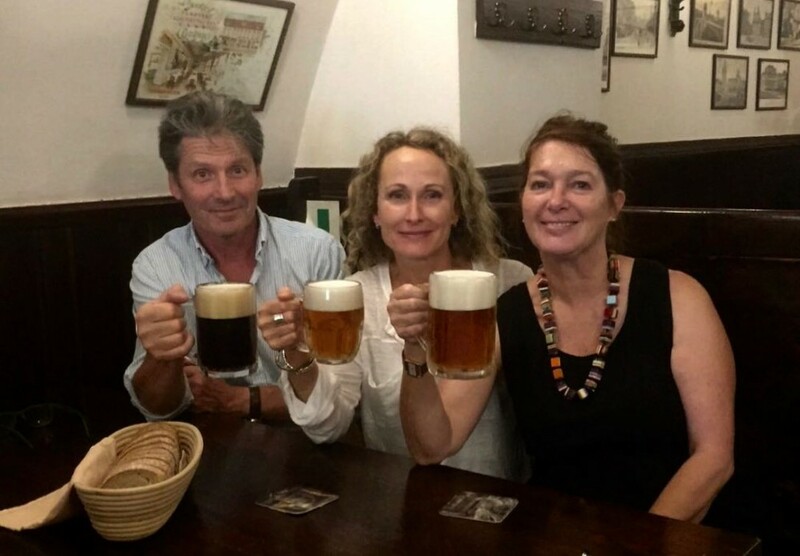 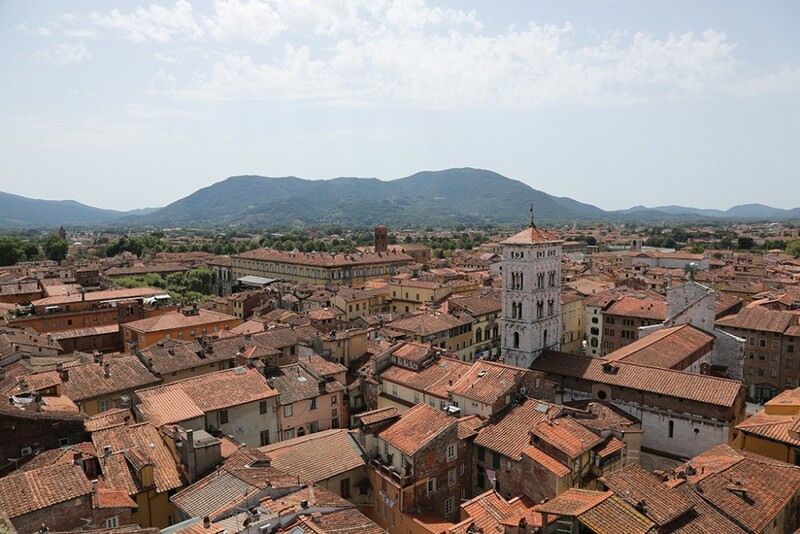 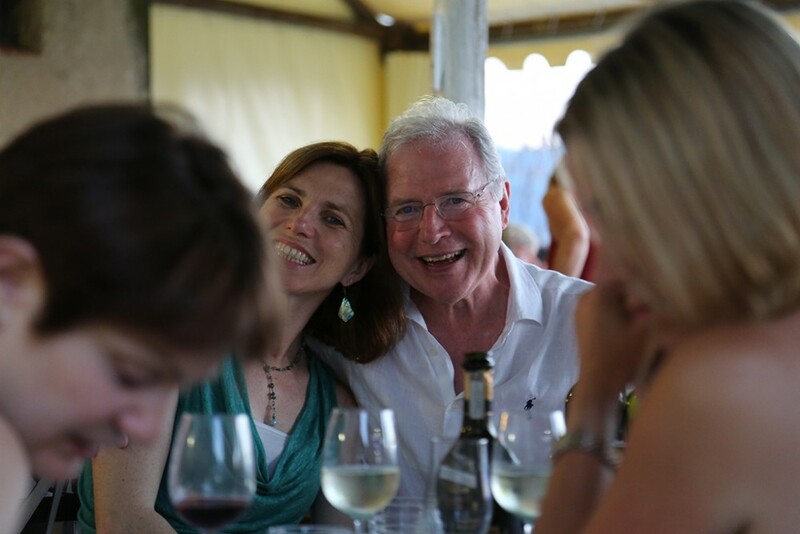 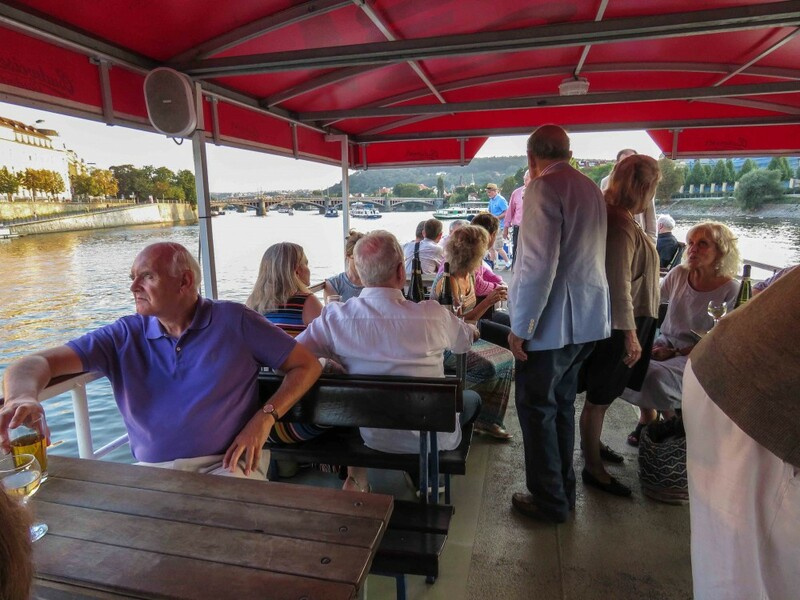 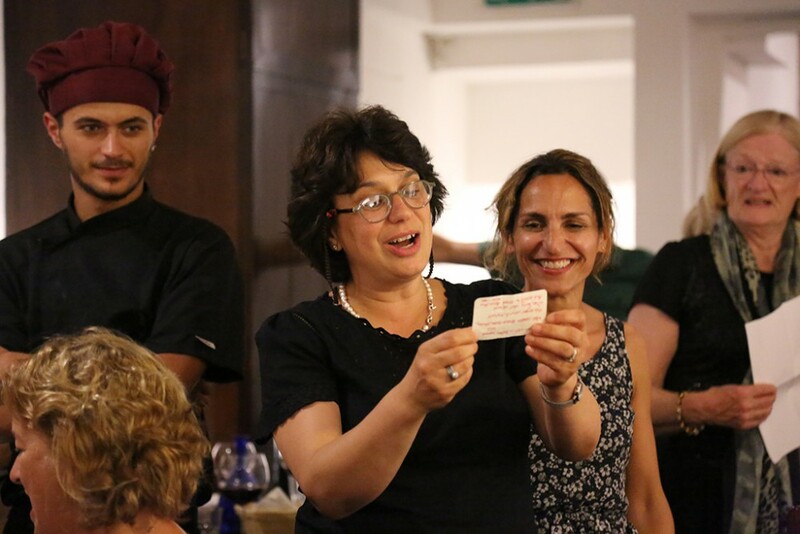 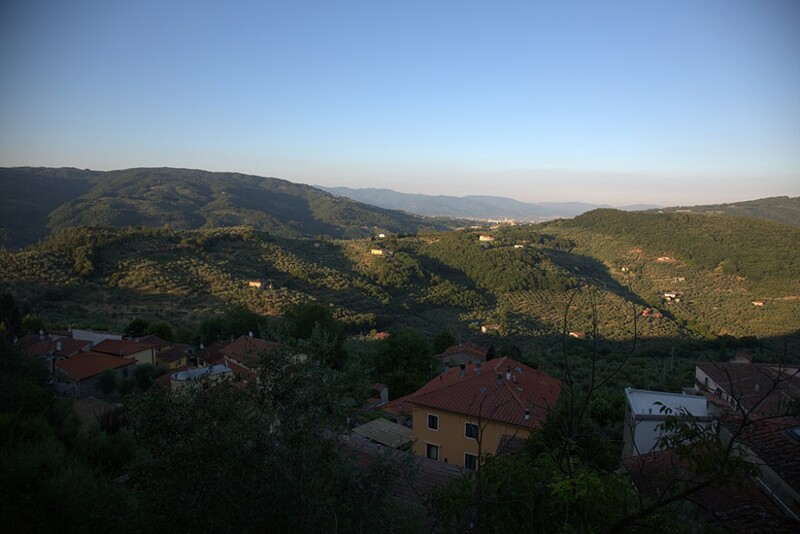 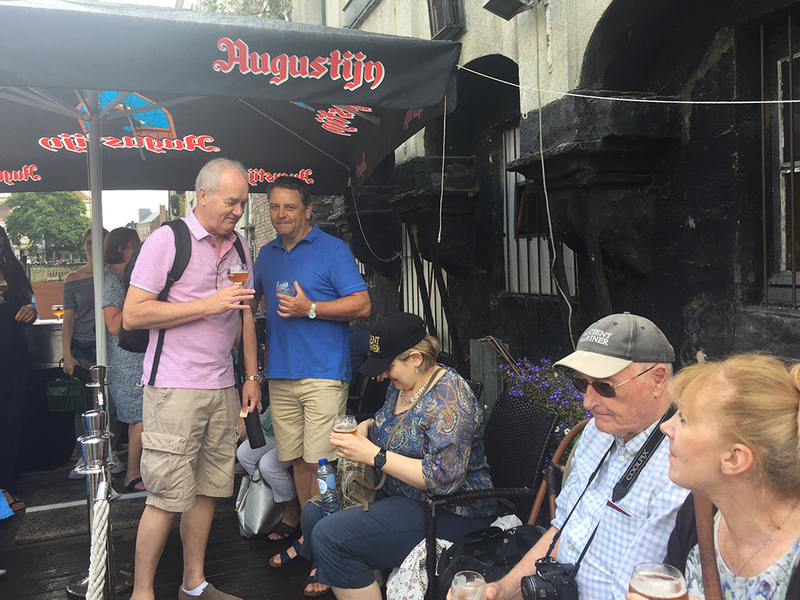 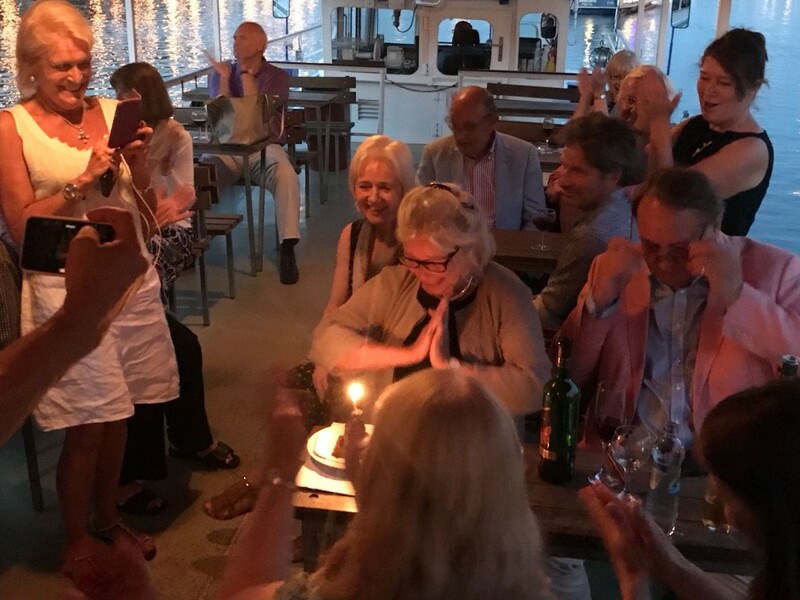 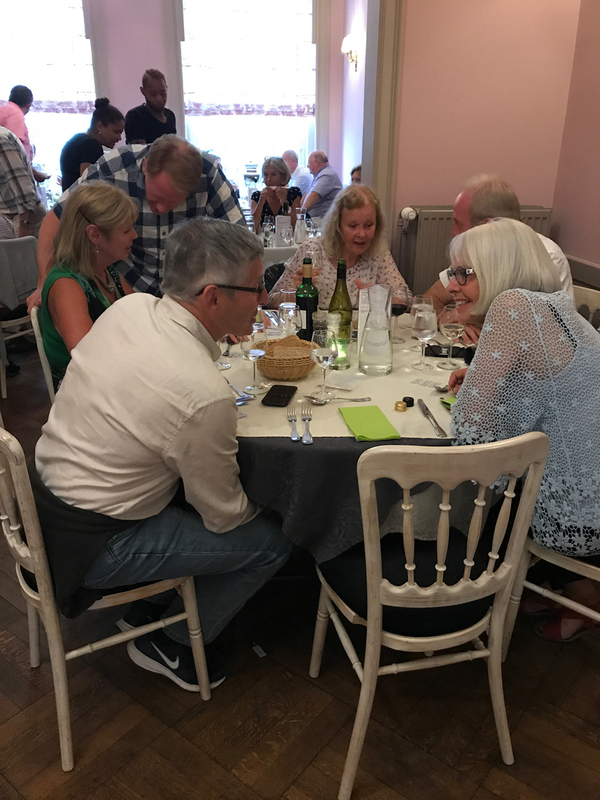 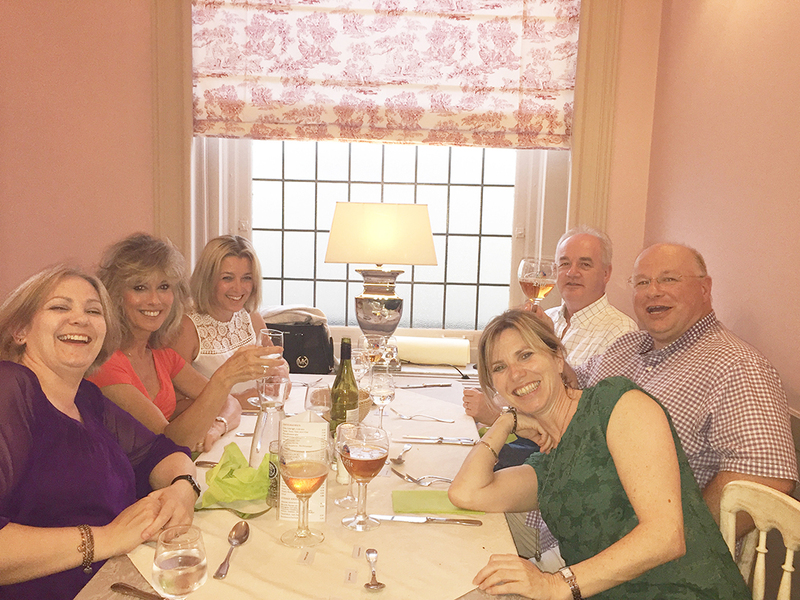 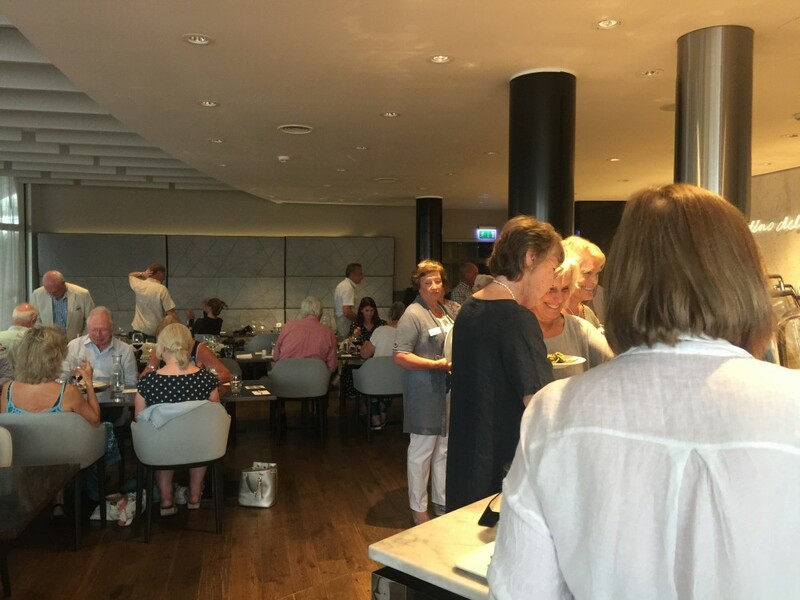 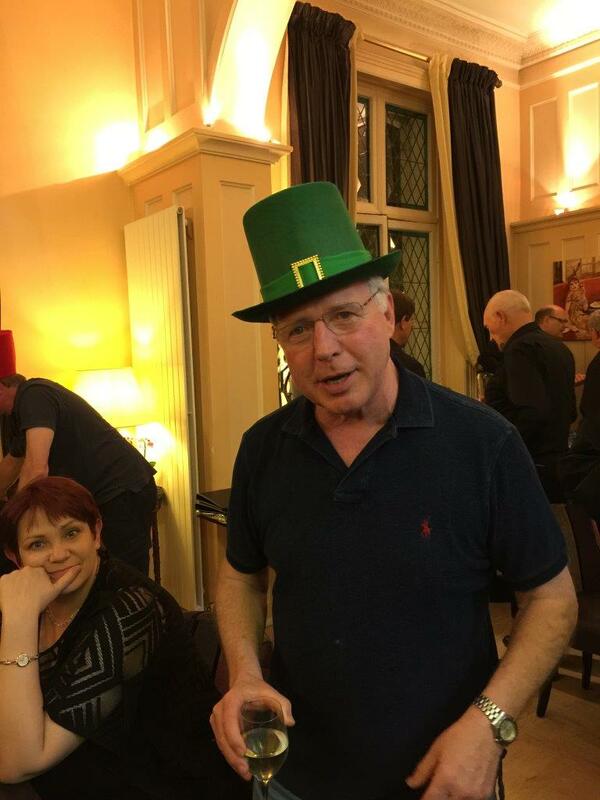 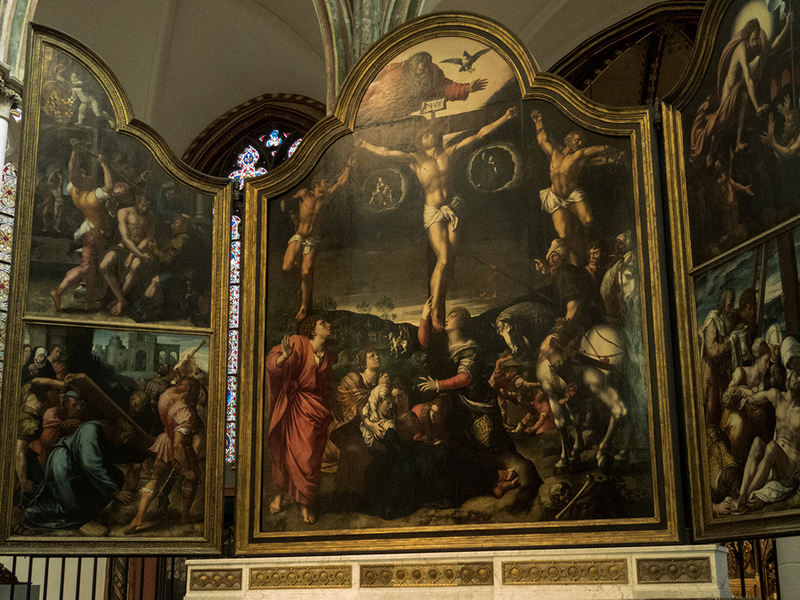 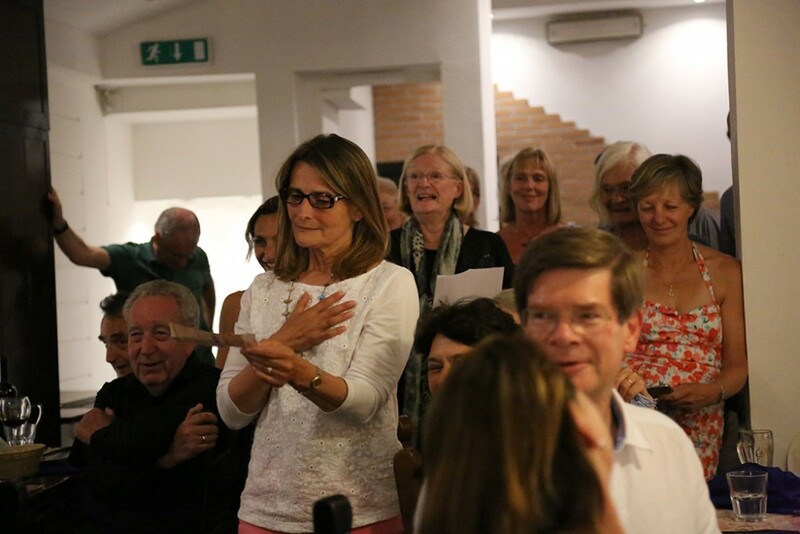 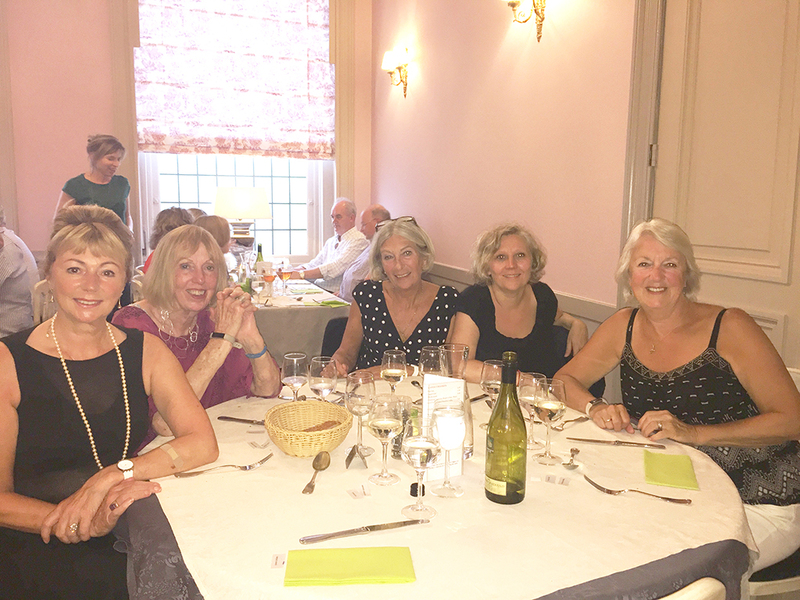 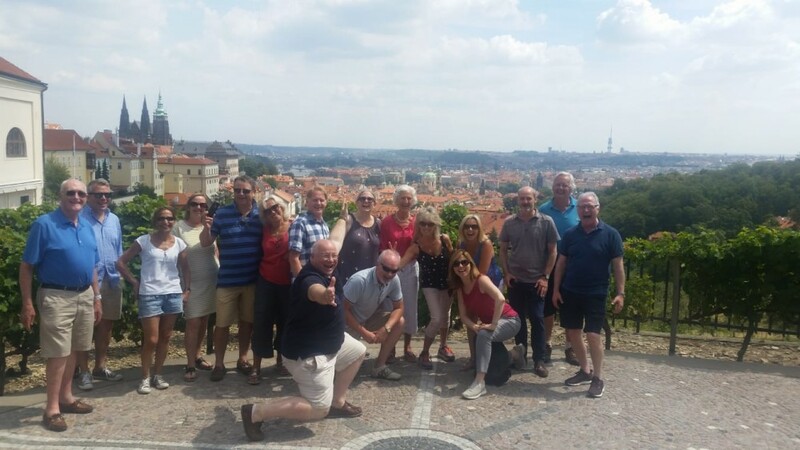 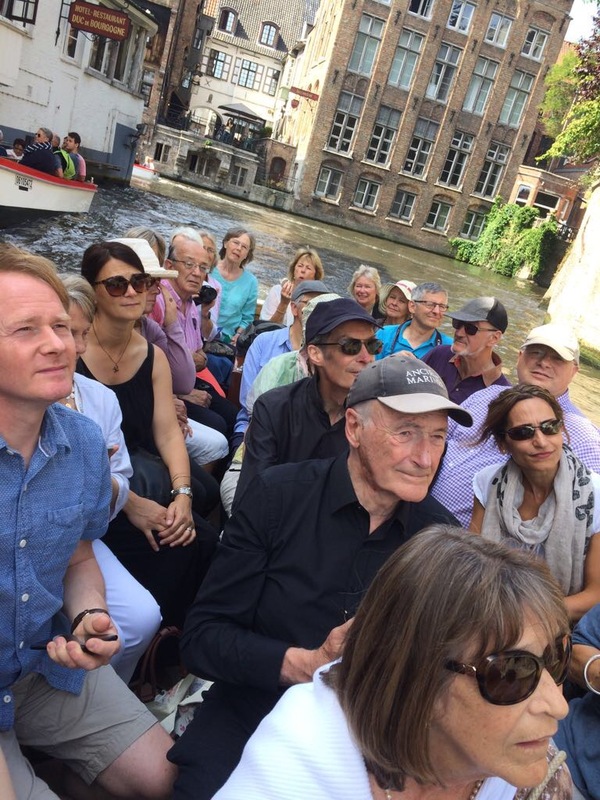 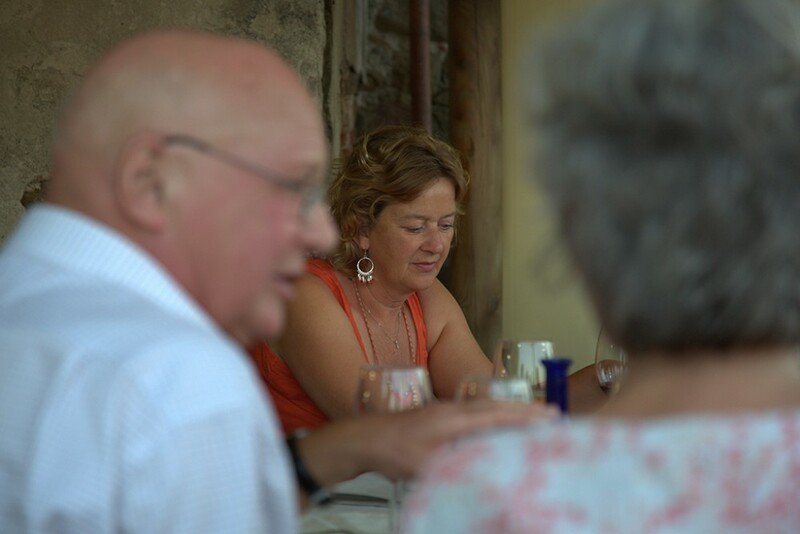 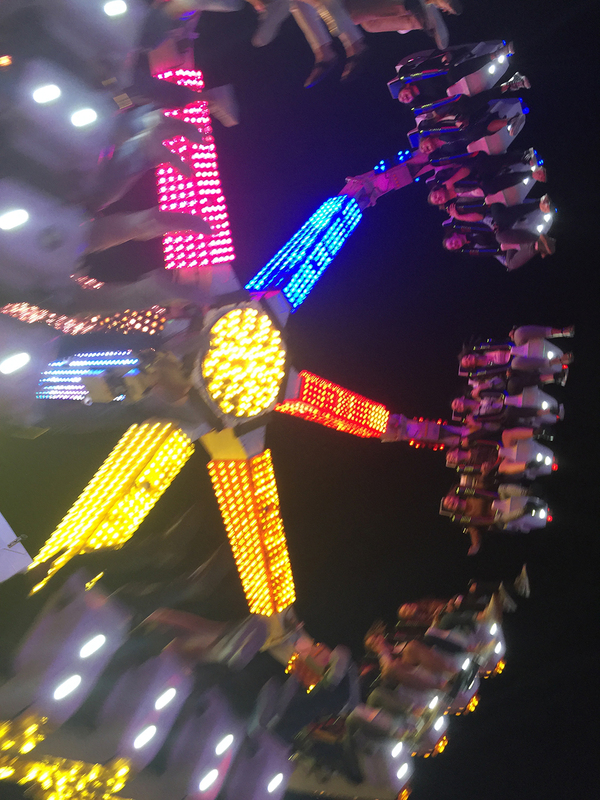 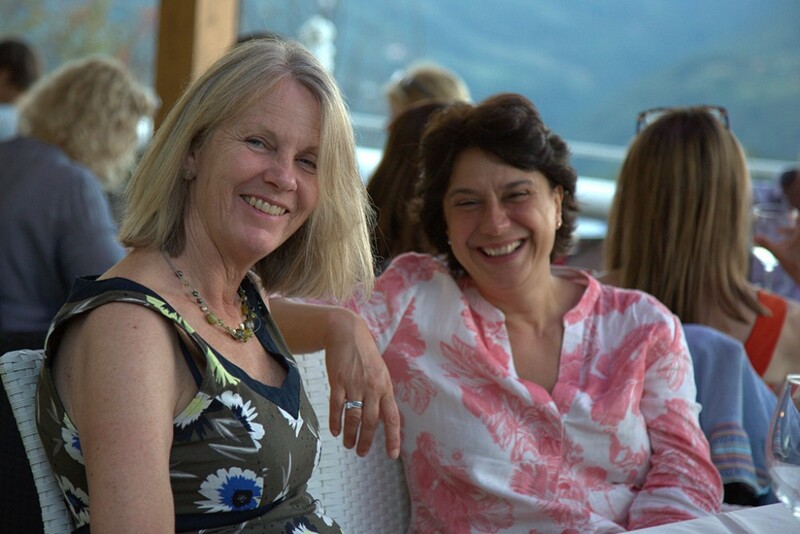 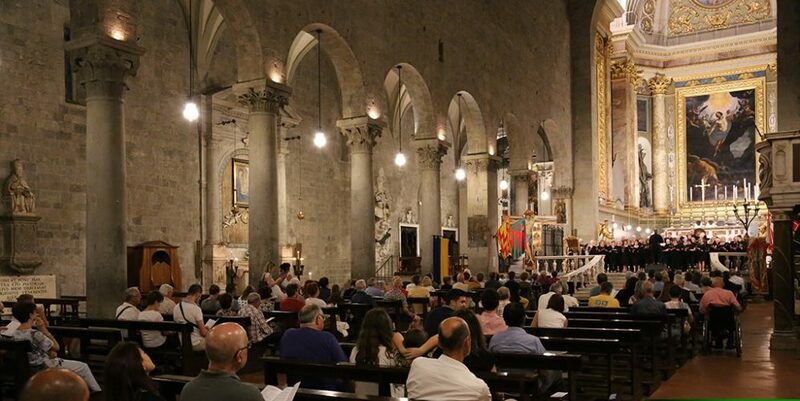 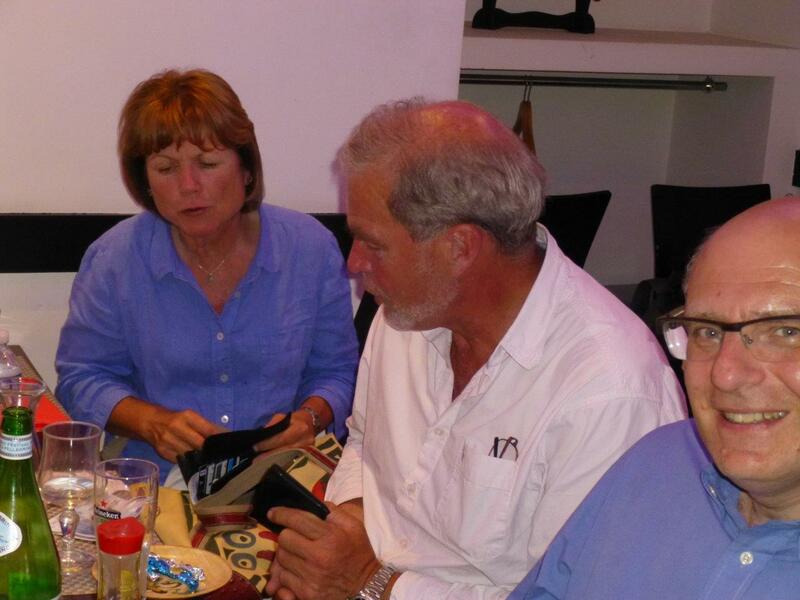 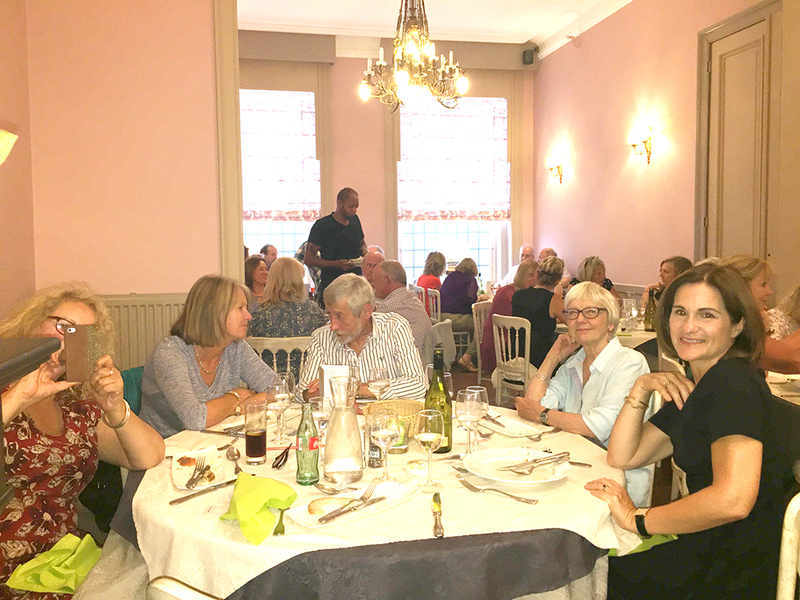 A great time was had by all….here is our album to give you a taste of what we all got up to in Lucca, Pistoia and Florence, based in Monticatini Terme just outside Florence. 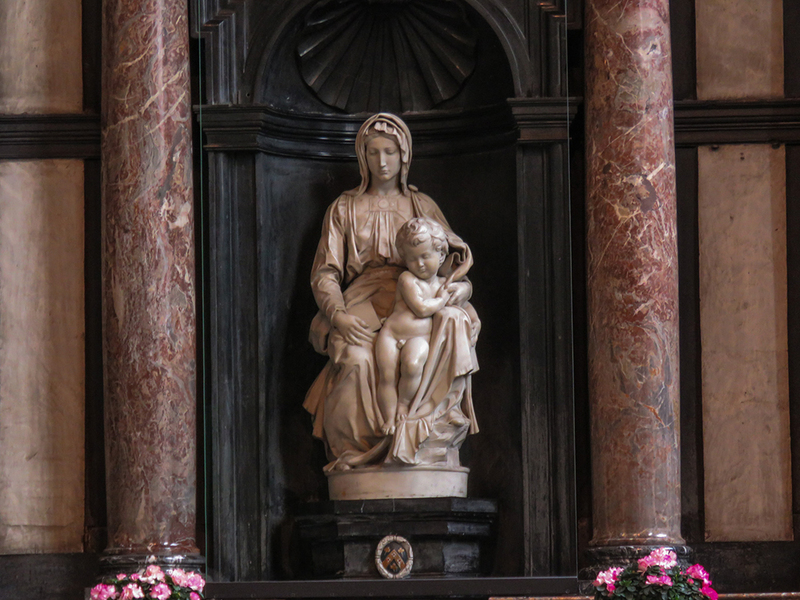 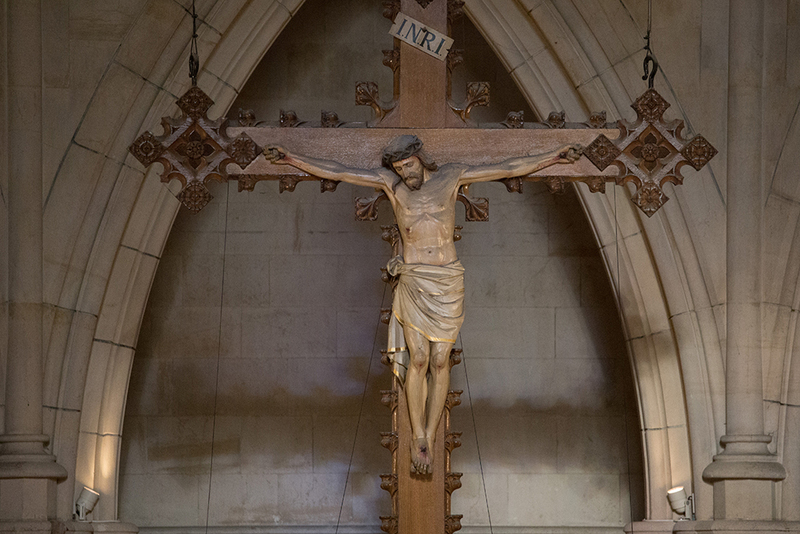 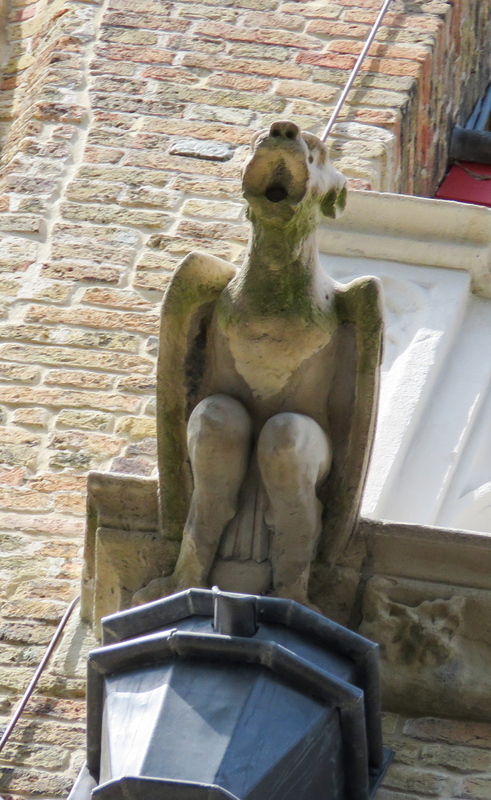 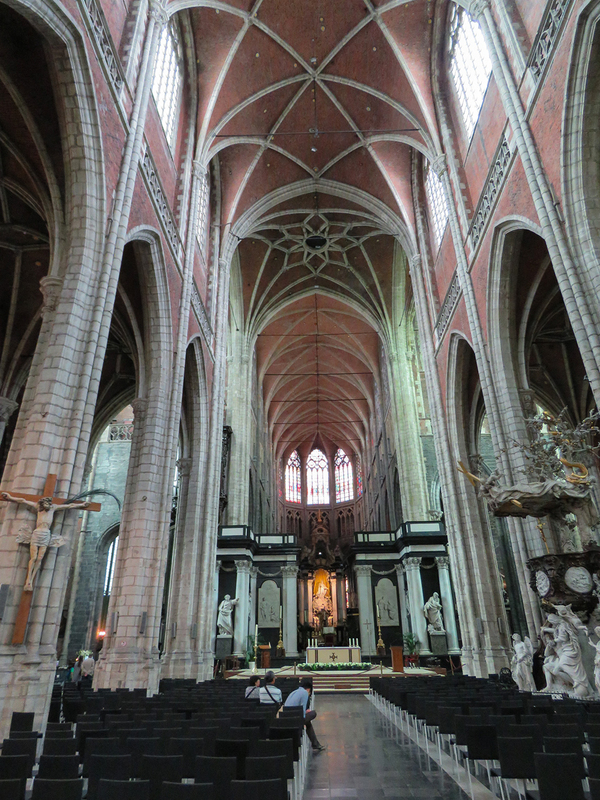 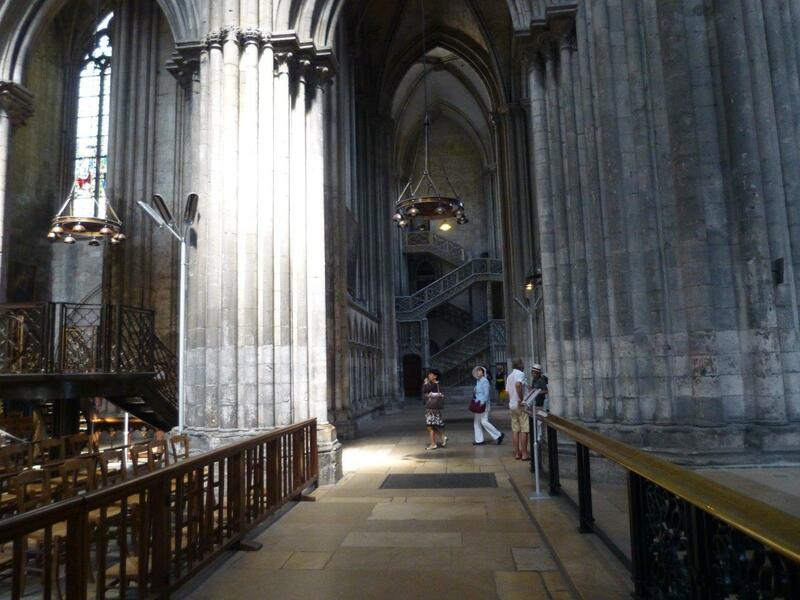 The better quality photos in this album of the Cathedrals etc. 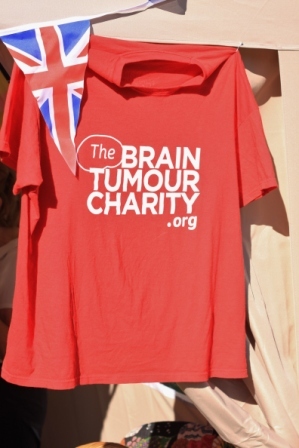 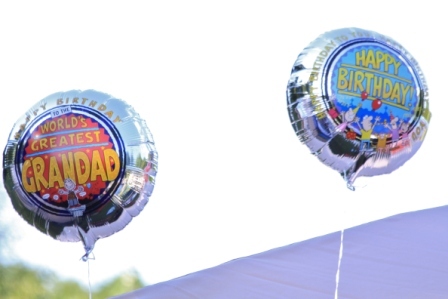 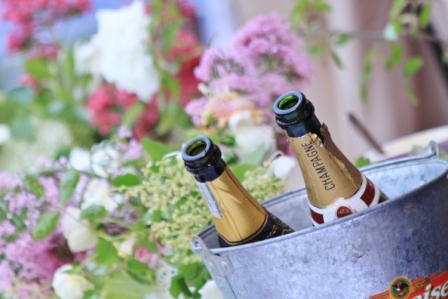 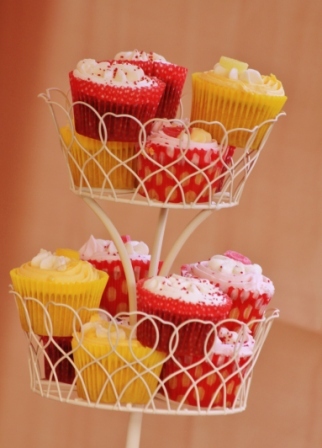 were taken by Richard Saker, Andrii Kaplanovskyi and Archie’s Godson Dennis – many thanks for these! 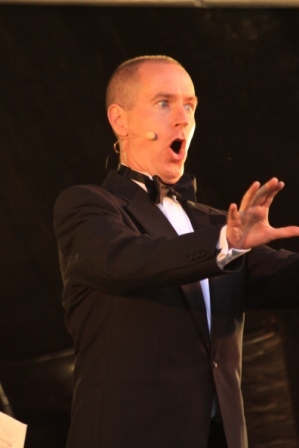 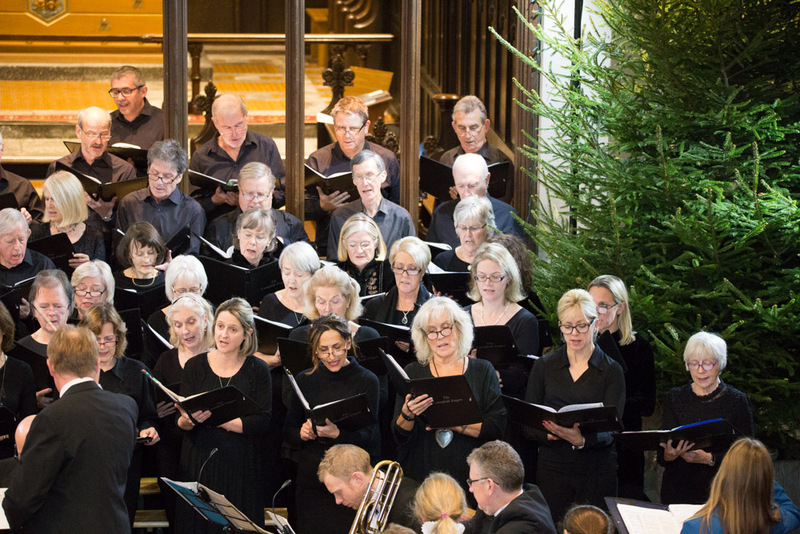 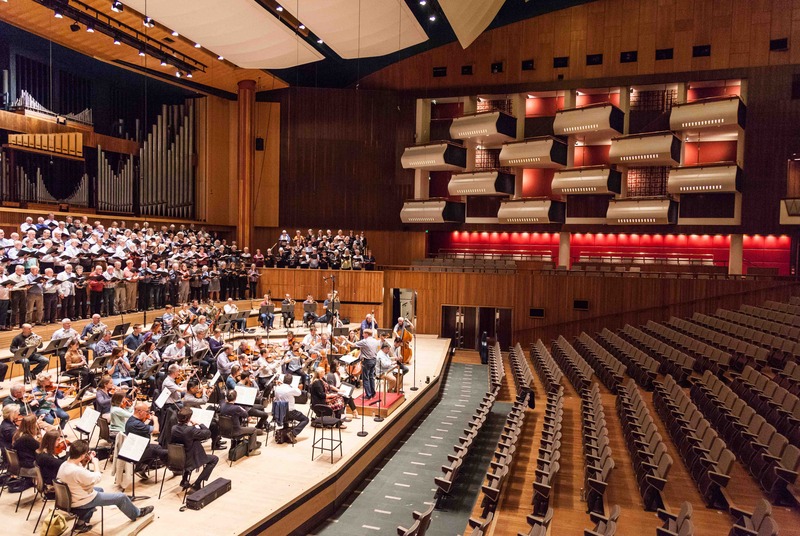 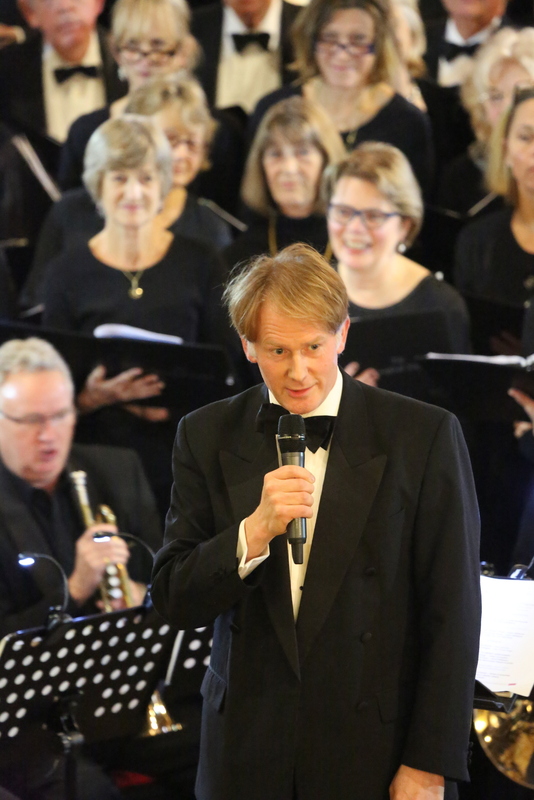 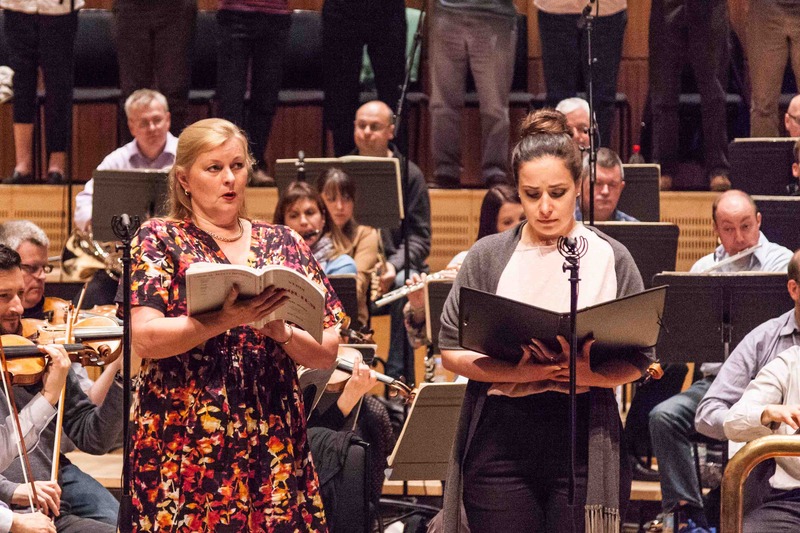 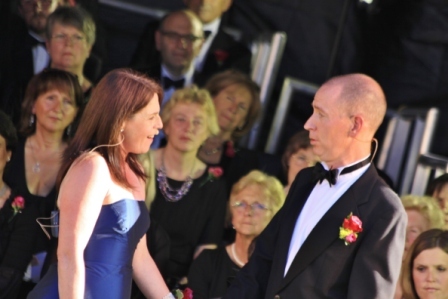 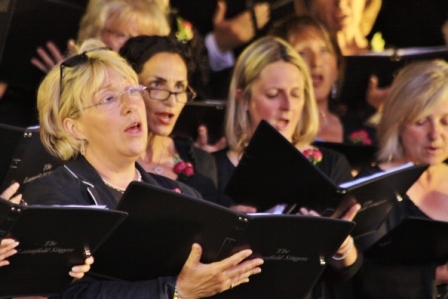 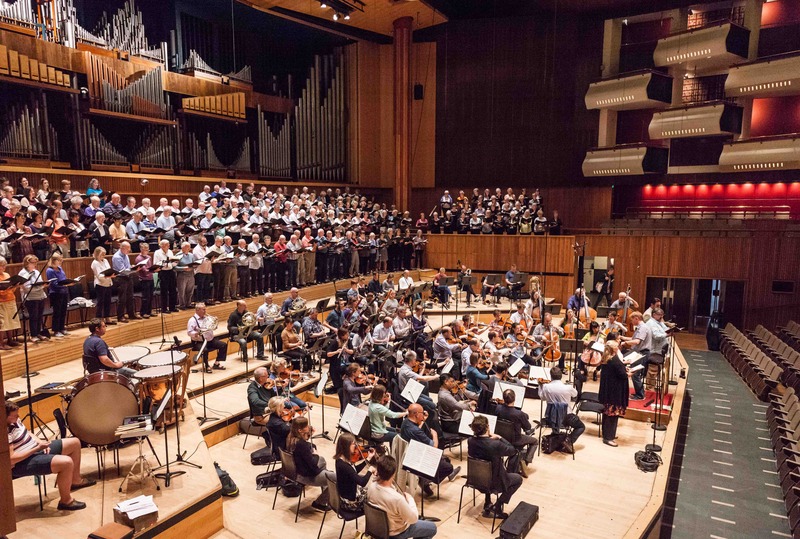 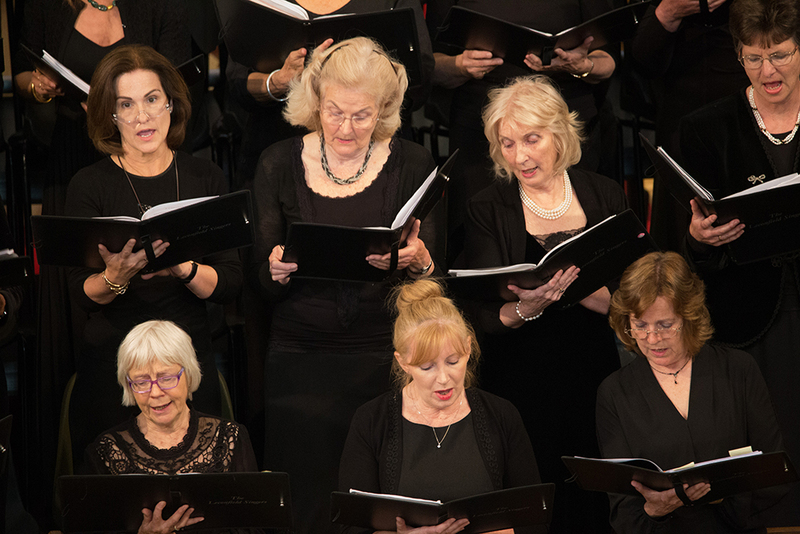 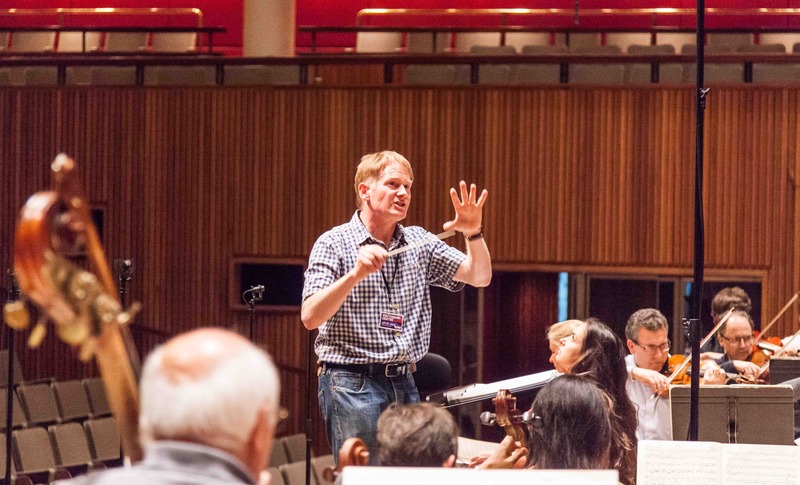 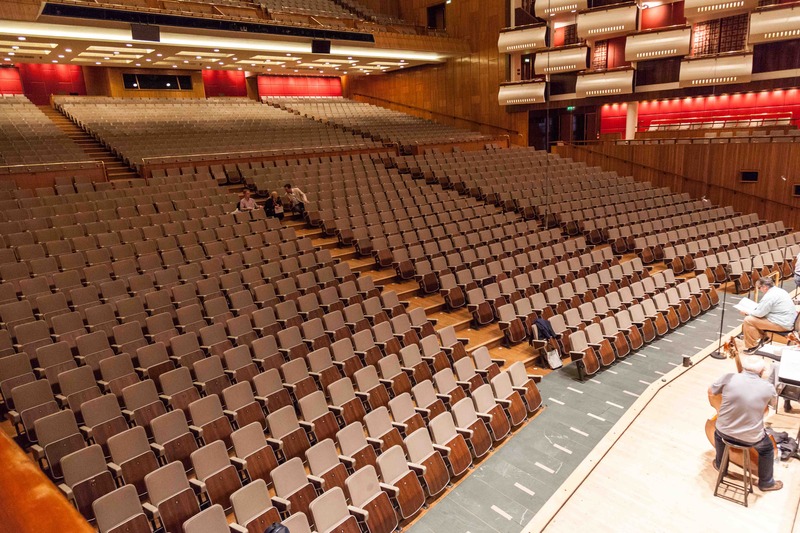 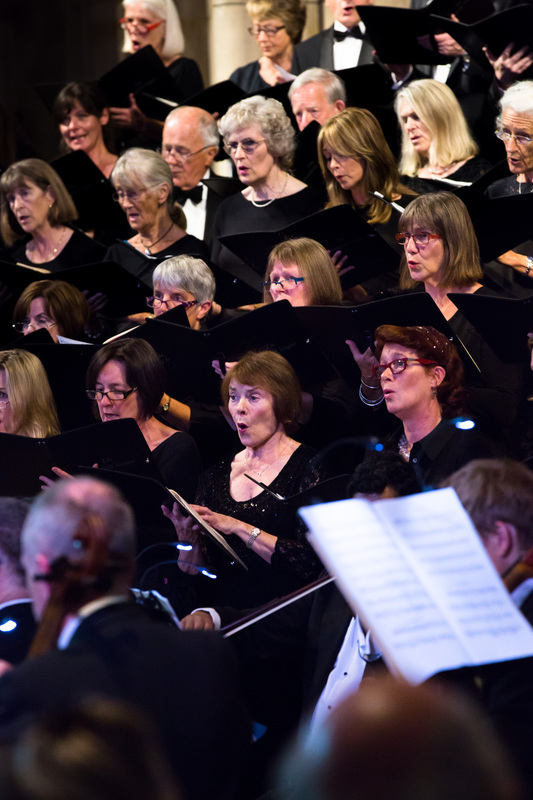 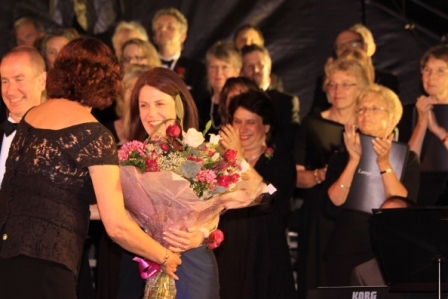 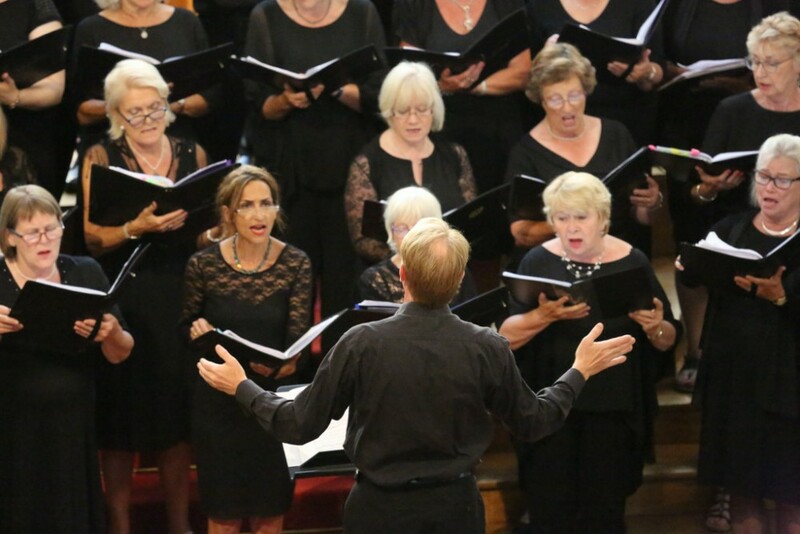 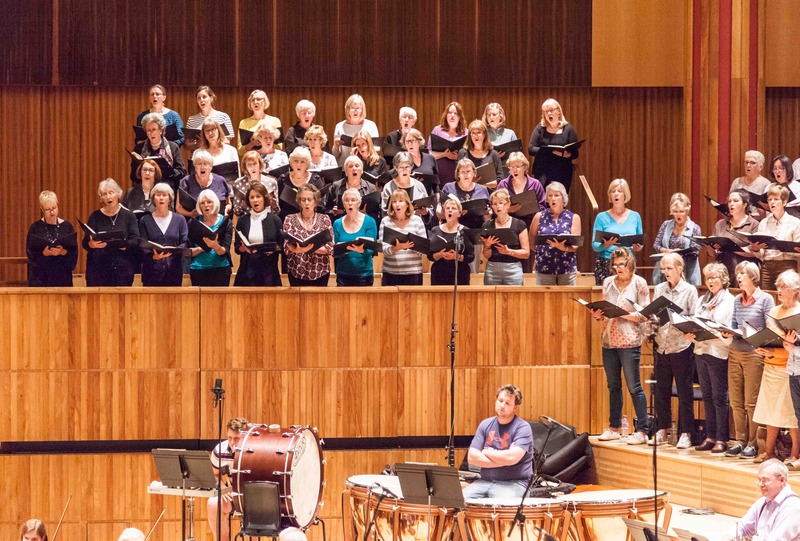 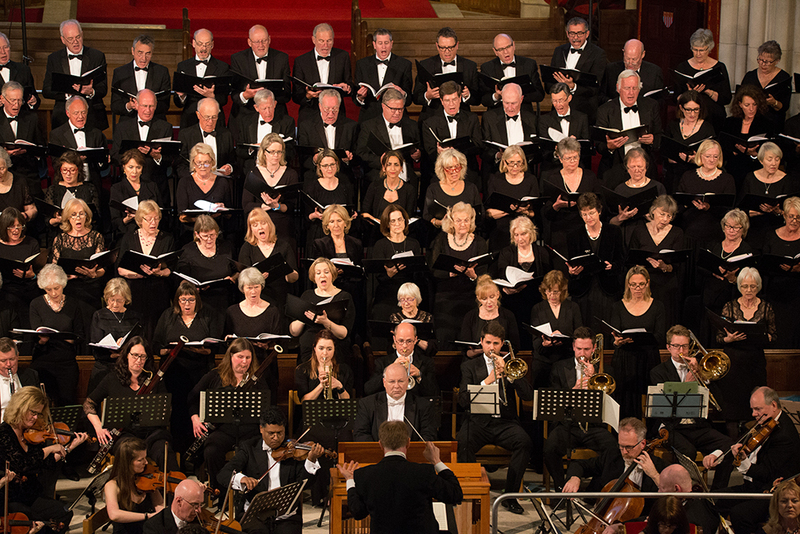 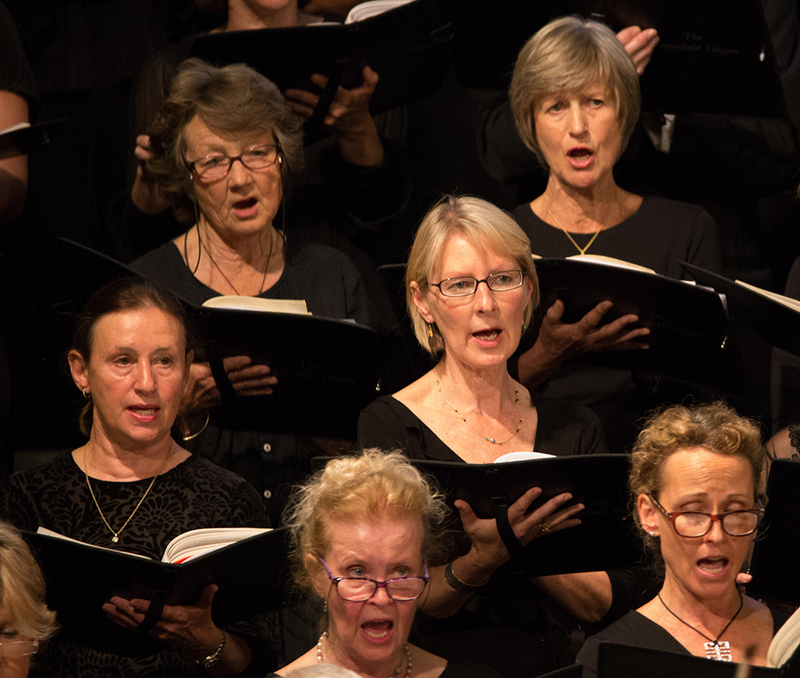 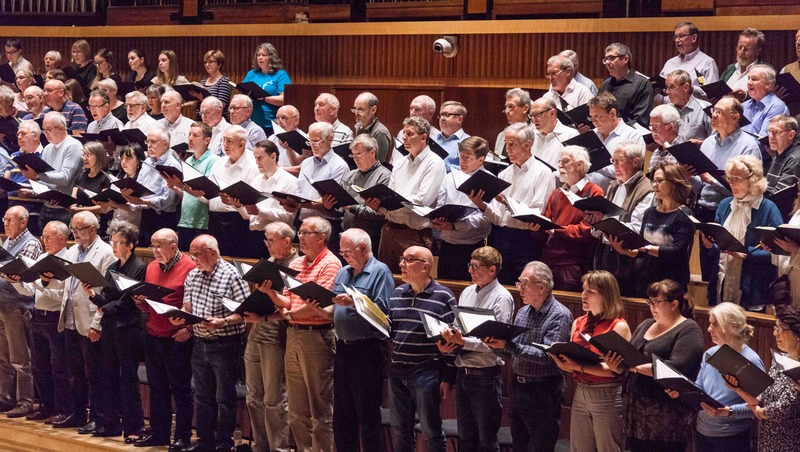 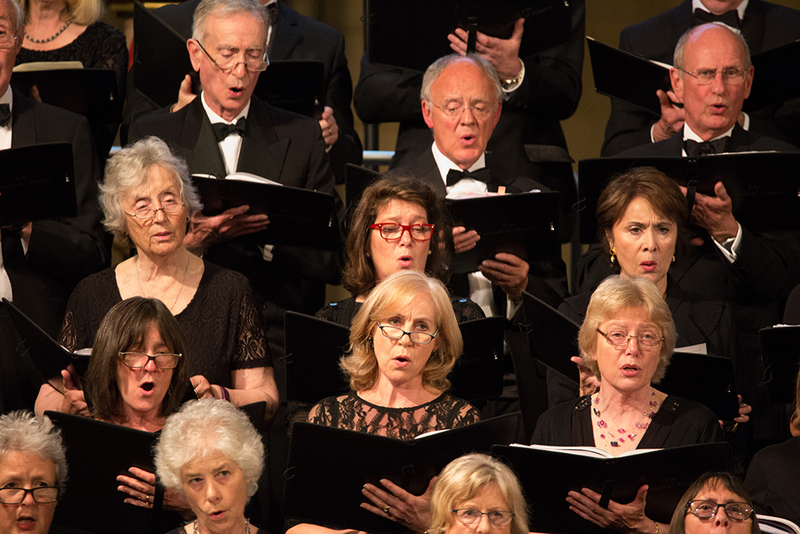 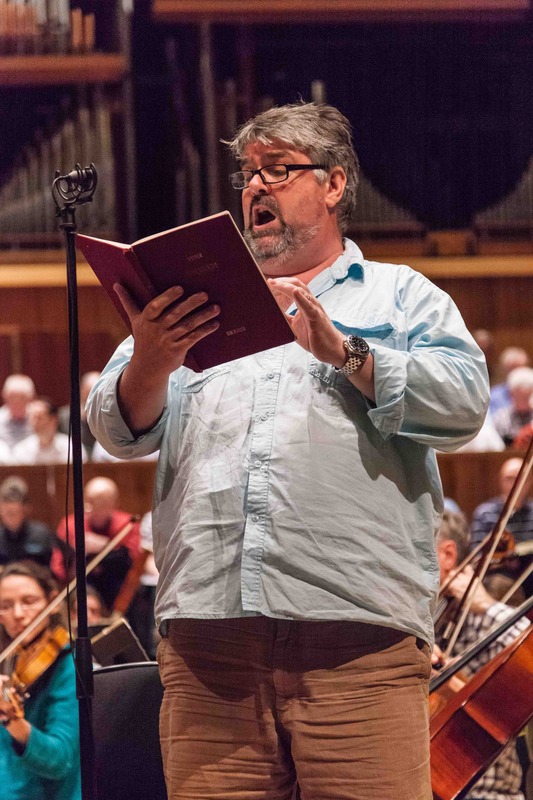 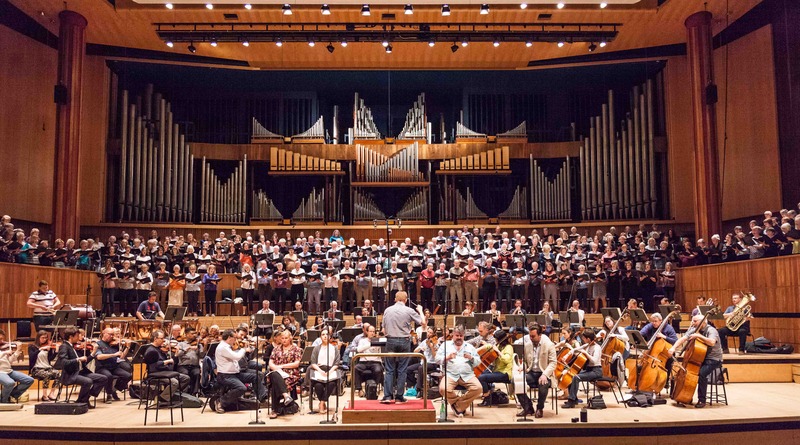 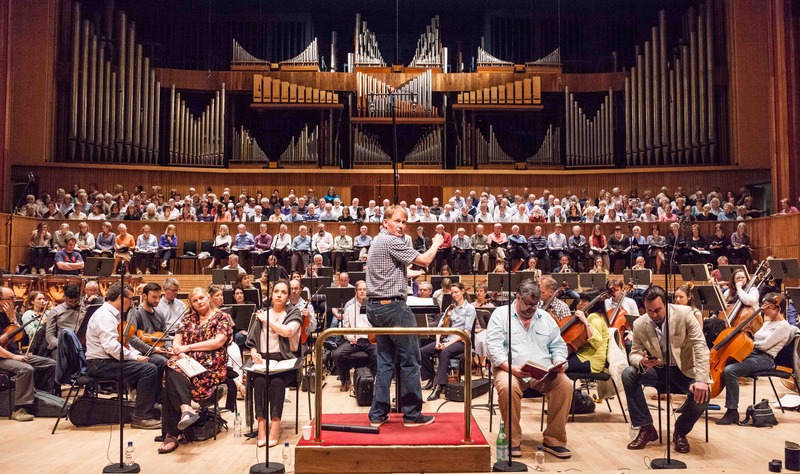 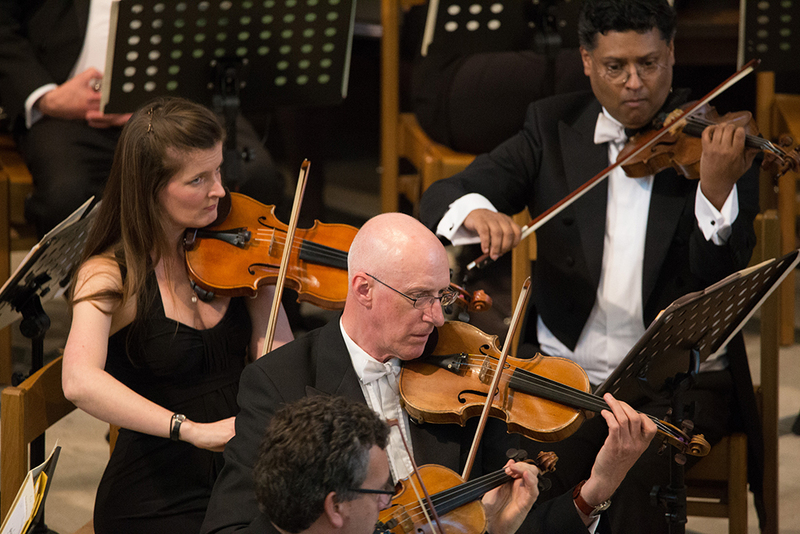 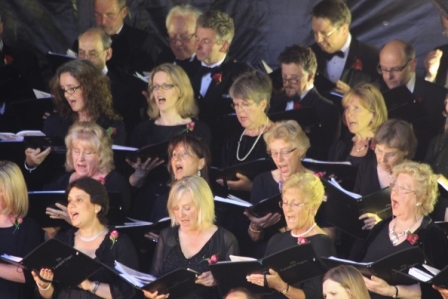 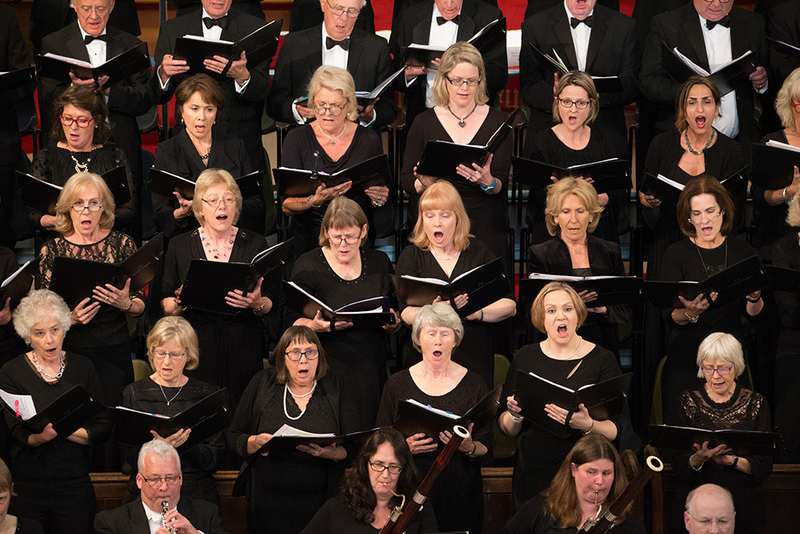 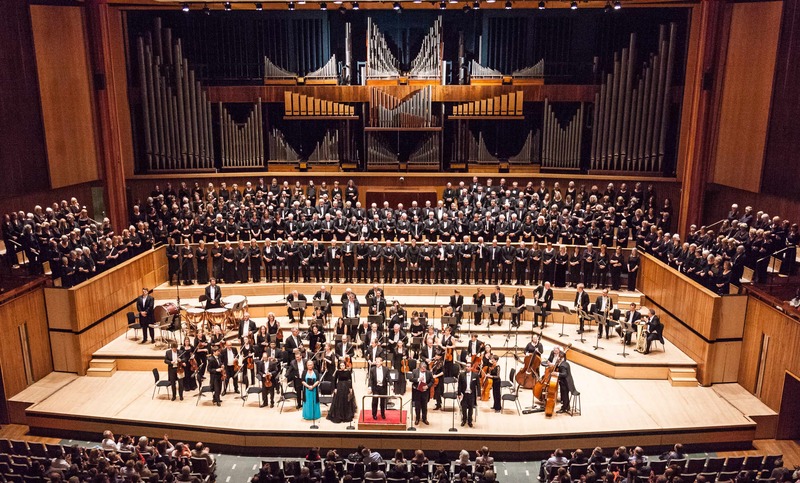 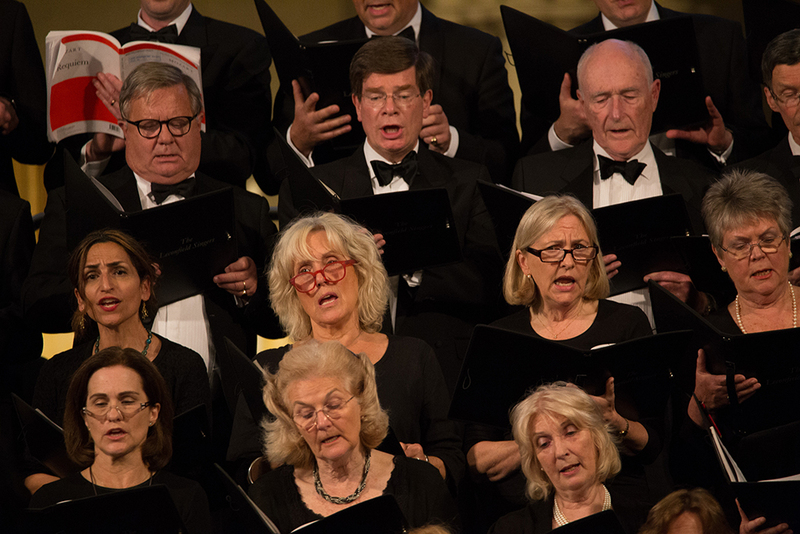 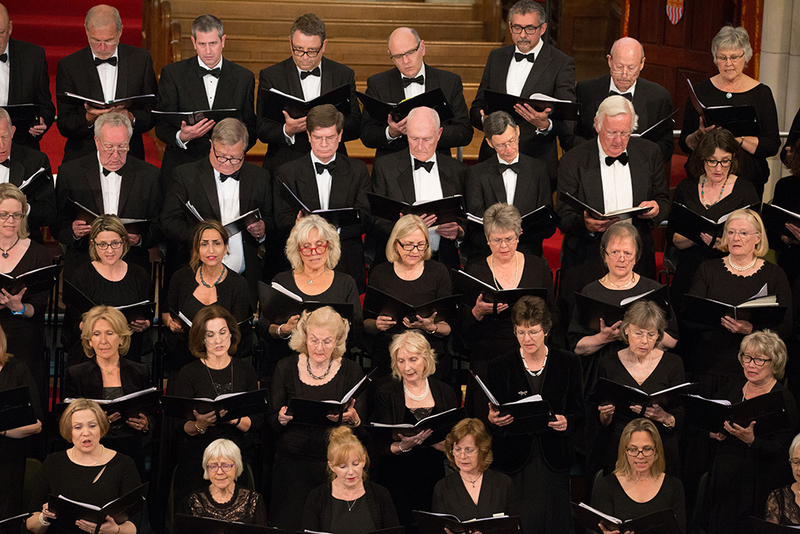 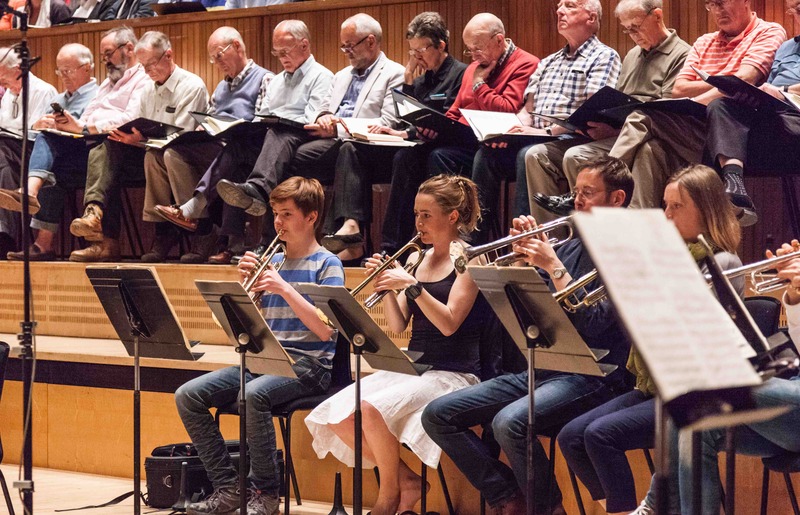 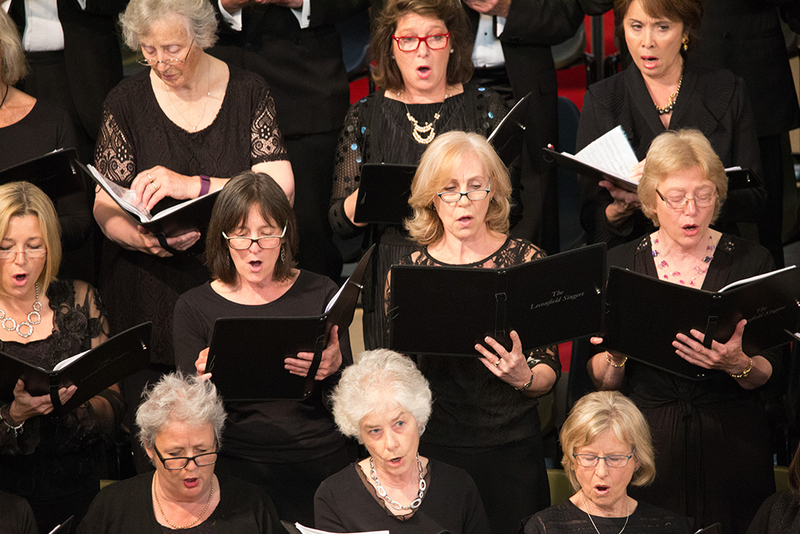 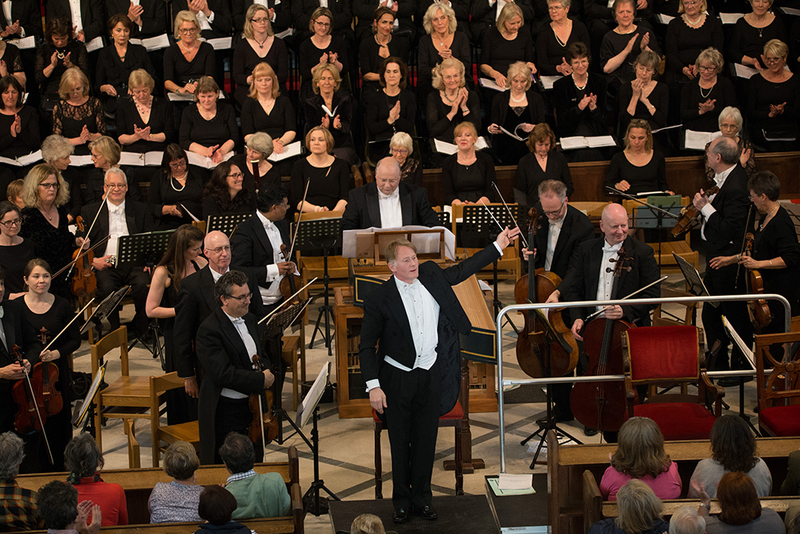 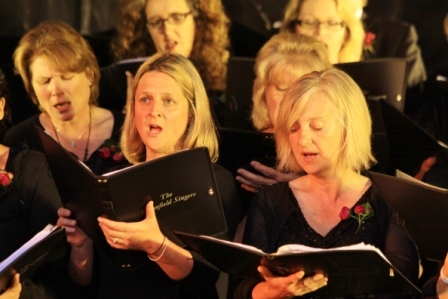 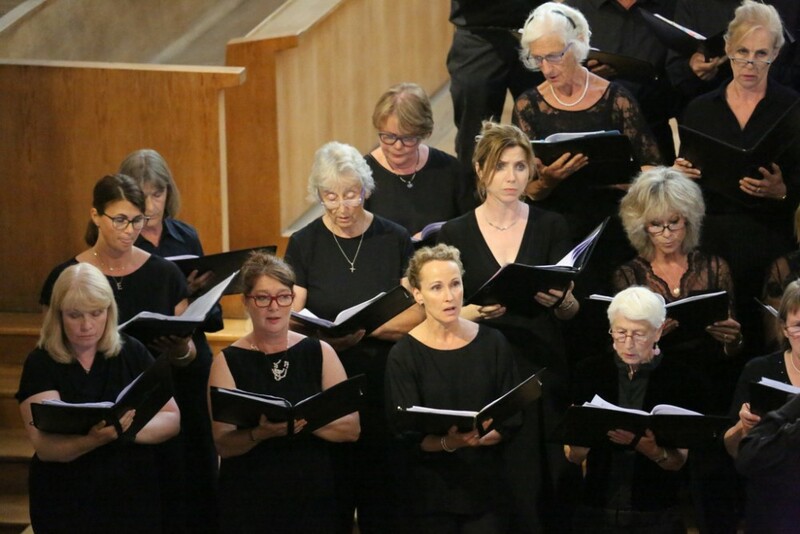 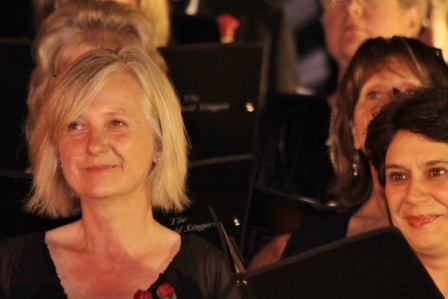 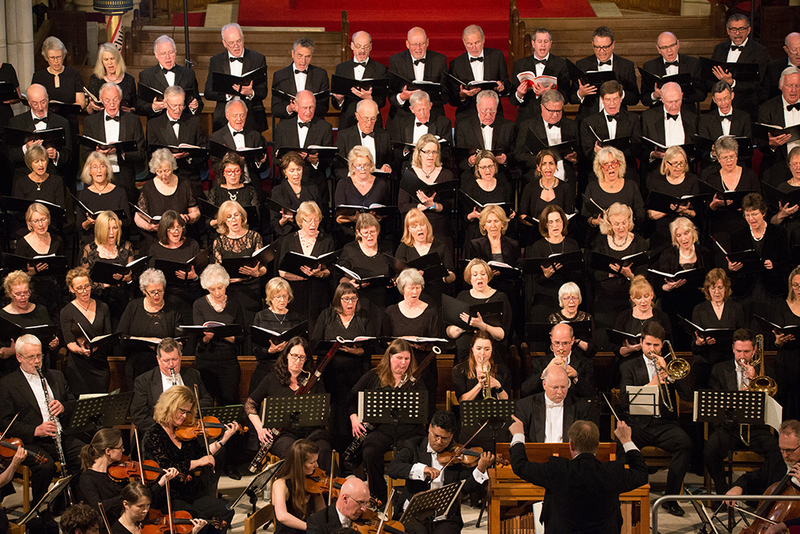 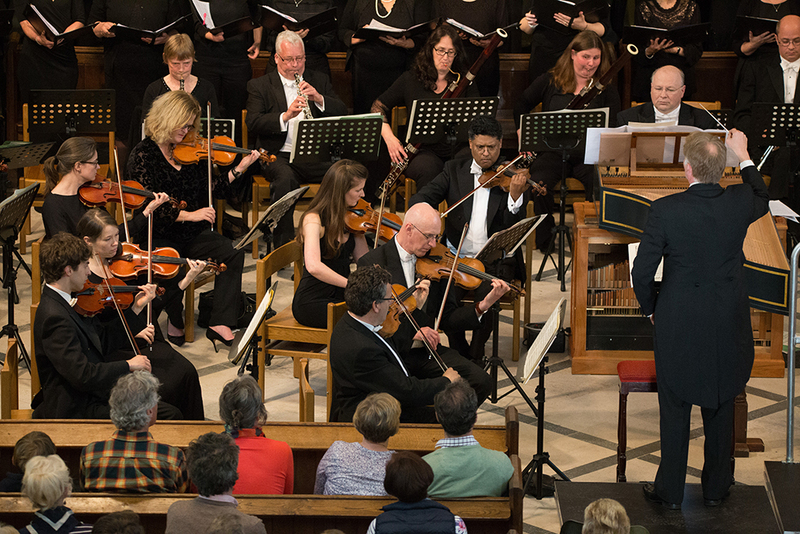 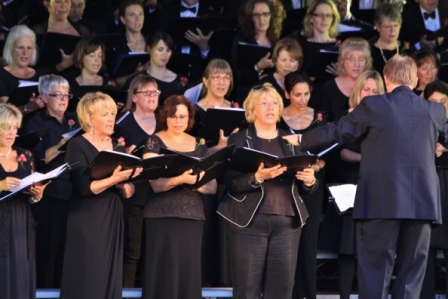 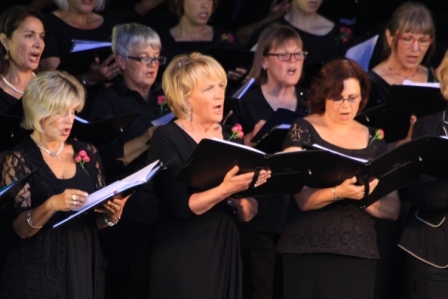 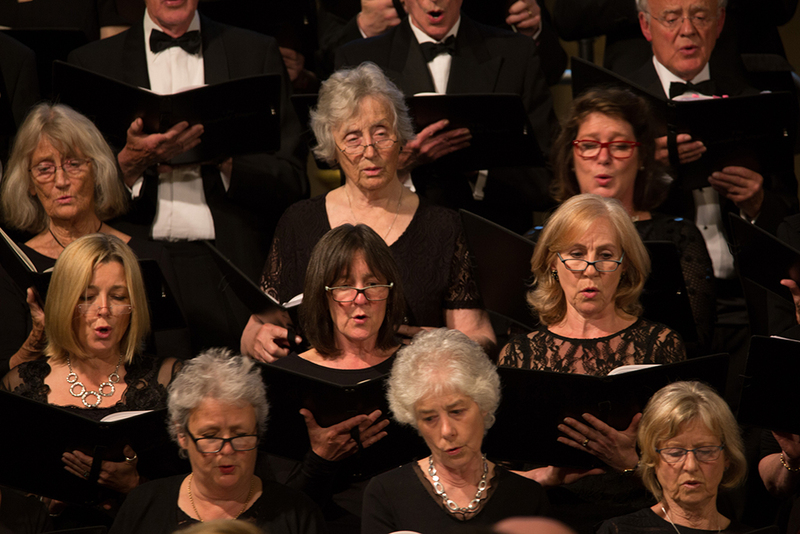 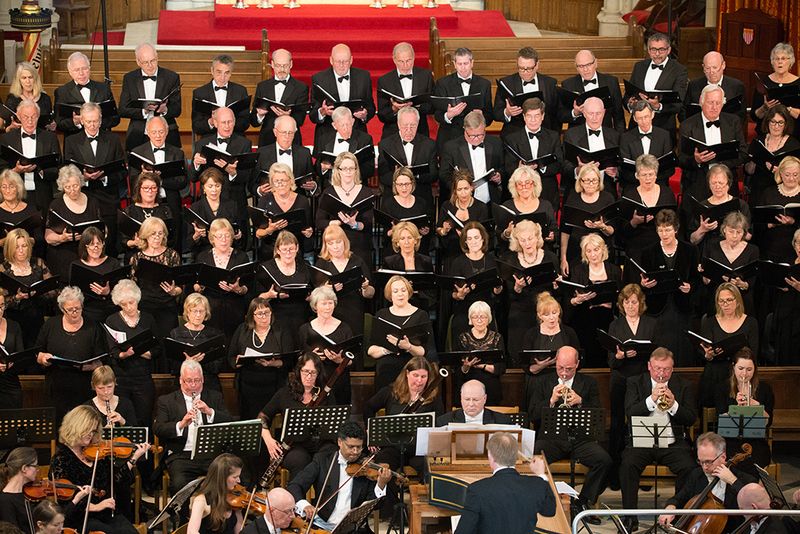 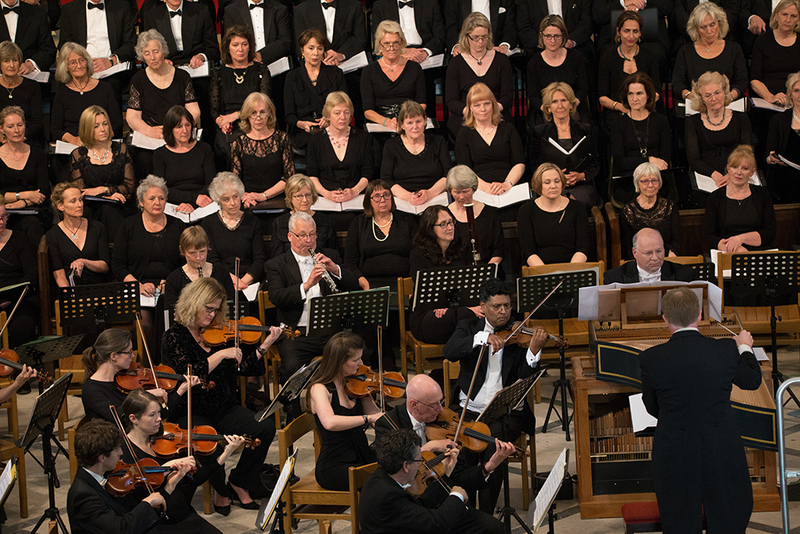 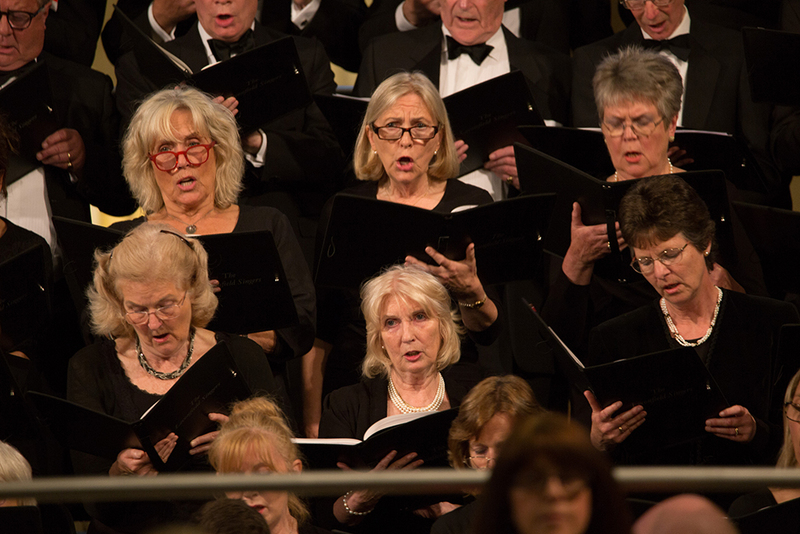 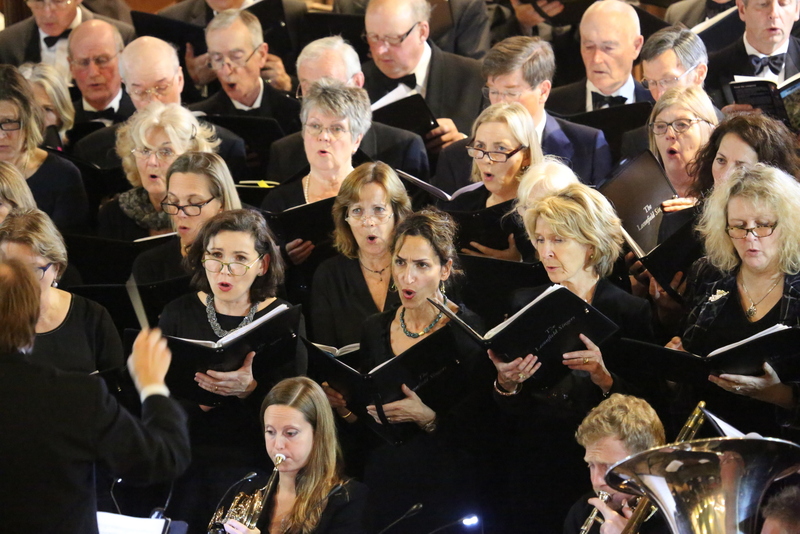 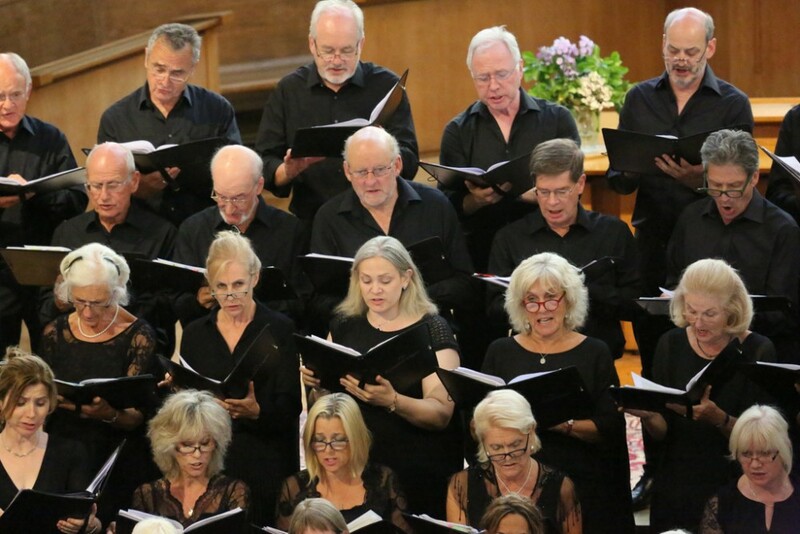 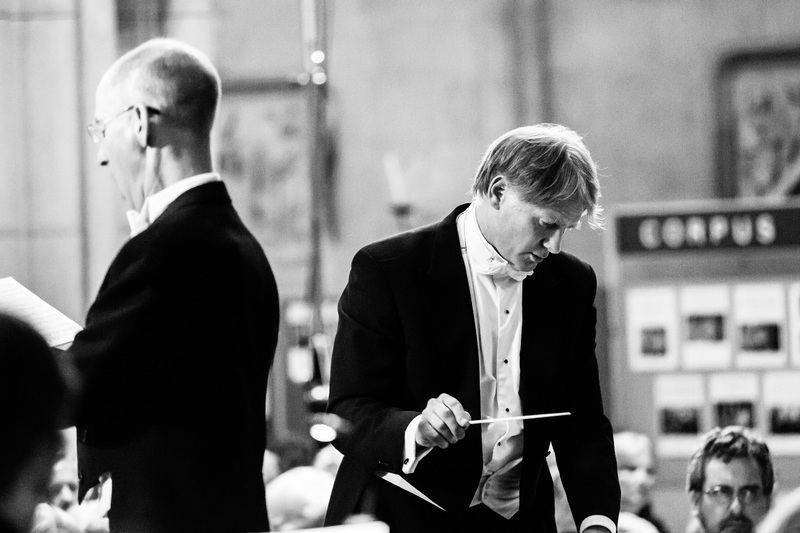 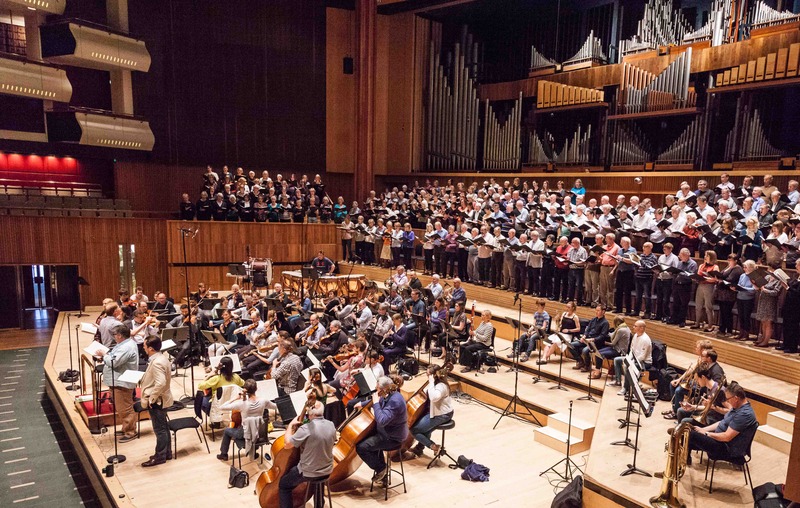 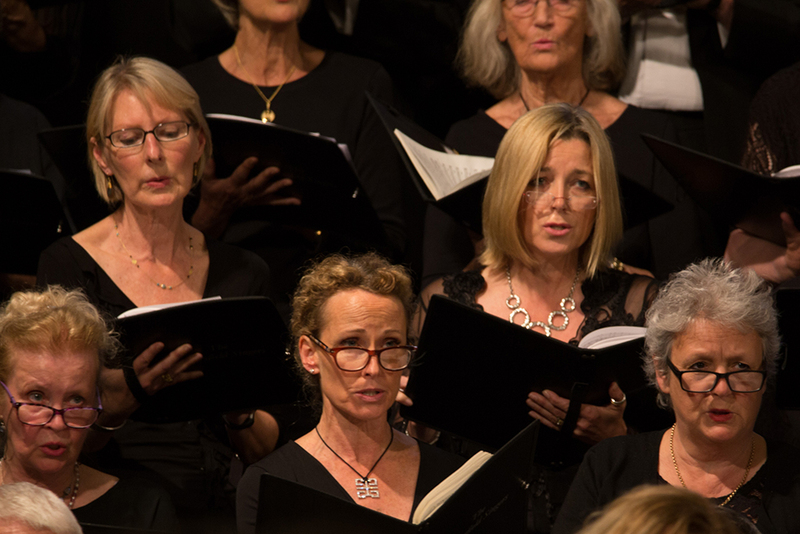 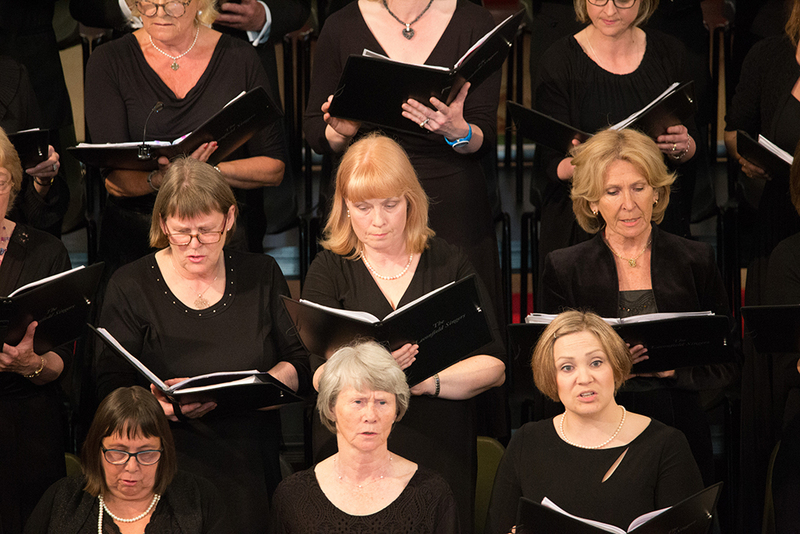 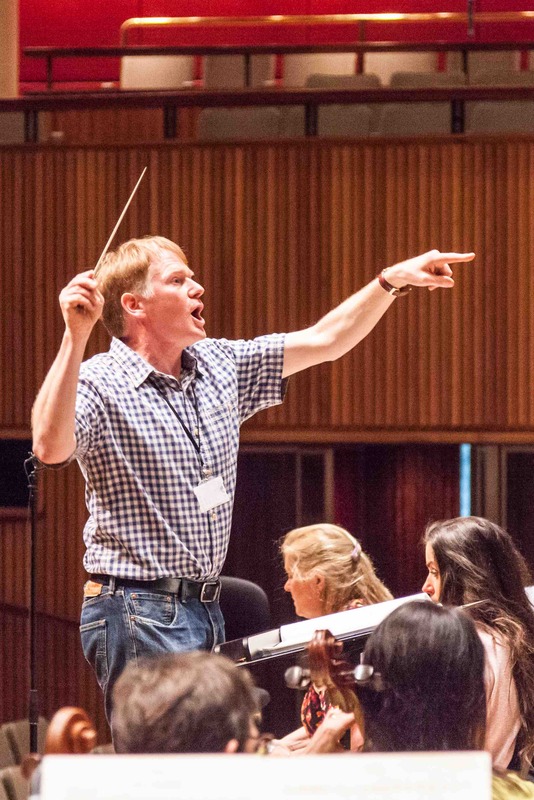 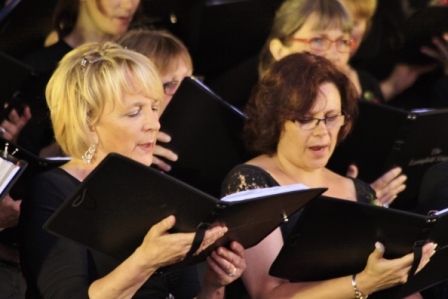 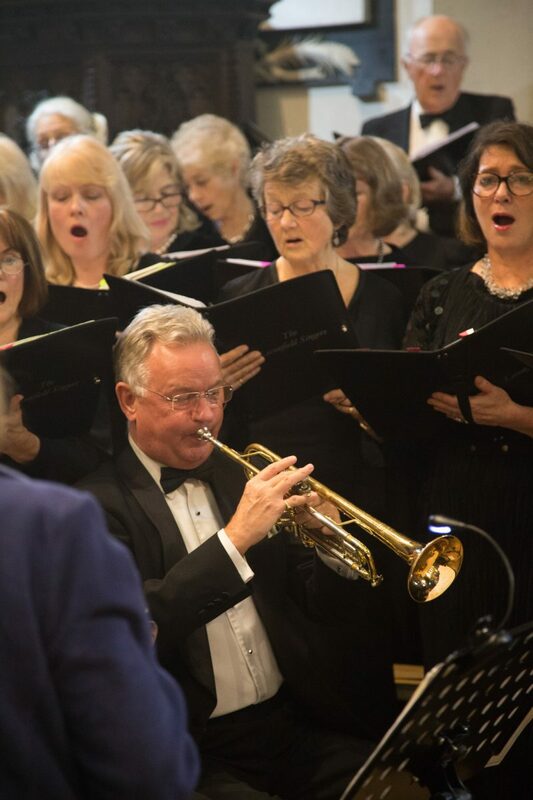 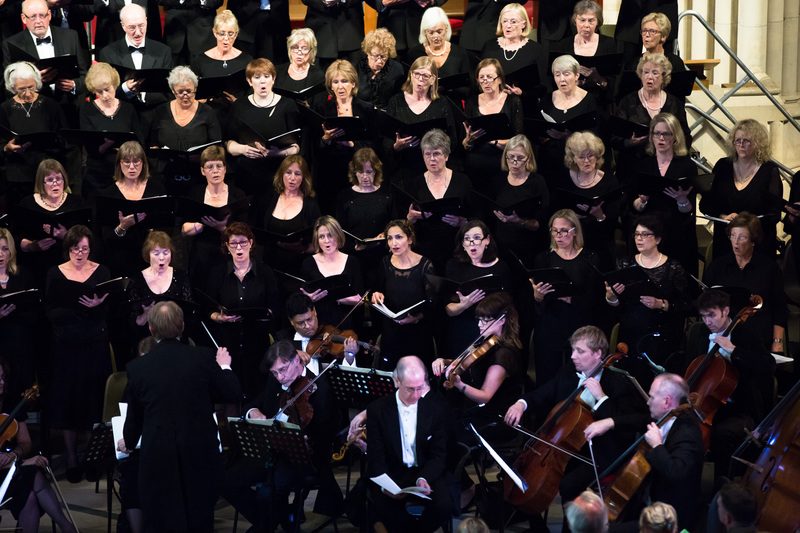 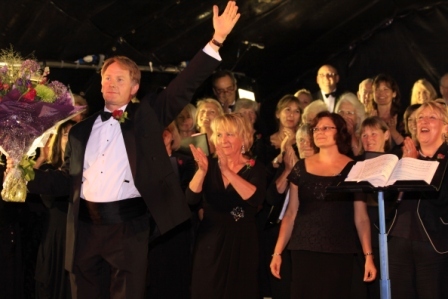 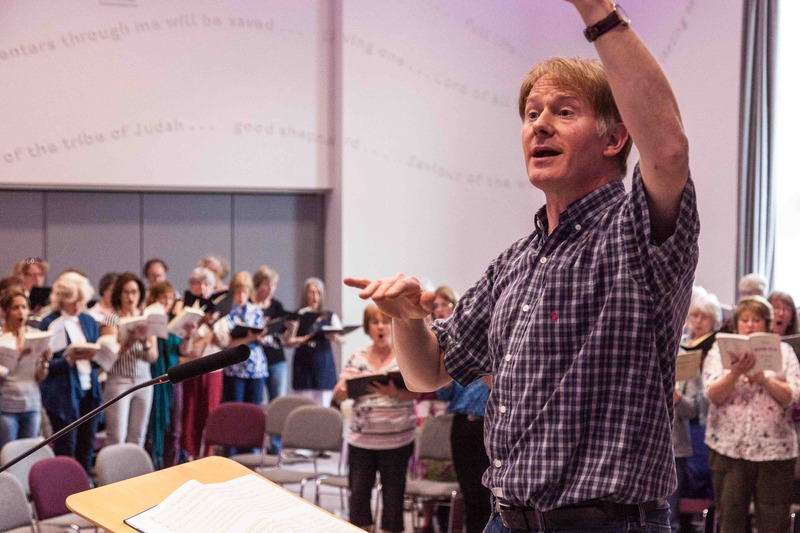 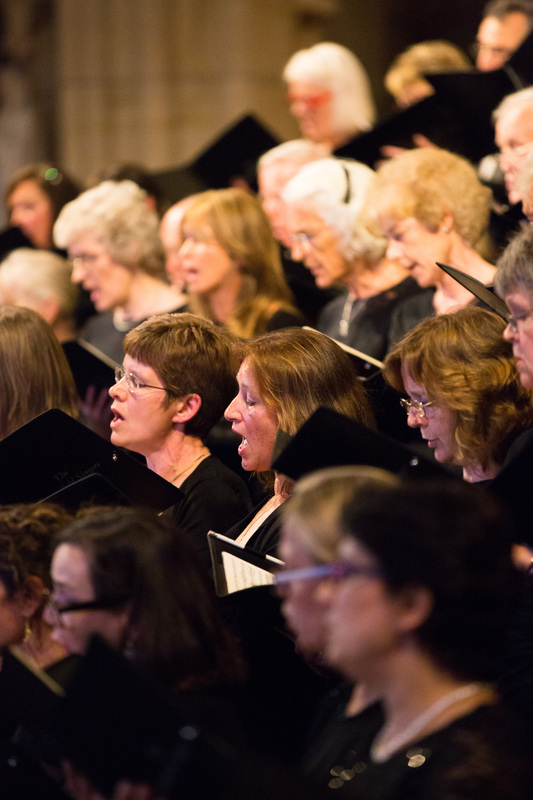 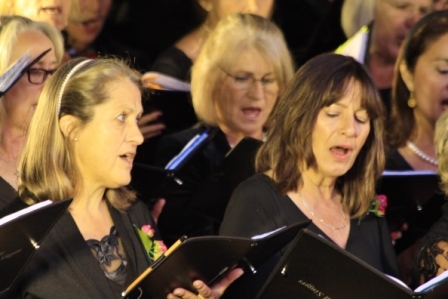 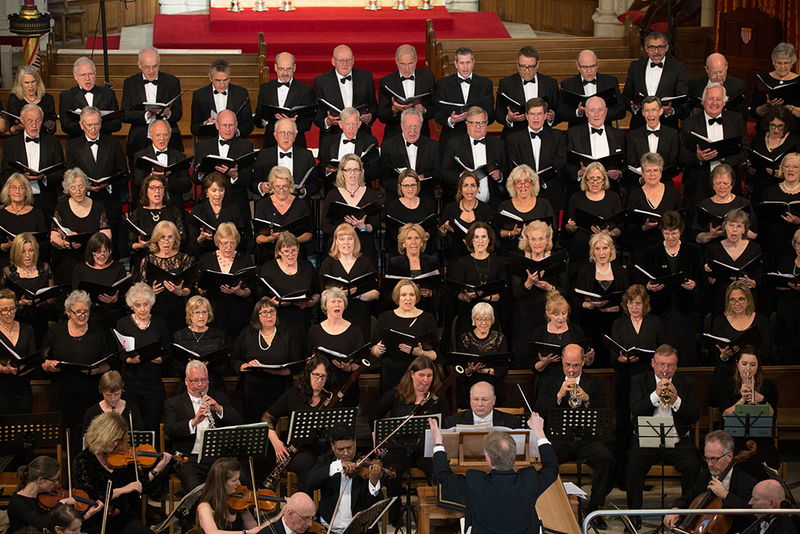 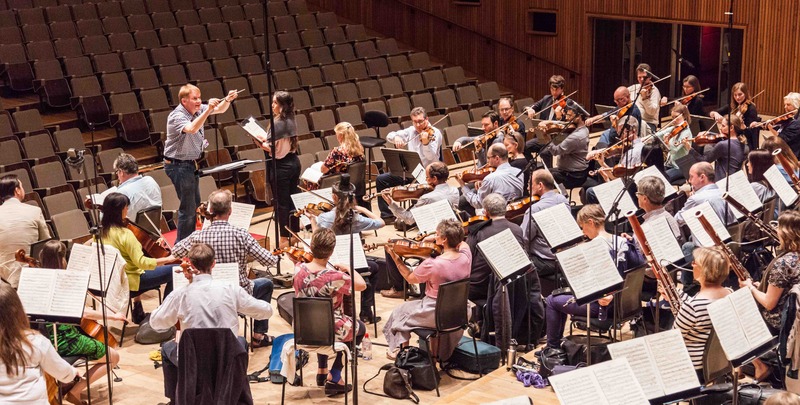 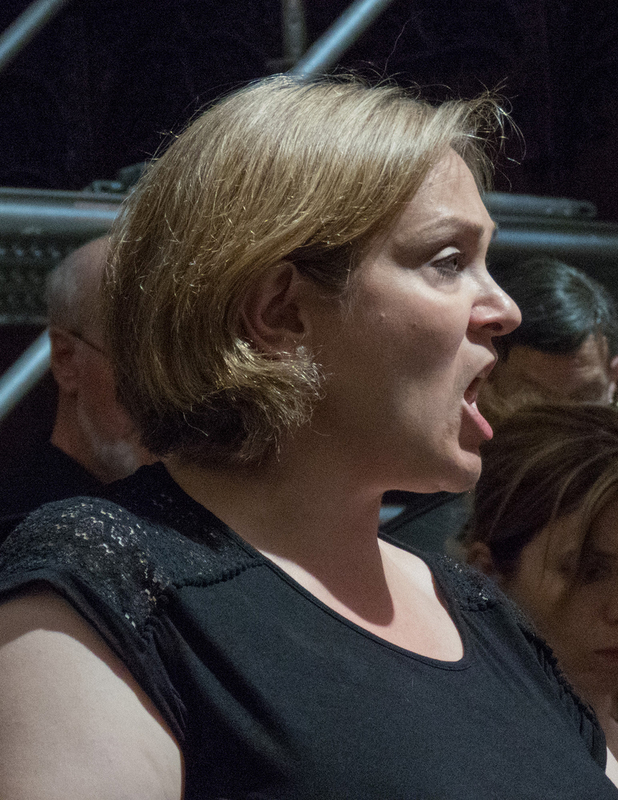 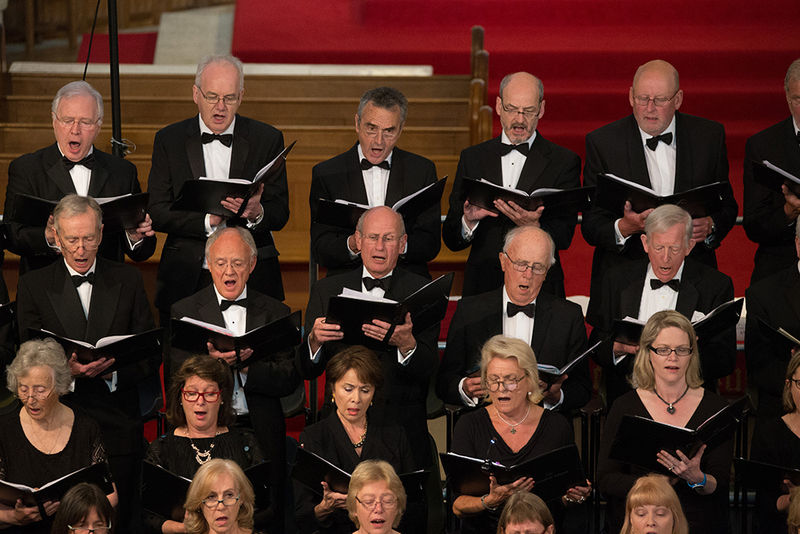 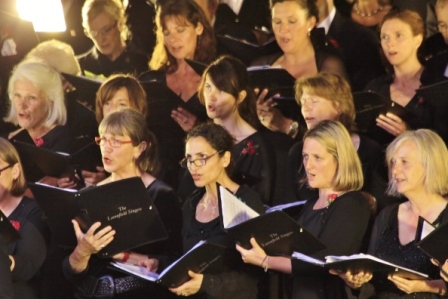 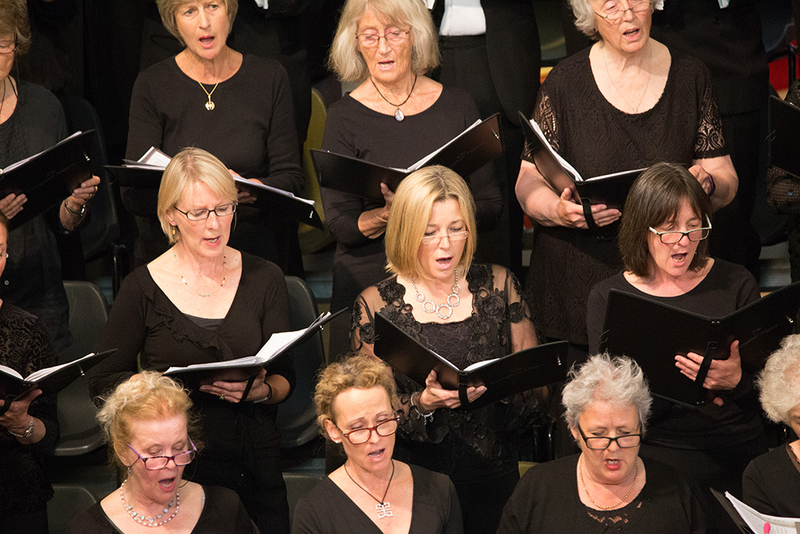 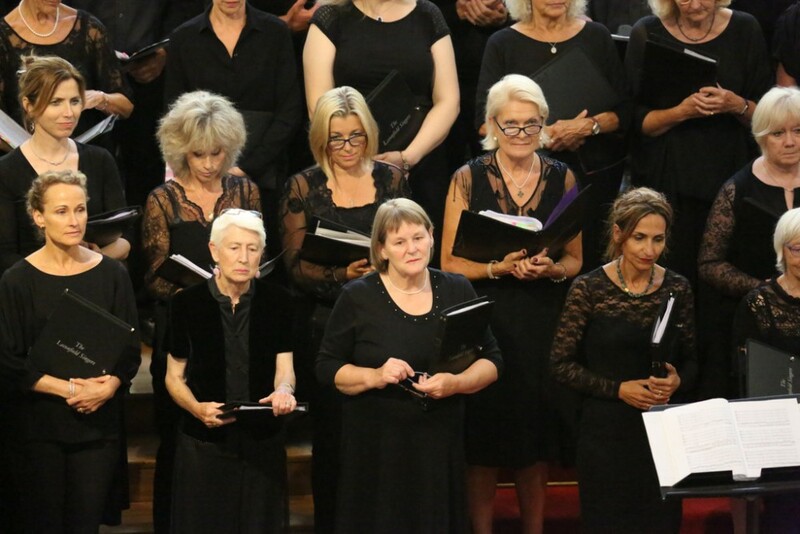 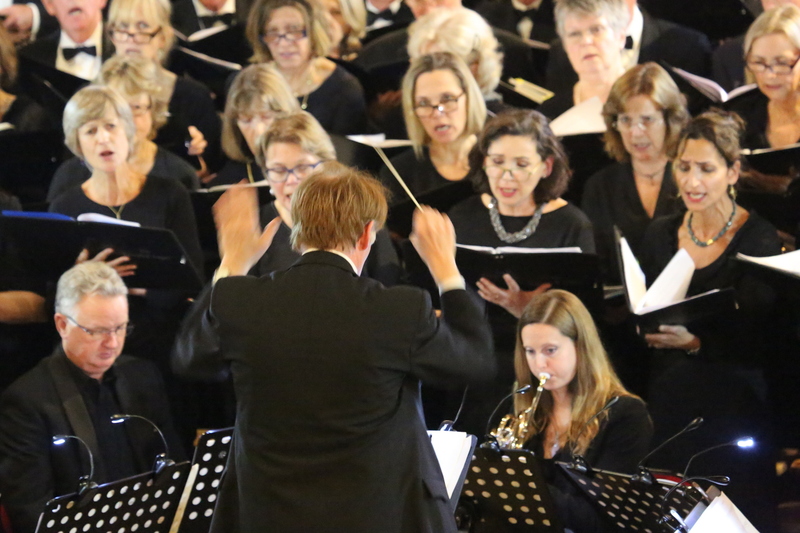 In May 2016 we joined forces with Berkhamstead and Chorleywood Choral Societies to form English Philharmonia Chorus – a 260 strong choir, with a 60 piece orchestra, filling the Royal Festival Hall with an audience of nearly 2,000 people! 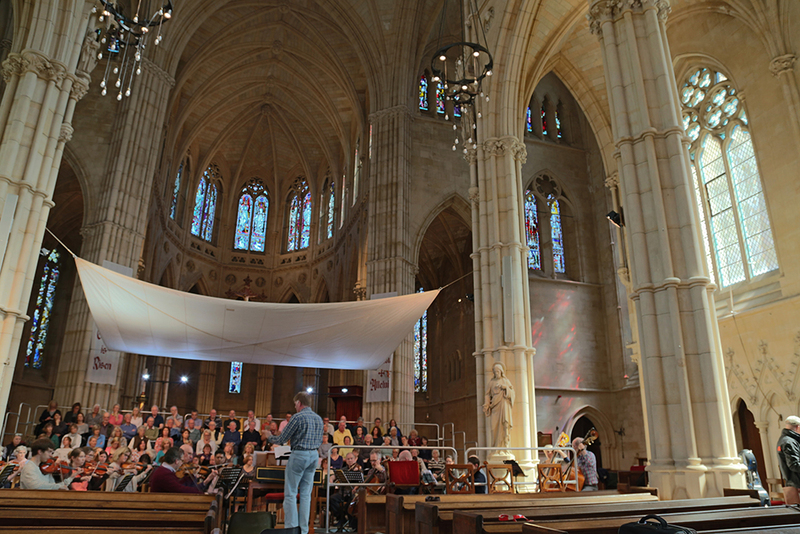 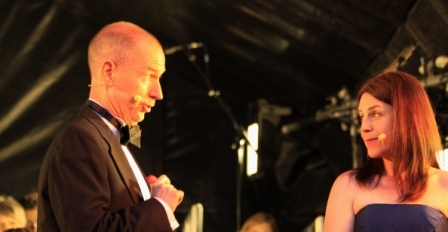 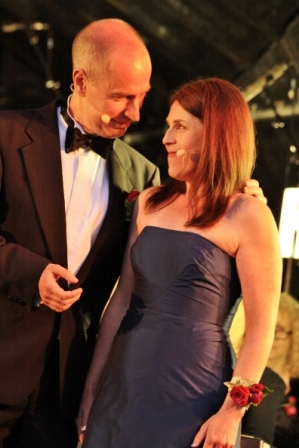 Here are some photos of the rehearsals and our final appearance on stage. 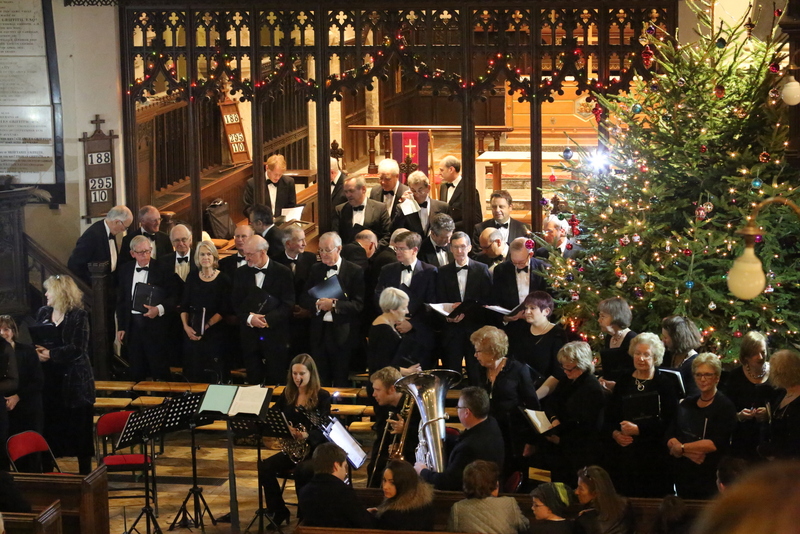 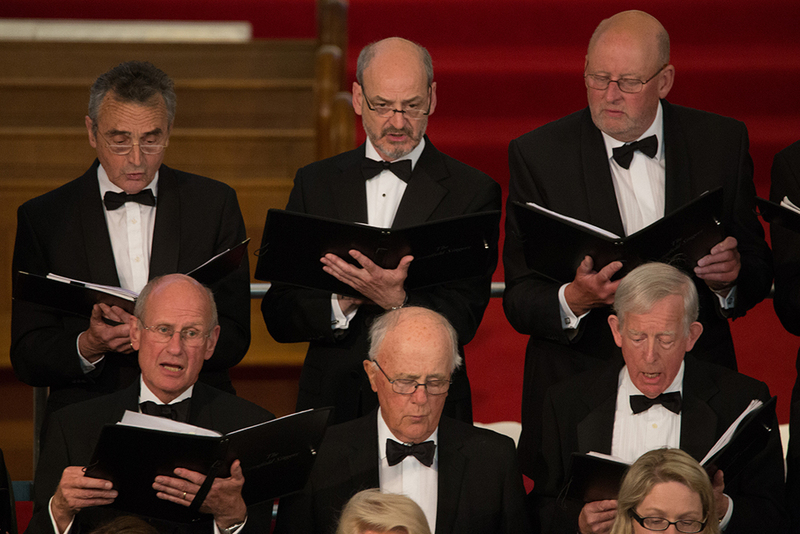 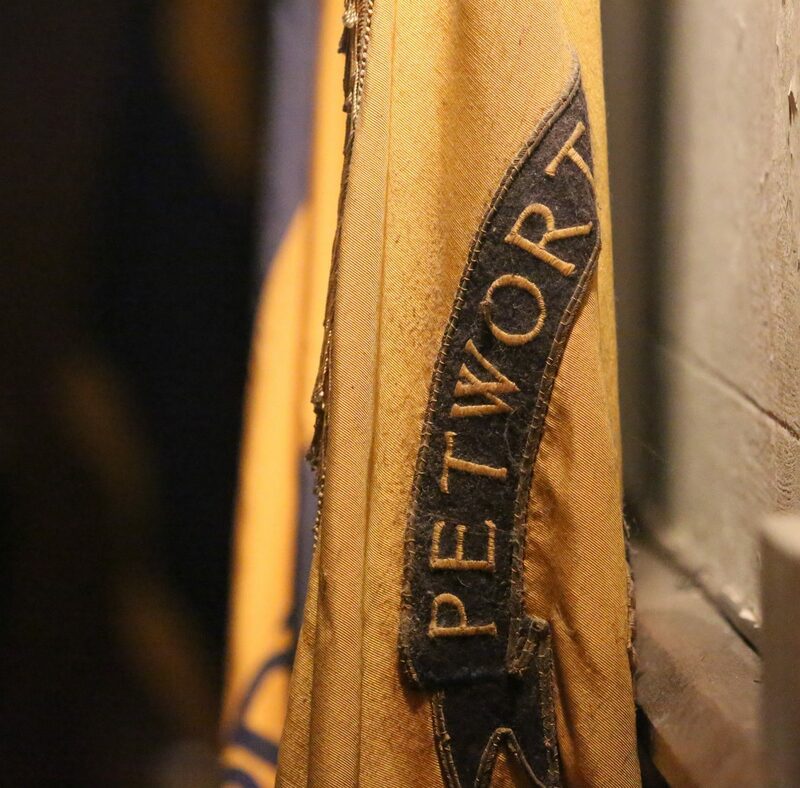 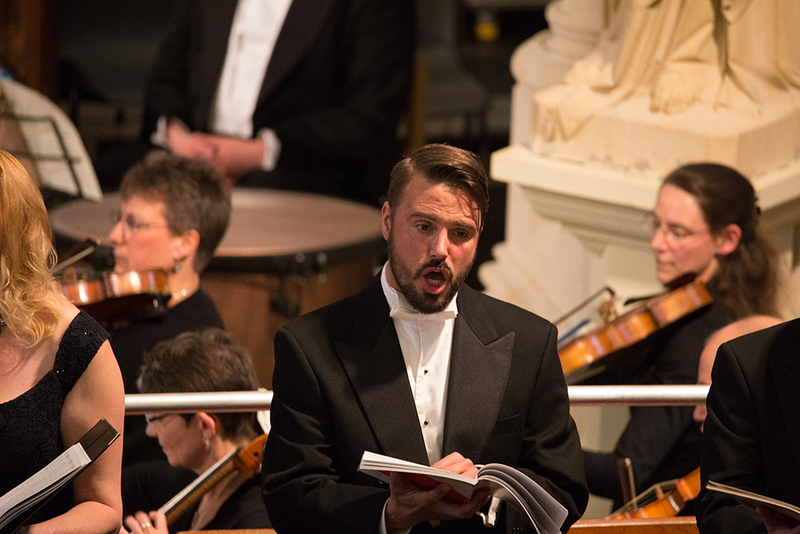 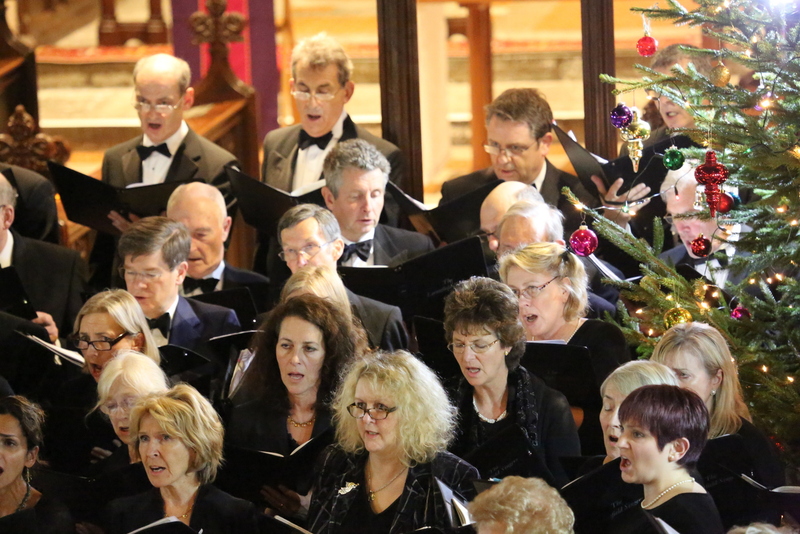 Once again we sold out of tickets as our Christmas Concert is now a feature of everyone’s Christmas in Petworth. 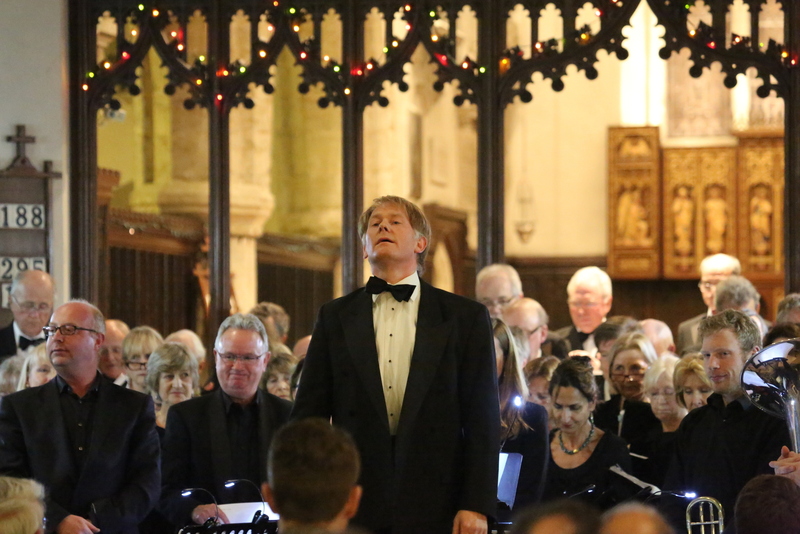 We sang a terrifically varied repertoire from Ramirez’s folk drama of the Nativity, favourites from Chris Williams’ Nowell! 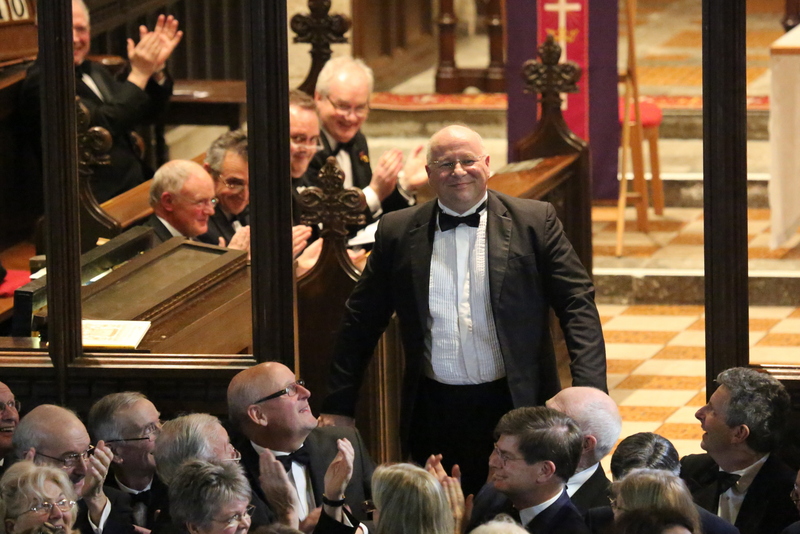 Nowell! 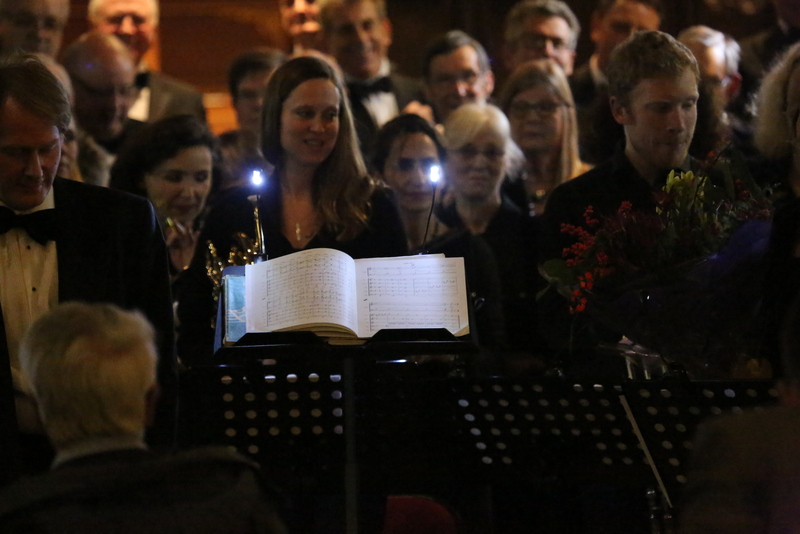 songbook to a fun-filled and much-enjoyed rendition of Jingle Bells! 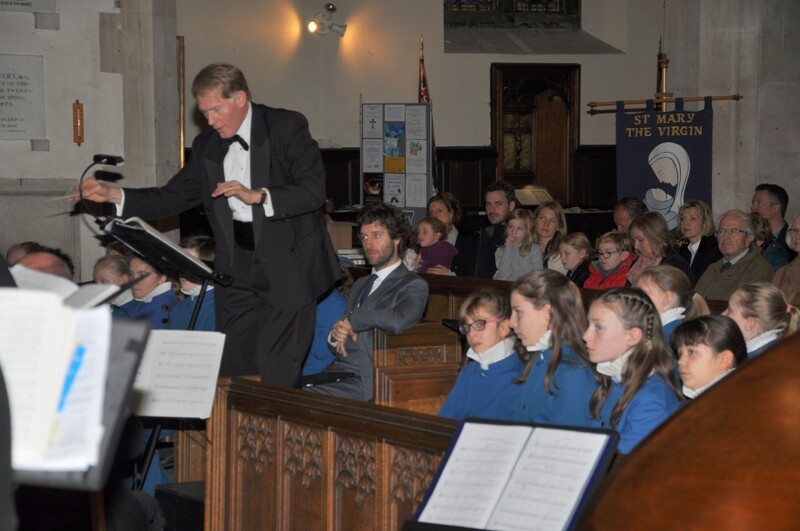 We also listened to the amusing ‘Mr Mozart Takes a Sleigh Ride’ played by Phil Scriven and some lovely seasonal pieces by English Philharmonia. 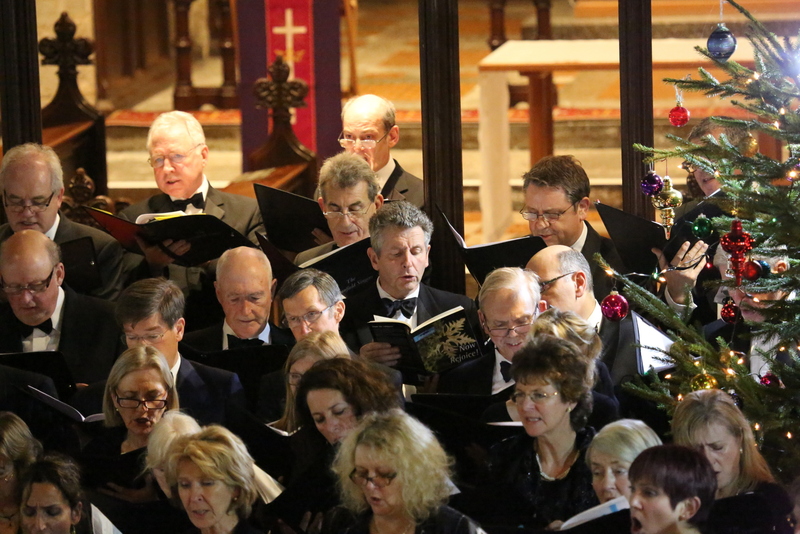 This was all peppered with everyone’s much loved traditional Christmas Carols of course! 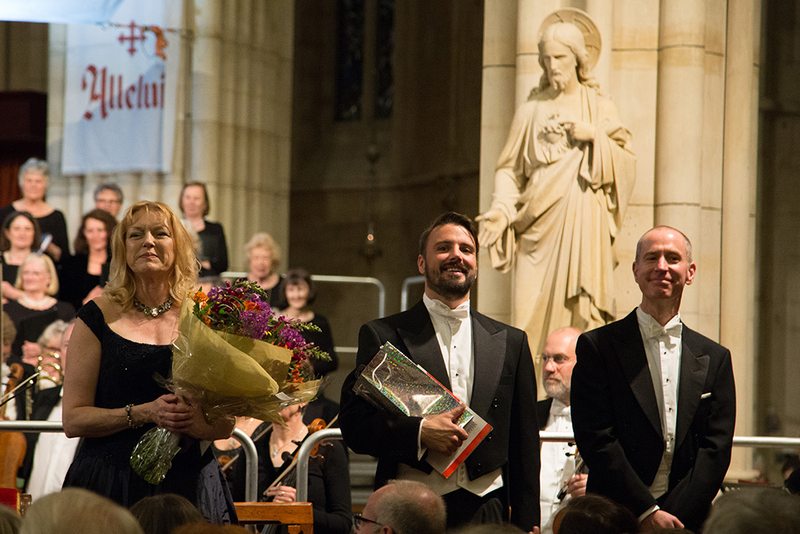 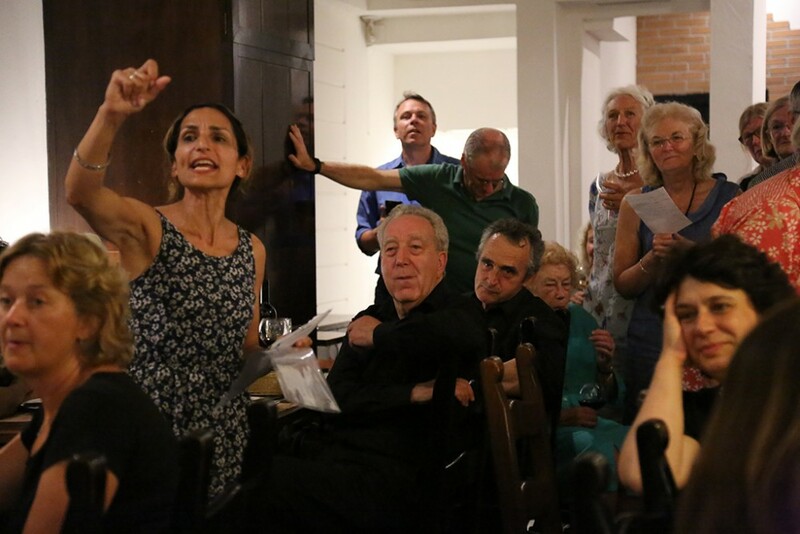 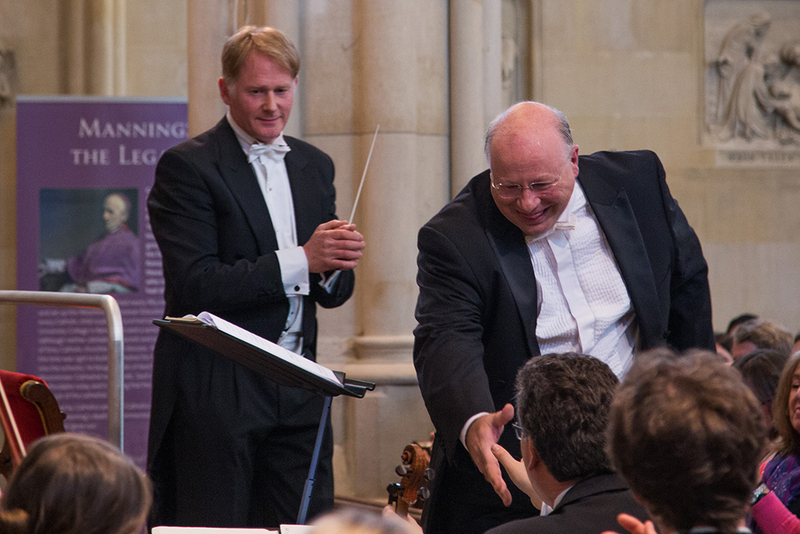 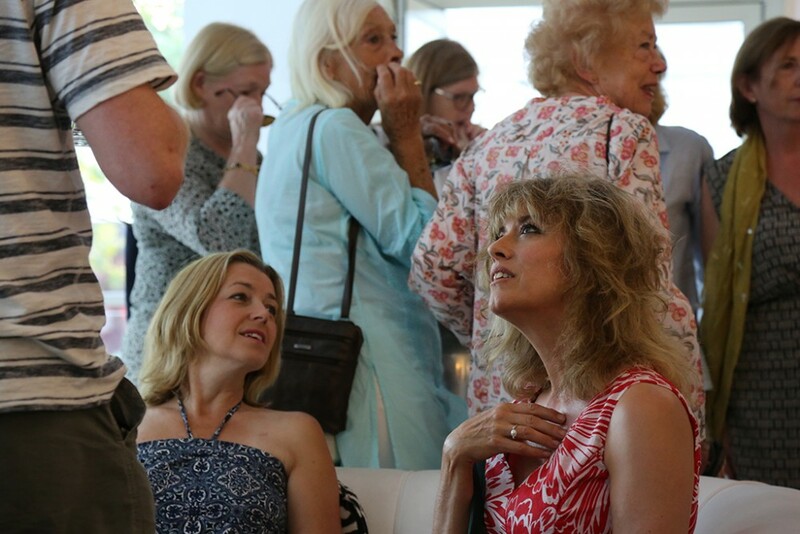 We owe our thanks to Andrii Kaplanovskyi for taking such wonderful photos and capturing the essence of the evening. 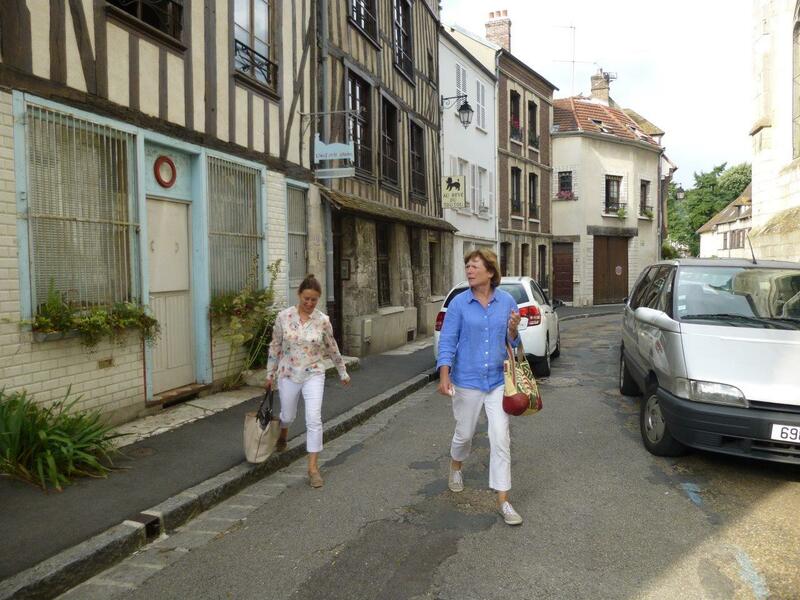 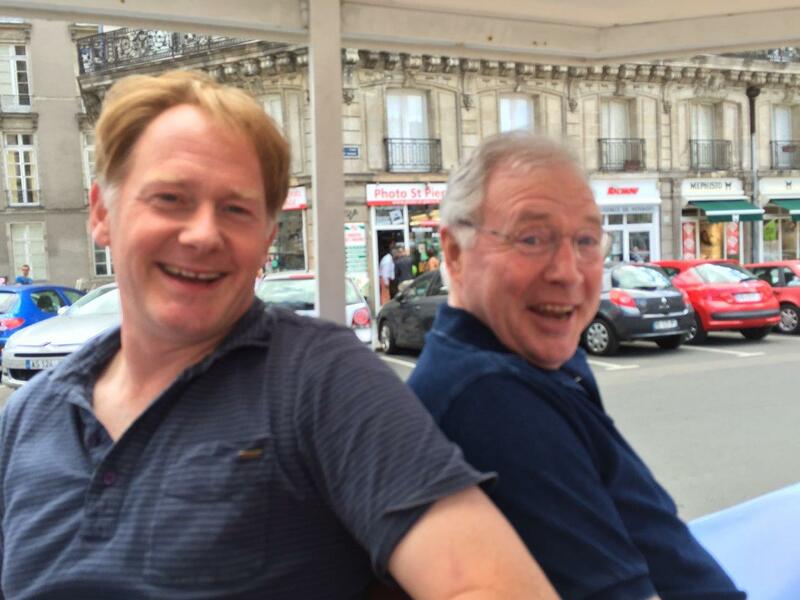 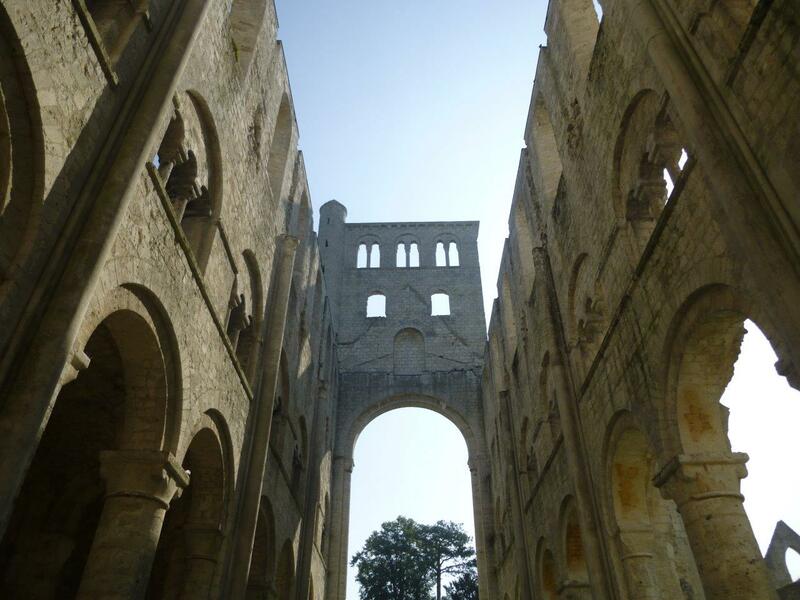 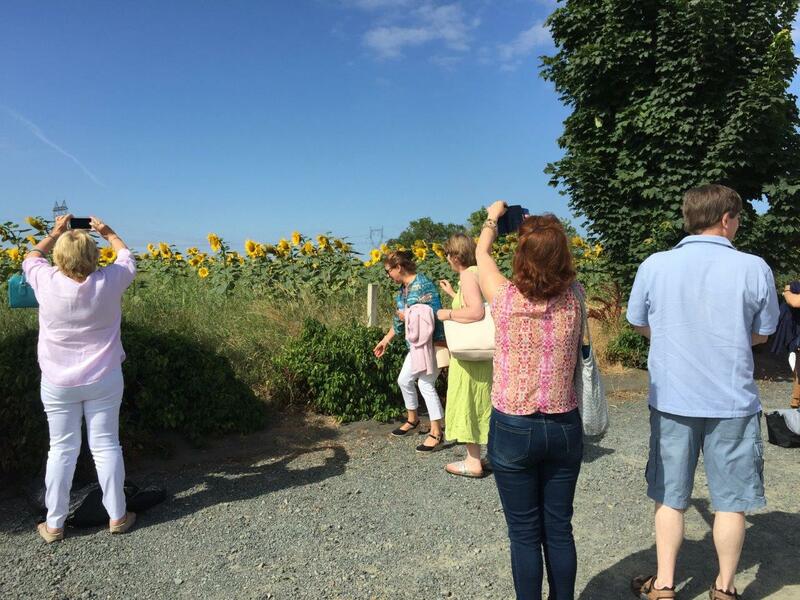 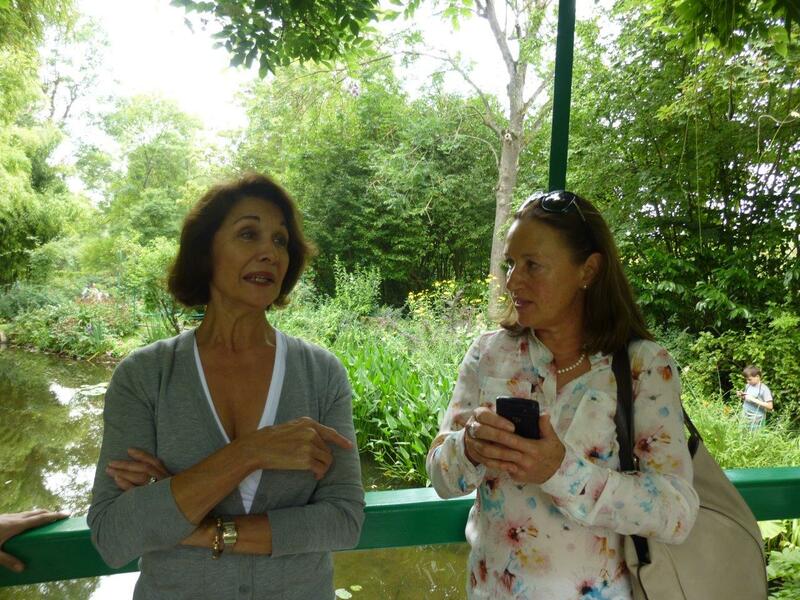 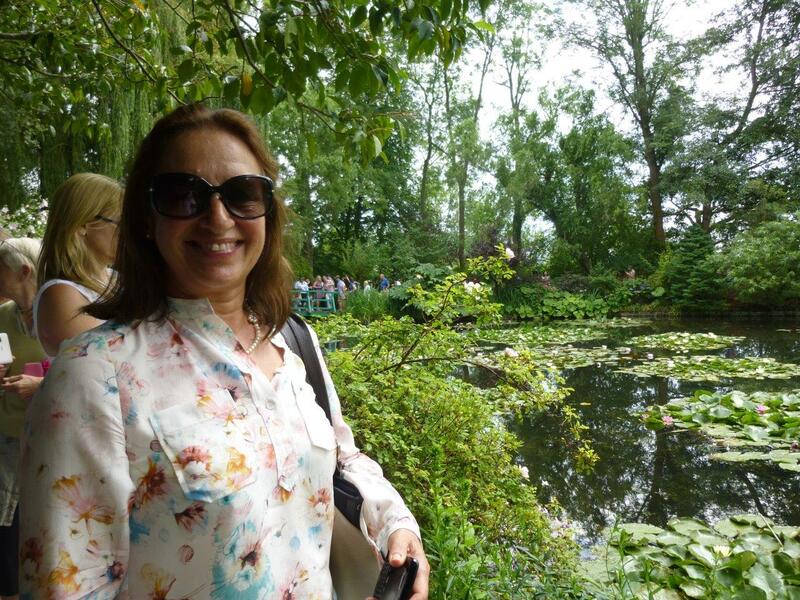 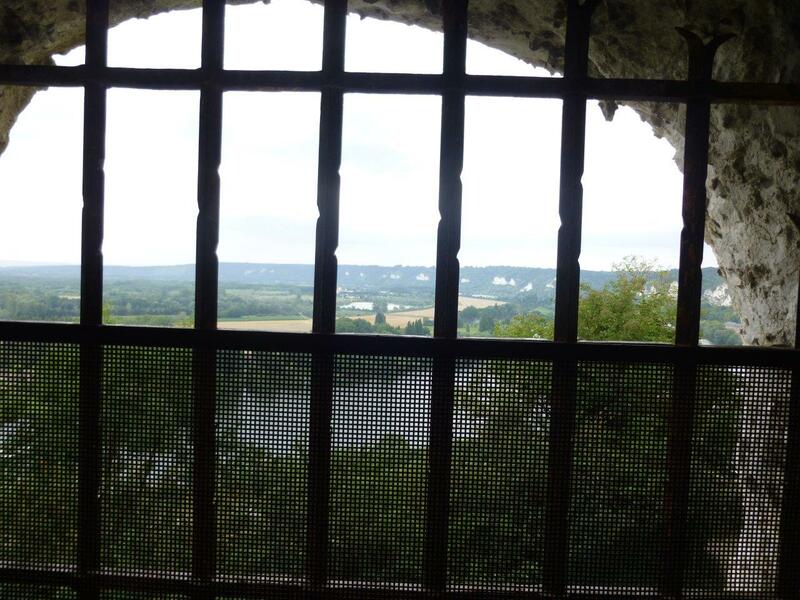 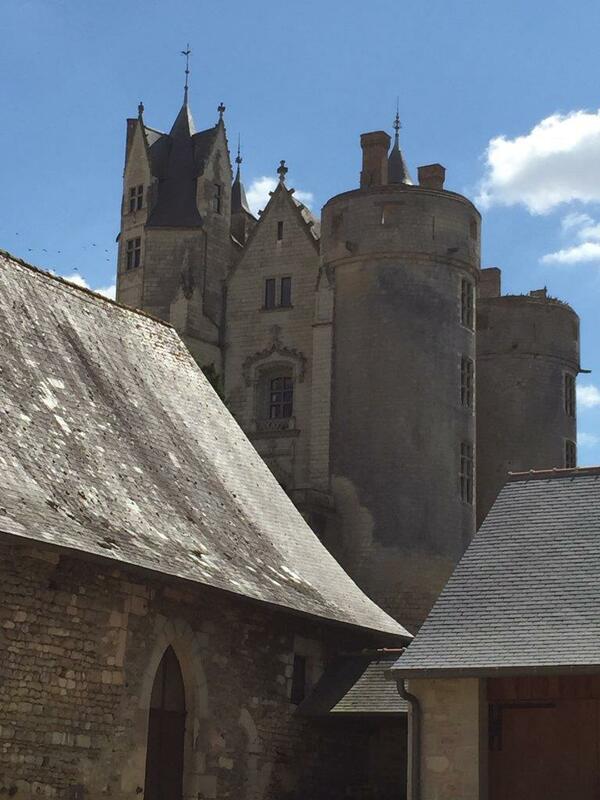 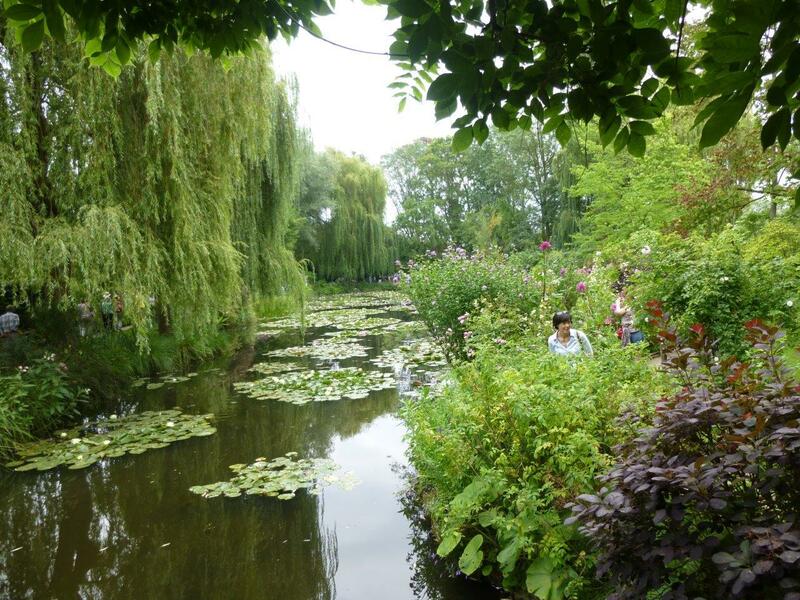 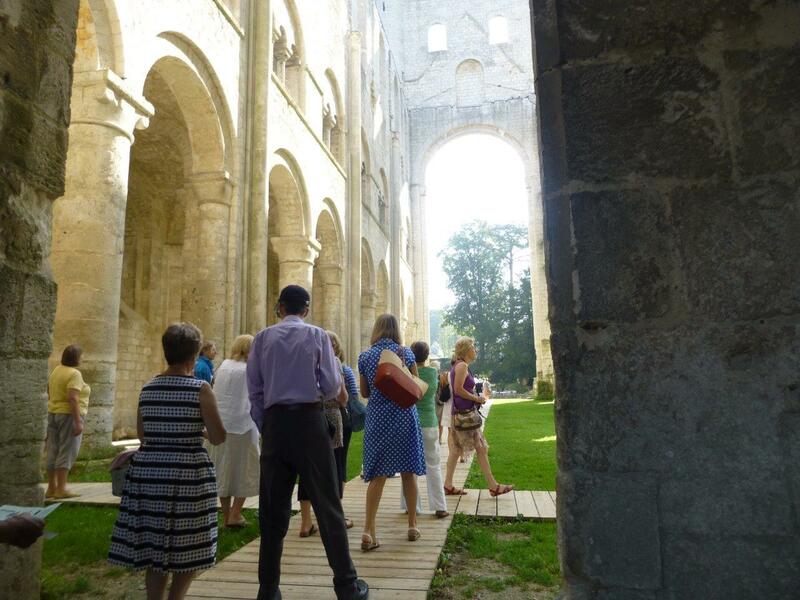 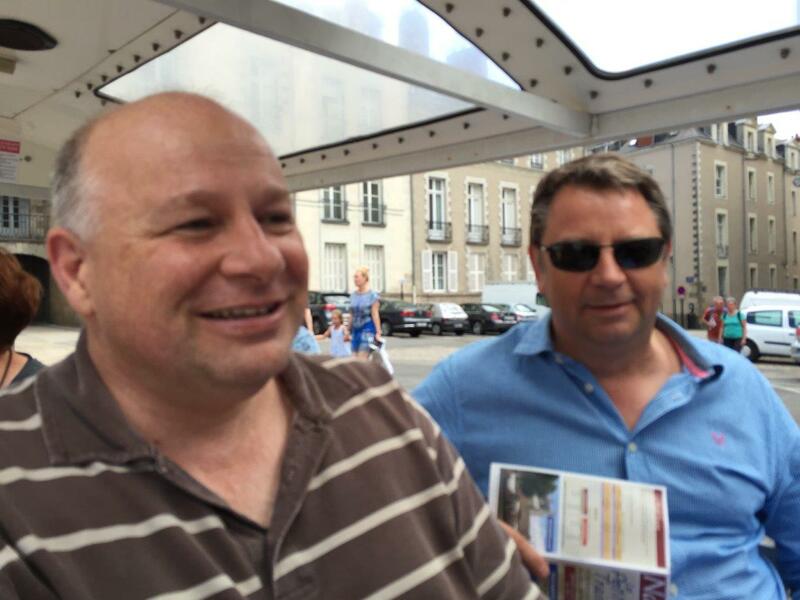 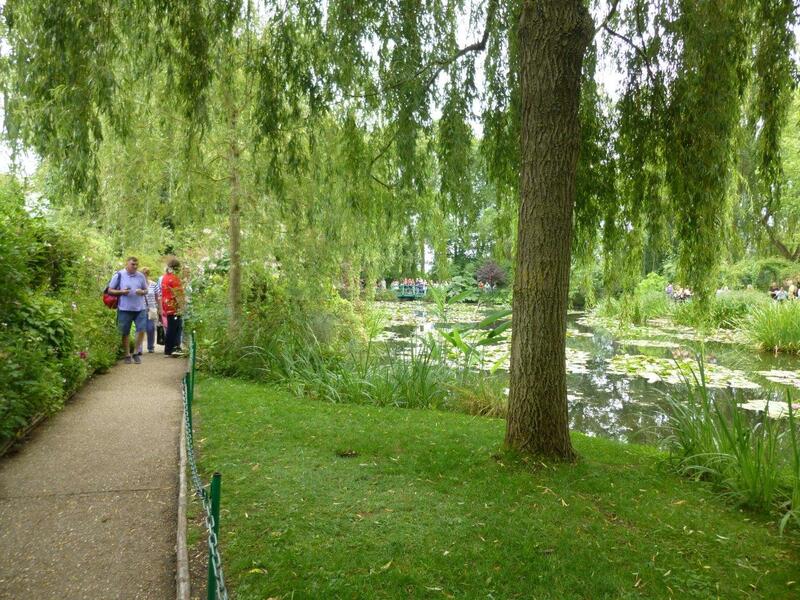 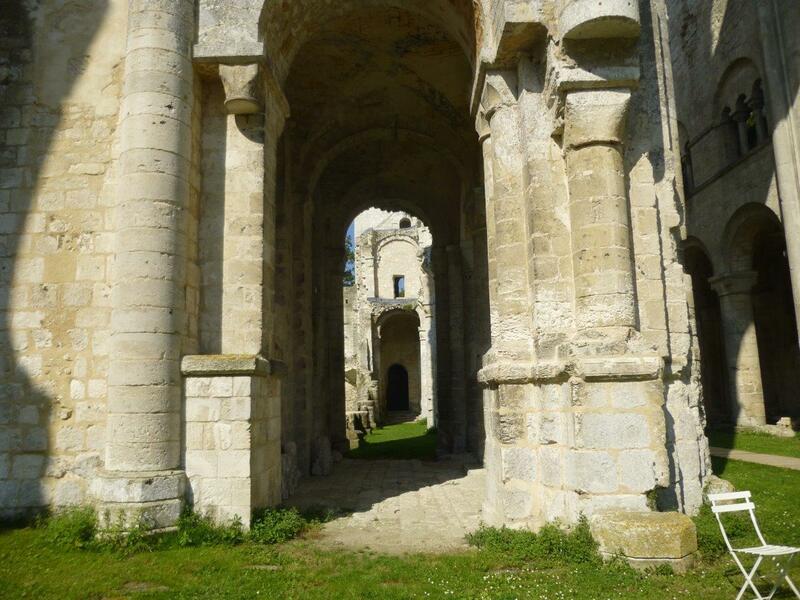 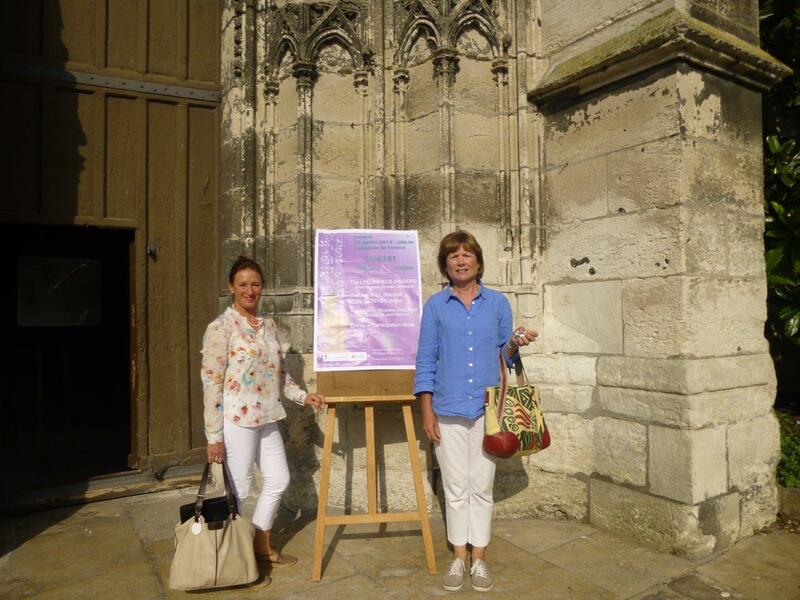 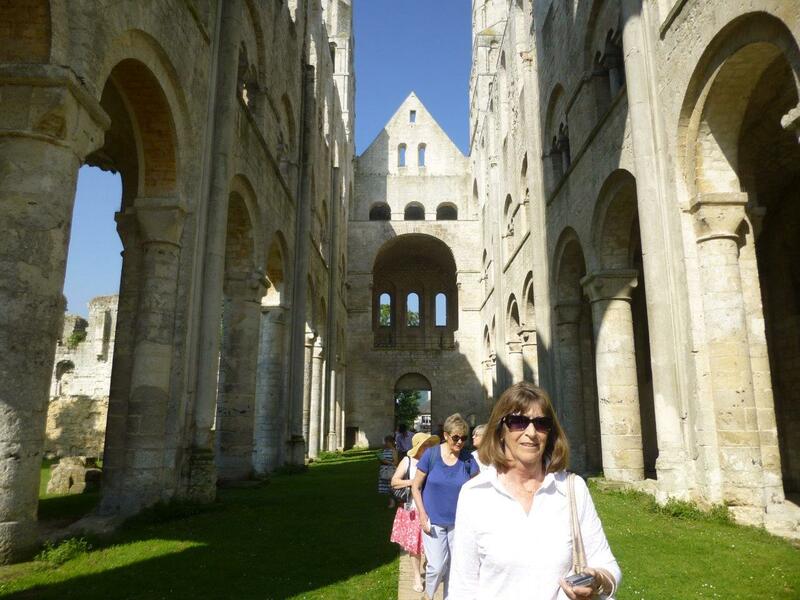 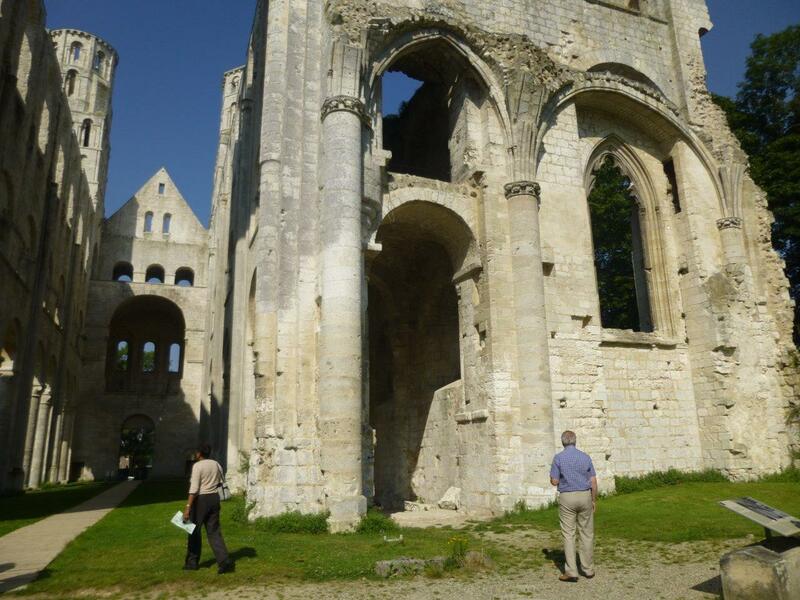 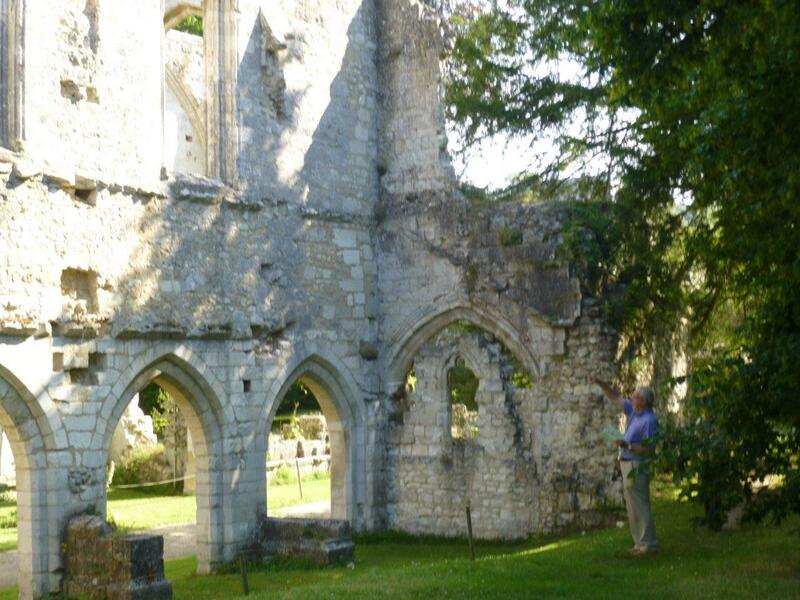 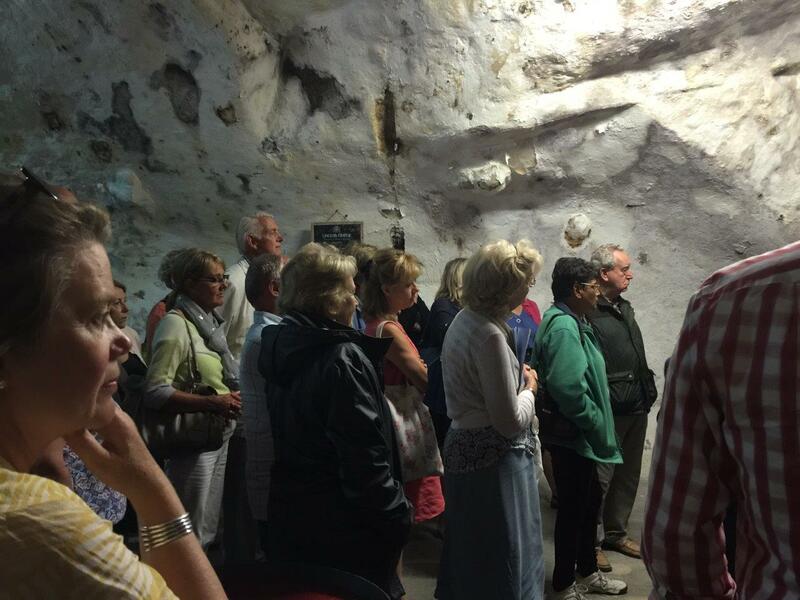 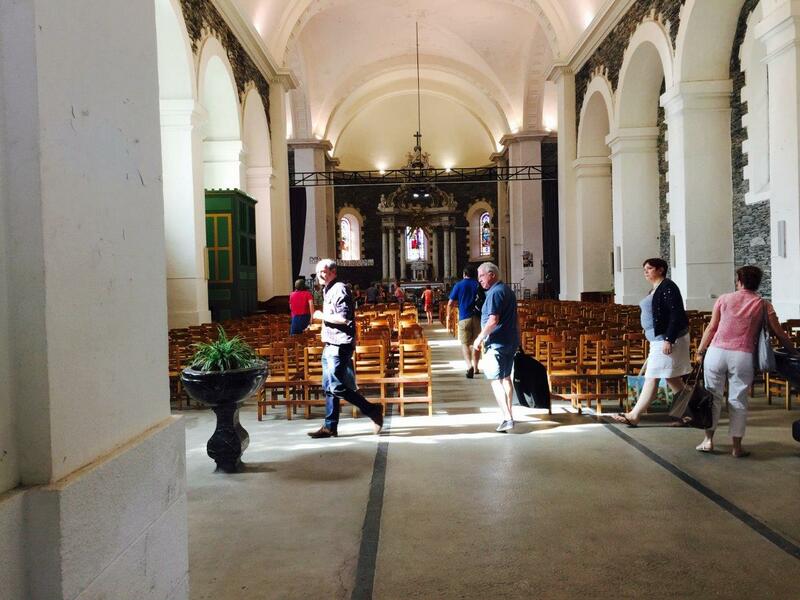 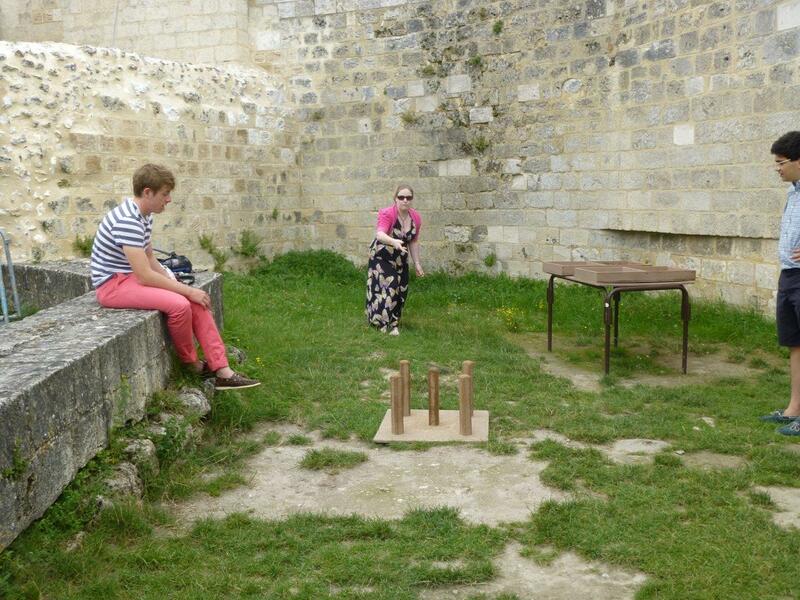 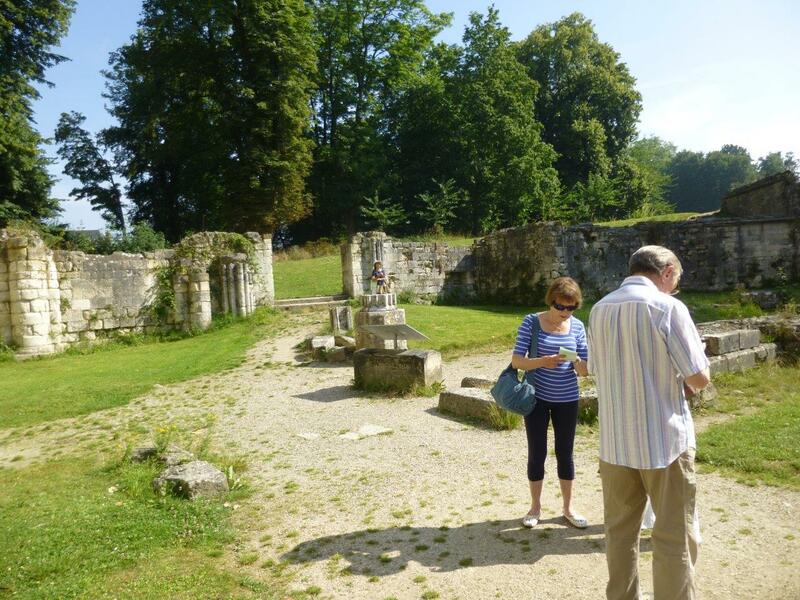 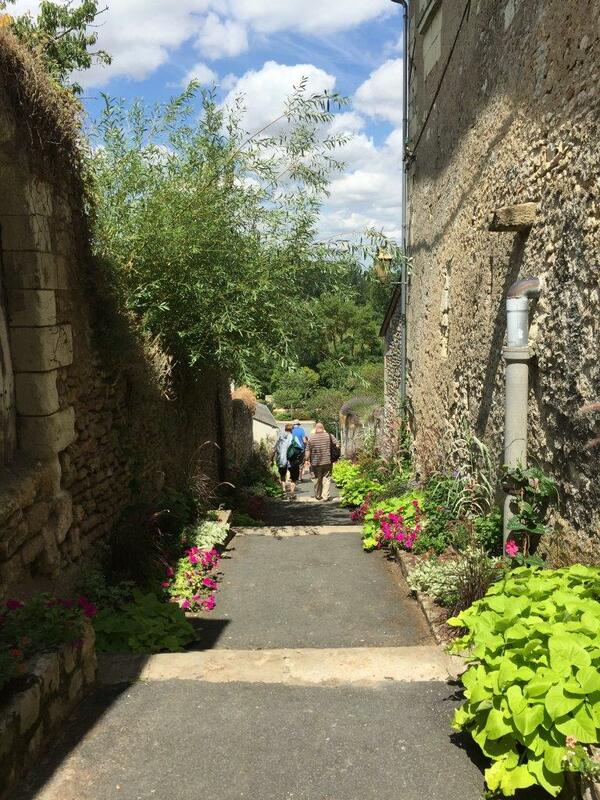 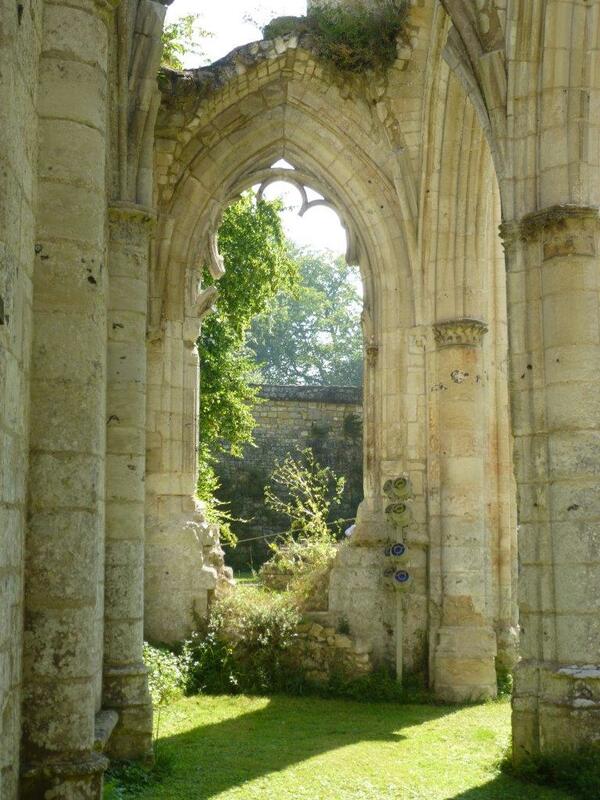 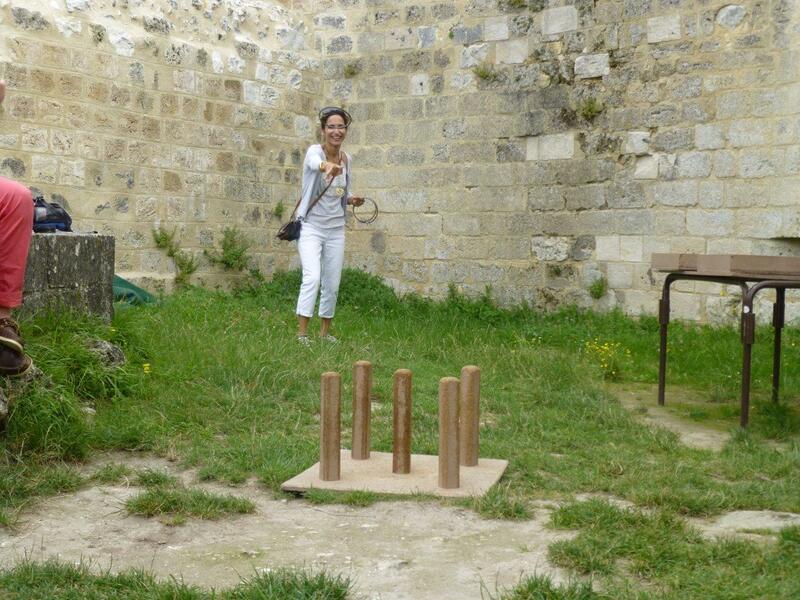 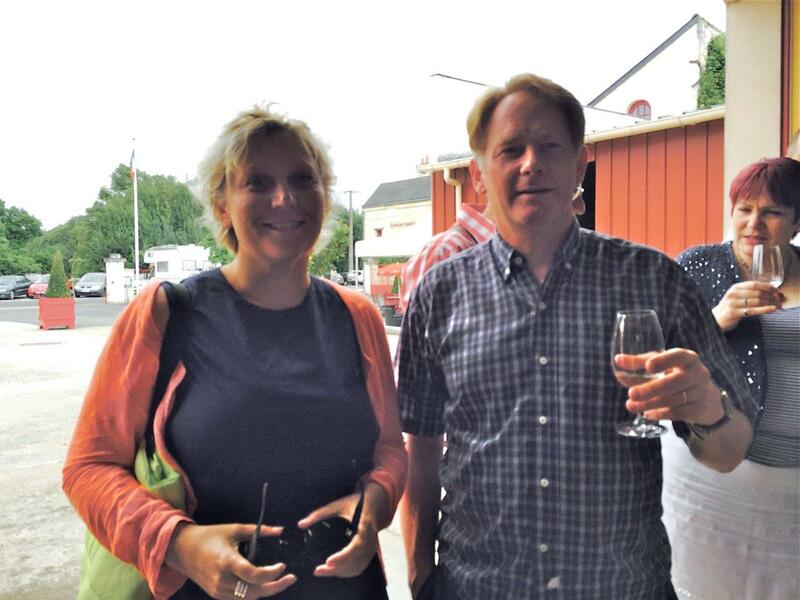 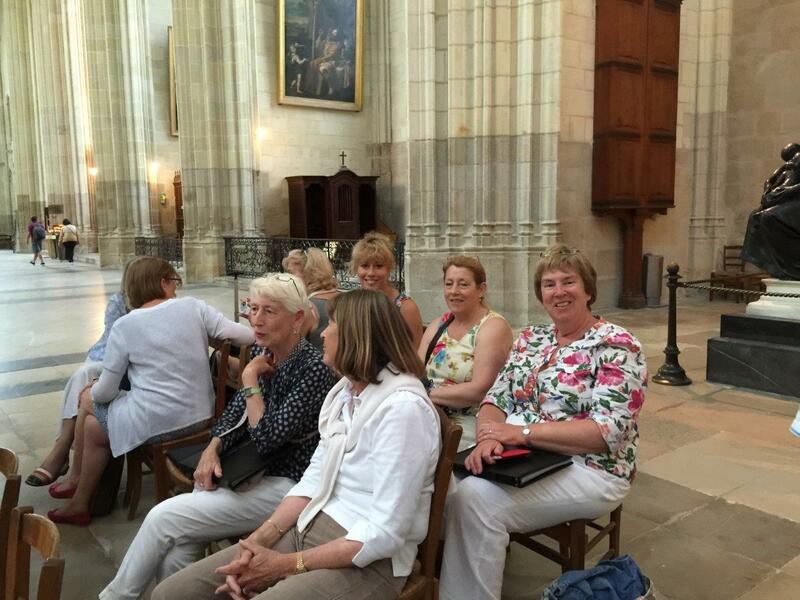 We had a lovely tour in the Loire Valley, France this year. 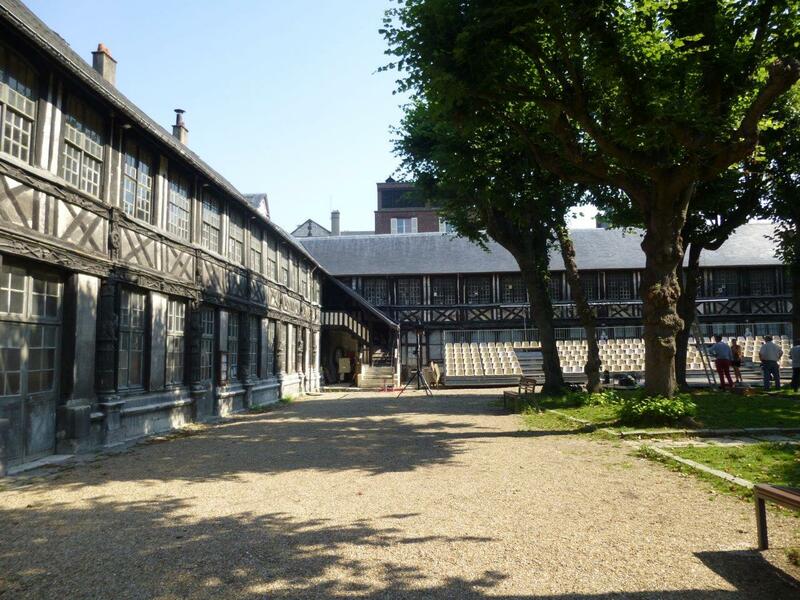 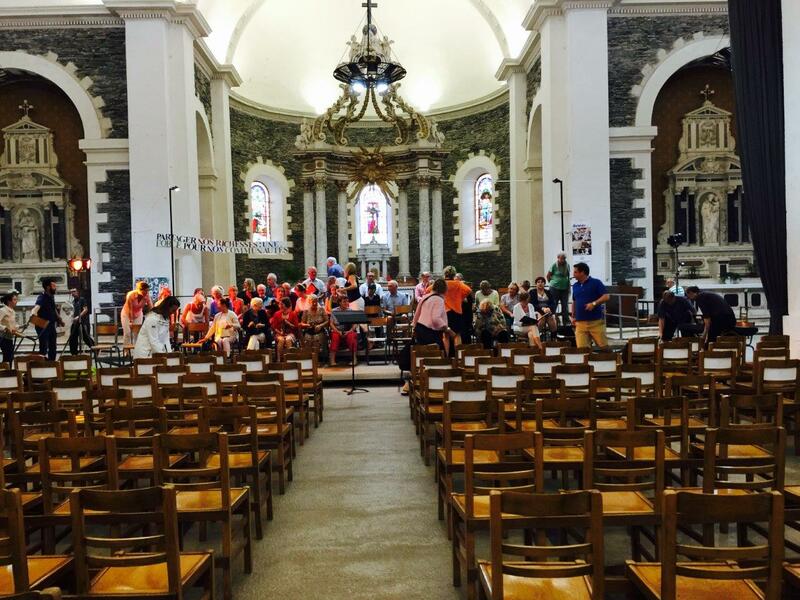 Based in Angers we performed 3 concerts in 5 days in Montreuil-Bellay, Trélazé as part of the FestivalEstival, and Nantes Cathedral. 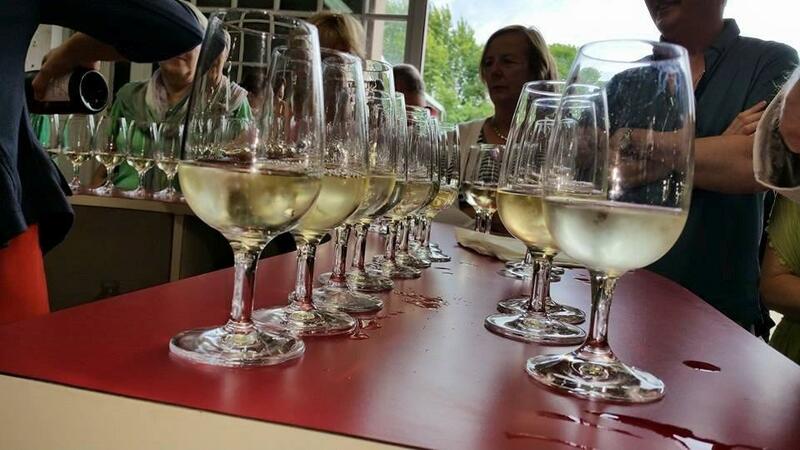 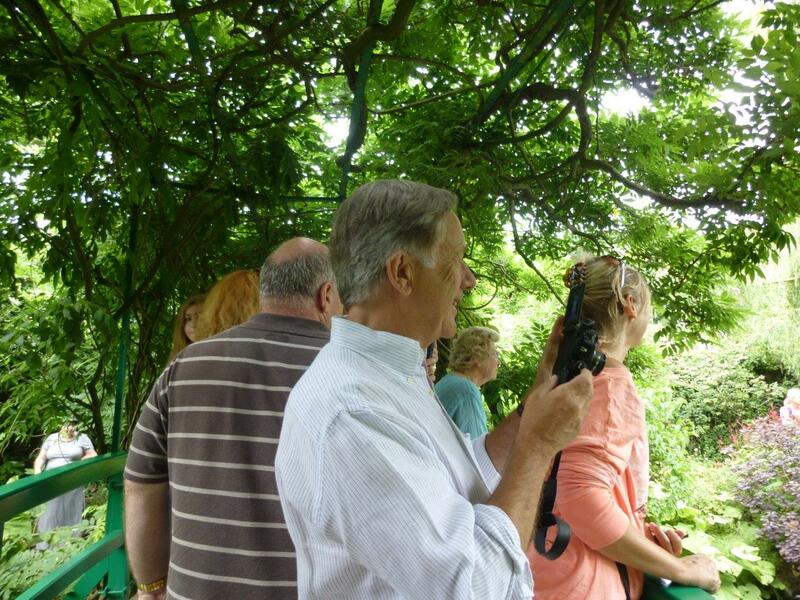 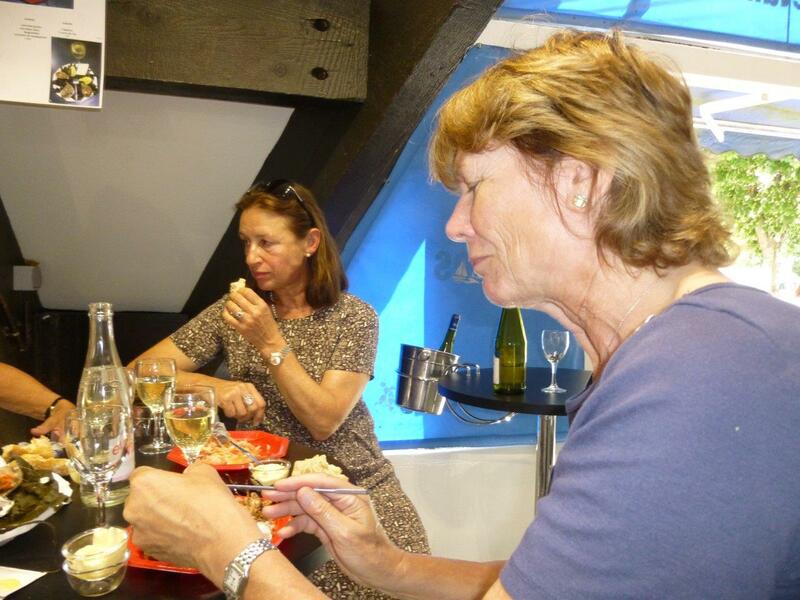 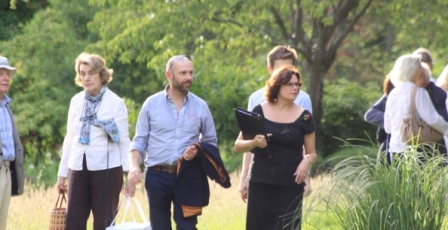 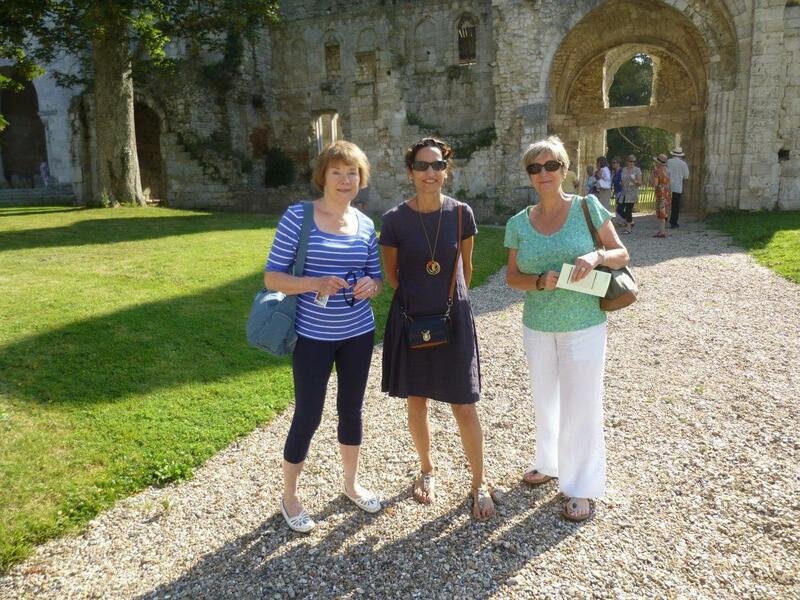 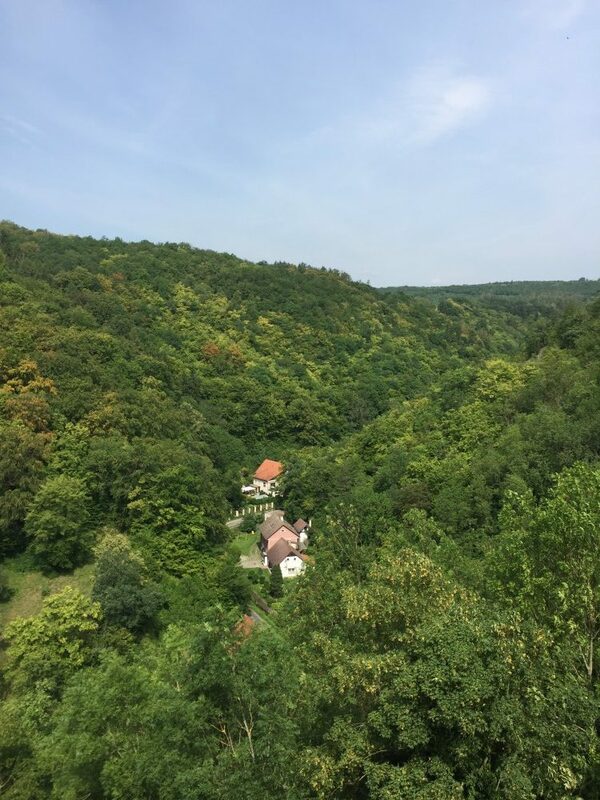 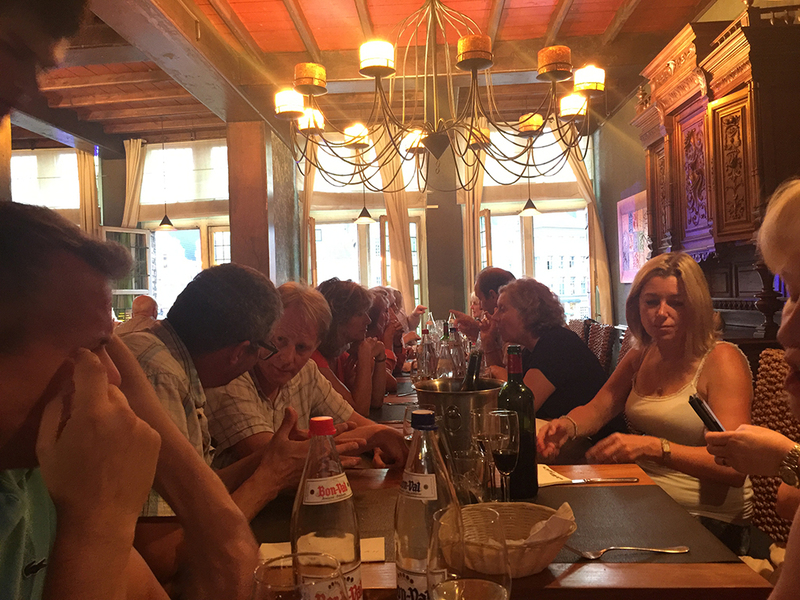 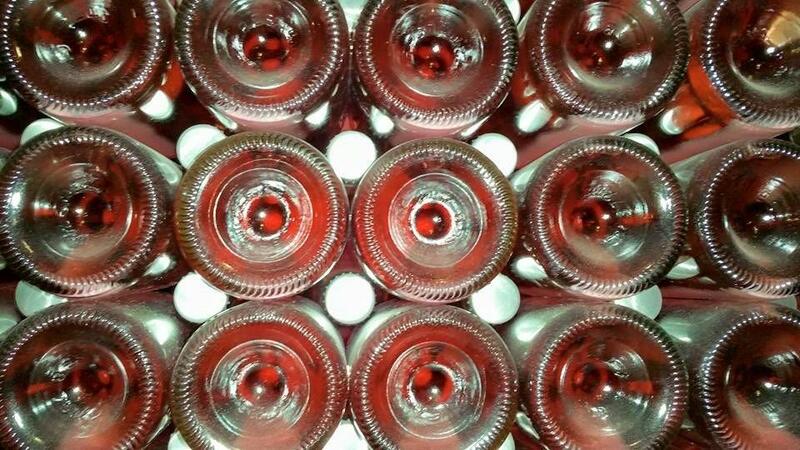 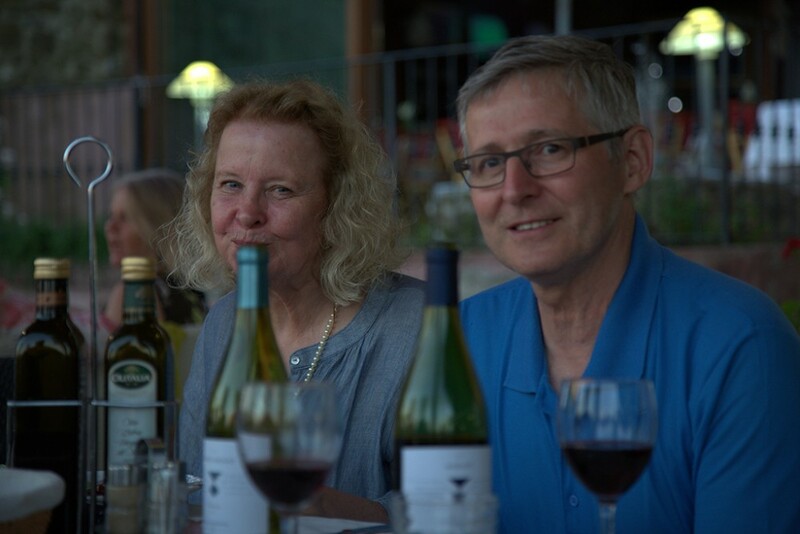 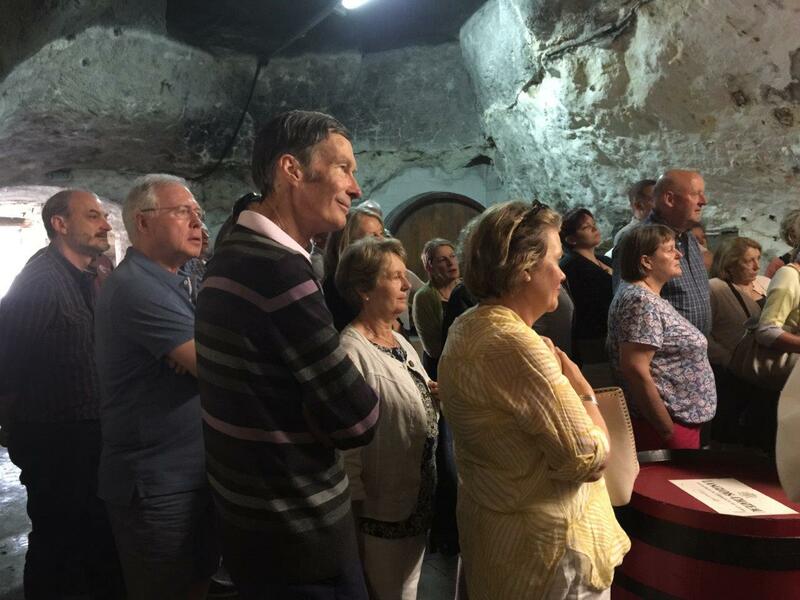 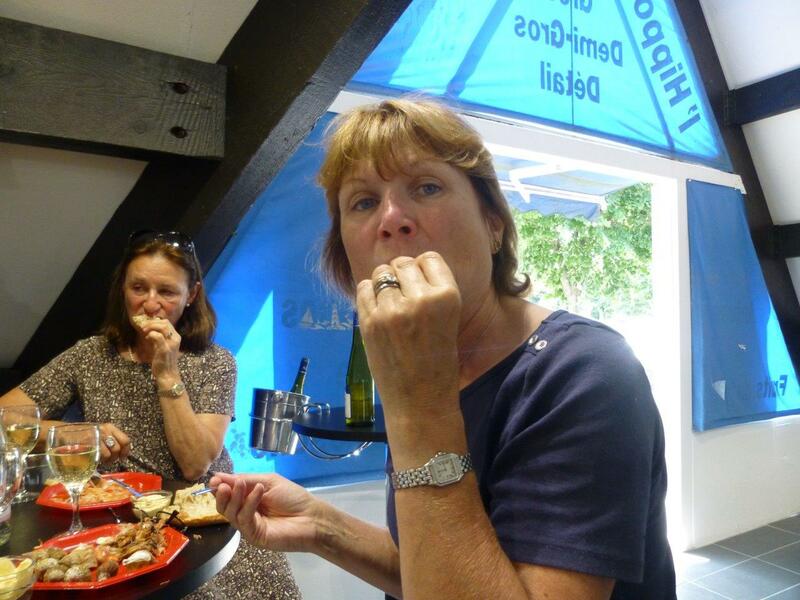 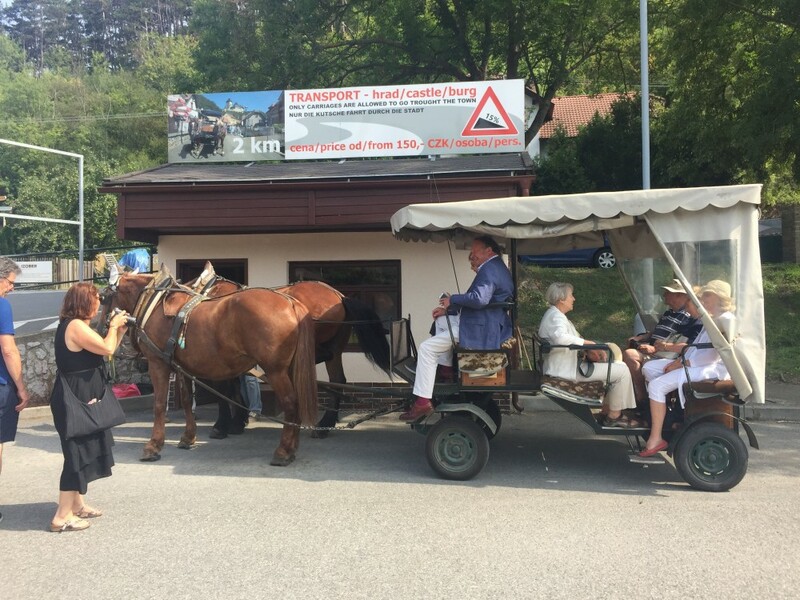 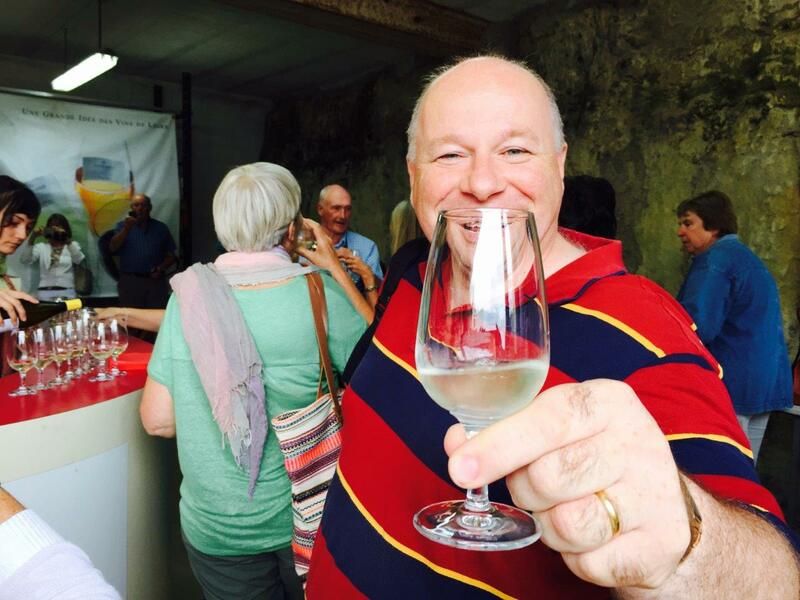 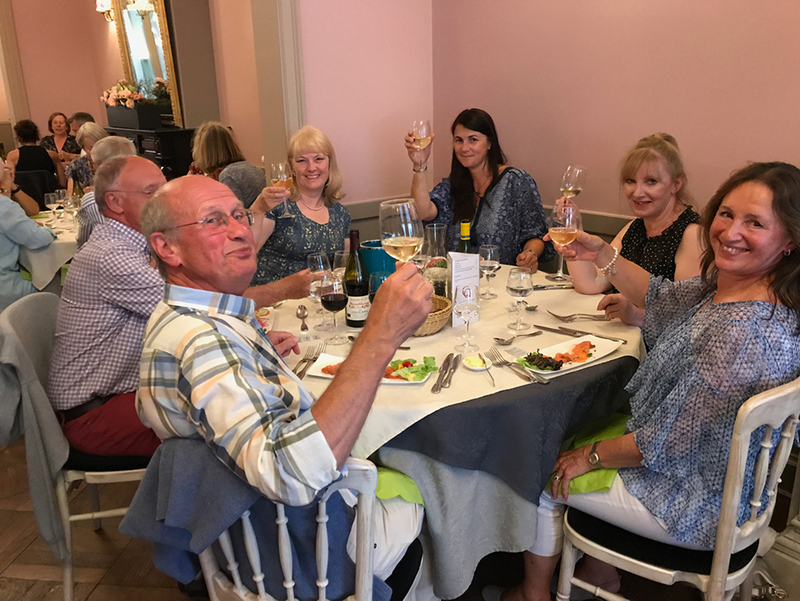 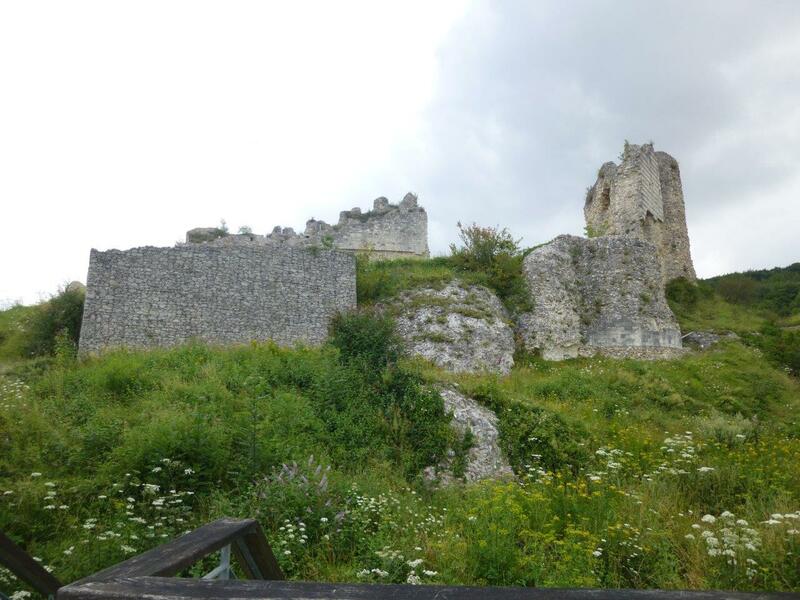 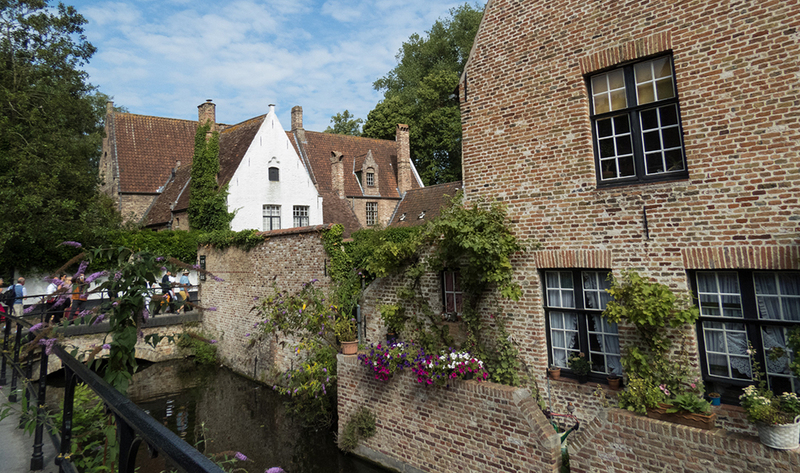 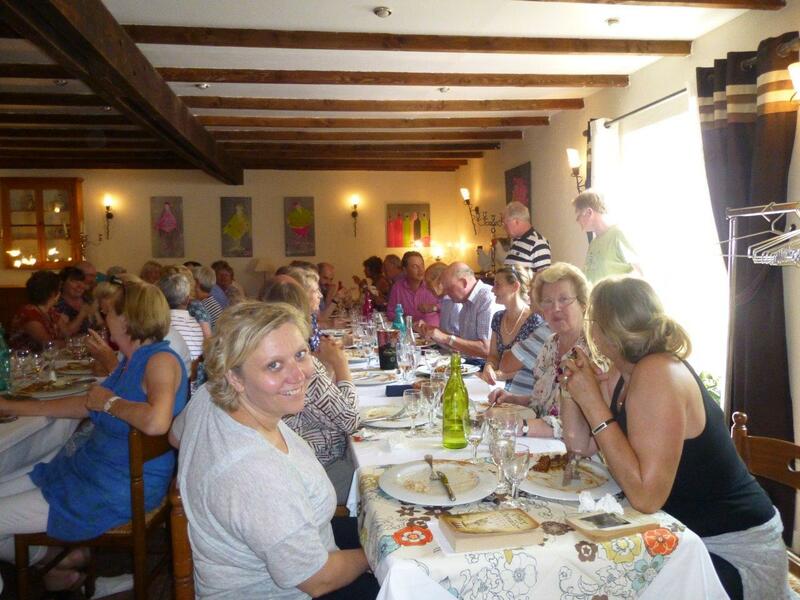 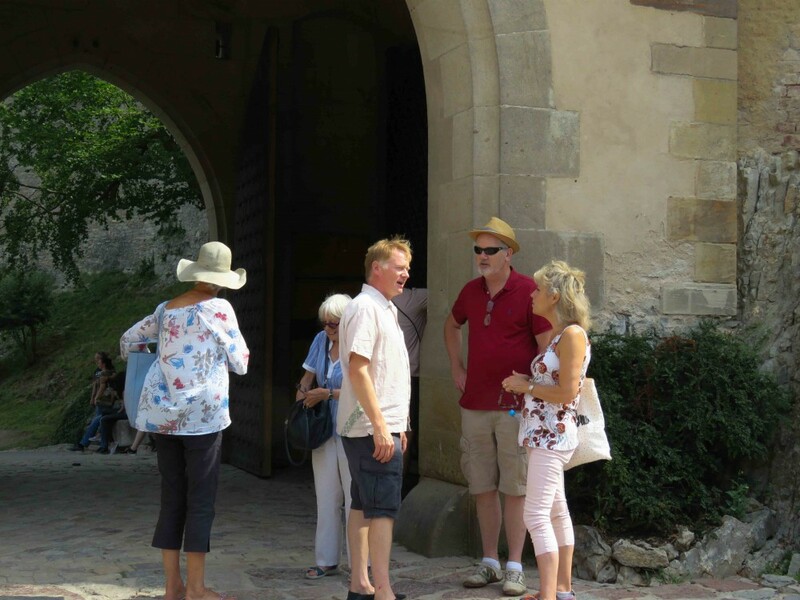 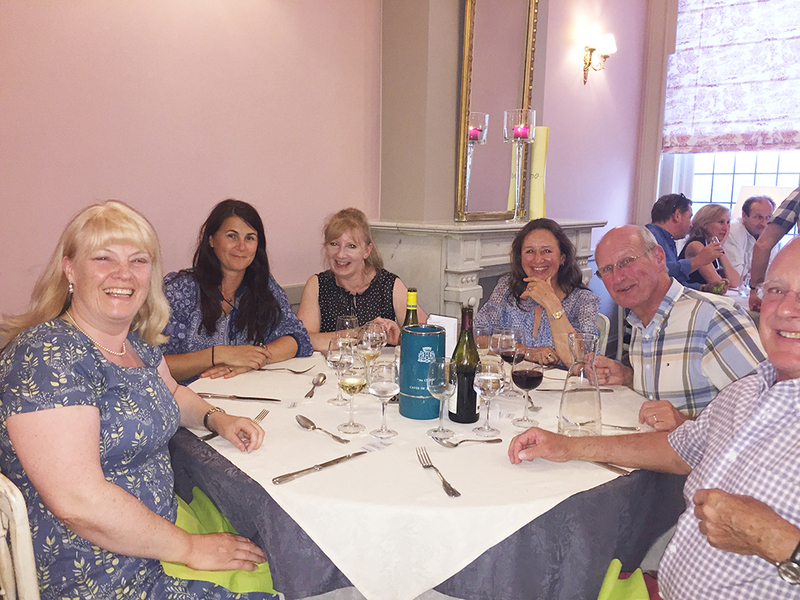 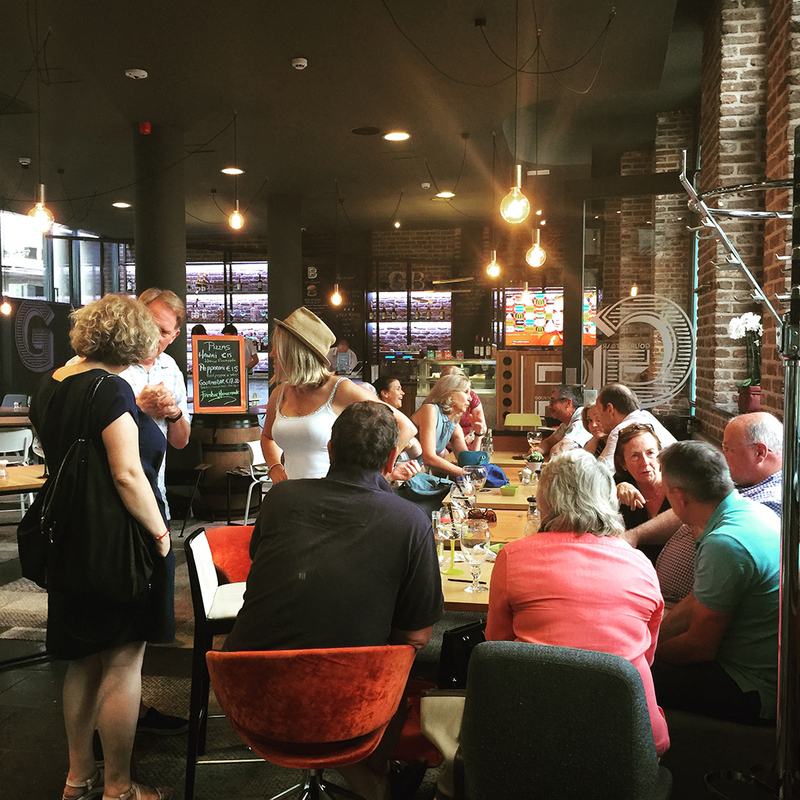 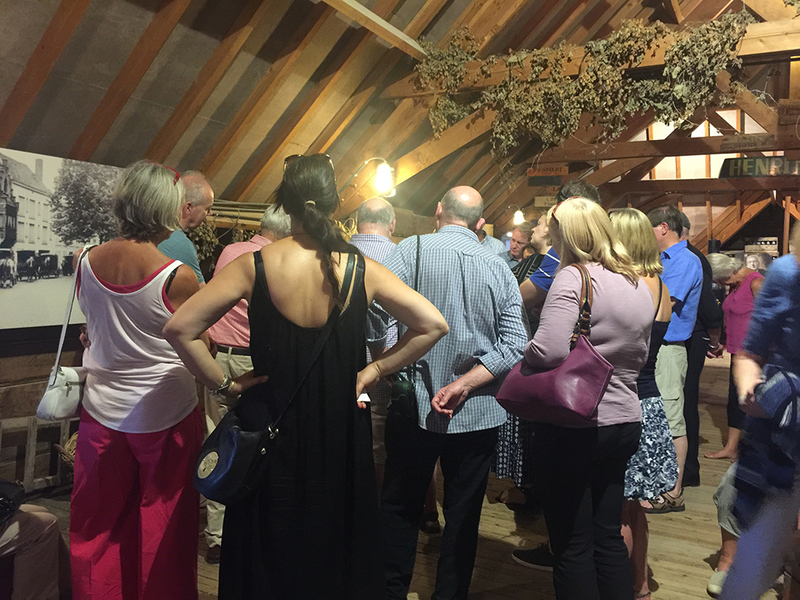 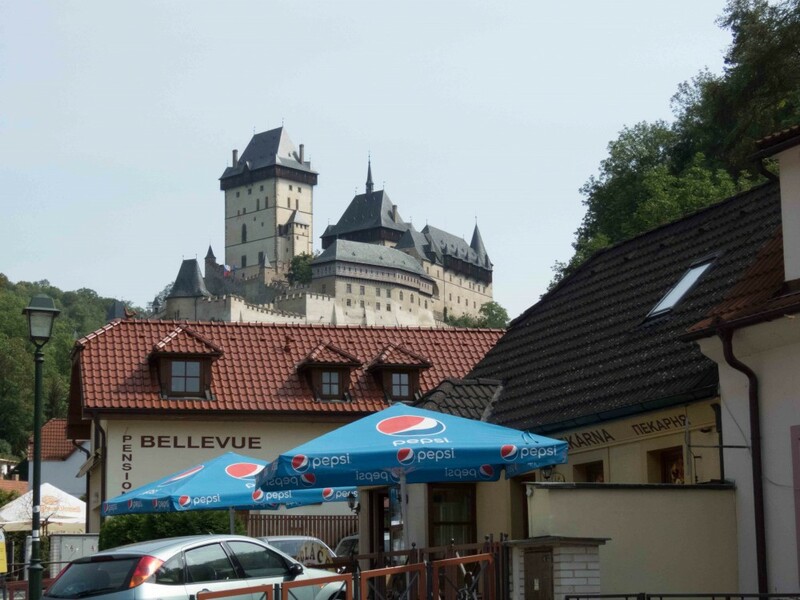 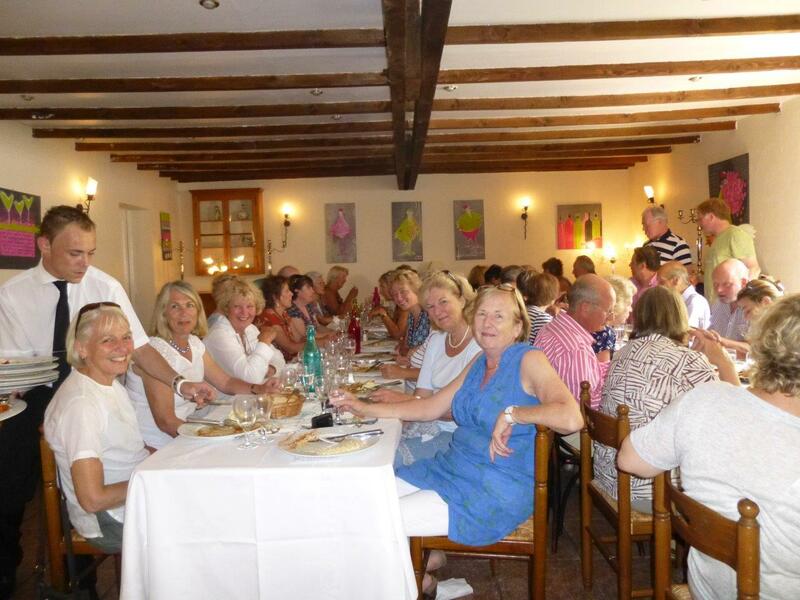 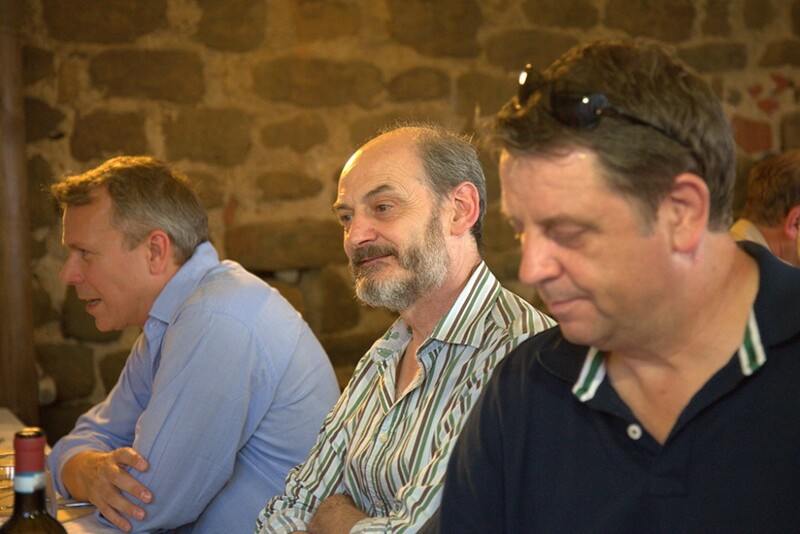 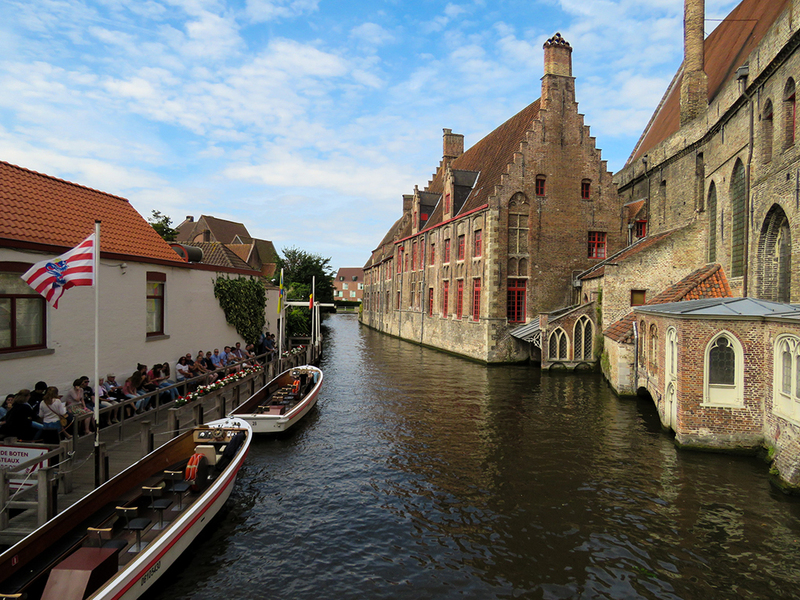 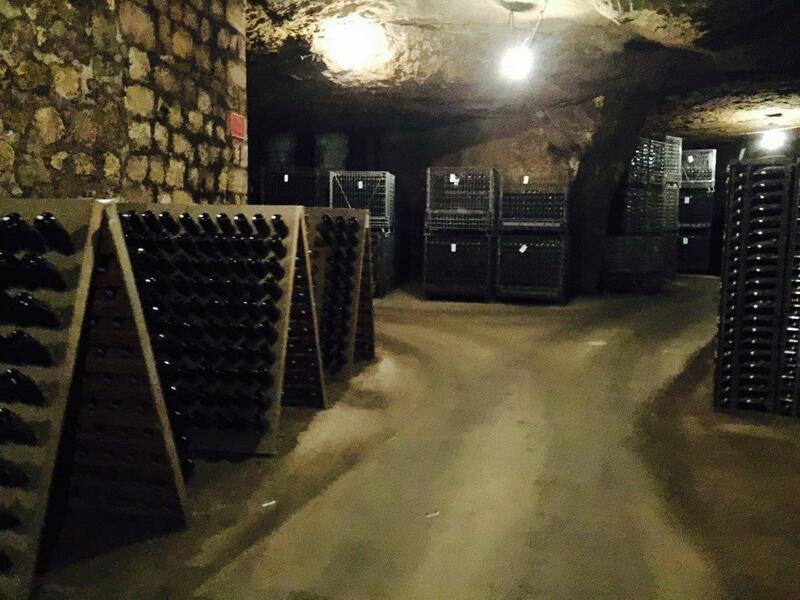 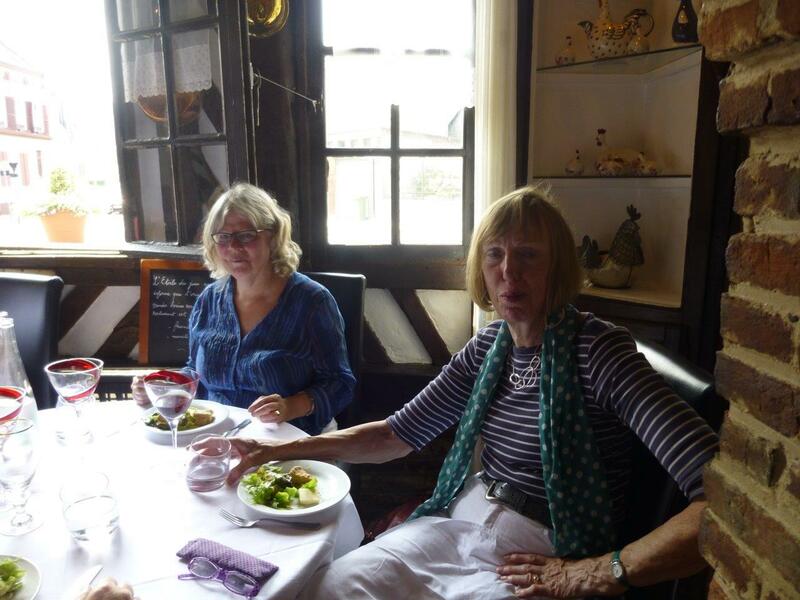 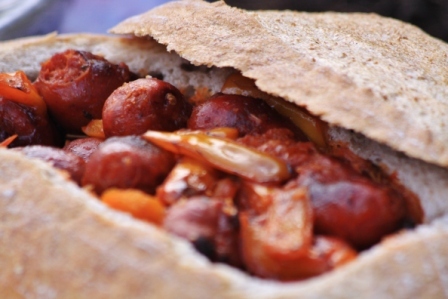 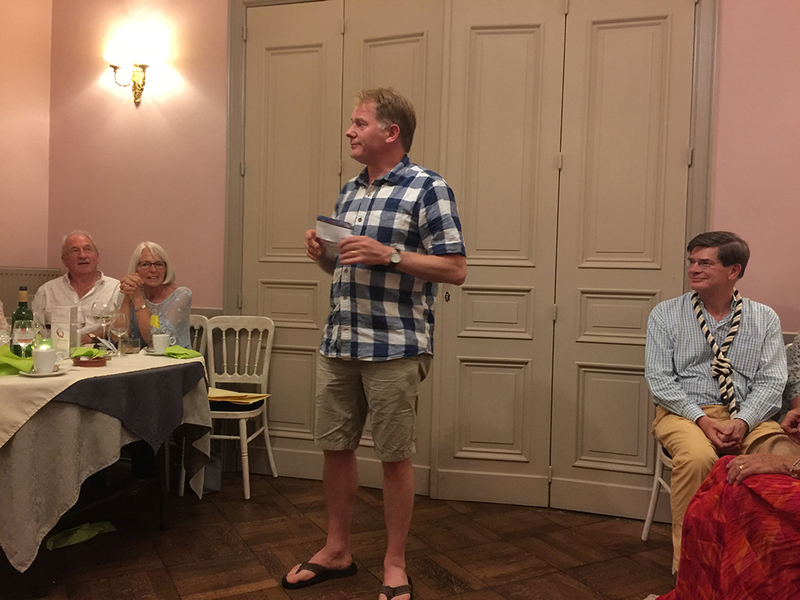 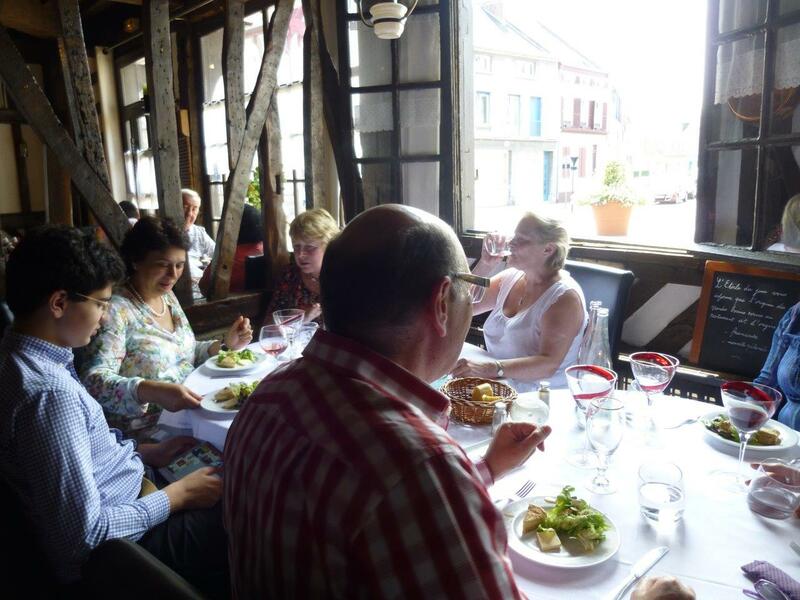 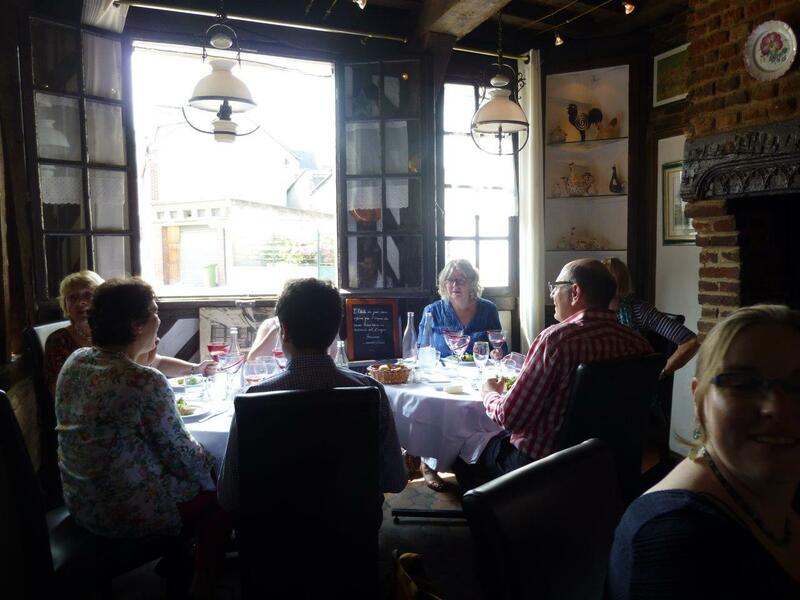 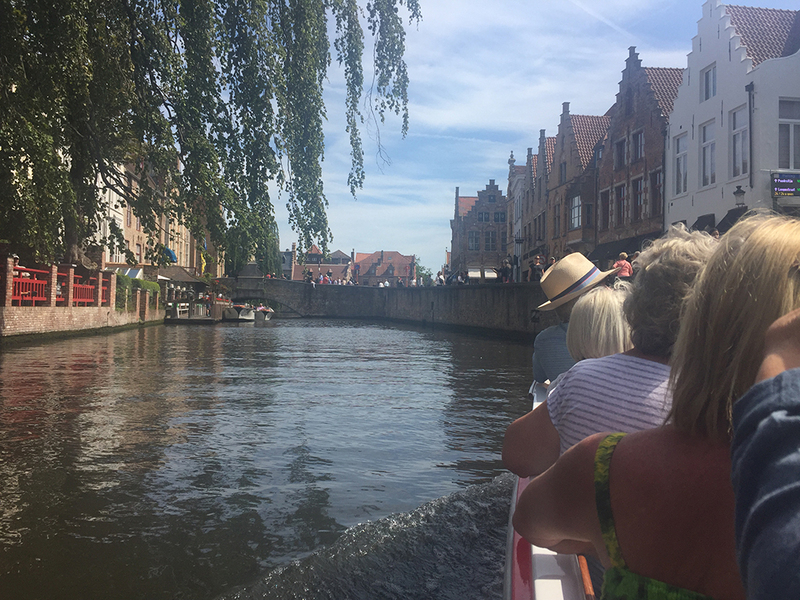 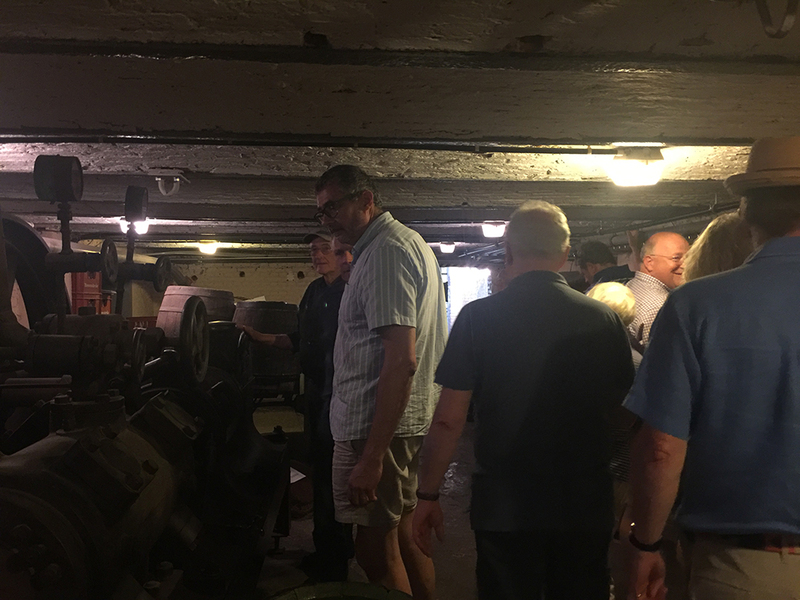 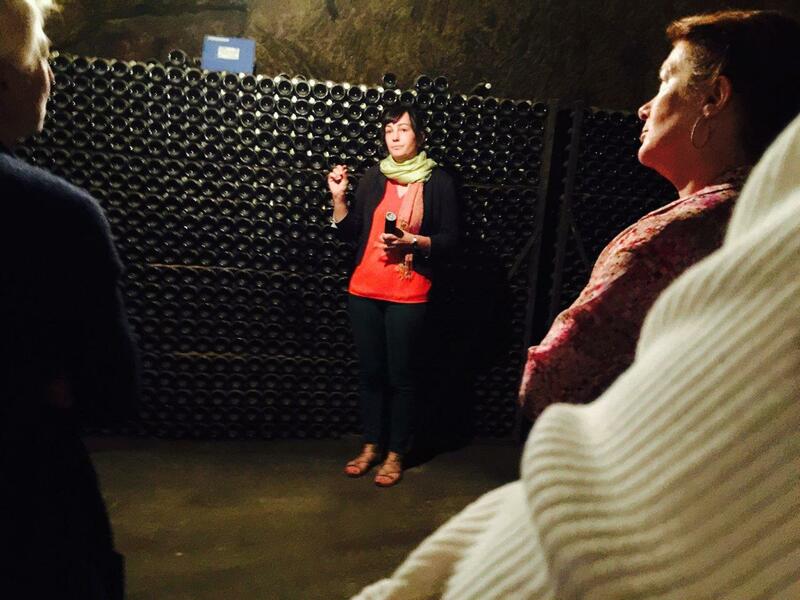 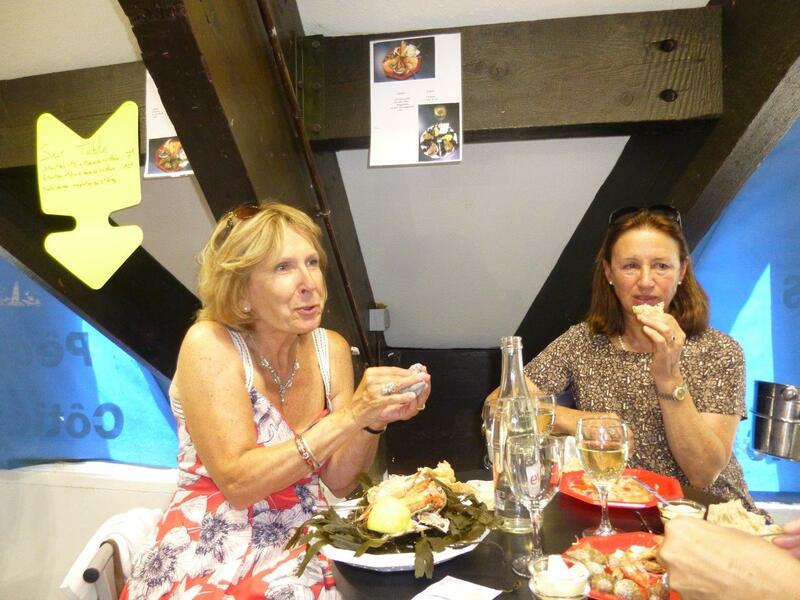 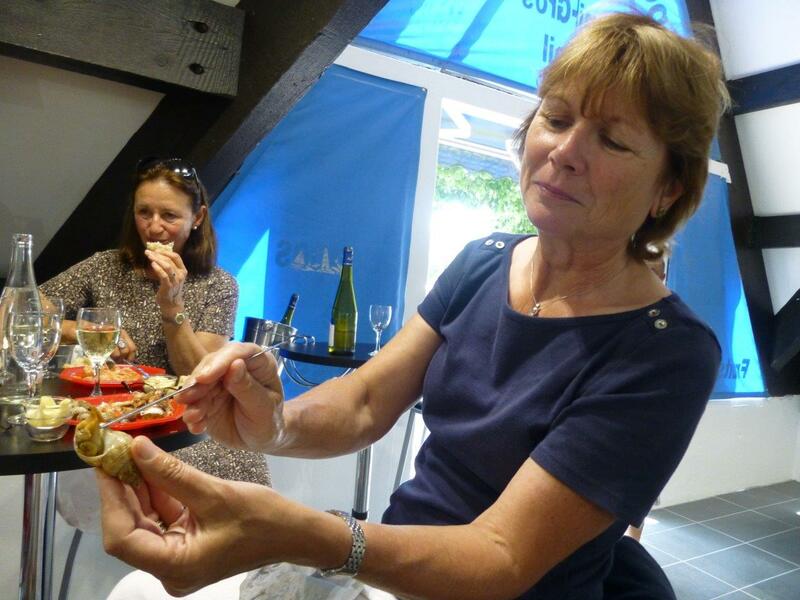 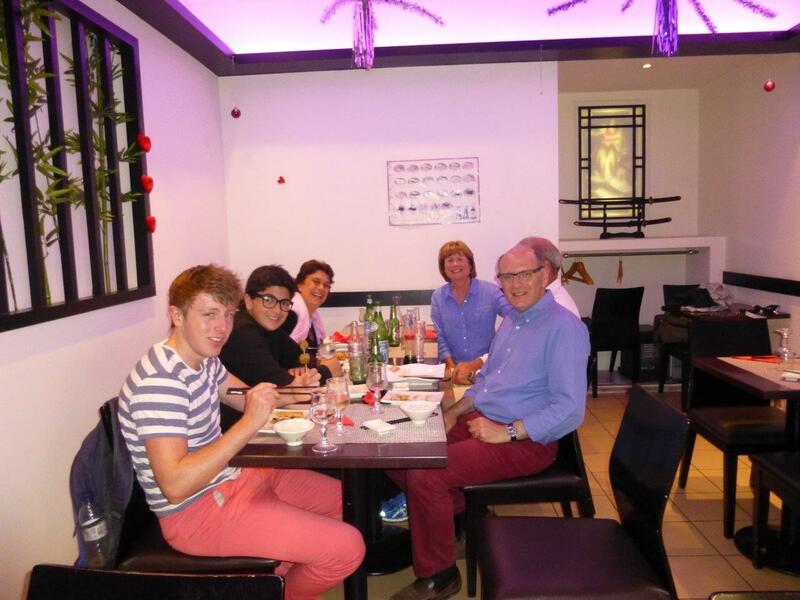 Along the way we managed to squeeze in some wonderful food, wine tasting and a visit to a Trogdolyte village…! 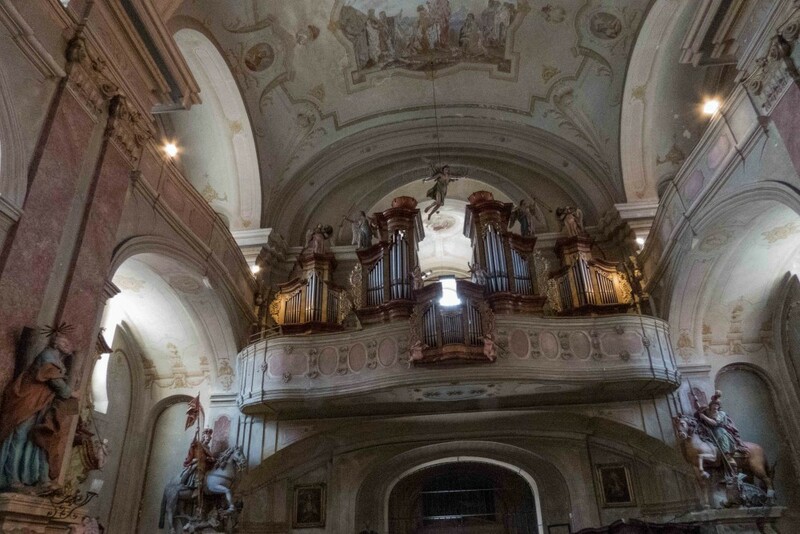 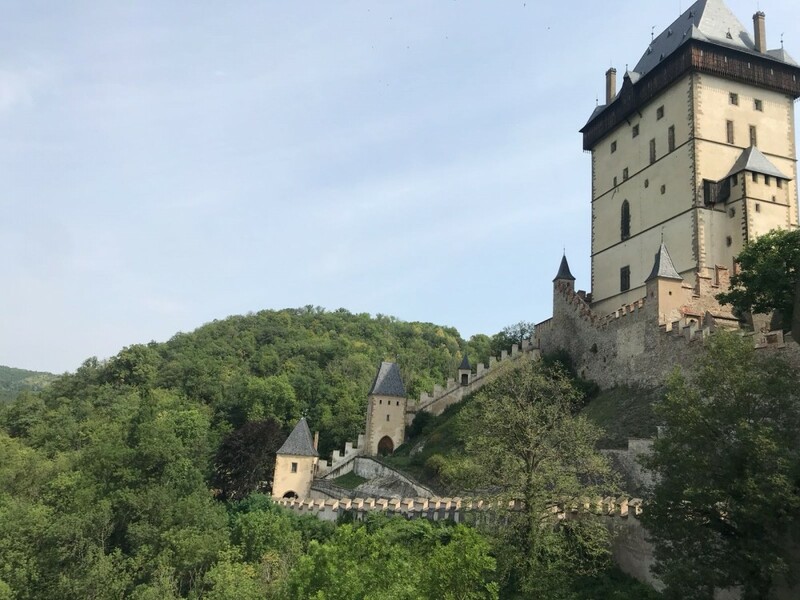 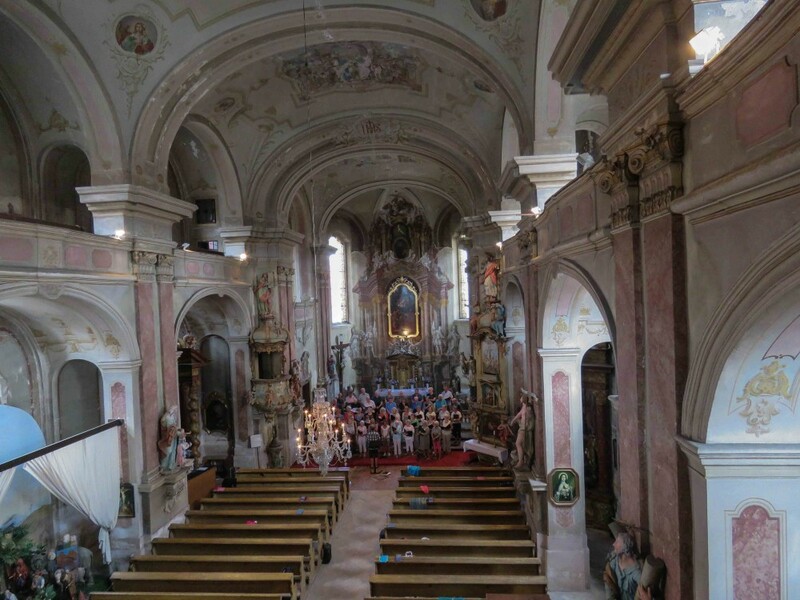 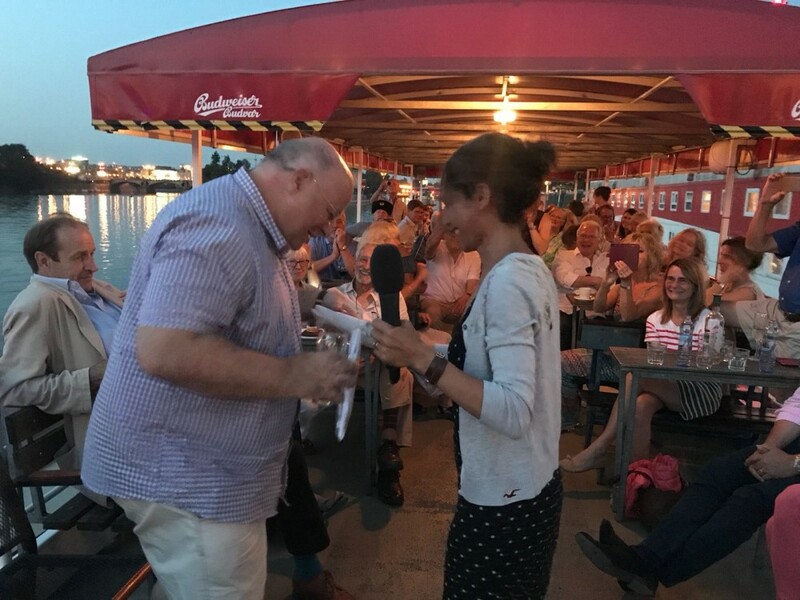 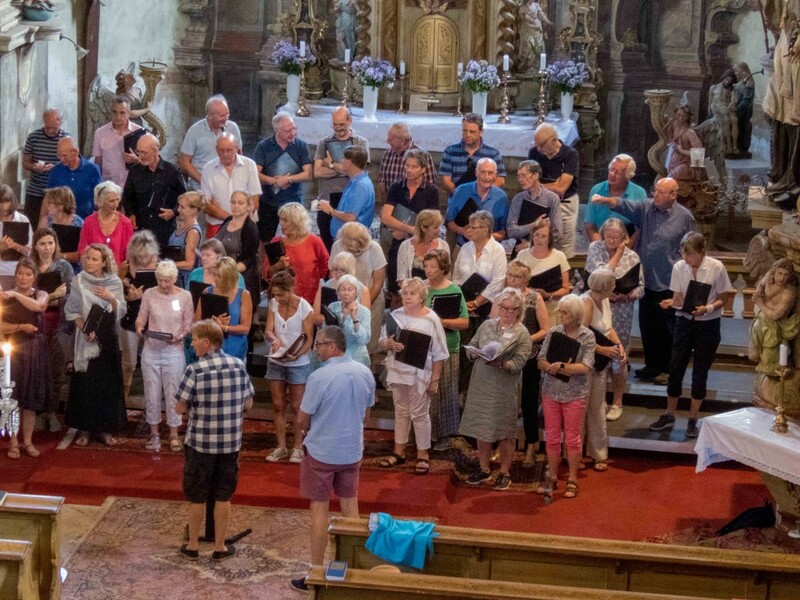 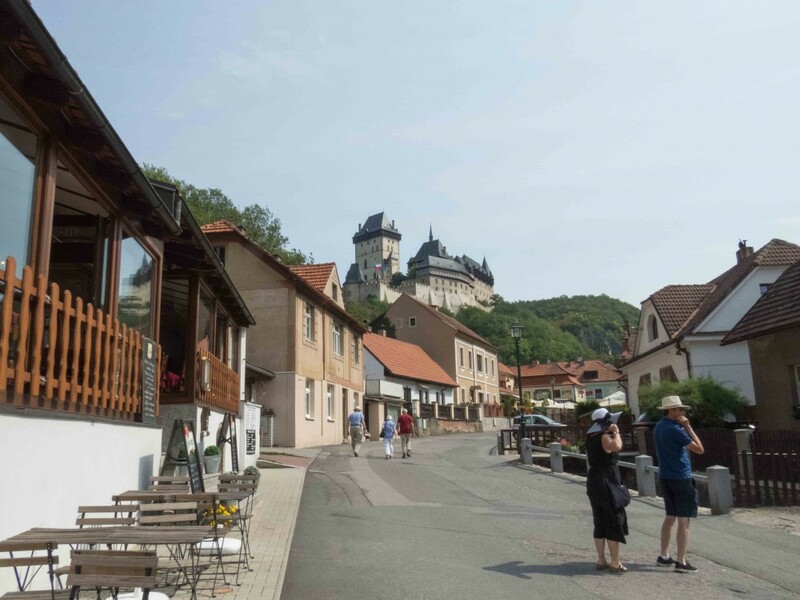 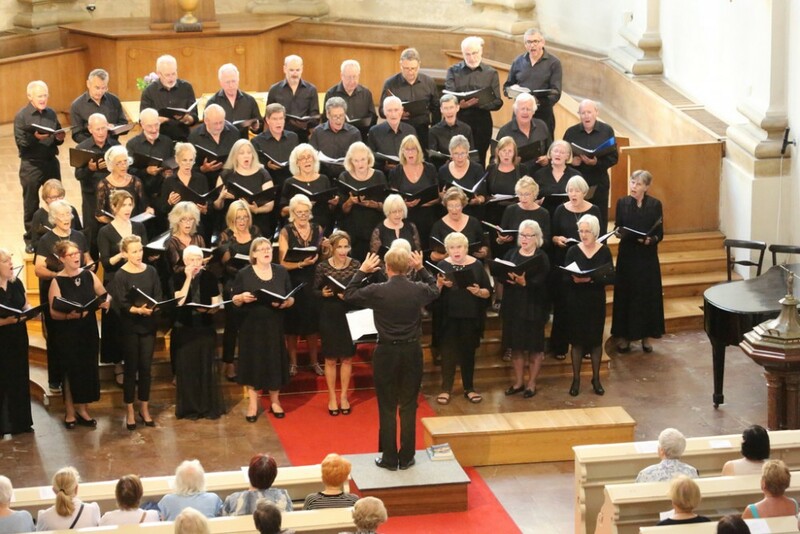 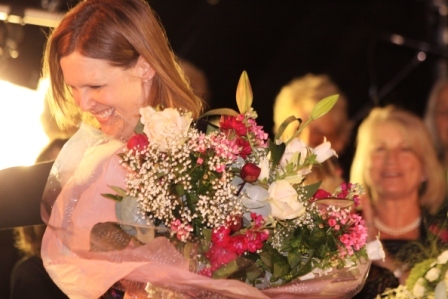 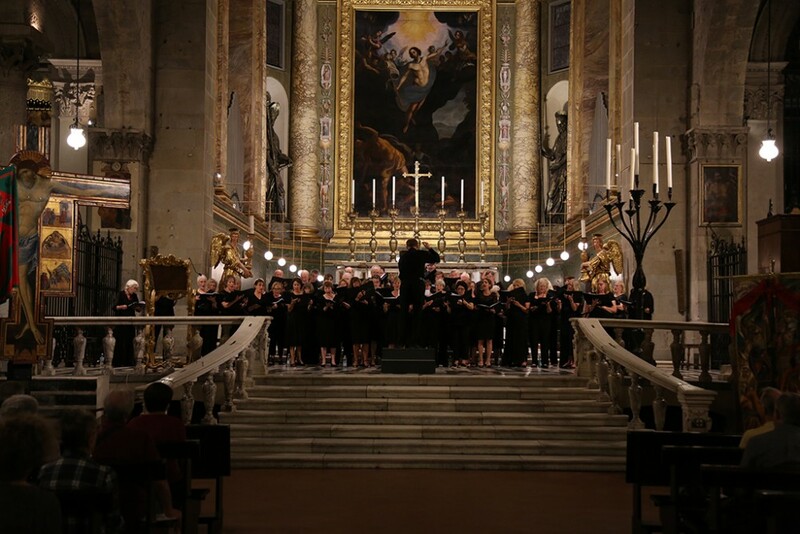 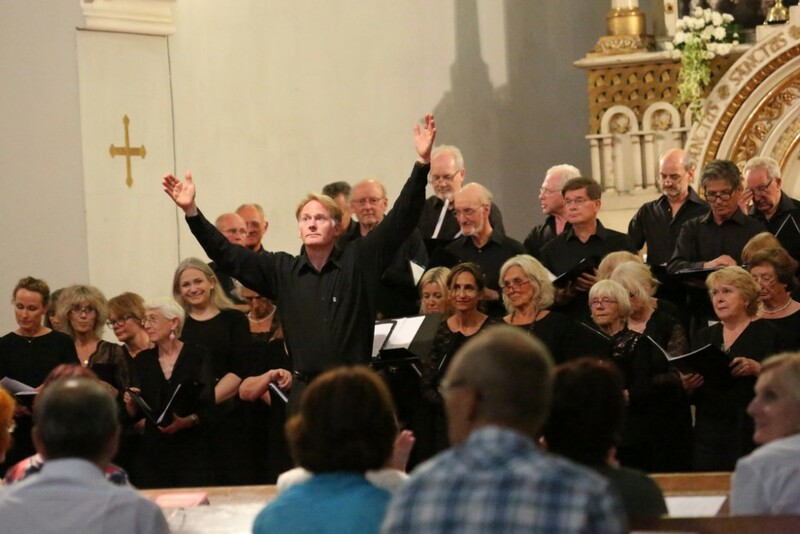 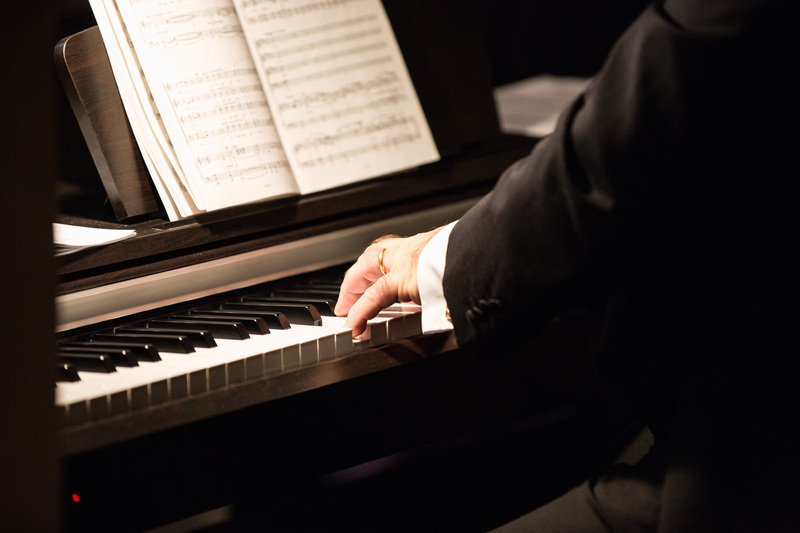 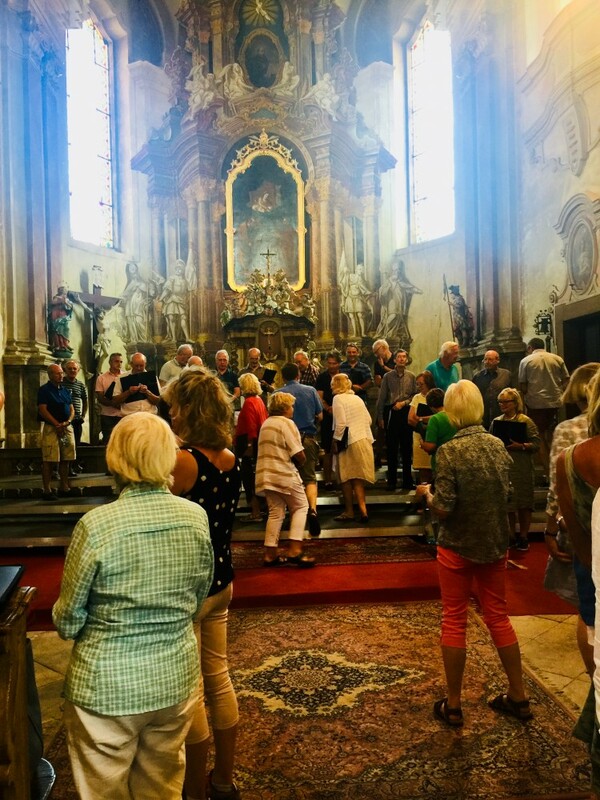 The best selection of photos, and even a video of one of our concerts from the Trélazé festival organisers, can be viewed on our Facebook page (you don’t have to be a registered Facebook user to view it). 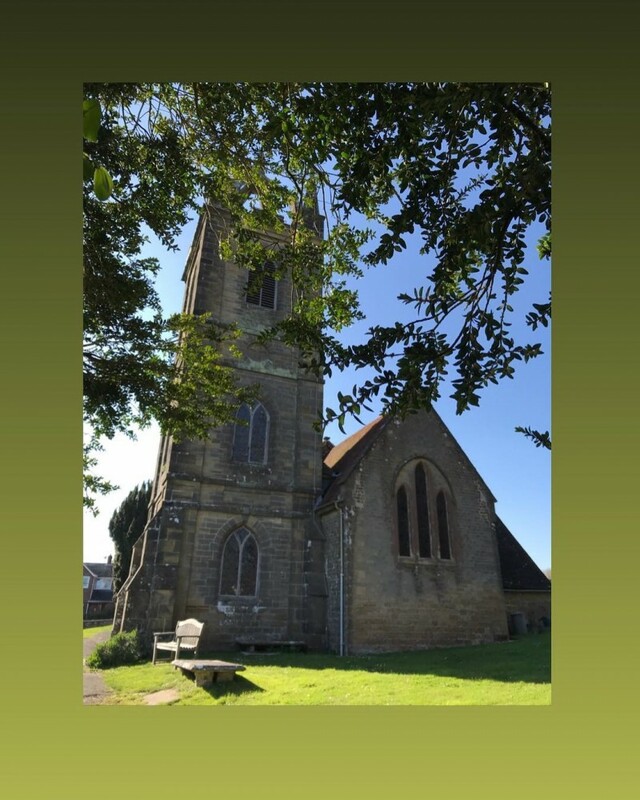 Just click on the link at the bottom right to go and visit it. 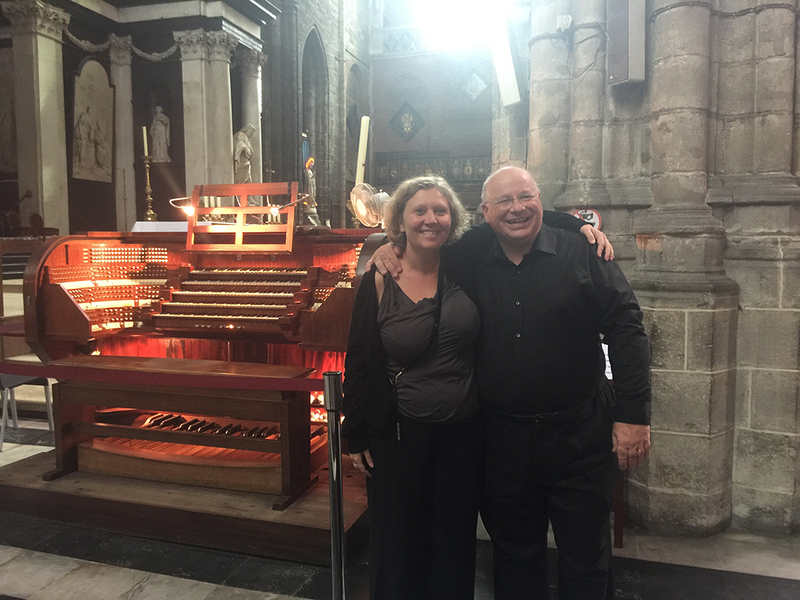 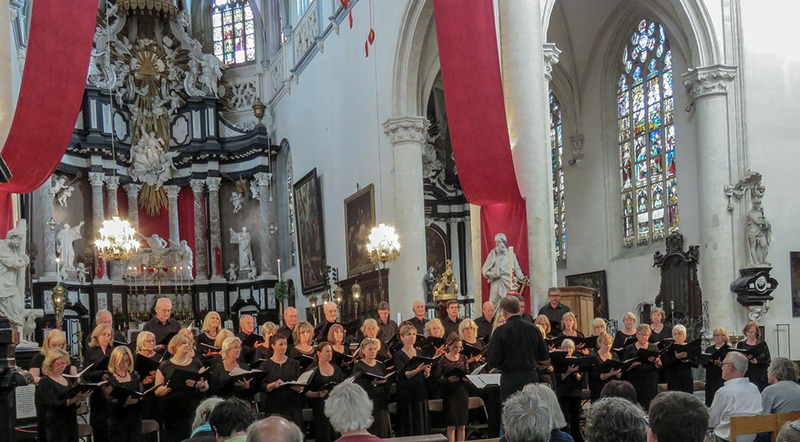 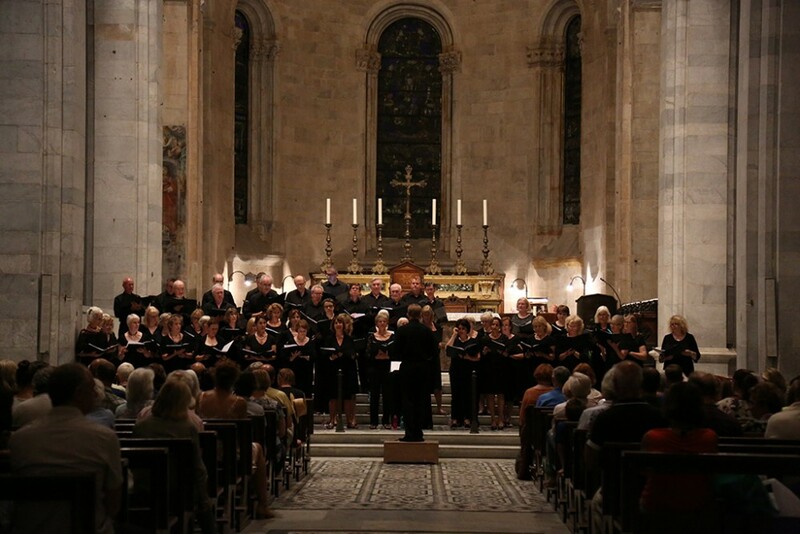 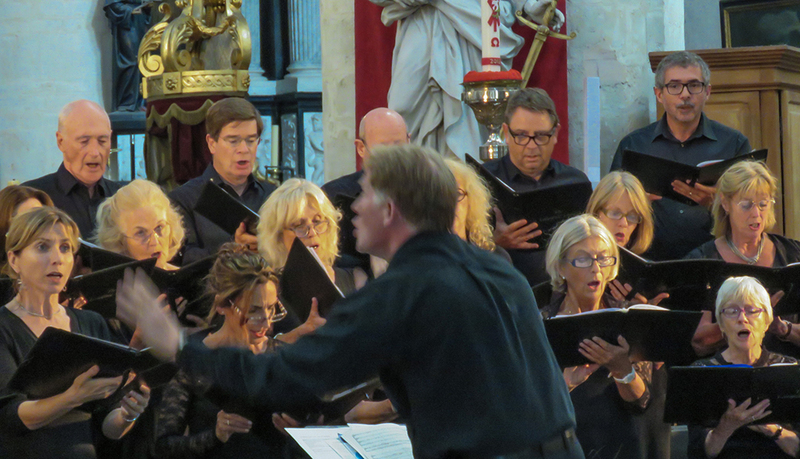 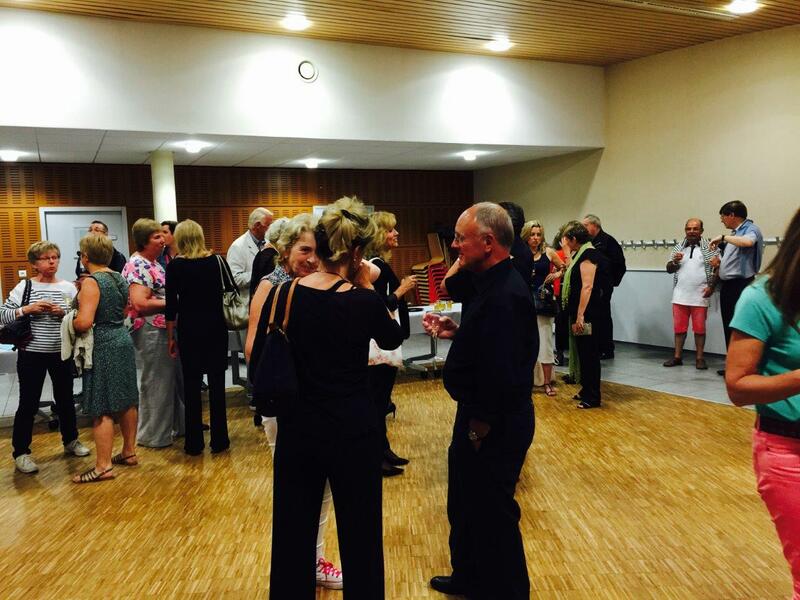 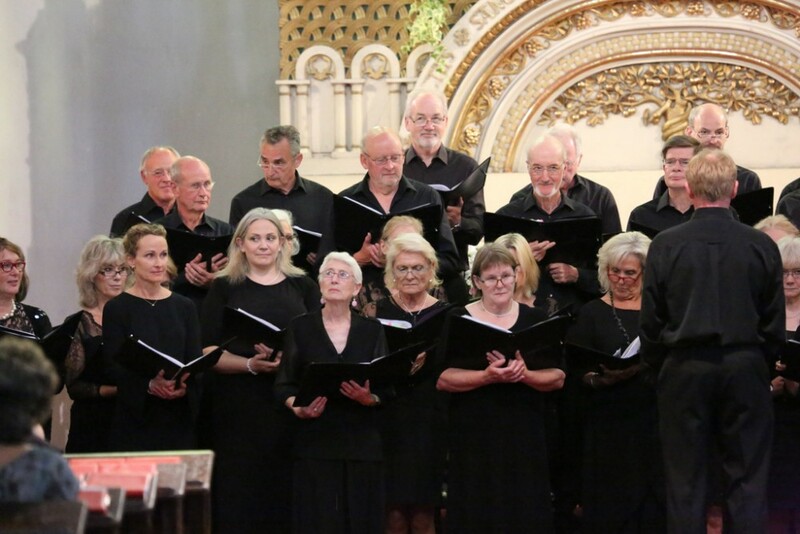 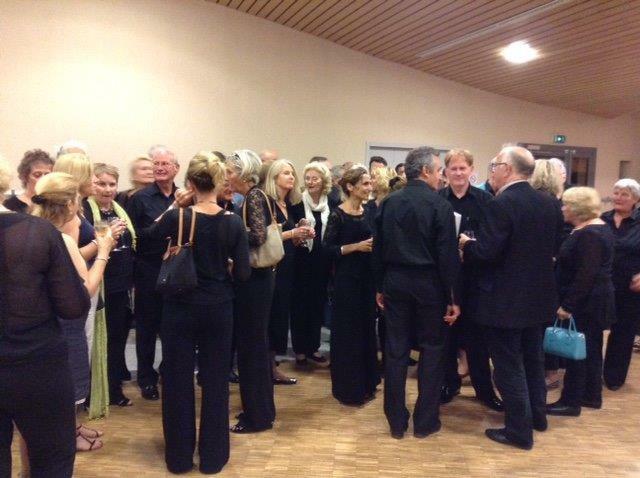 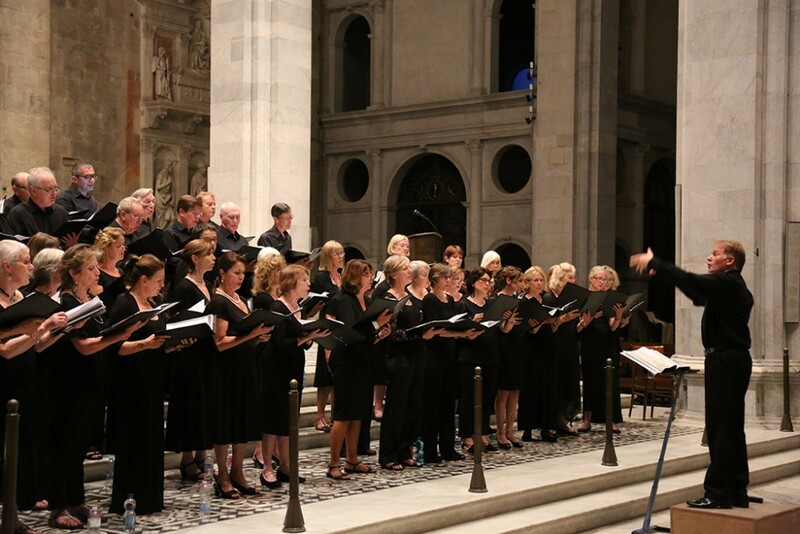 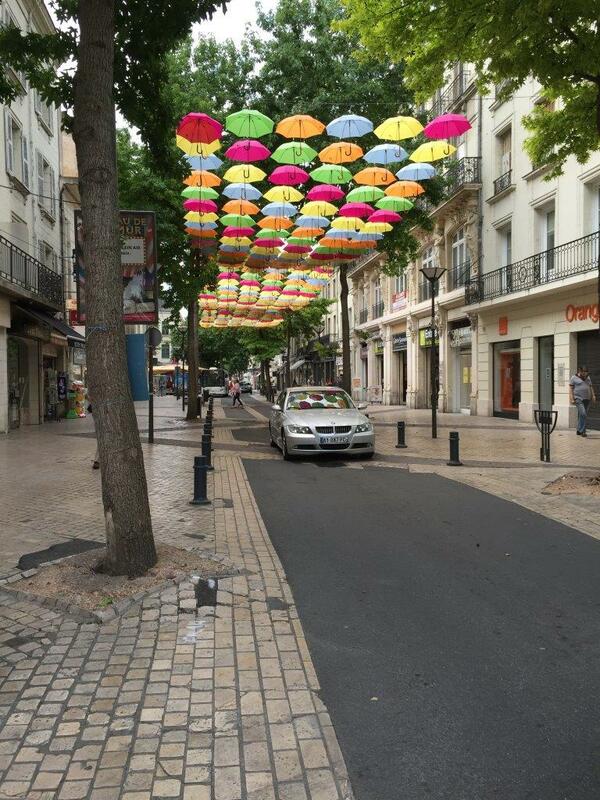 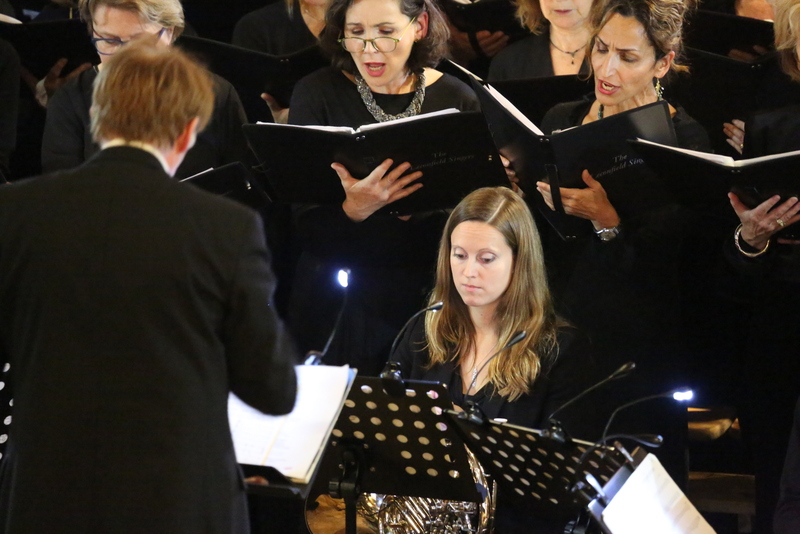 CLICK HERE for some videos of our concert in Nantes, kindly taken by Richard Saker. 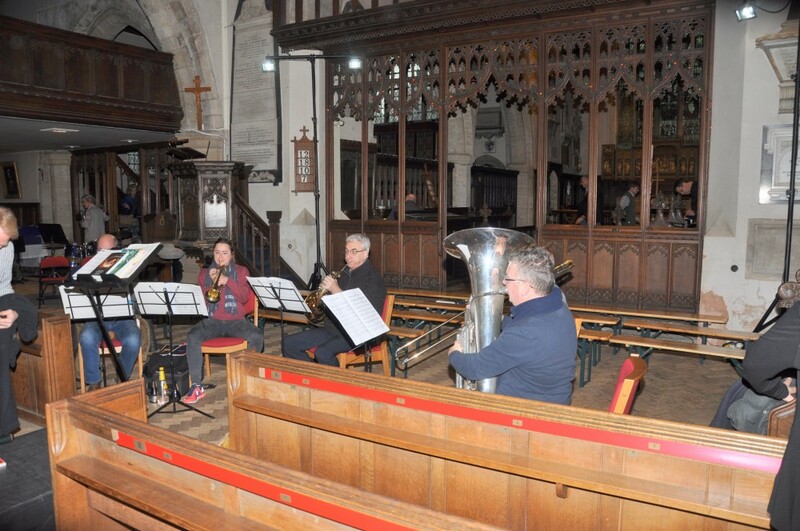 We recommend that you download these as they will be here for a temporary period only, they will also play better! 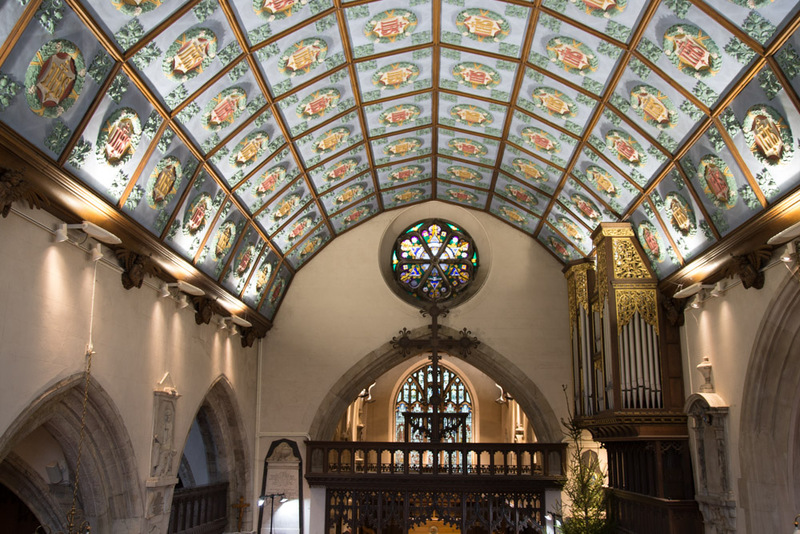 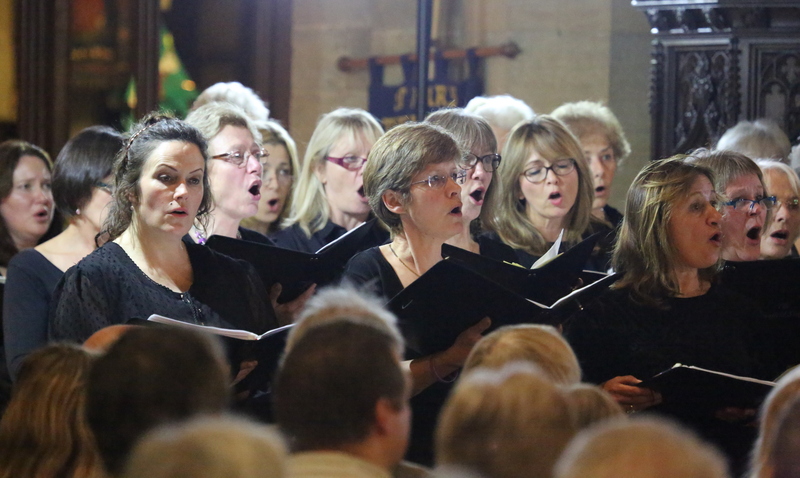 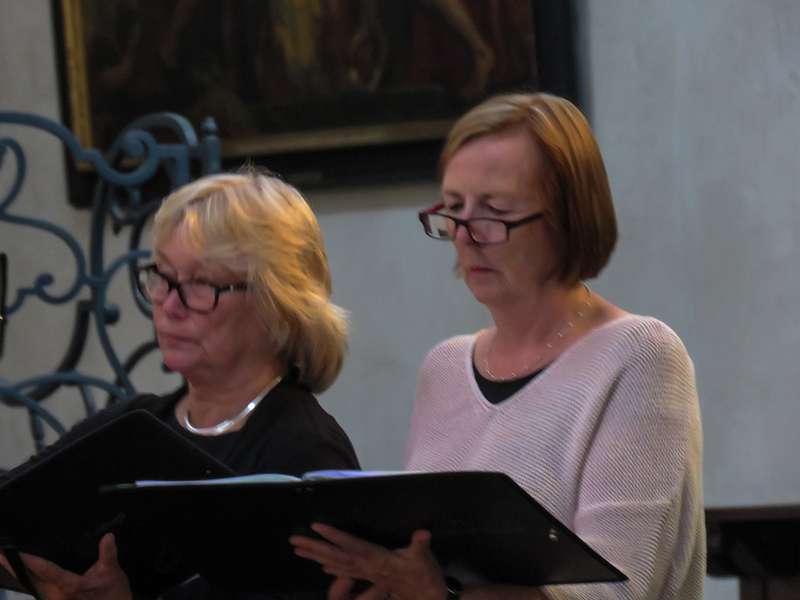 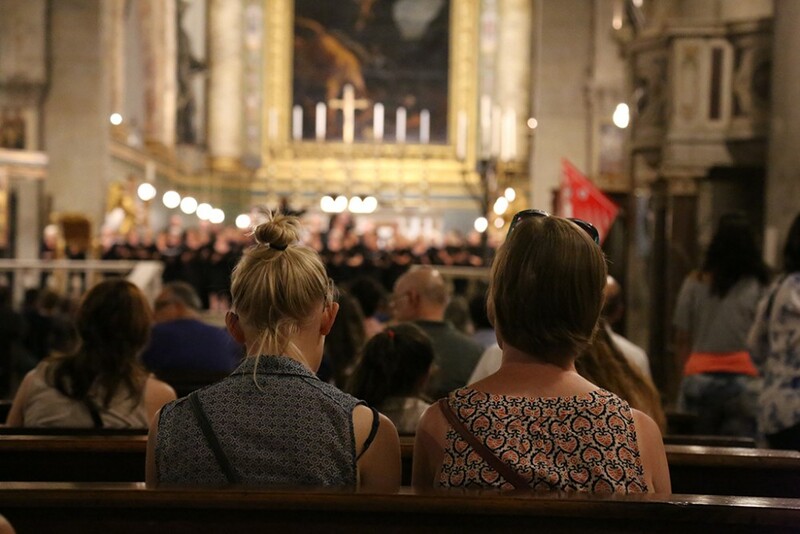 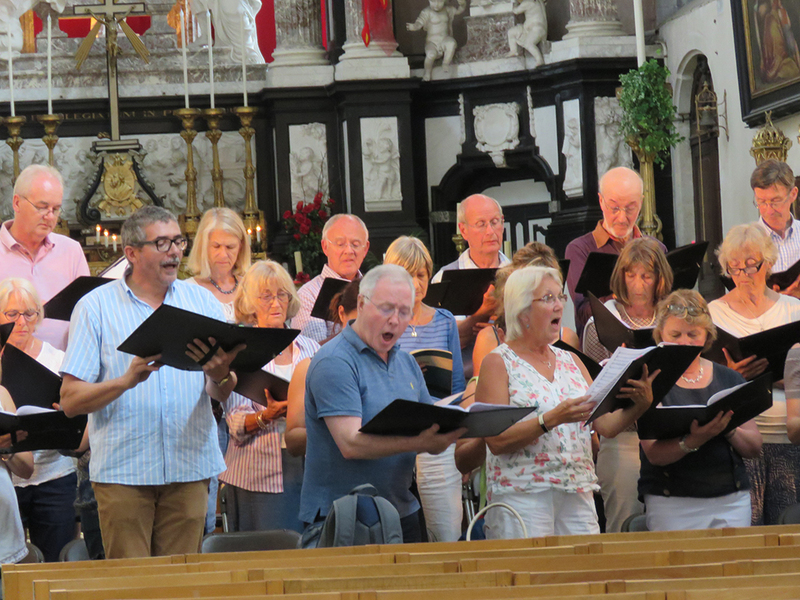 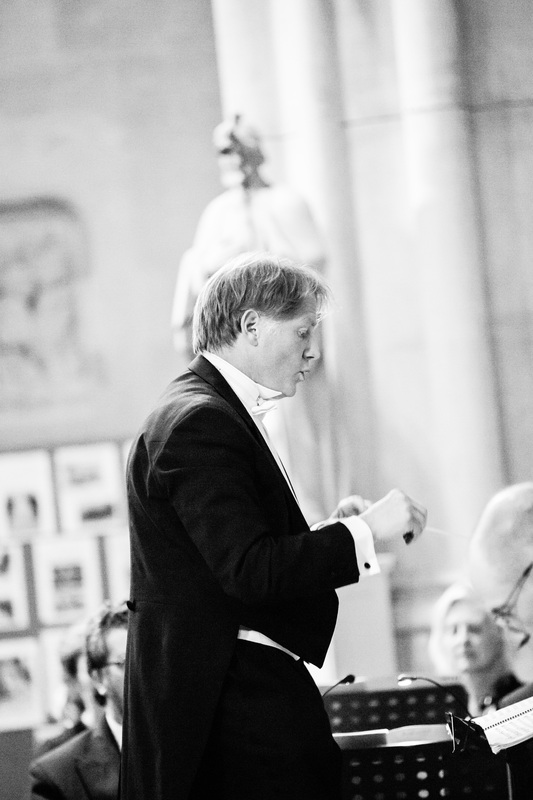 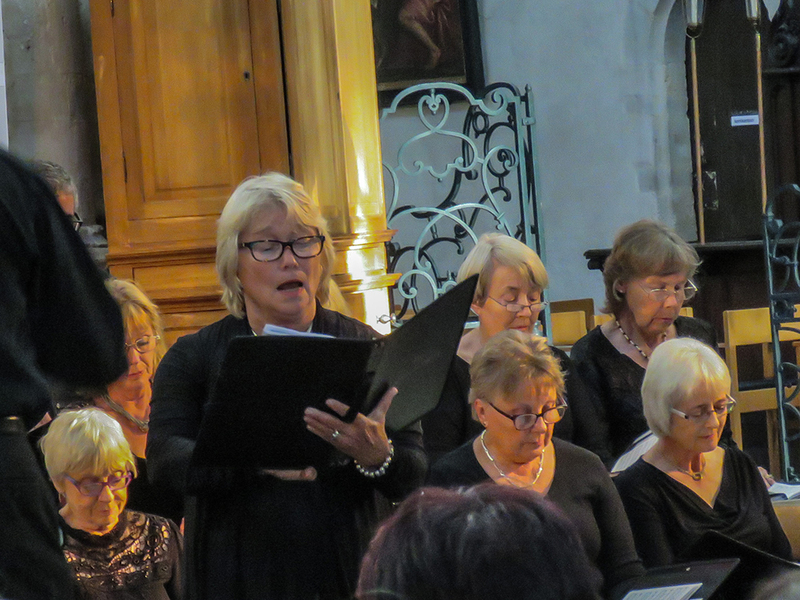 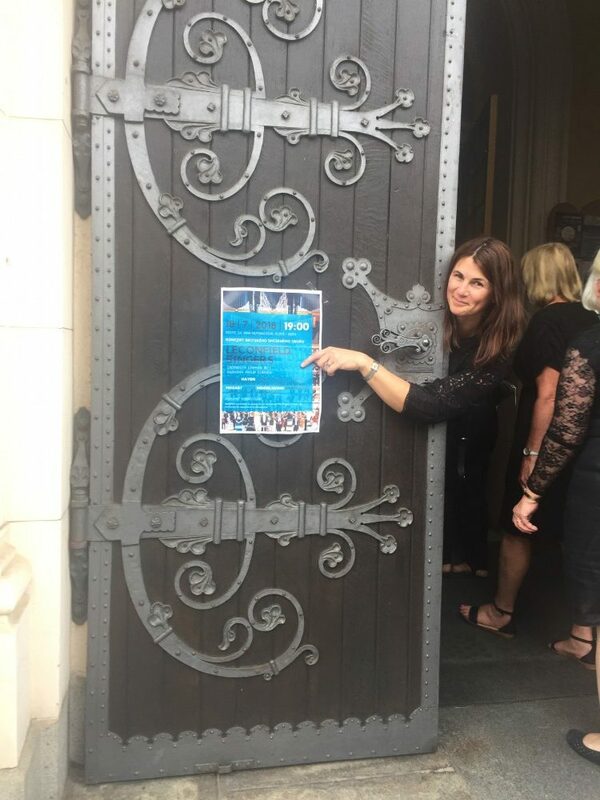 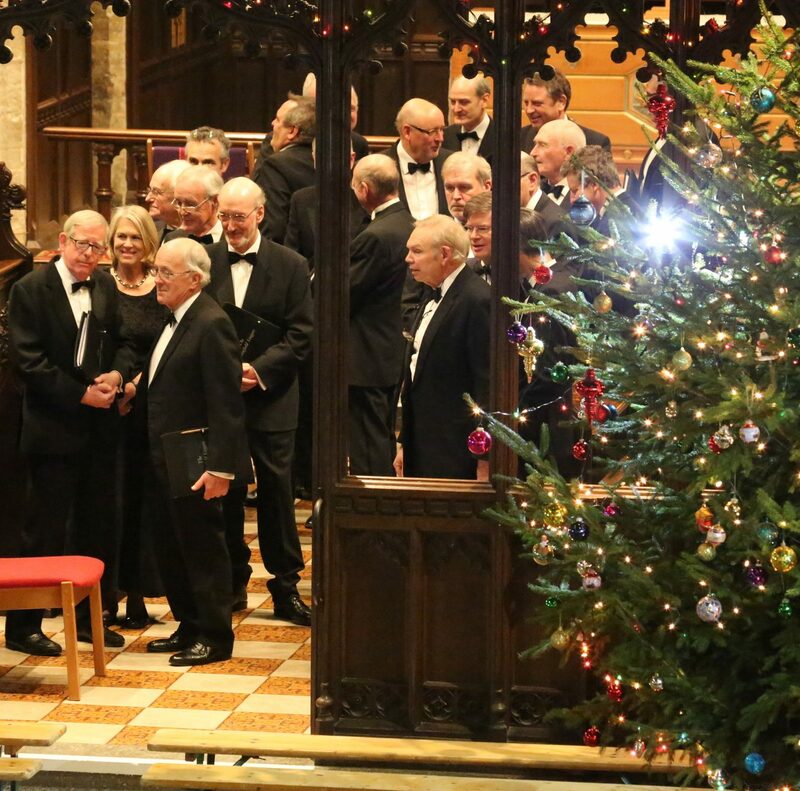 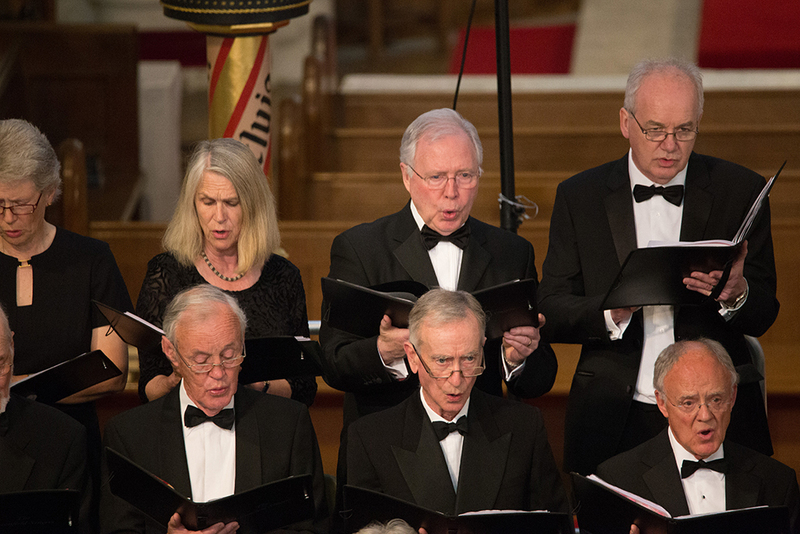 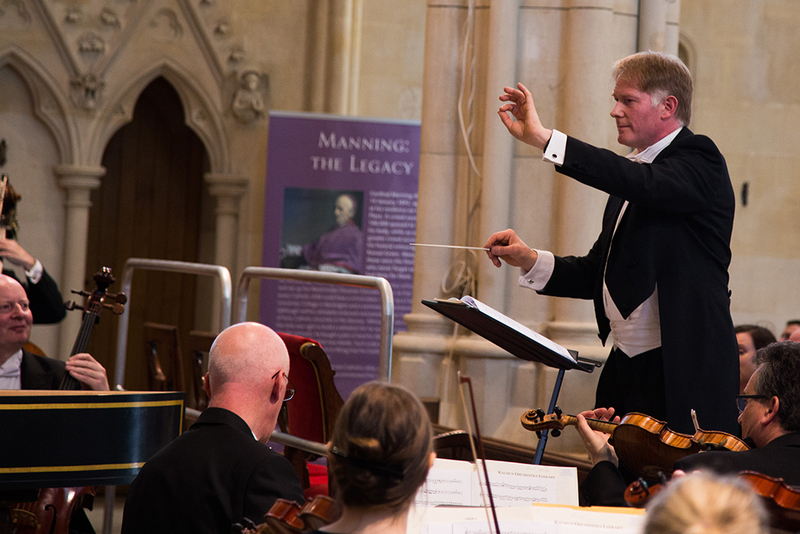 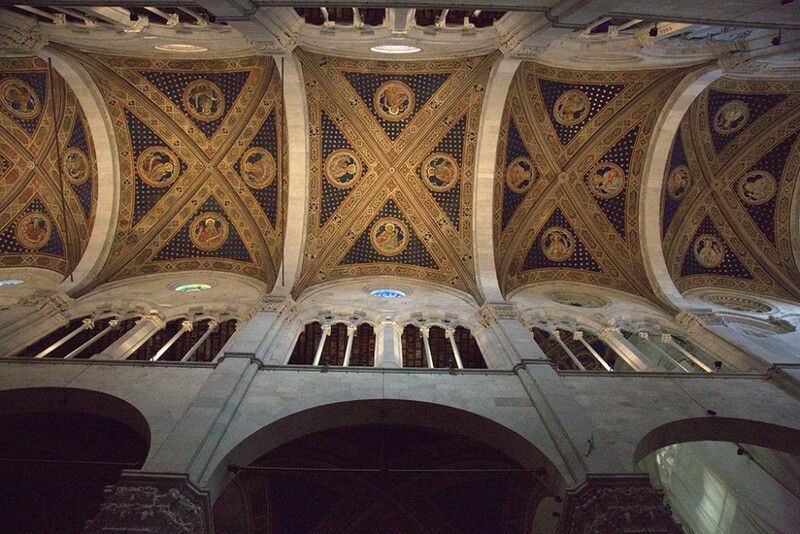 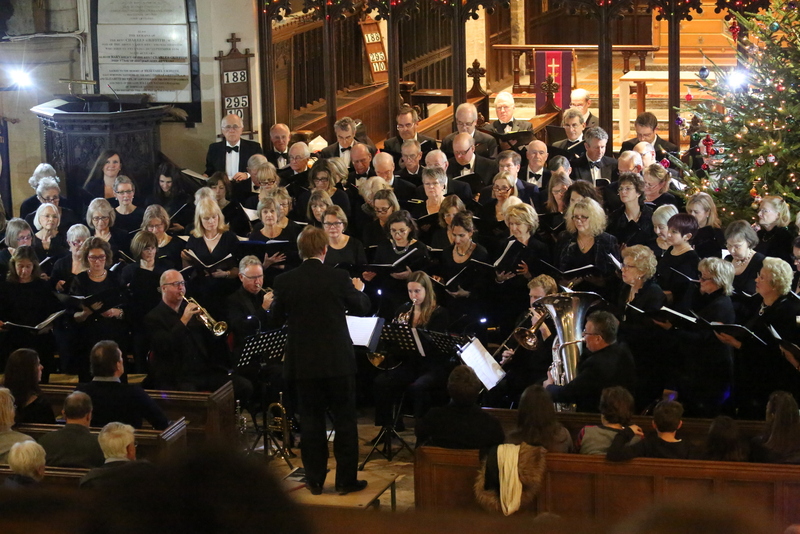 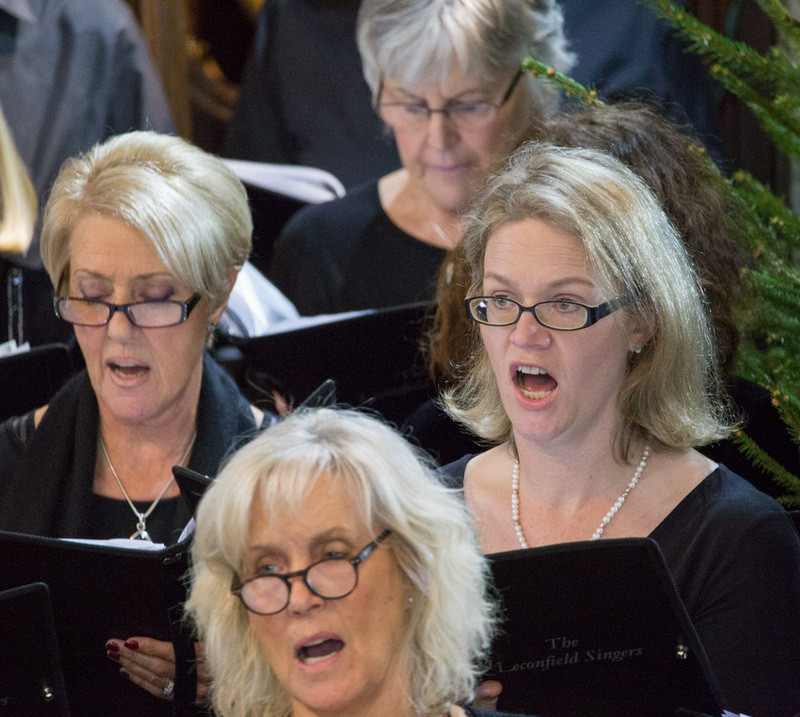 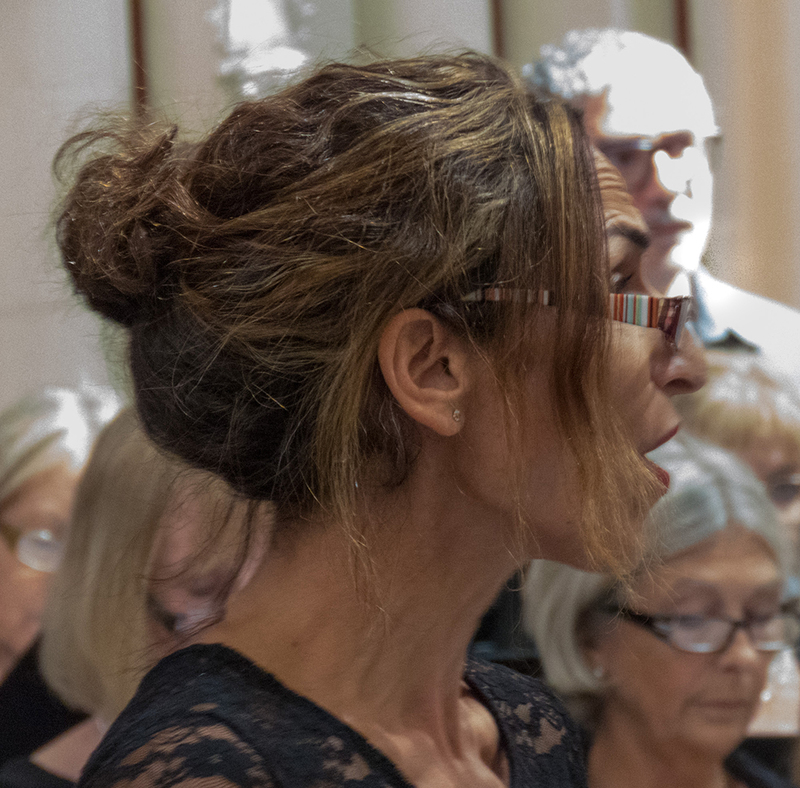 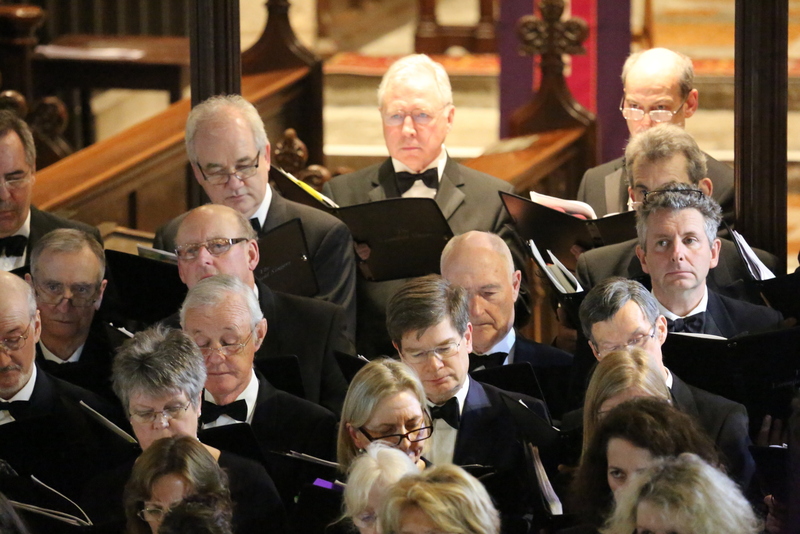 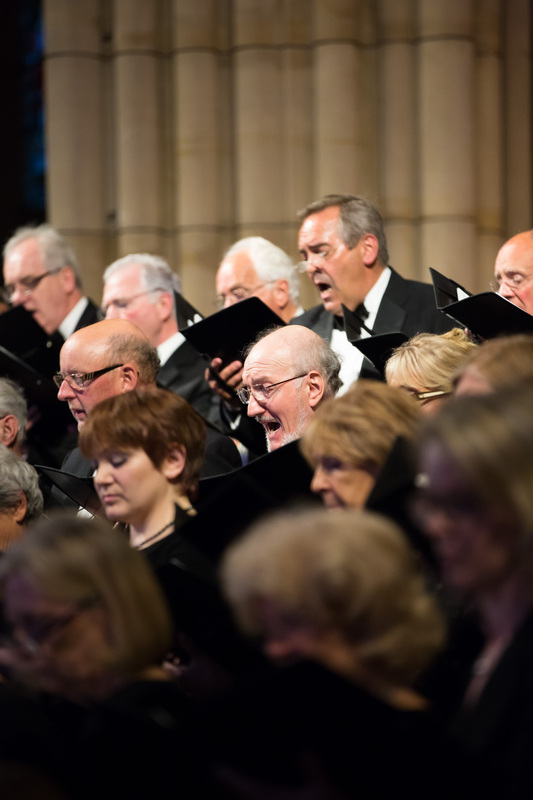 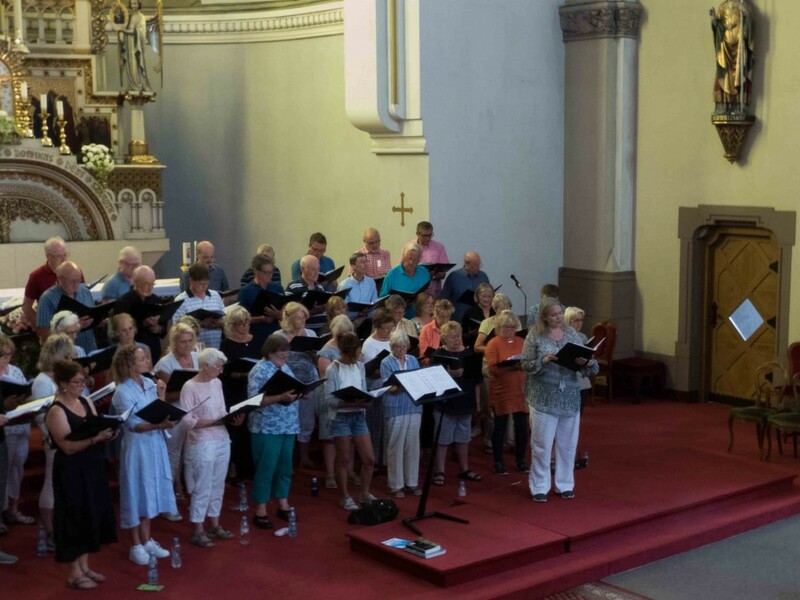 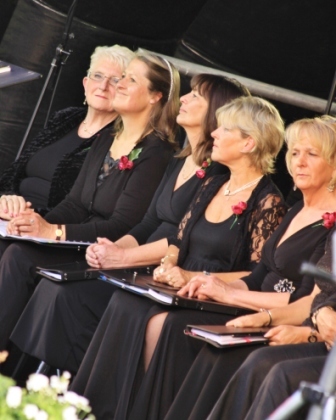 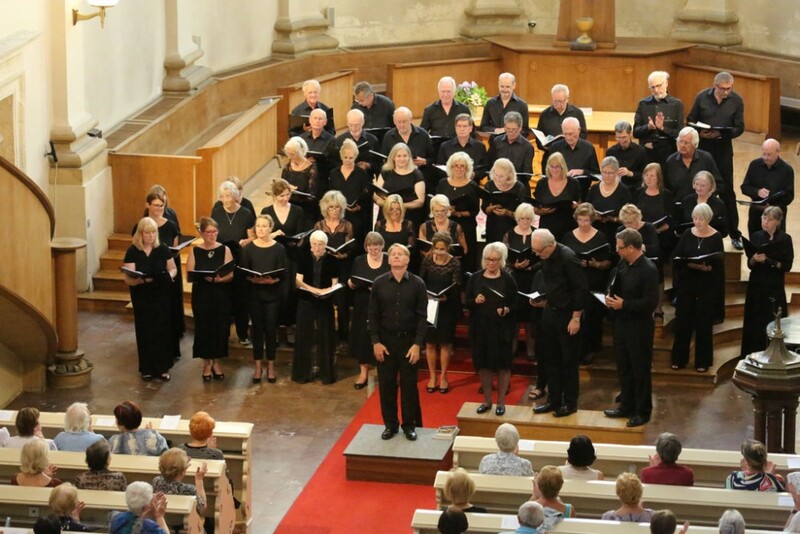 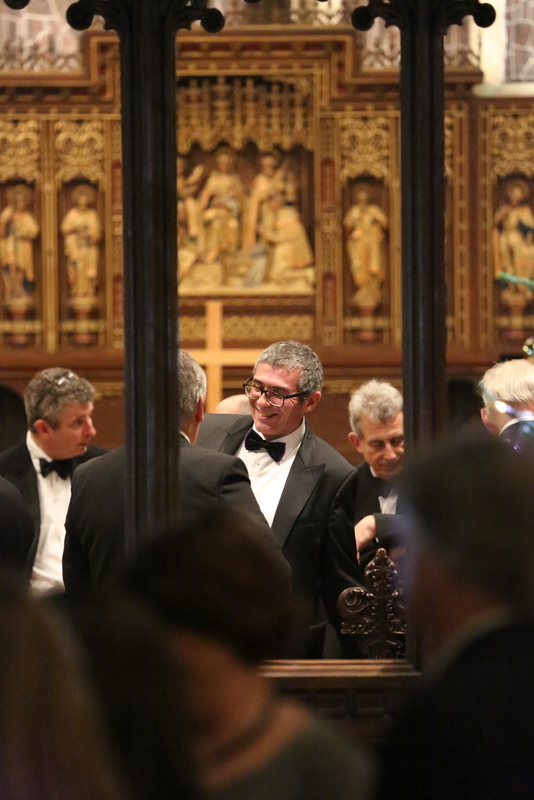 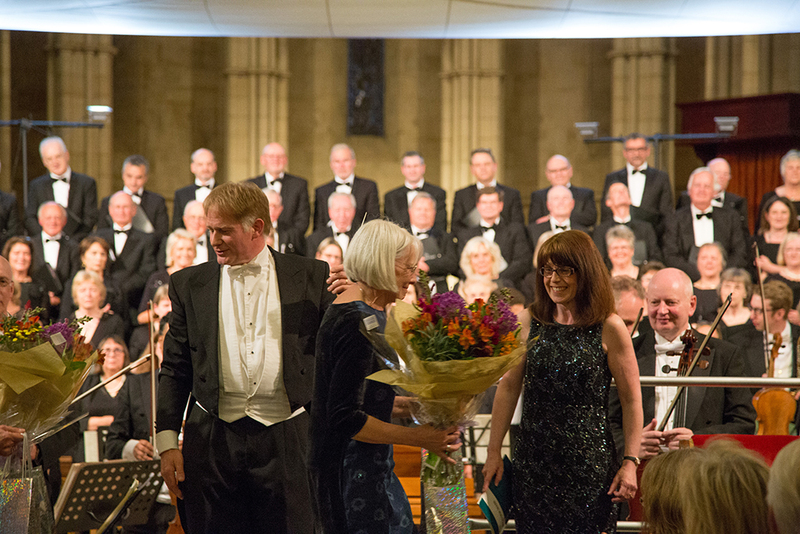 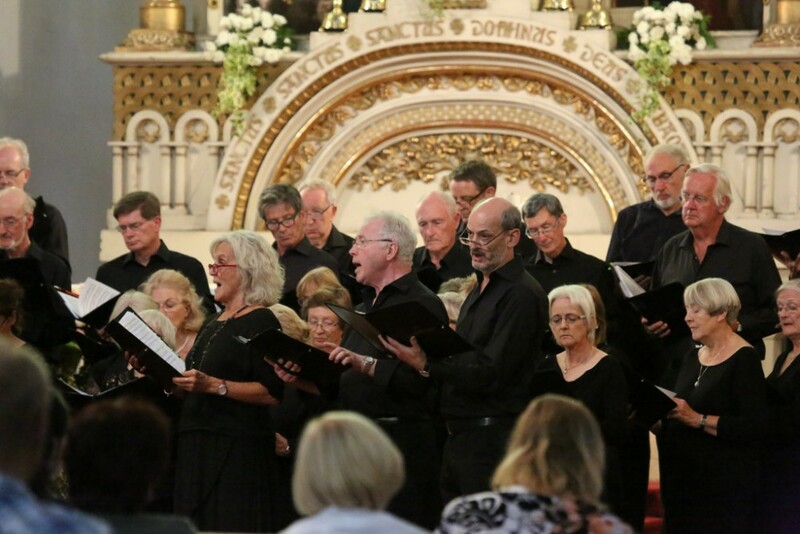 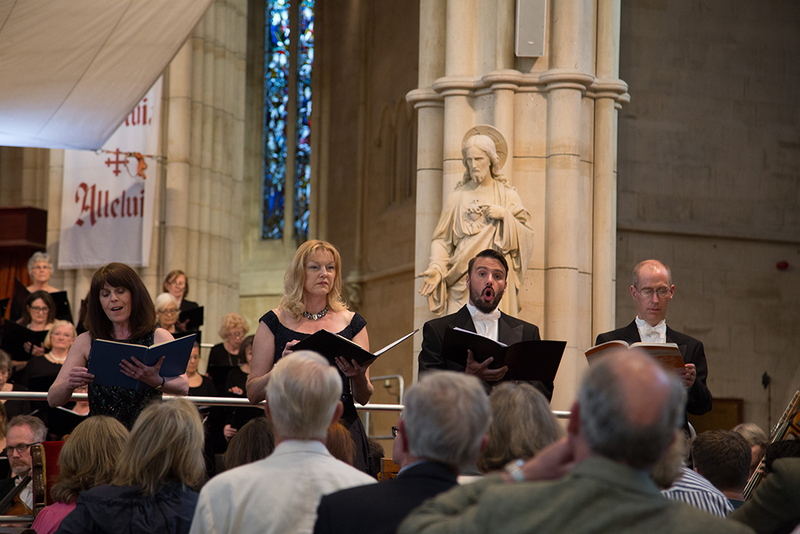 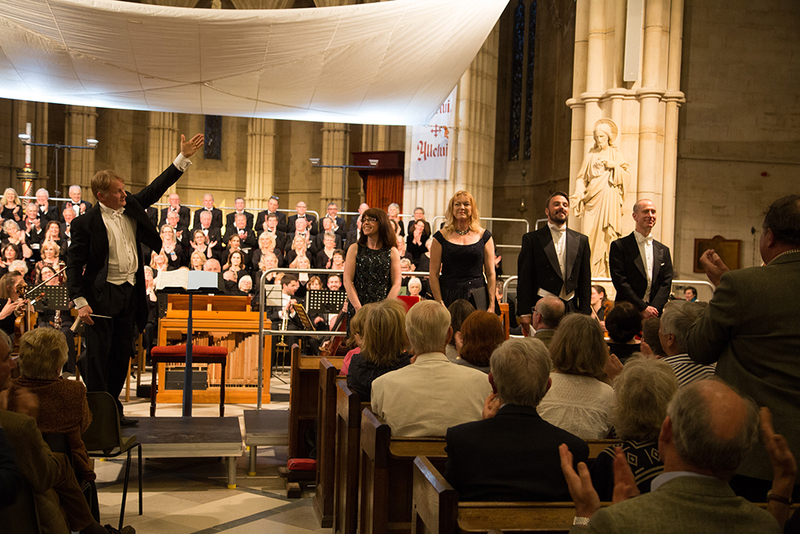 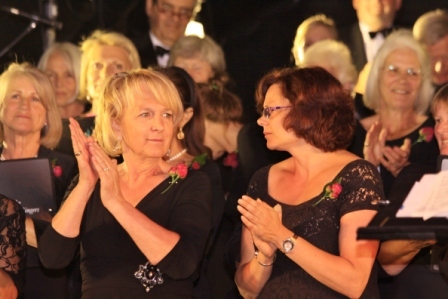 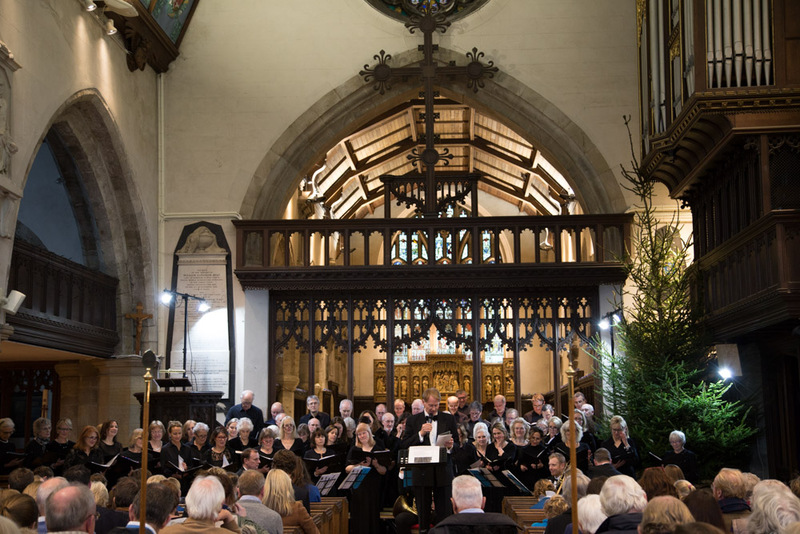 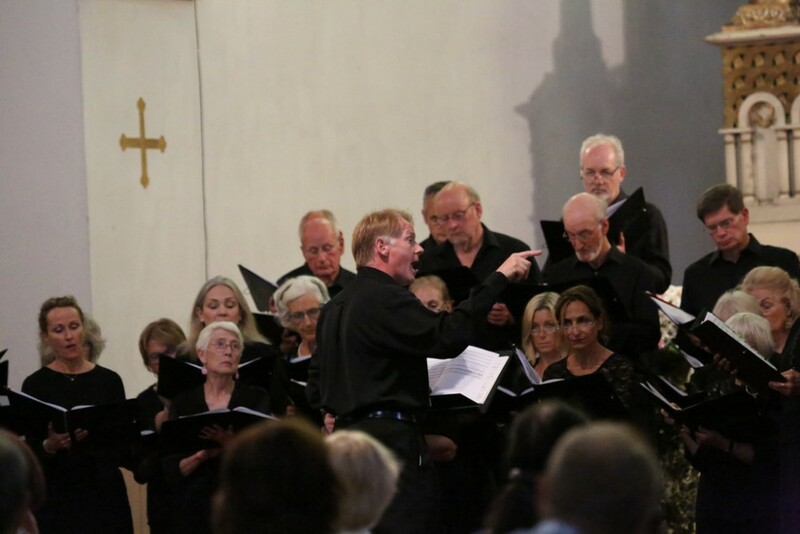 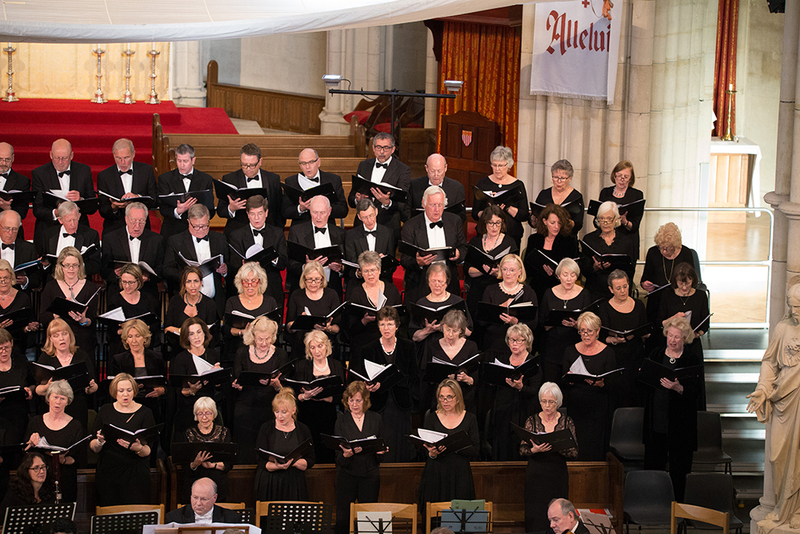 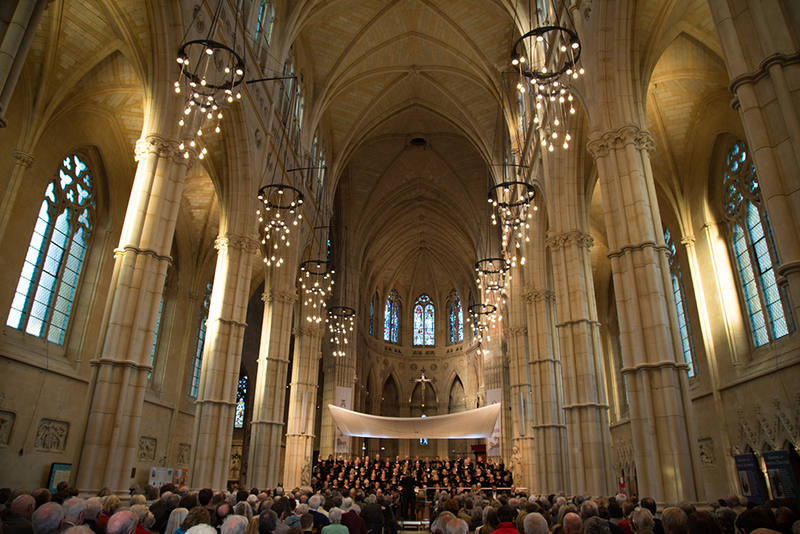 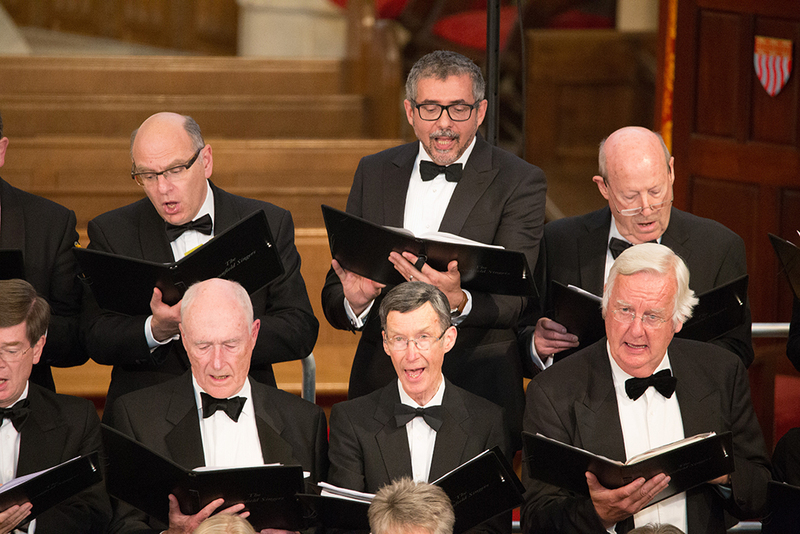 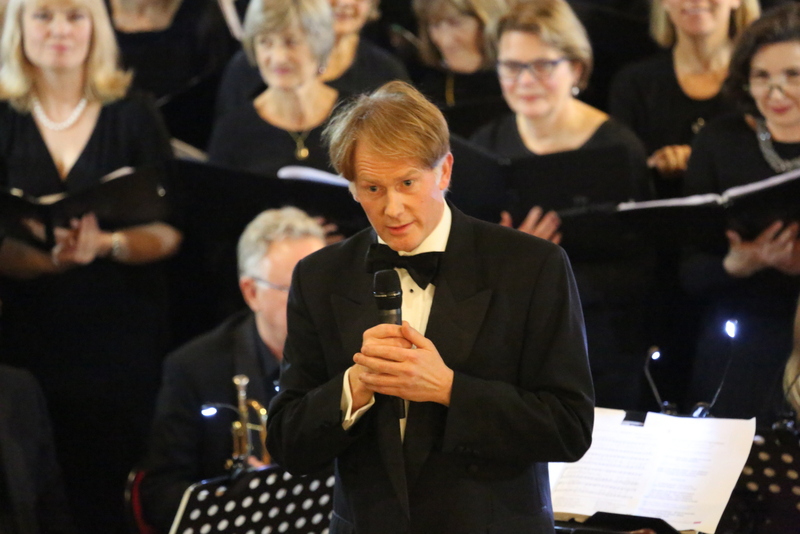 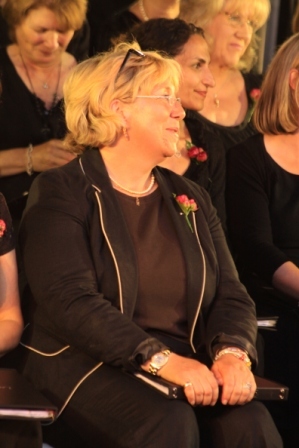 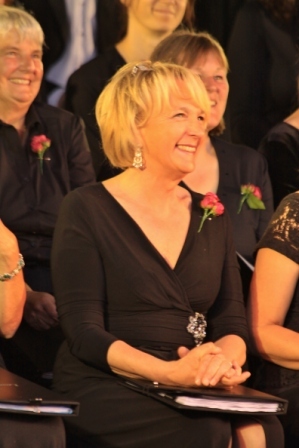 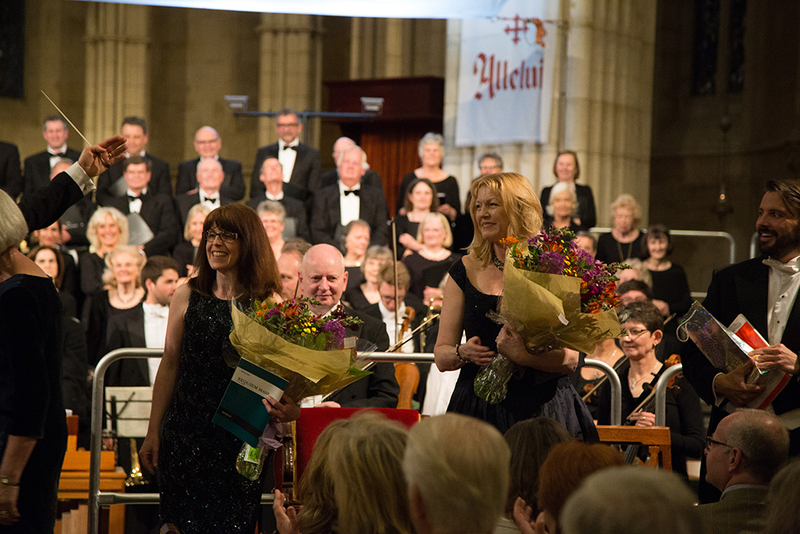 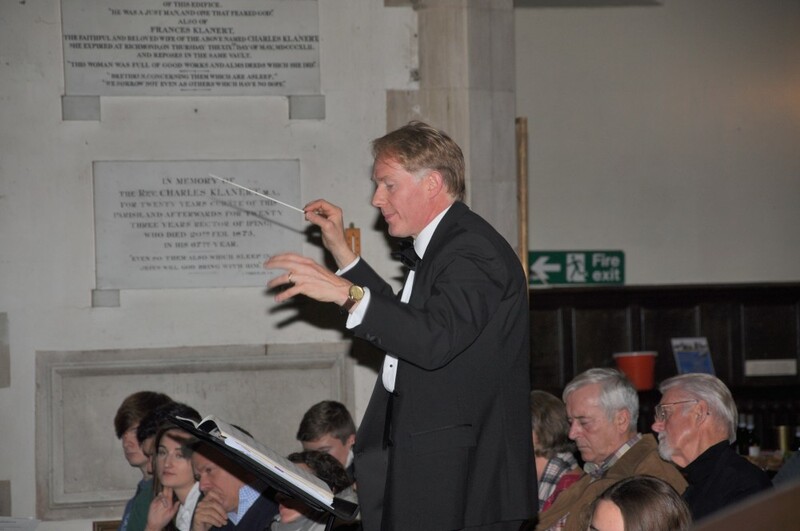 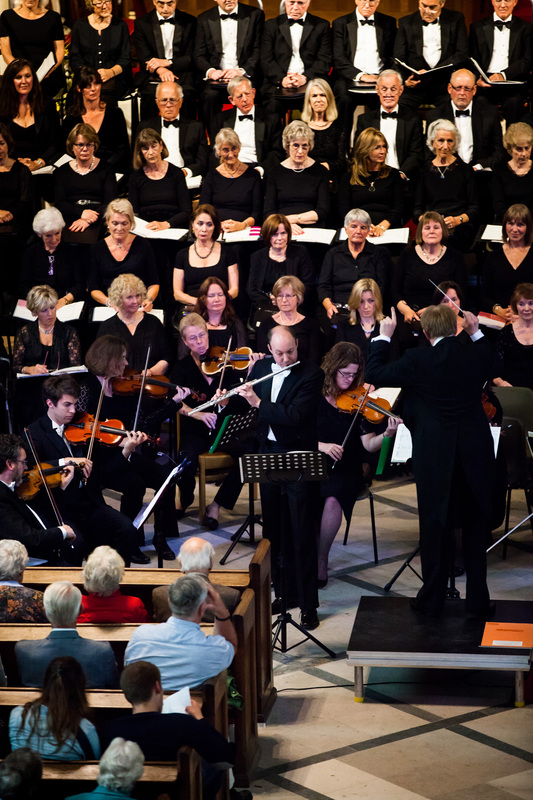 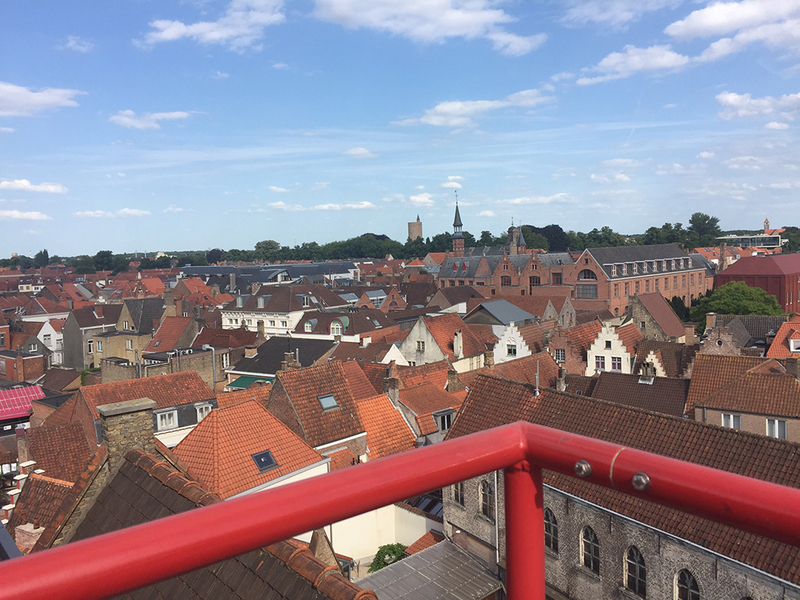 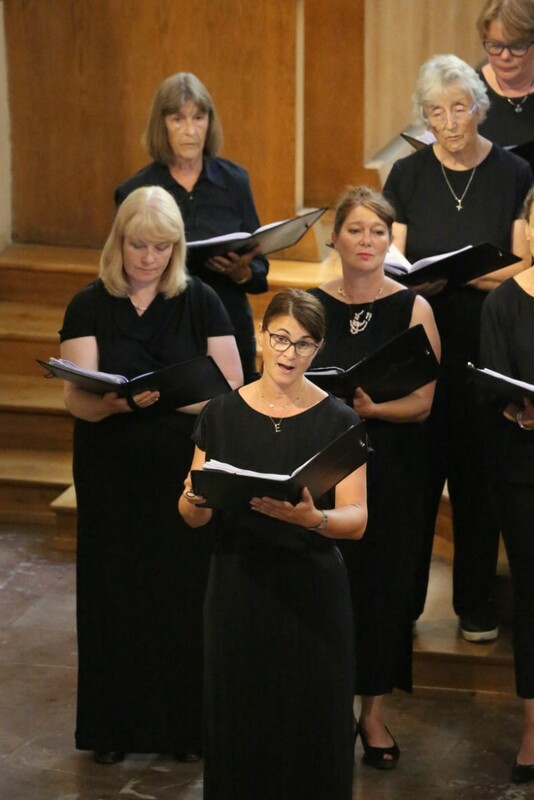 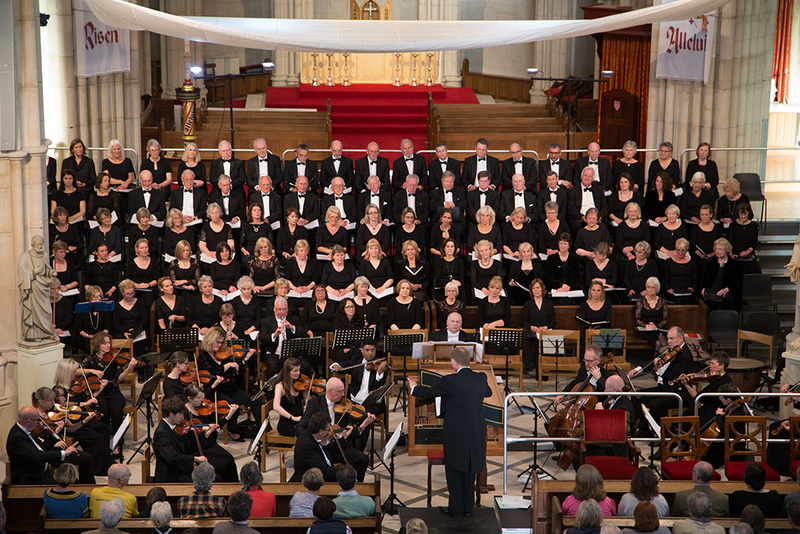 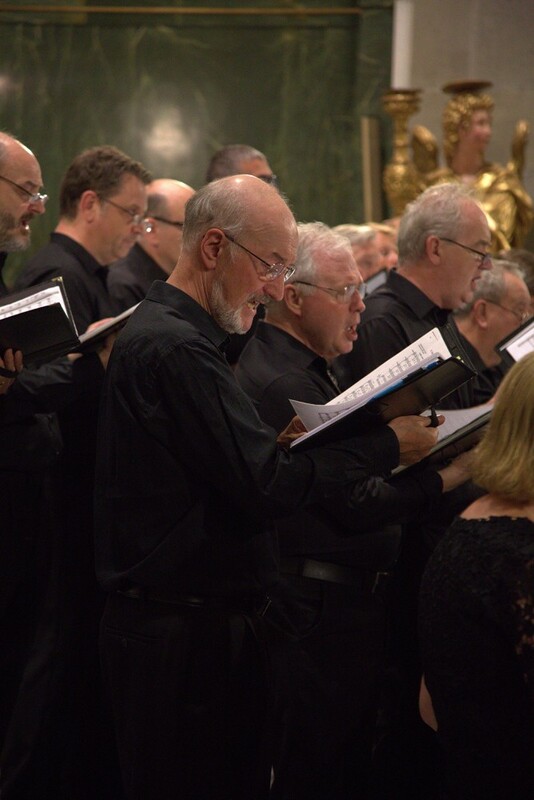 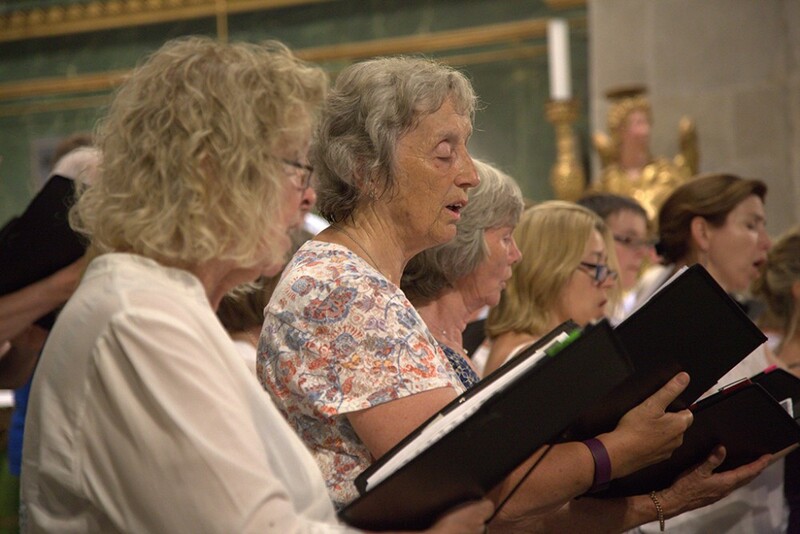 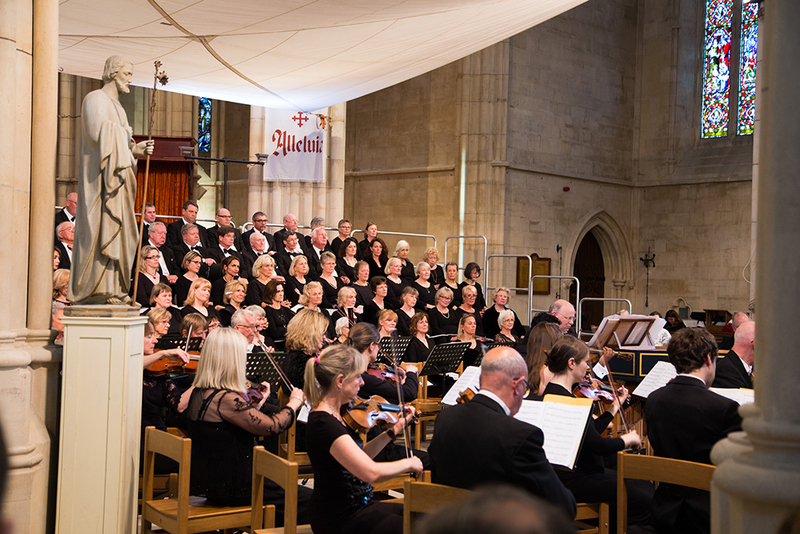 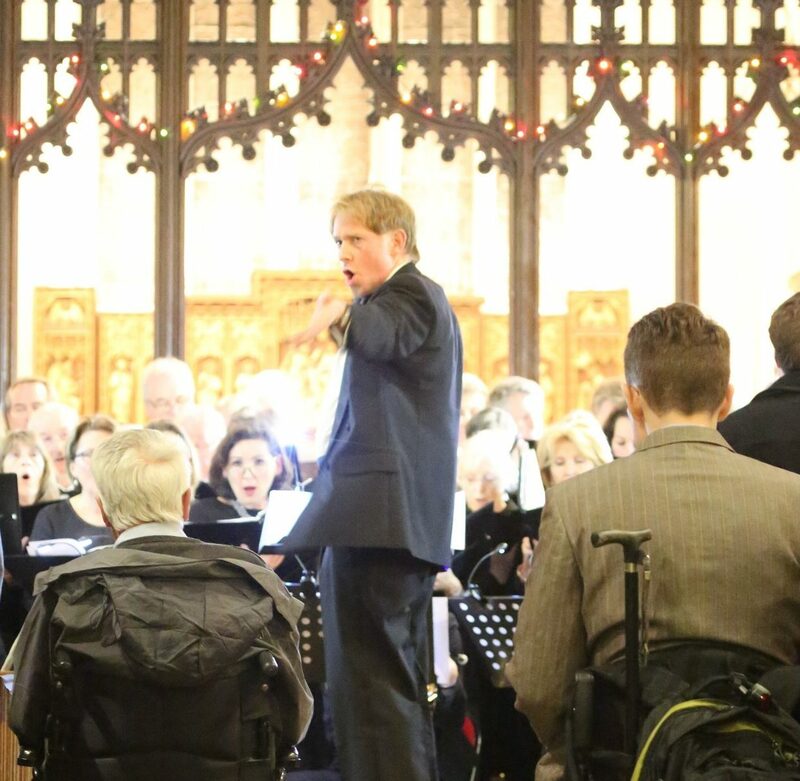 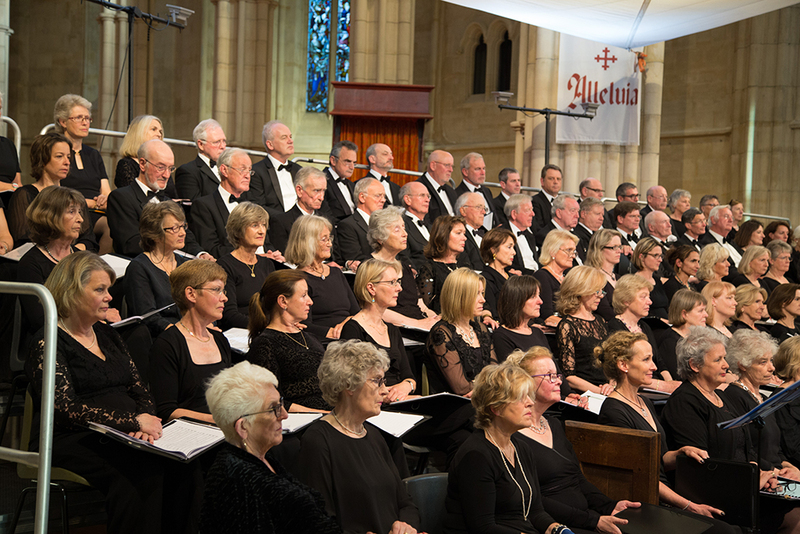 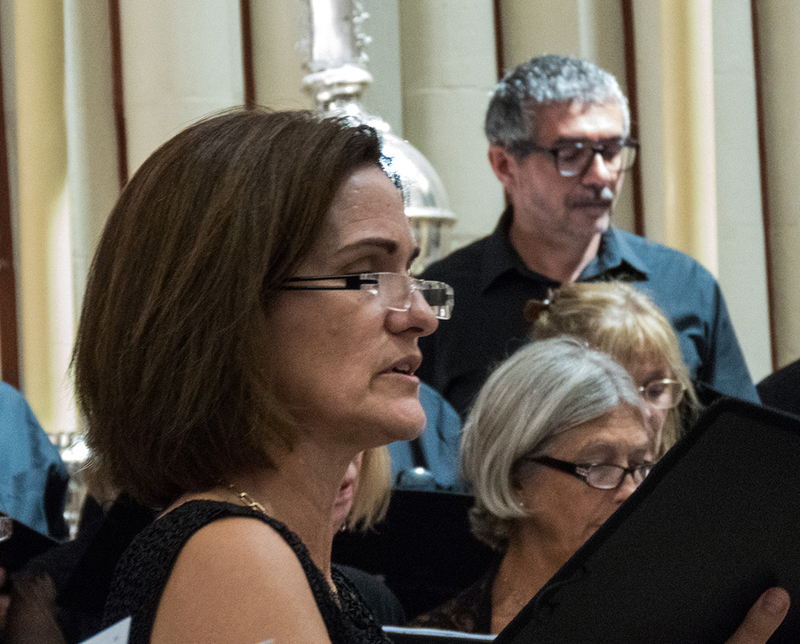 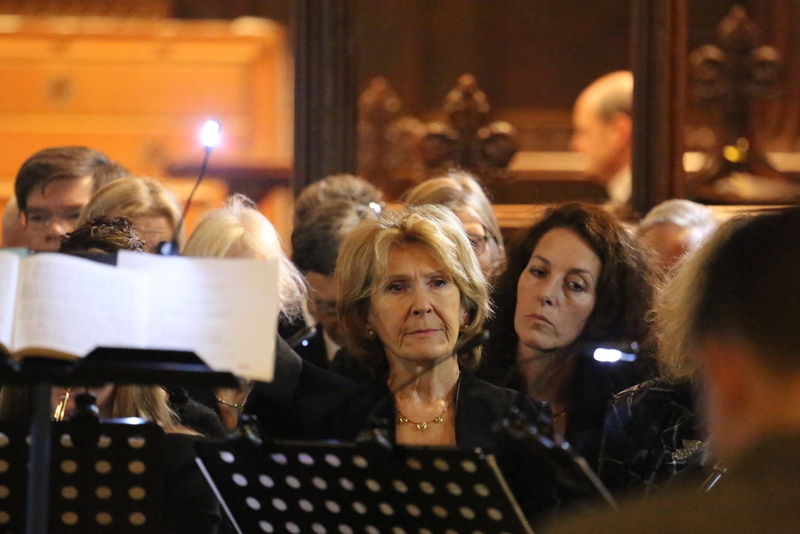 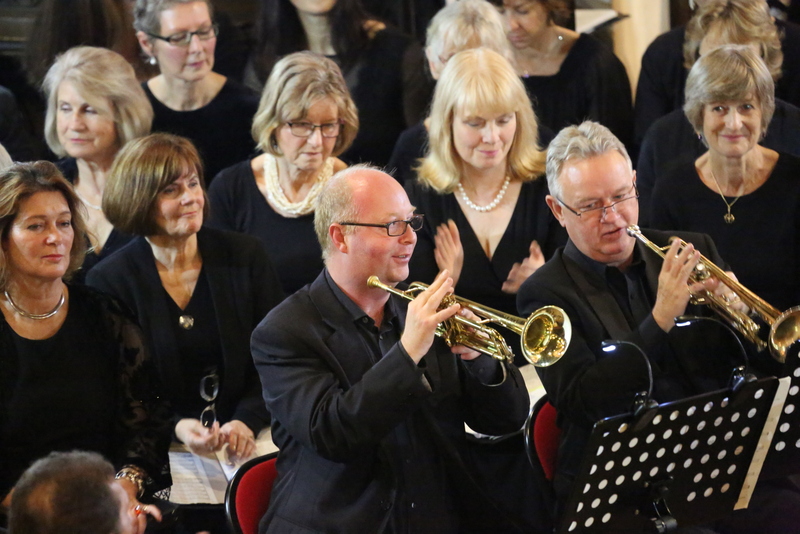 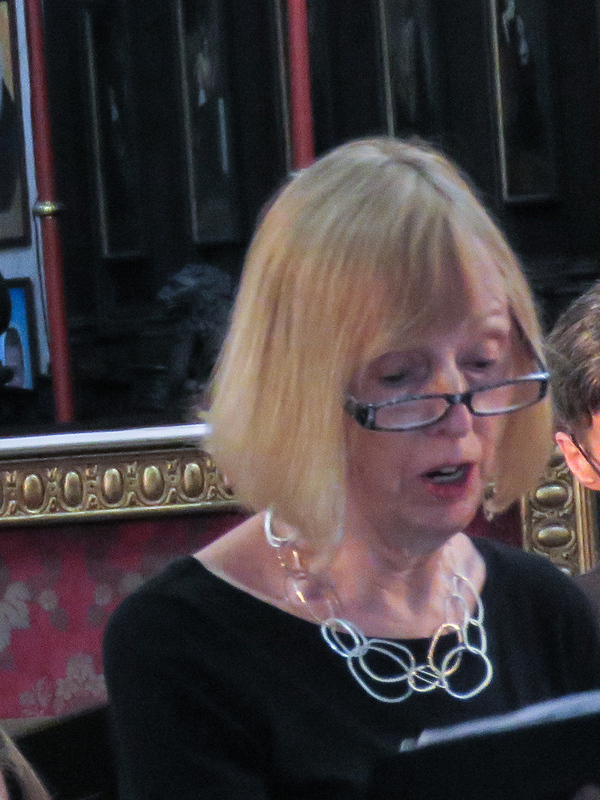 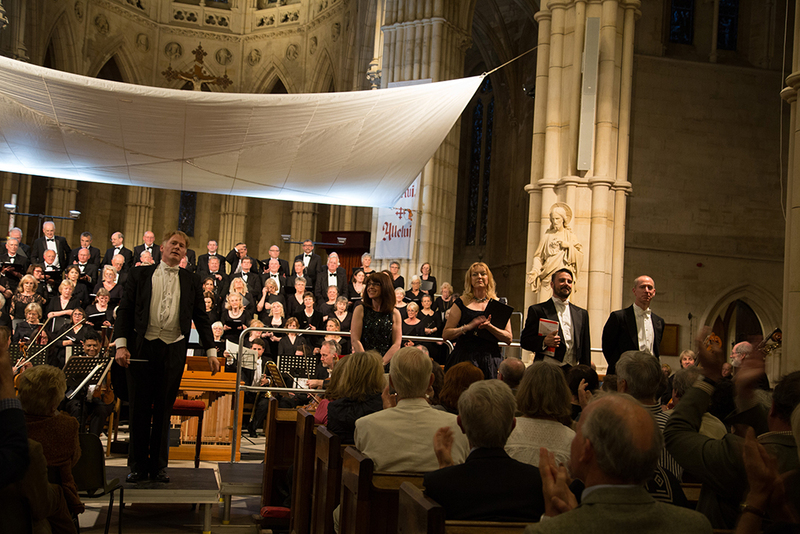 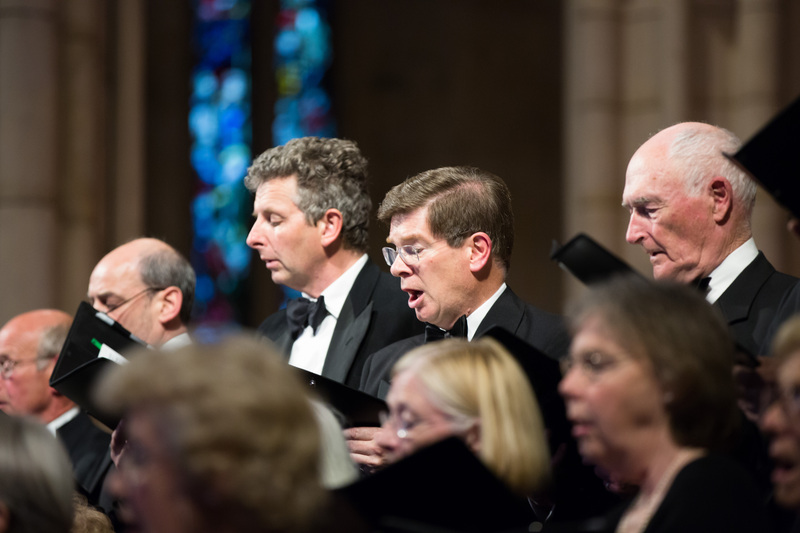 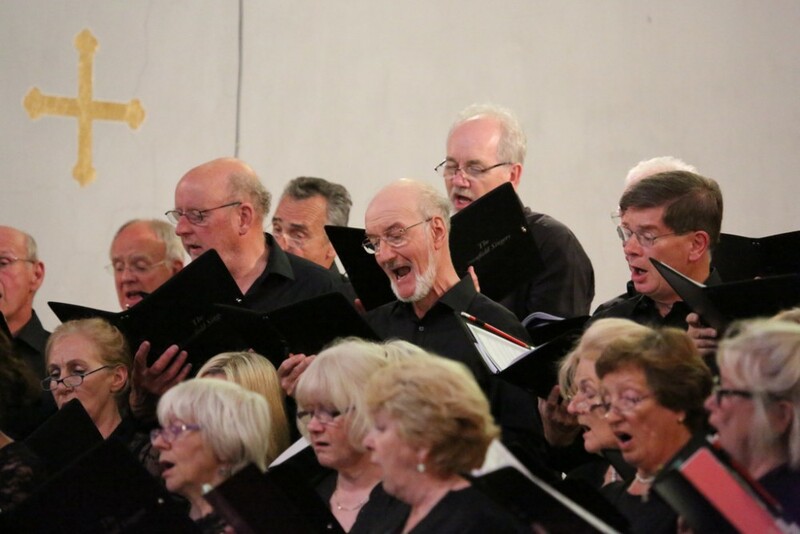 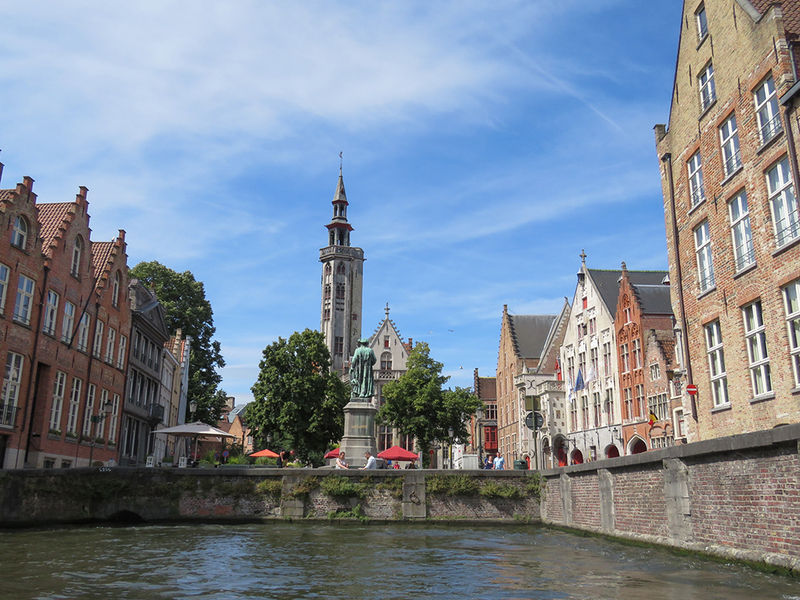 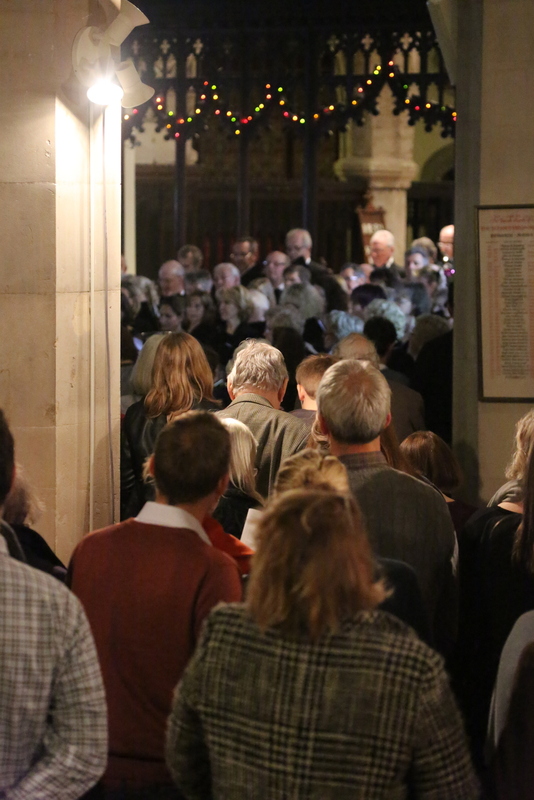 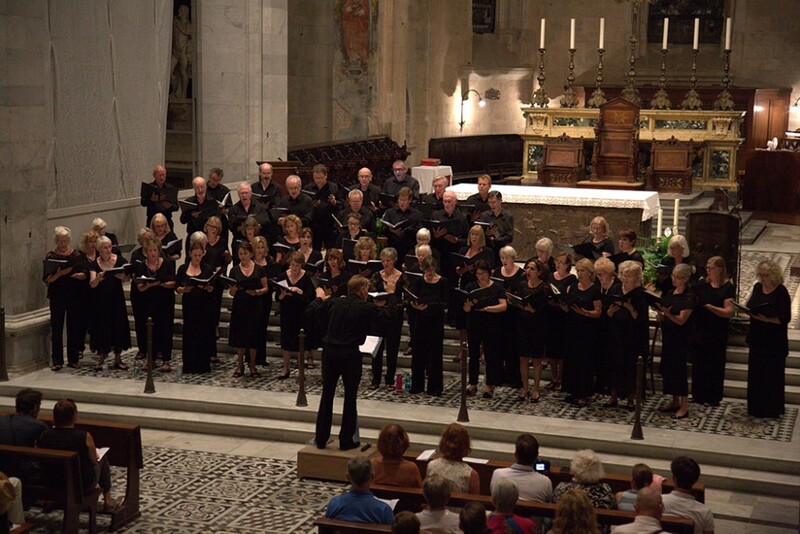 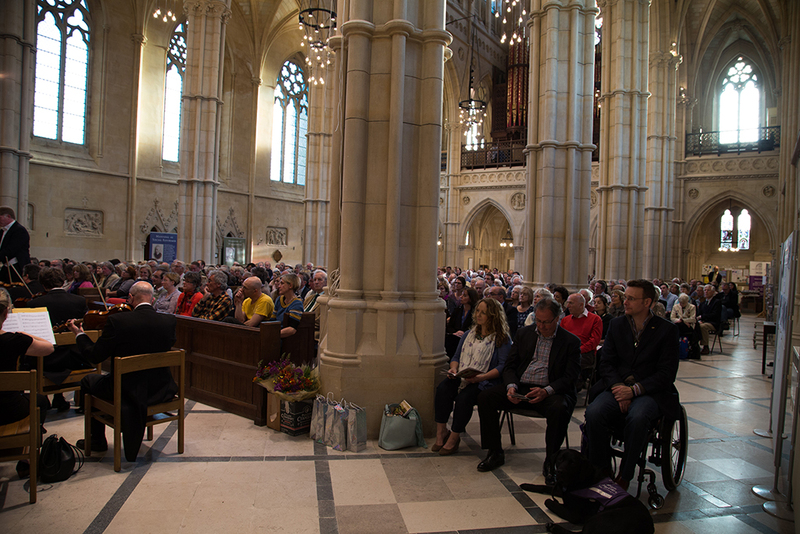 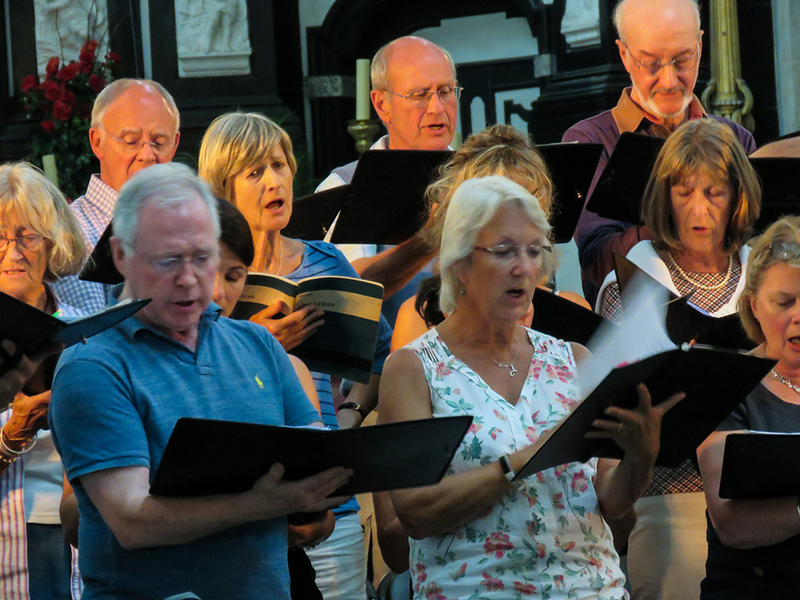 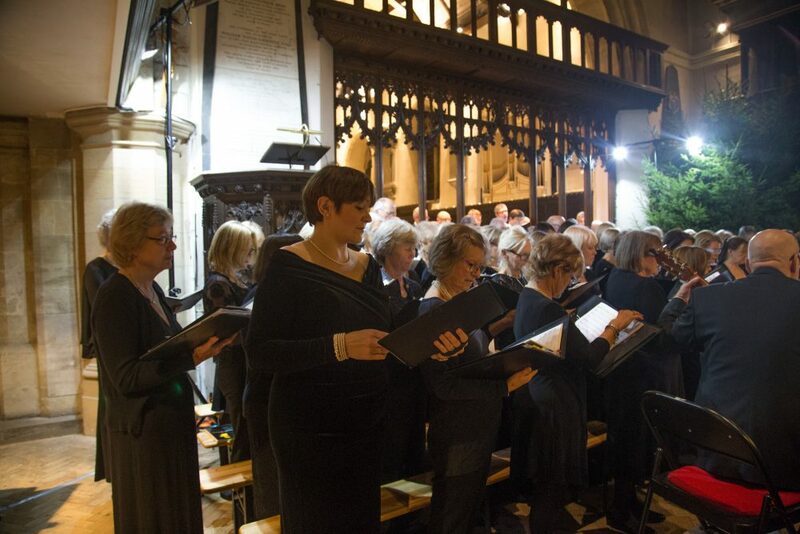 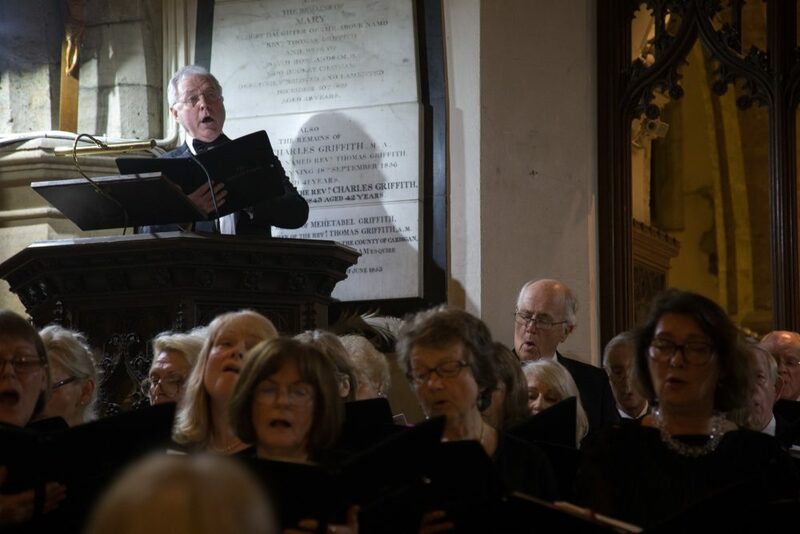 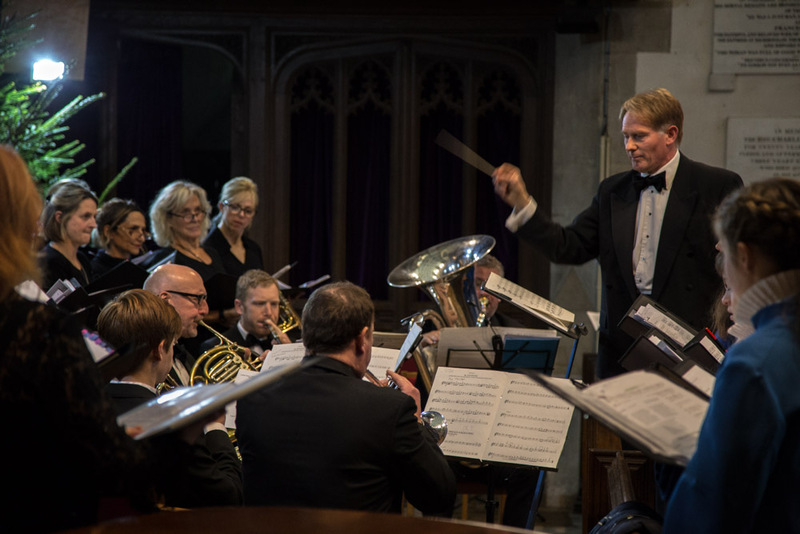 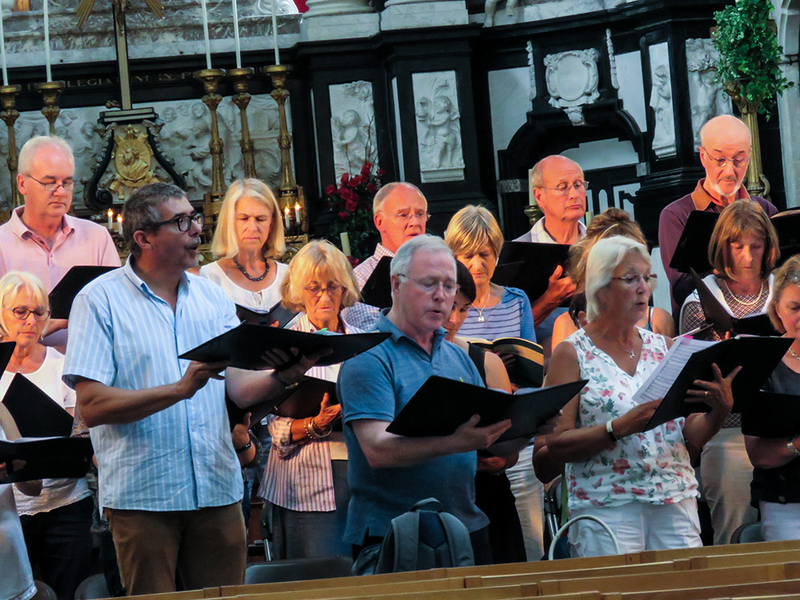 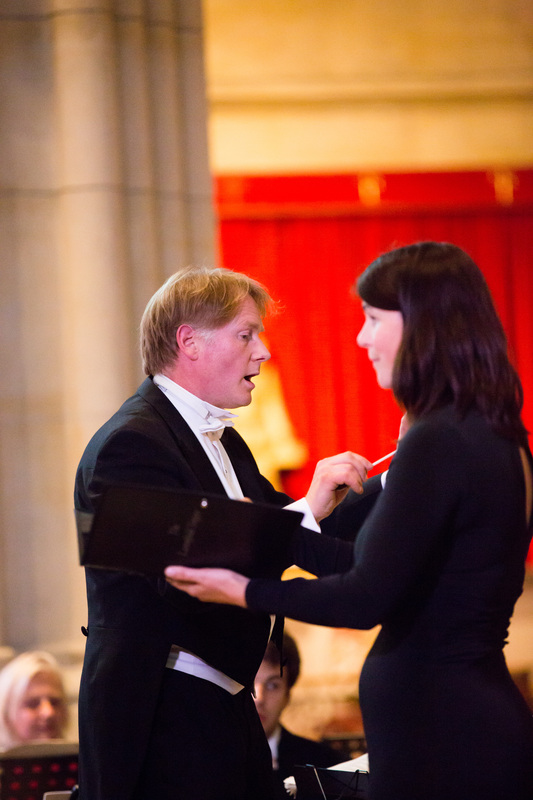 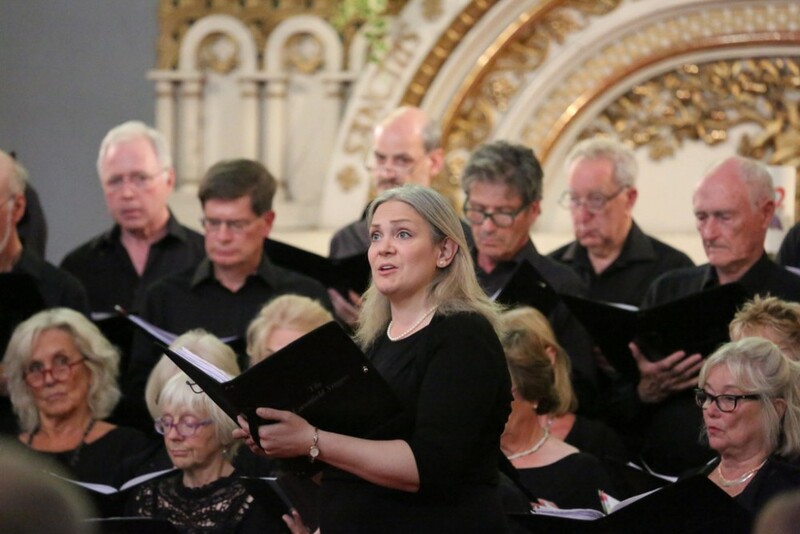 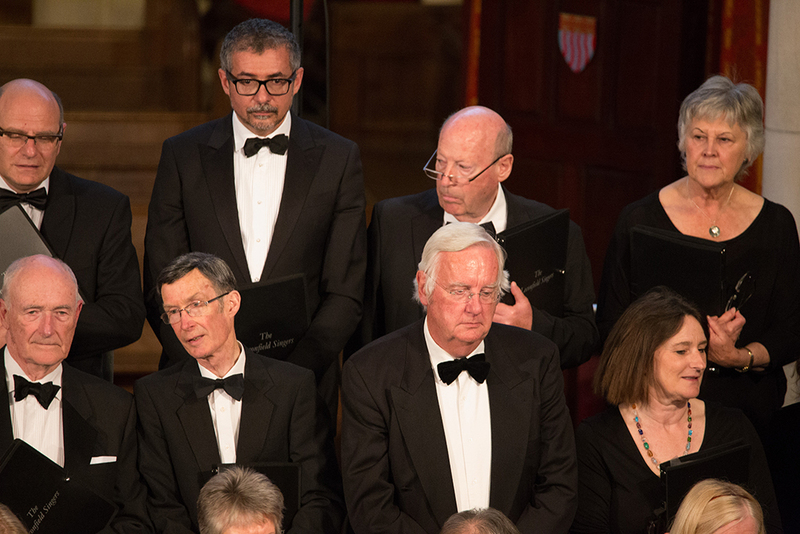 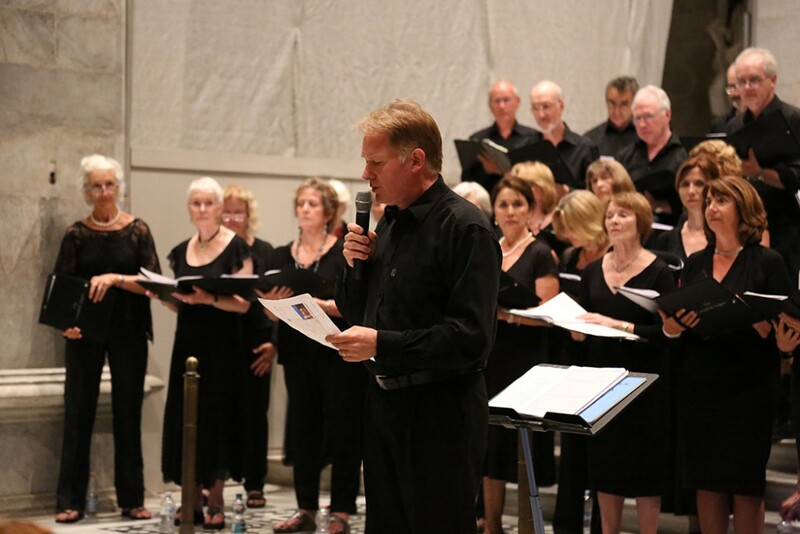 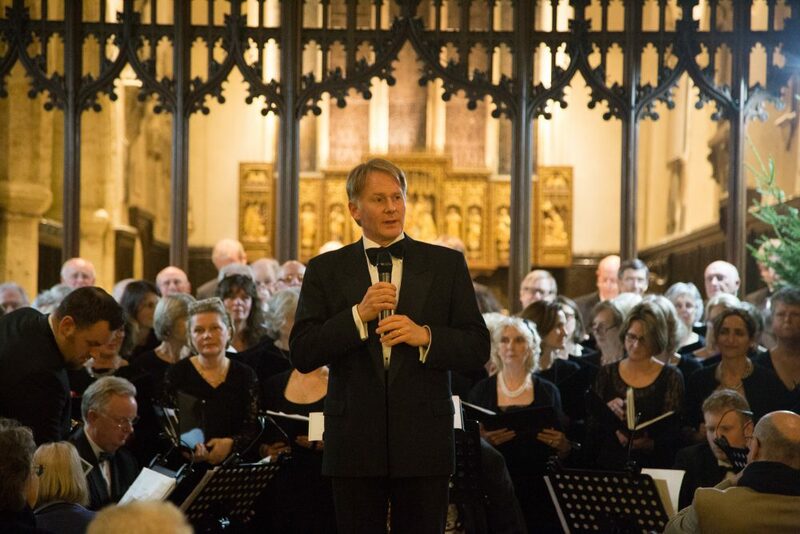 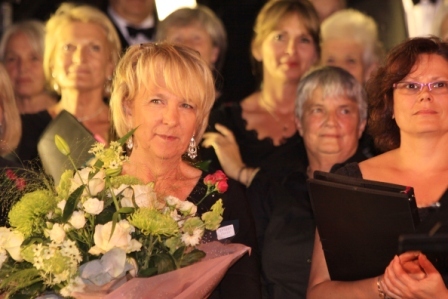 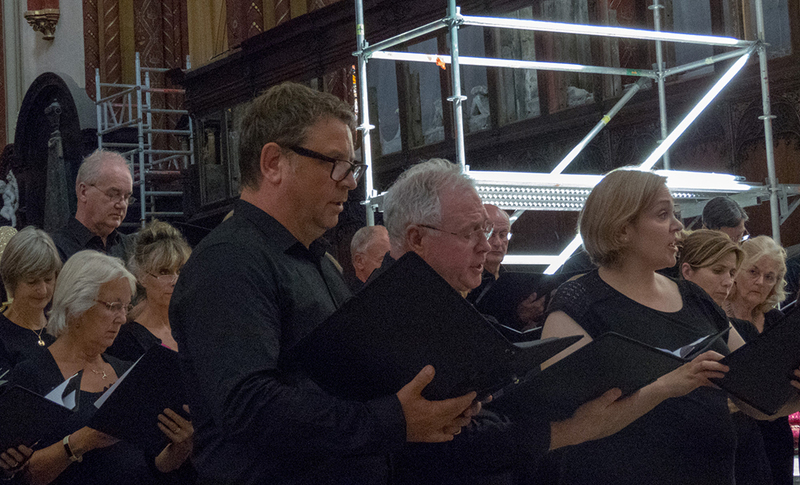 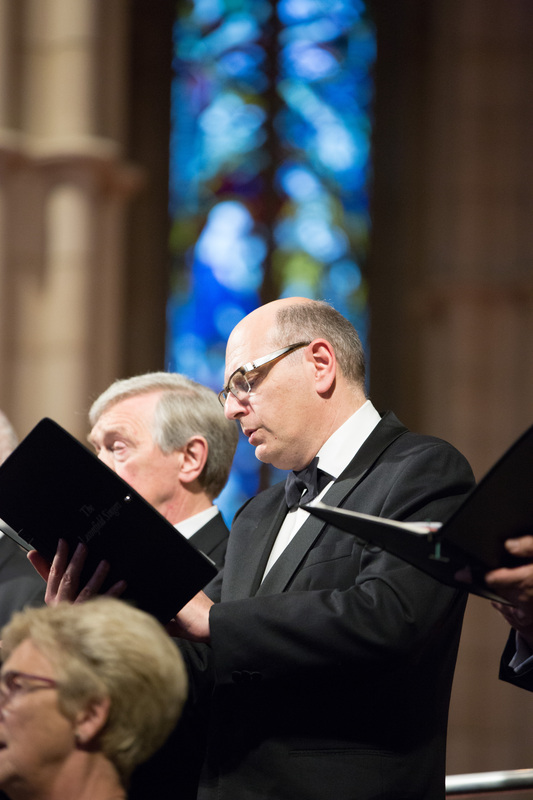 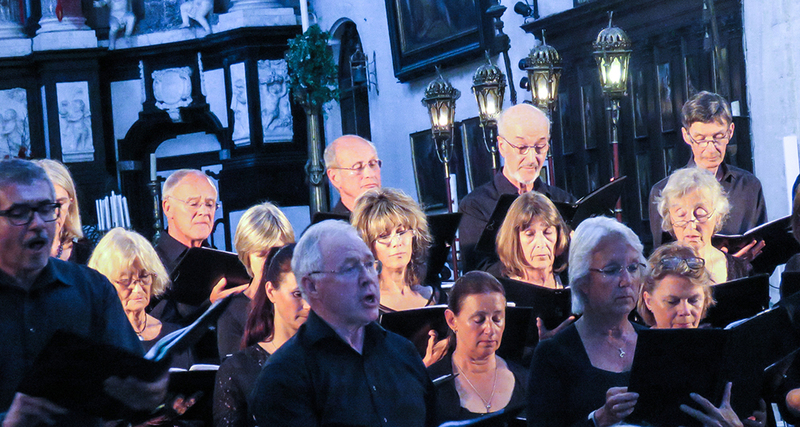 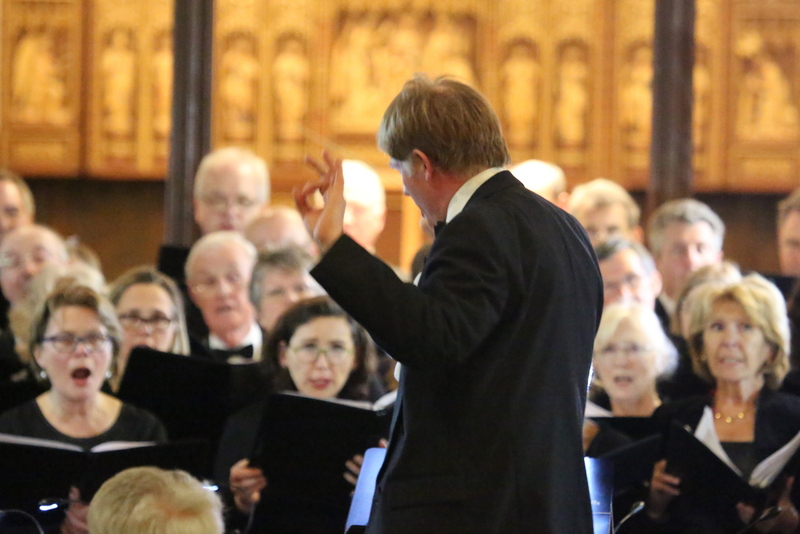 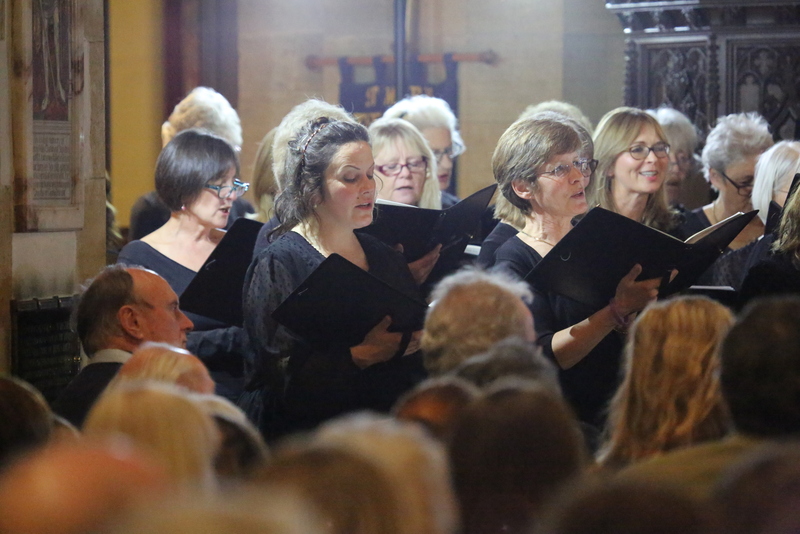 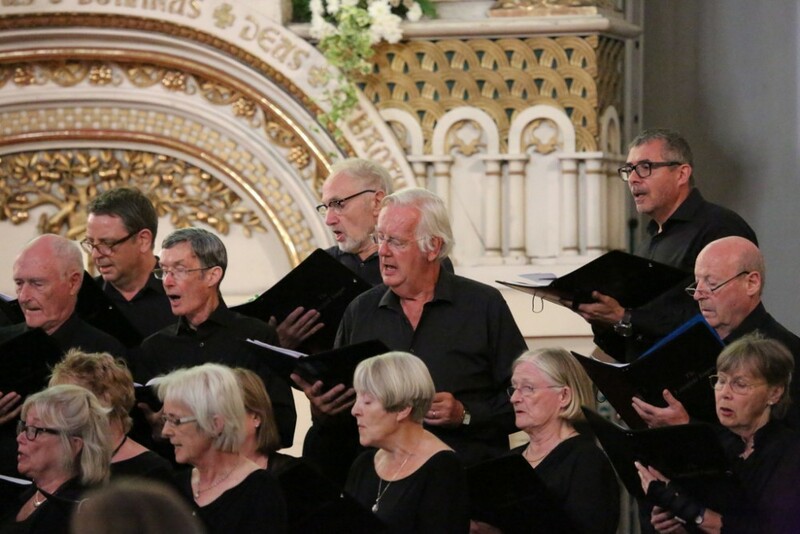 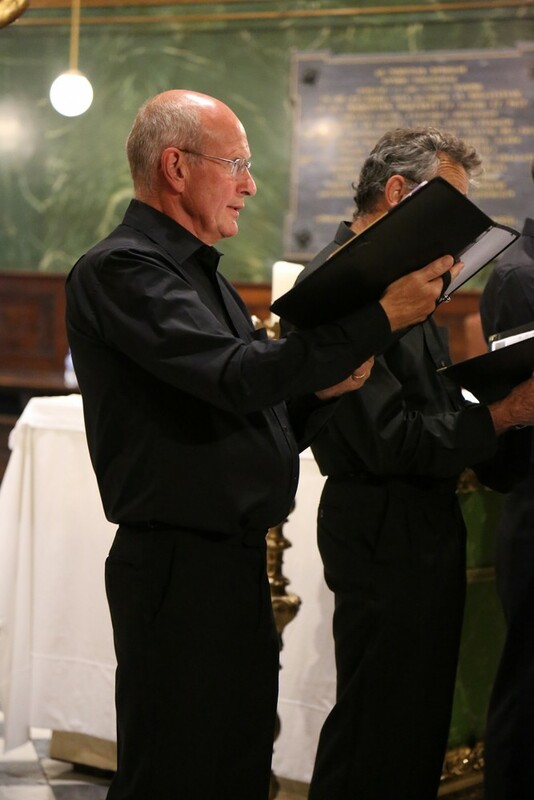 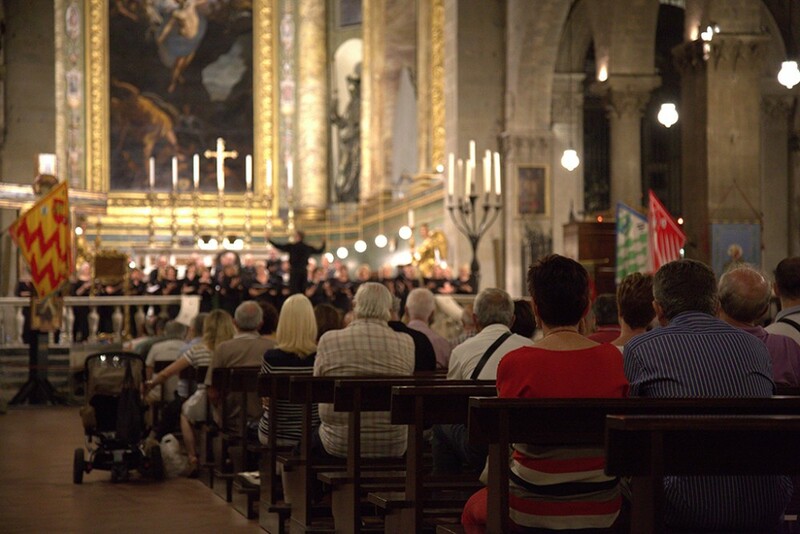 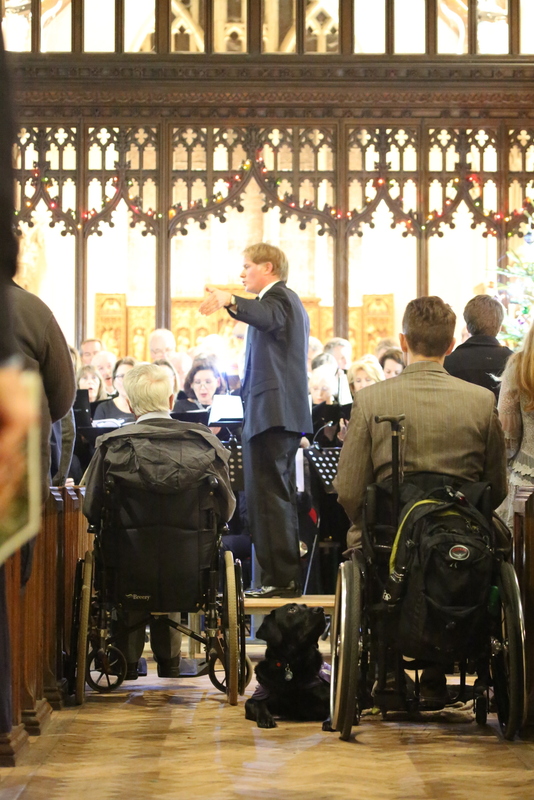 Meanwhile here’s a small selection of photos to give you a flavour of the visit…..
We were so pleased that the cathedral was full at our Summer Concert in June 2015, singing Fauré’s Requiem, Vaughan Williams’ 5 Mystical songs, Cecilia McDowall’s beautiful Ave Maris Stella and a composition by one of our choir members, In Flanders Fields by Brian Knowles with soloists Dyfed Wyn Evans (Baritone) and Emma Harding (Soprano). 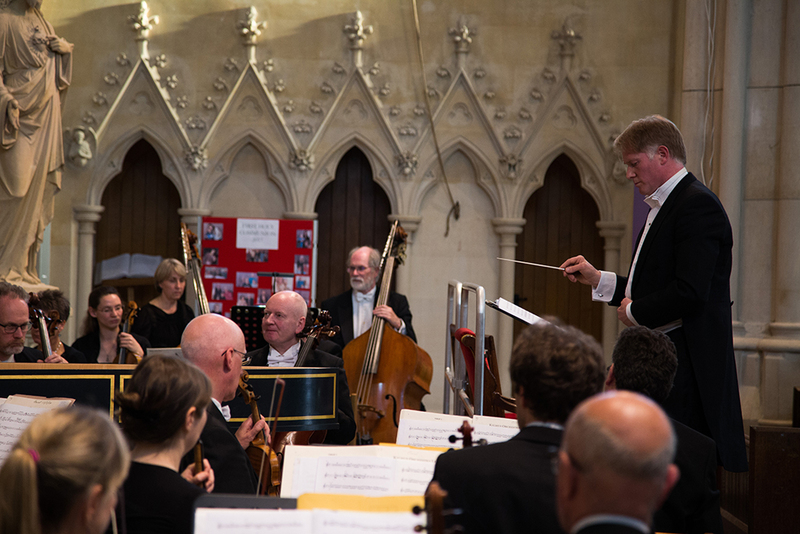 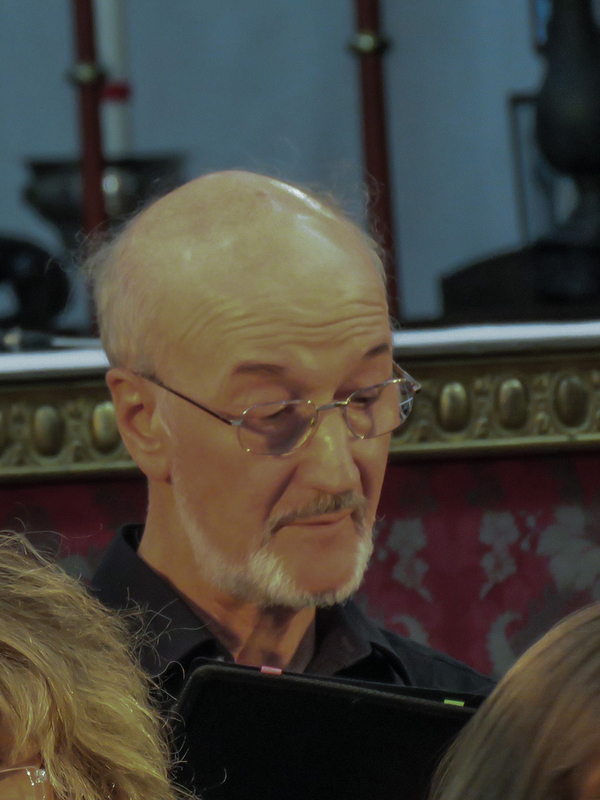 We also listened to Suite Antique by John Rutter and were honoured to be joined by English Philharmonia strings lead by Matthew Scriven, and Ian Mullin playing the flute. 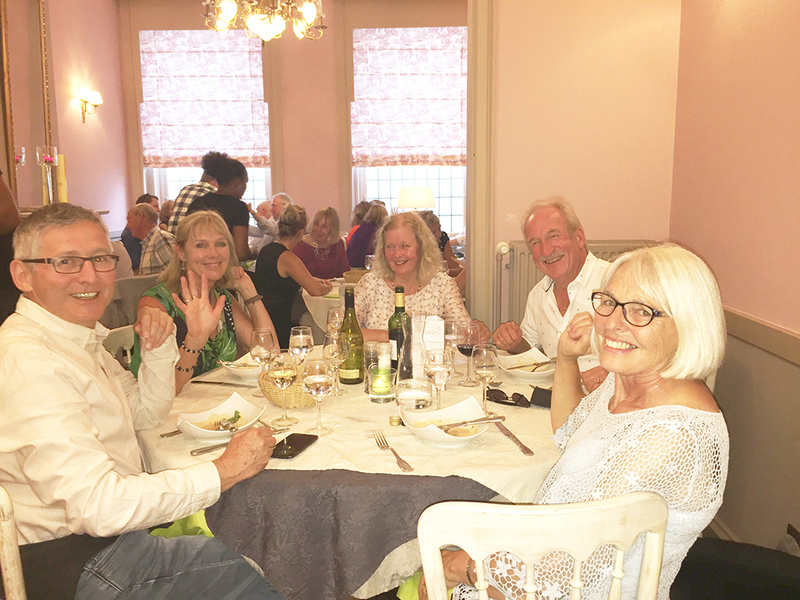 All in all a great evening was had by all! 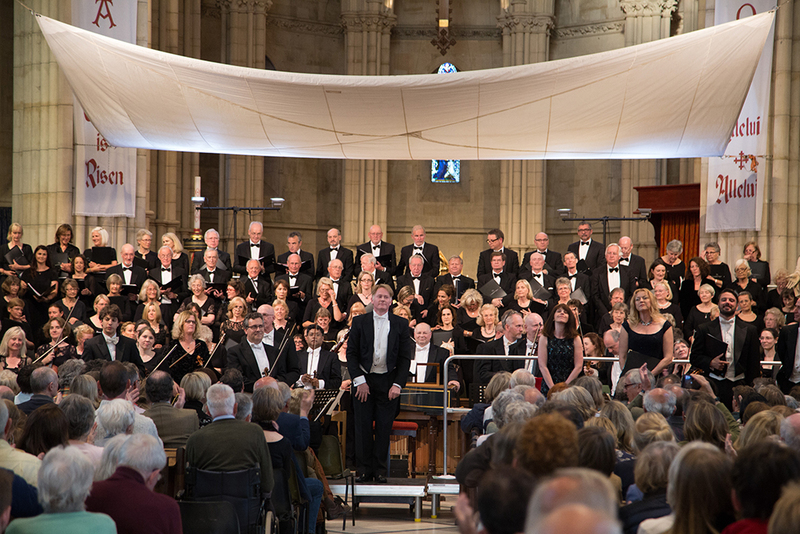 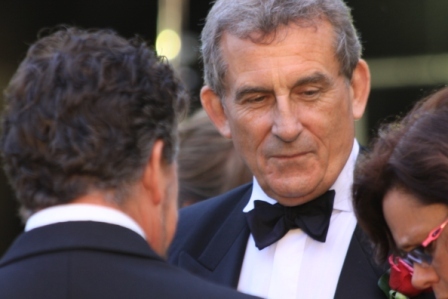 Many thanks to David Williams for taking such lovely photos. 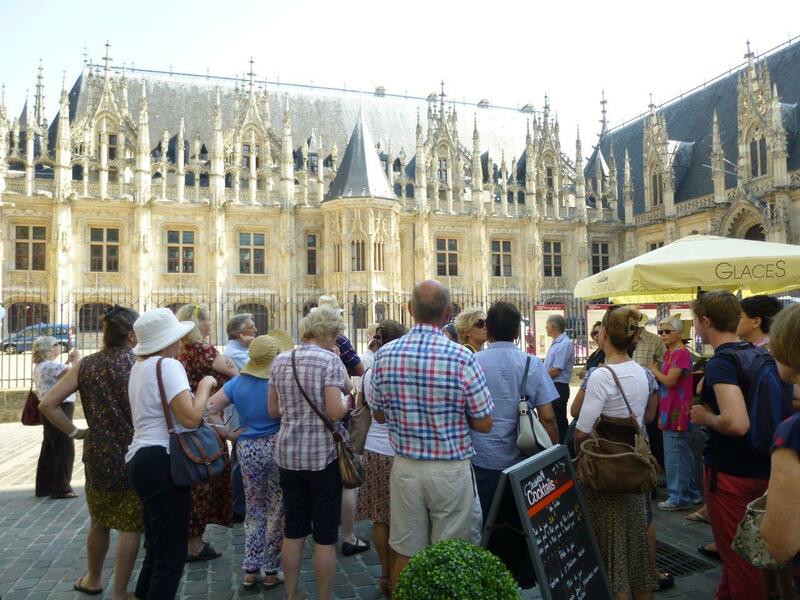 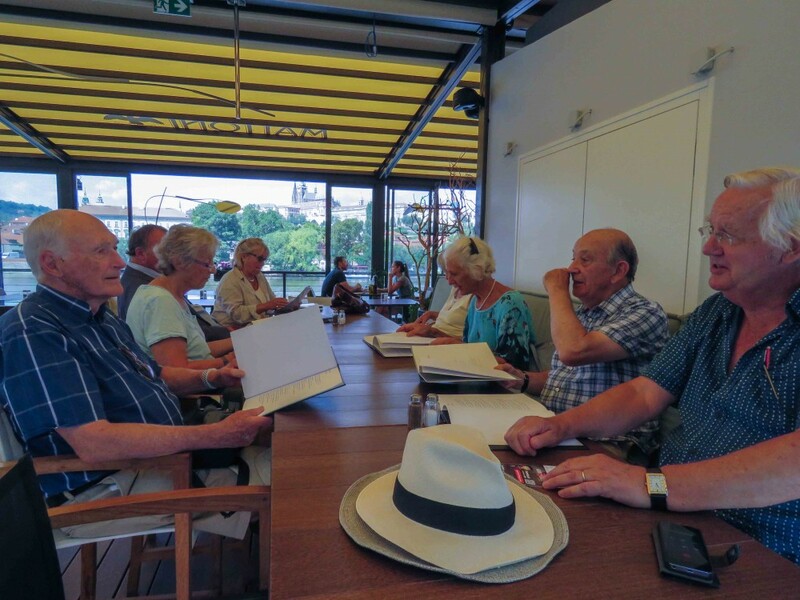 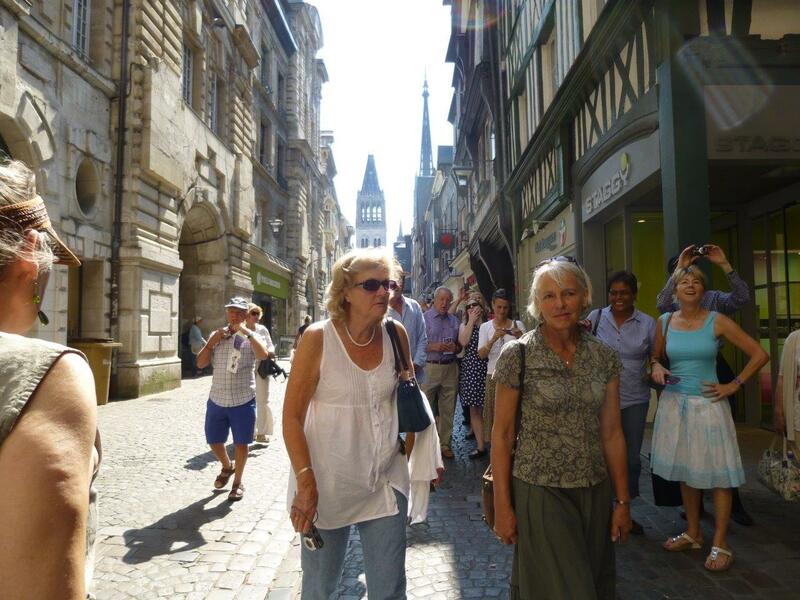 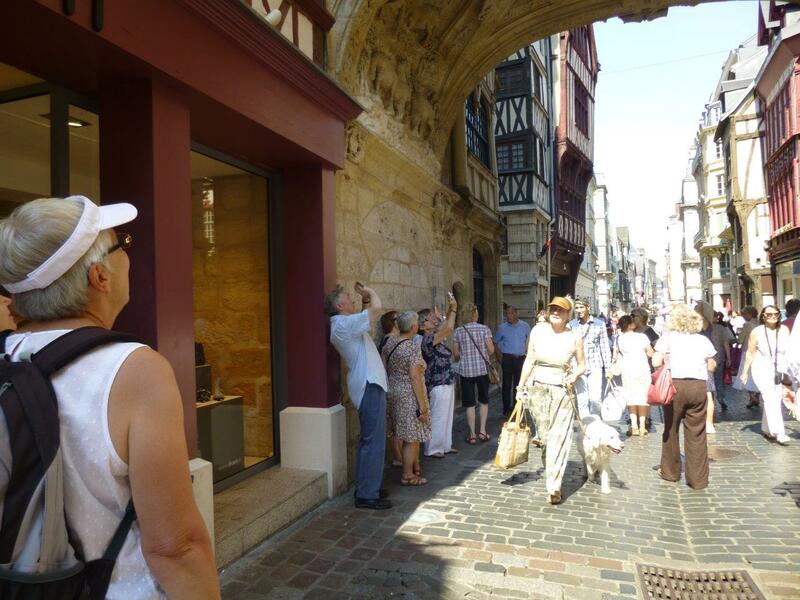 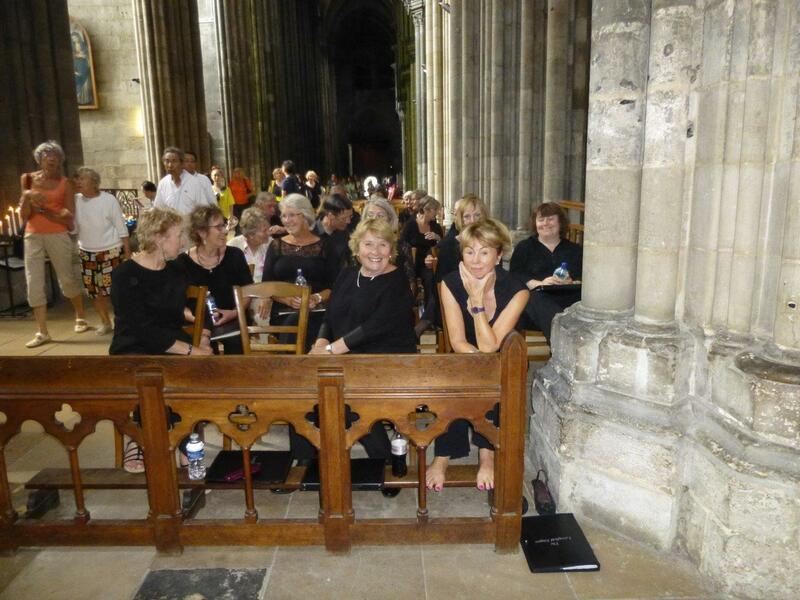 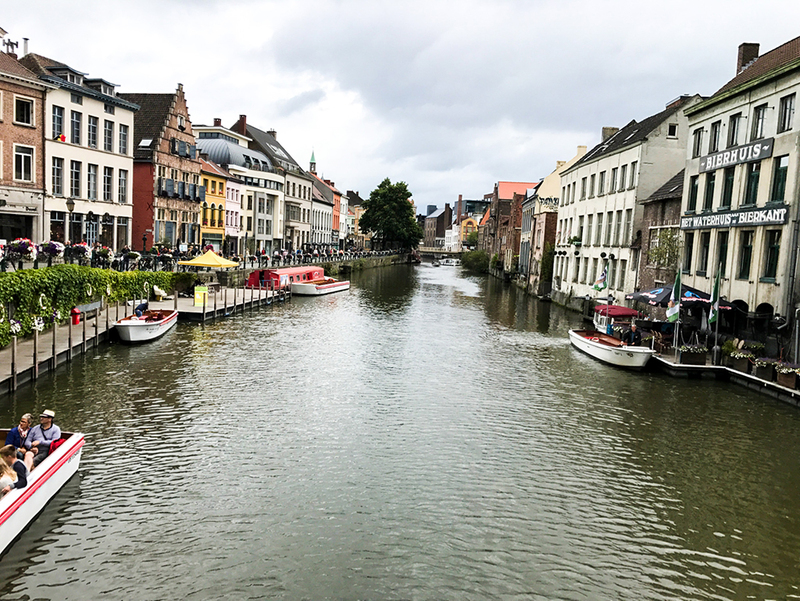 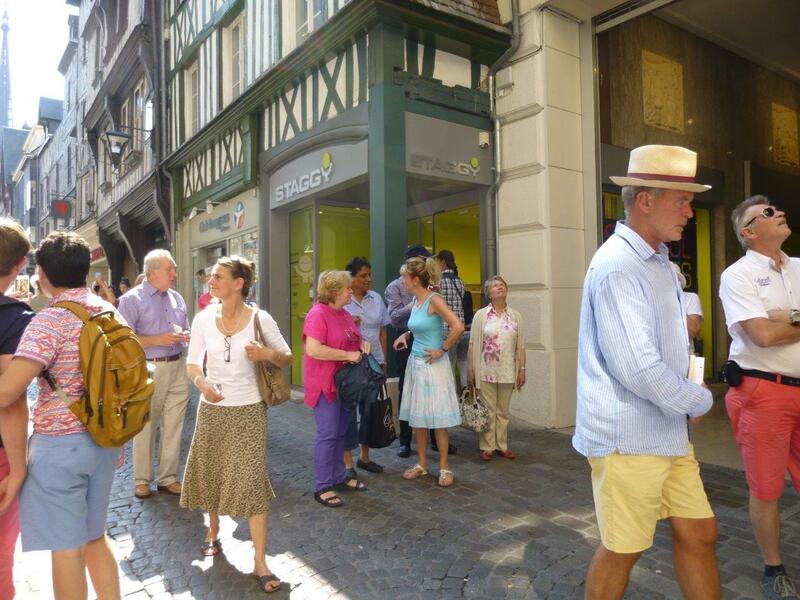 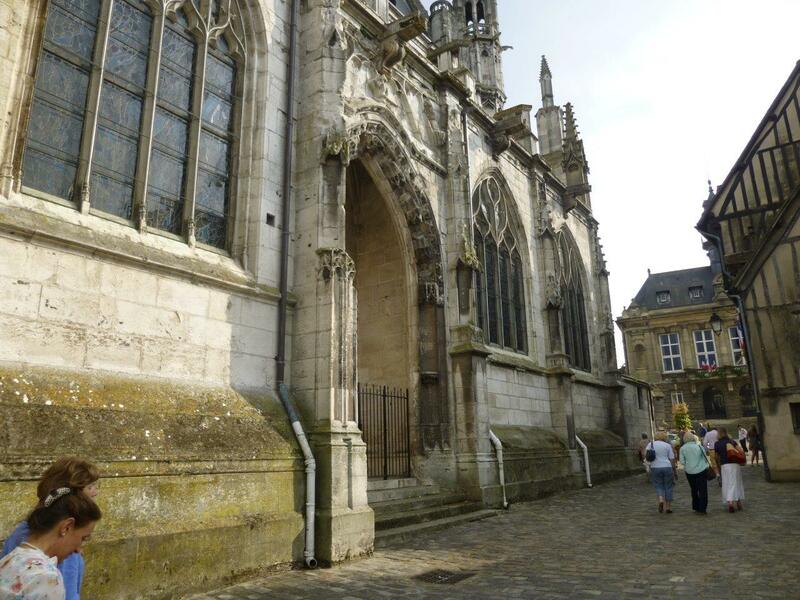 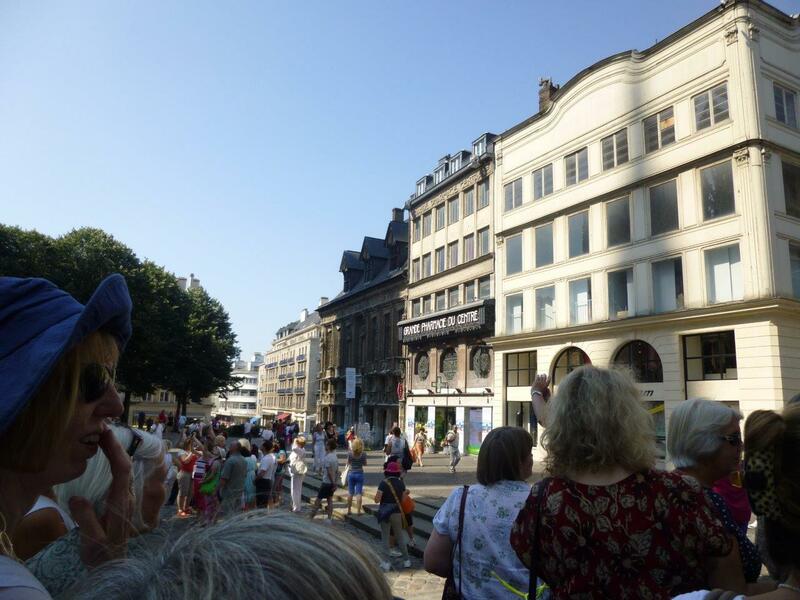 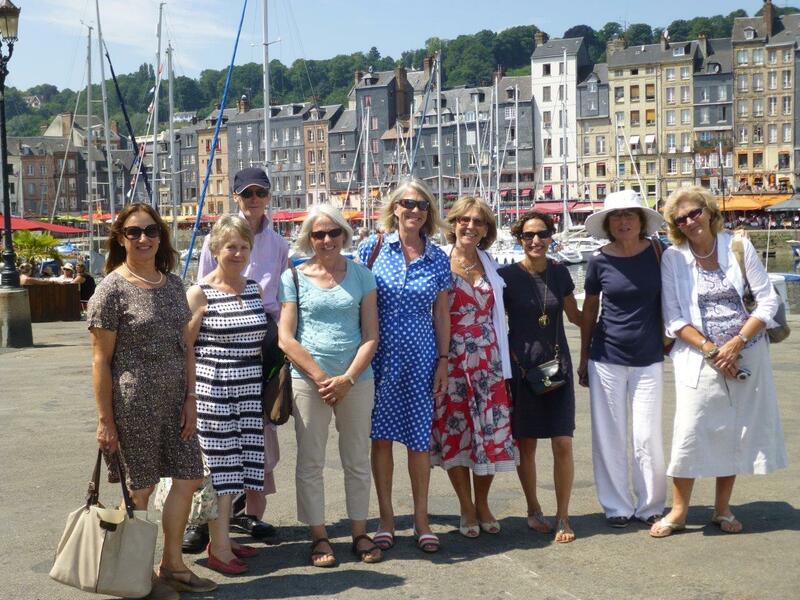 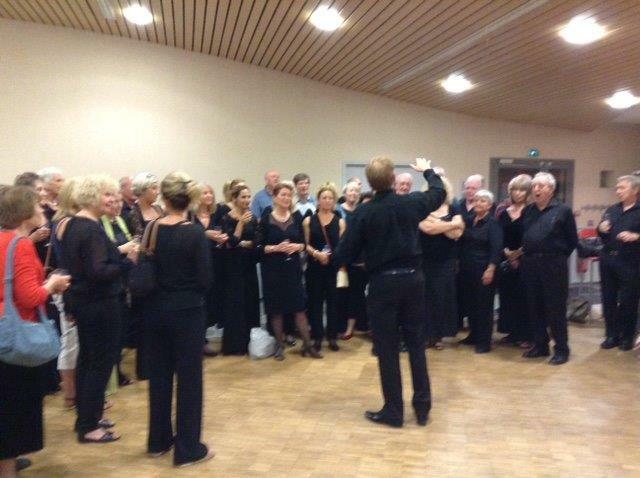 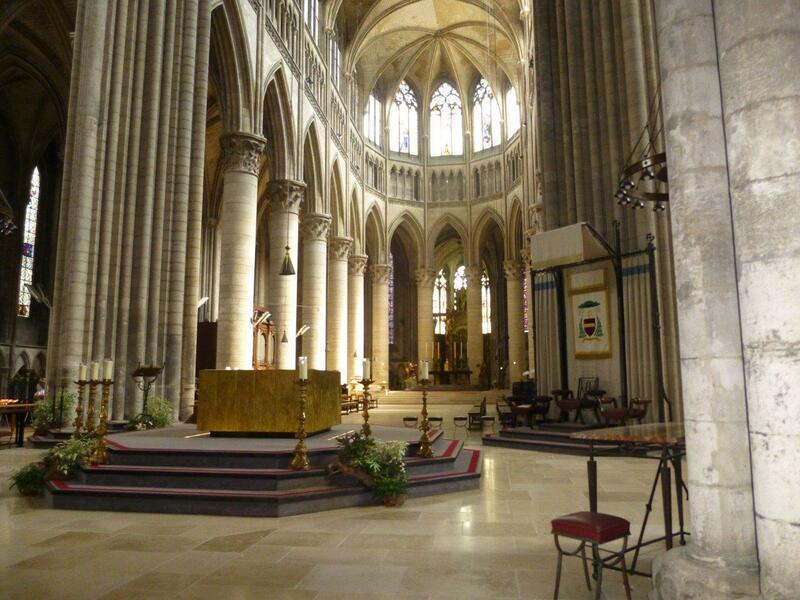 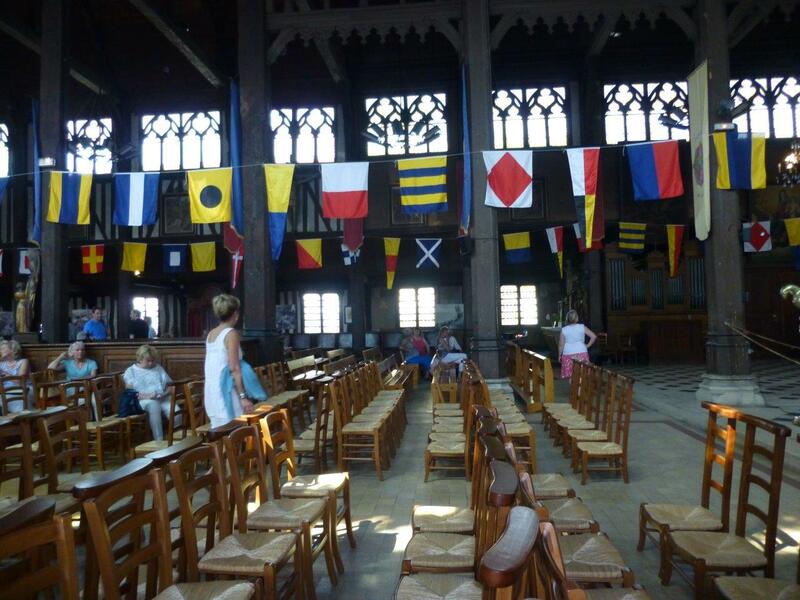 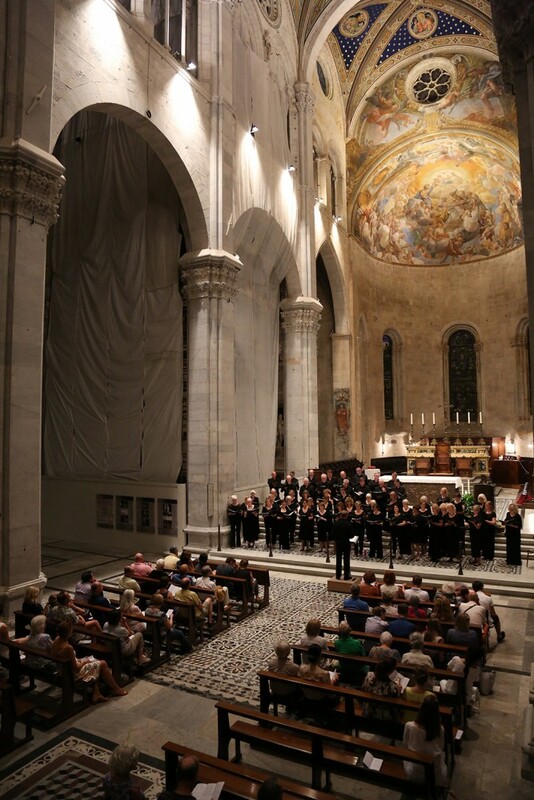 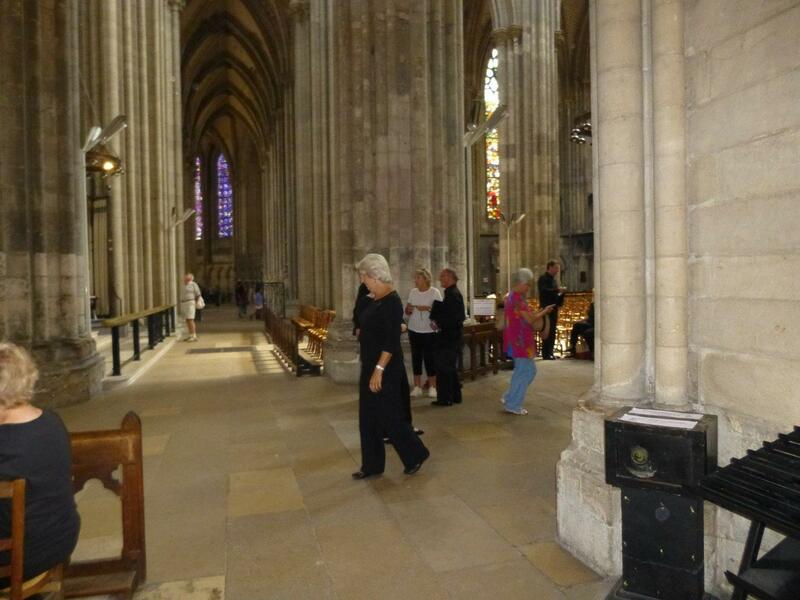 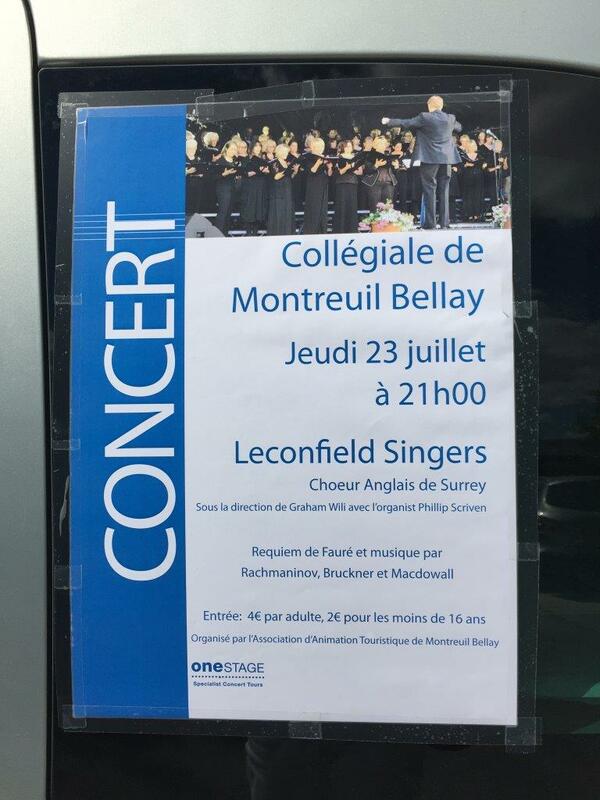 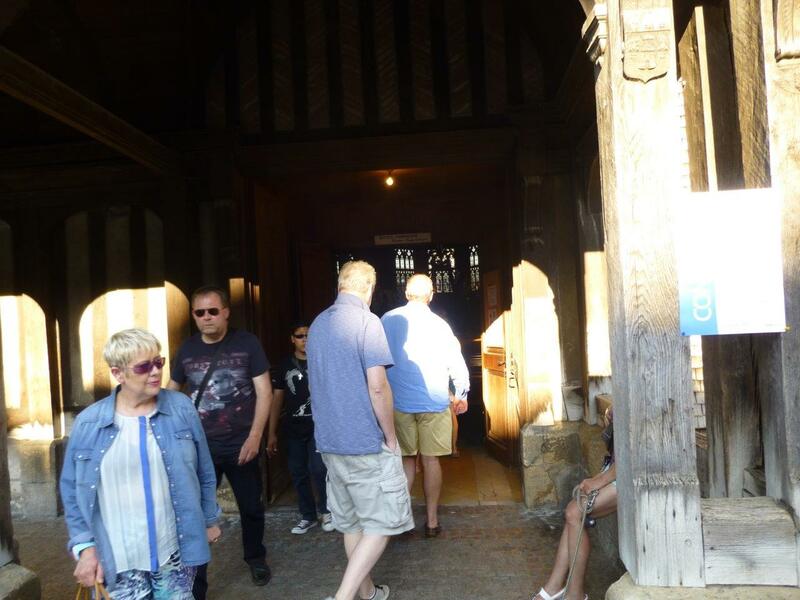 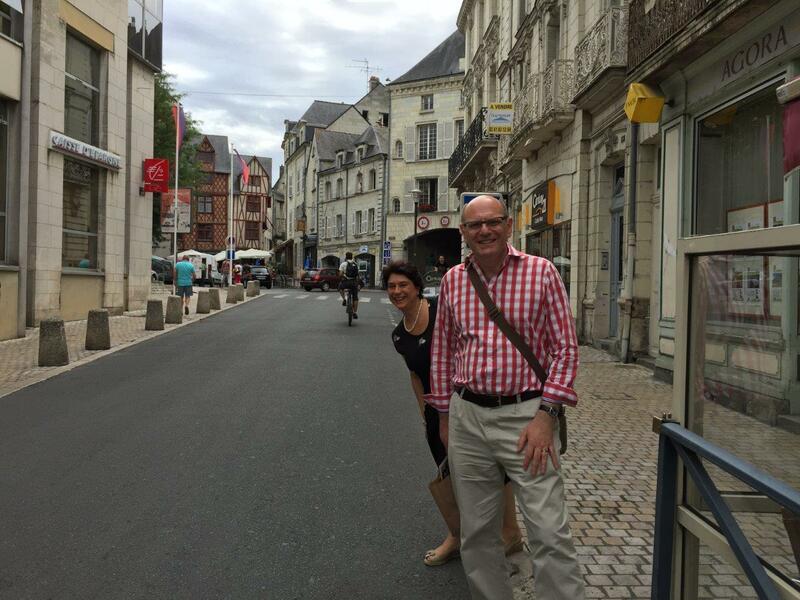 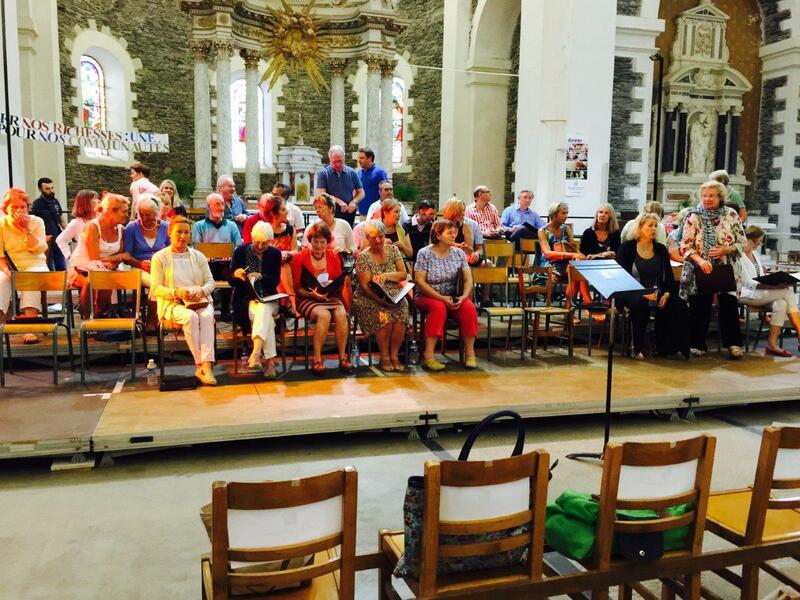 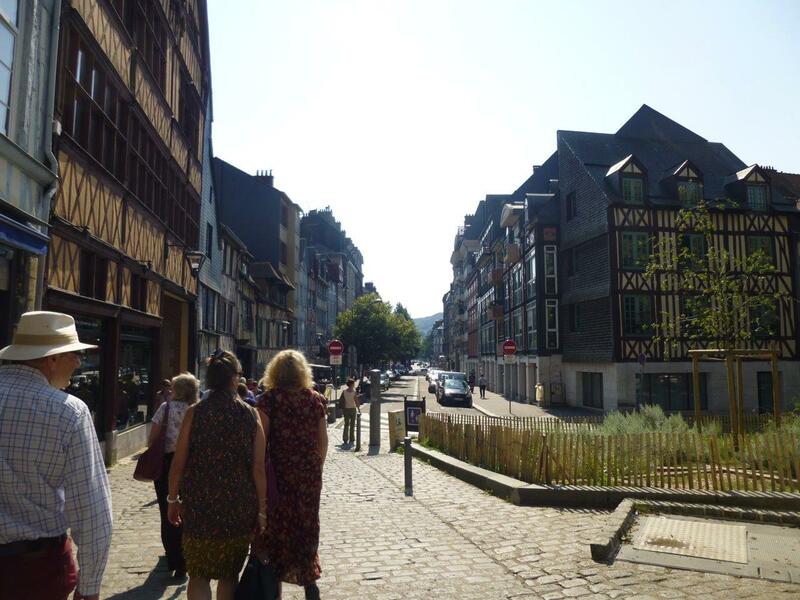 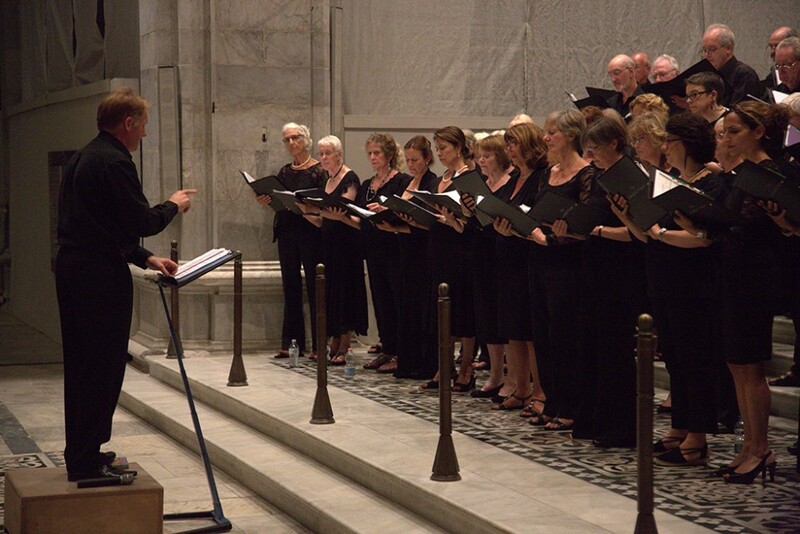 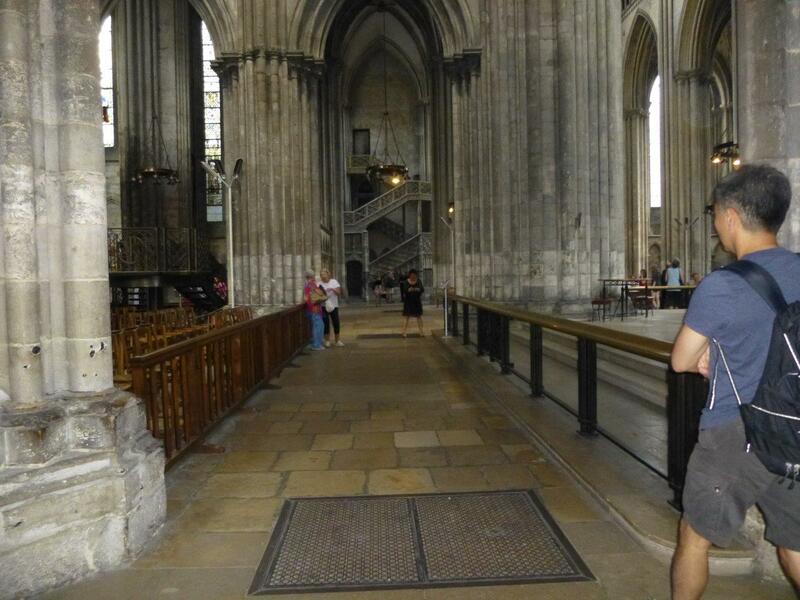 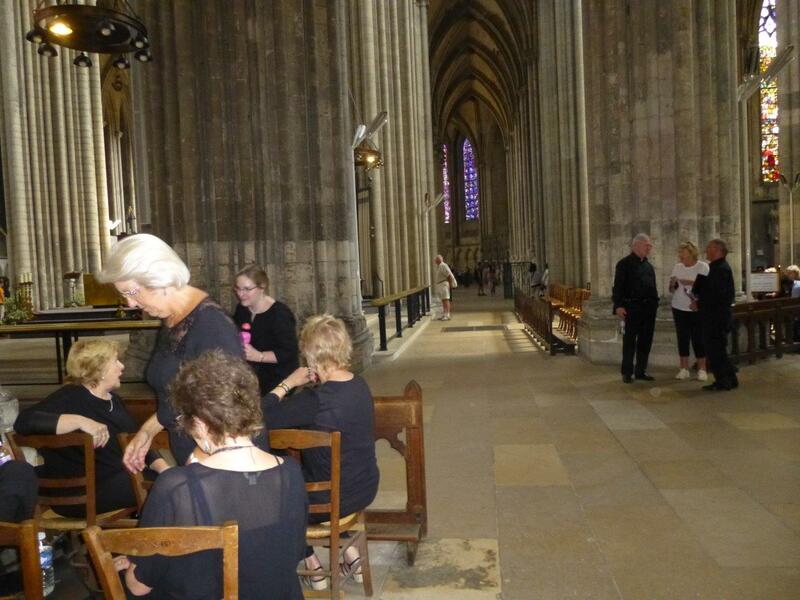 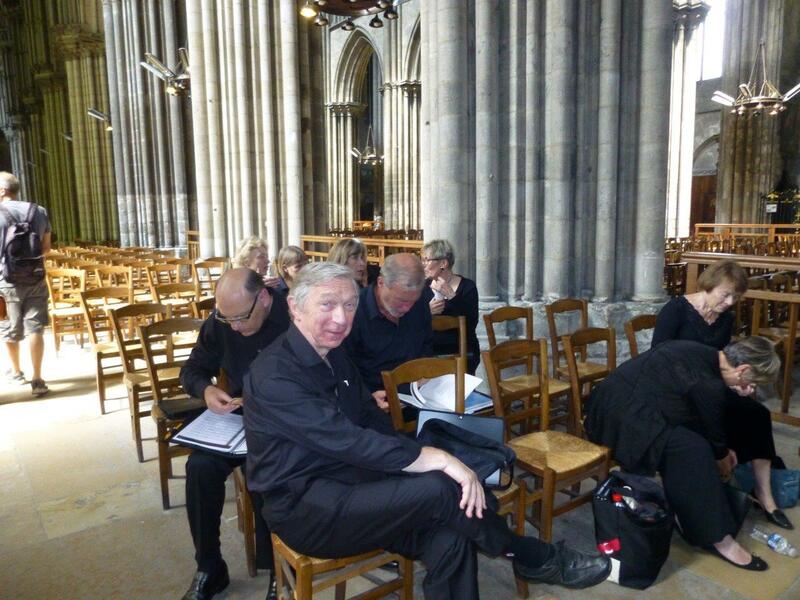 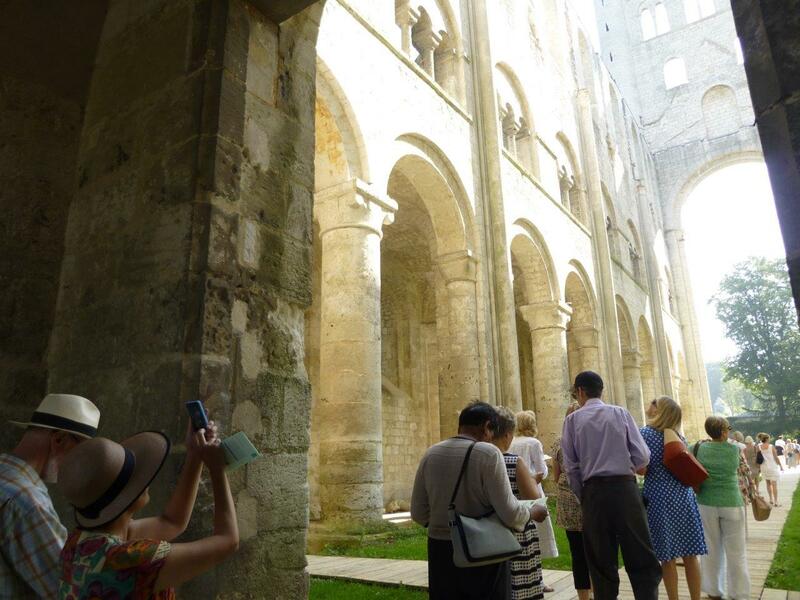 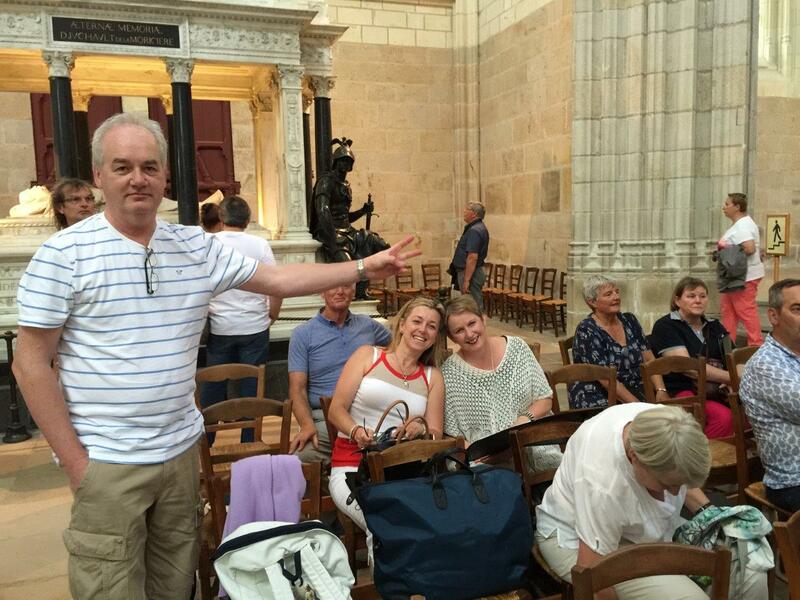 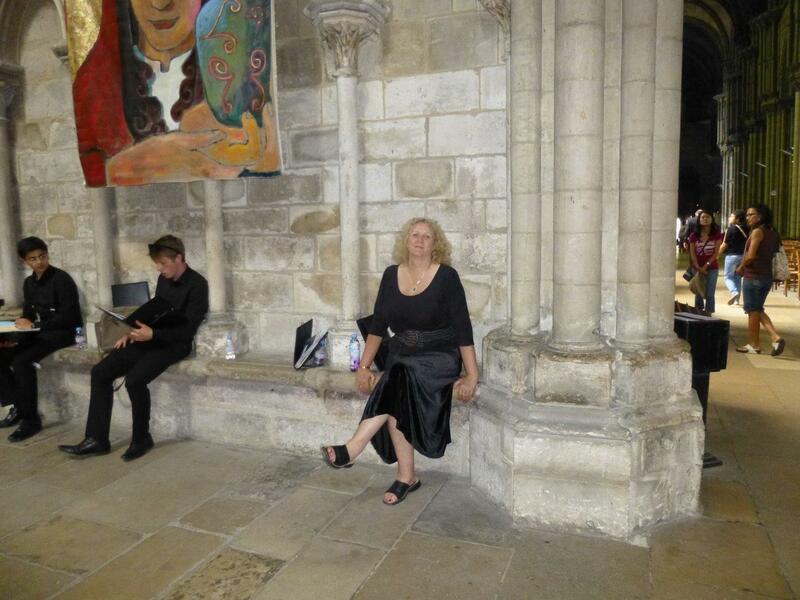 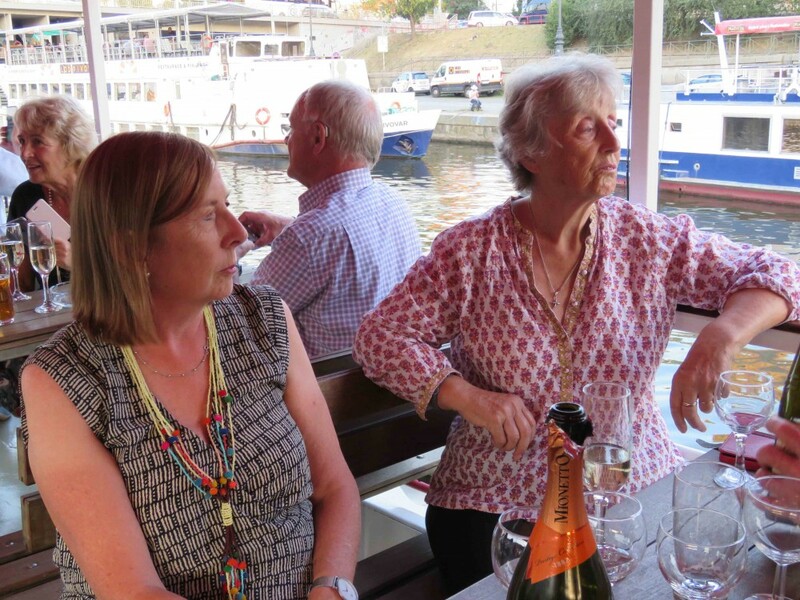 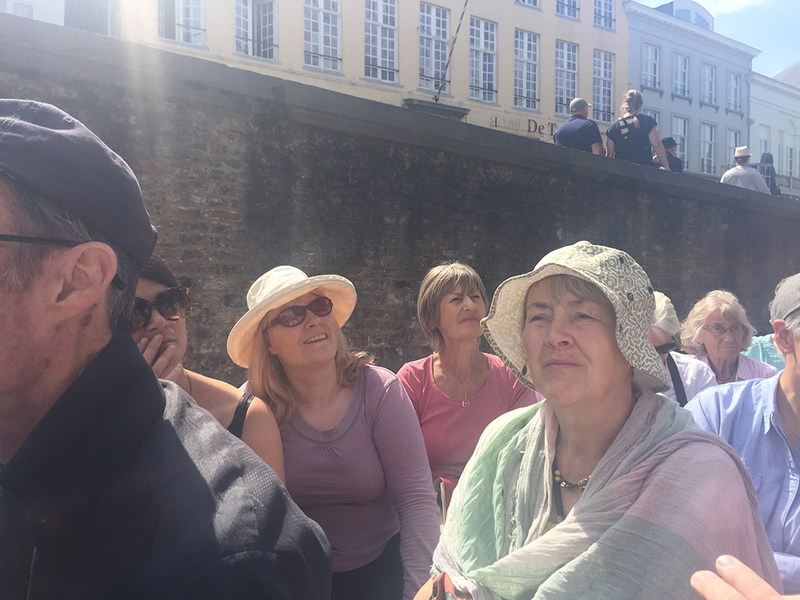 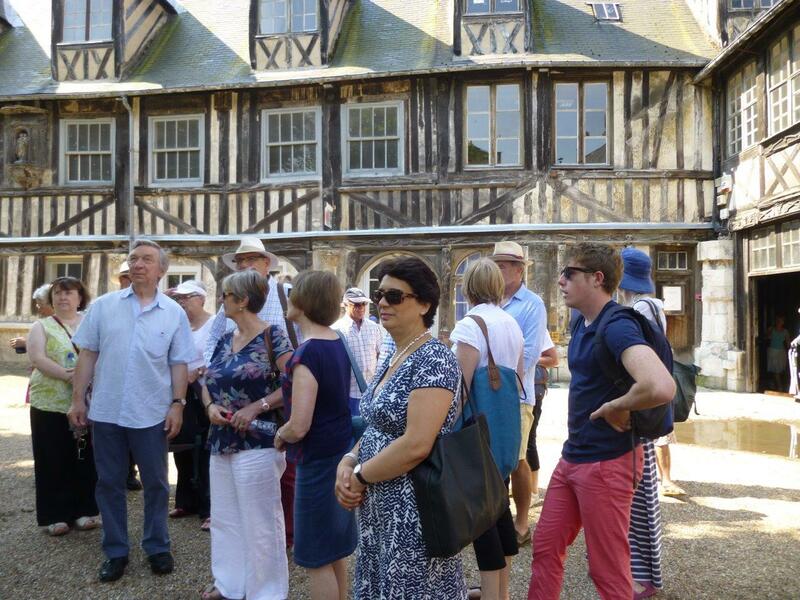 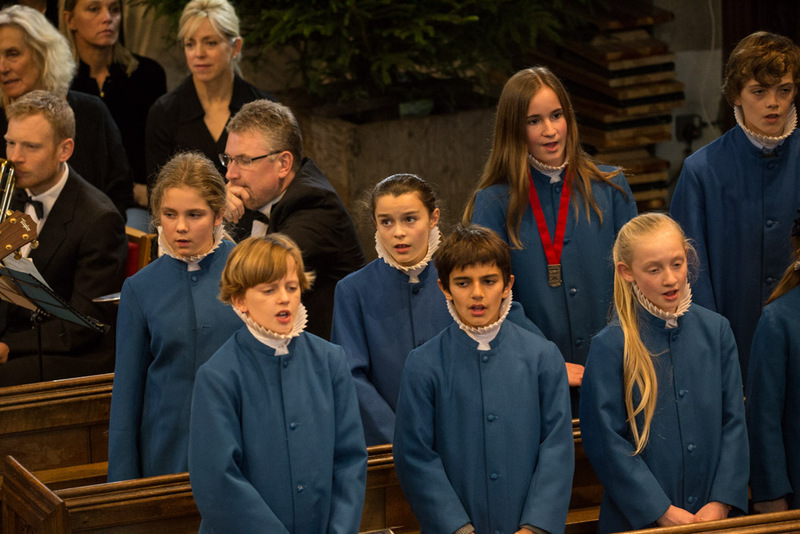 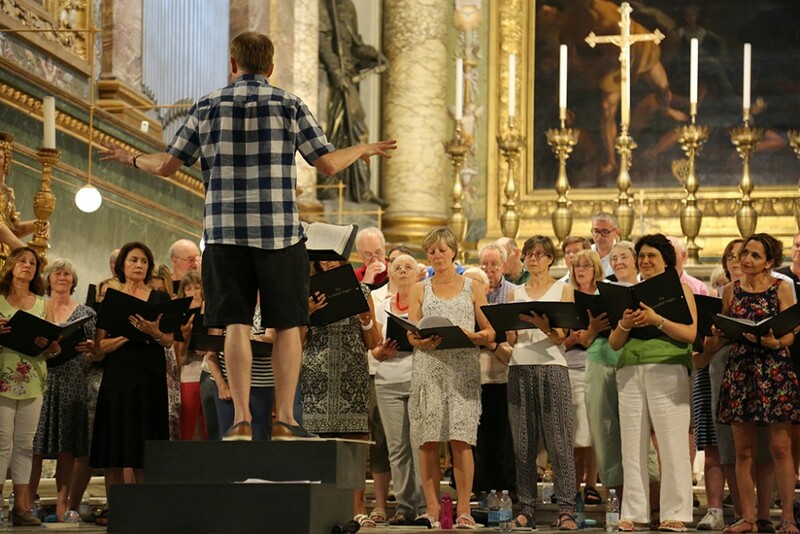 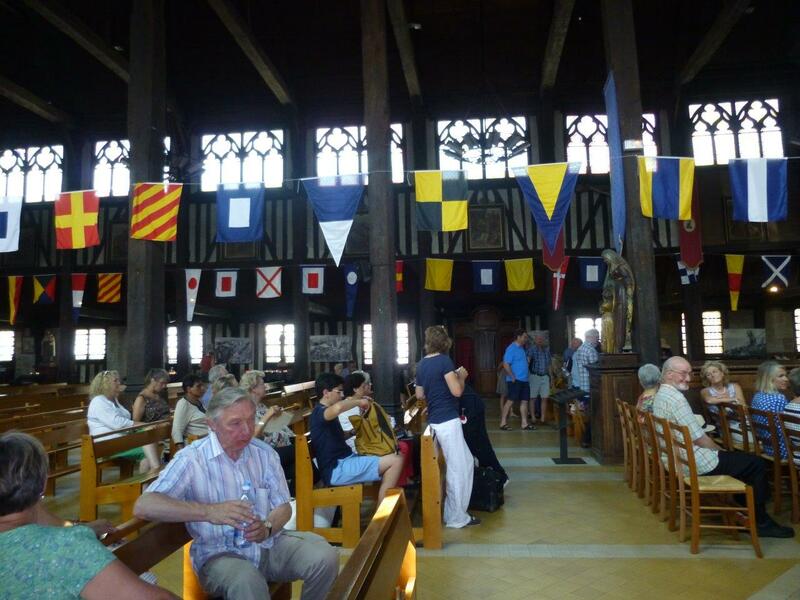 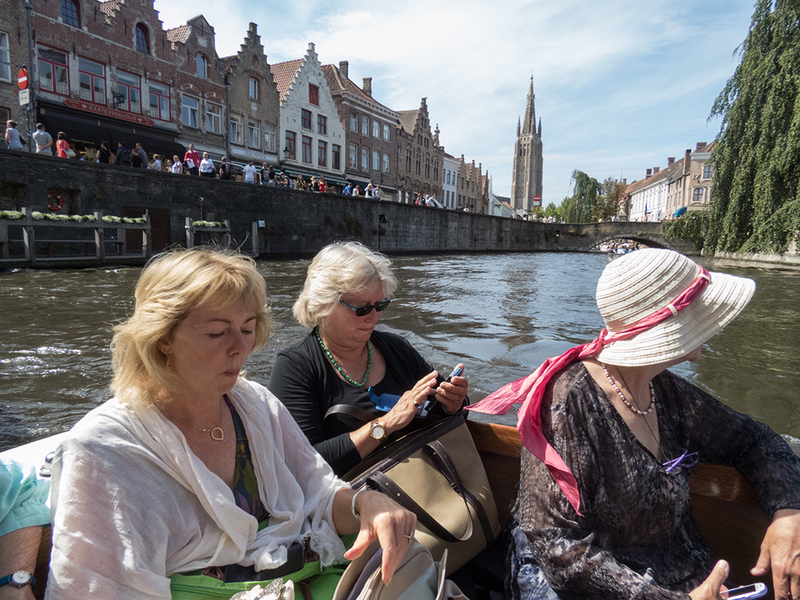 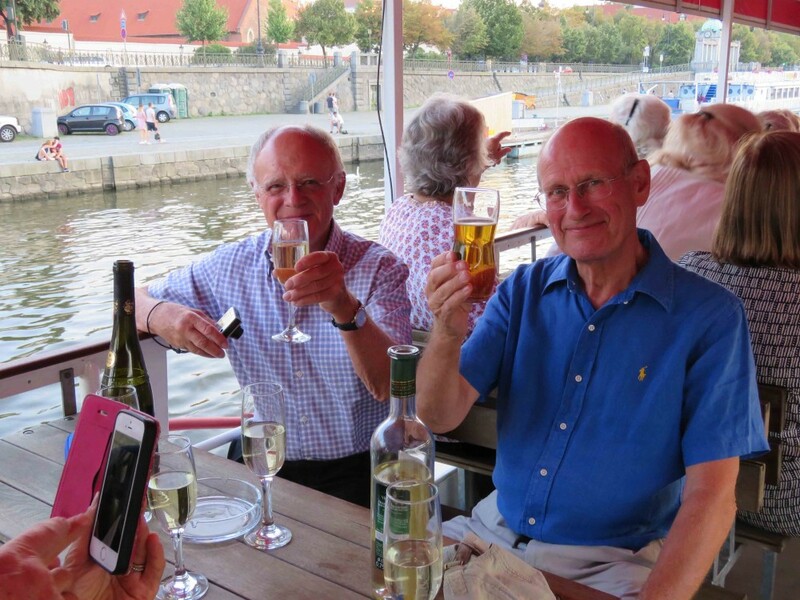 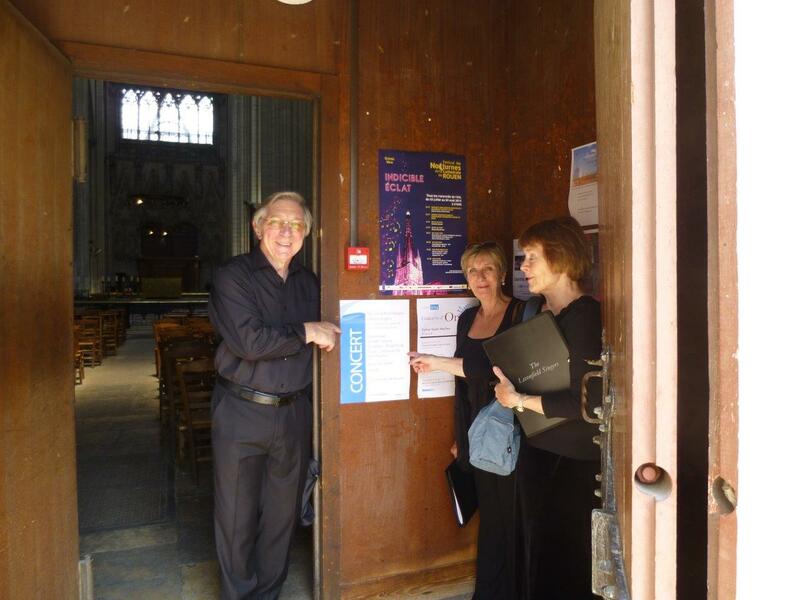 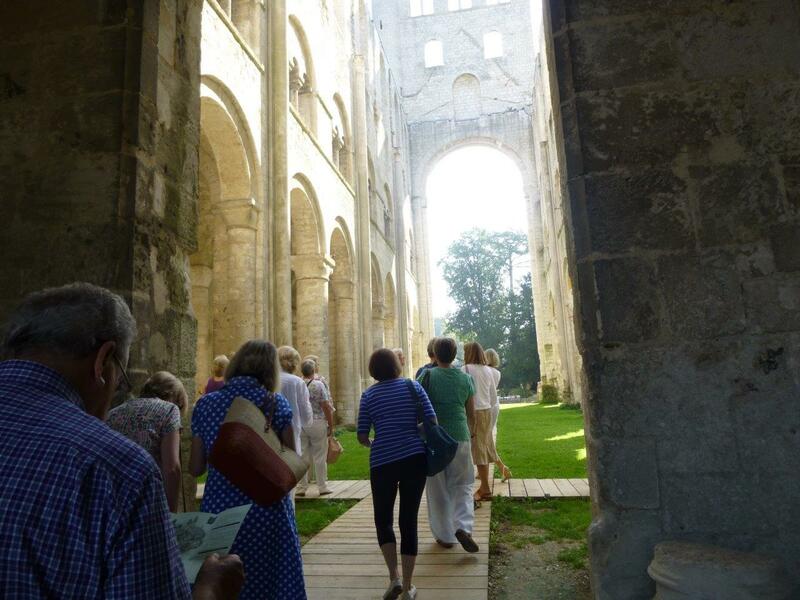 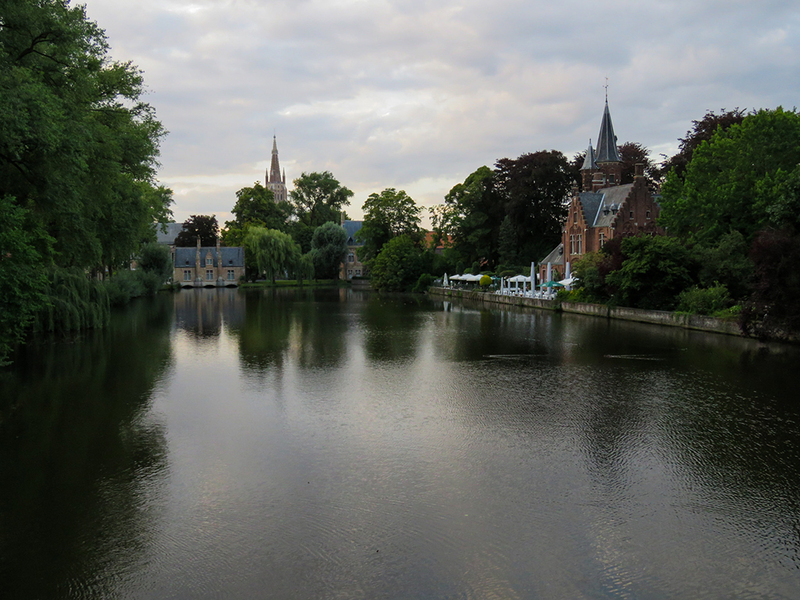 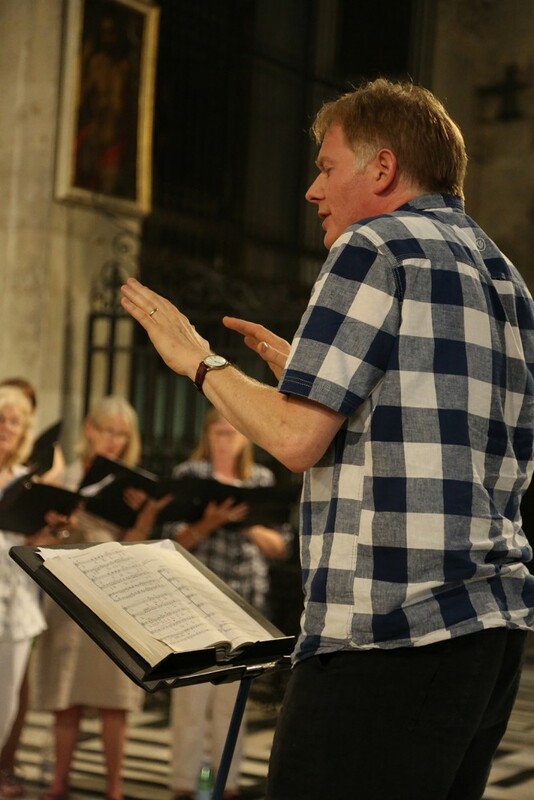 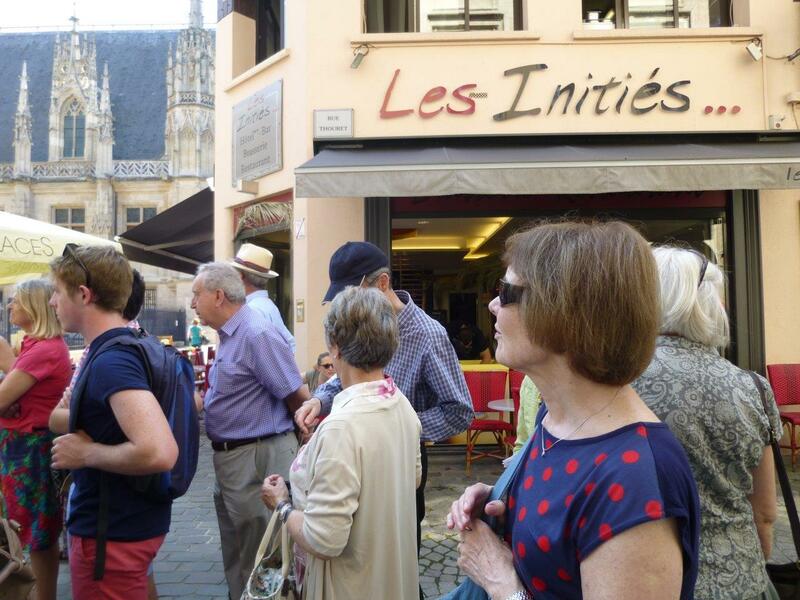 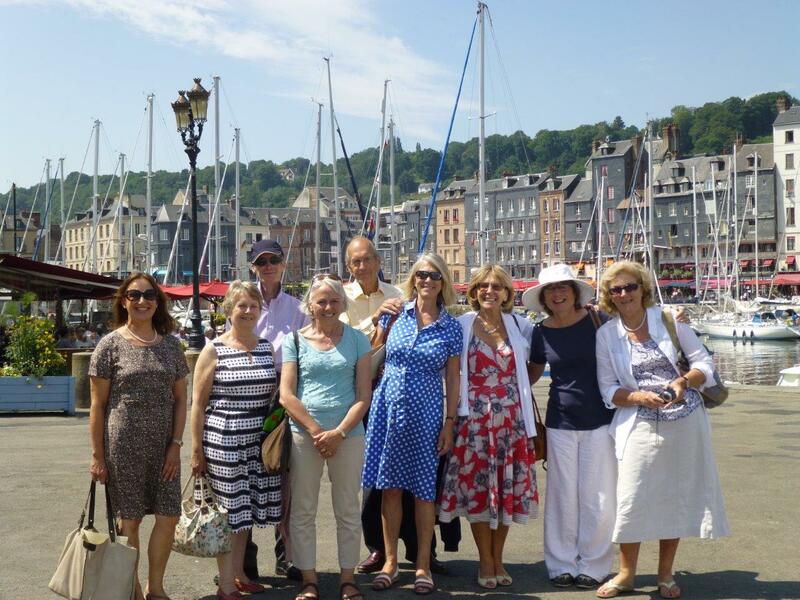 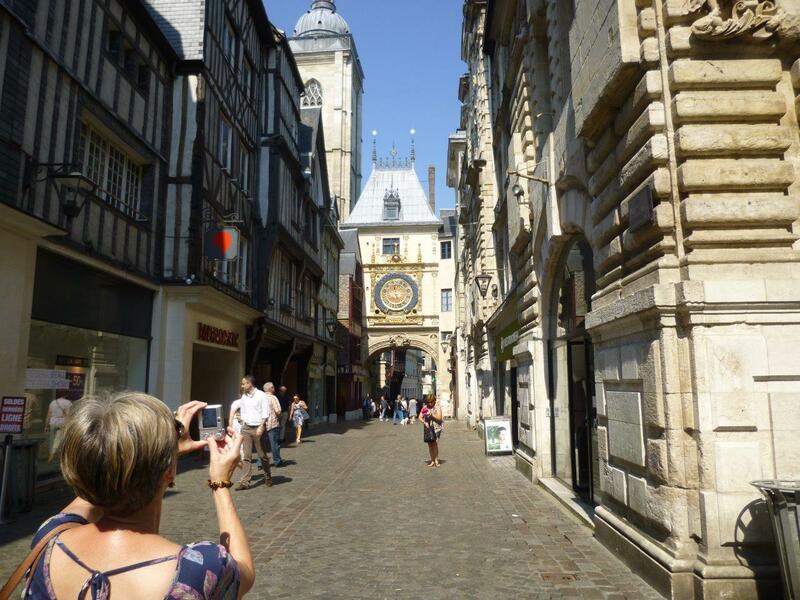 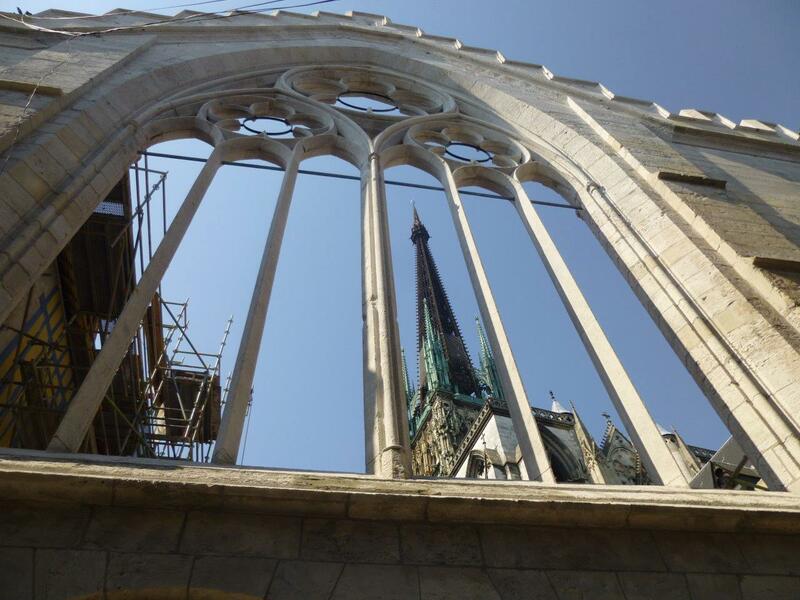 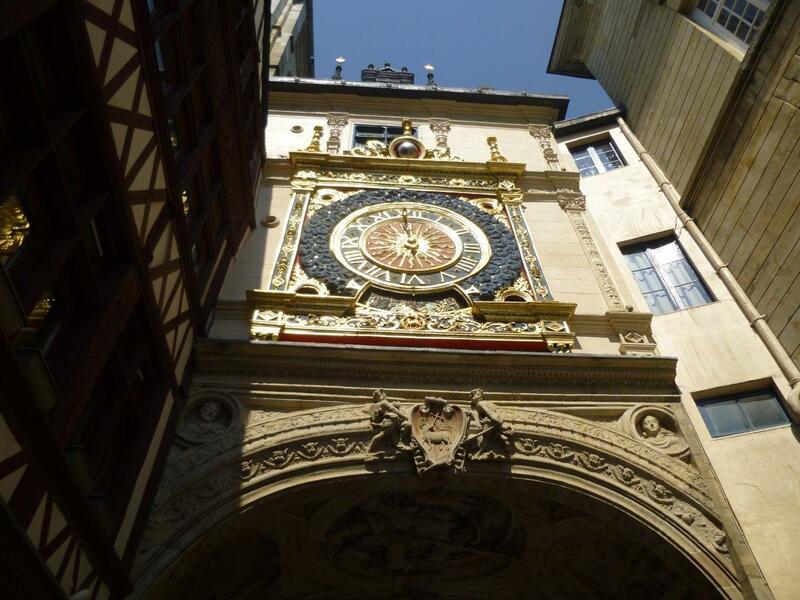 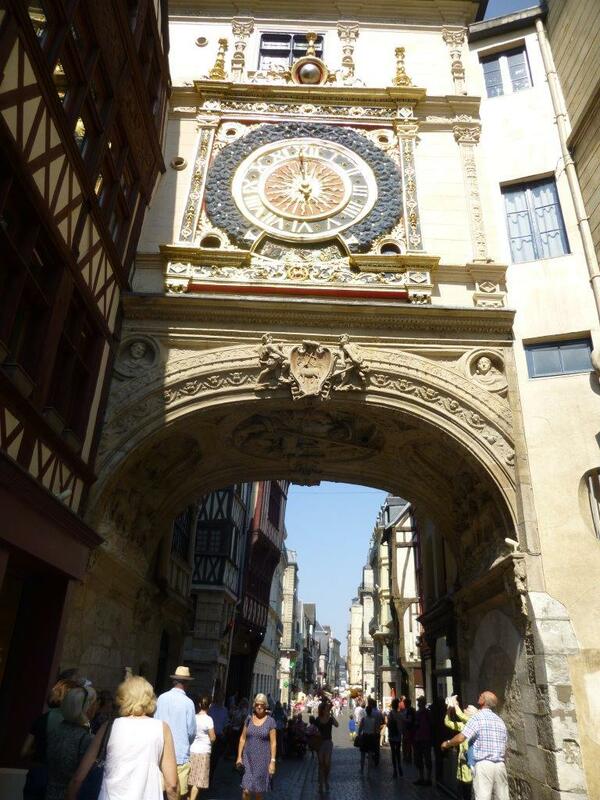 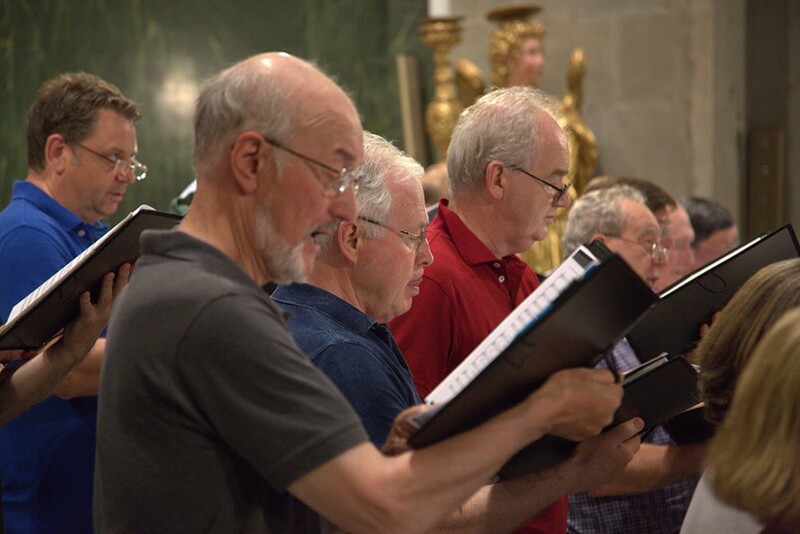 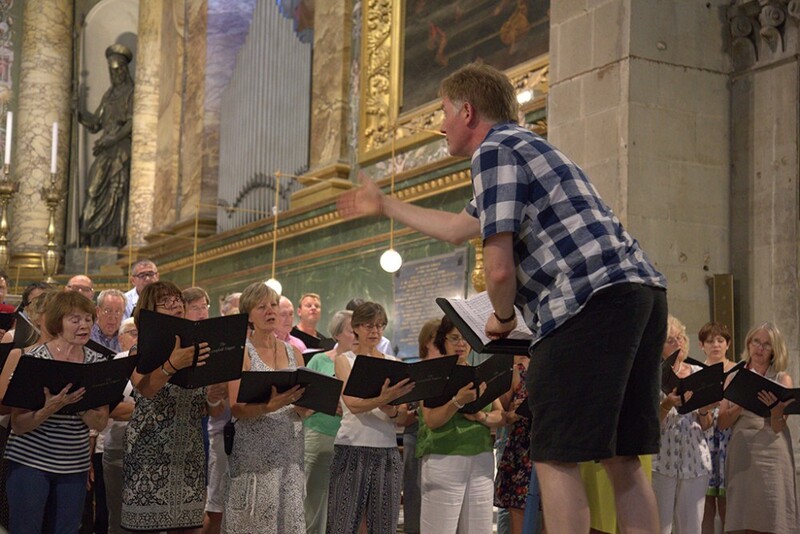 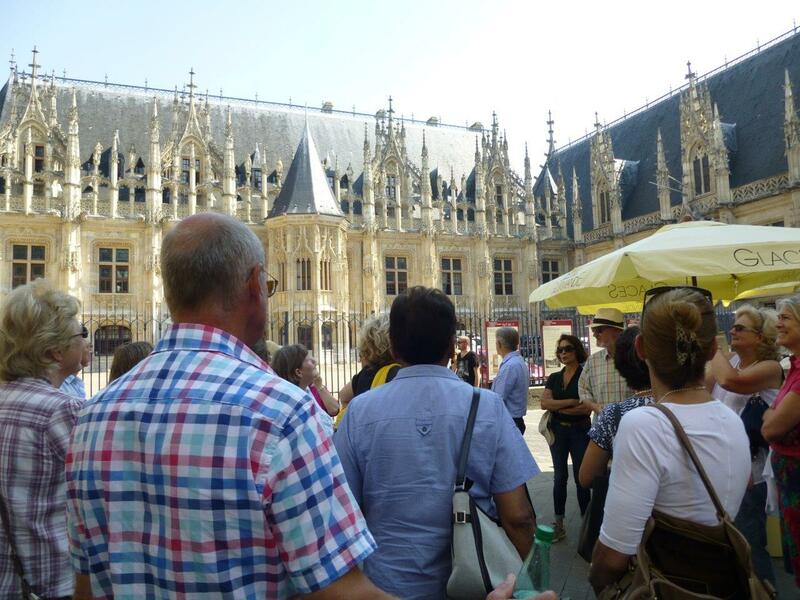 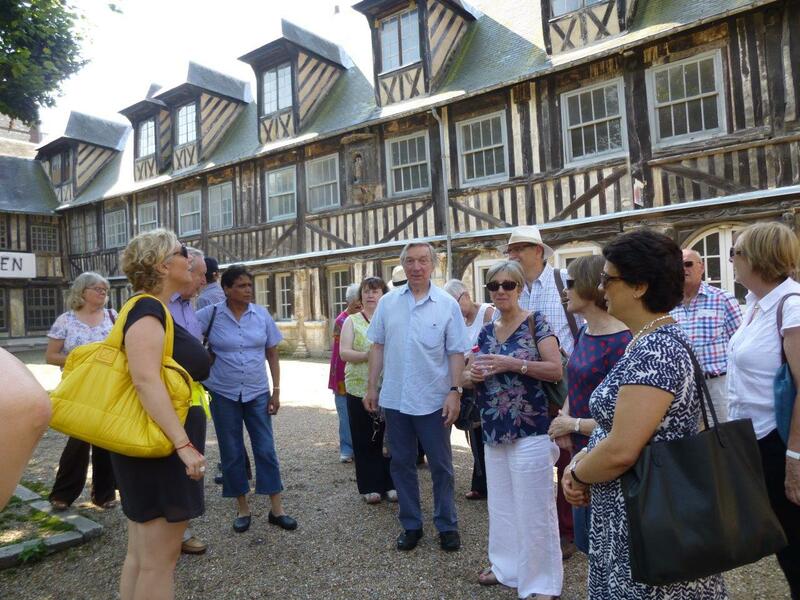 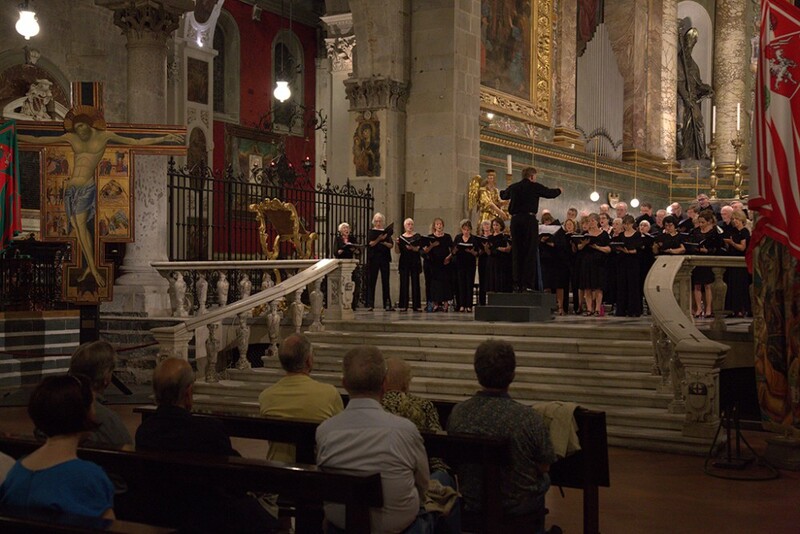 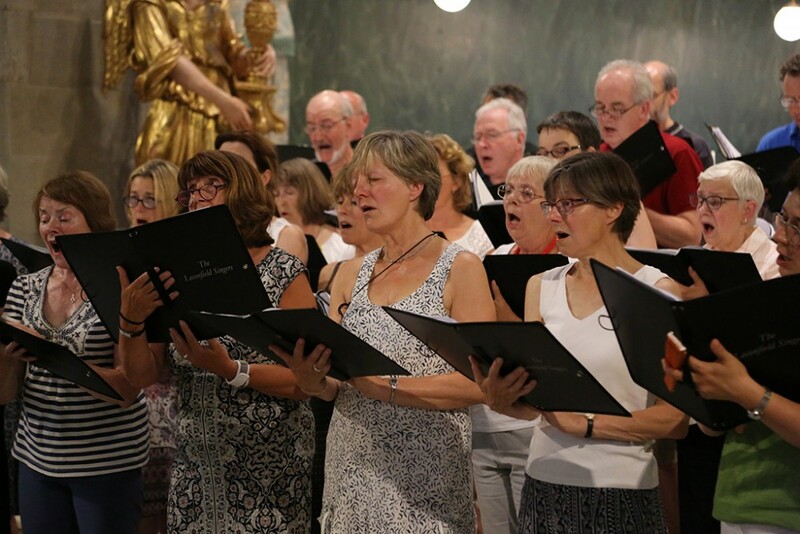 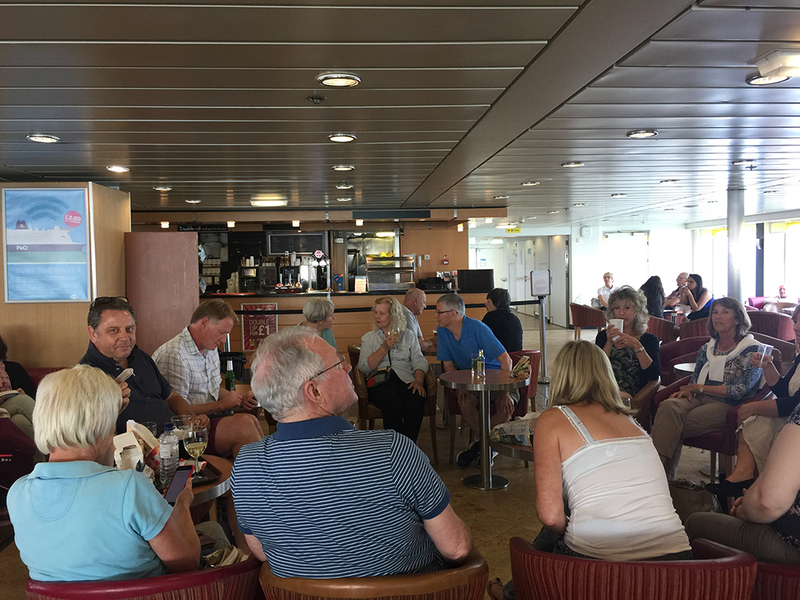 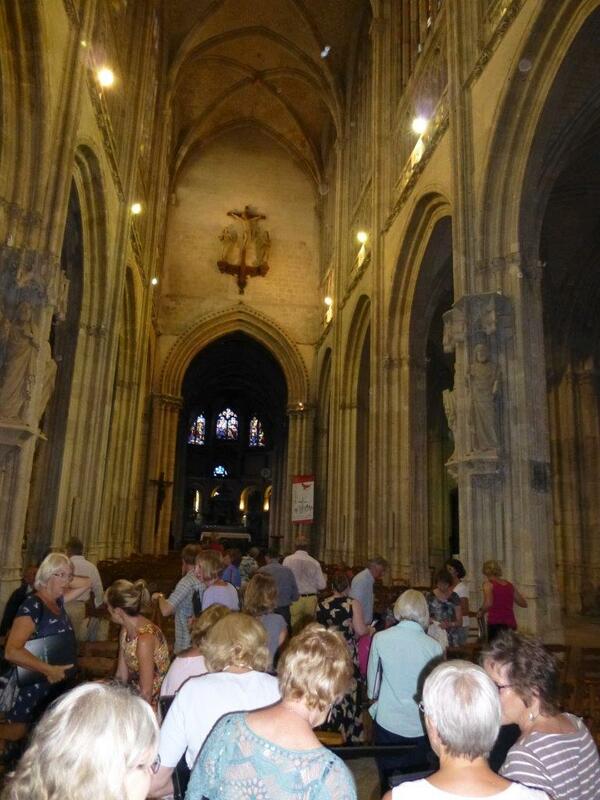 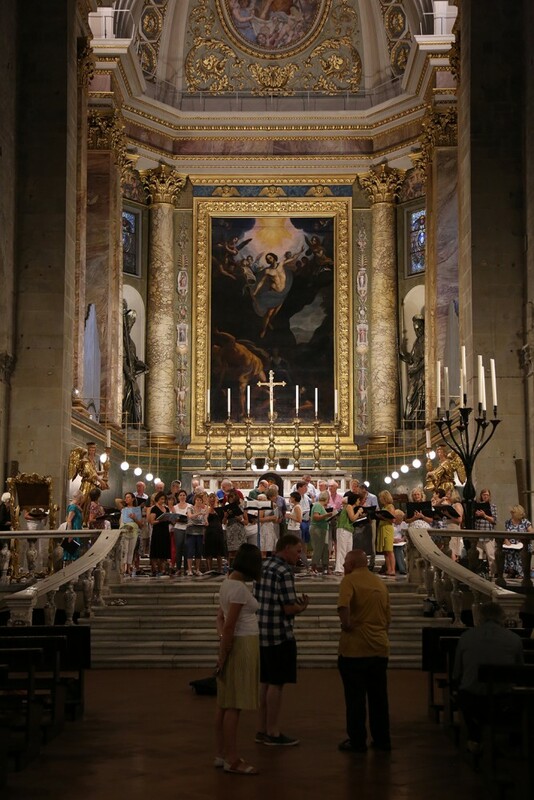 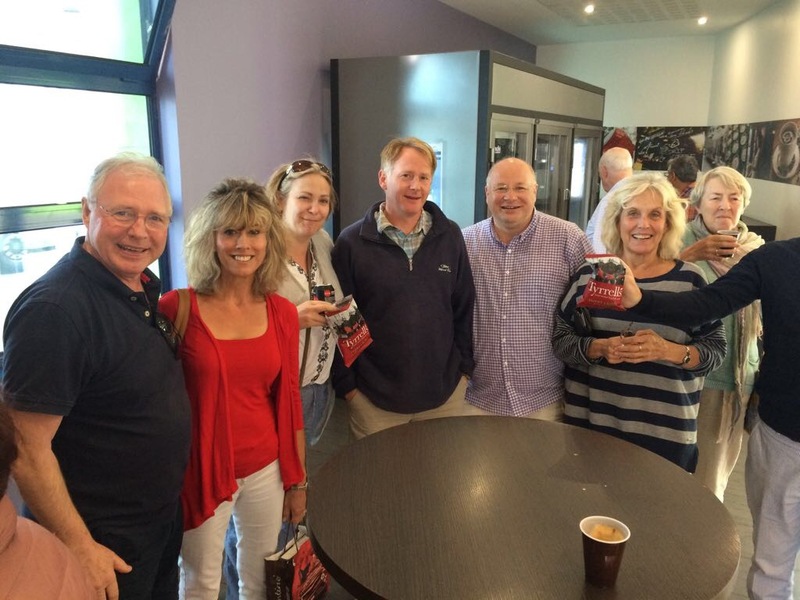 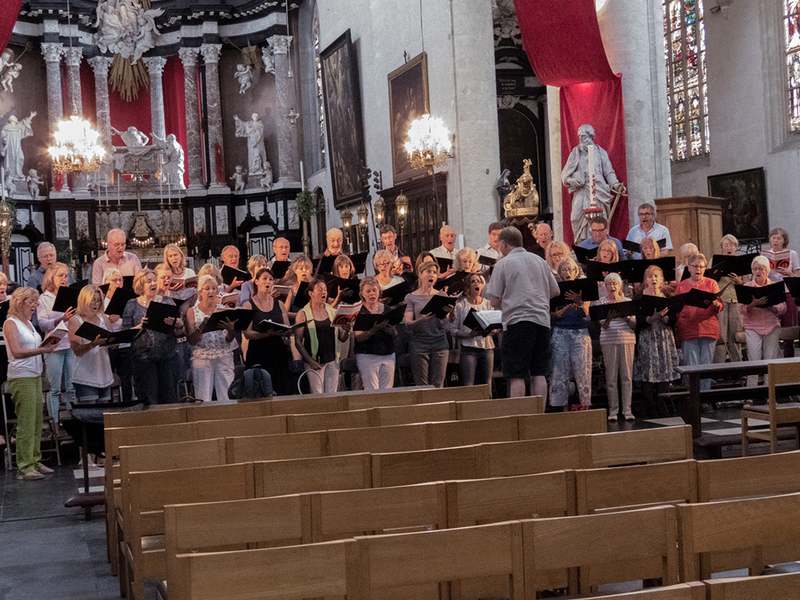 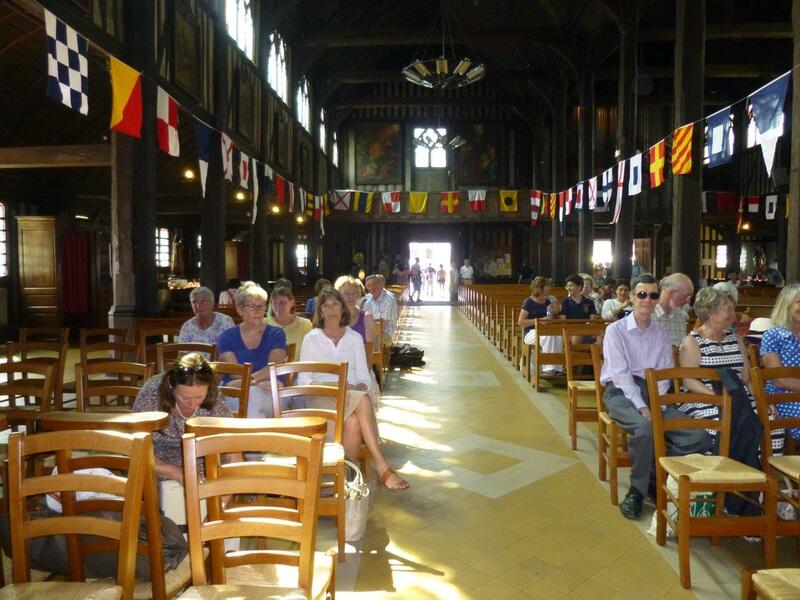 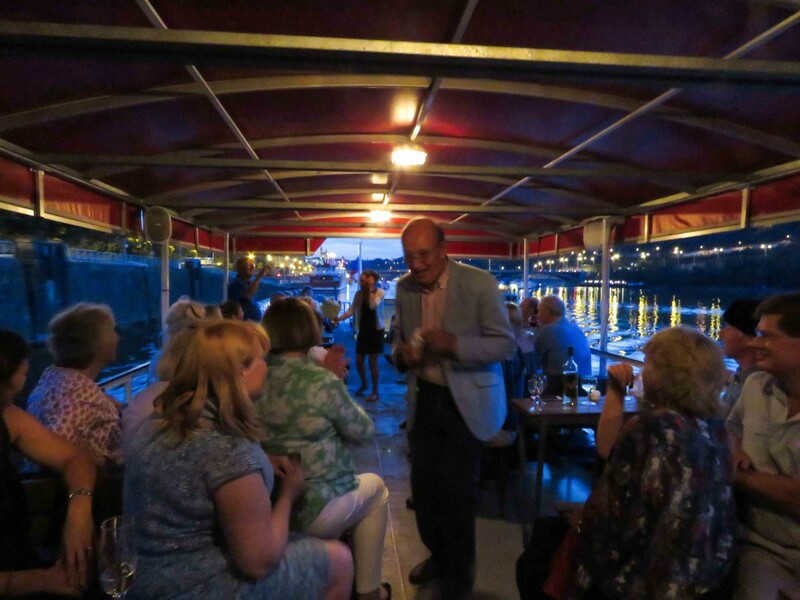 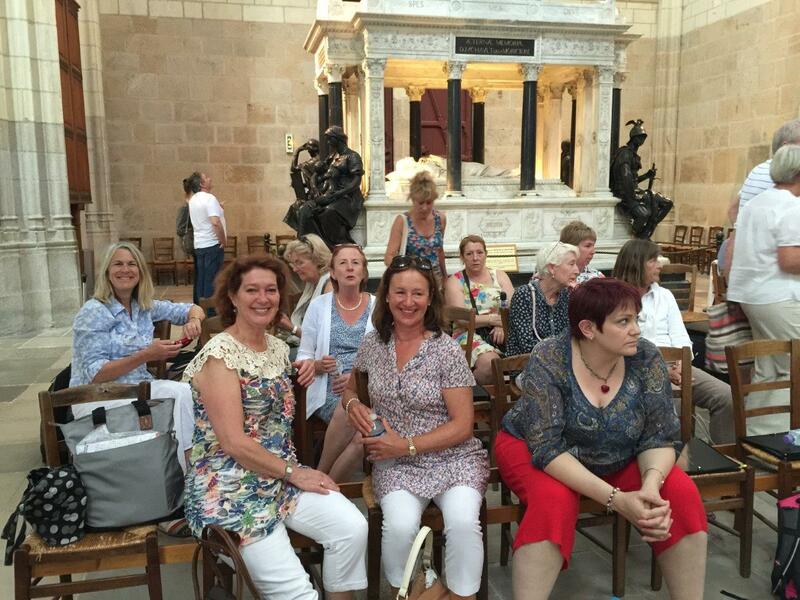 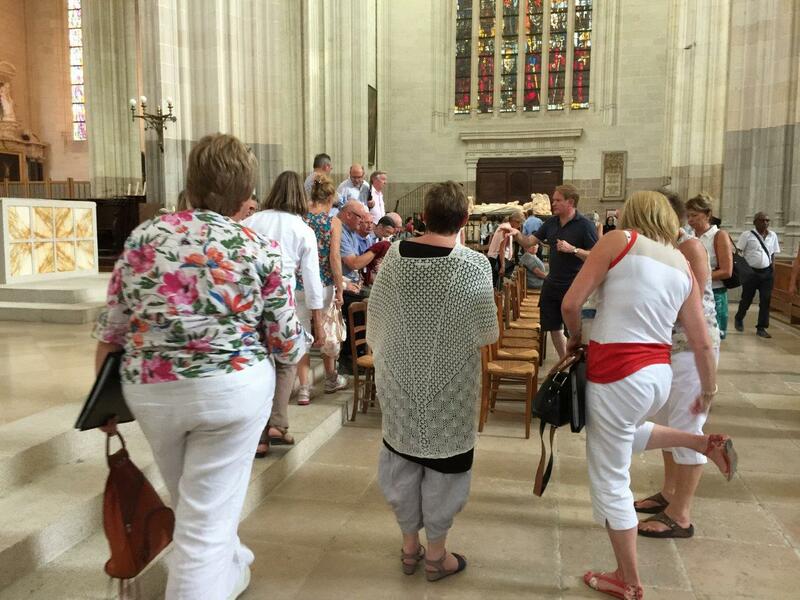 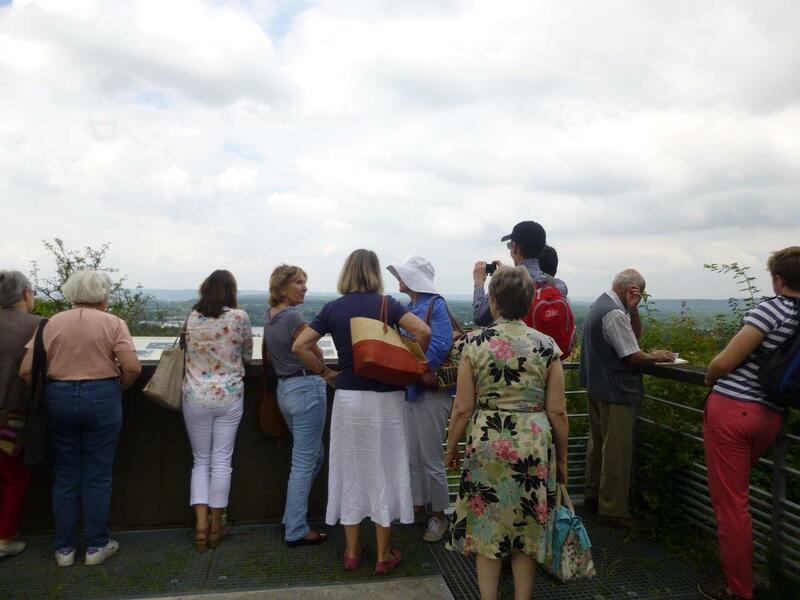 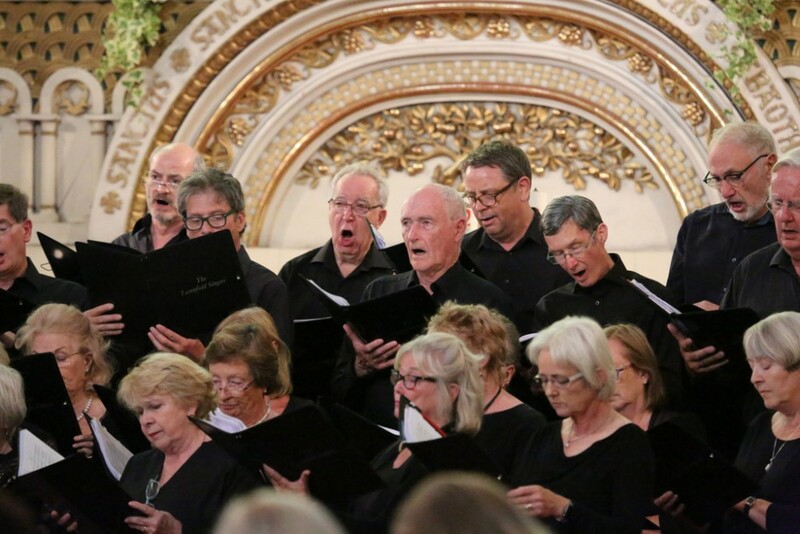 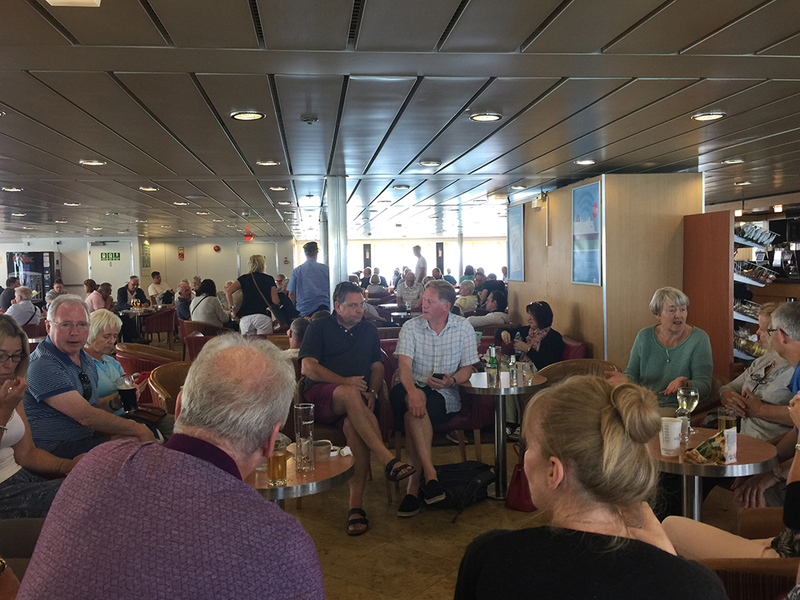 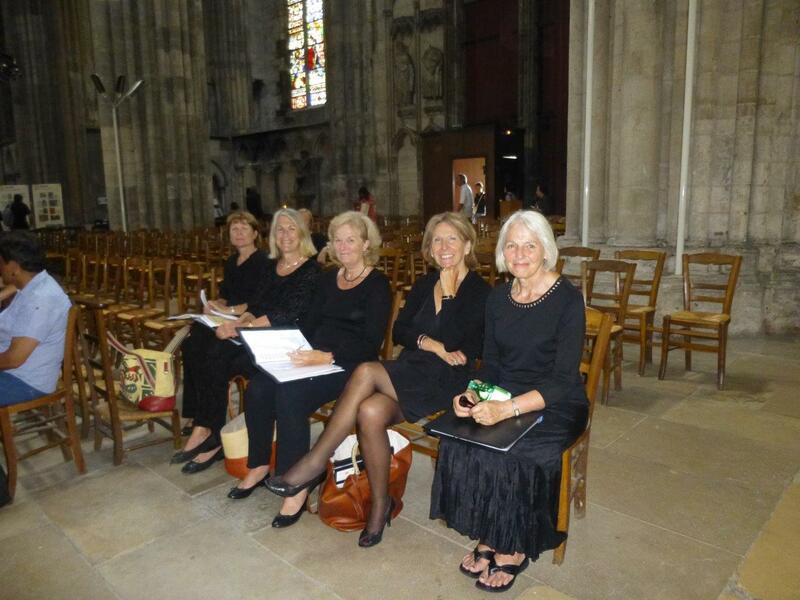 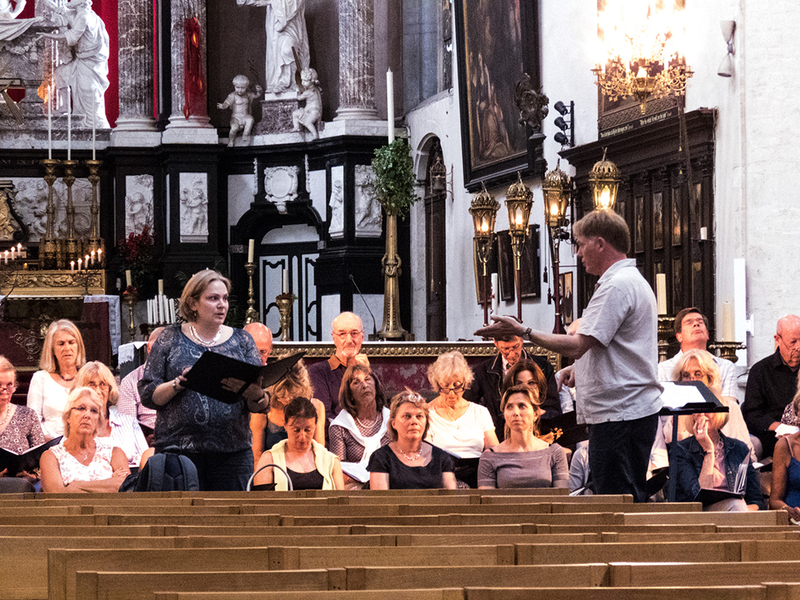 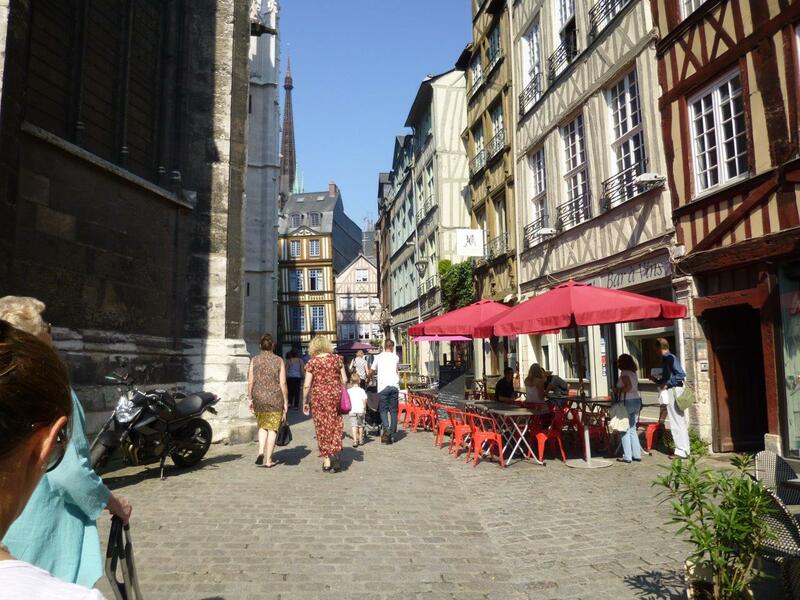 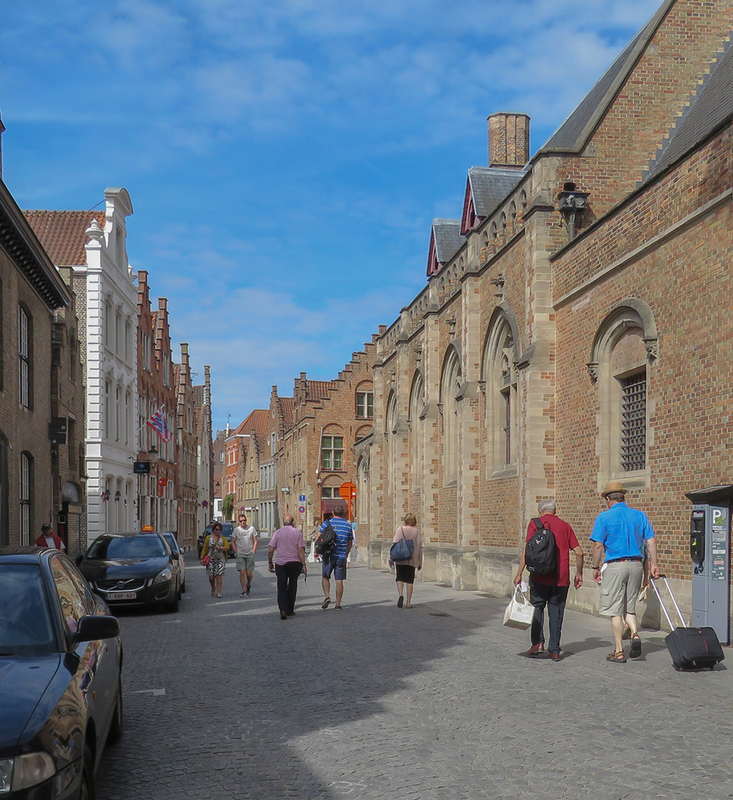 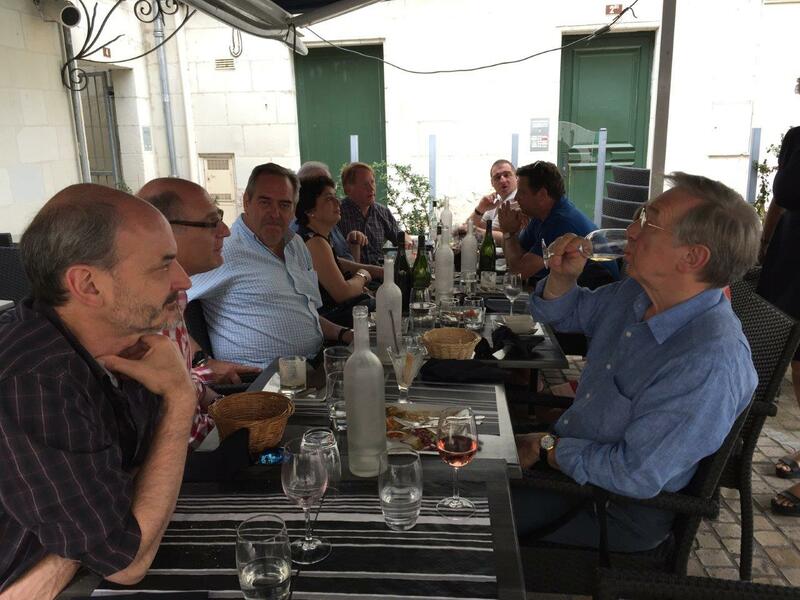 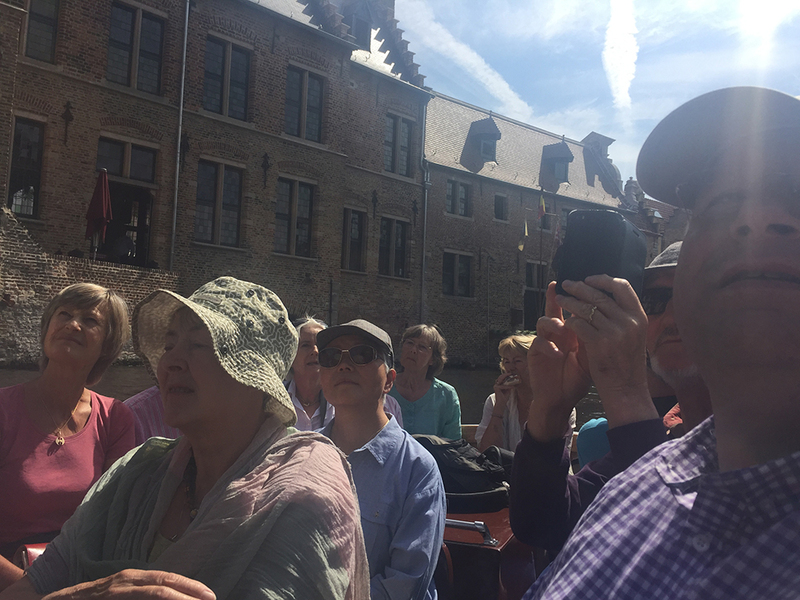 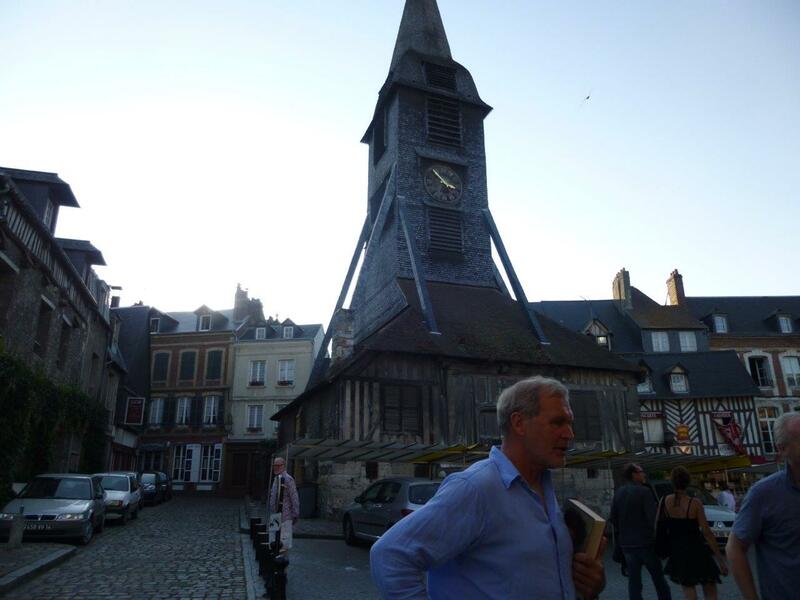 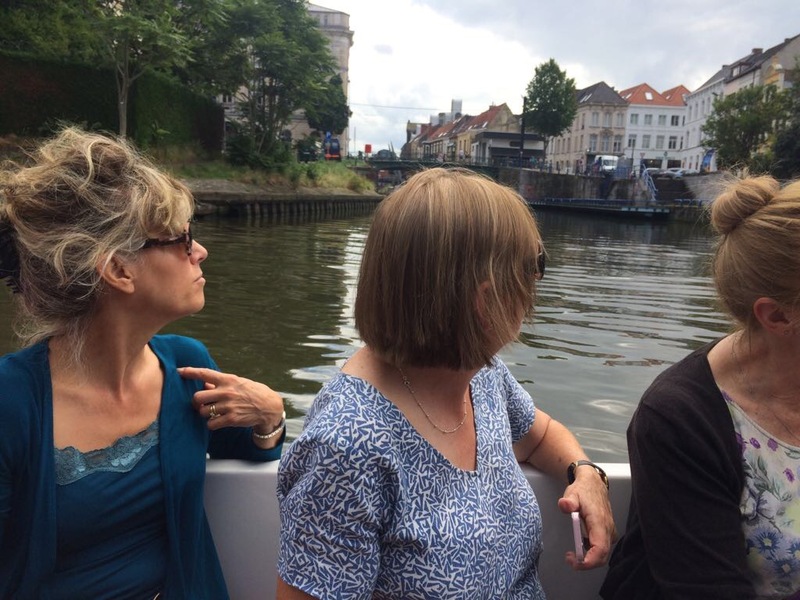 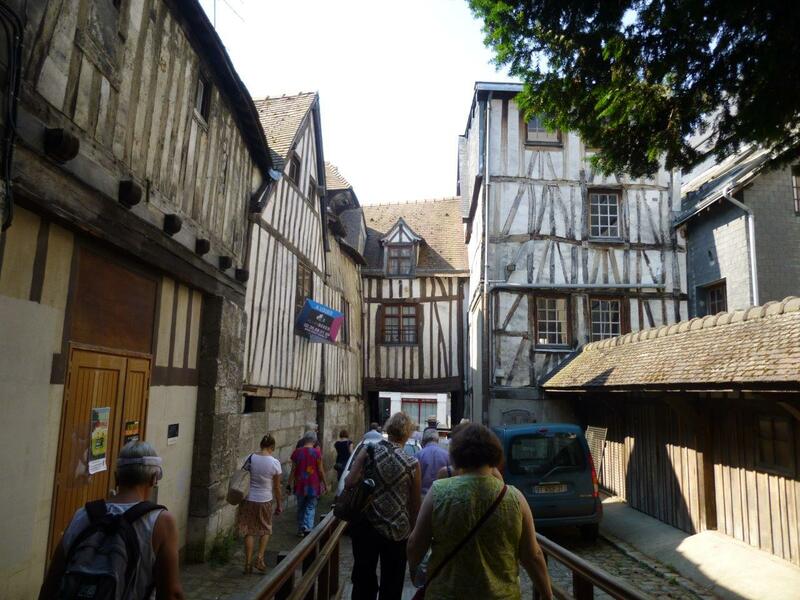 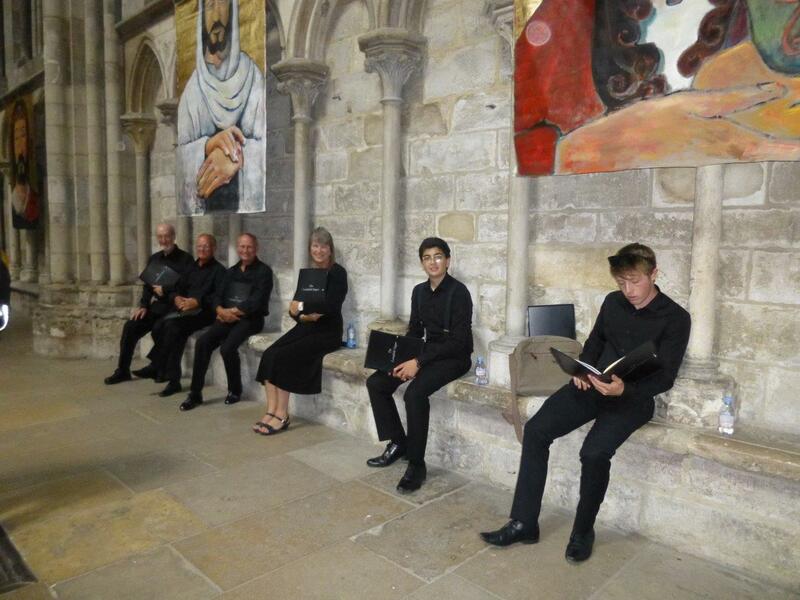 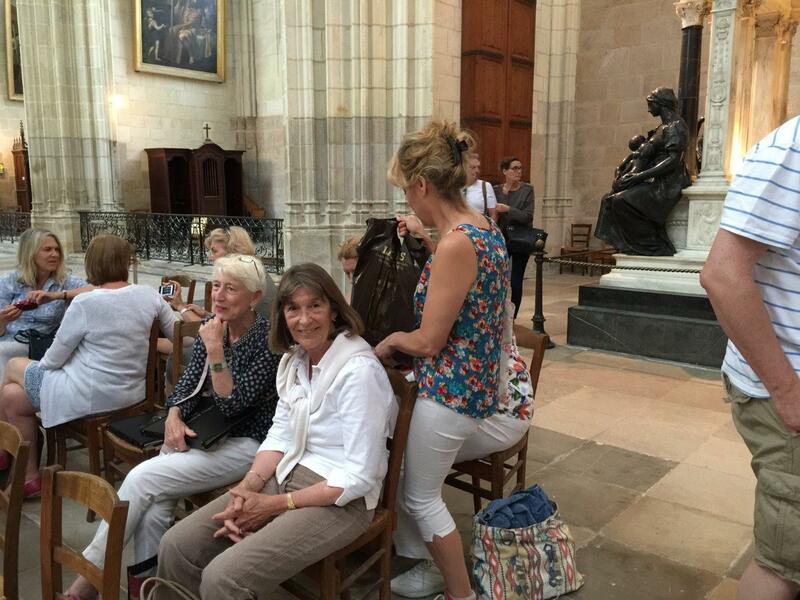 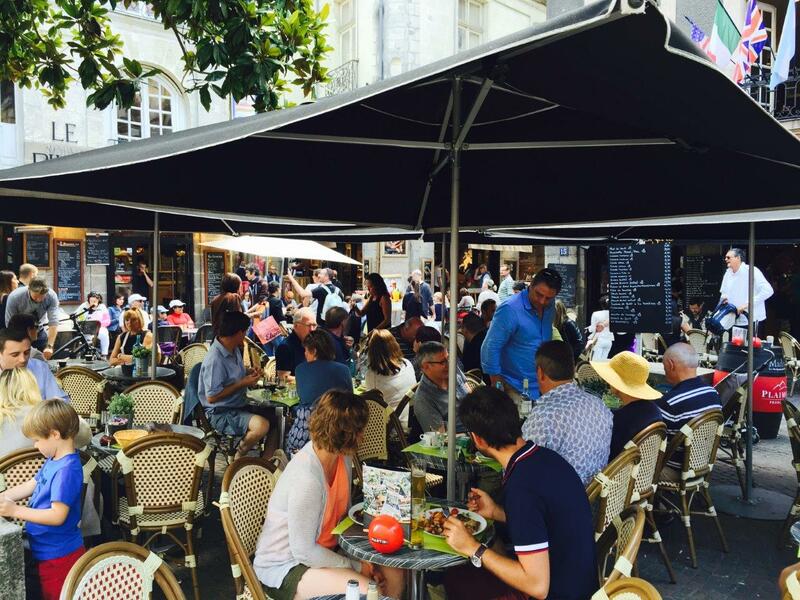 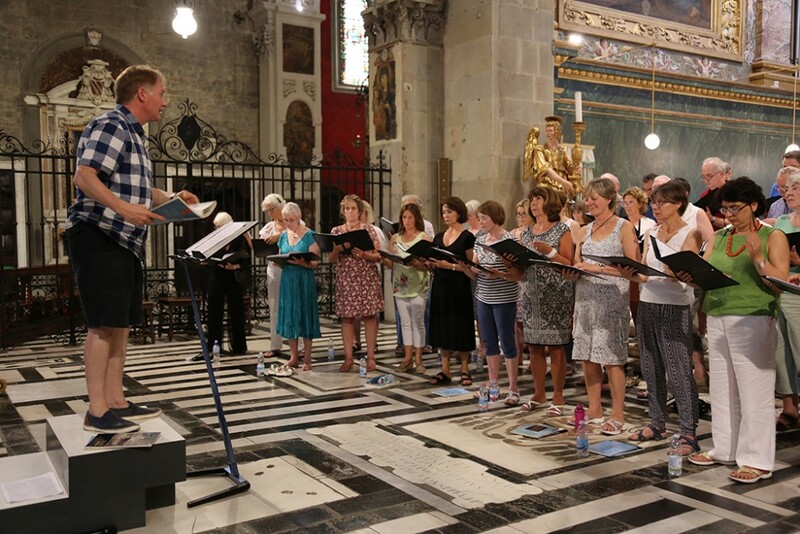 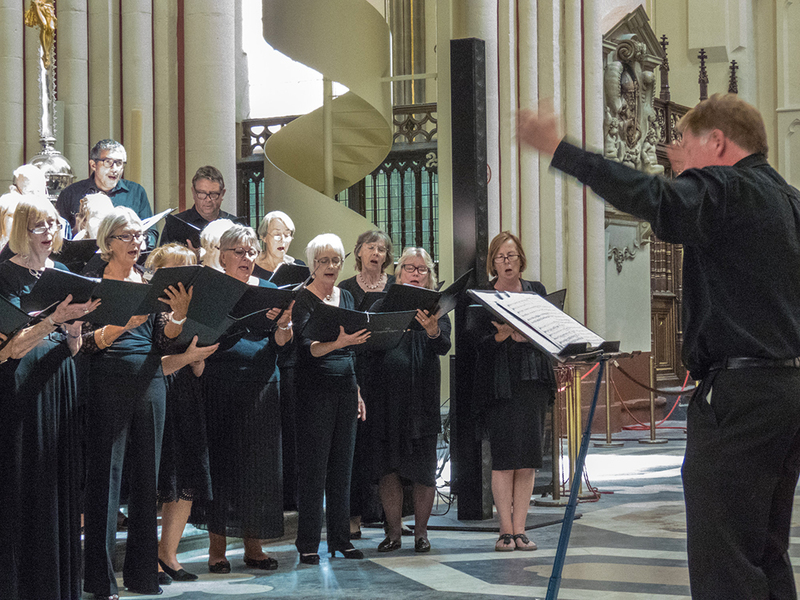 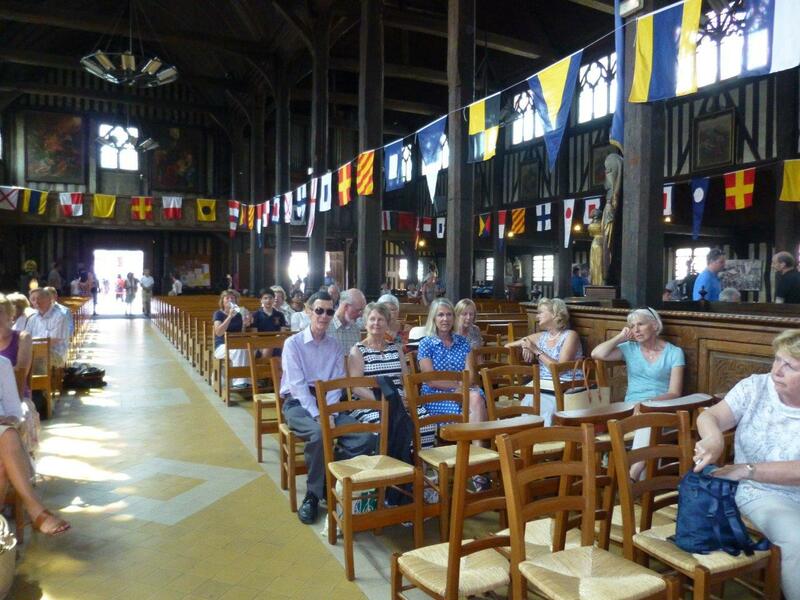 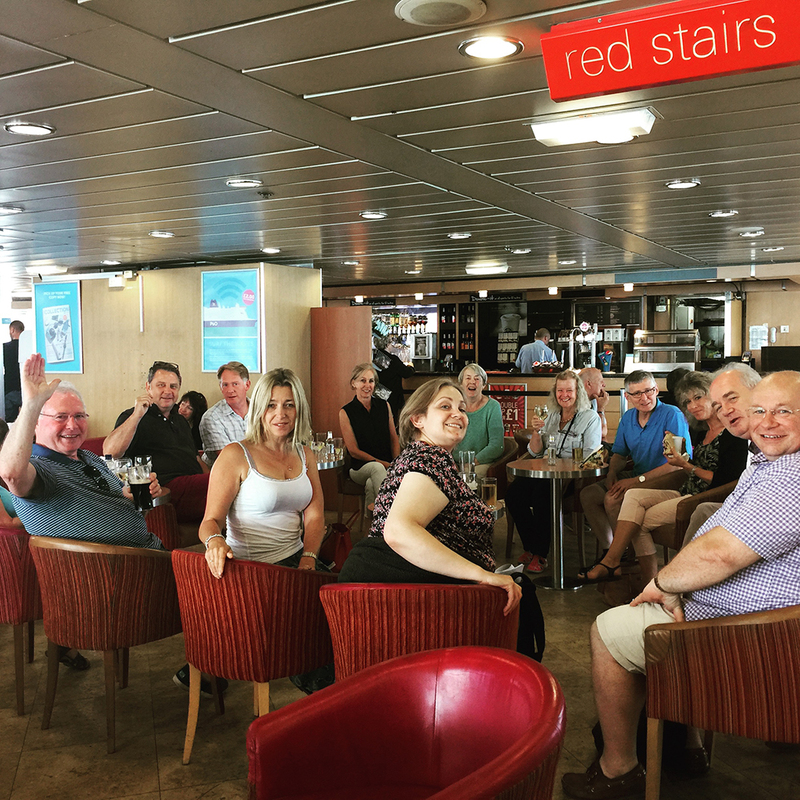 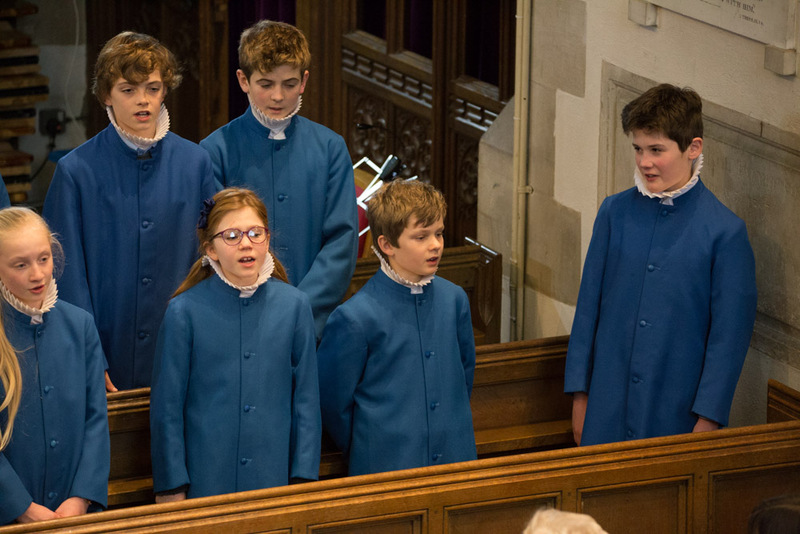 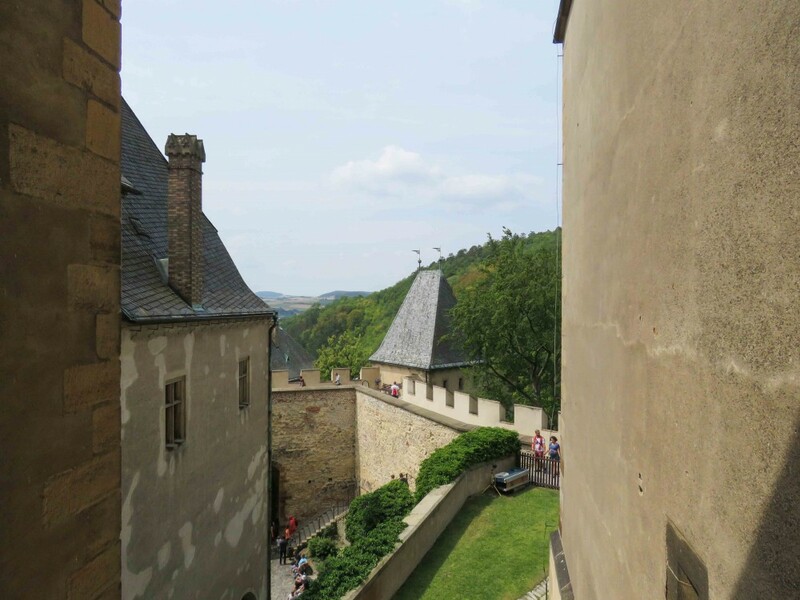 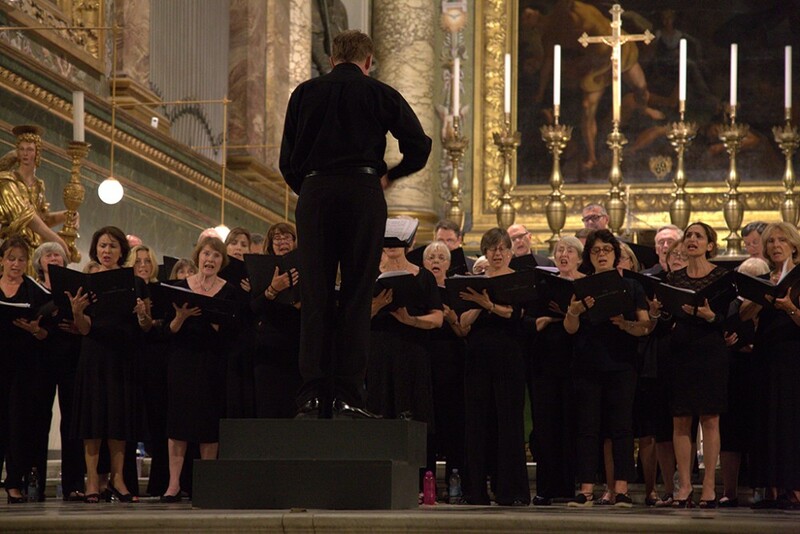 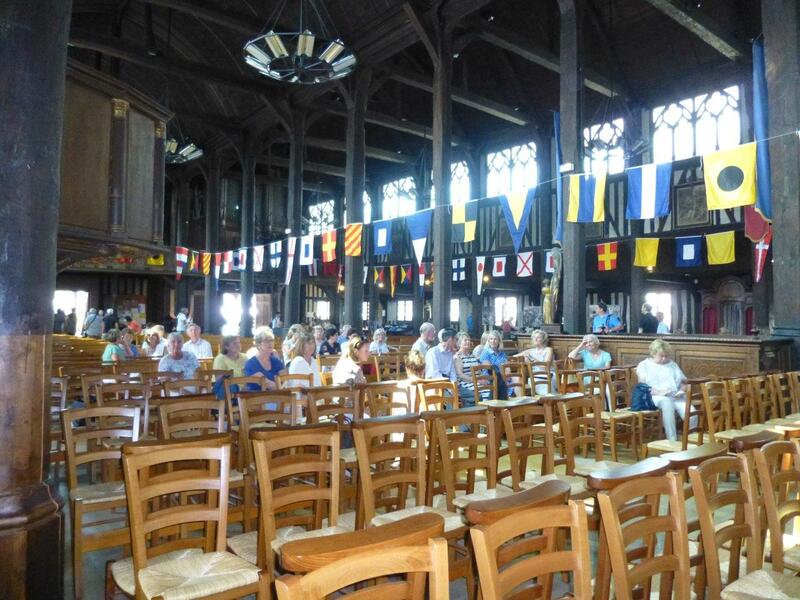 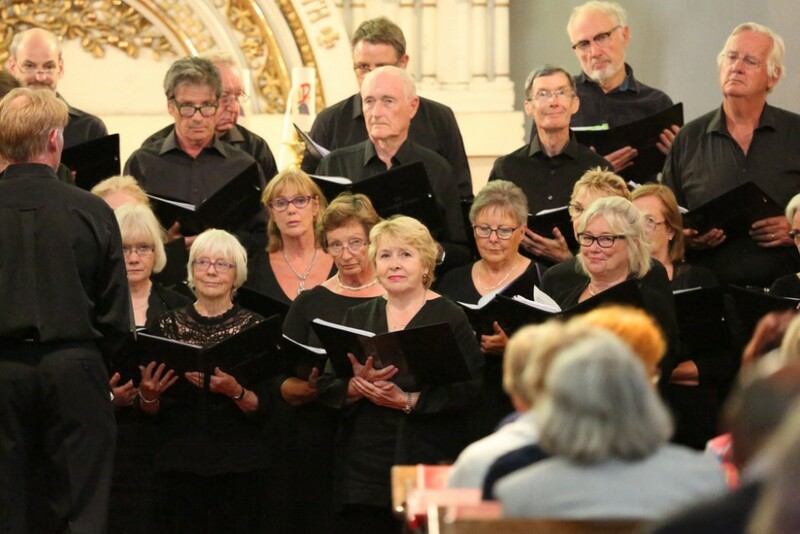 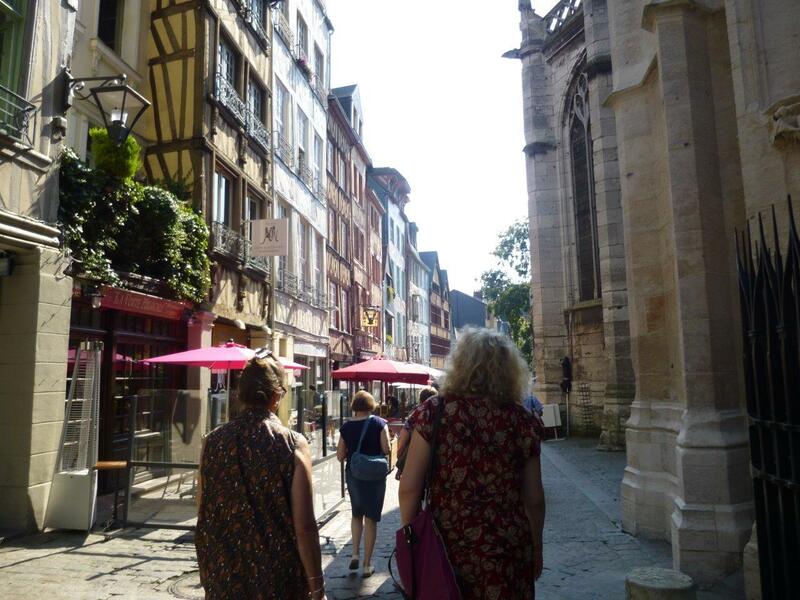 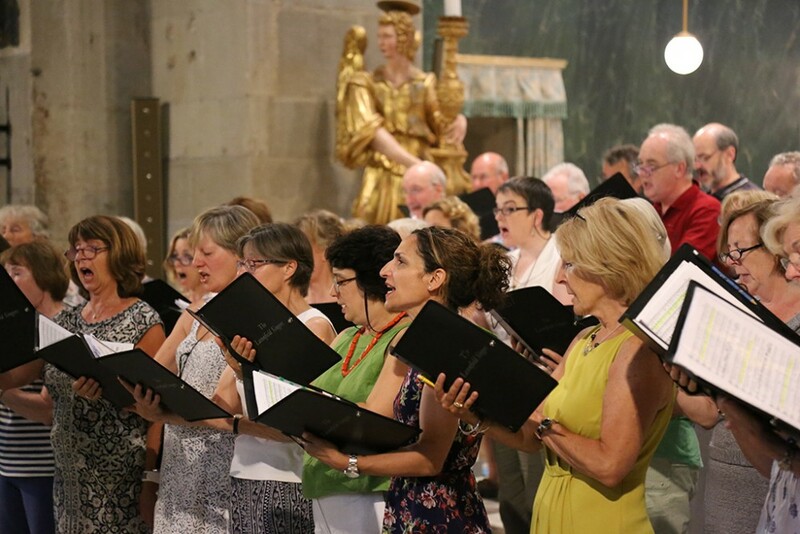 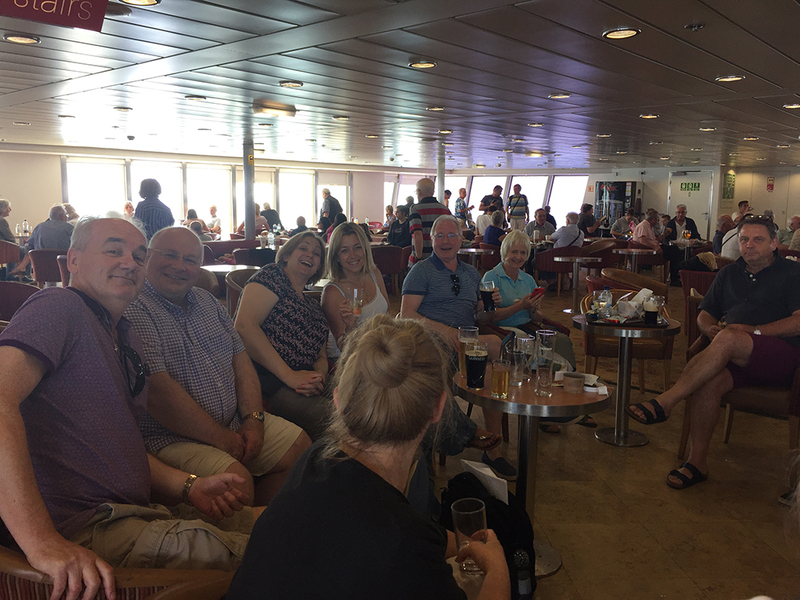 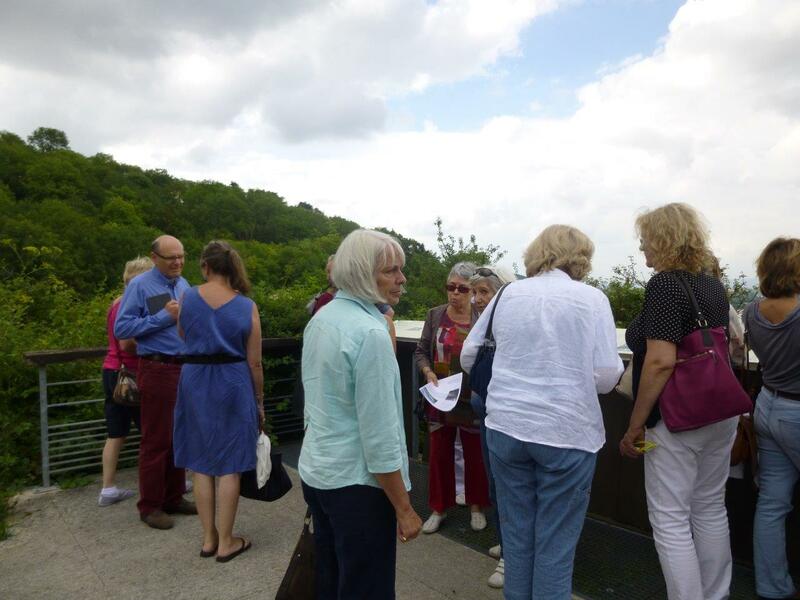 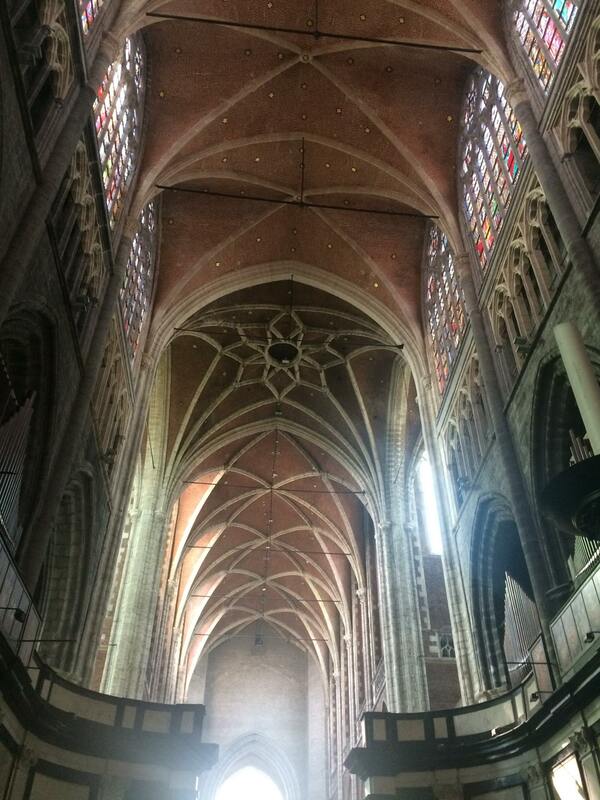 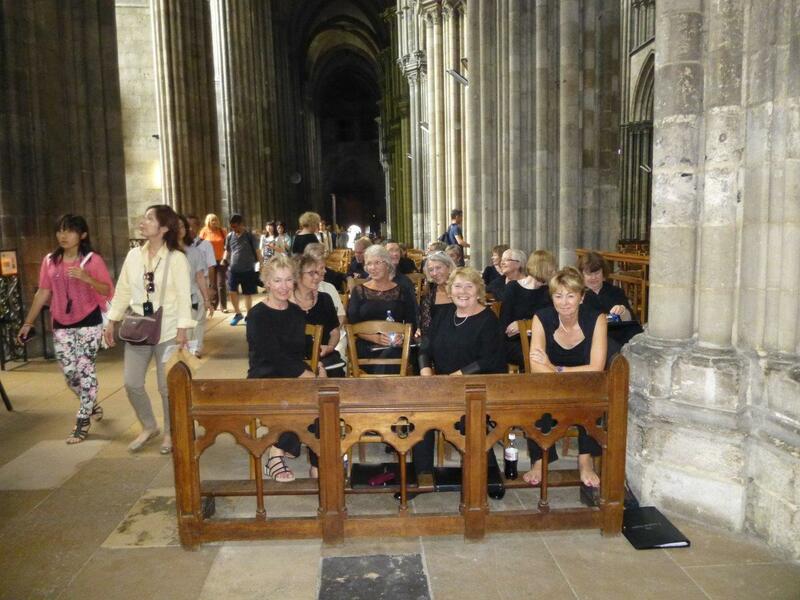 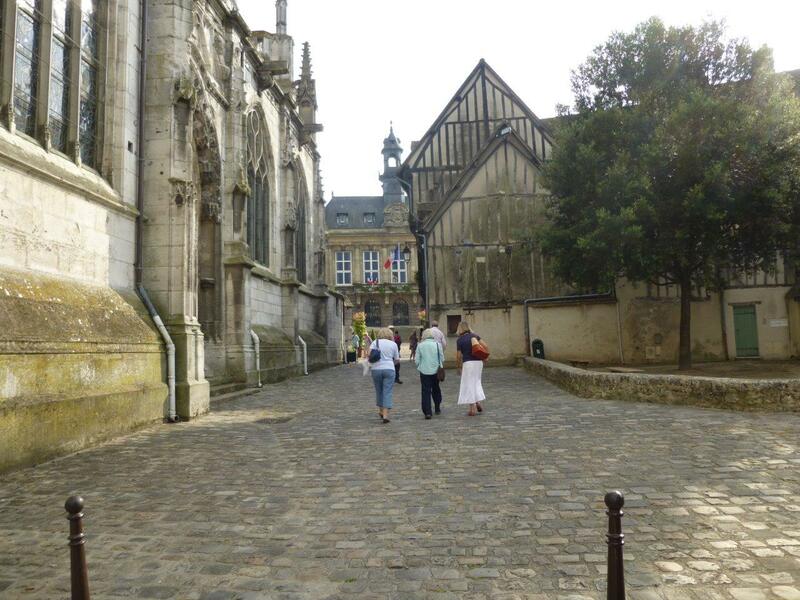 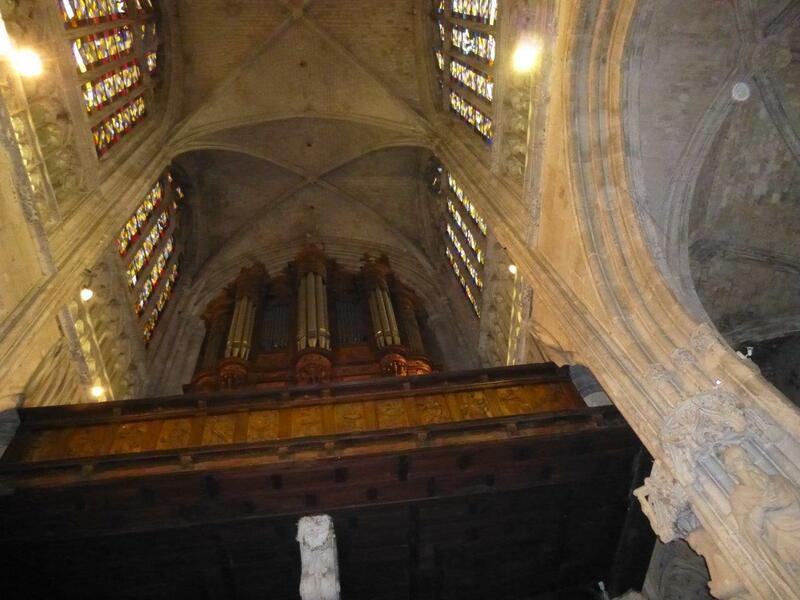 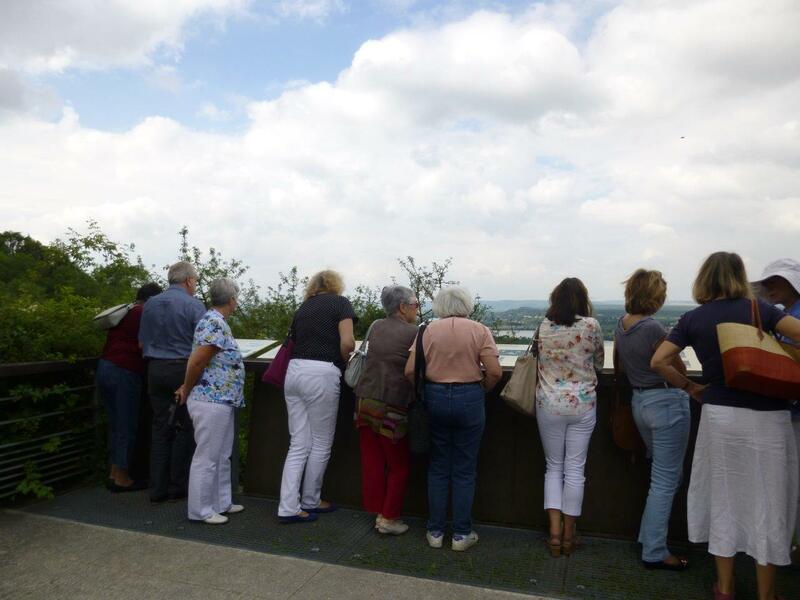 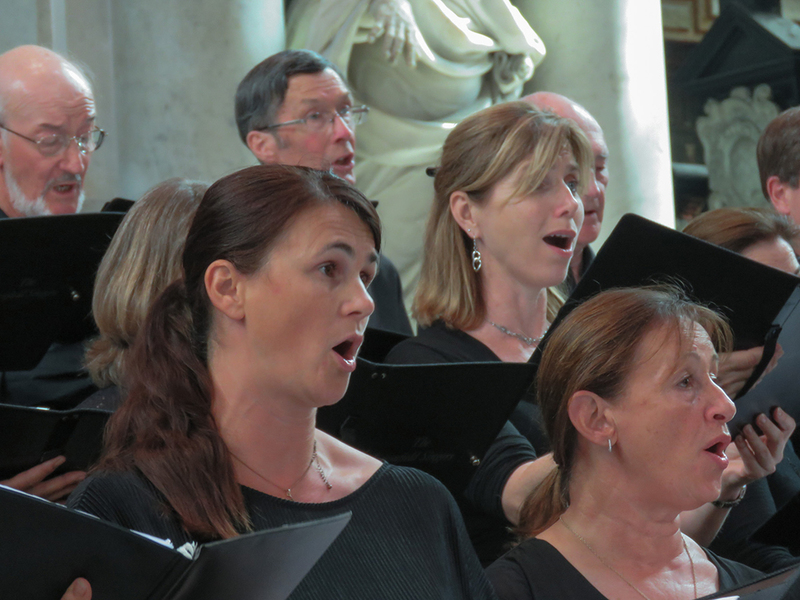 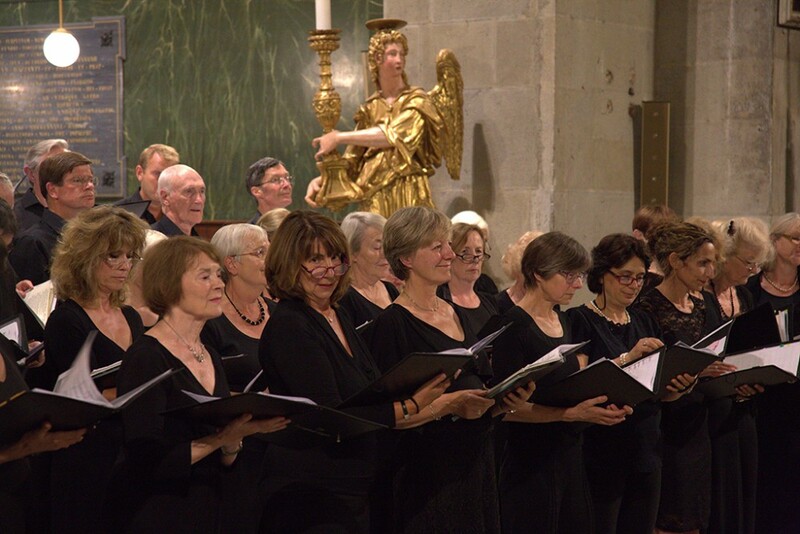 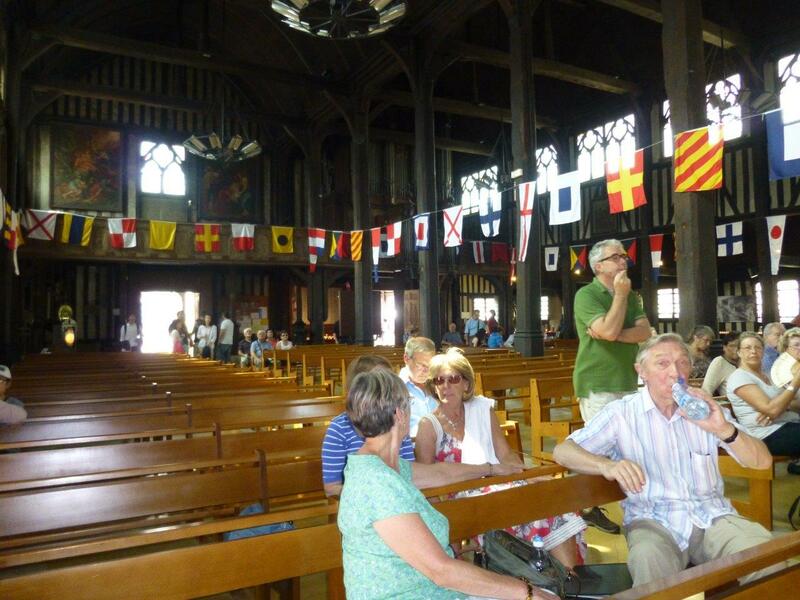 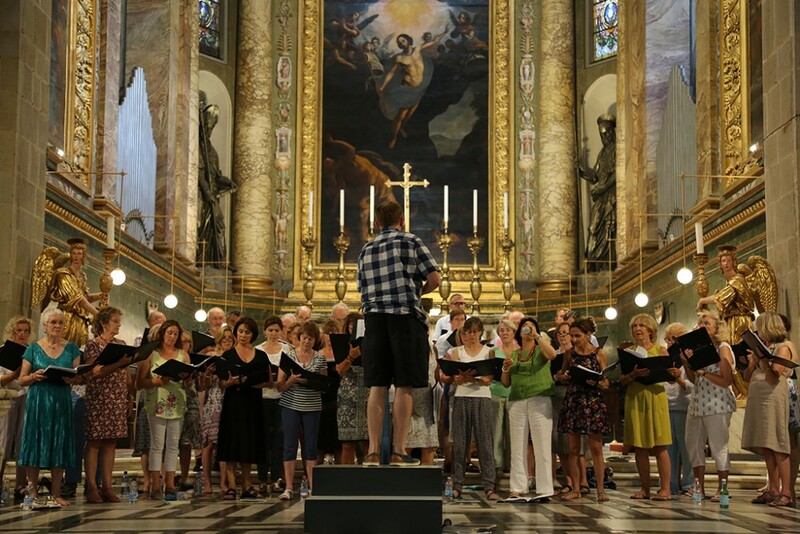 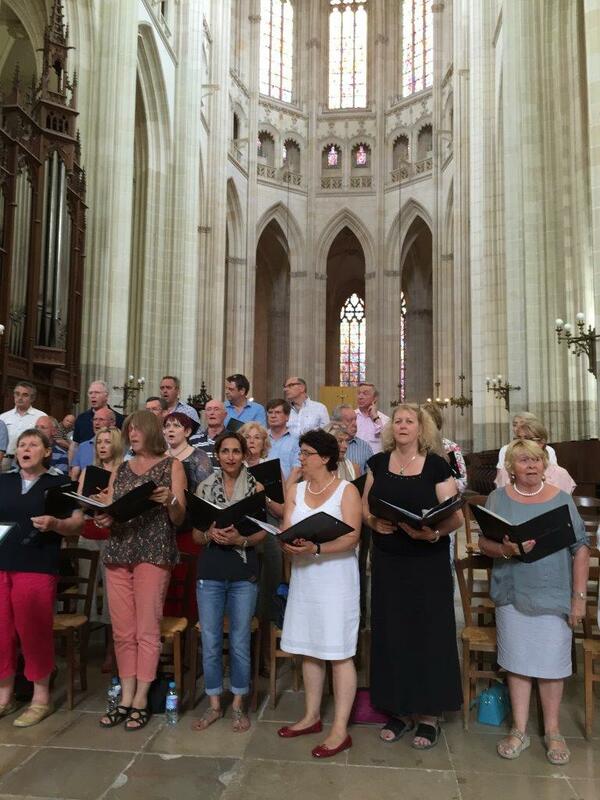 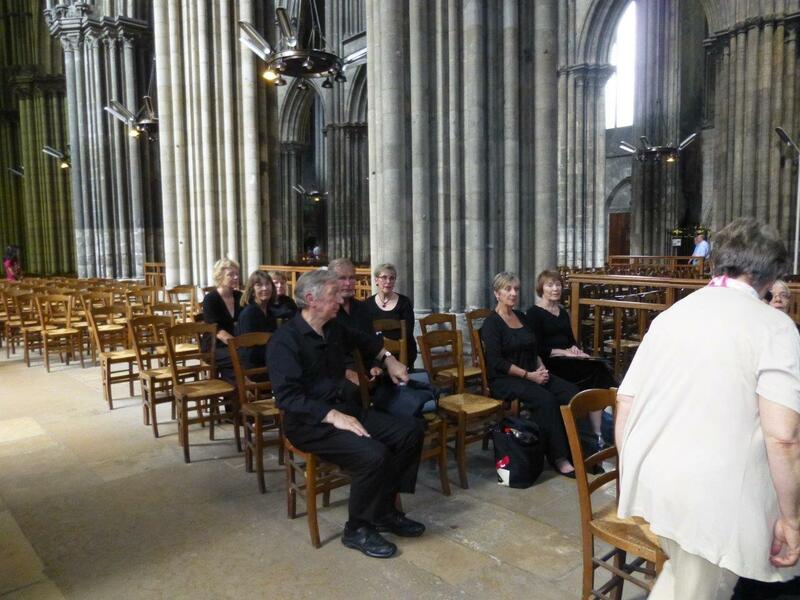 In the Summer of 2014 we set off to Normandy and were lucky enough to sing in Rouen Cathedral as well as the iconic church in Honfleur and also Vernon. 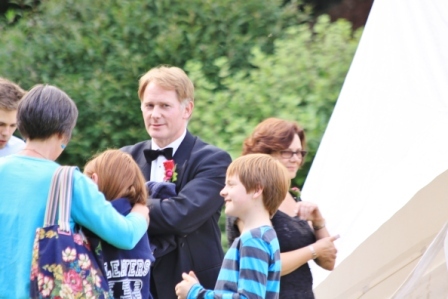 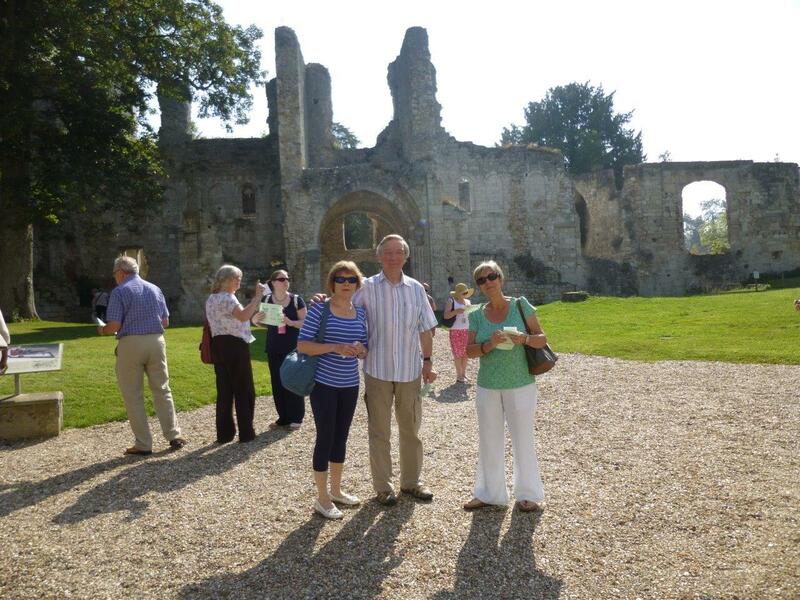 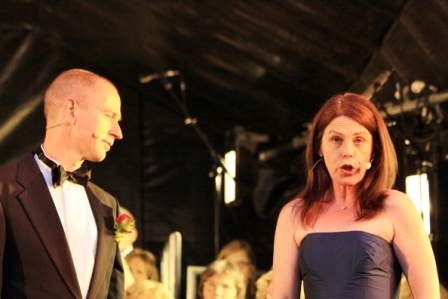 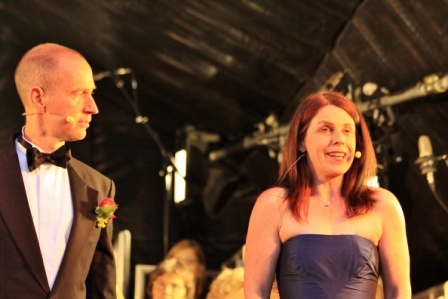 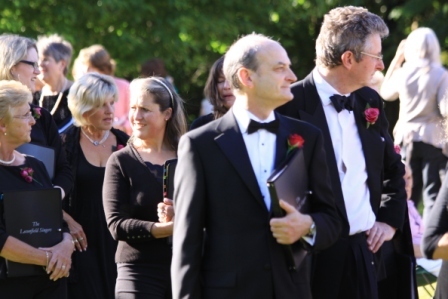 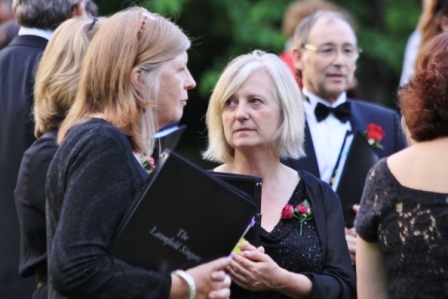 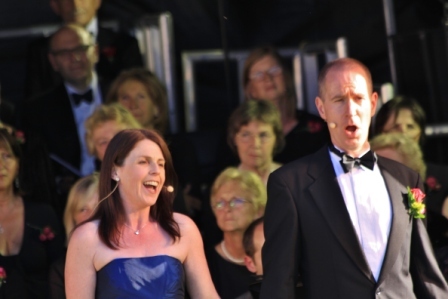 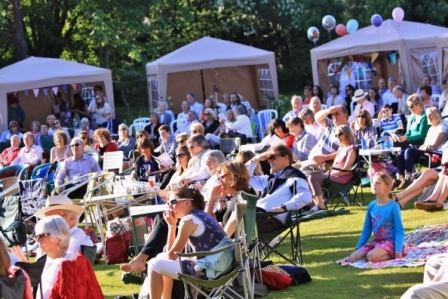 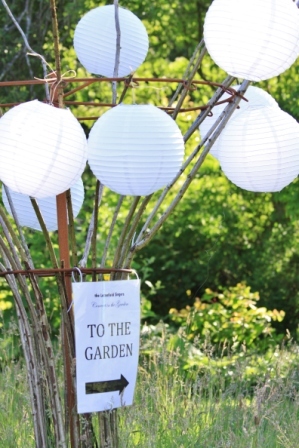 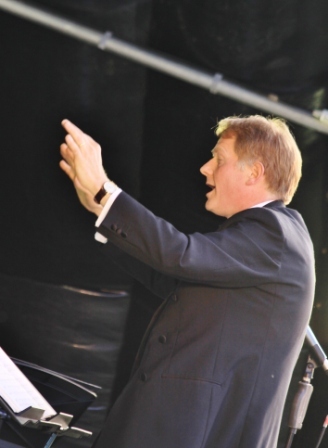 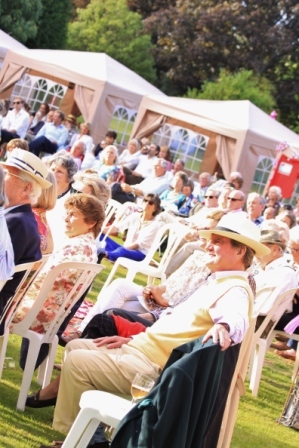 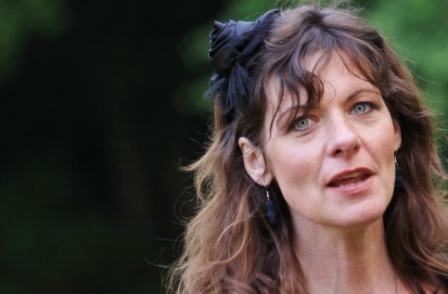 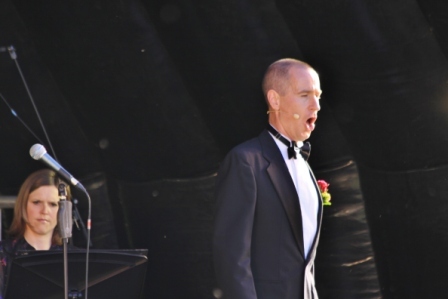 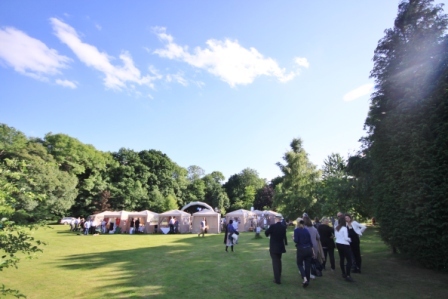 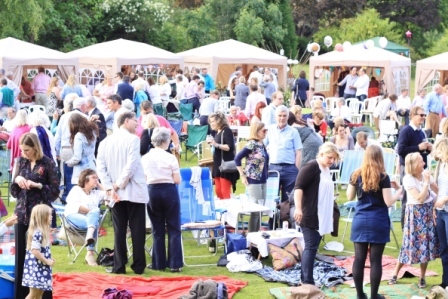 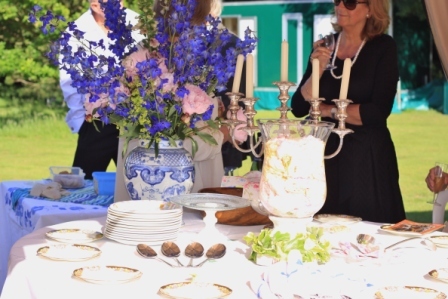 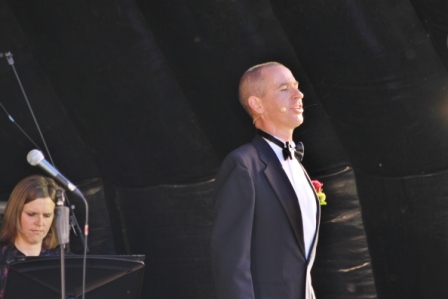 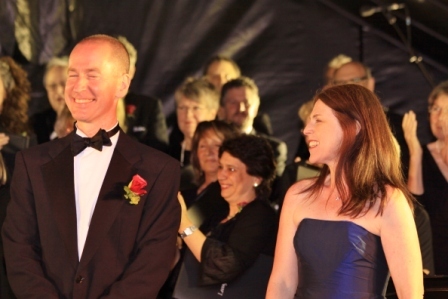 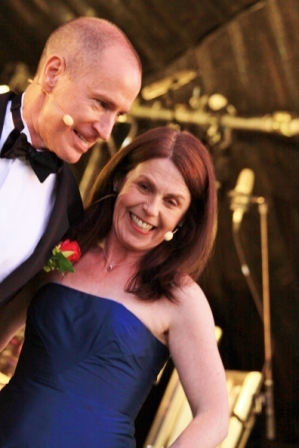 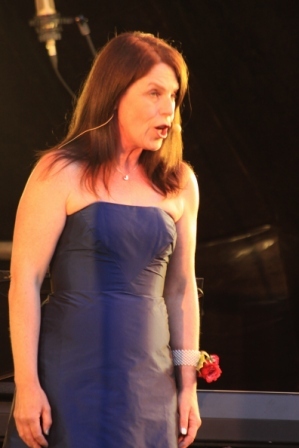 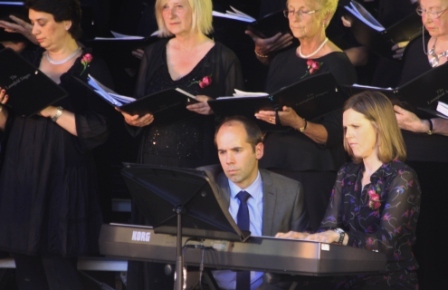 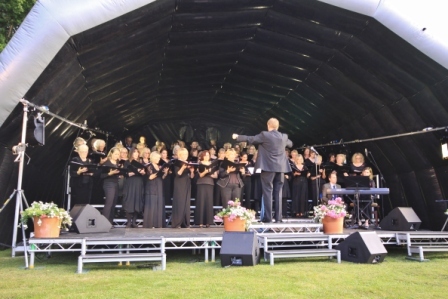 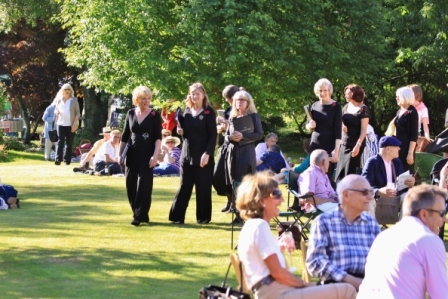 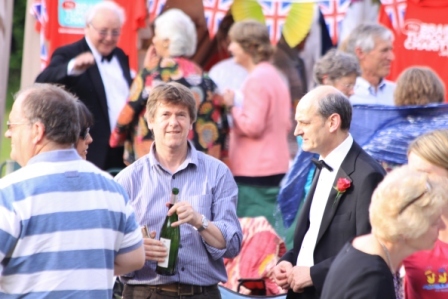 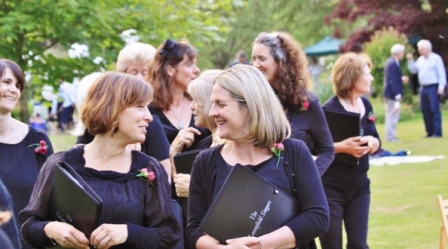 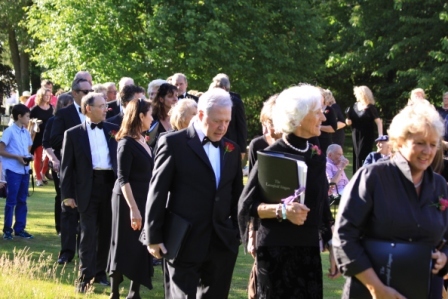 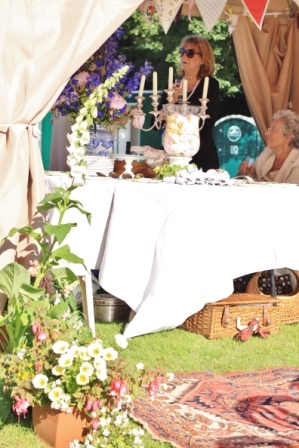 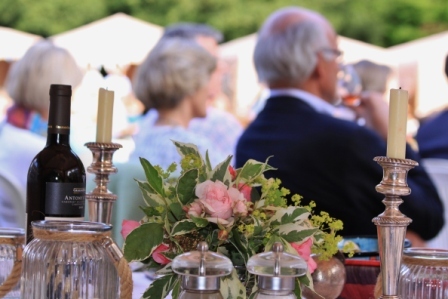 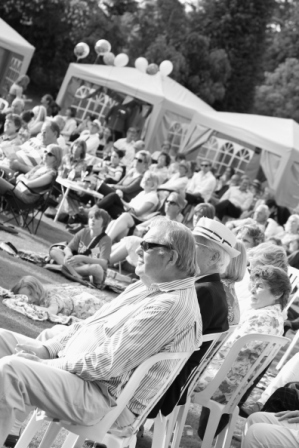 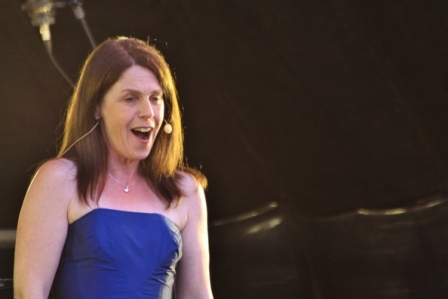 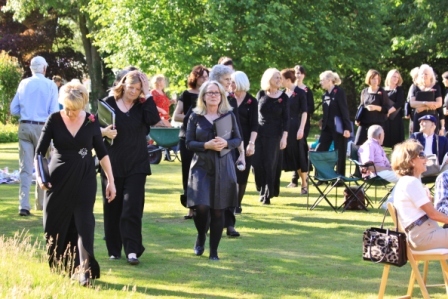 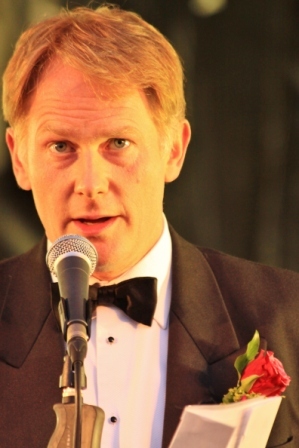 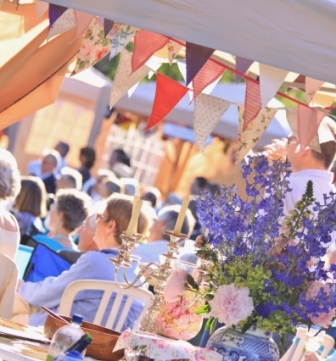 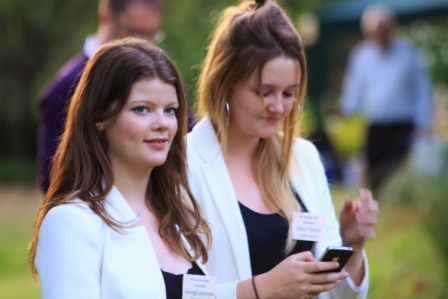 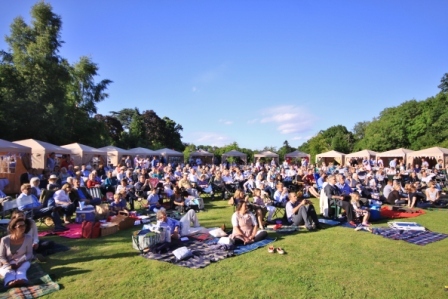 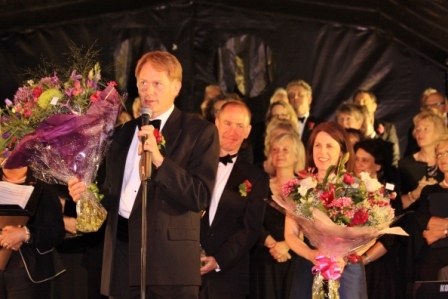 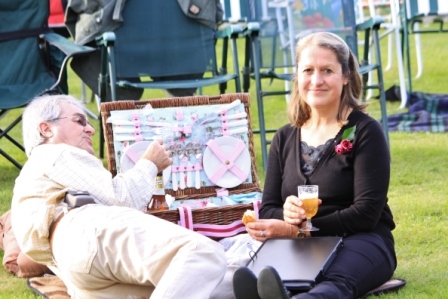 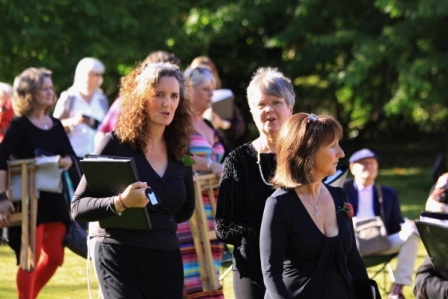 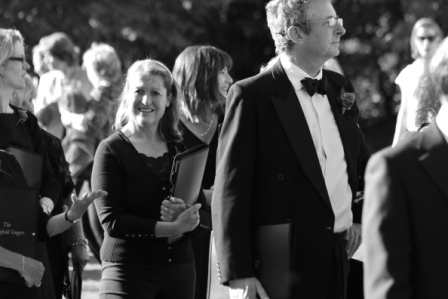 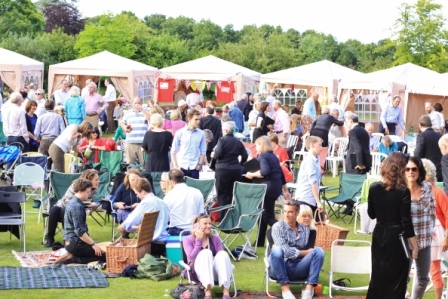 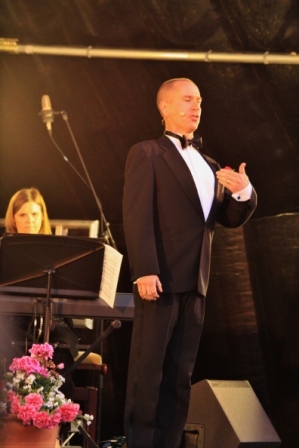 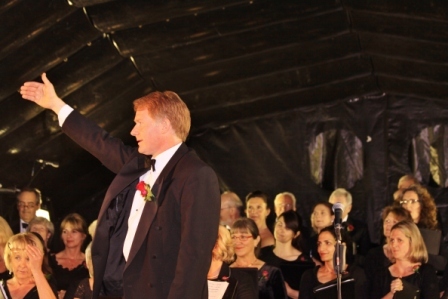 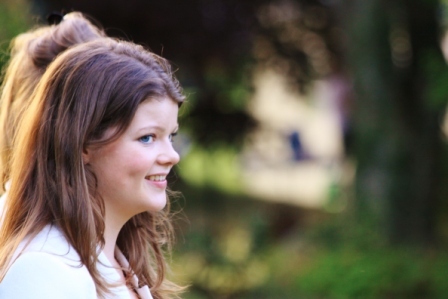 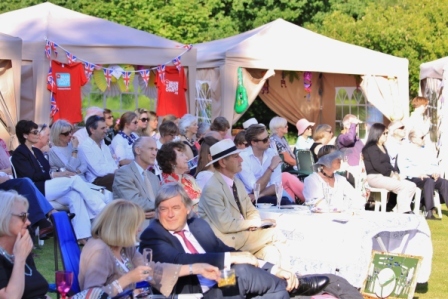 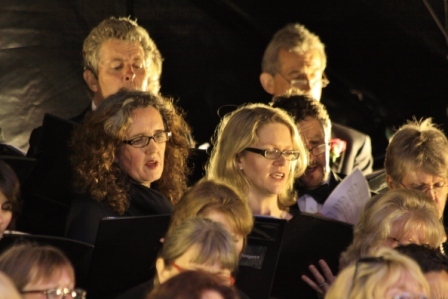 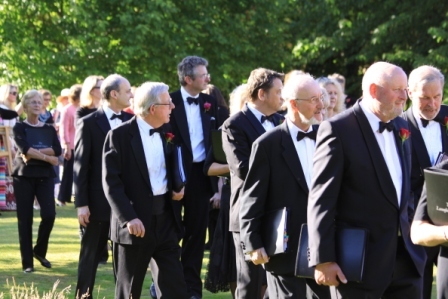 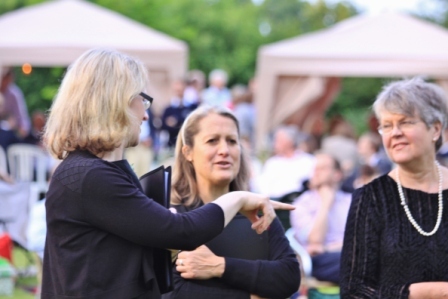 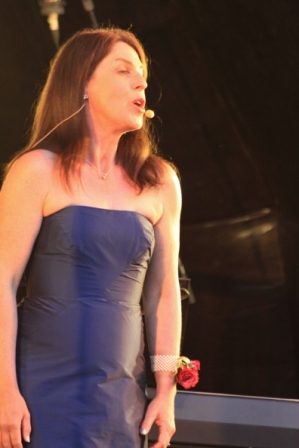 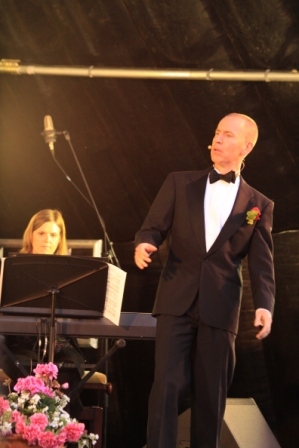 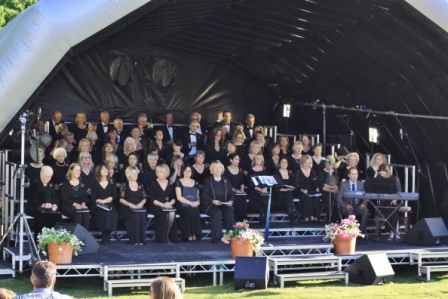 On a beautiful Summer’s evening in June 2013 we had an open air concert in the grounds of Hawkhurst House, near Wisborough Green, West Sussex.